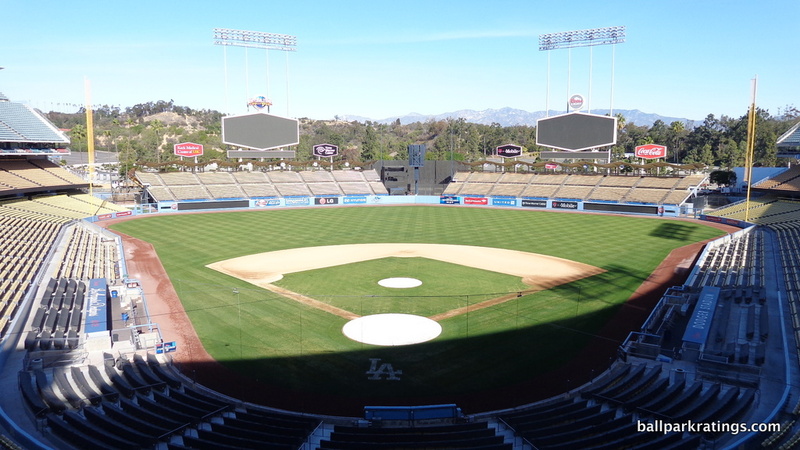 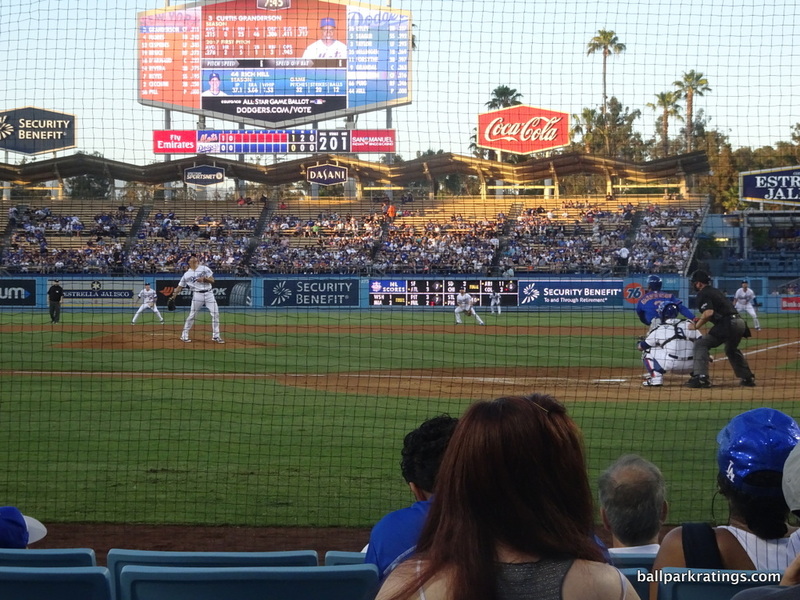 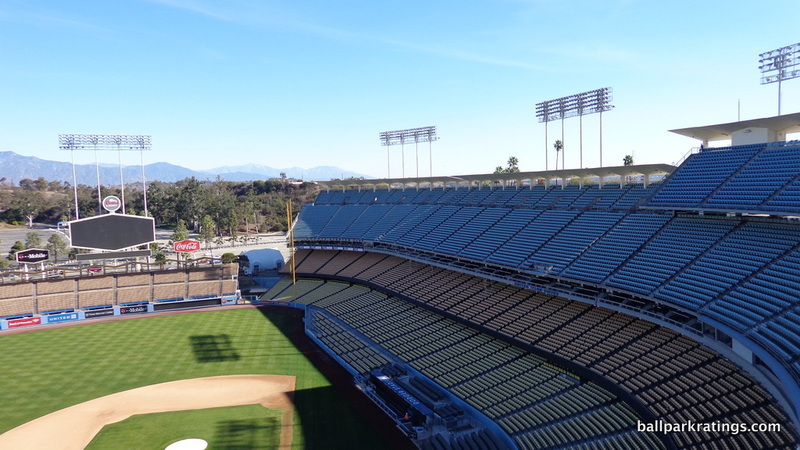 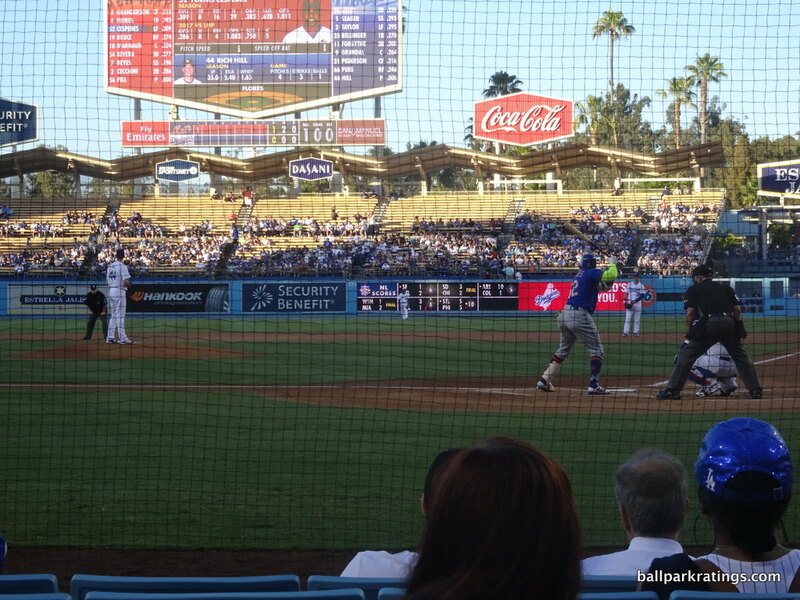 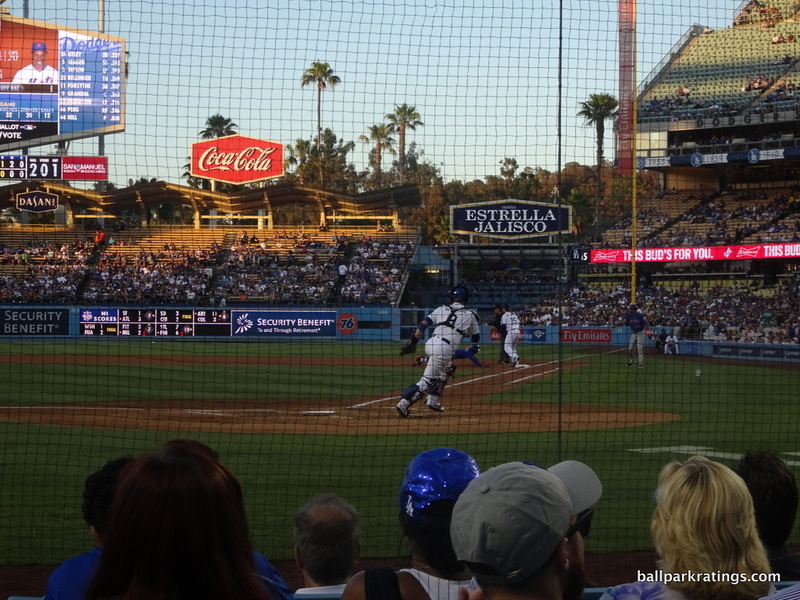 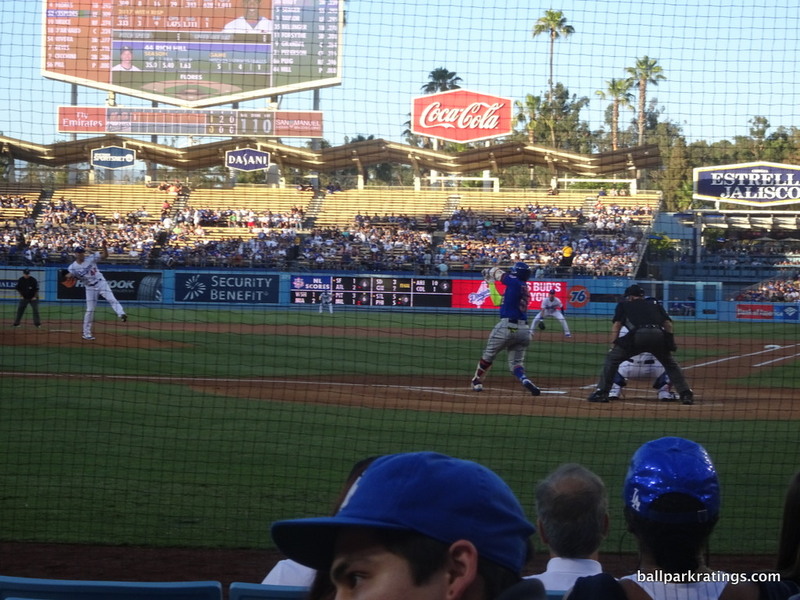 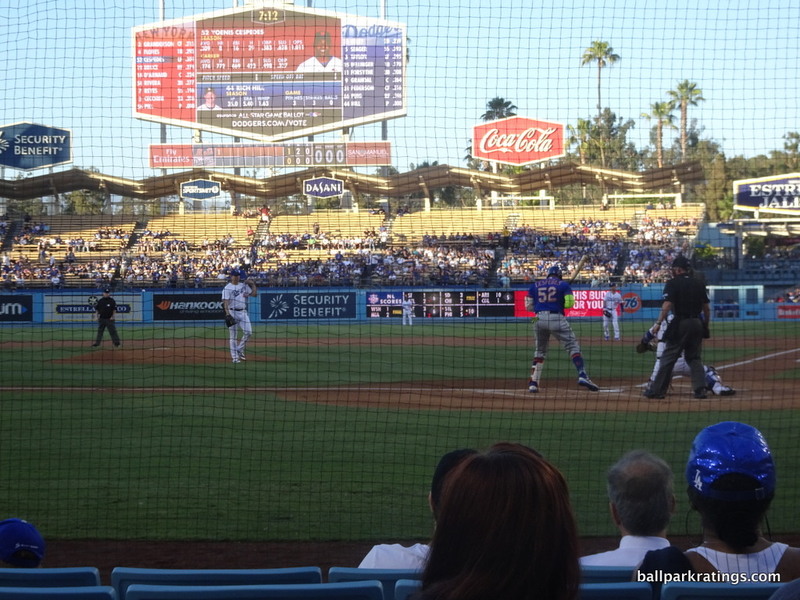 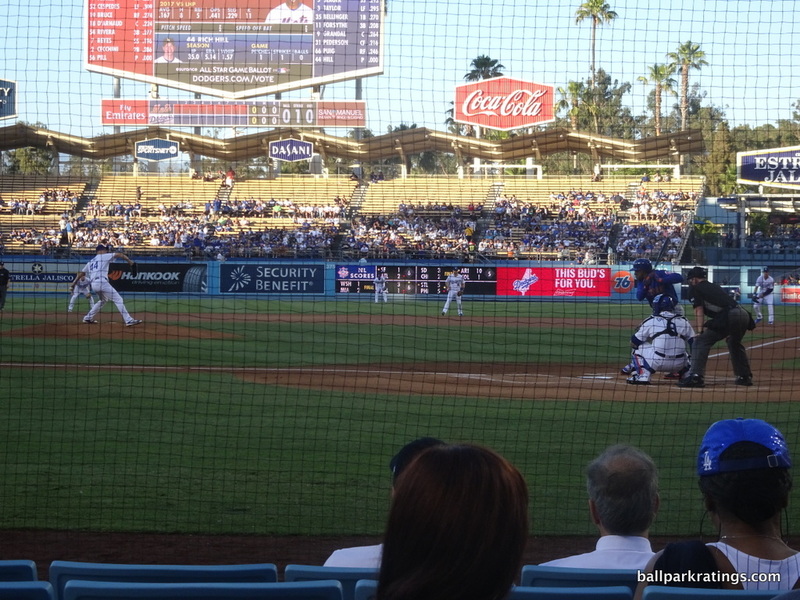 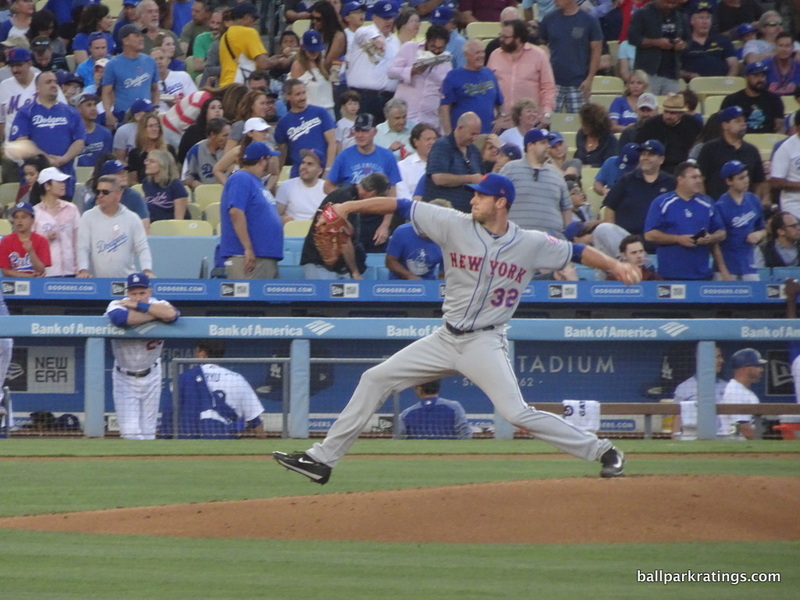 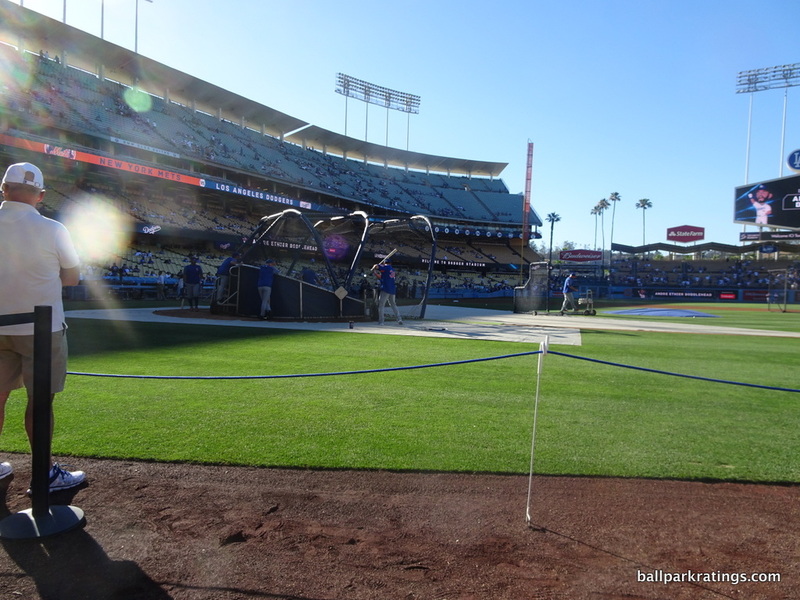 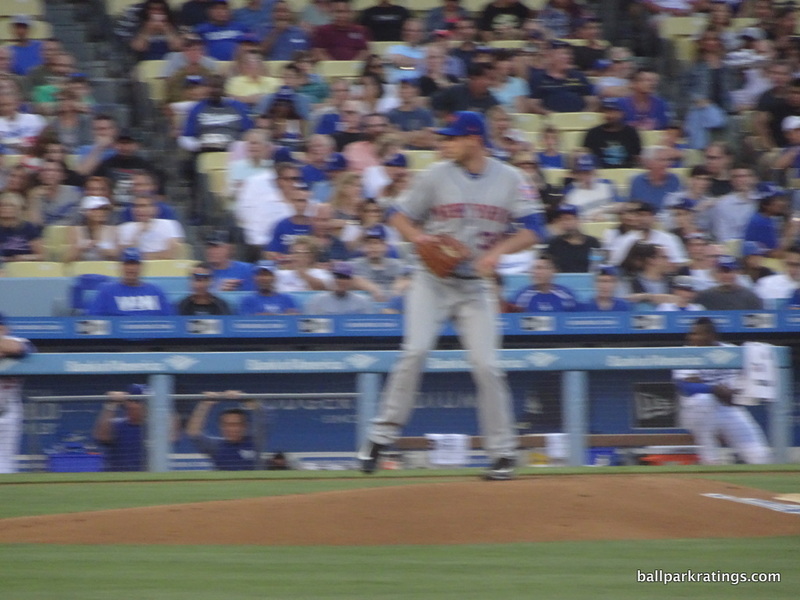 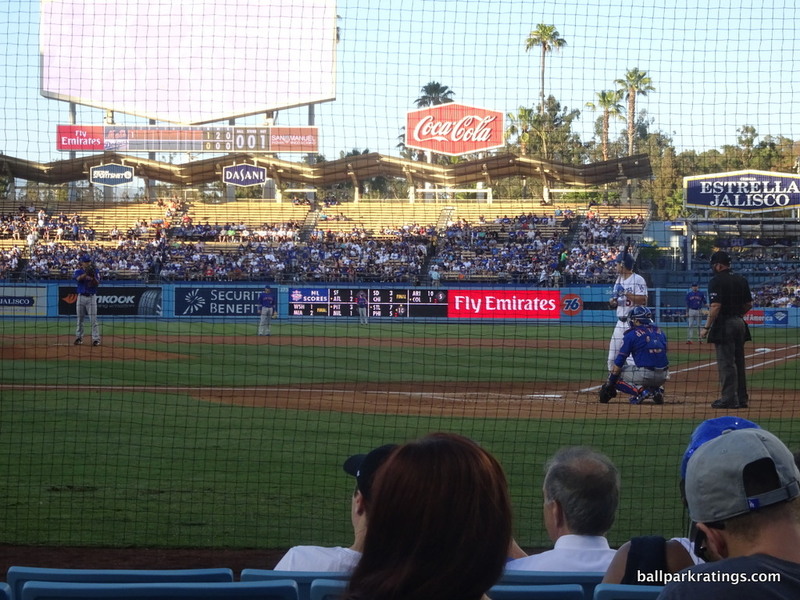 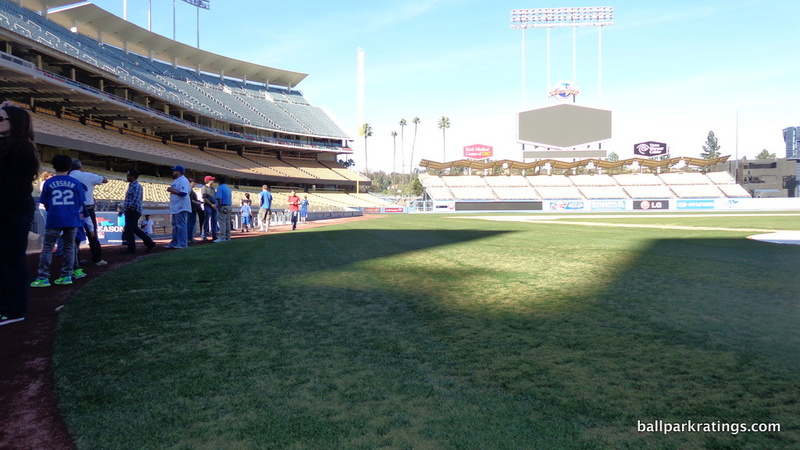 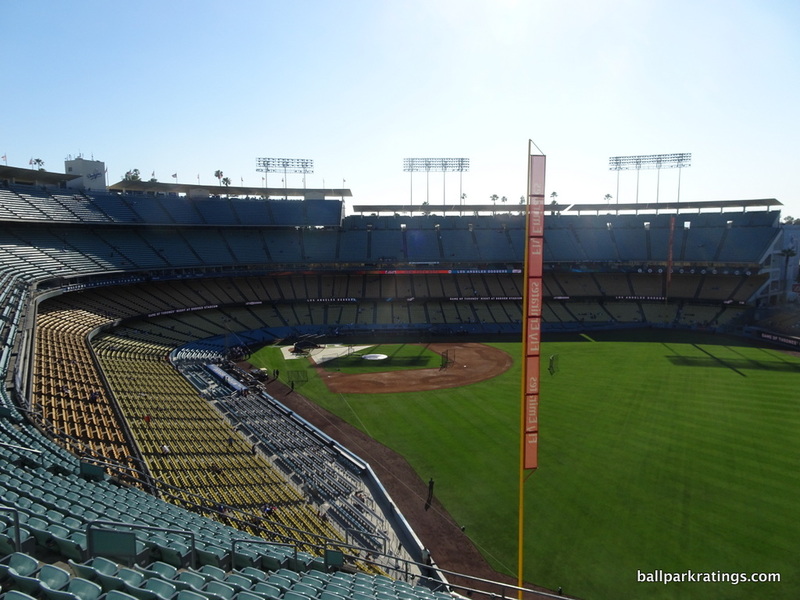 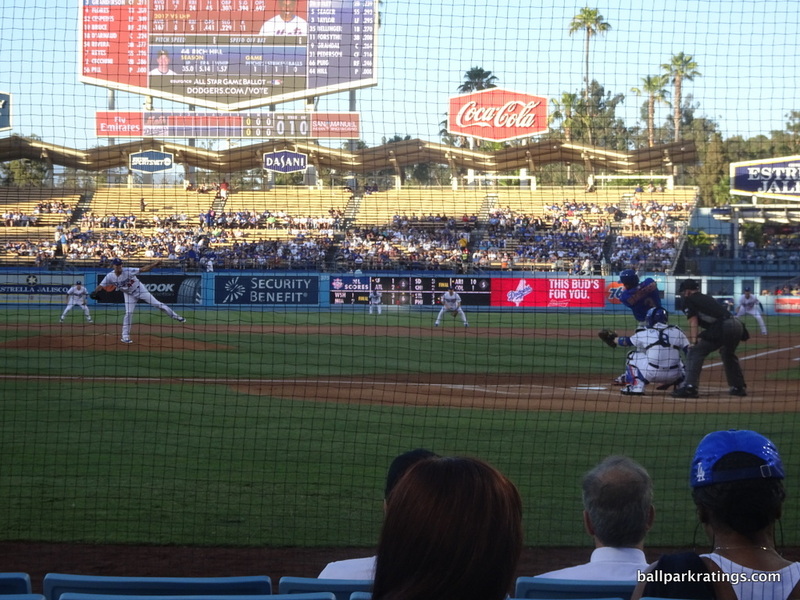 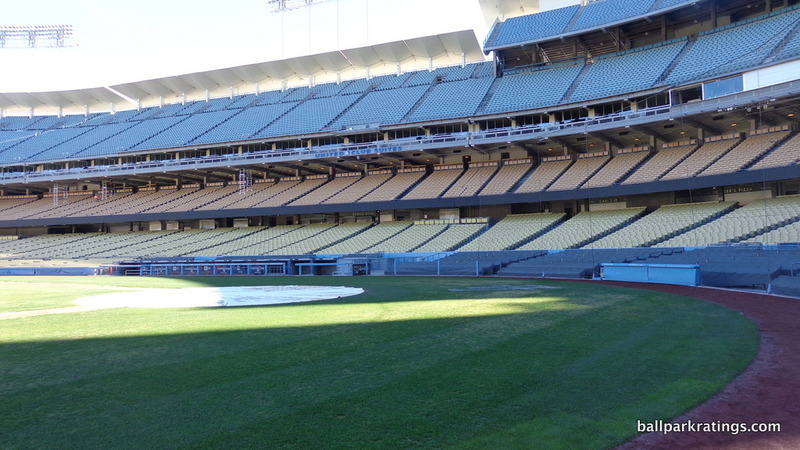 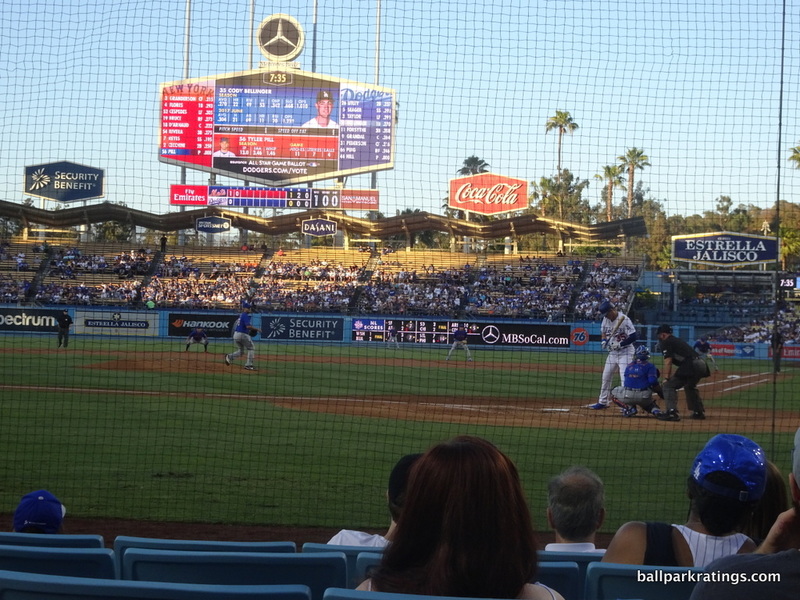 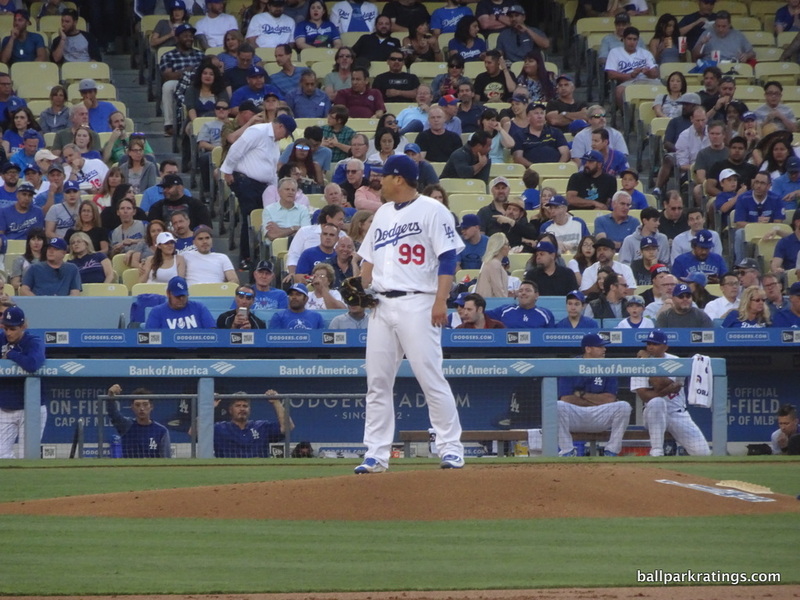 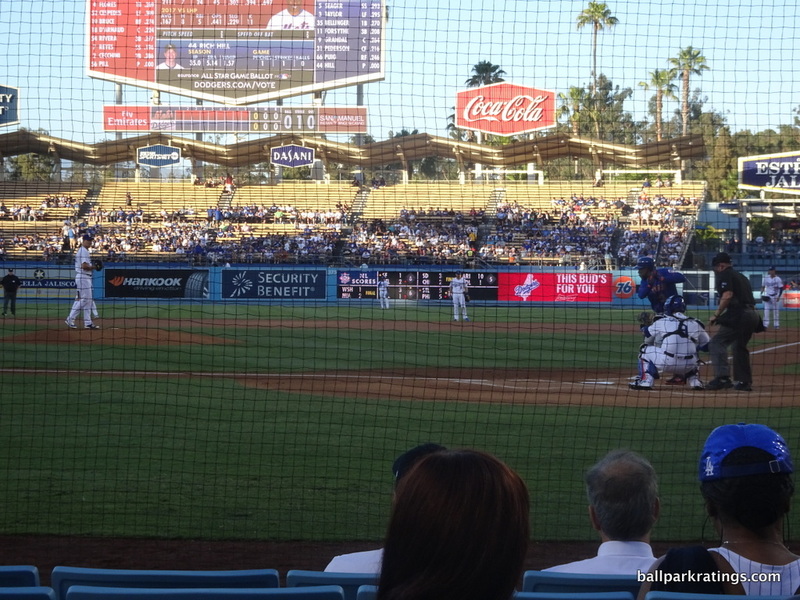 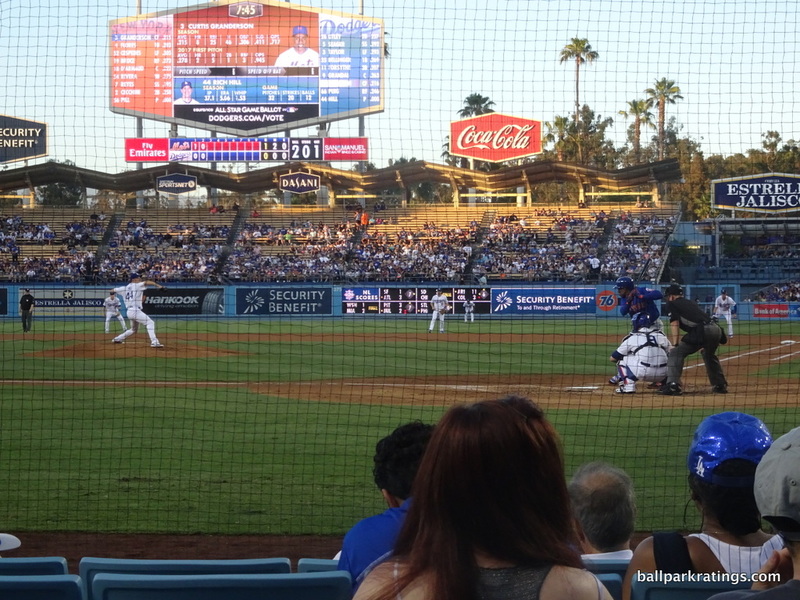 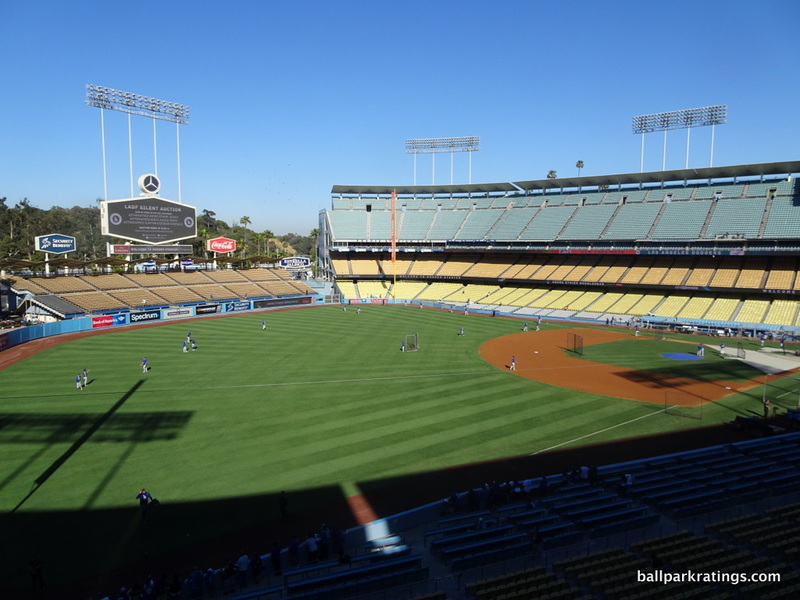 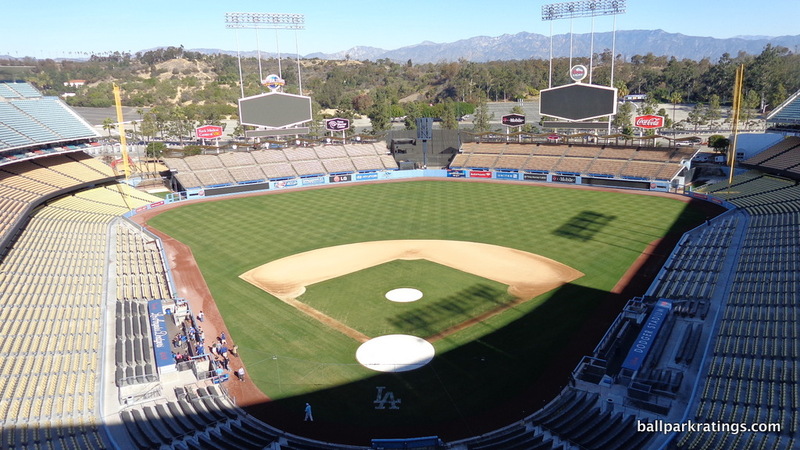 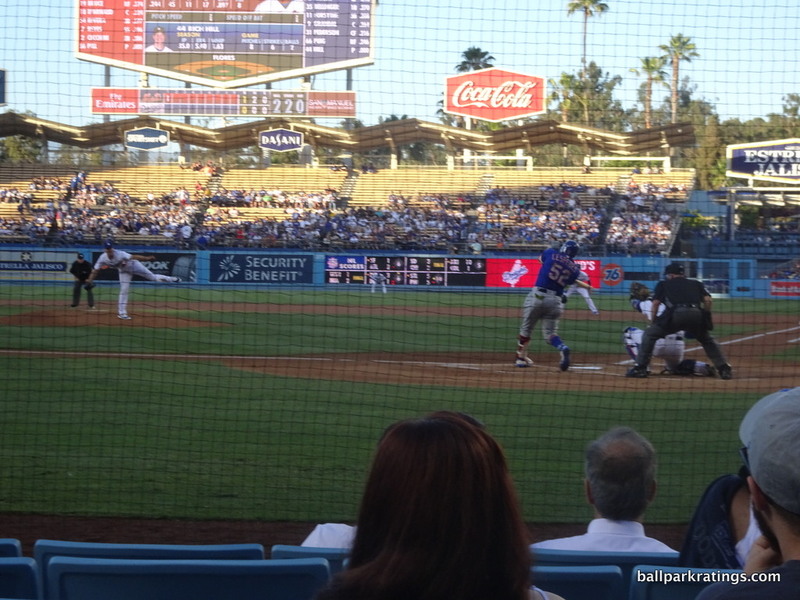 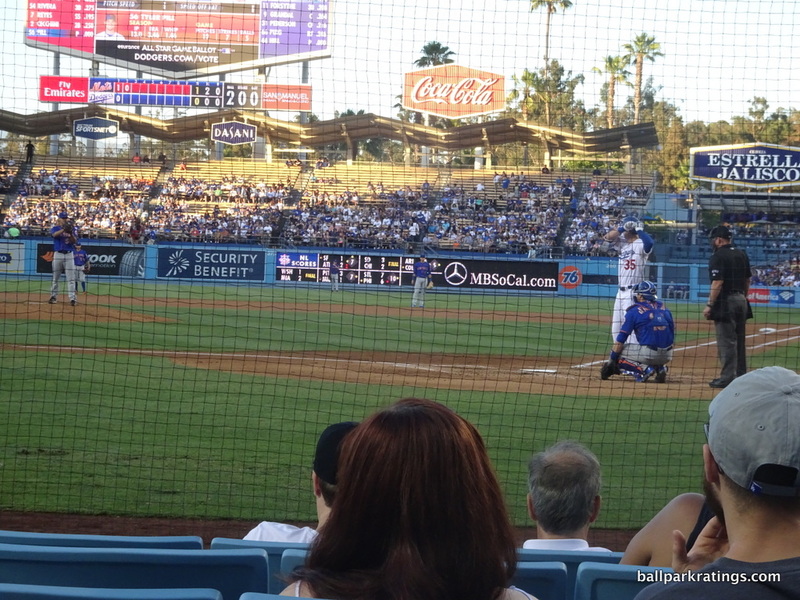 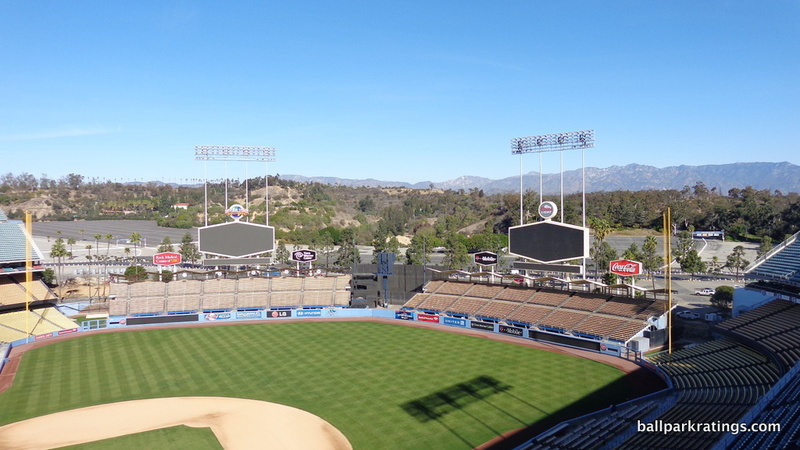 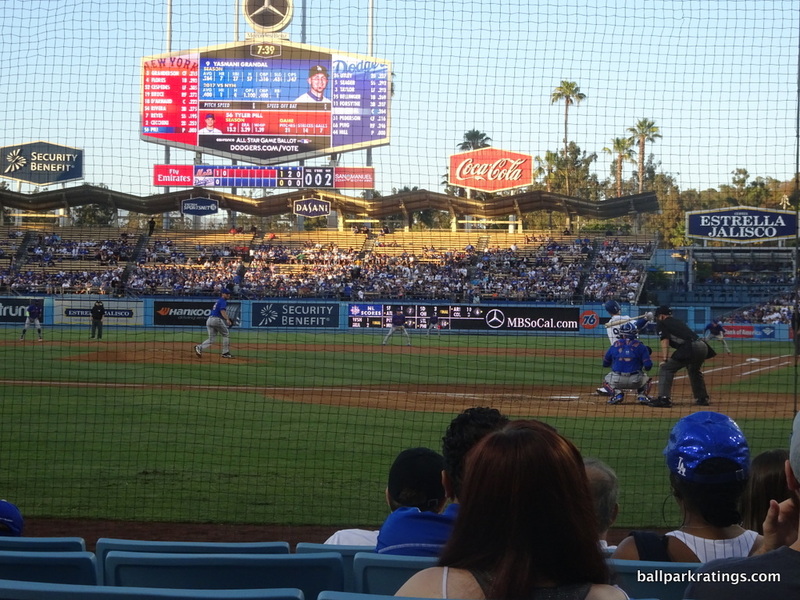 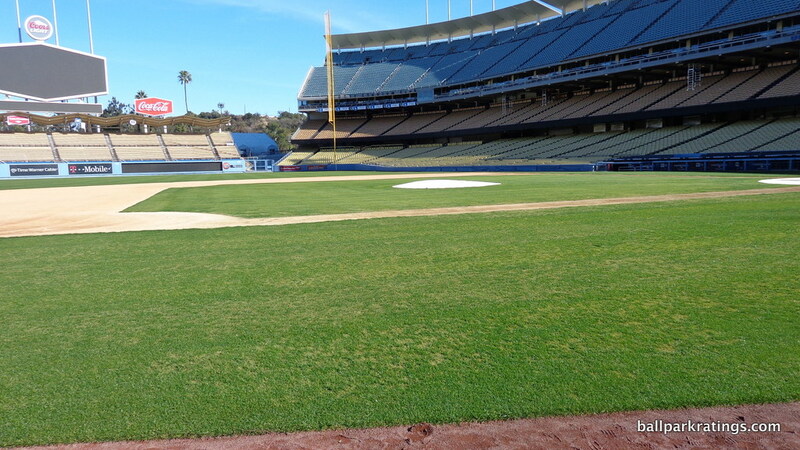 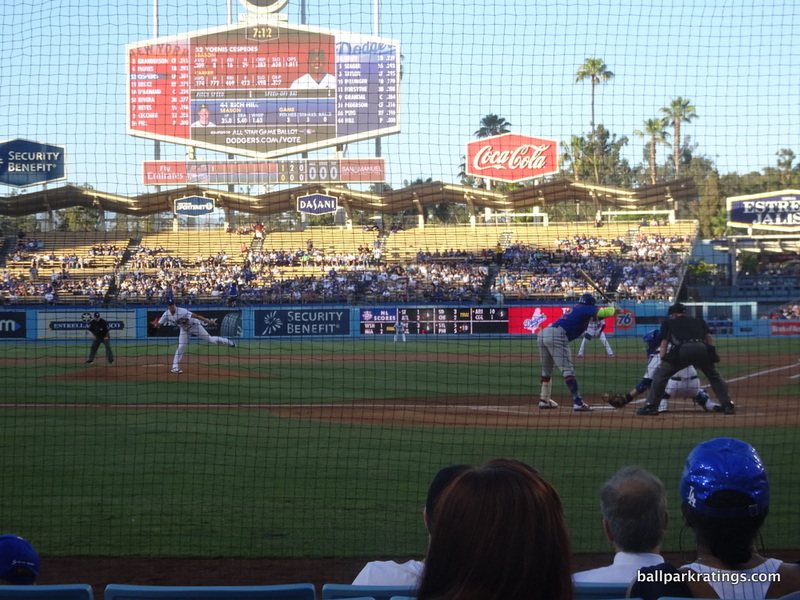 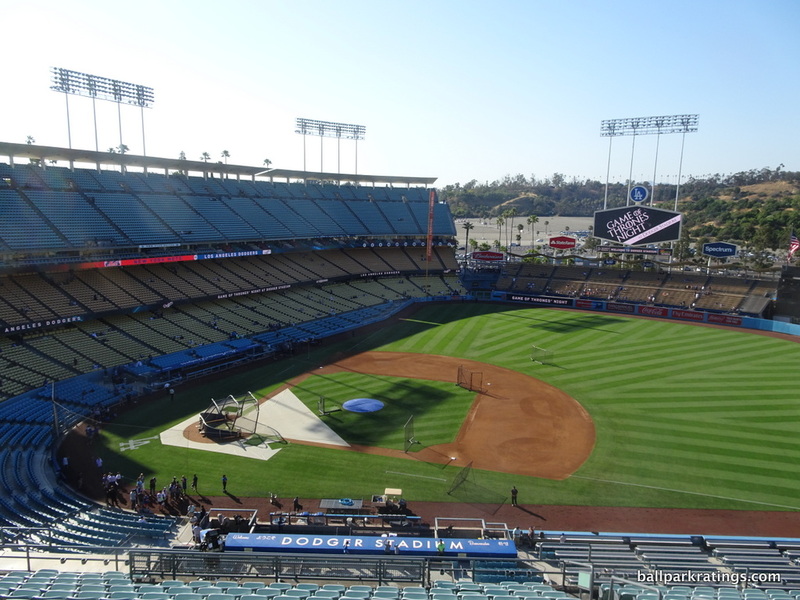 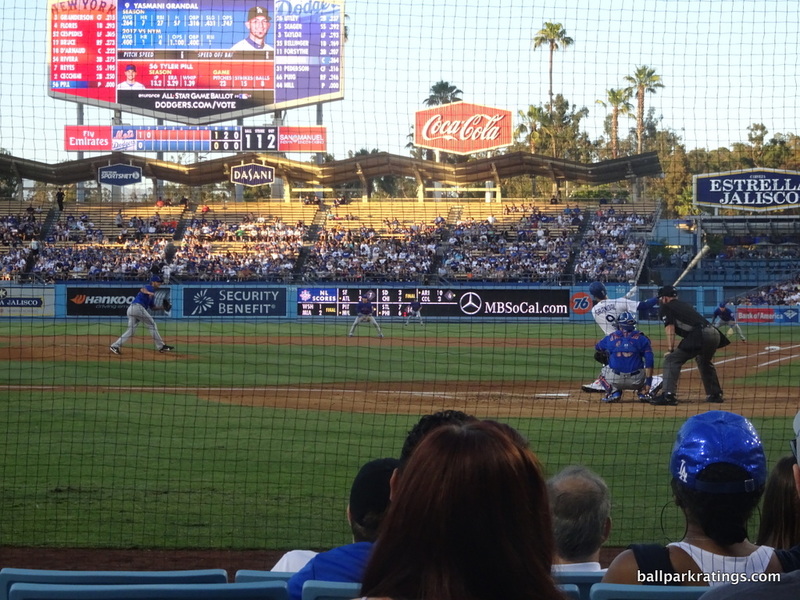 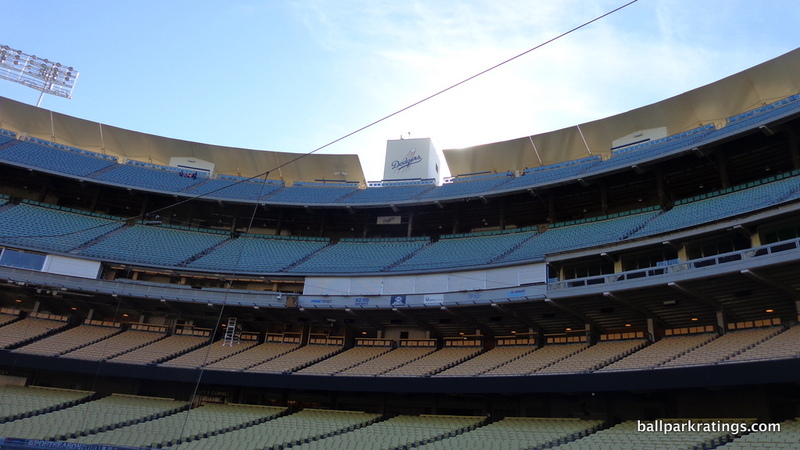 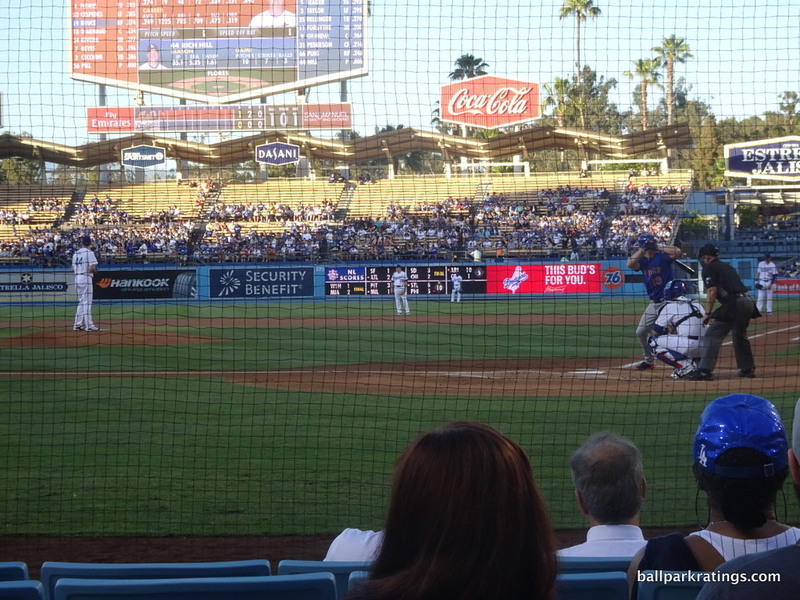 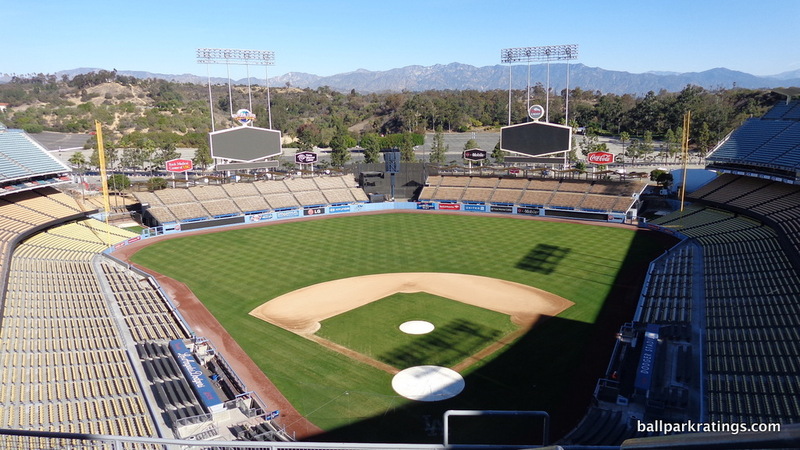 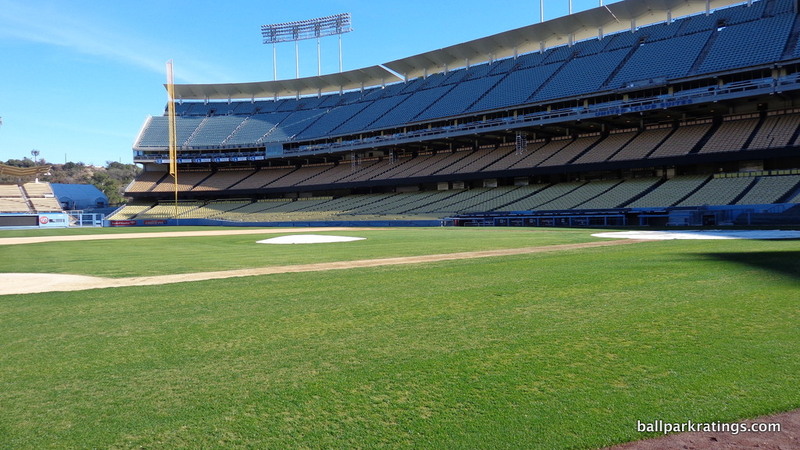 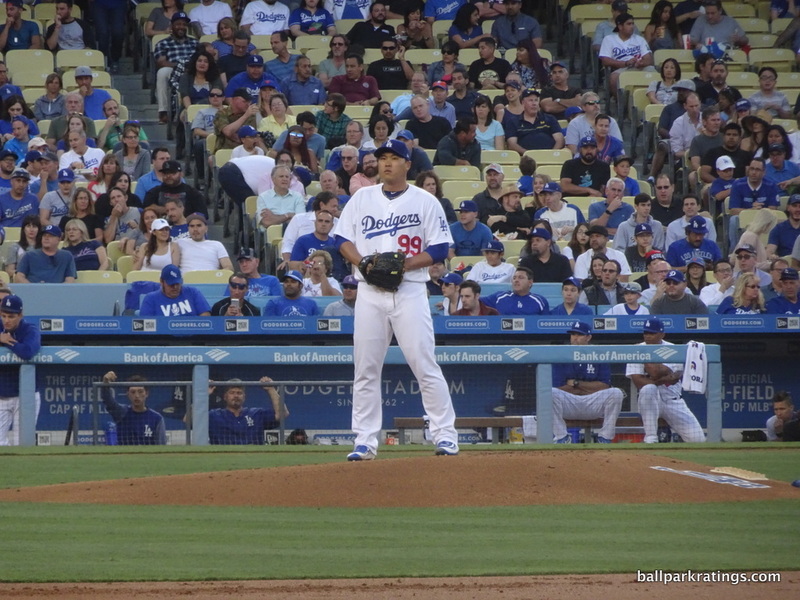 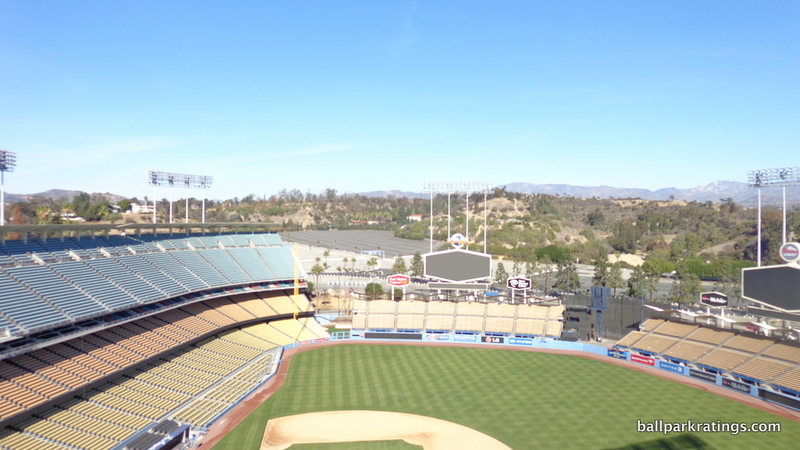 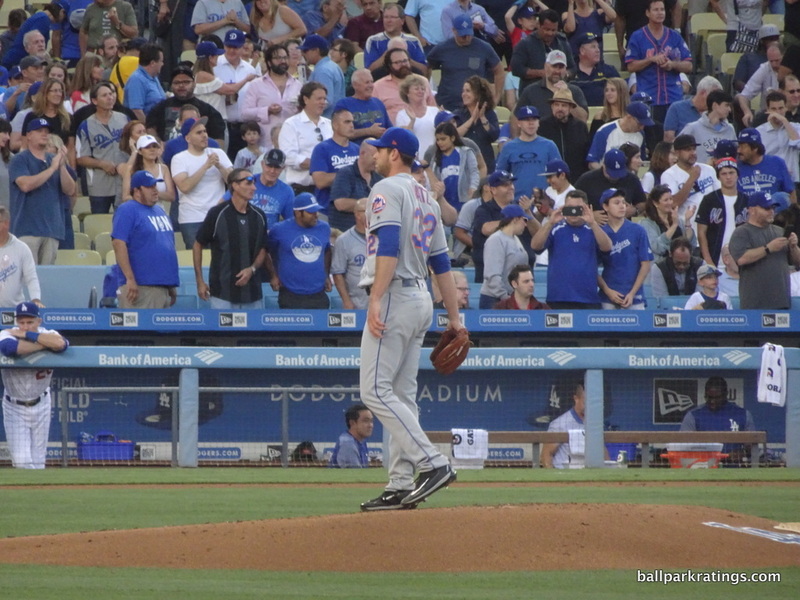 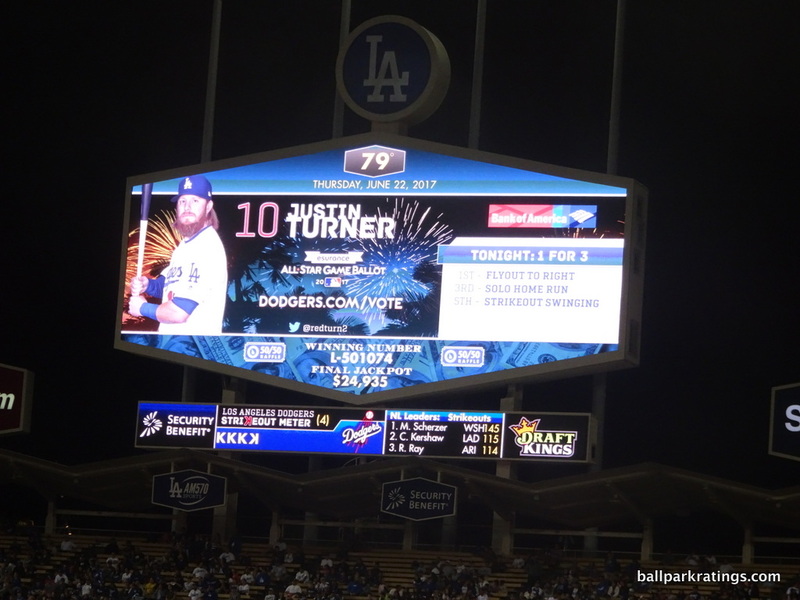 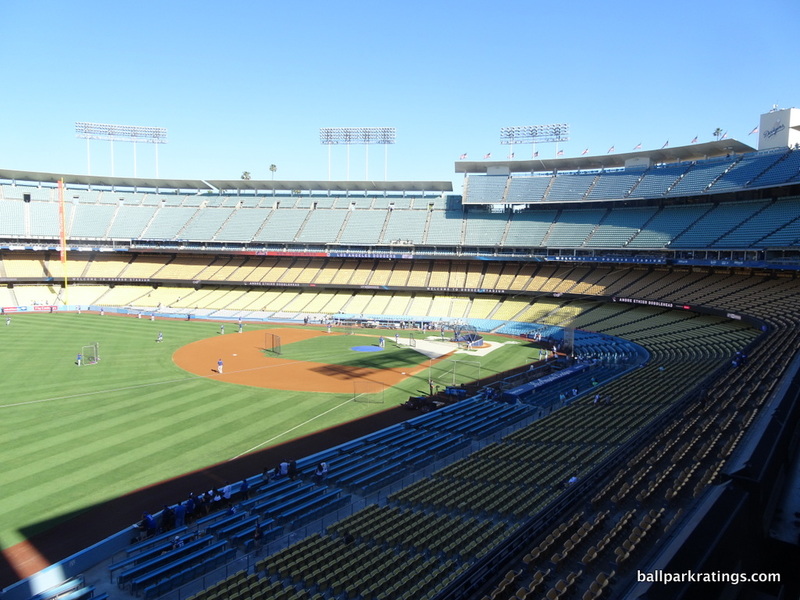 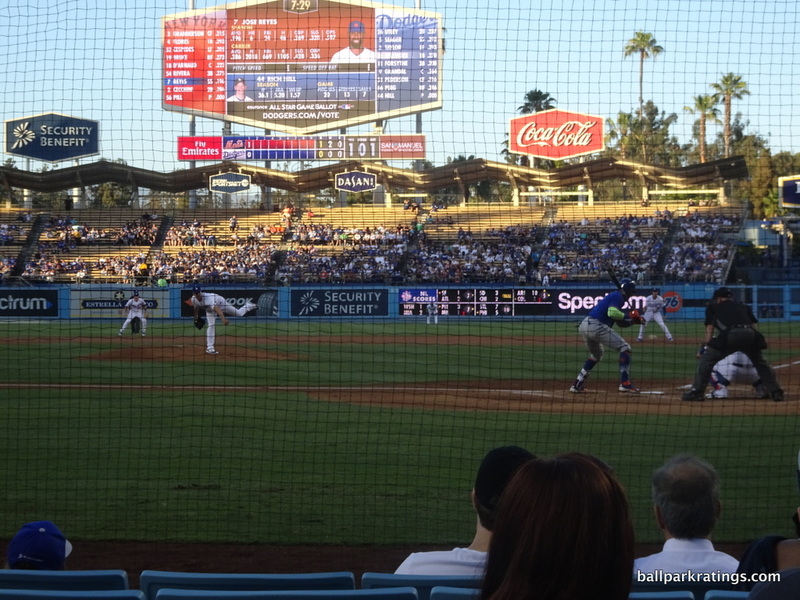 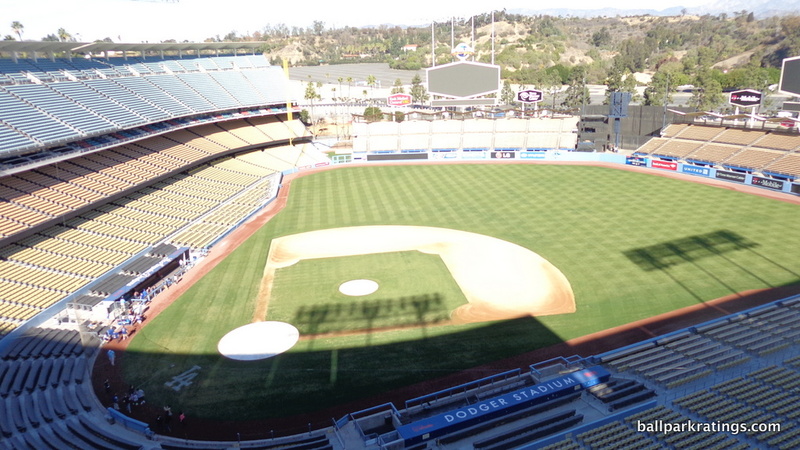 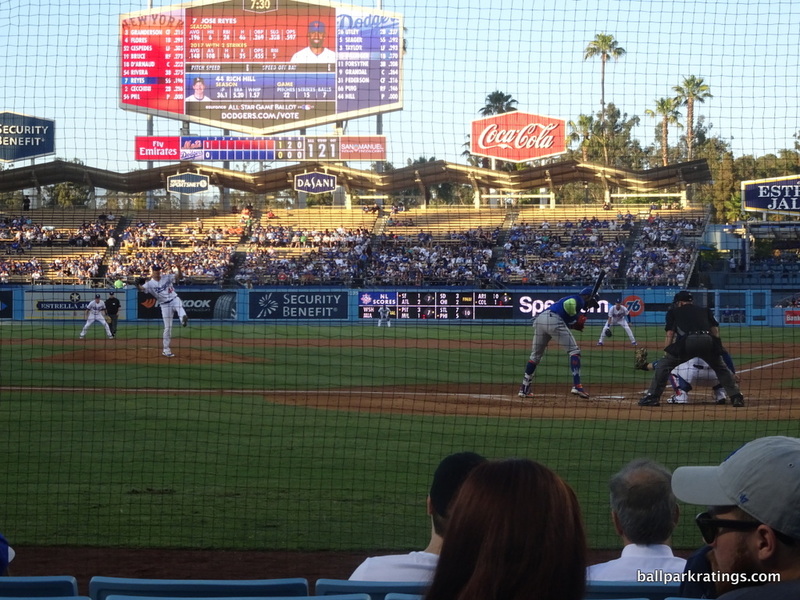 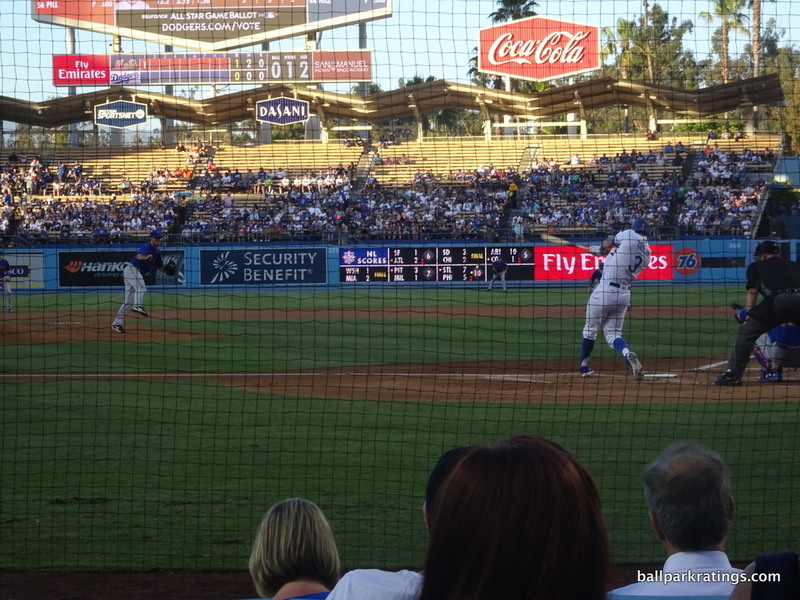 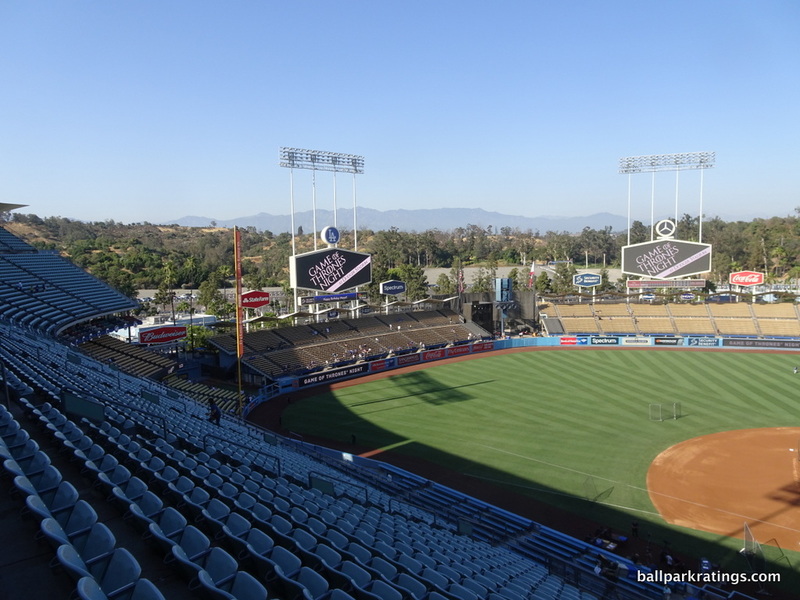 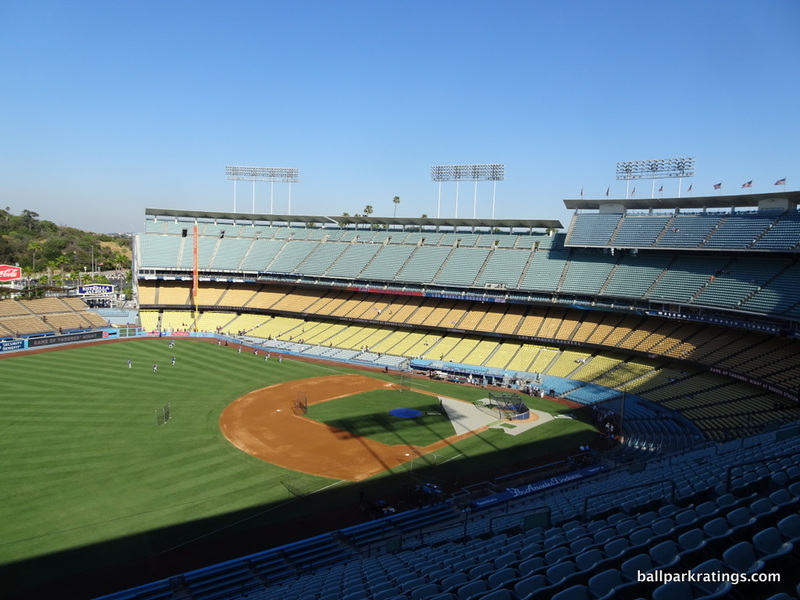 Disclaimer: For the purposes of ballpark “ratings,” Dodger Stadium is tricky to categorize. 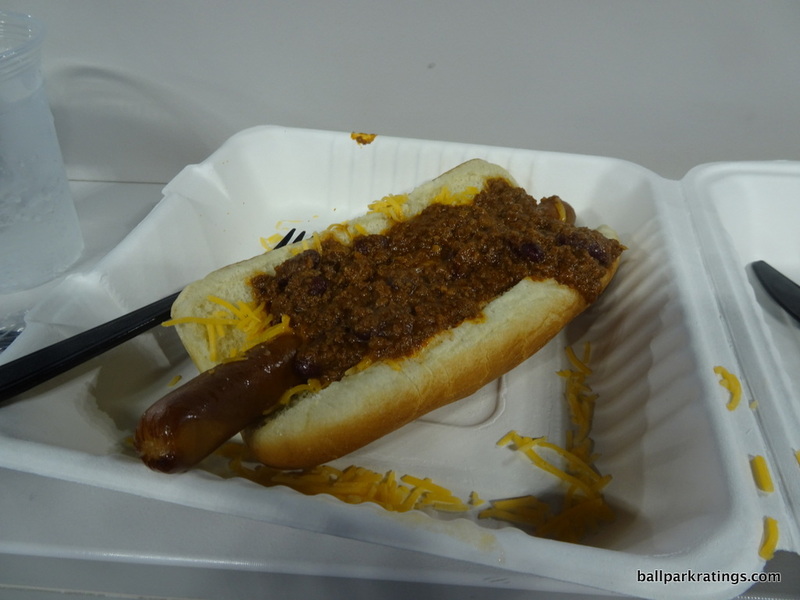 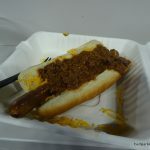 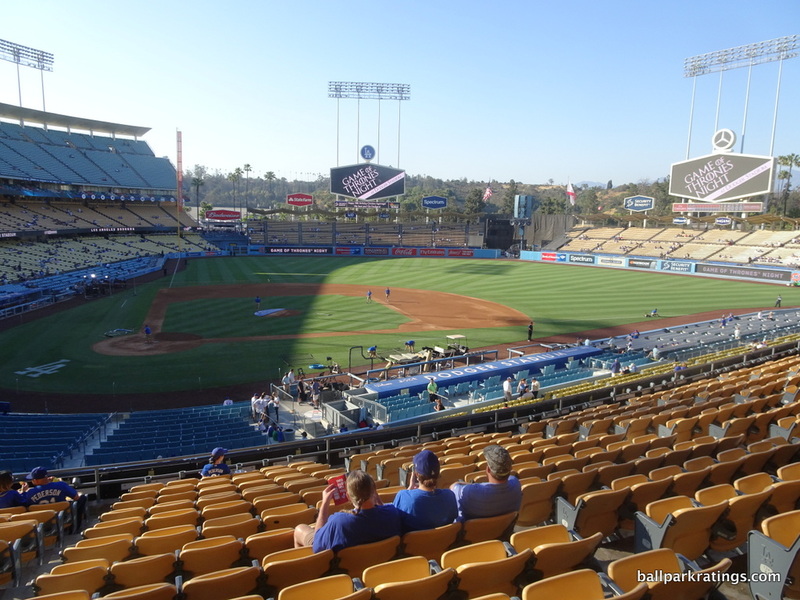 Like Wrigley Field and Fenway Park, I have decided not to rank or rate Dodger Stadium. 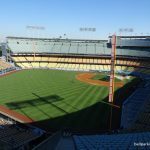 For me, it must be looked at in its historical context and shouldn’t be compared to the other 27 ballparks, and thus won’t be analyzed using the standard criteria. 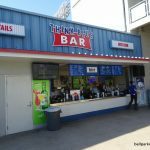 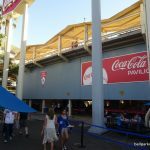 Rating a park that opened in 1962 based on 21st century standards using a scorecard doesn’t really tell us anything about the quality of the ballpark. 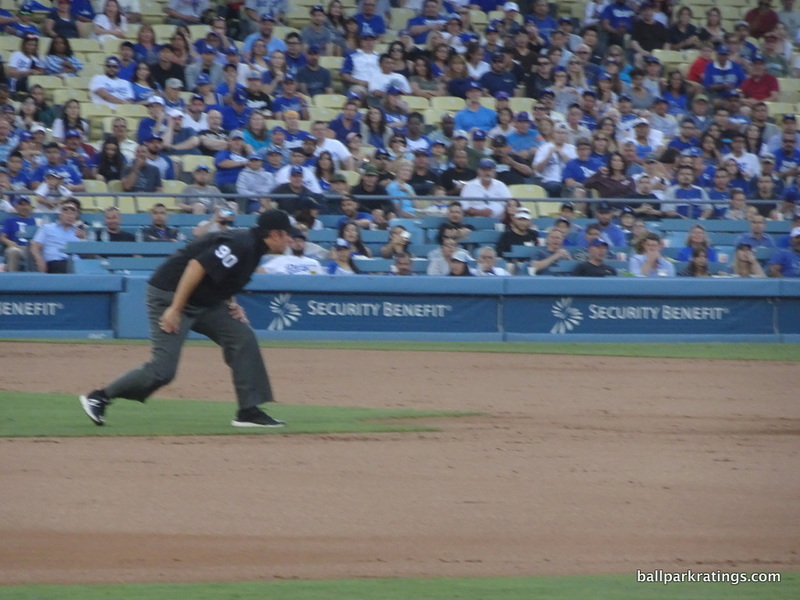 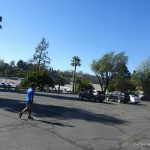 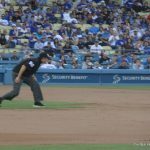 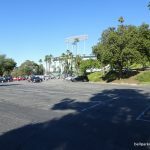 If that seems like a copout, I’ll just say Dodger Stadium would rate somewhere in the middle of the pack, but that is certainly not a good indication of where Dodger Stadium stands among our nation’s ballparks. 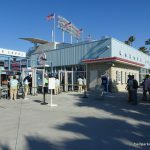 At the same time, Wrigley and Fenway aren’t good direct comparisons, and contemporaries like Angel Stadium and Kauffman Stadium are rated/ranked using the standard criteria and methodology. 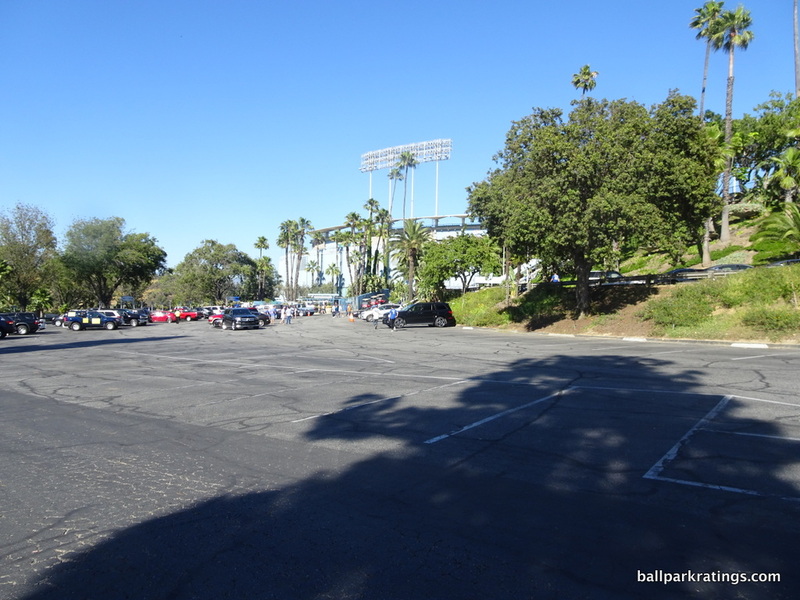 That is because those latter two parks underwent more comprehensive, one-time renovation projects (in 1998 and 2009, respectively) that completely reinvented those parks more in the vein of any other post-1991 ballpark than anything resembling Dodger Stadium today. 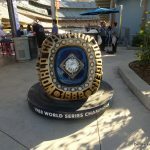 Below is a quick summary, written in 2018. 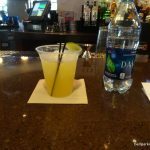 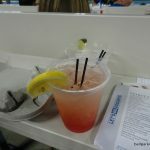 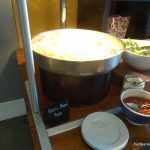 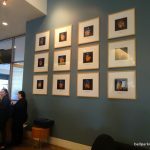 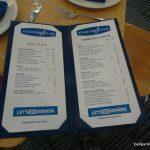 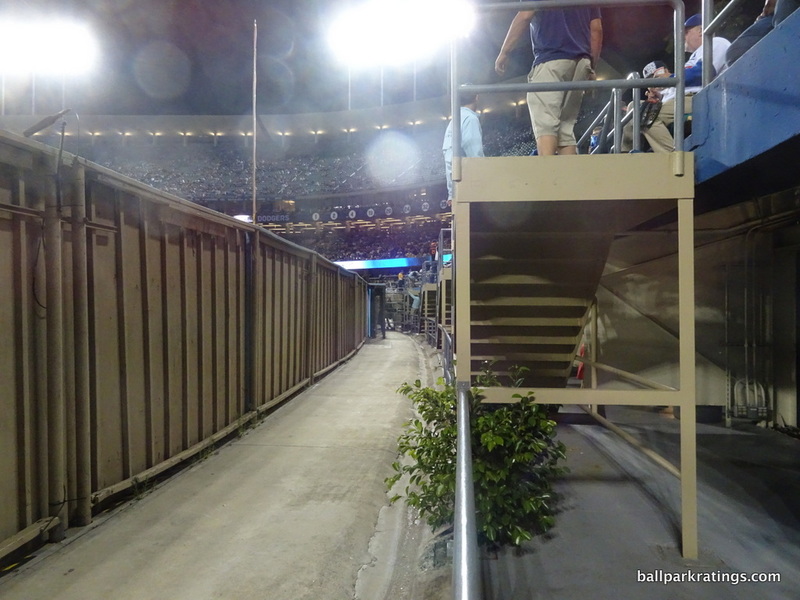 Any future analysis will be in the form of a photo essay, which I will write whenever I get around to it. 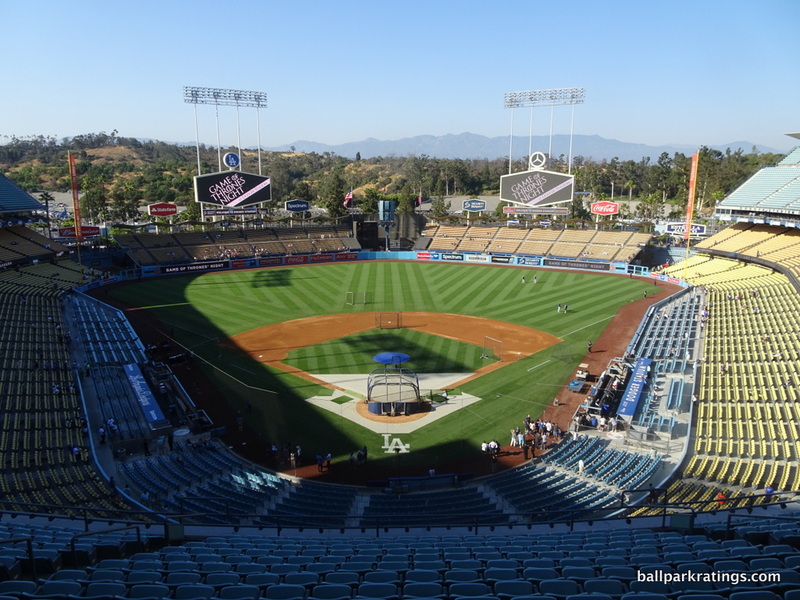 As I outlined above, Dodger Stadium is a tricky ballpark to categorize, as it’s only slightly more inappropriate to compare it to any post-1990 ballpark (new or renovated) than it is to compare it to Wrigley Field or Fenway Park. 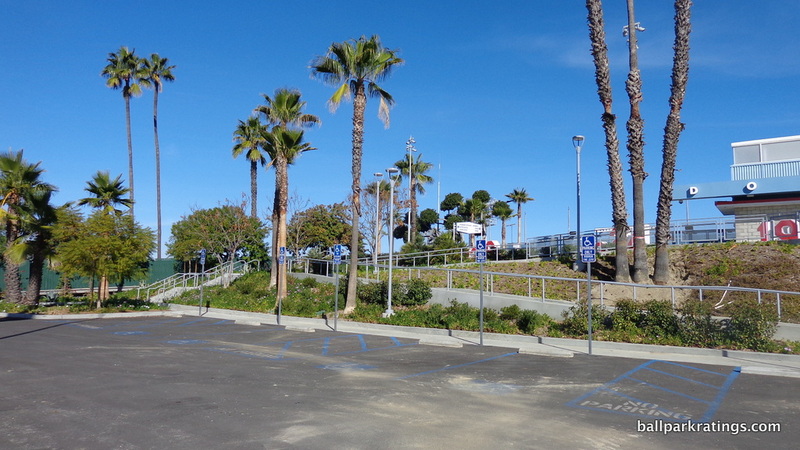 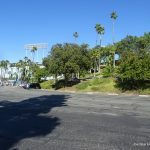 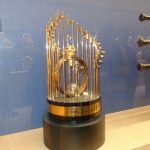 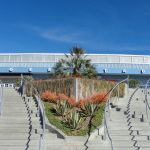 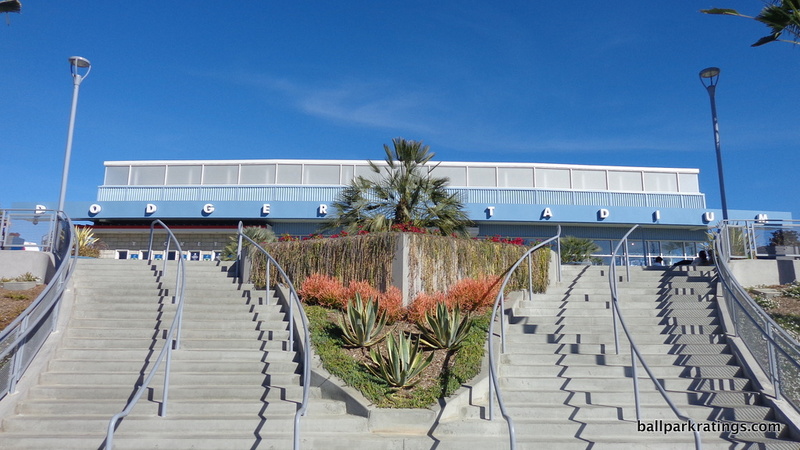 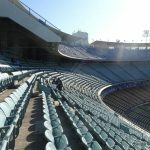 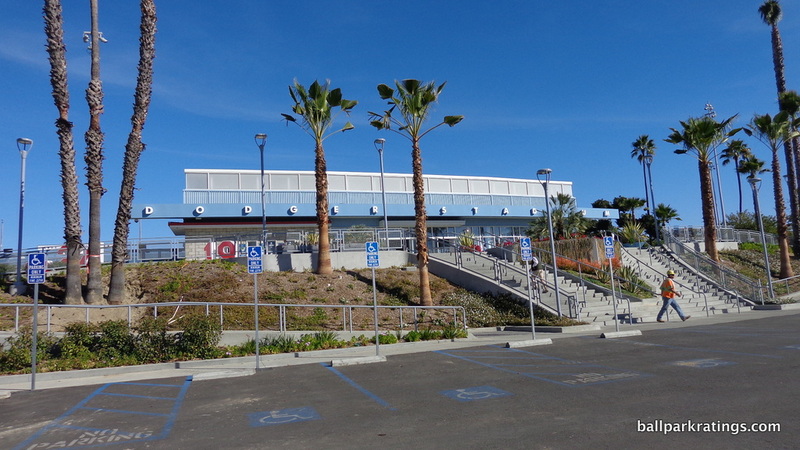 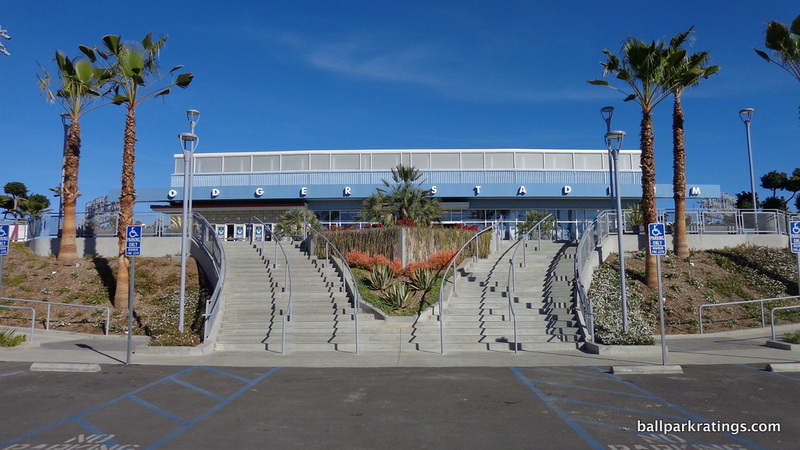 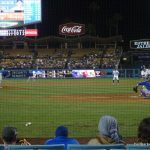 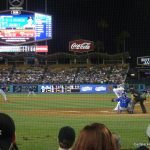 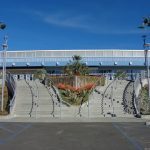 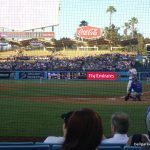 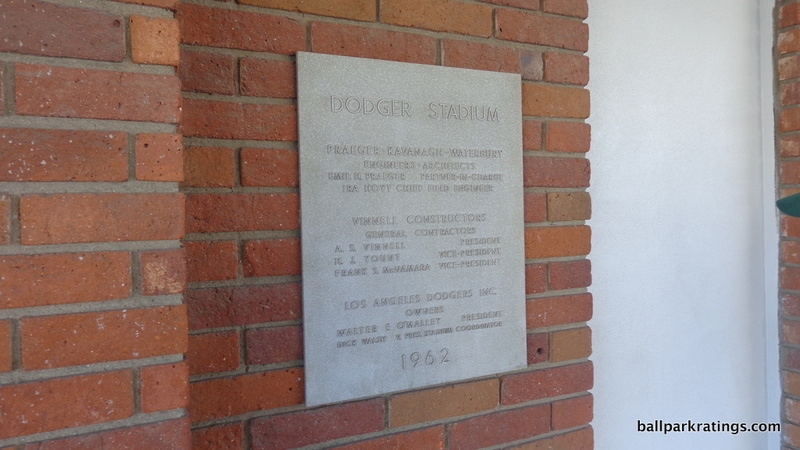 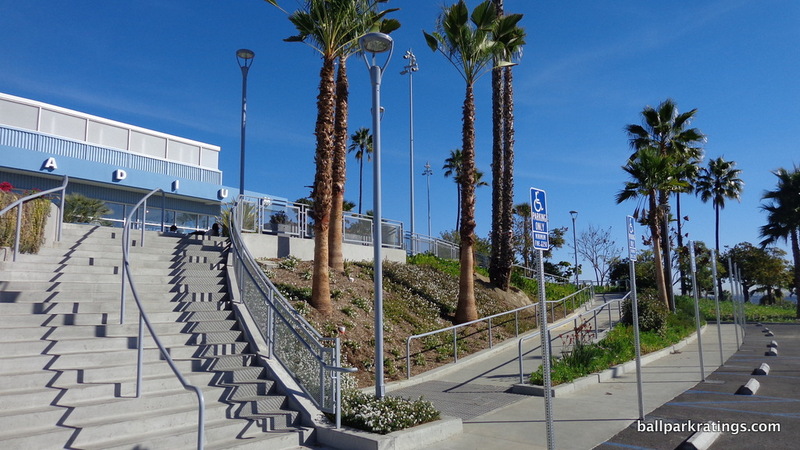 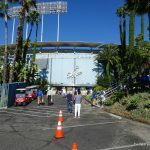 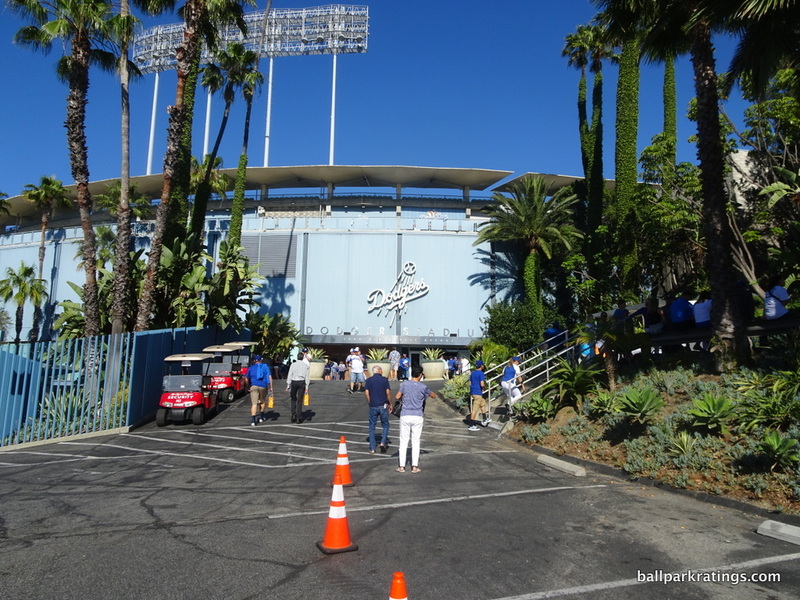 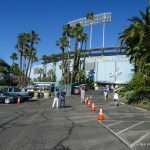 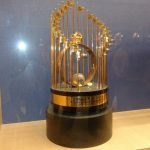 However, judging by the park’s aesthetics and its place in American baseball history, Dodger Stadium stands alone as the Wrigley/Fenway of the 1960s “modernist” style, as parks like Kauffman Stadium and Angel Stadium have been complicated by renovations that compromised aesthetic integrity for amenities and kitsch. 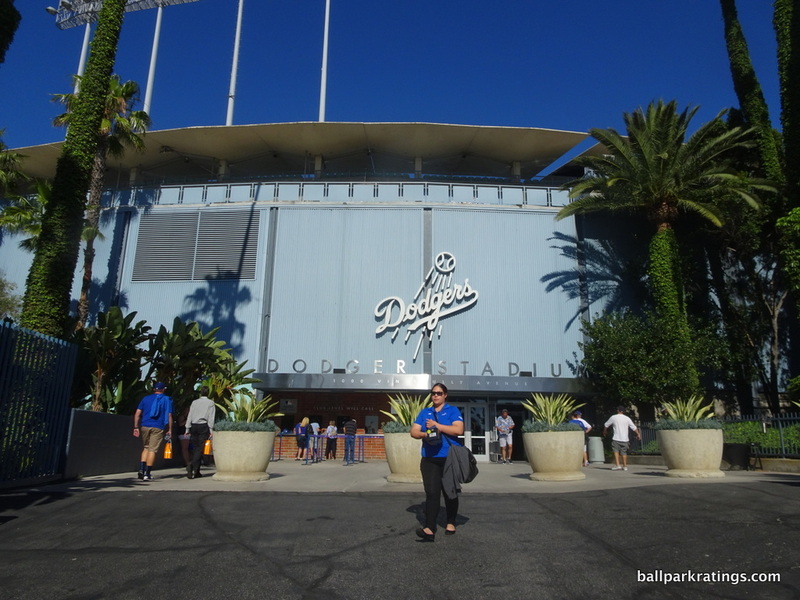 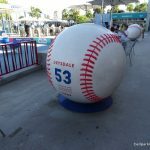 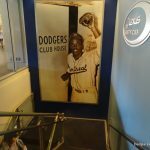 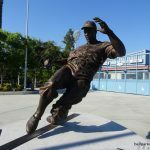 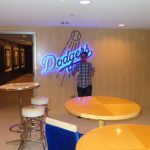 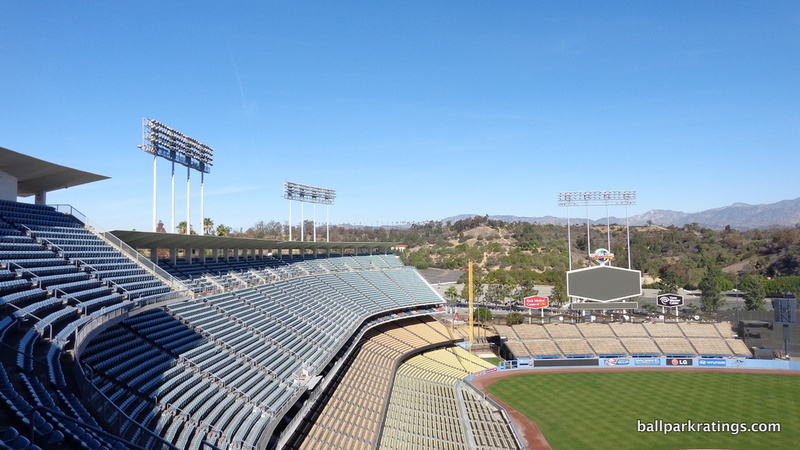 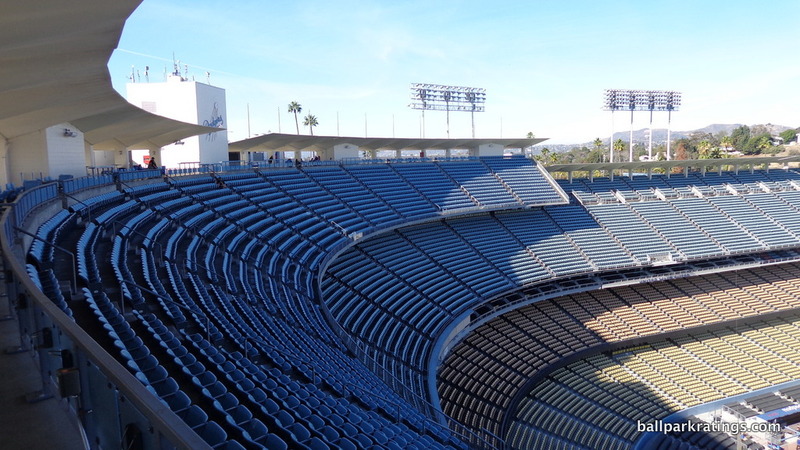 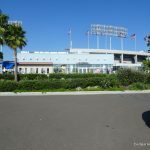 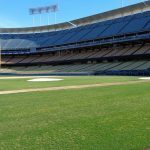 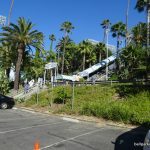 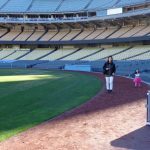 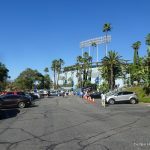 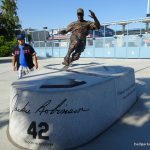 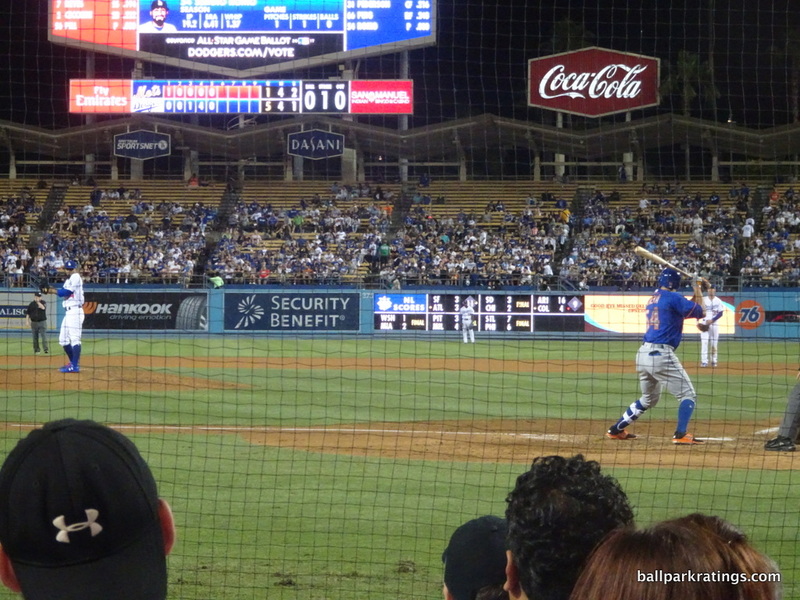 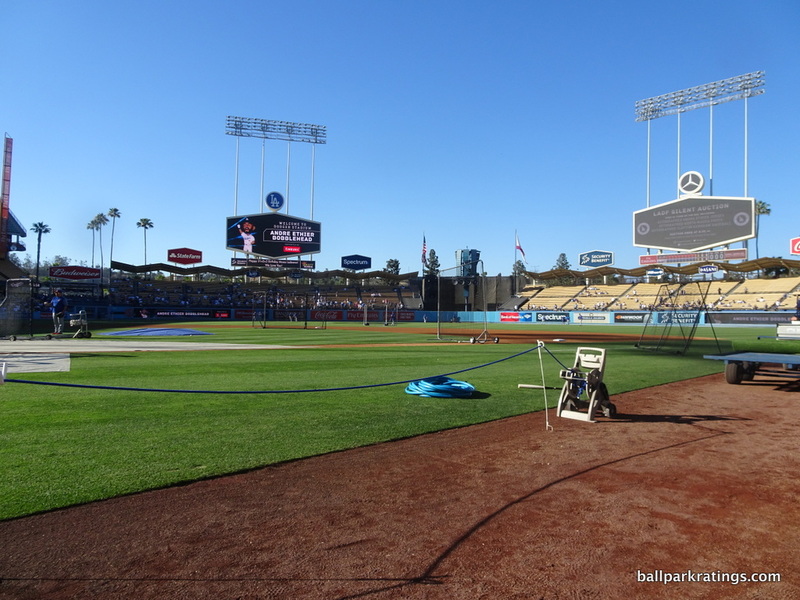 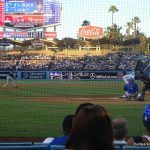 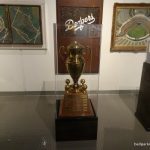 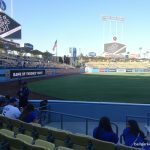 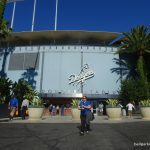 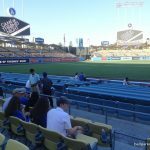 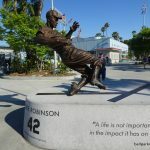 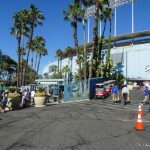 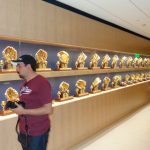 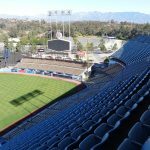 Architecturally and aesthetically, Dodger Stadium is a place that really exceeded my expectations, as I would put it shoulder-to-shoulder with the best of the retro parks and the best of the classic ones. 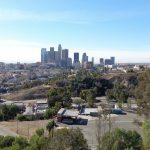 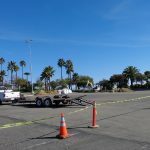 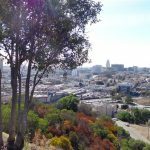 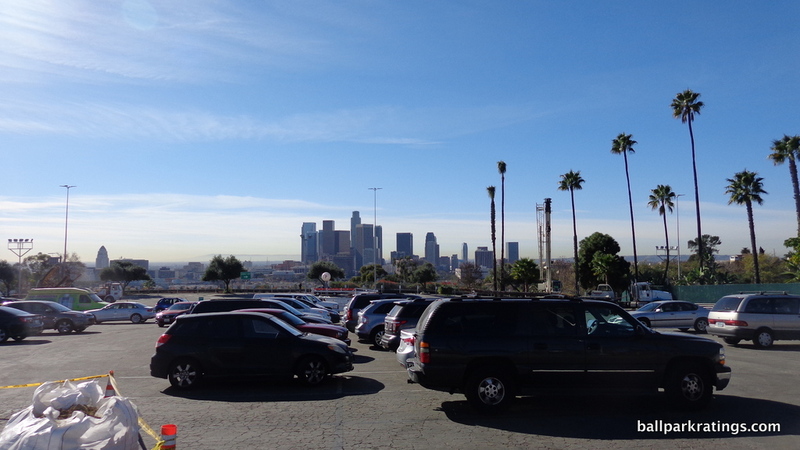 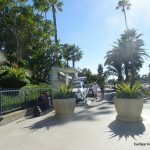 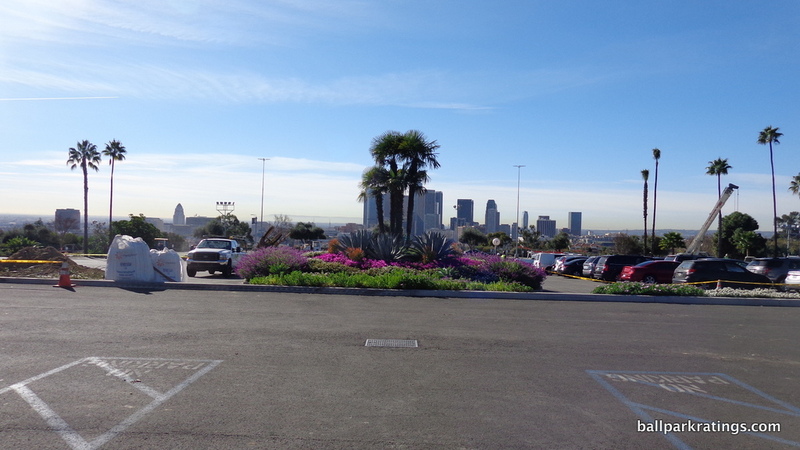 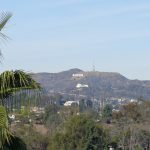 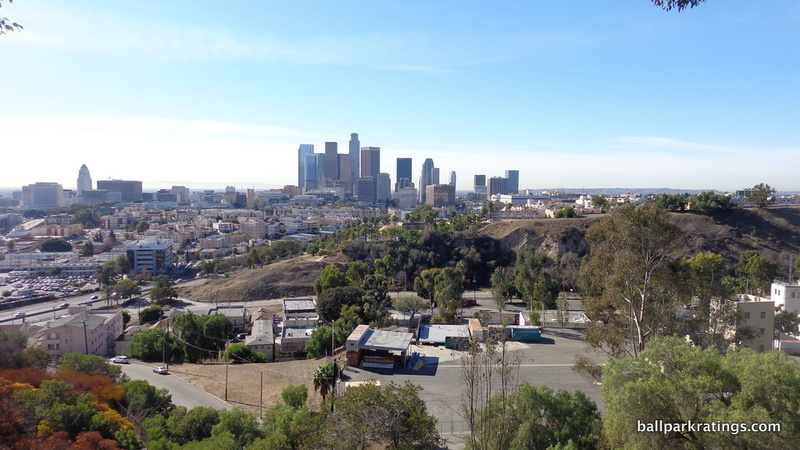 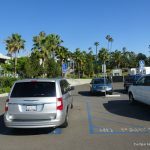 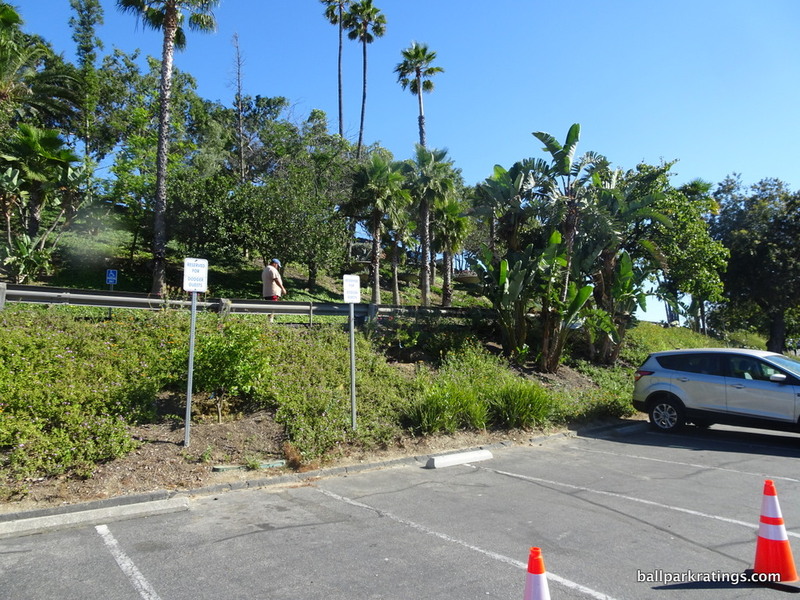 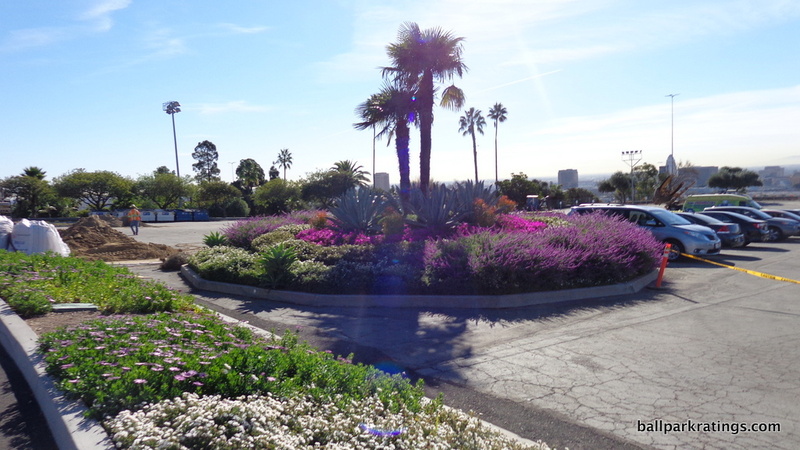 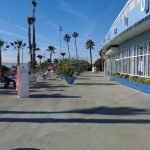 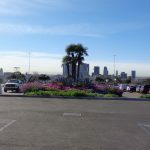 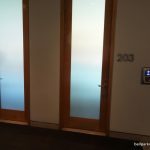 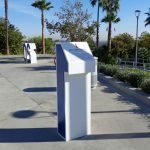 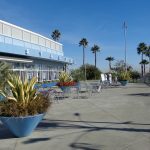 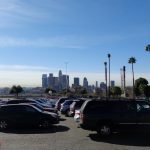 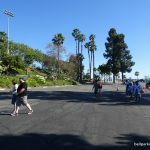 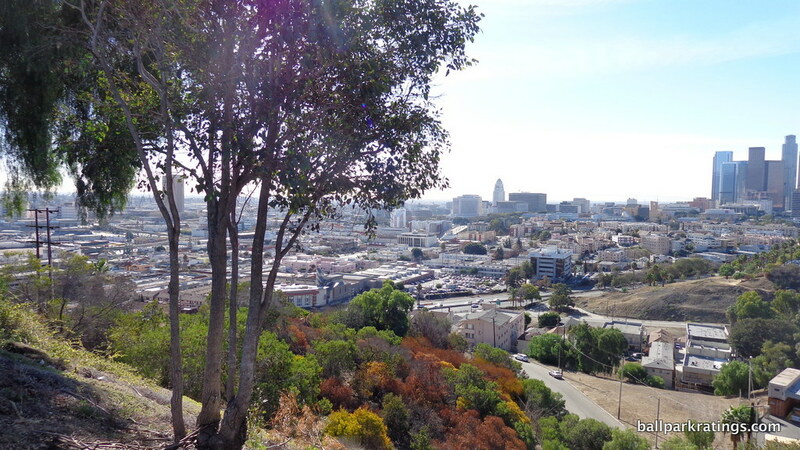 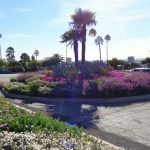 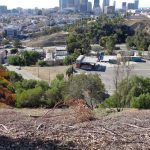 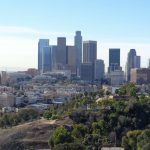 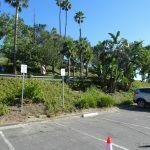 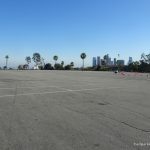 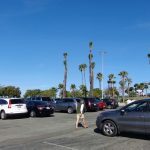 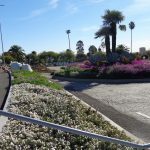 While parks in San Francisco, Pittsburgh, Detroit, and San Diego are highly acclaimed for their views, the views in Los Angeles are as good as any. 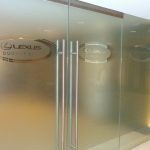 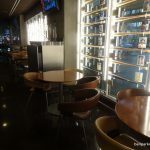 Everything about the interior aesthetic scene is understated yet beautiful. 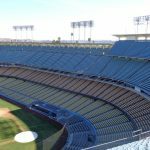 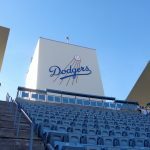 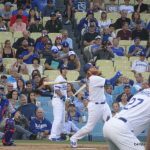 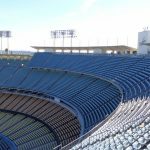 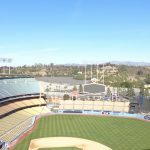 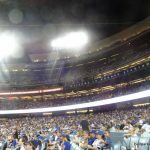 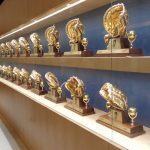 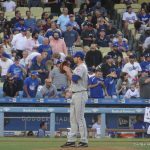 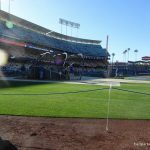 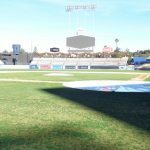 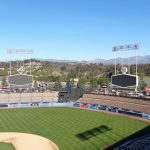 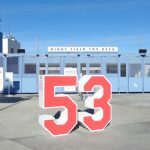 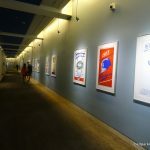 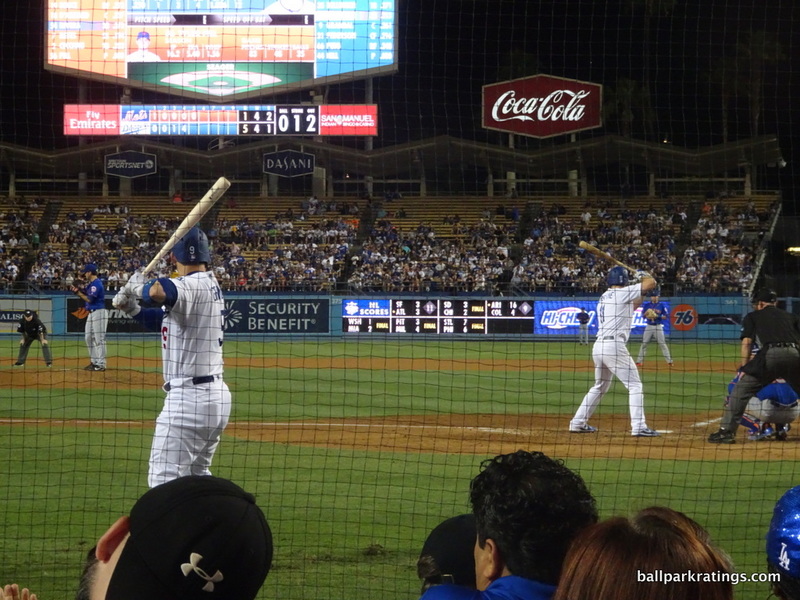 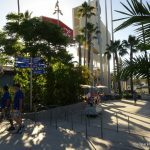 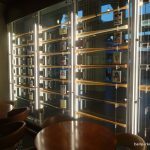 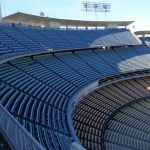 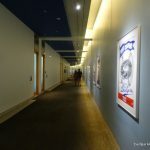 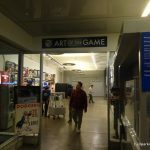 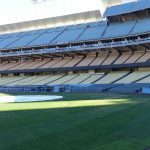 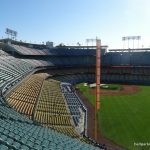 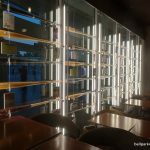 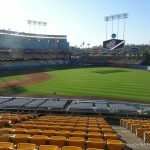 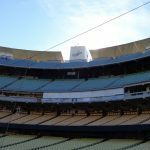 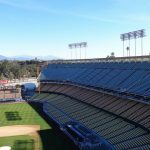 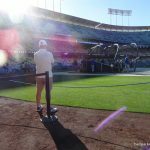 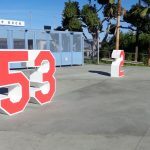 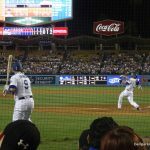 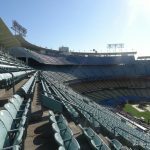 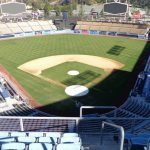 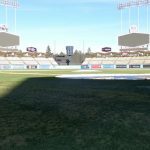 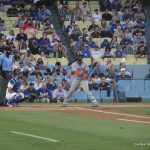 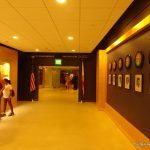 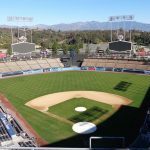 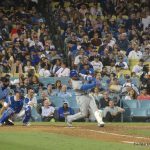 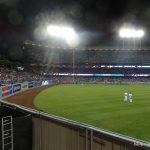 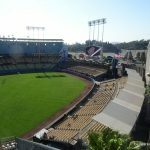 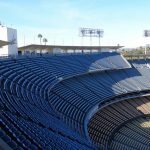 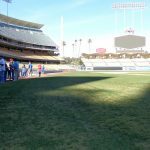 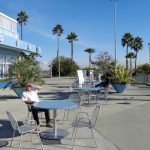 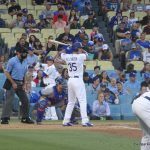 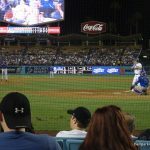 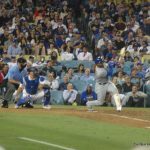 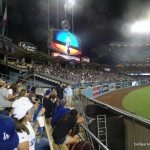 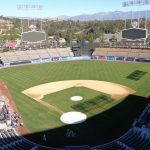 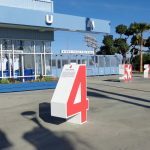 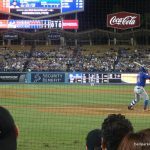 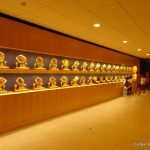 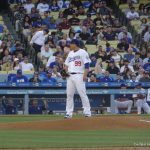 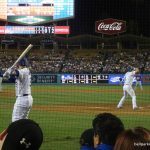 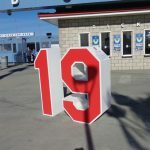 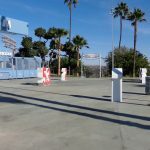 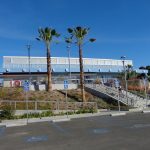 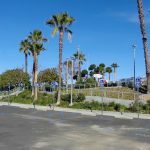 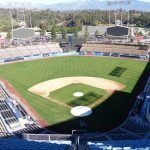 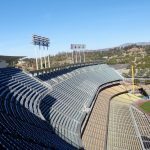 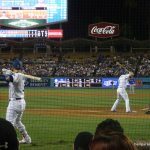 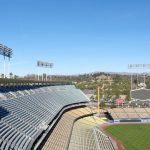 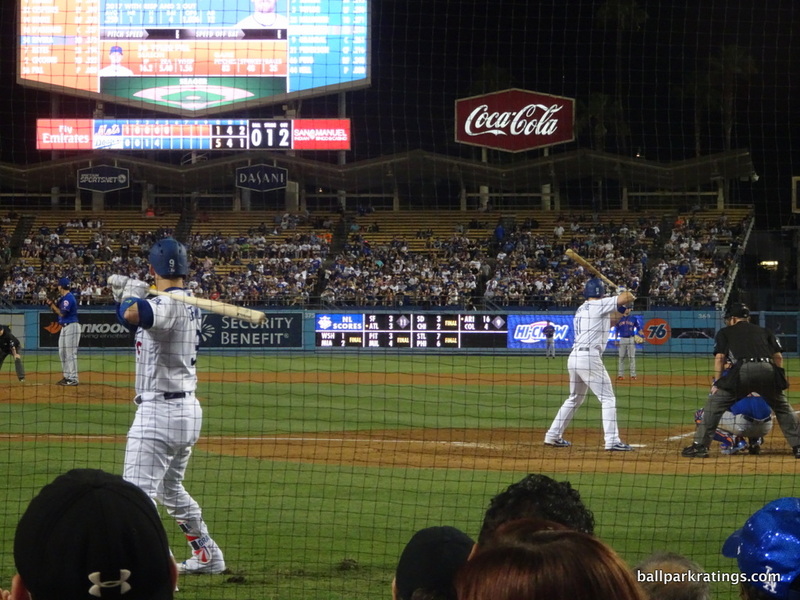 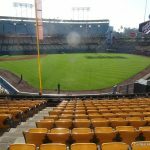 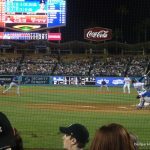 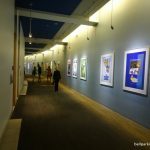 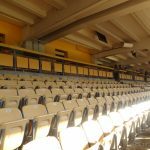 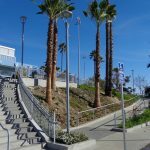 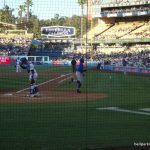 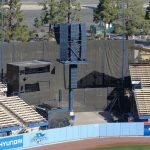 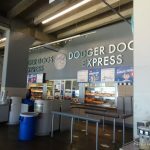 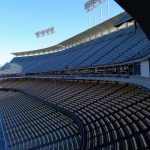 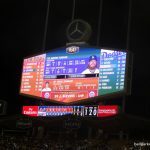 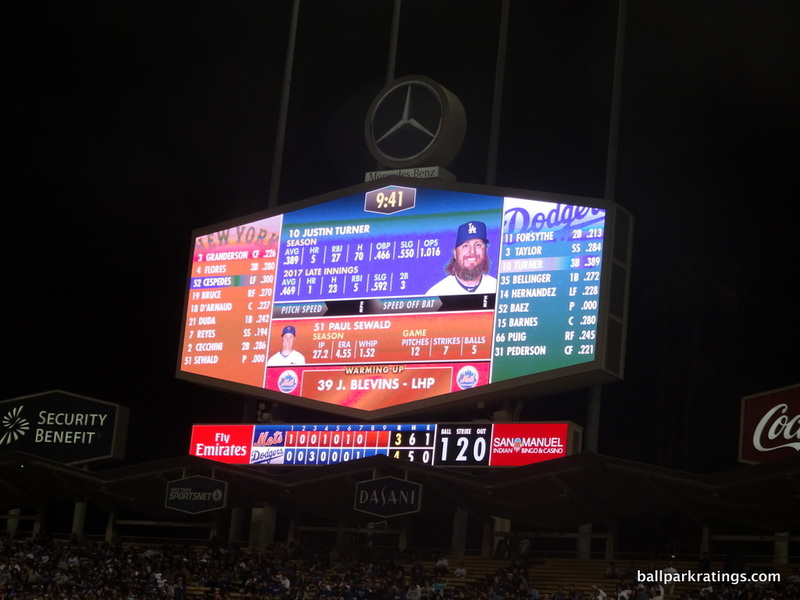 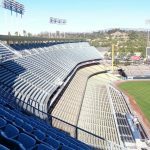 Emphasizing enduring structural assets over attention-grabbing gimmicks or contrived quirks, Dodger Stadium is the ideal combination of light and heavy. 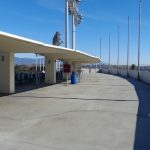 Overlooking the weight of the green-lined hills and San Gabriel Mountains, each deck seems delicately suspected in air, with the wavy roof the perfect, light accentuation. 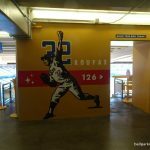 The original pastel color scheme, restored in the mid-2000s, always struck me as the perfect counterpoint to the natural earth tonality beyond the outfield. 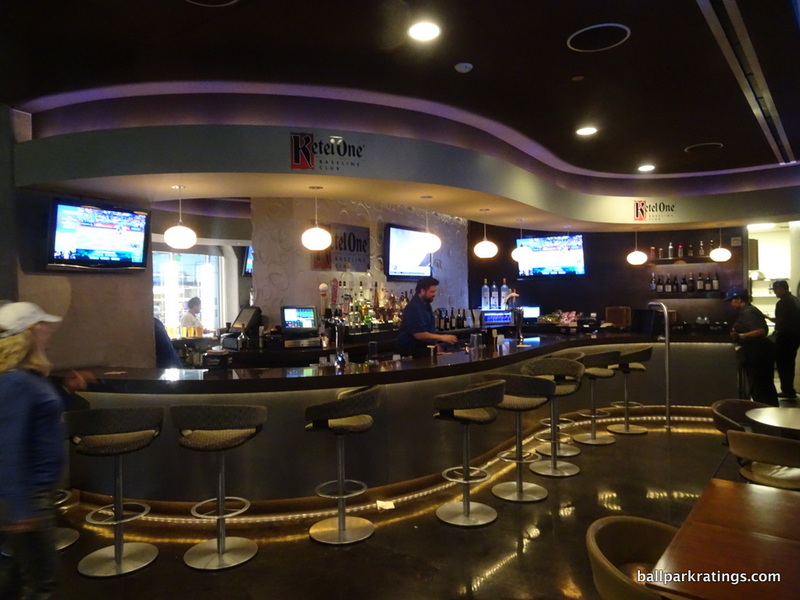 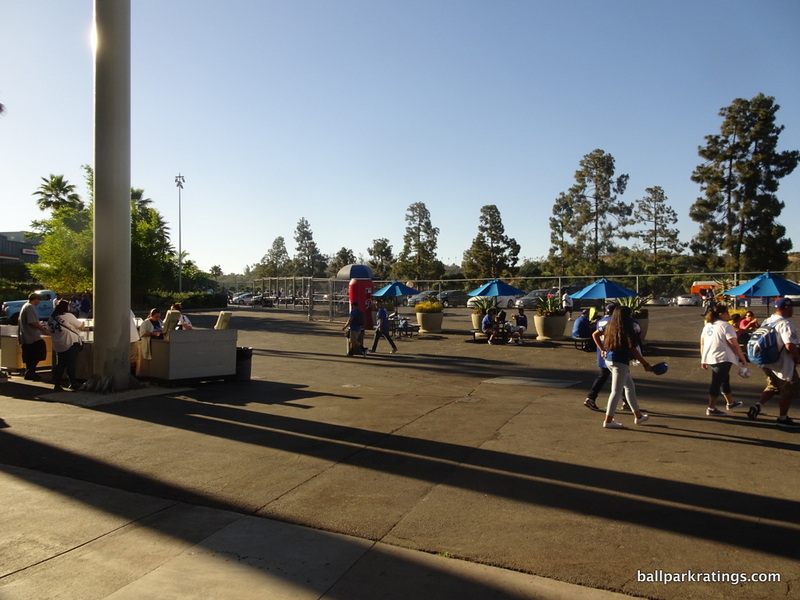 Unlike today’s excess, the park works through complementing the game being played, not overpowering it. 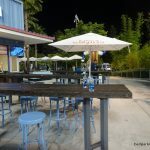 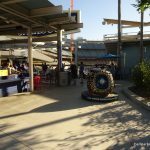 The new parks attempt to be unique by having kitschy features, mainly because the fundamental structure is more or less the exact same. 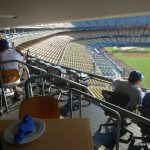 Dodger Stadium took a normal seating configuration, with clean lines and comparatively nice sightlines, added a single beautiful architectural element, and otherwise let the view (which is frankly even better than people say it is) and baseball do the rest. 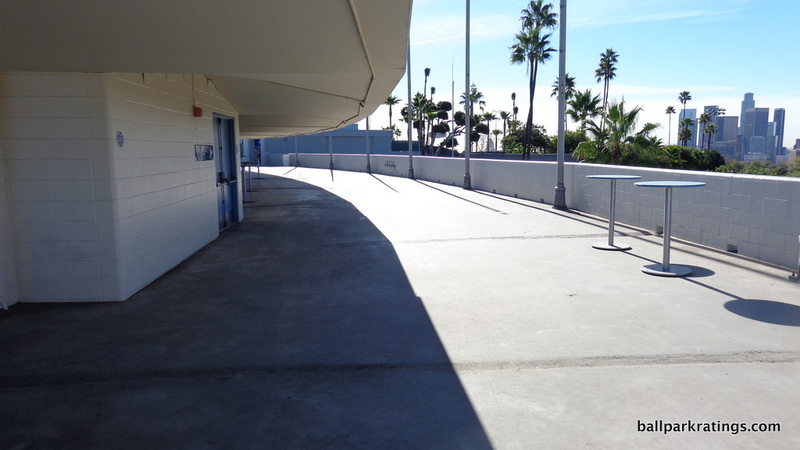 Sunken into the landscape, any exterior architecture is non-existent, but that’s part of the minimalist appeal. 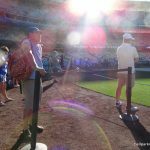 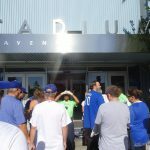 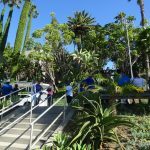 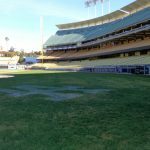 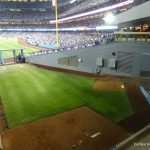 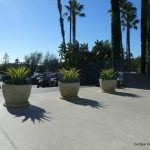 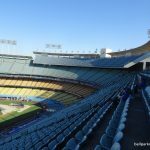 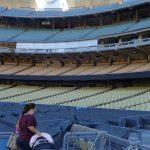 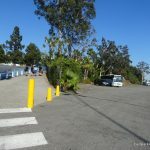 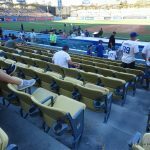 If you are being fair in comparing Dodger Stadium to any other ballpark, the setting is just abysmal, mainly because of access issues. 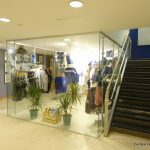 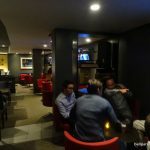 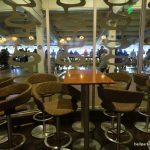 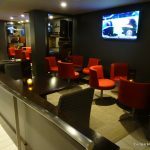 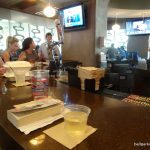 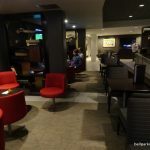 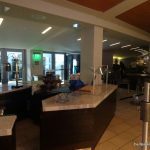 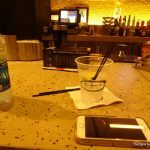 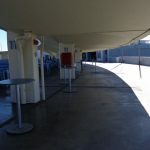 Yes, you are separated from the city center (although you have a nice view of it from the top deck concourse) with no bars, restaurants, shops, etc. 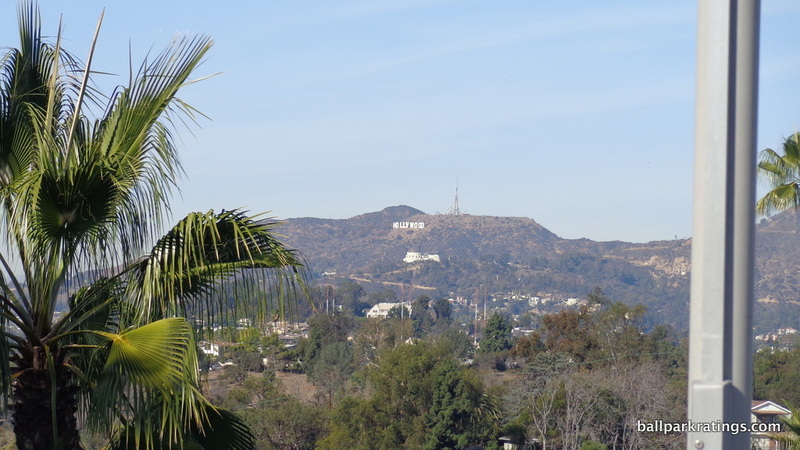 in the vicinity, but there’s nothing exceptional about that. 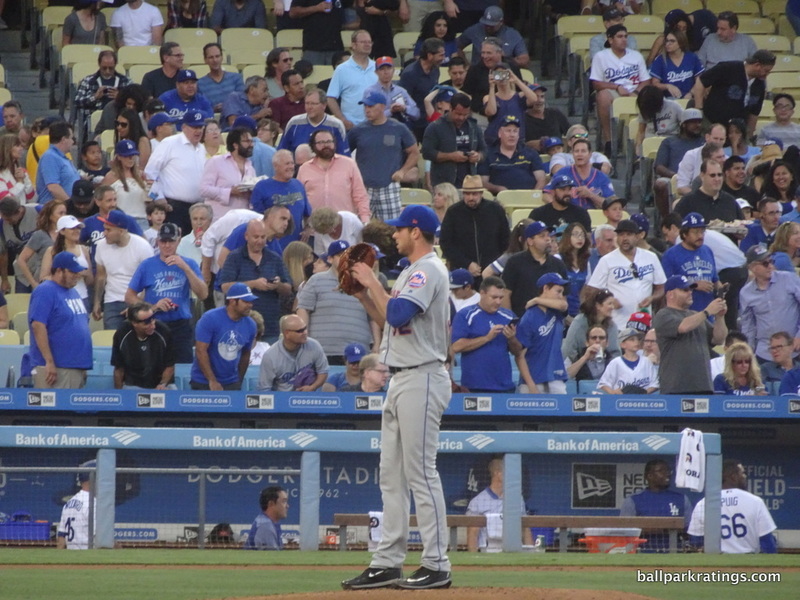 It’s bad, but within normal parameters of bad, in what is a typical set-up for the era. 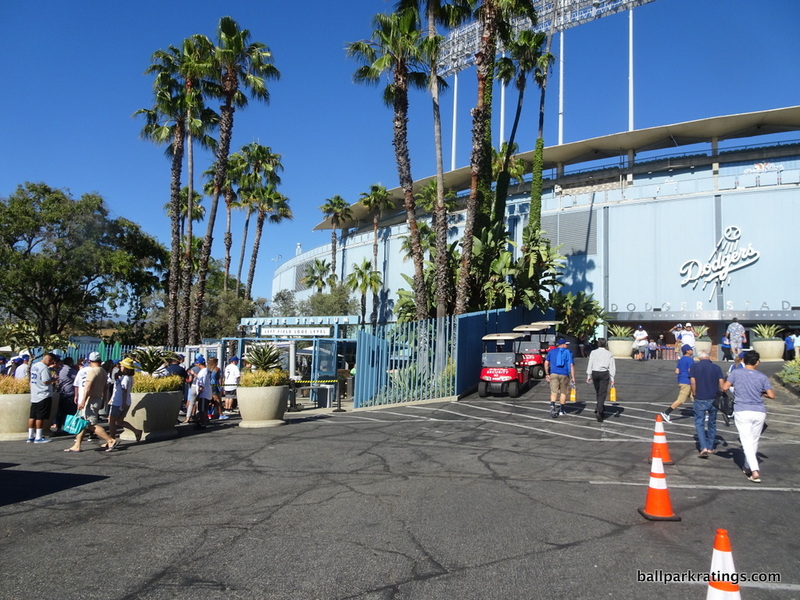 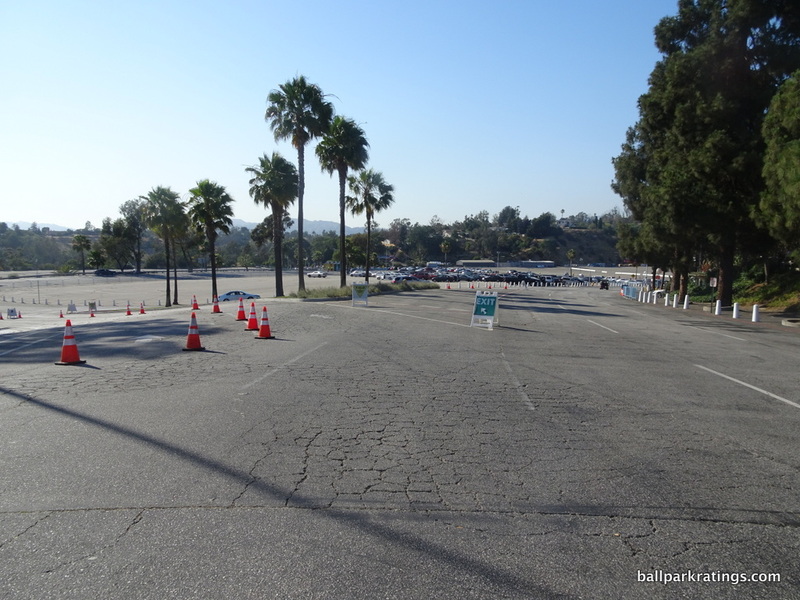 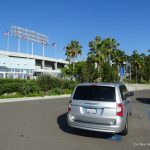 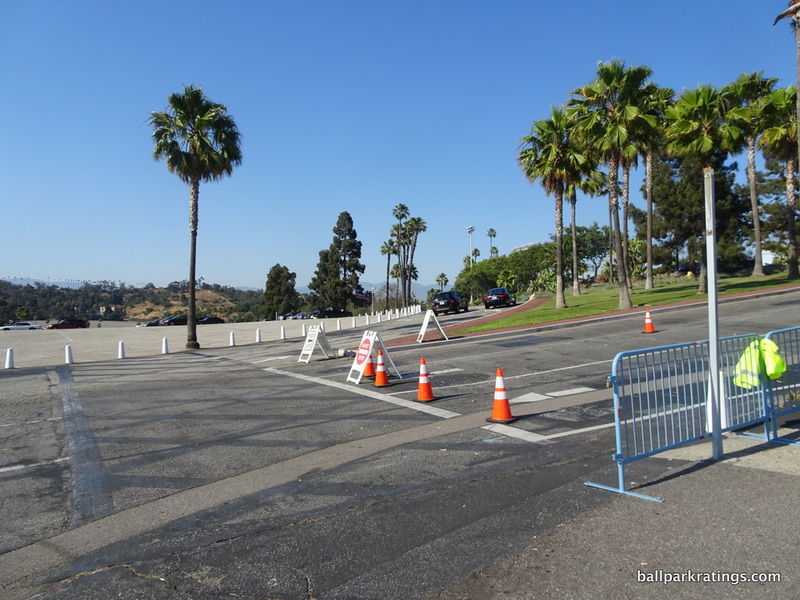 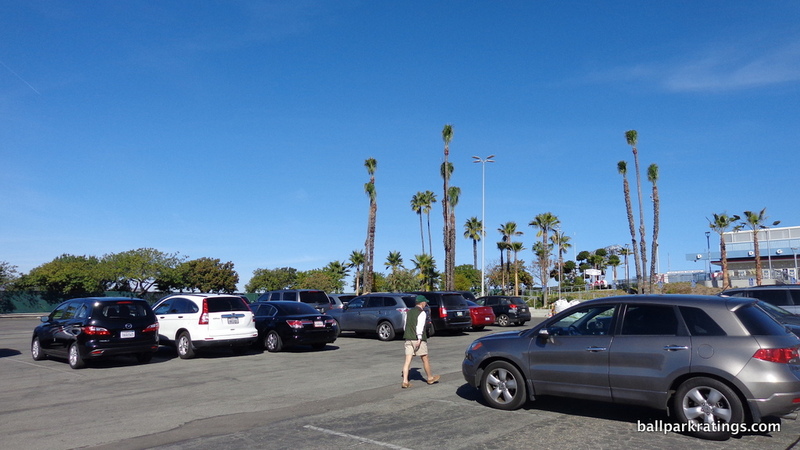 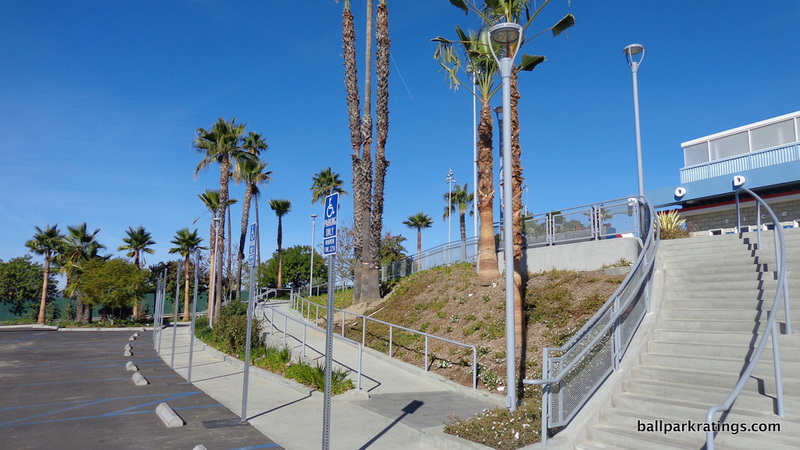 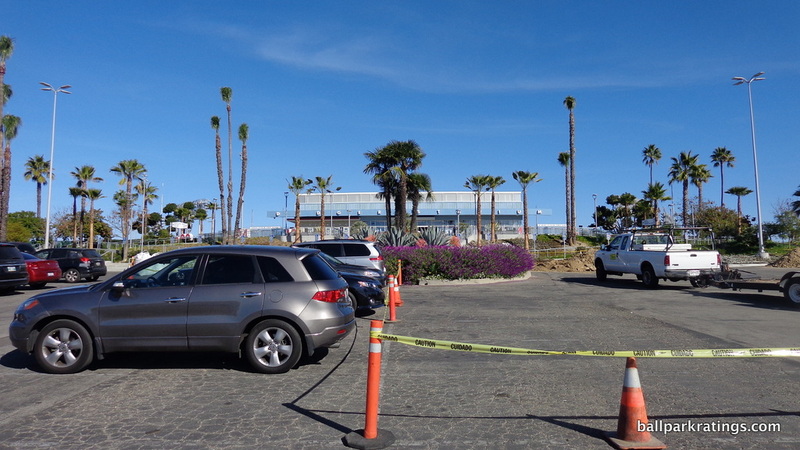 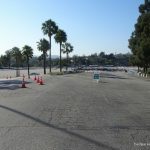 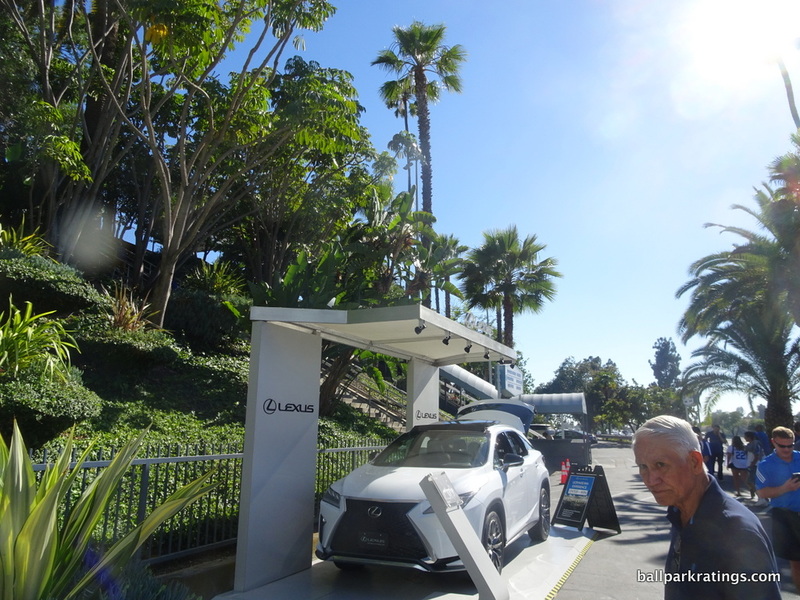 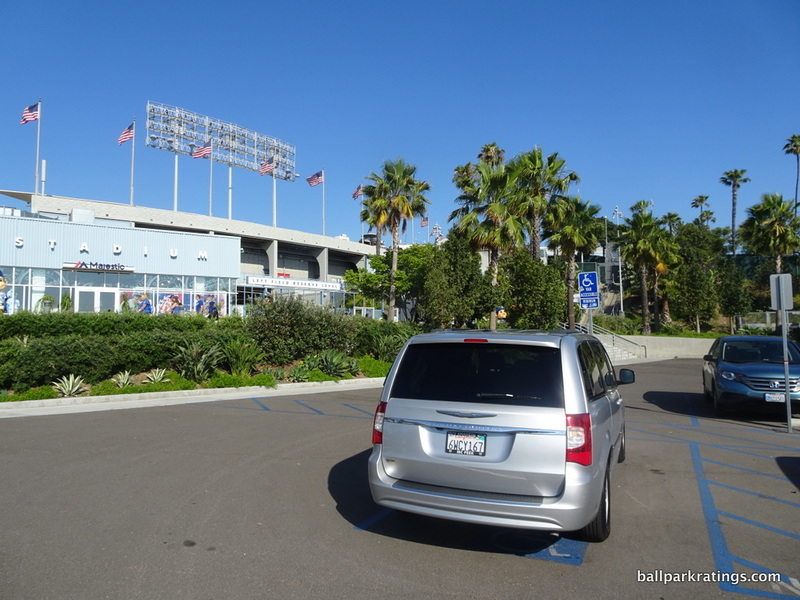 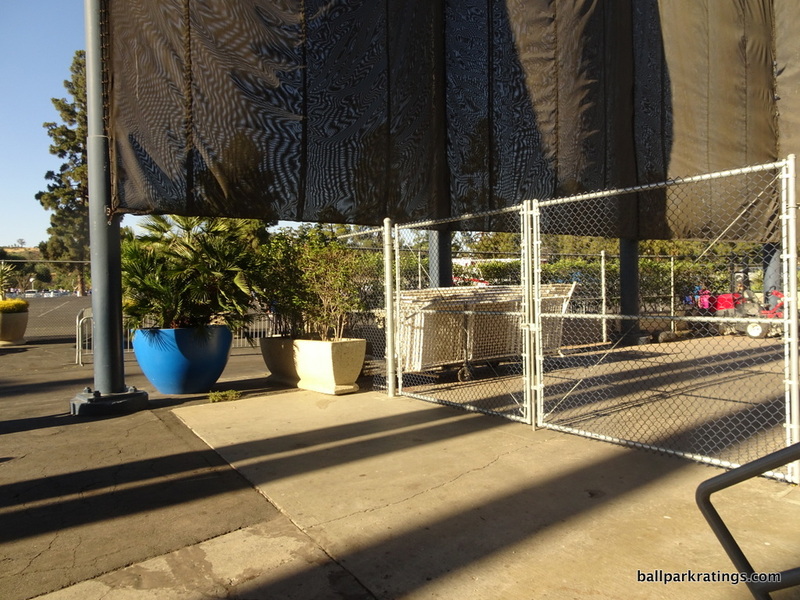 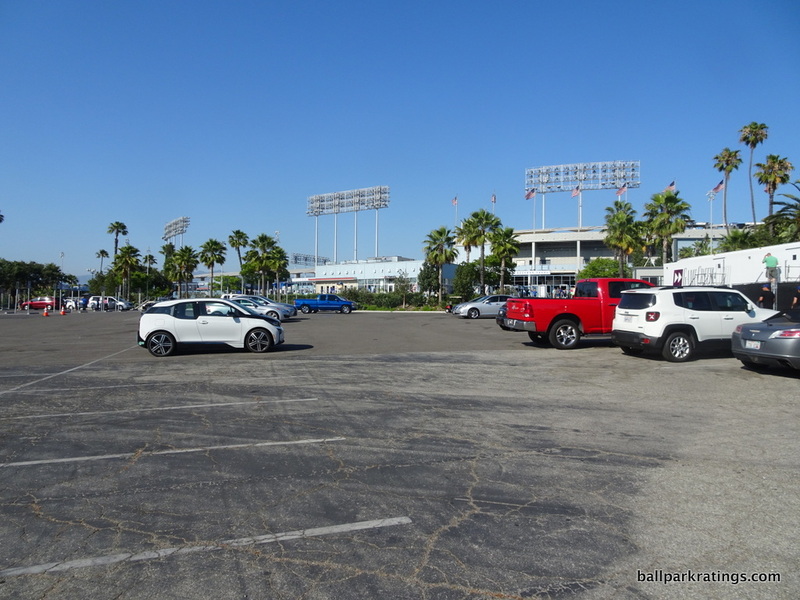 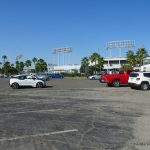 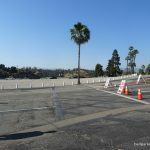 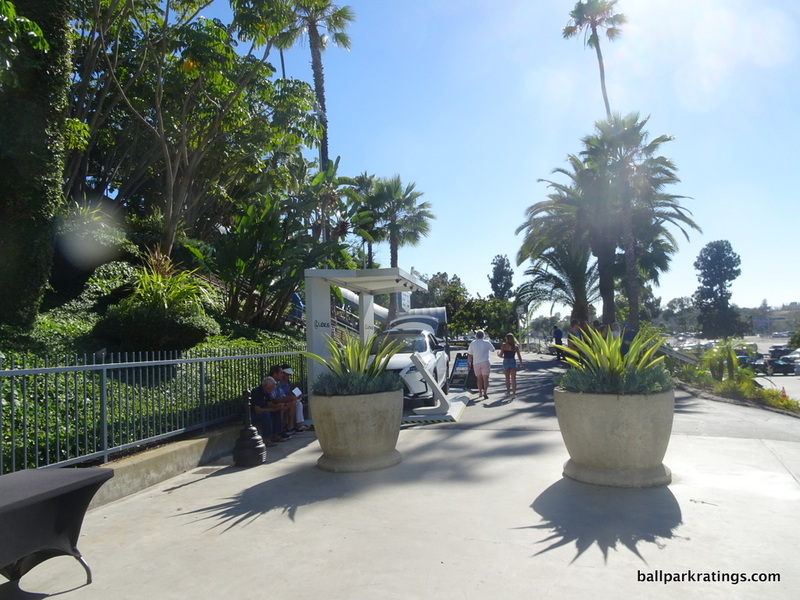 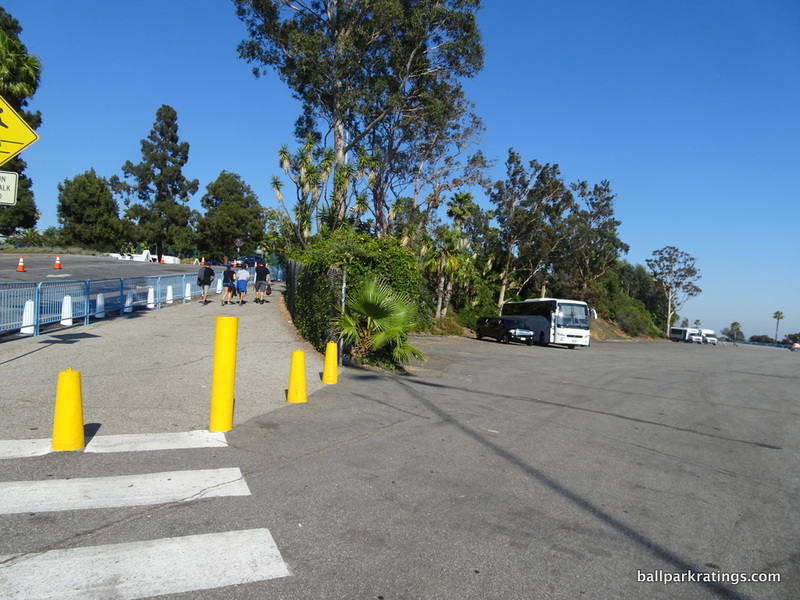 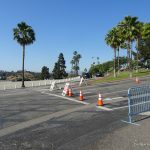 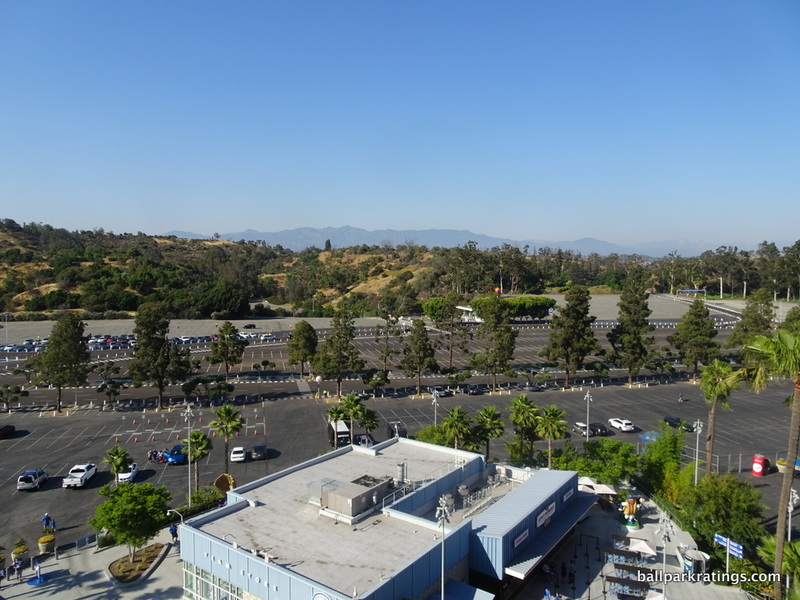 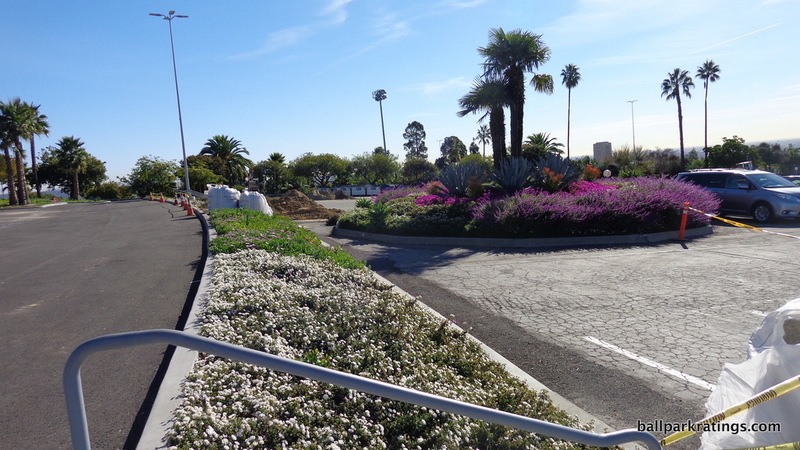 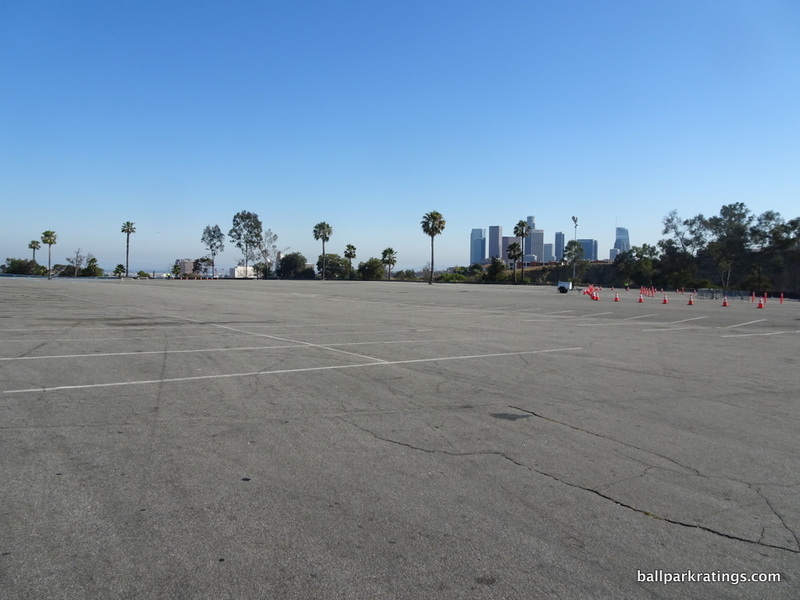 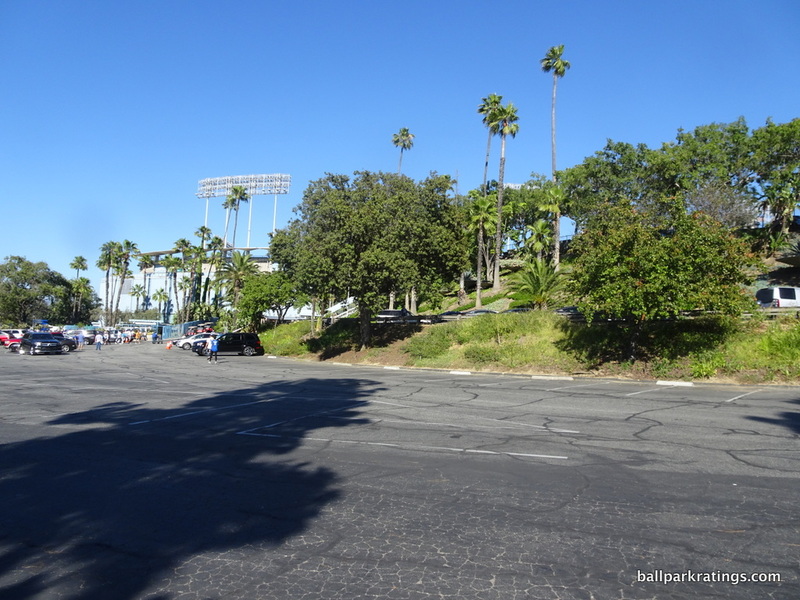 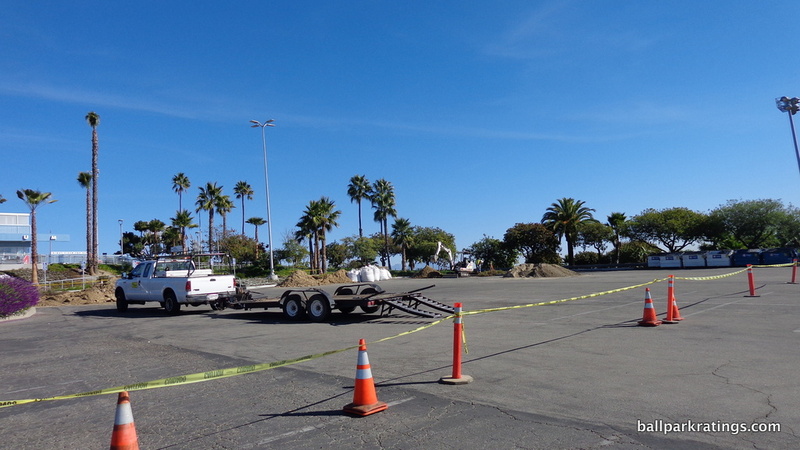 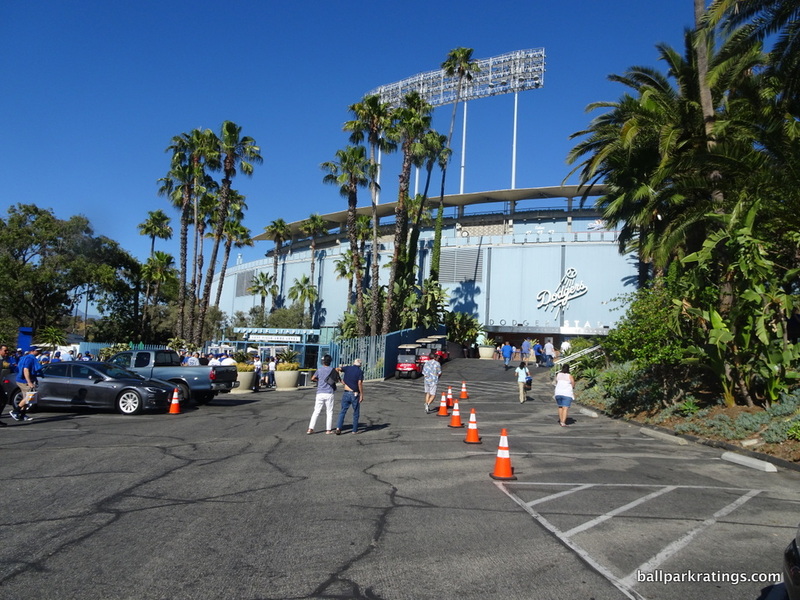 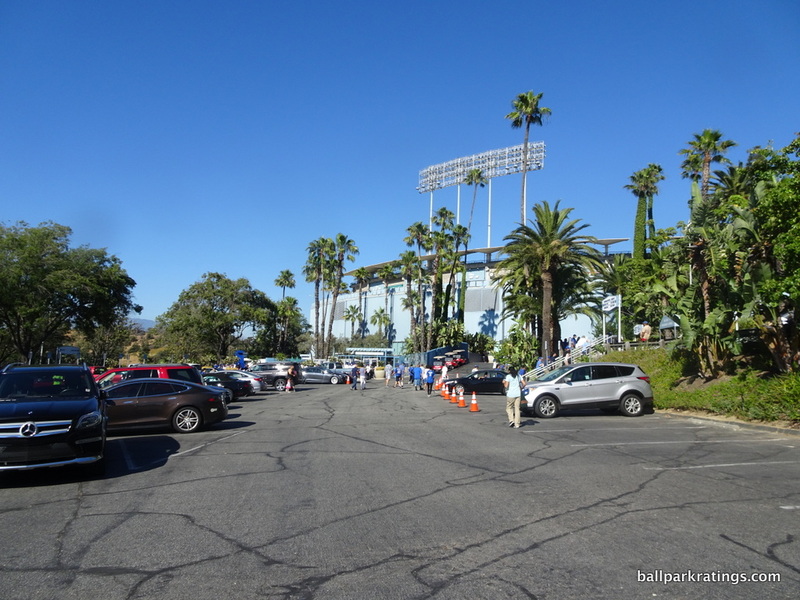 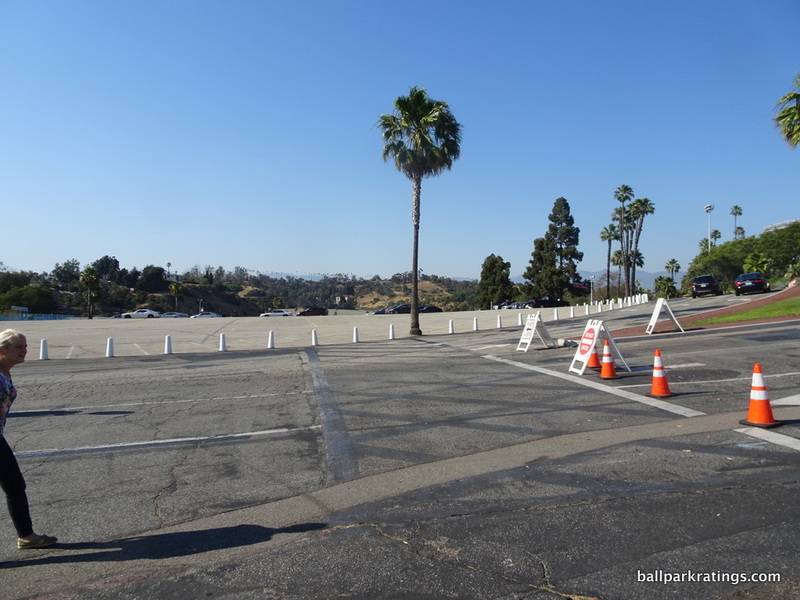 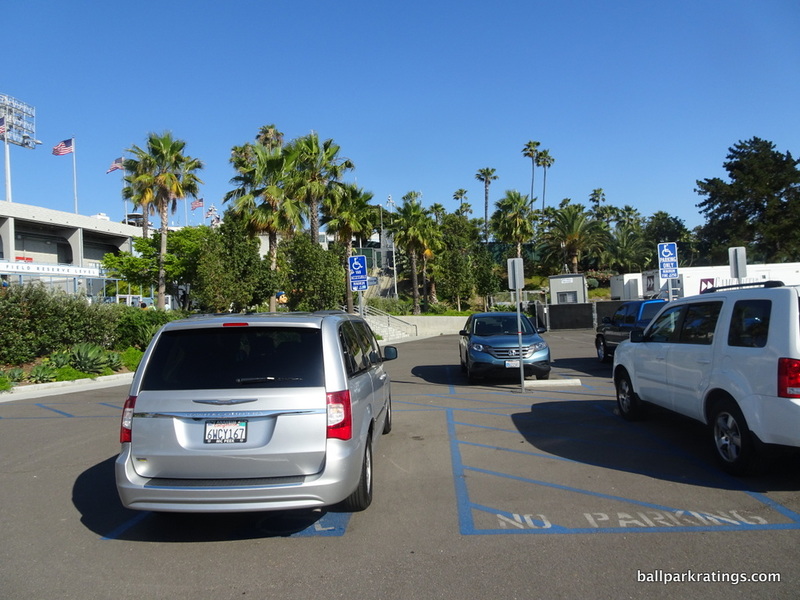 However, access to Dodger Stadium, with its puzzling system of ingress/egress and well-publicized traffic issues, is a world apart worse than any other MLB Stadium. 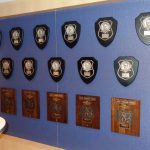 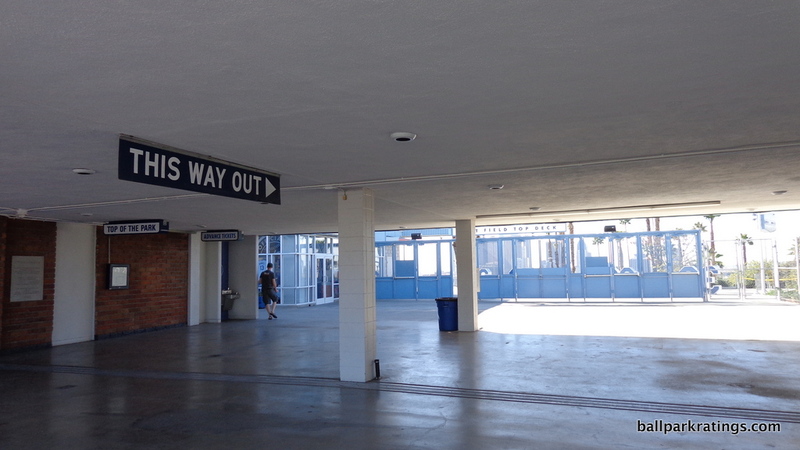 In my experience, it’s an active deterrent, and I wouldn’t come close to saying that for any place else. 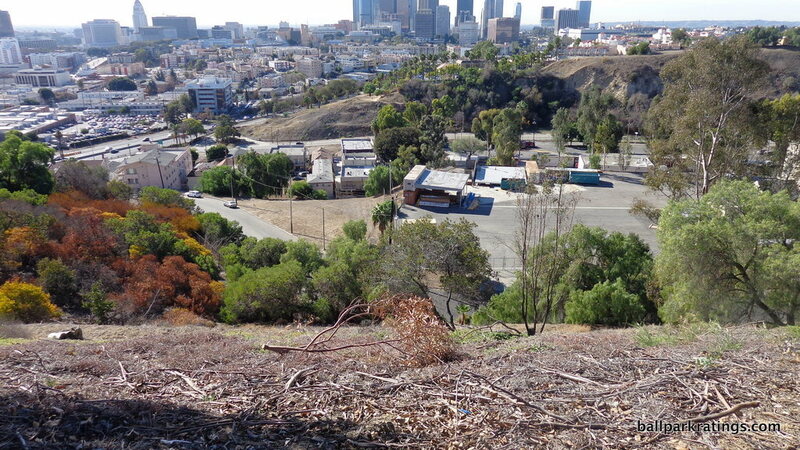 Perhaps I’m just not used this area of Los Angeles. 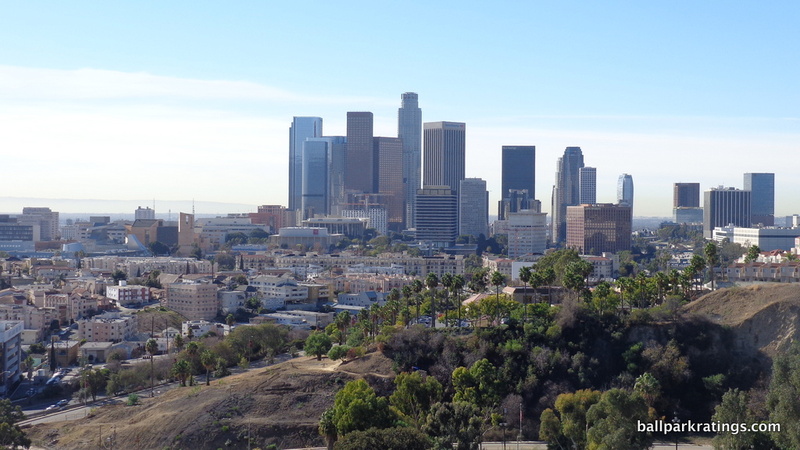 Or just Los Angeles. 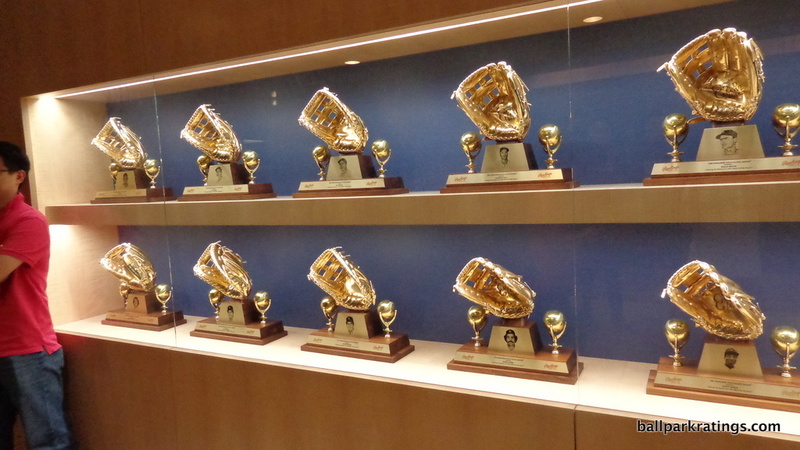 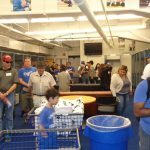 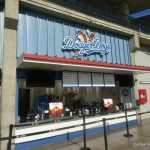 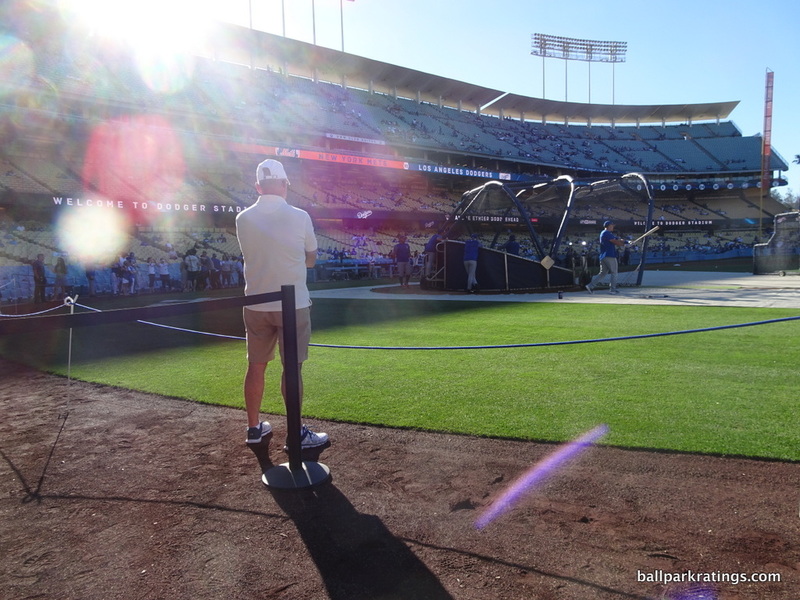 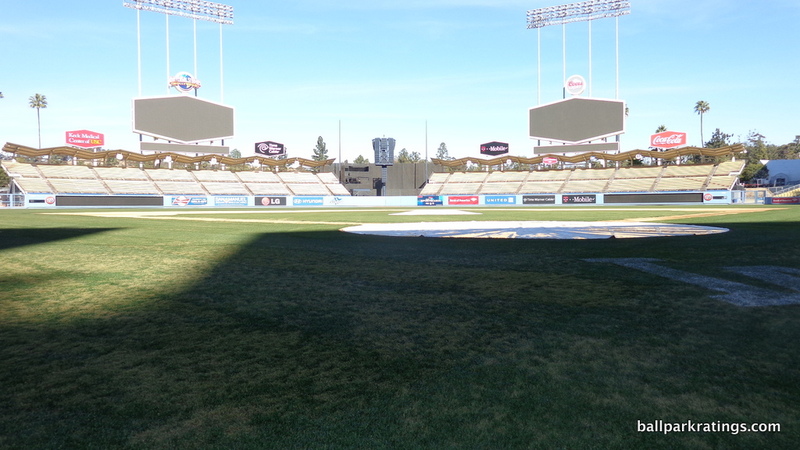 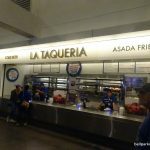 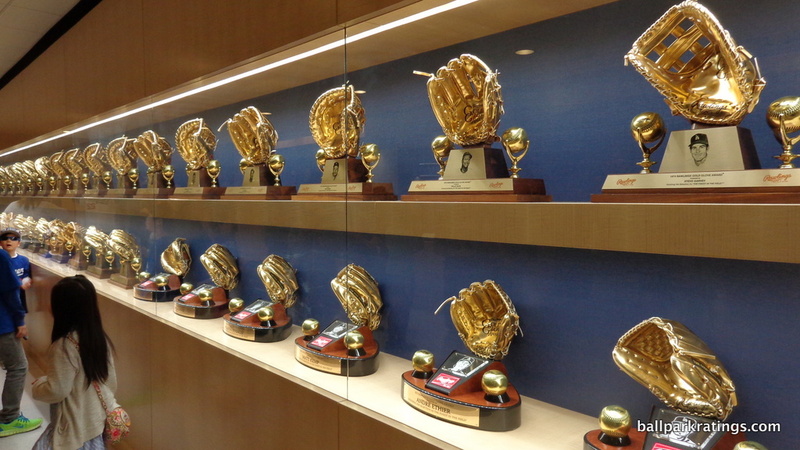 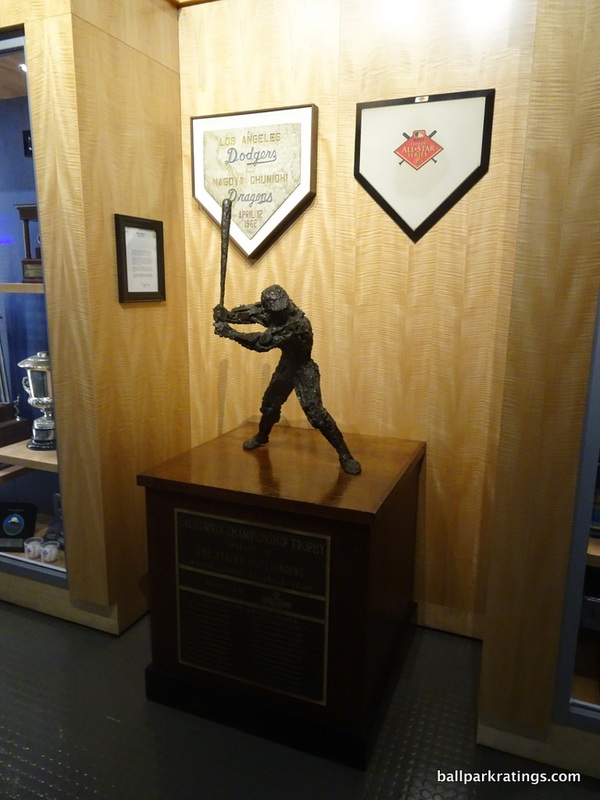 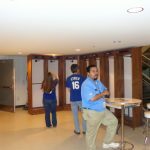 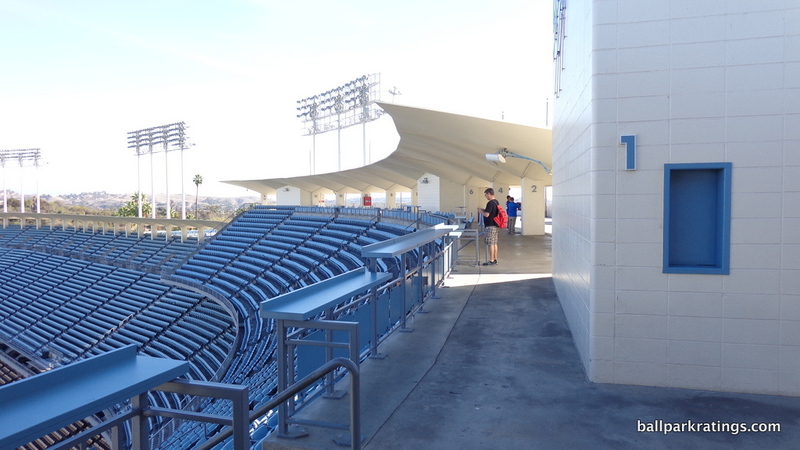 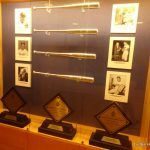 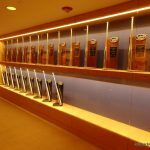 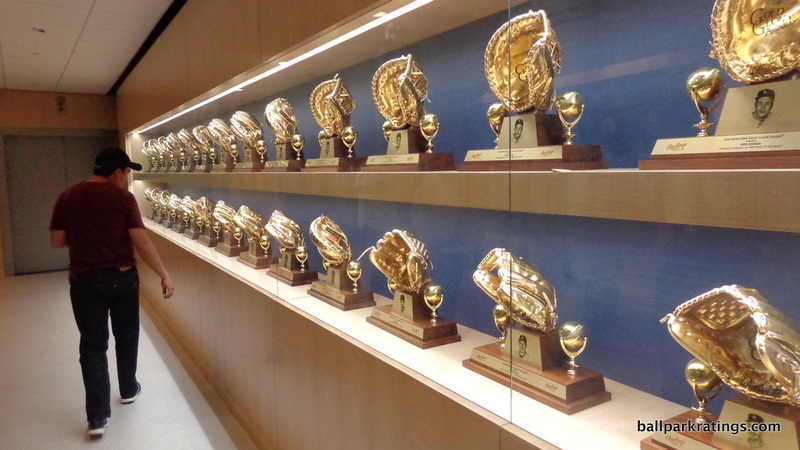 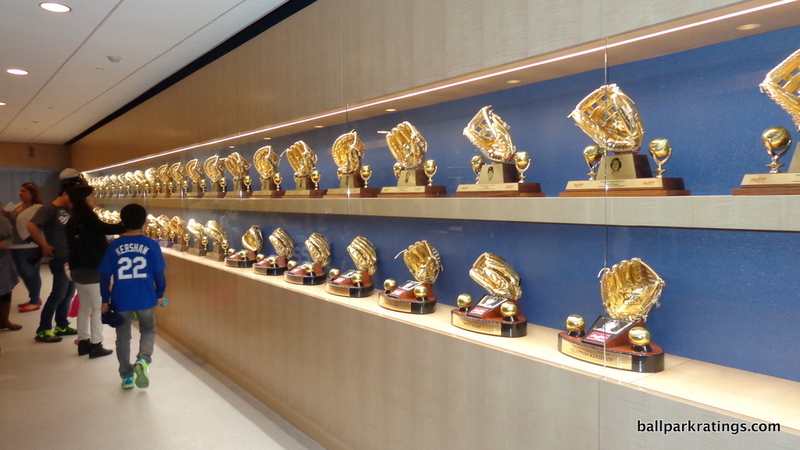 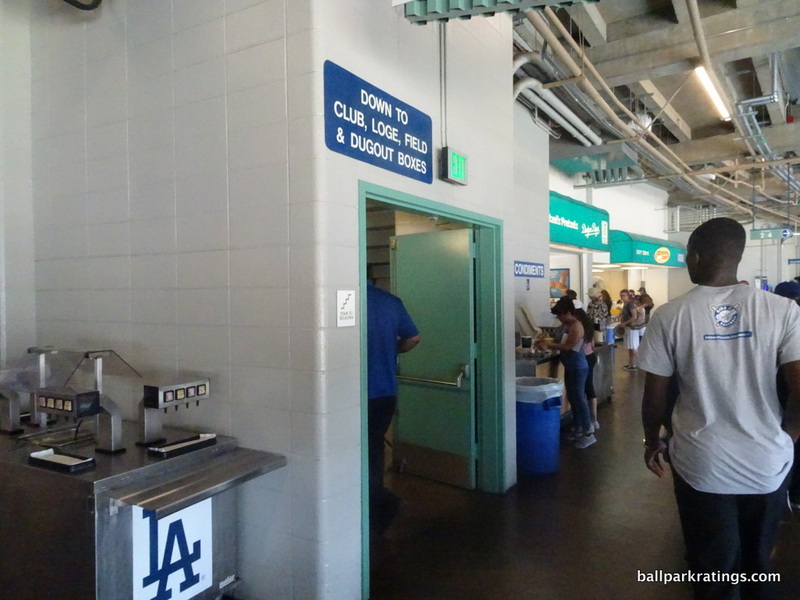 Dodger Stadium has always been fairly functional, but it has improved in this respect in the last 10 years. 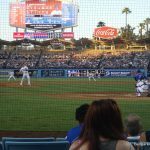 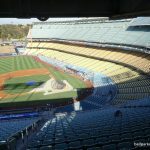 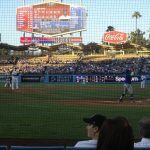 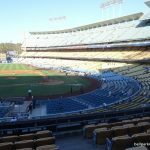 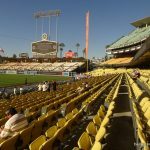 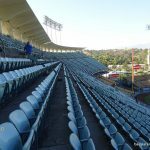 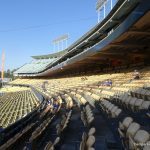 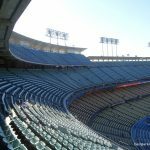 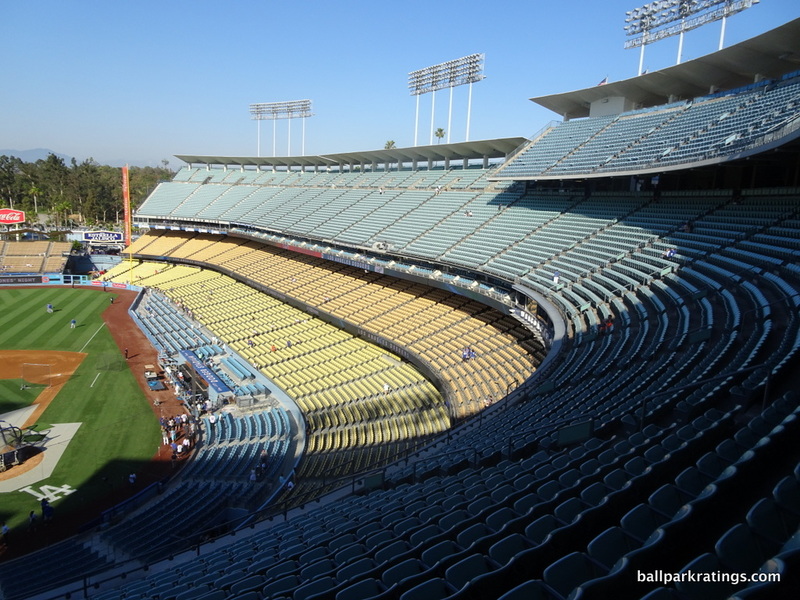 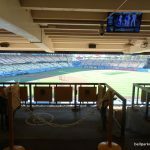 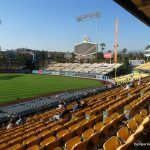 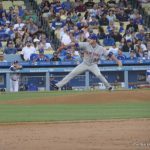 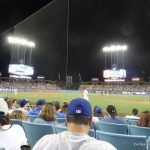 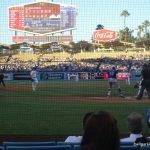 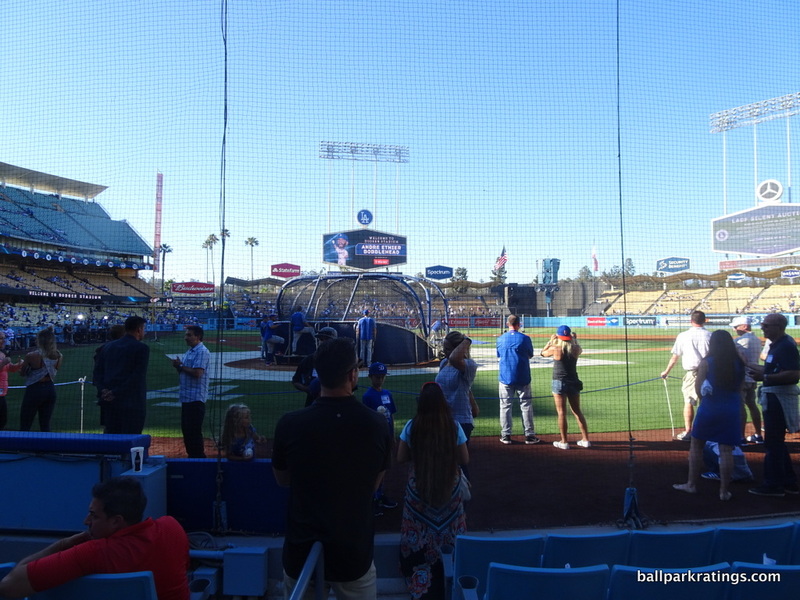 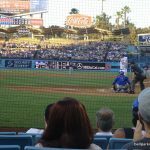 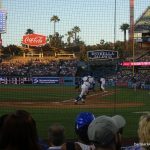 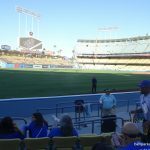 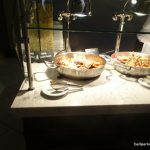 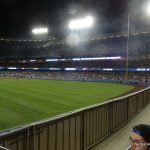 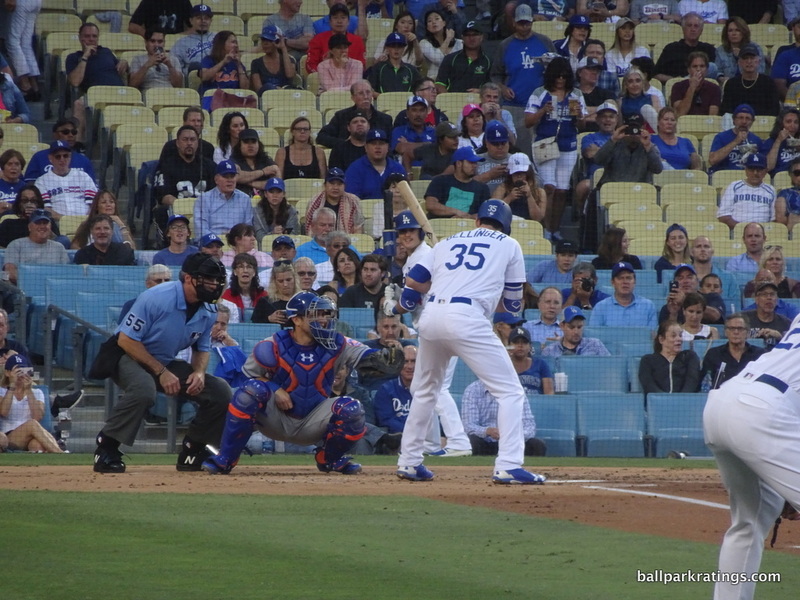 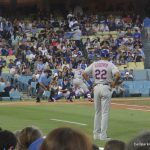 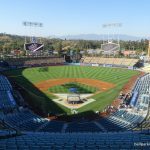 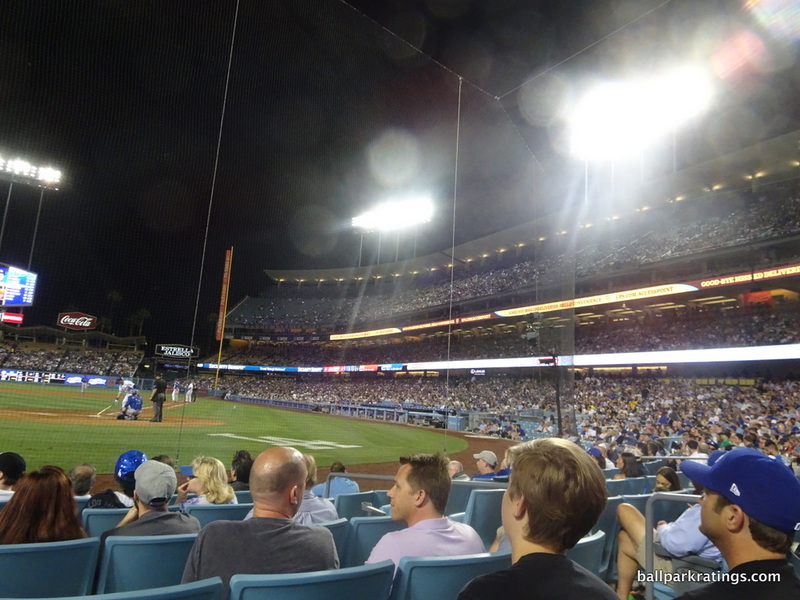 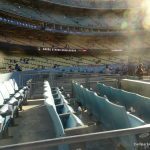 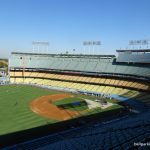 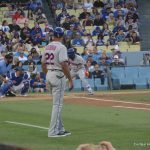 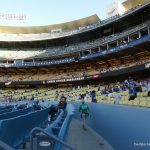 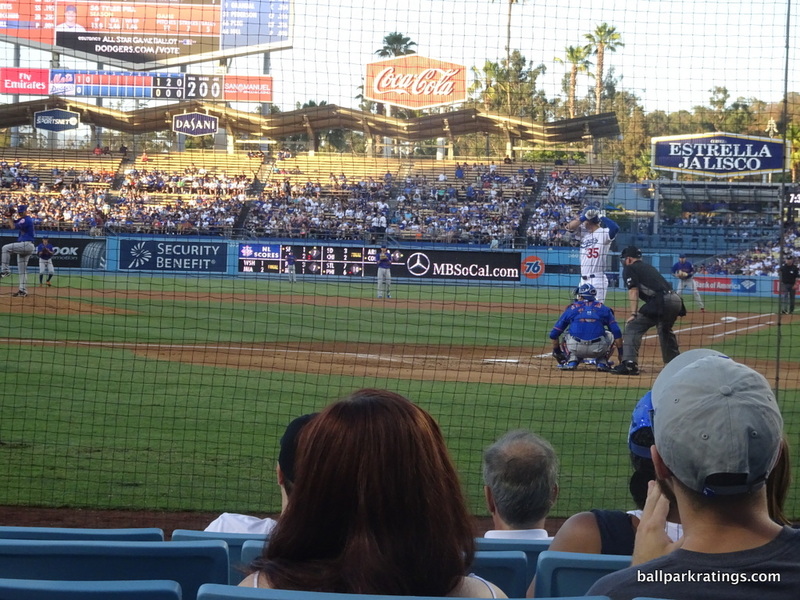 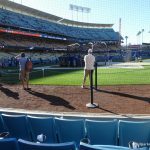 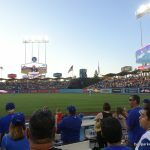 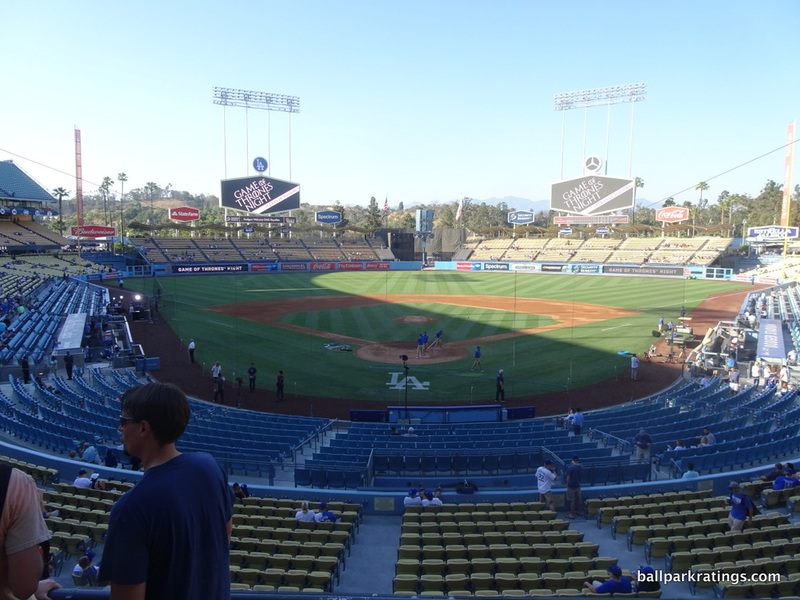 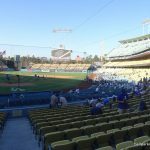 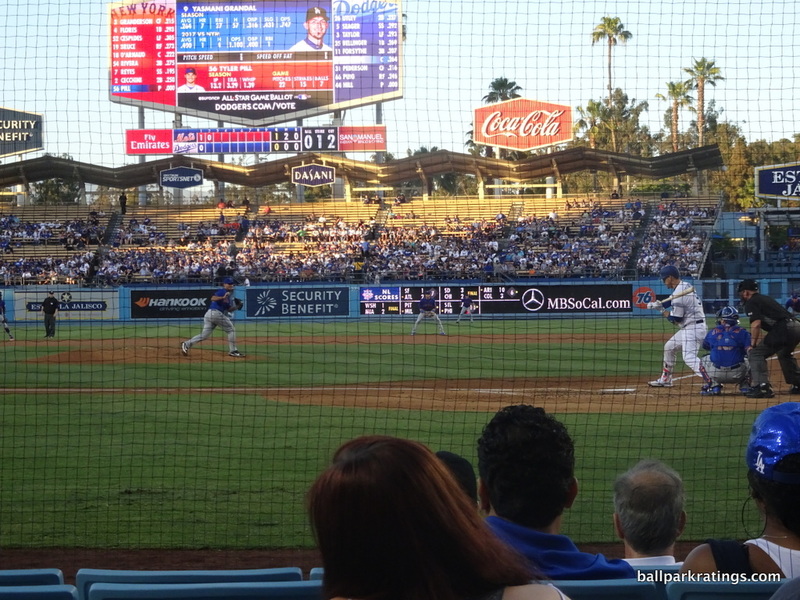 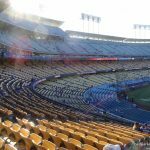 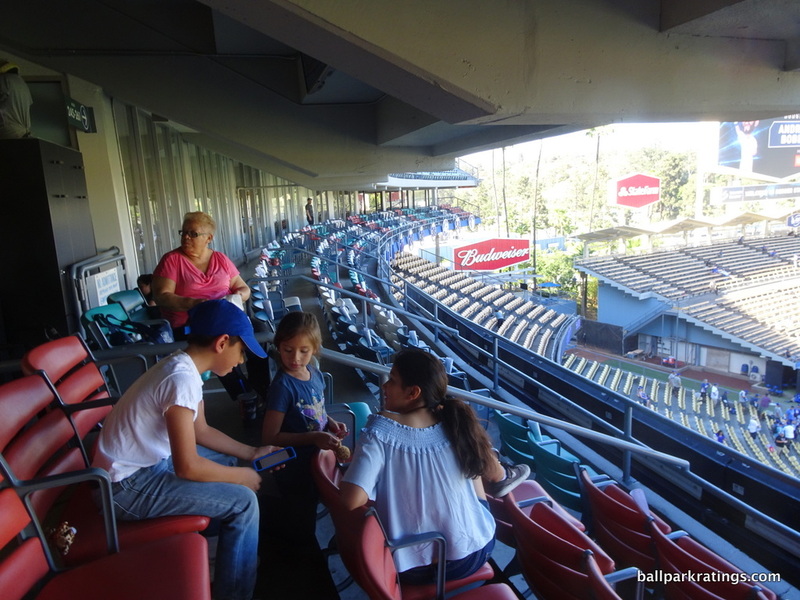 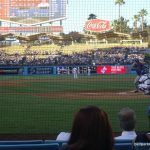 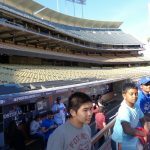 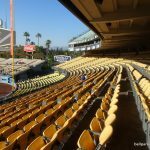 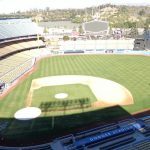 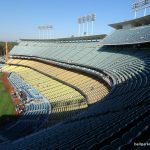 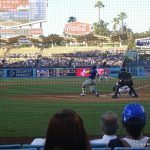 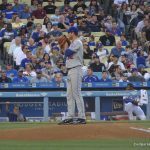 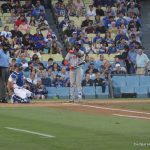 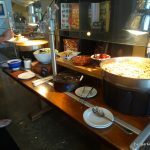 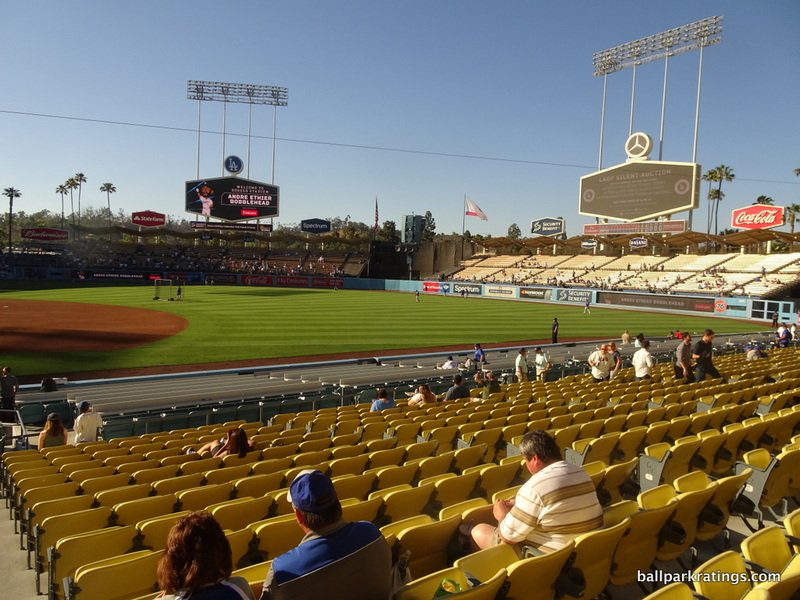 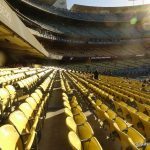 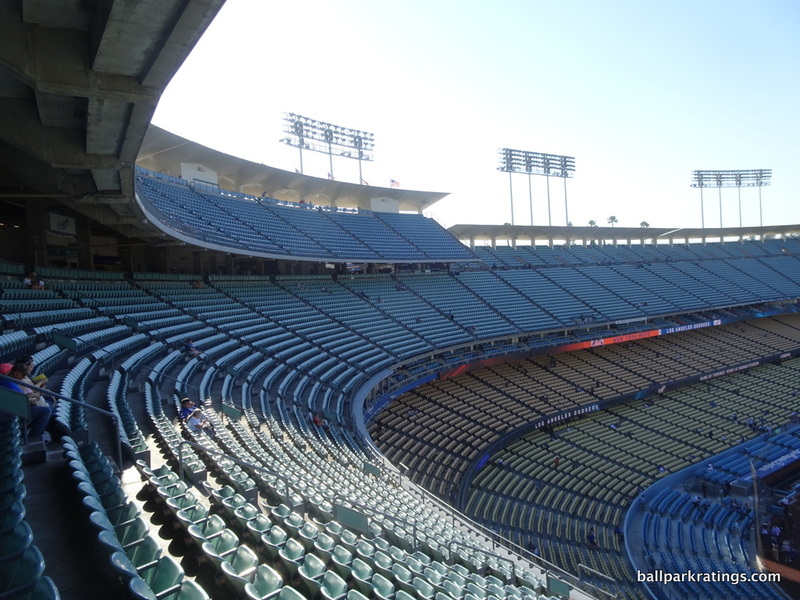 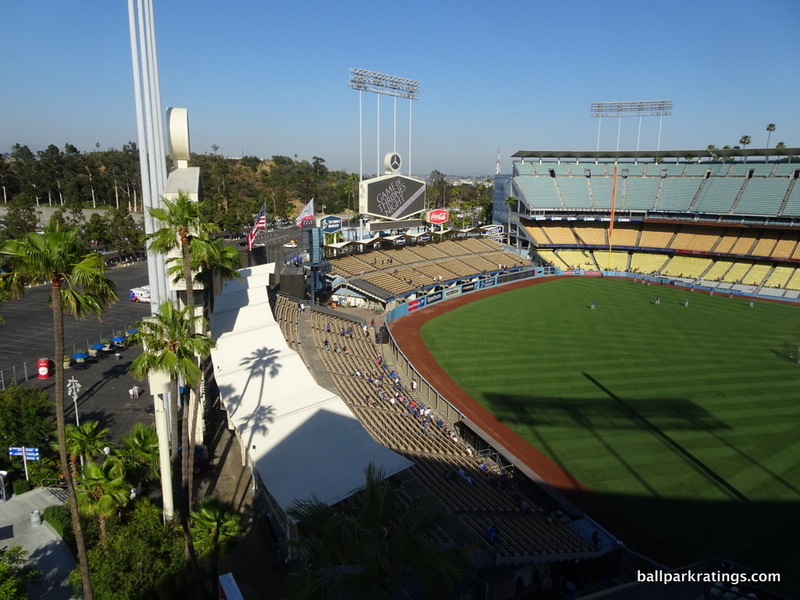 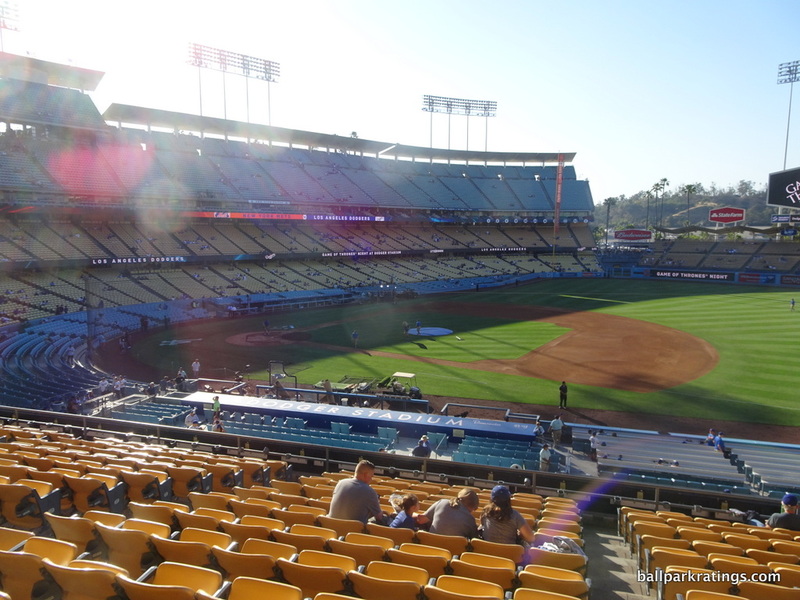 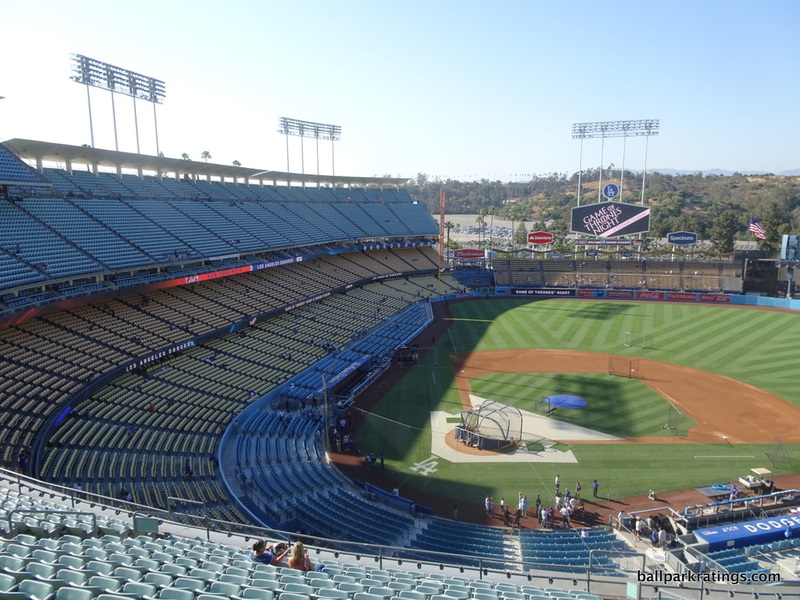 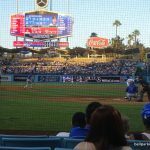 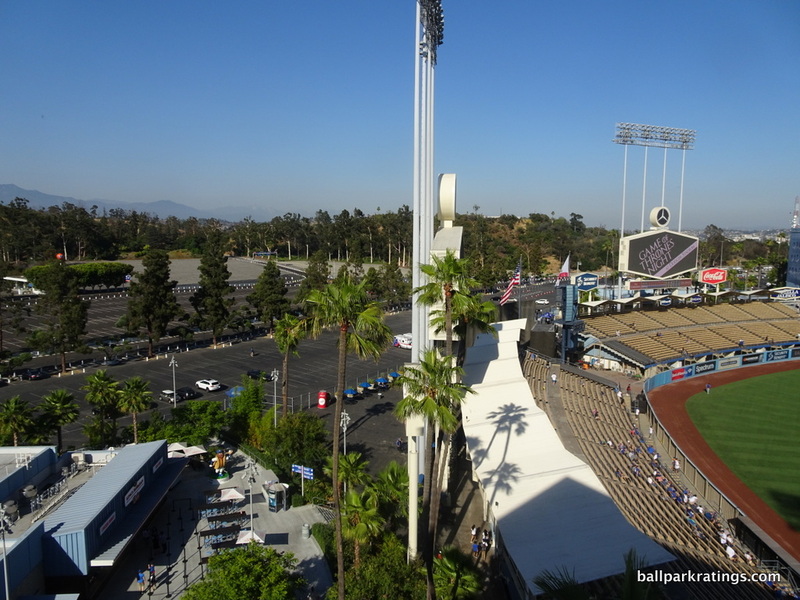 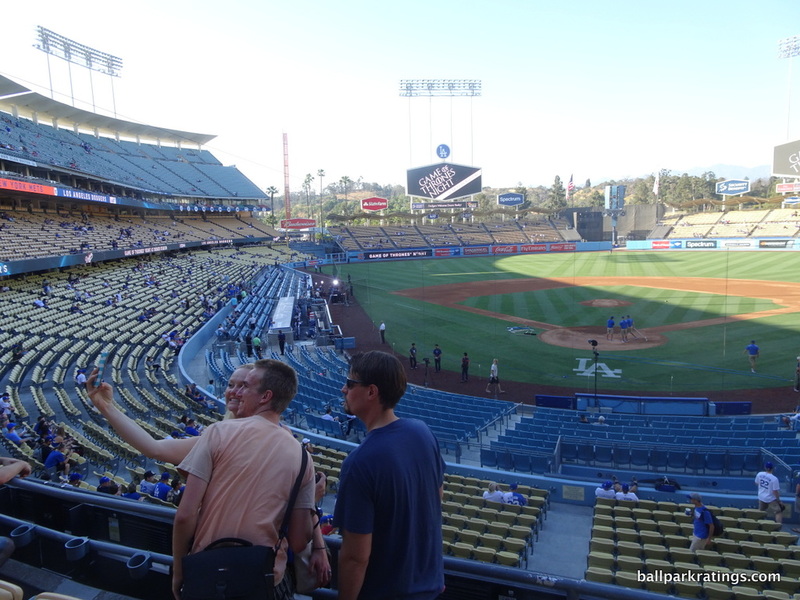 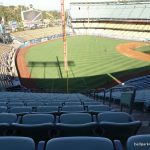 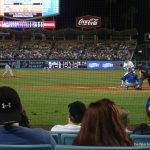 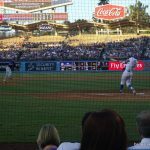 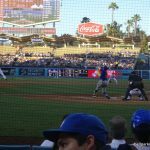 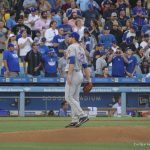 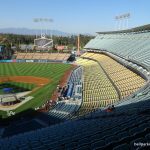 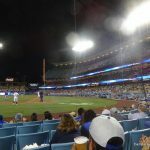 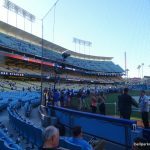 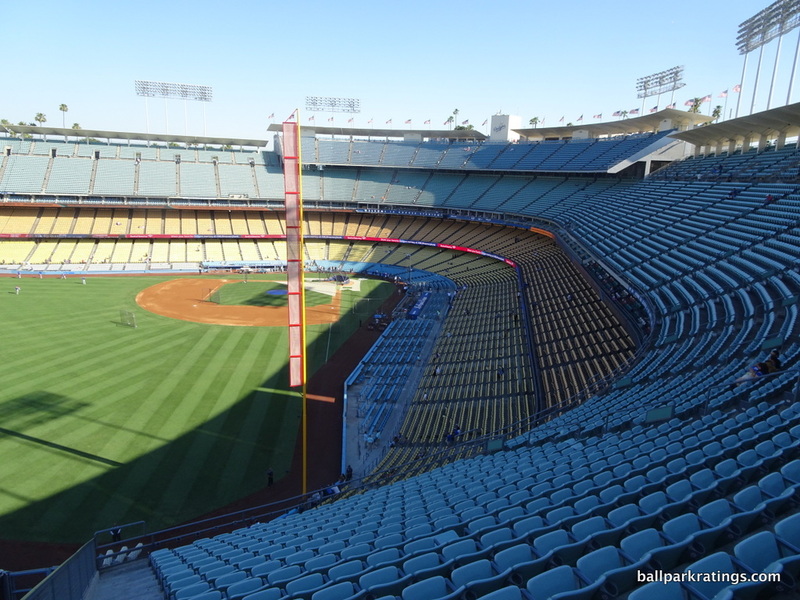 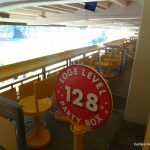 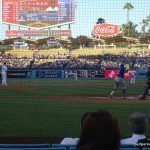 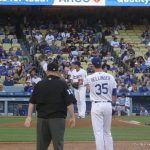 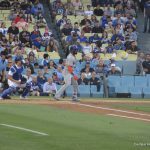 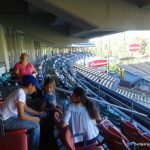 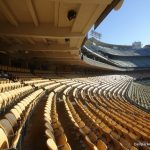 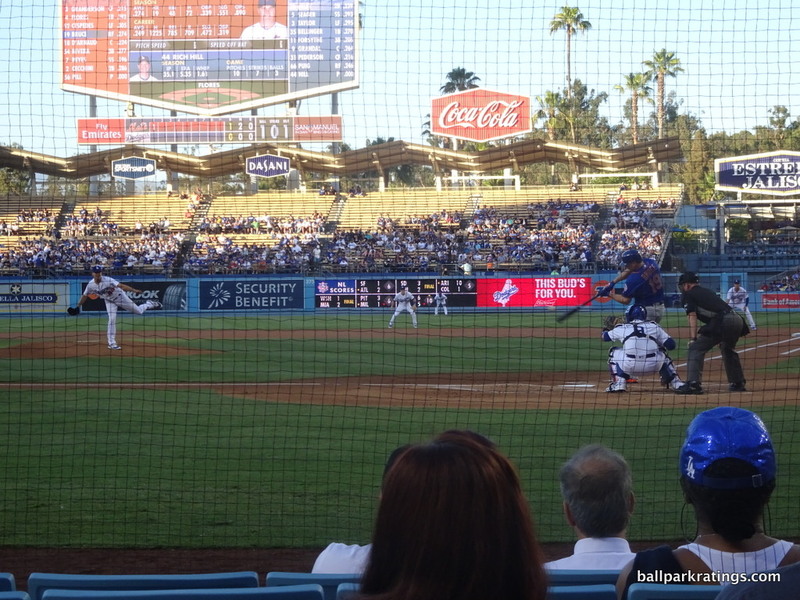 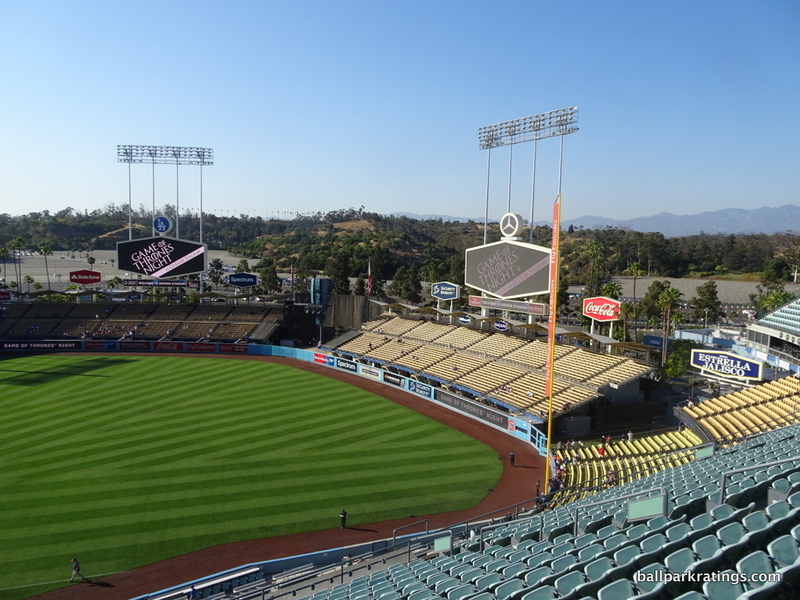 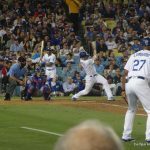 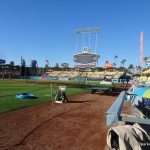 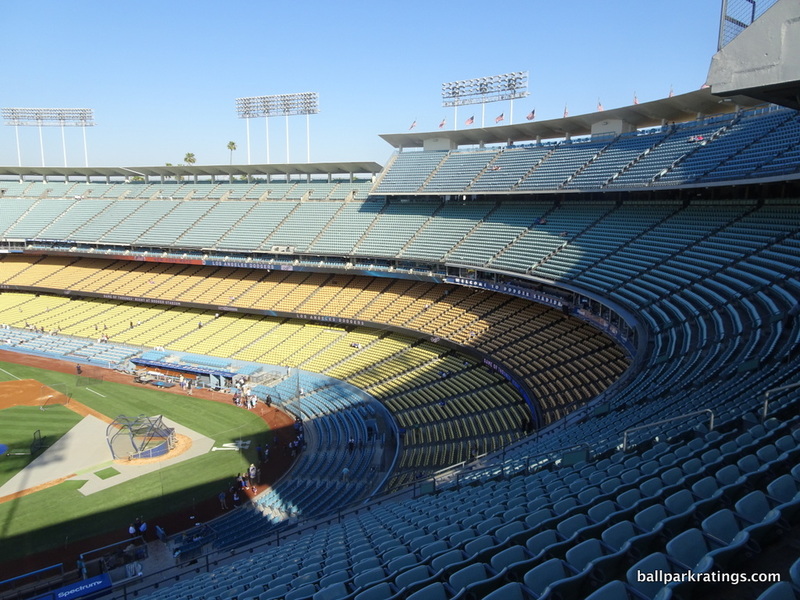 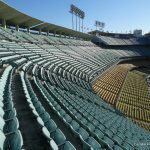 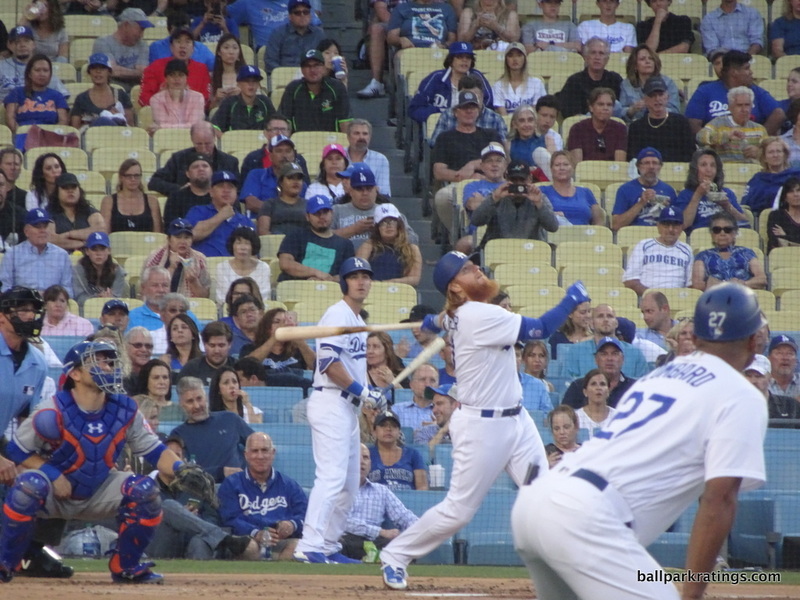 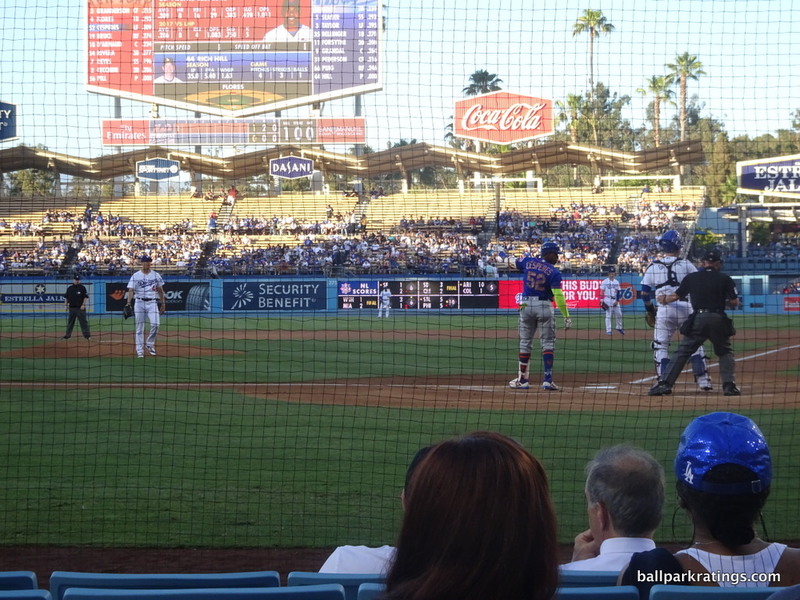 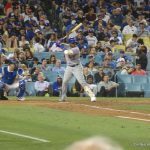 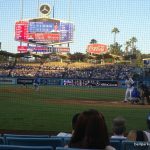 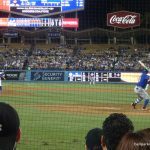 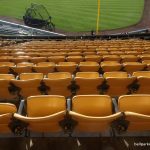 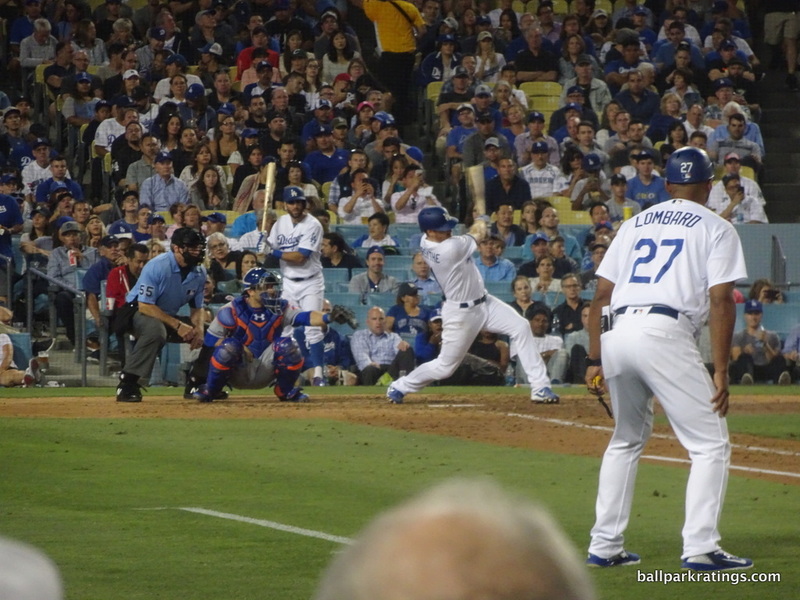 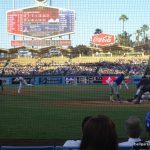 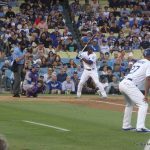 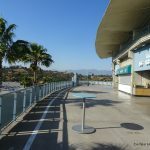 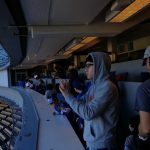 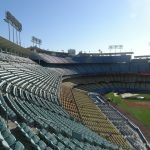 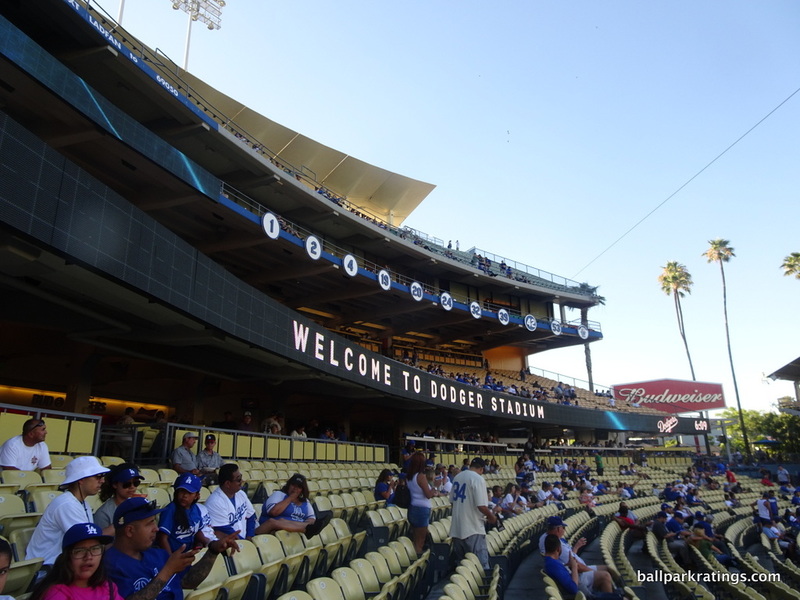 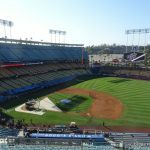 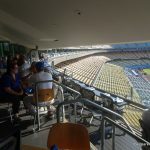 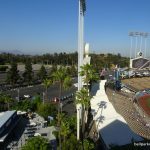 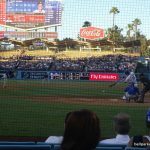 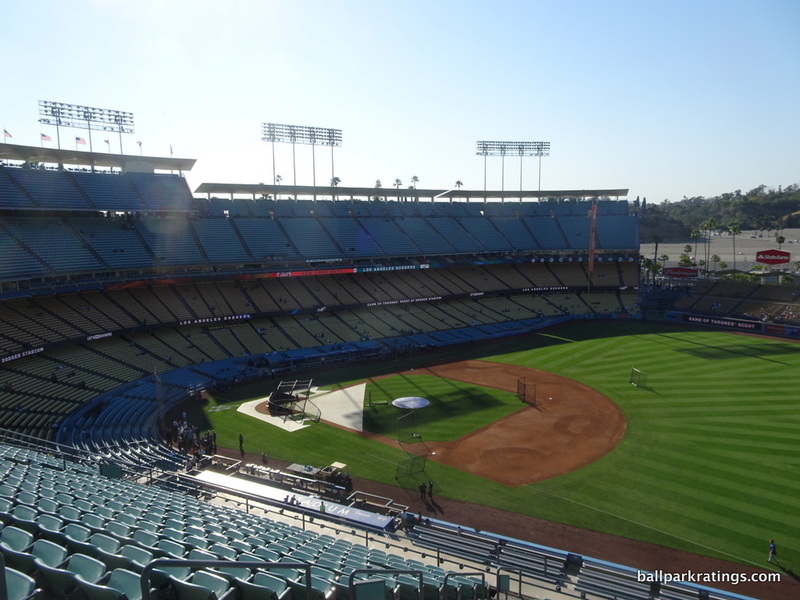 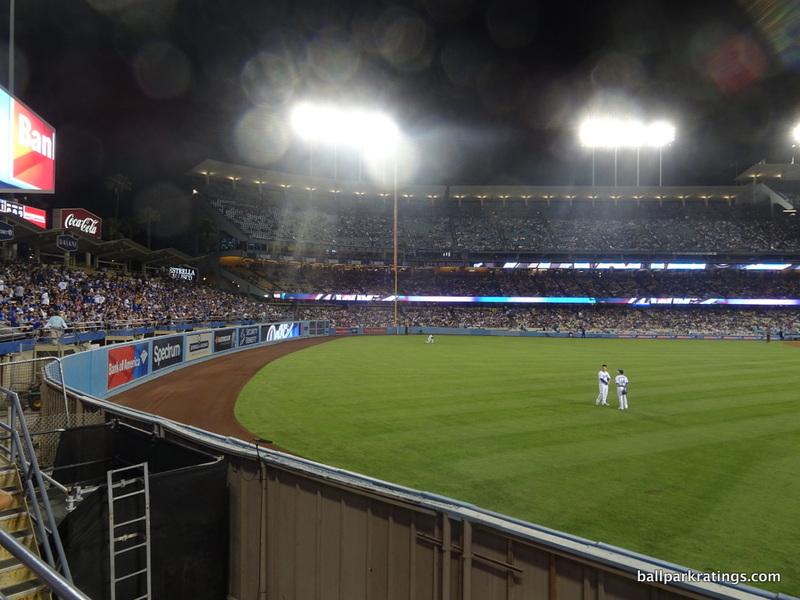 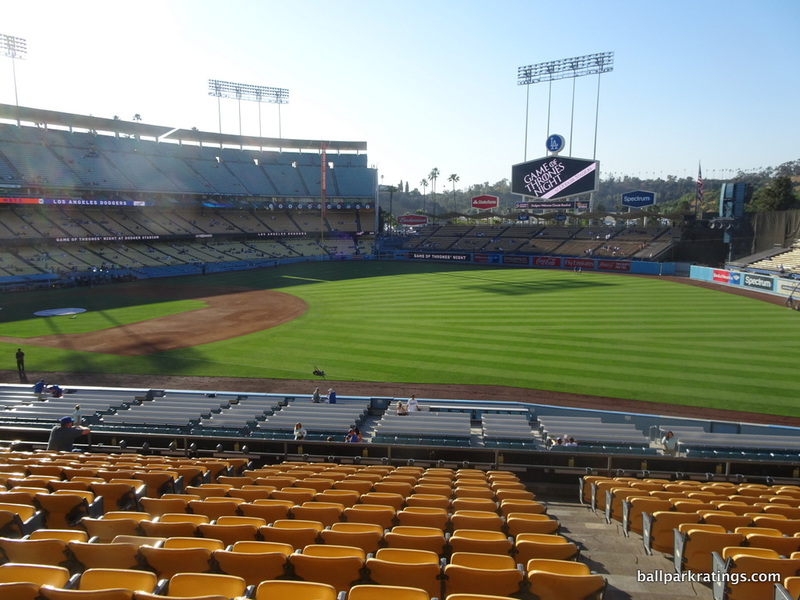 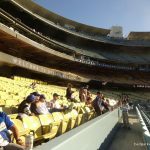 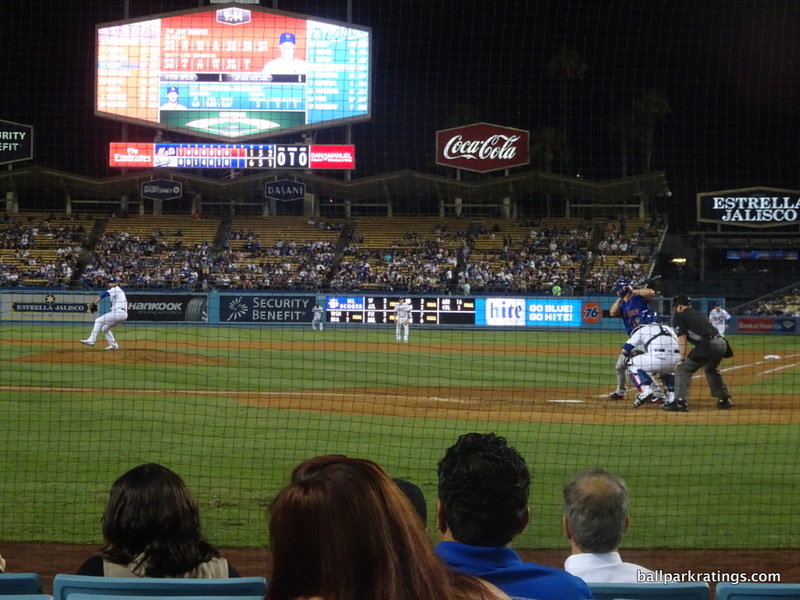 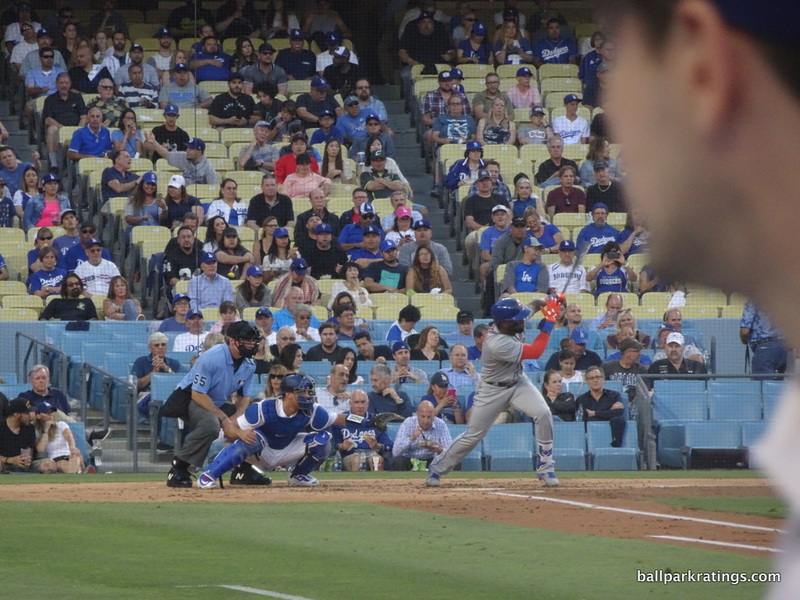 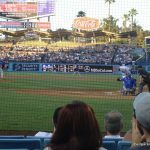 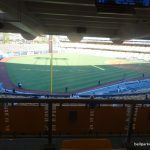 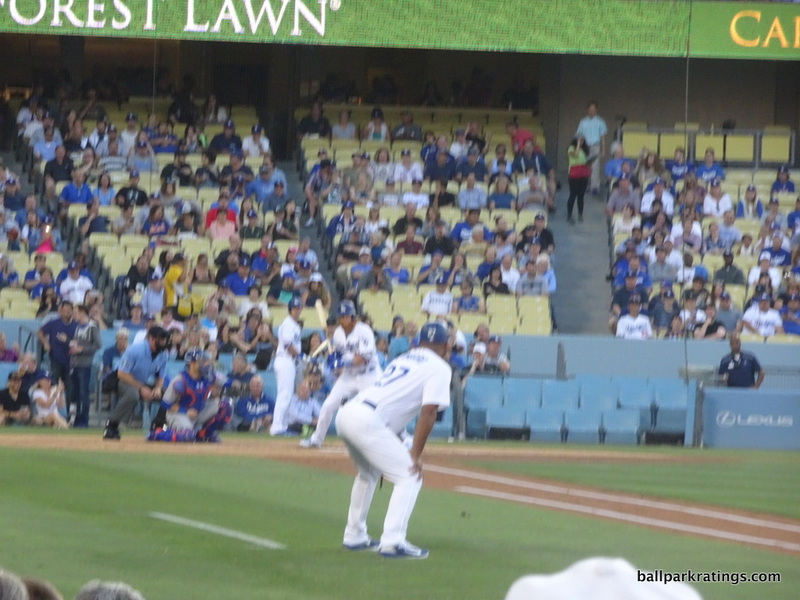 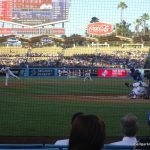 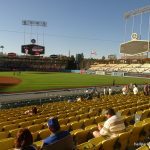 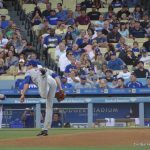 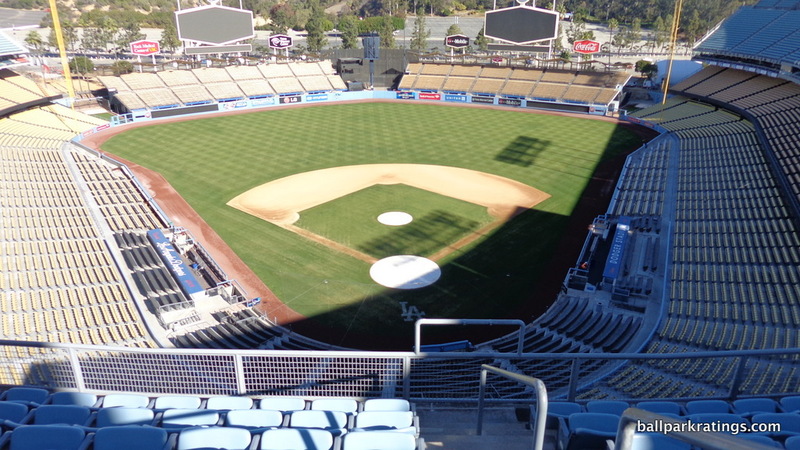 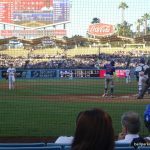 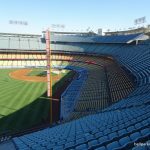 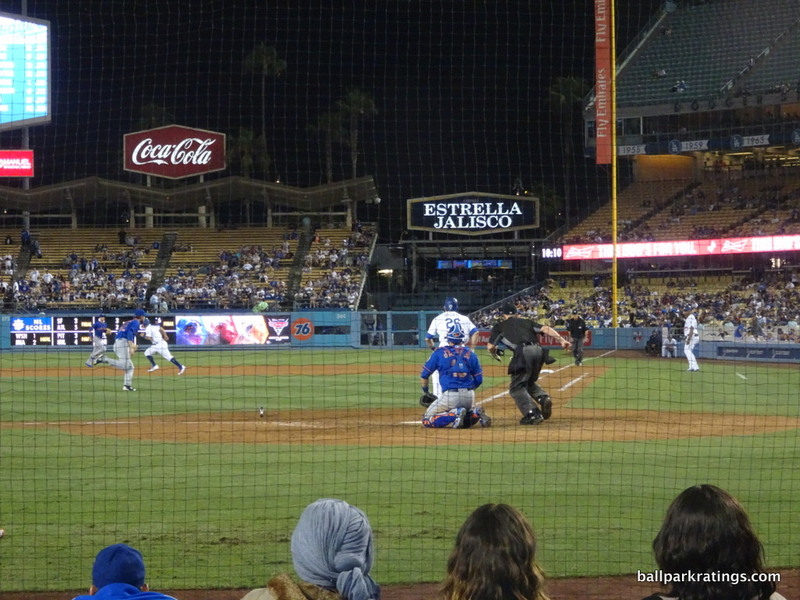 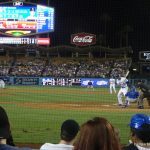 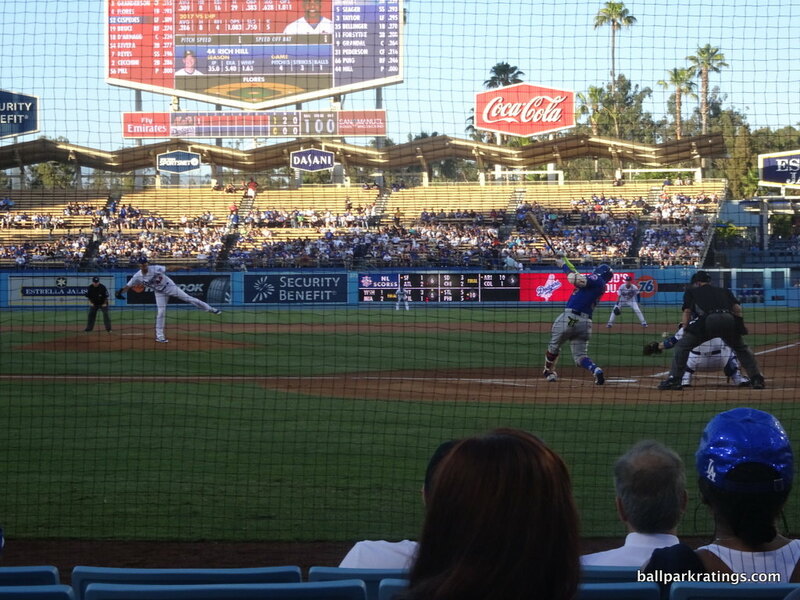 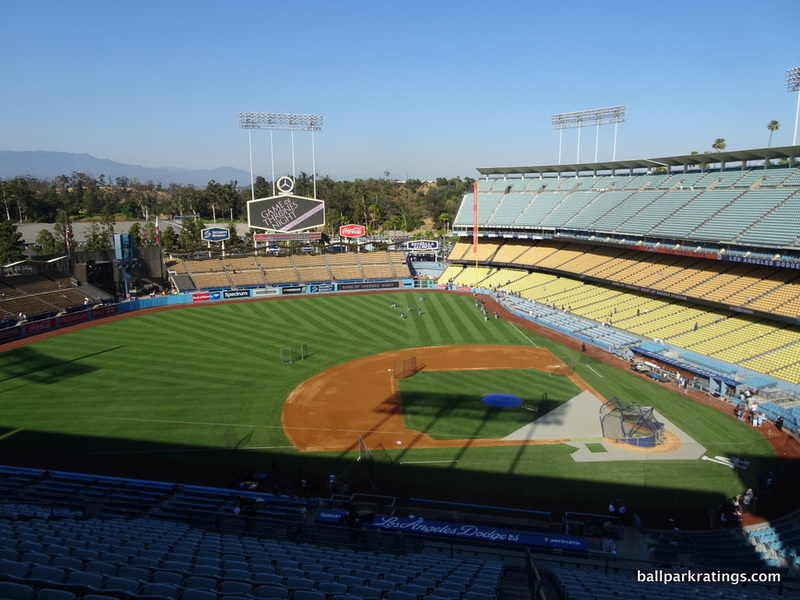 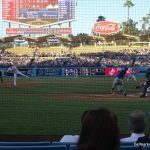 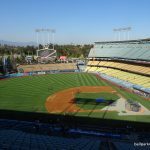 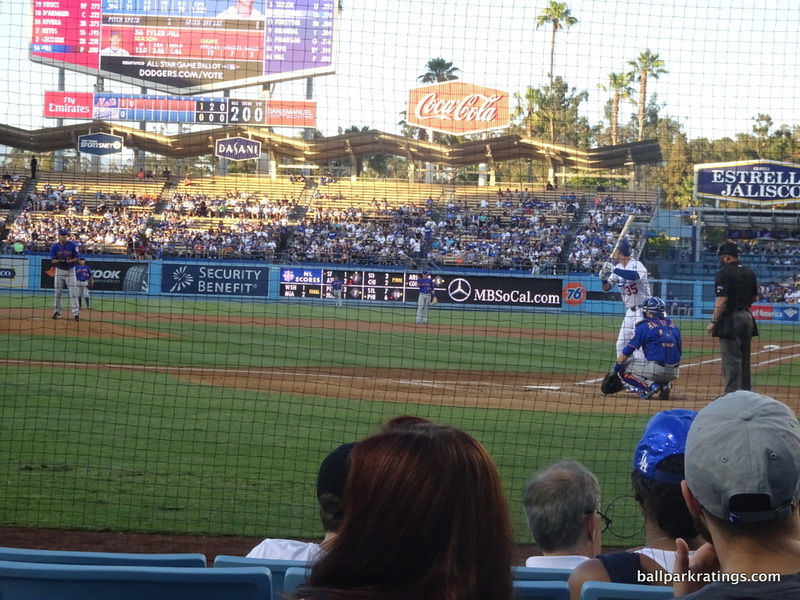 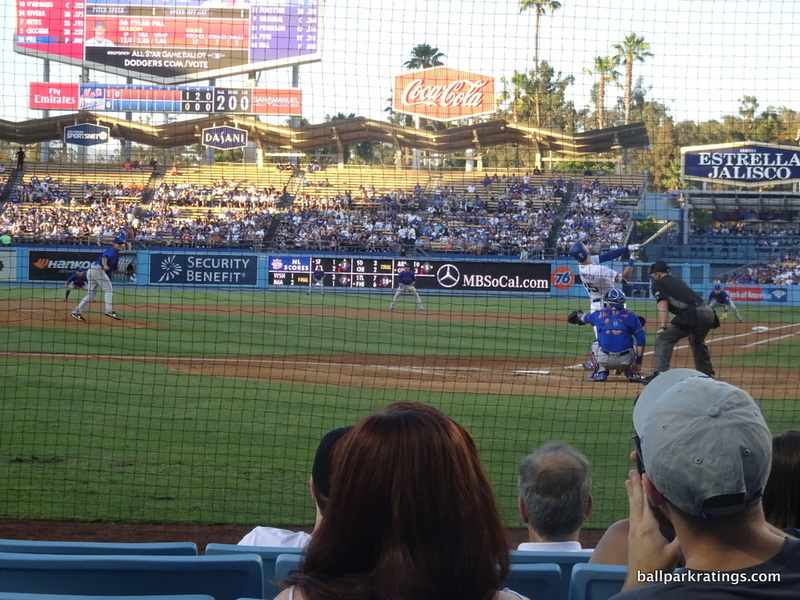 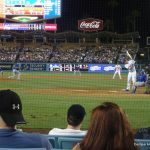 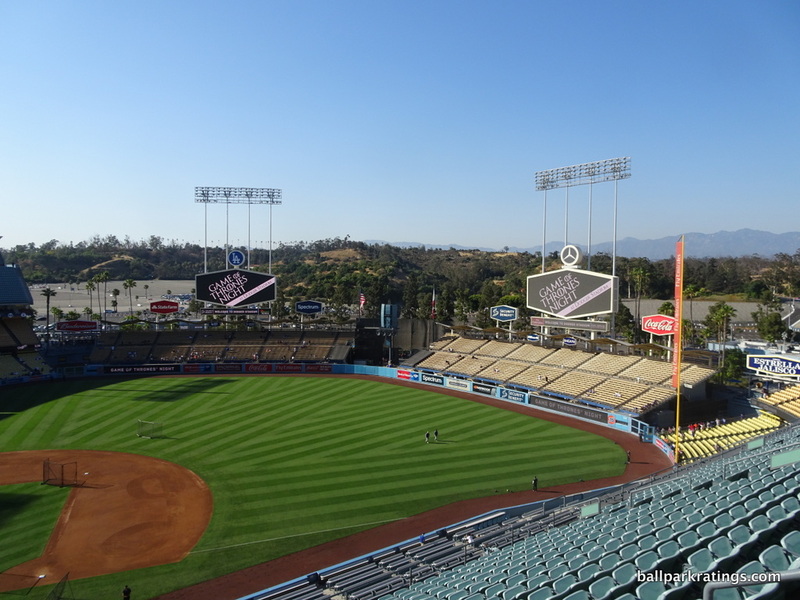 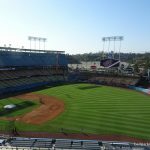 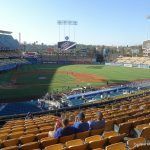 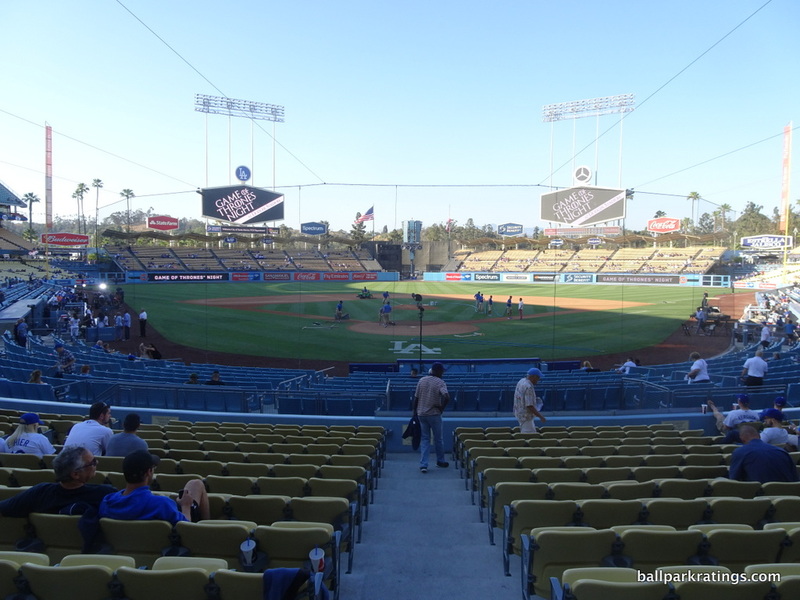 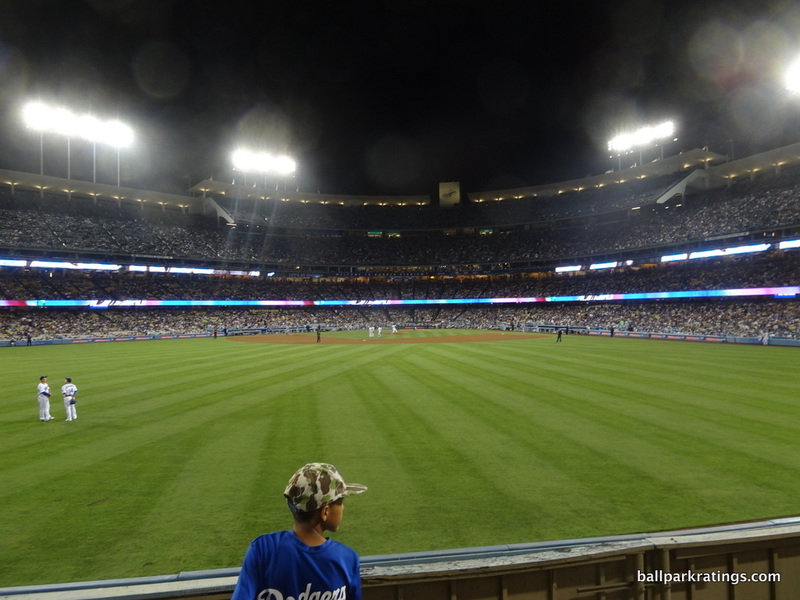 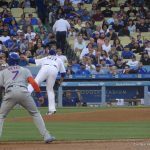 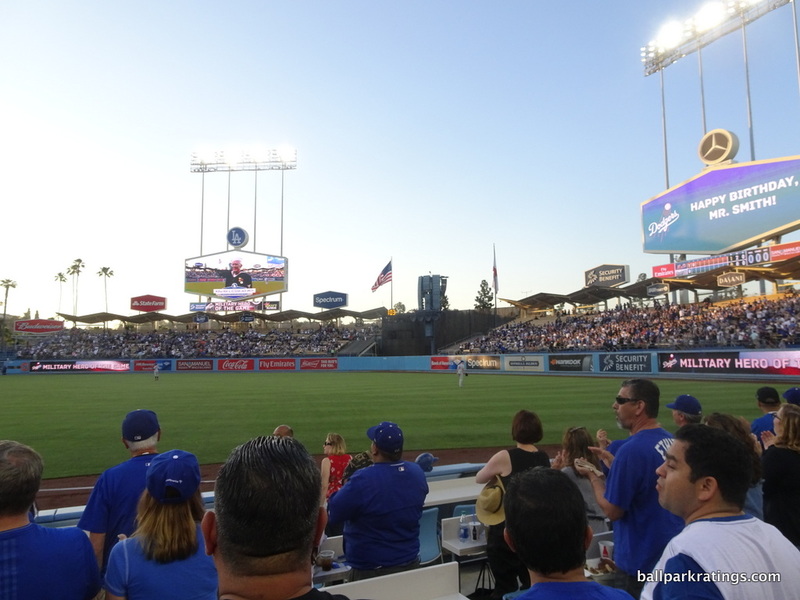 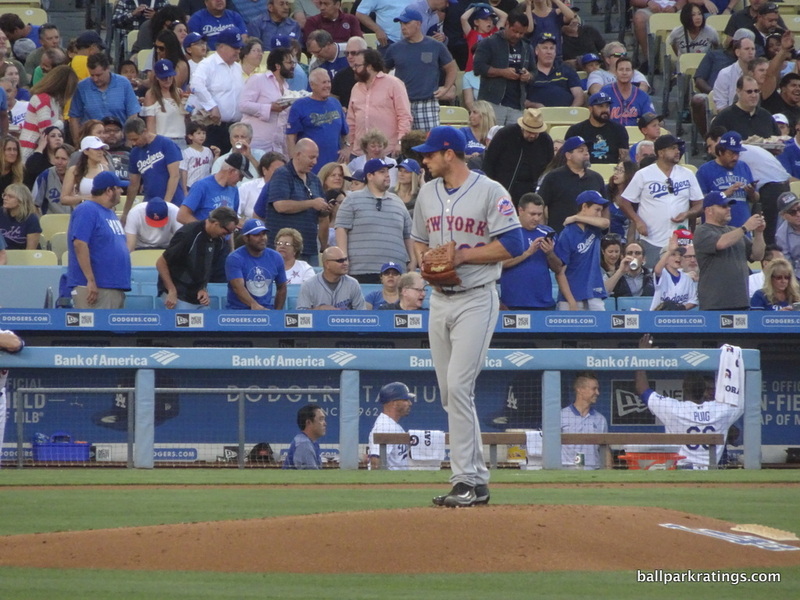 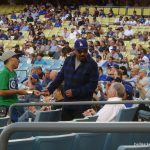 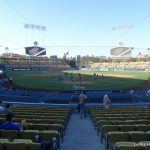 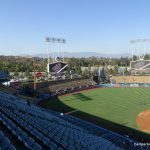 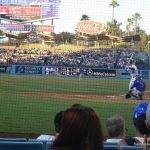 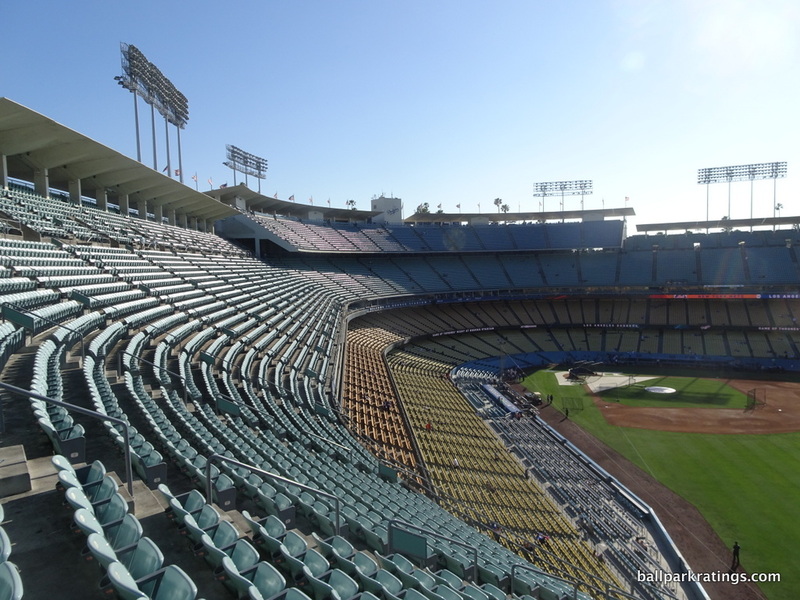 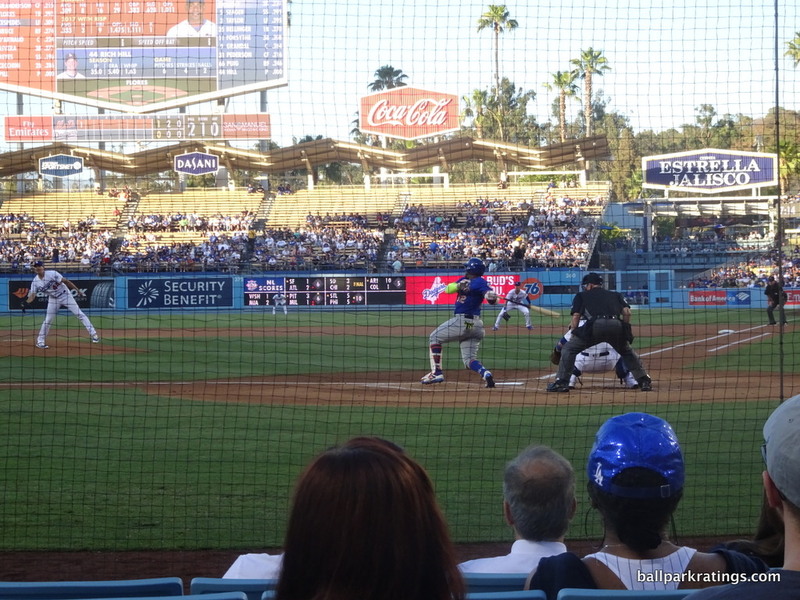 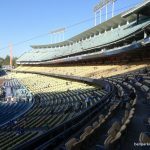 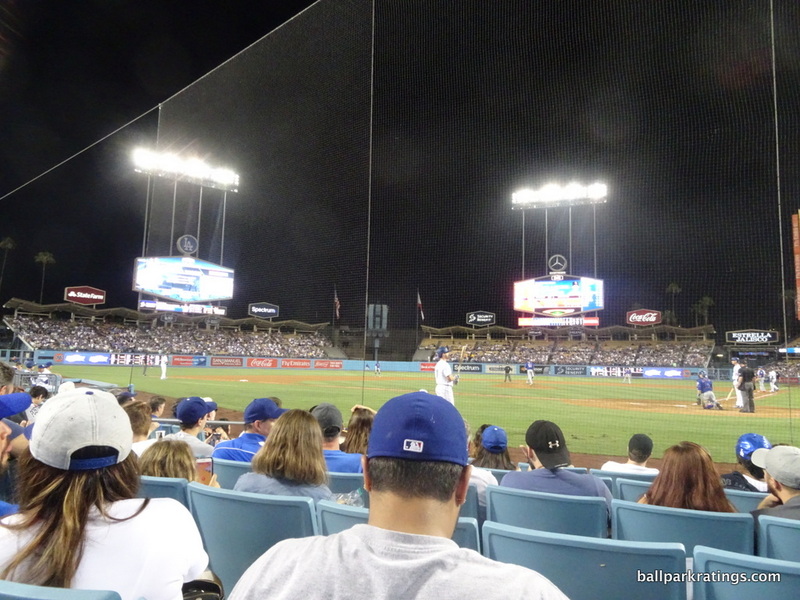 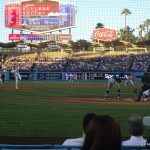 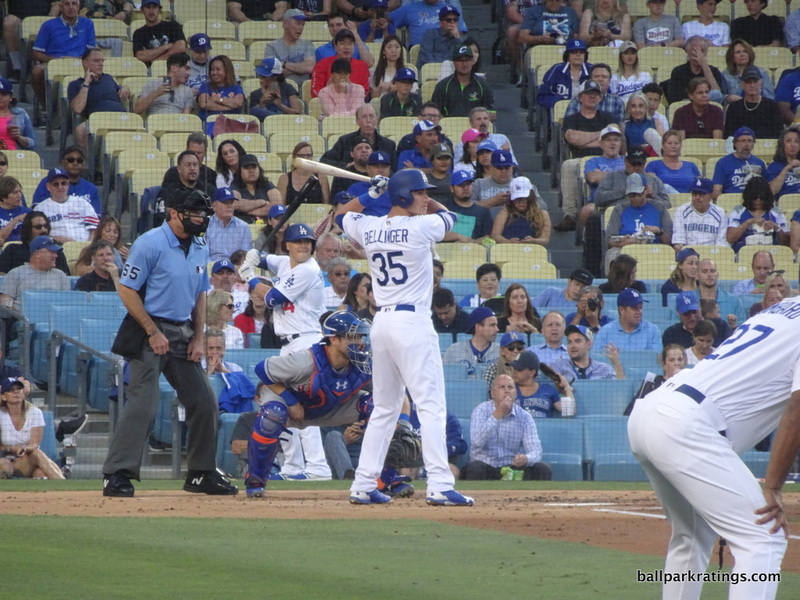 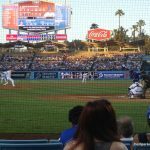 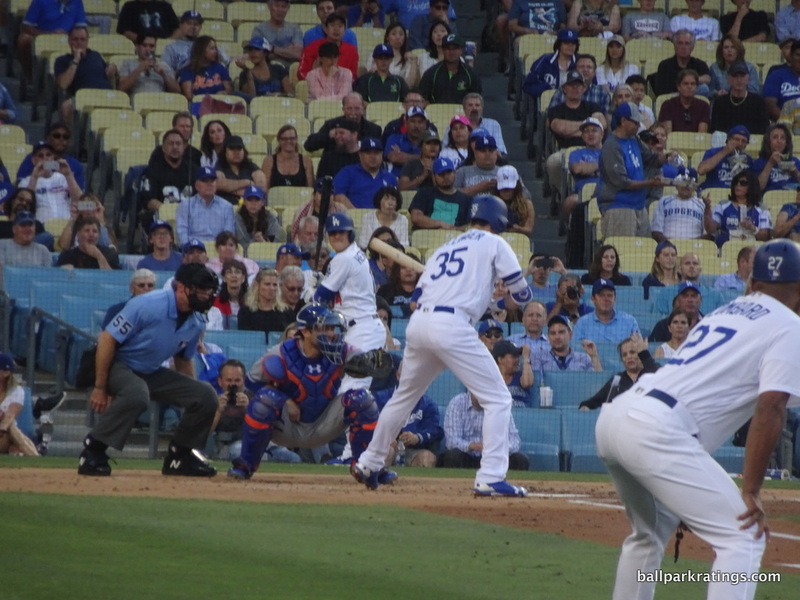 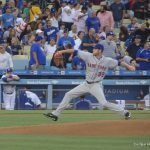 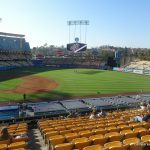 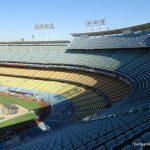 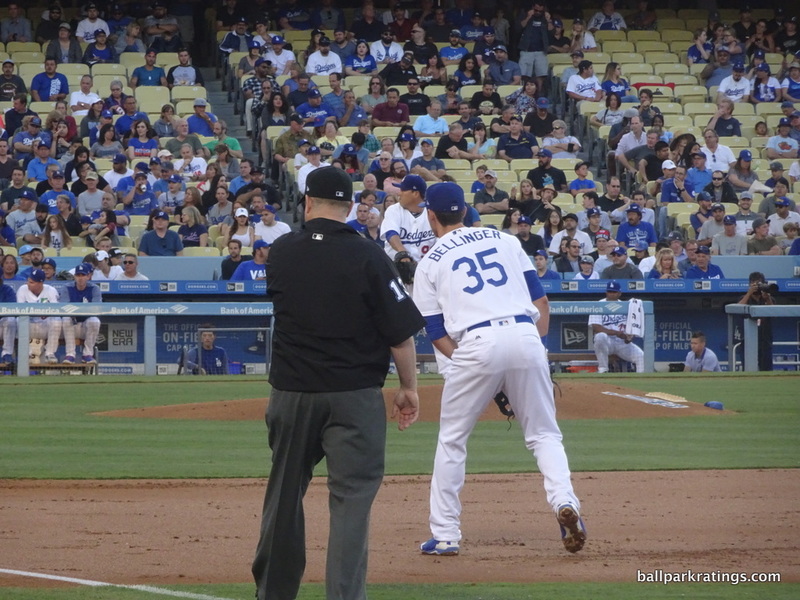 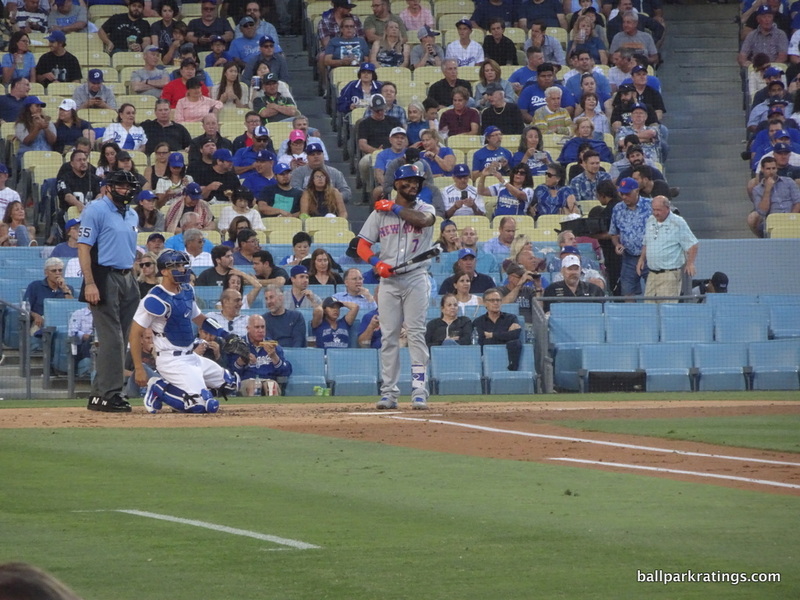 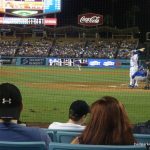 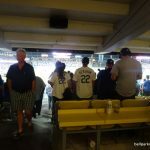 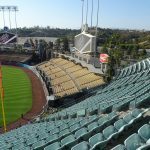 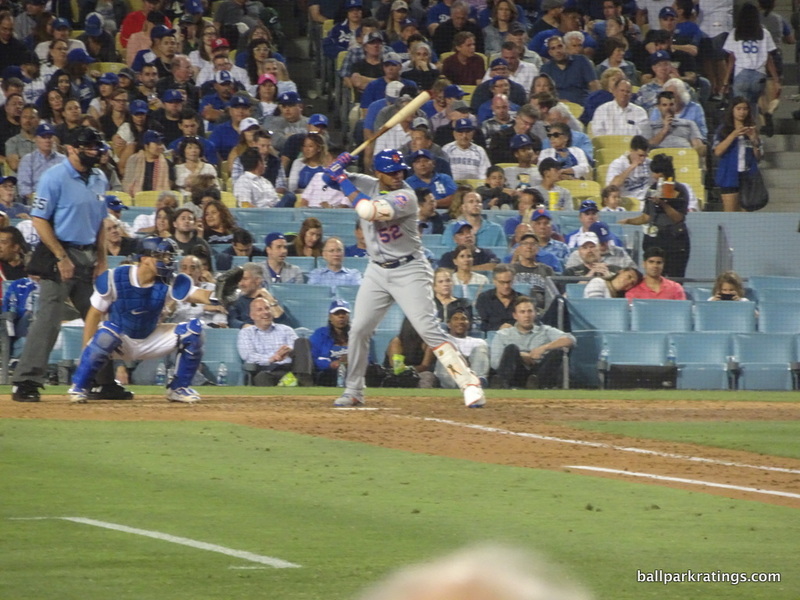 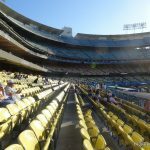 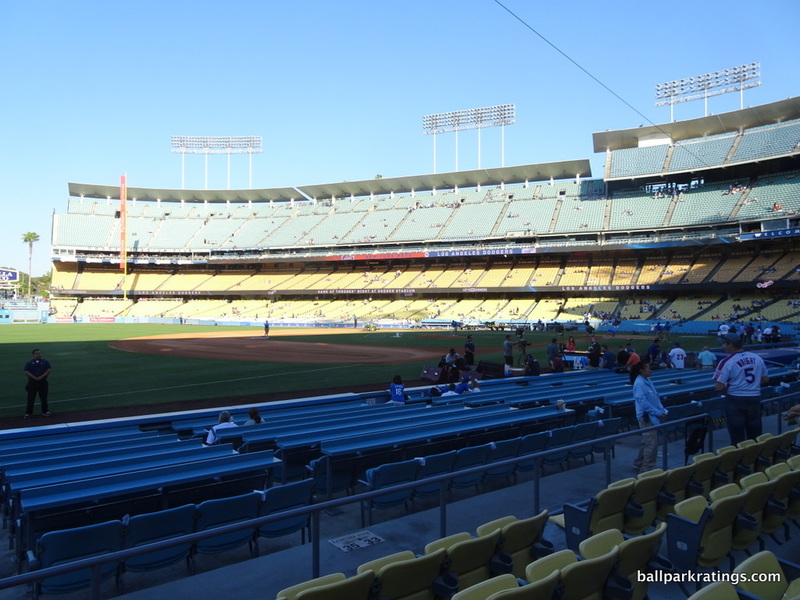 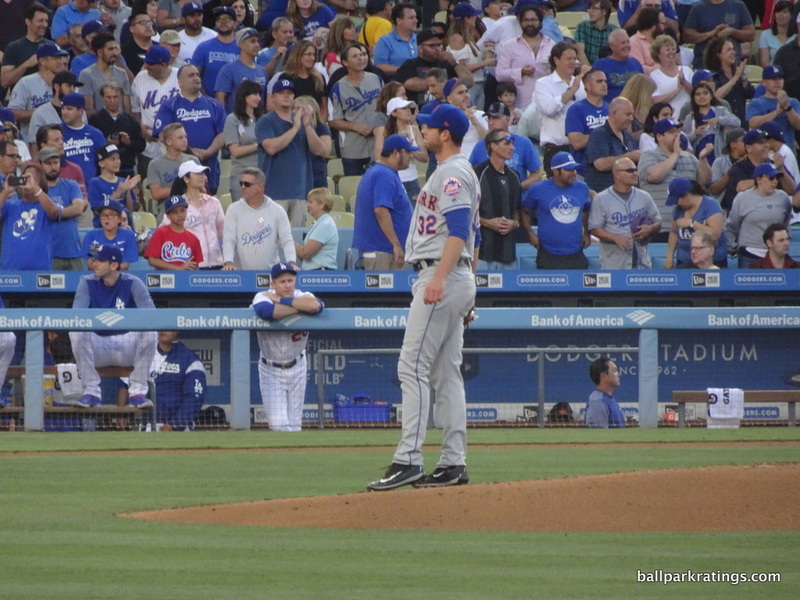 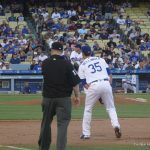 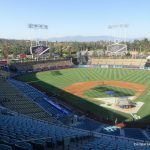 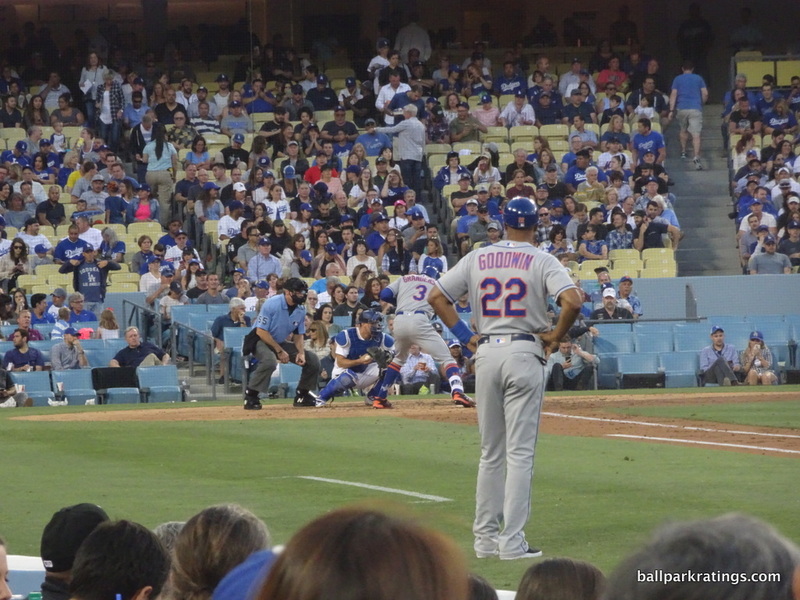 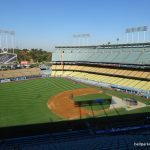 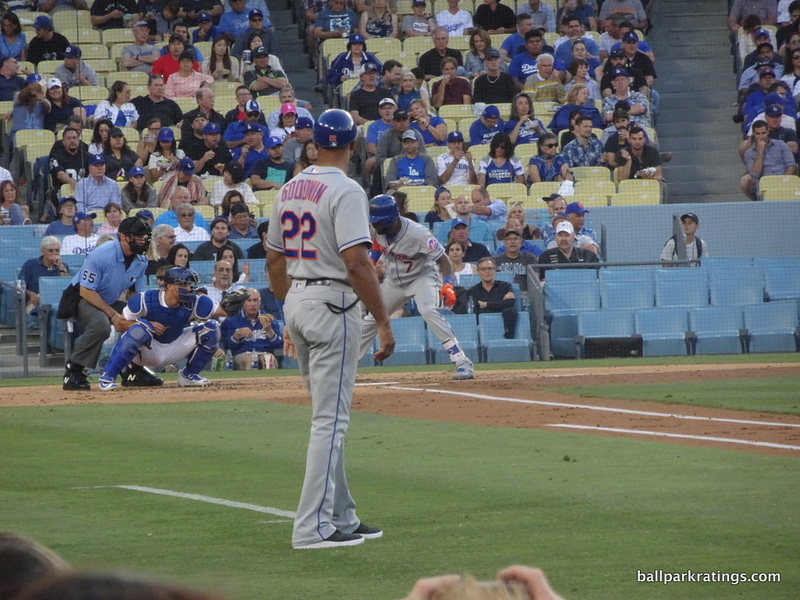 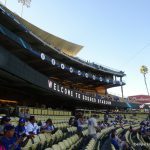 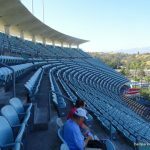 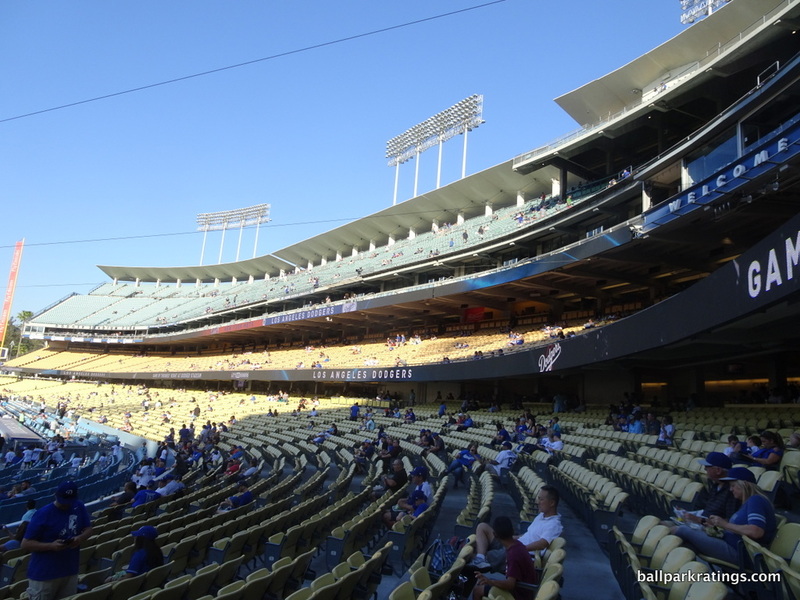 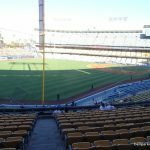 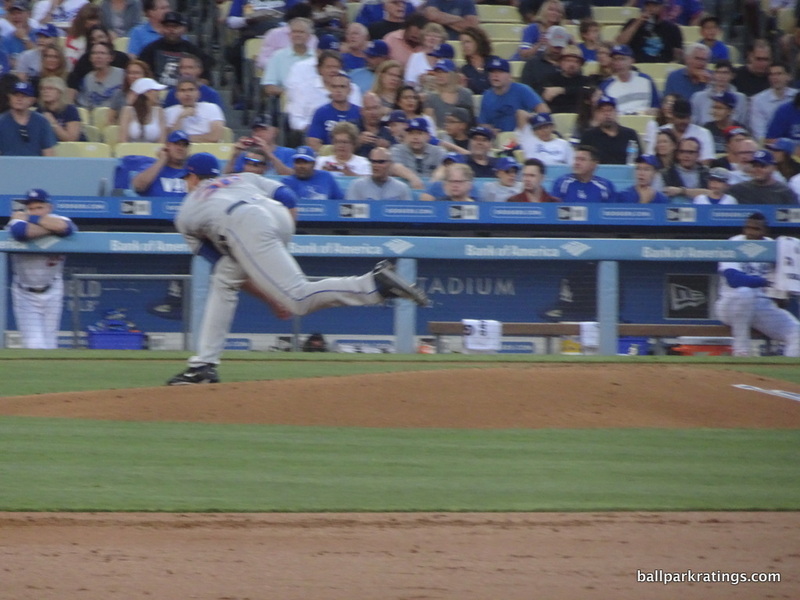 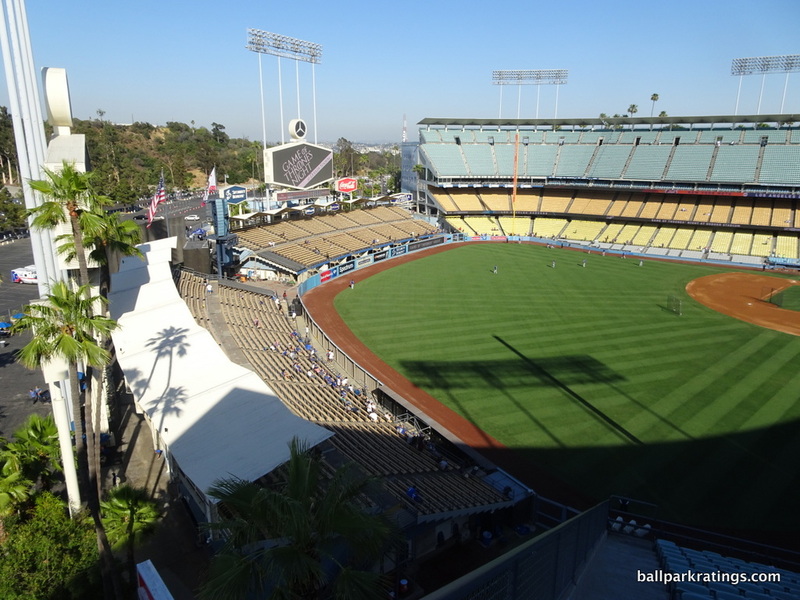 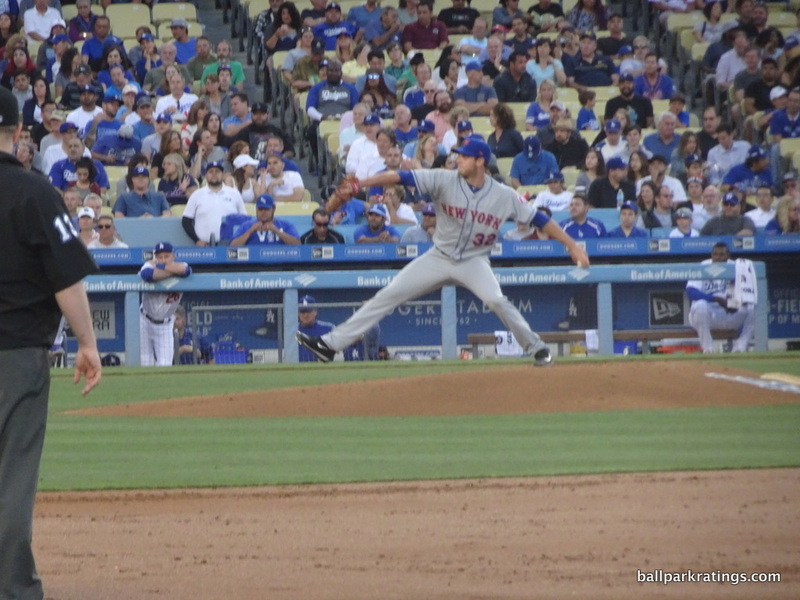 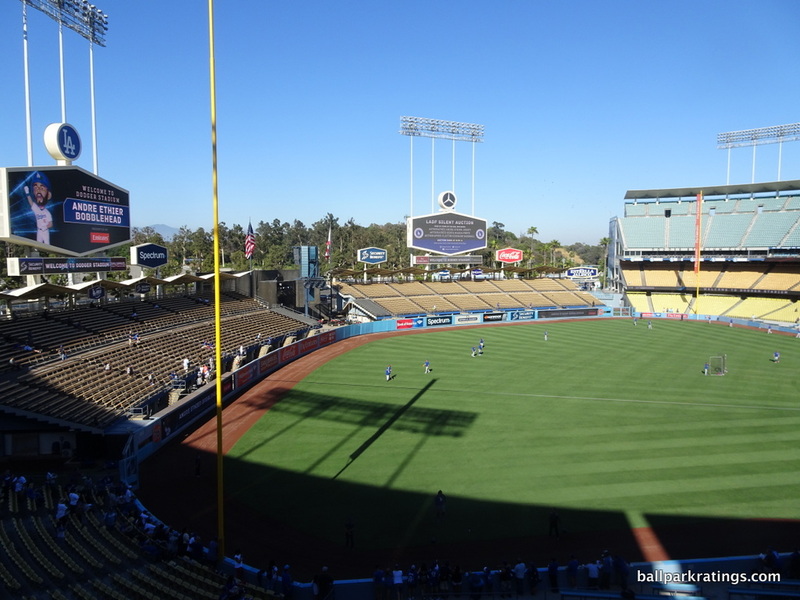 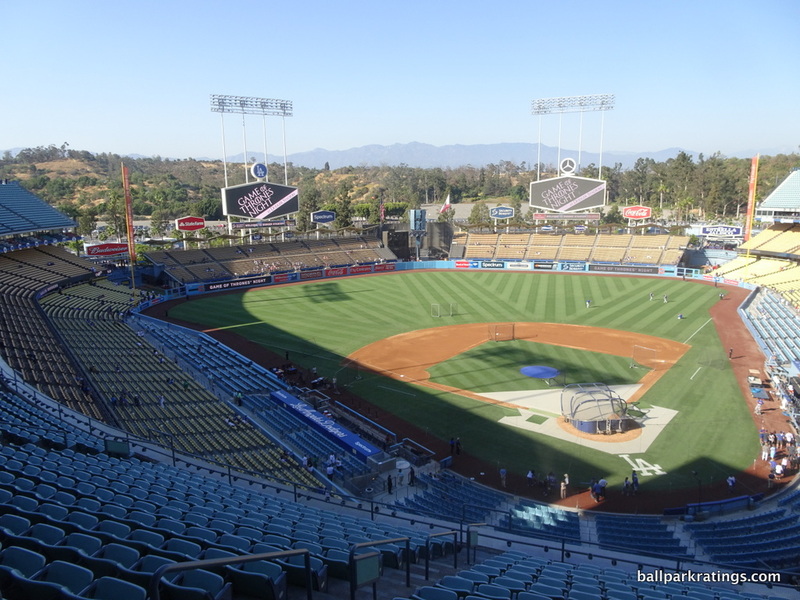 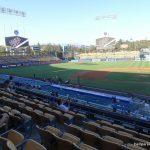 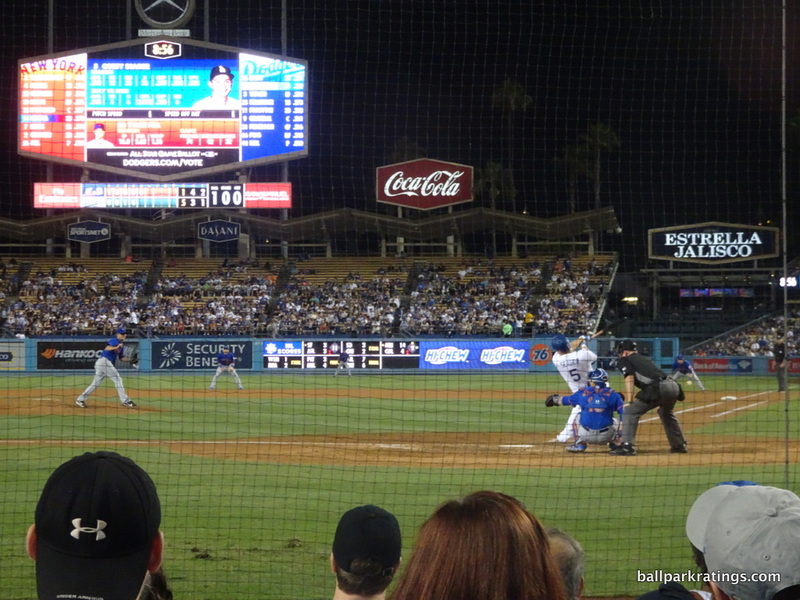 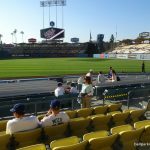 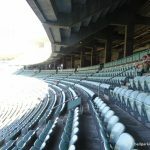 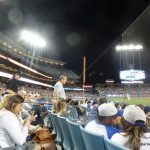 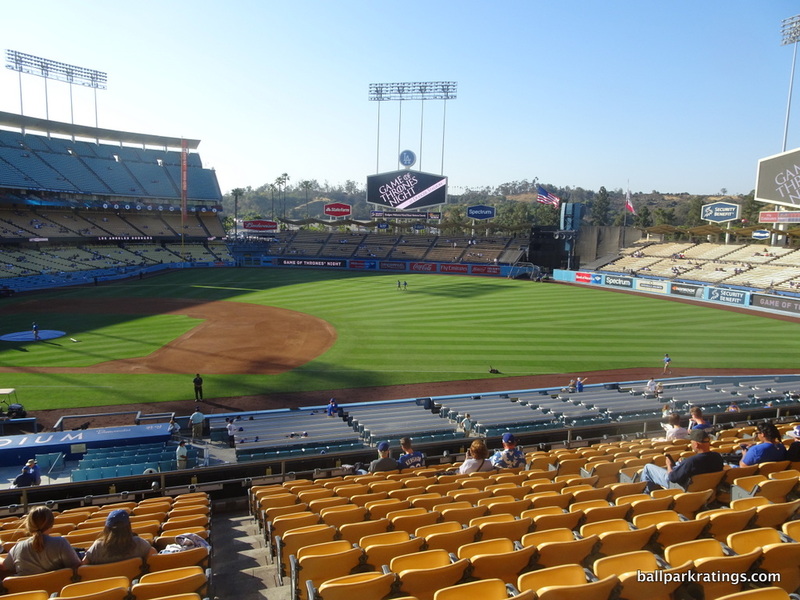 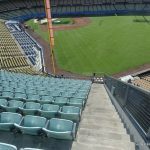 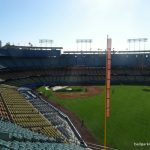 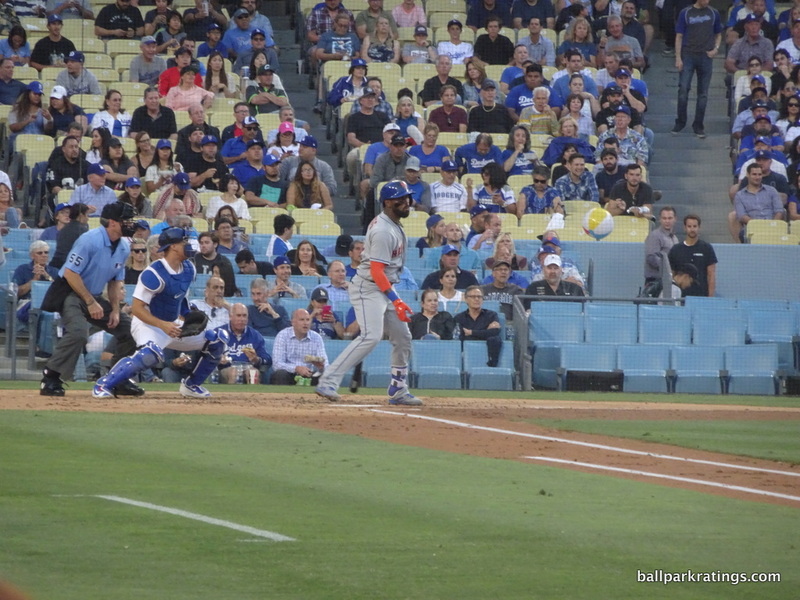 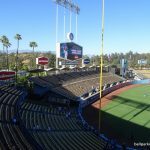 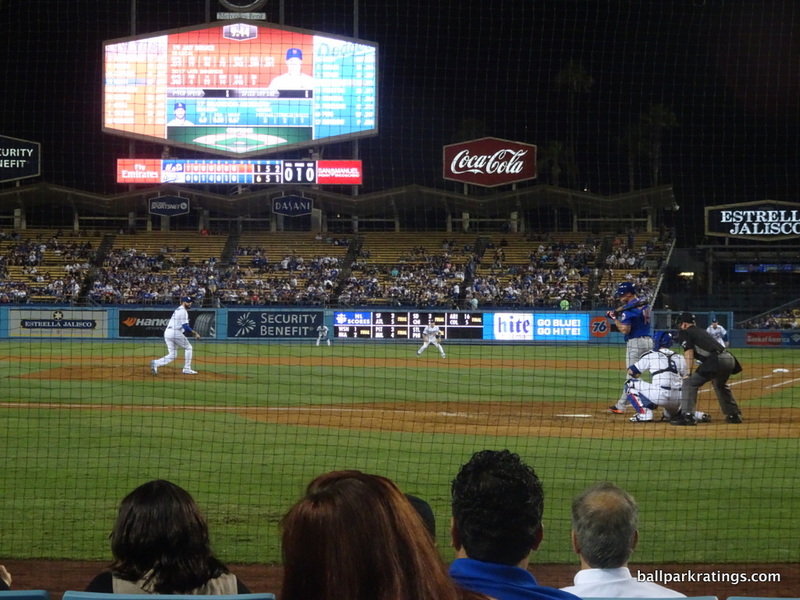 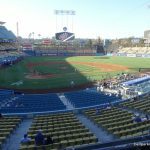 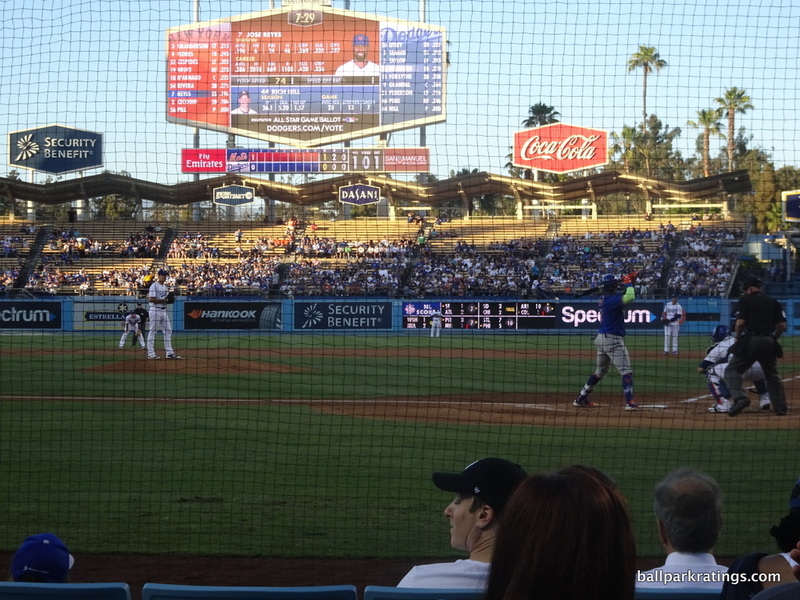 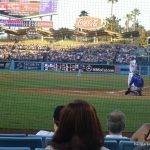 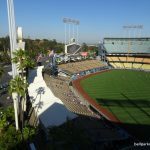 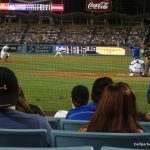 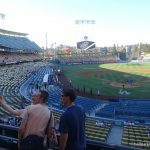 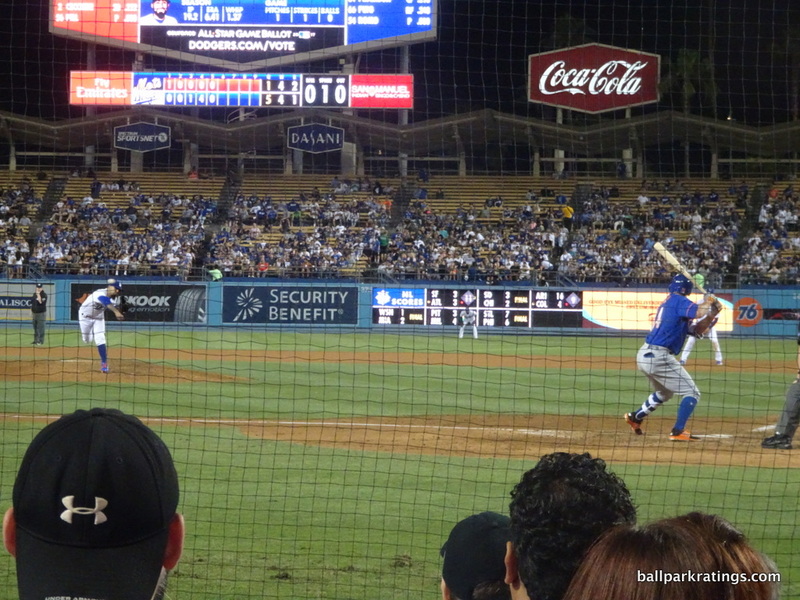 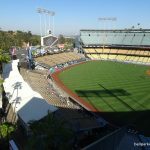 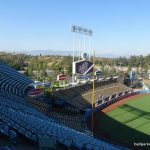 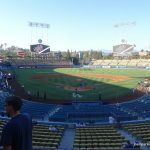 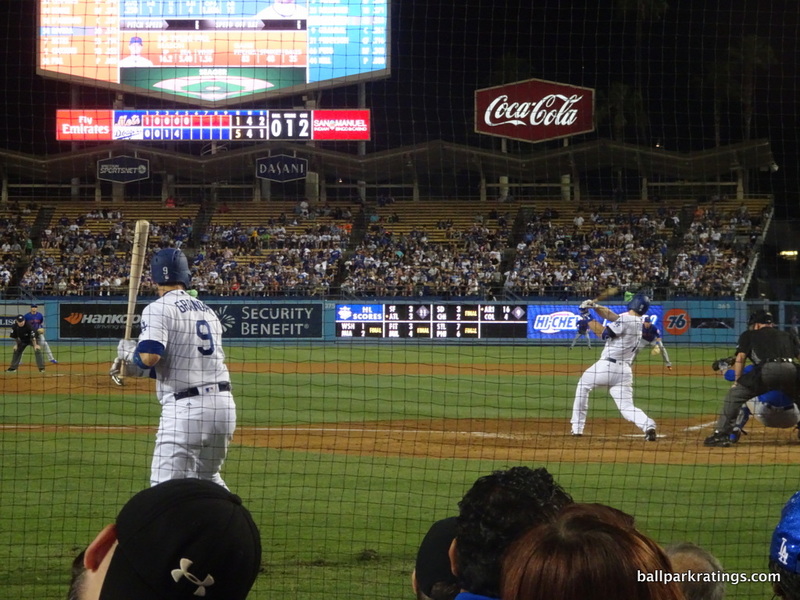 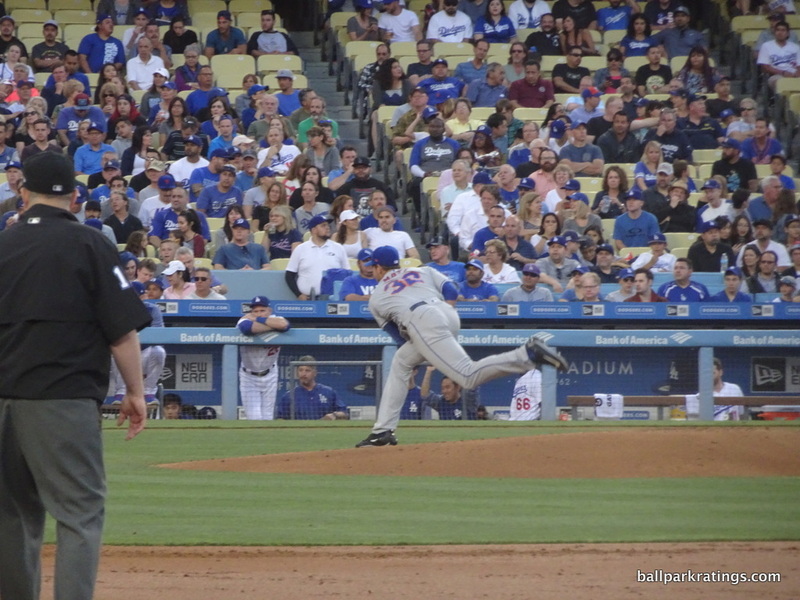 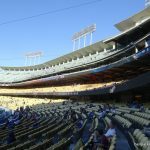 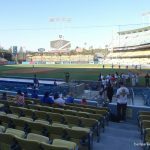 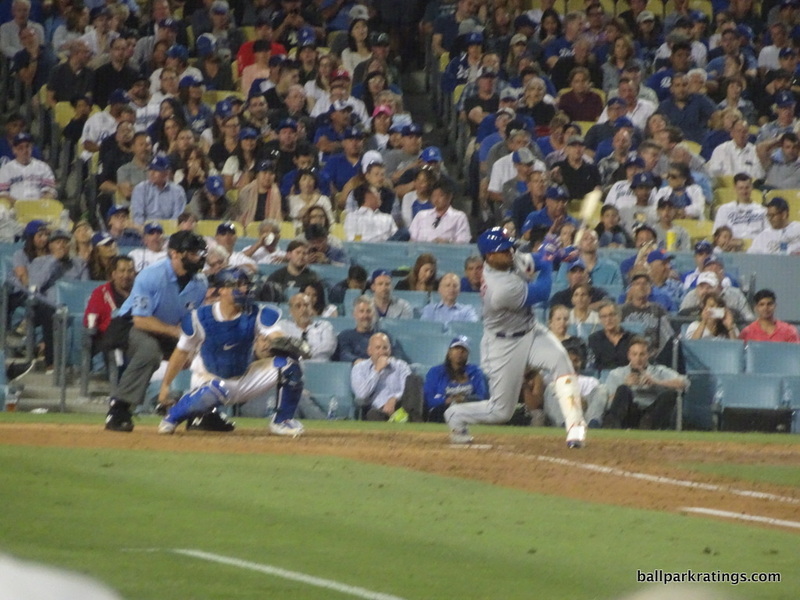 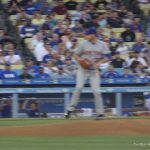 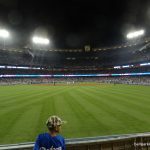 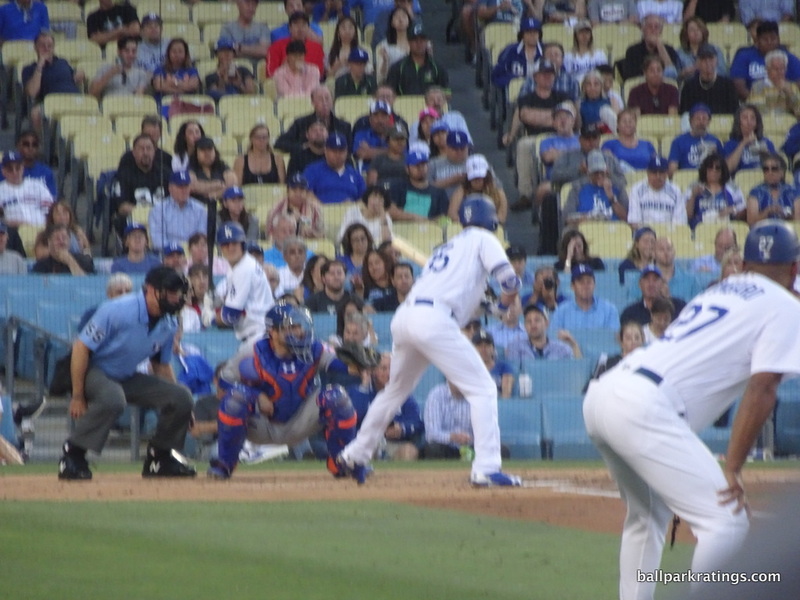 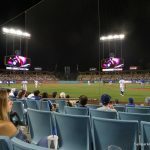 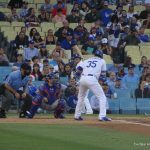 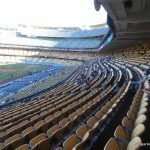 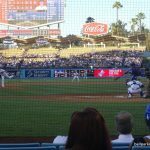 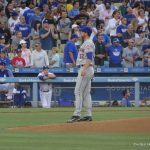 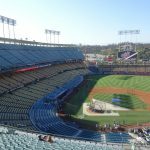 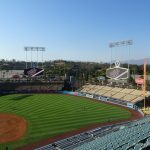 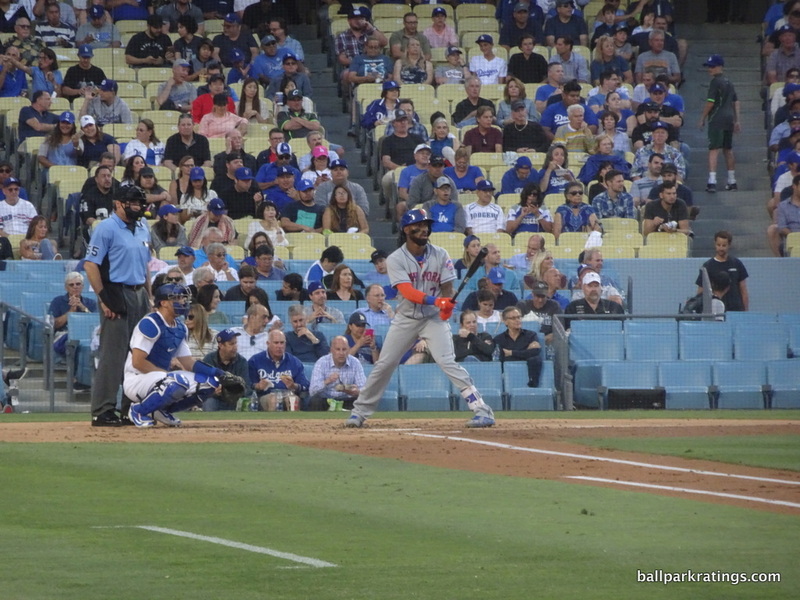 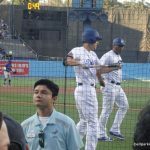 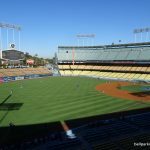 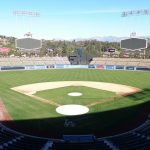 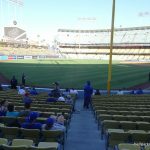 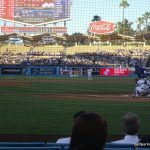 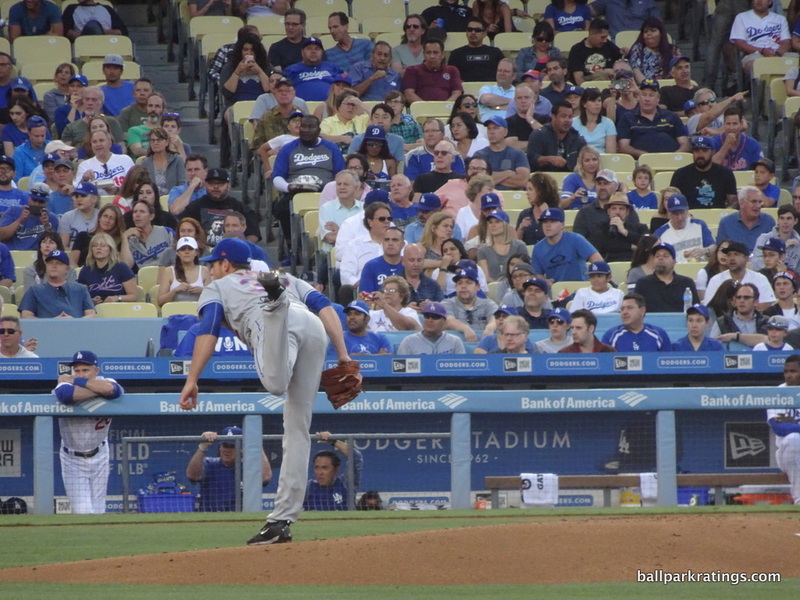 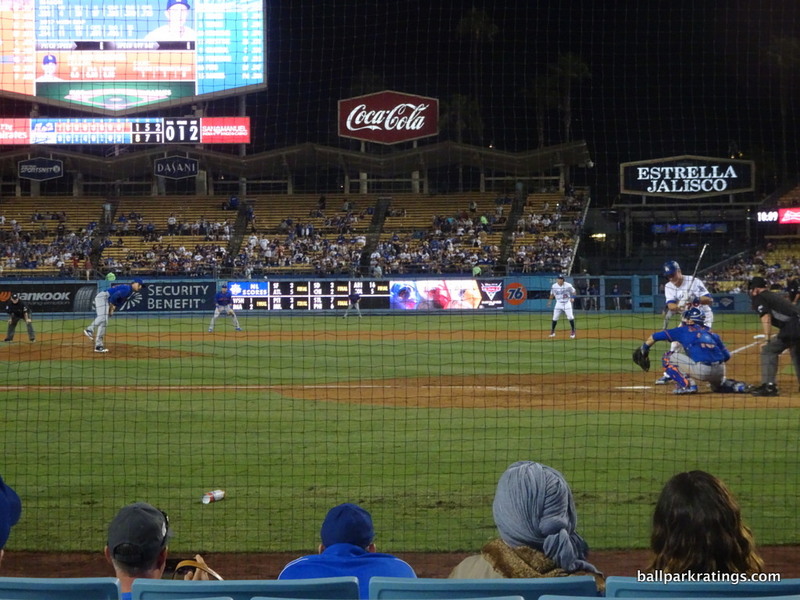 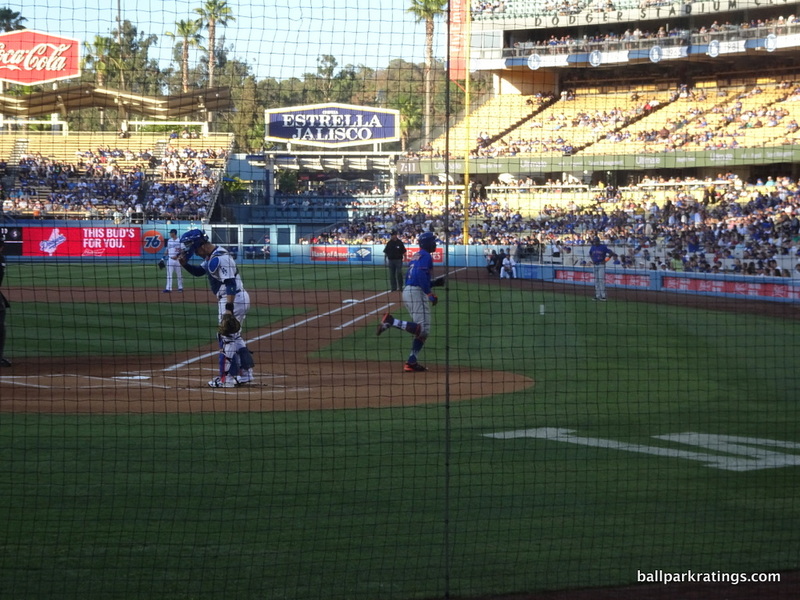 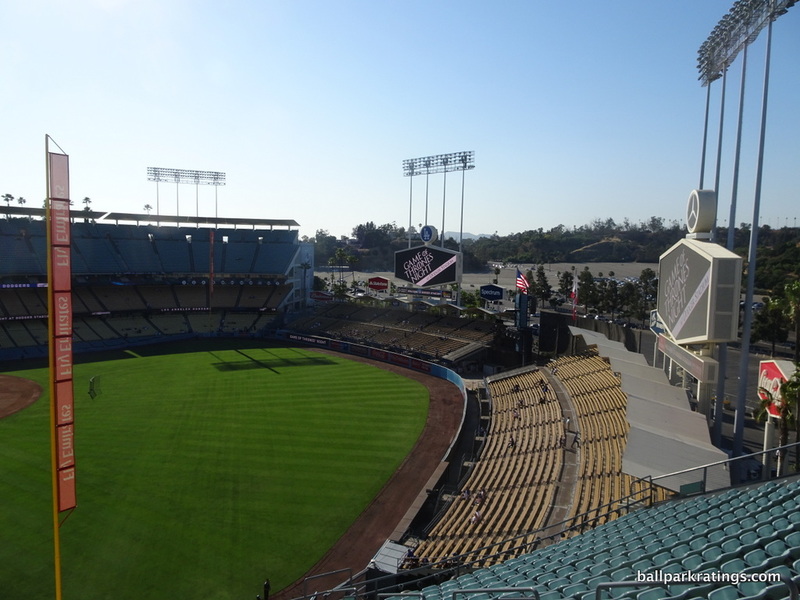 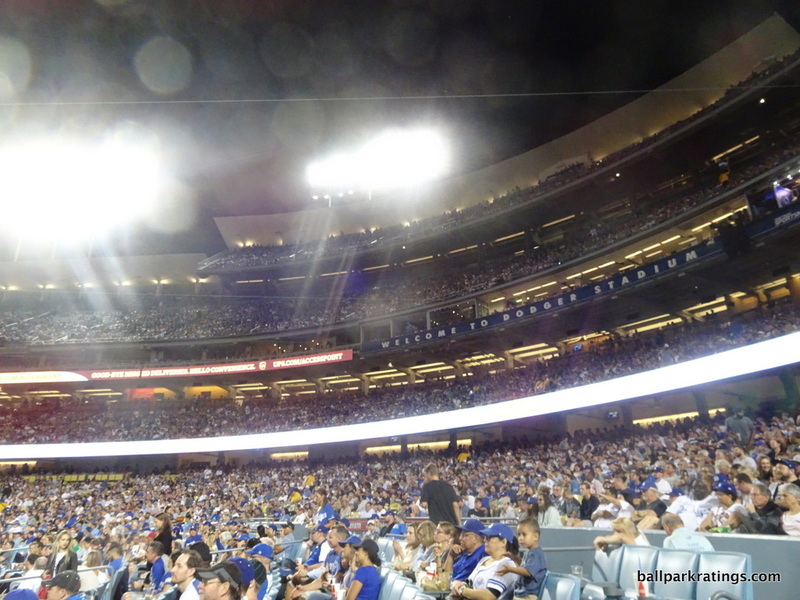 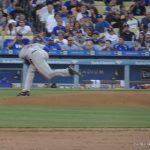 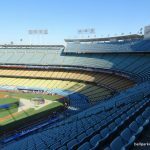 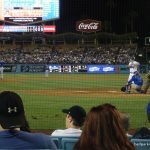 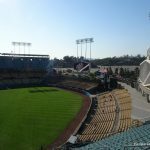 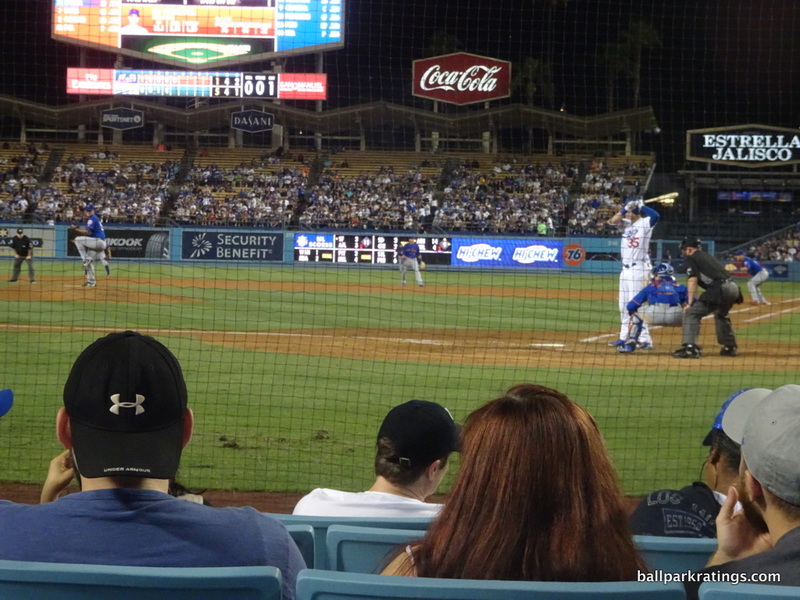 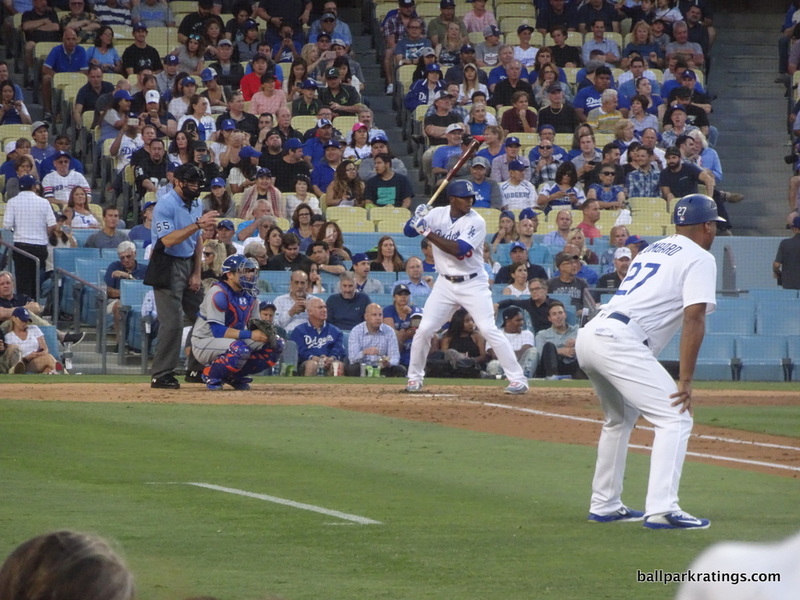 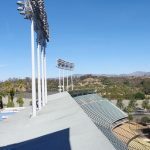 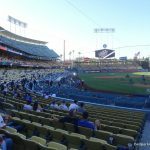 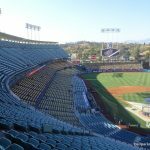 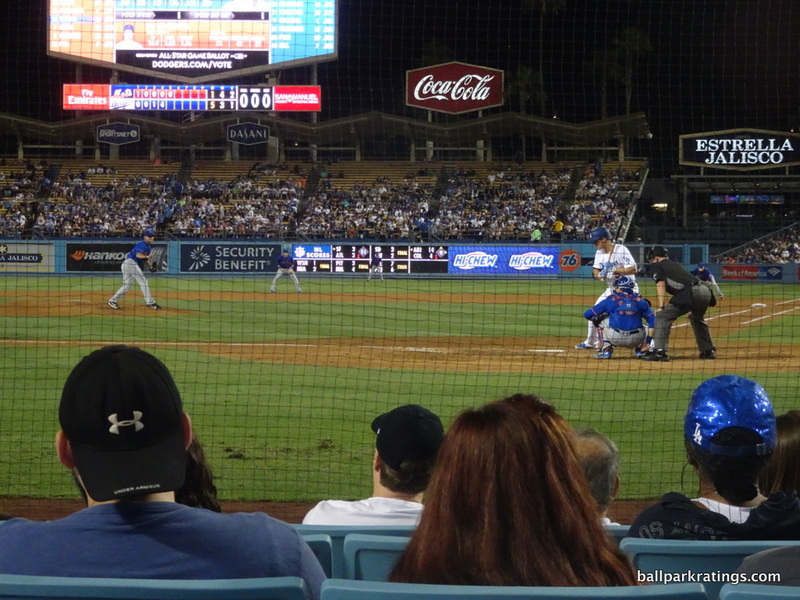 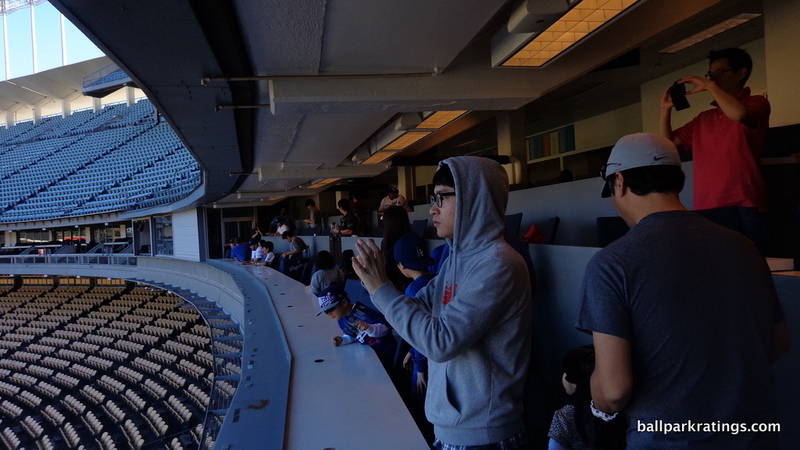 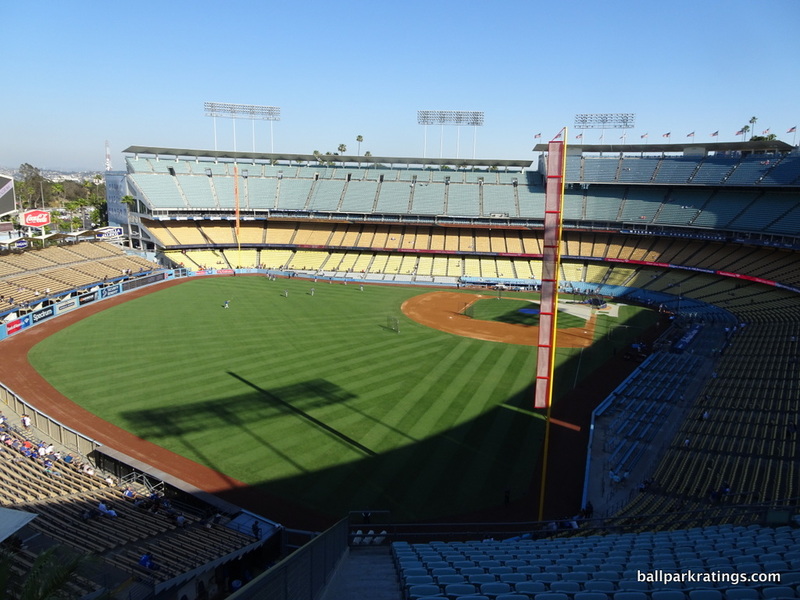 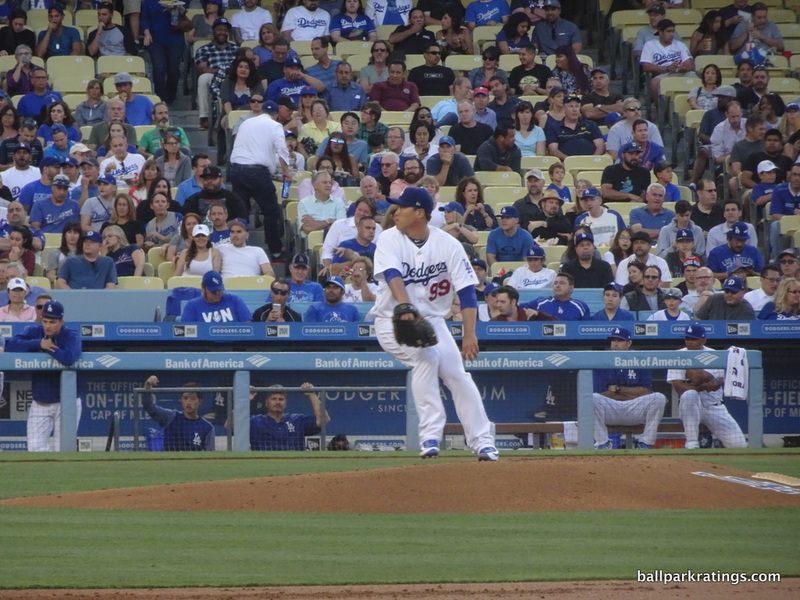 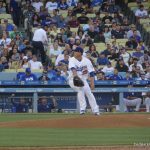 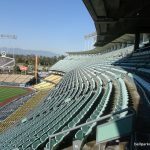 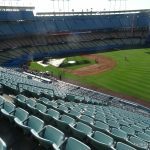 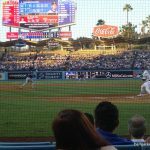 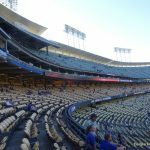 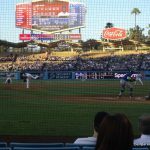 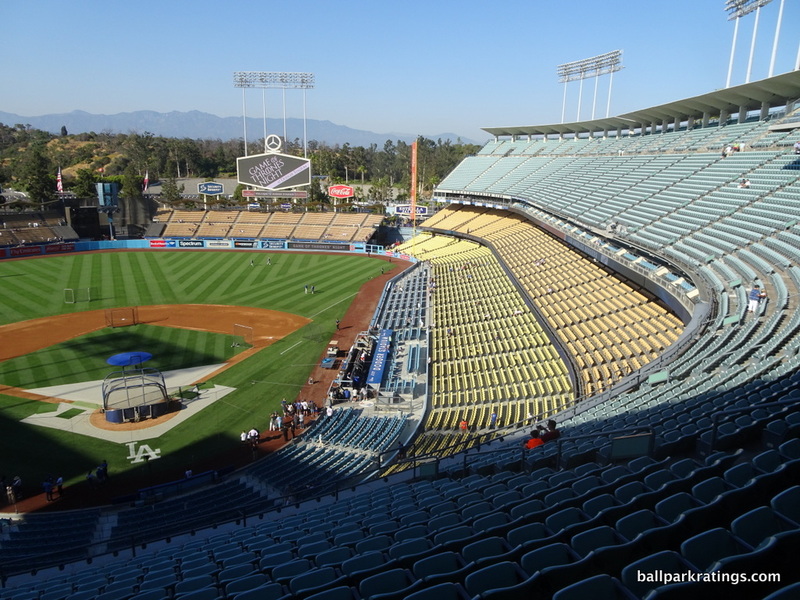 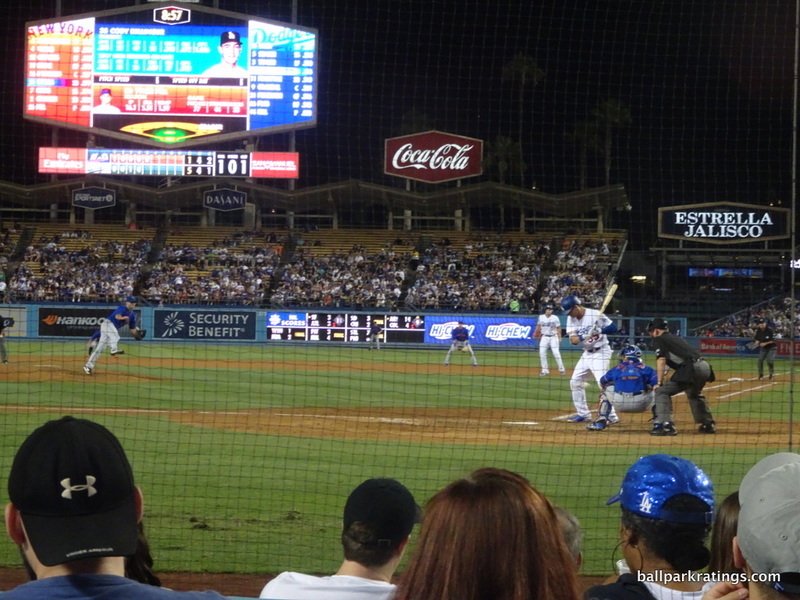 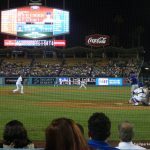 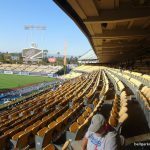 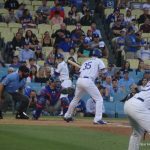 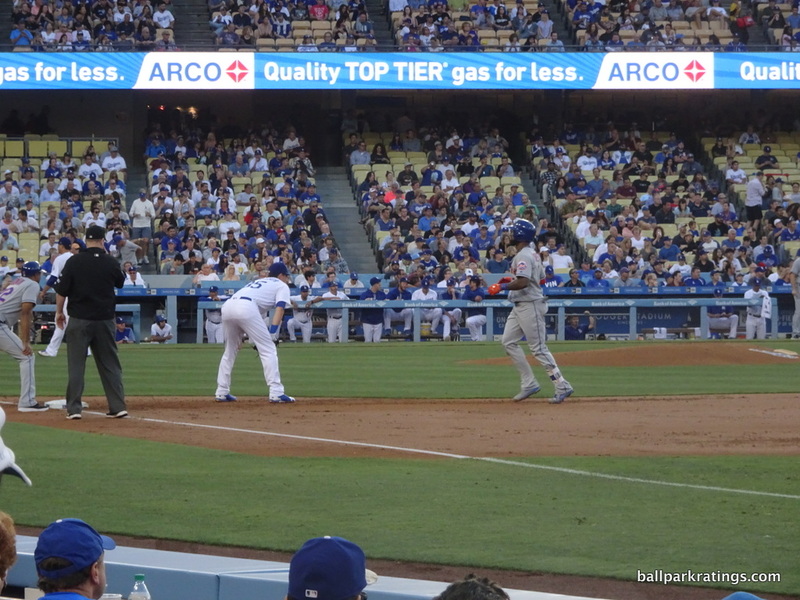 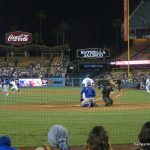 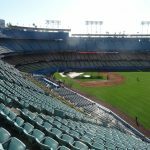 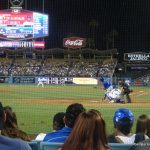 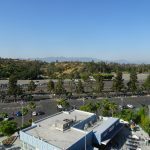 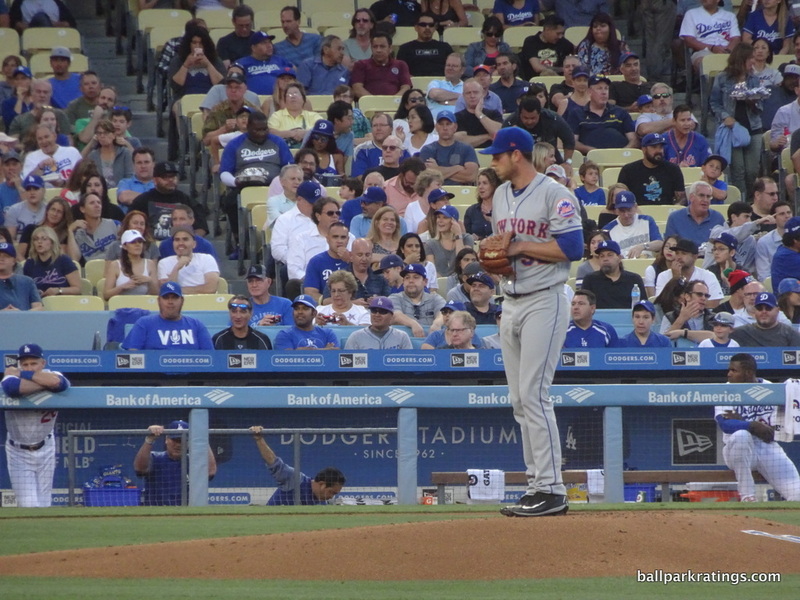 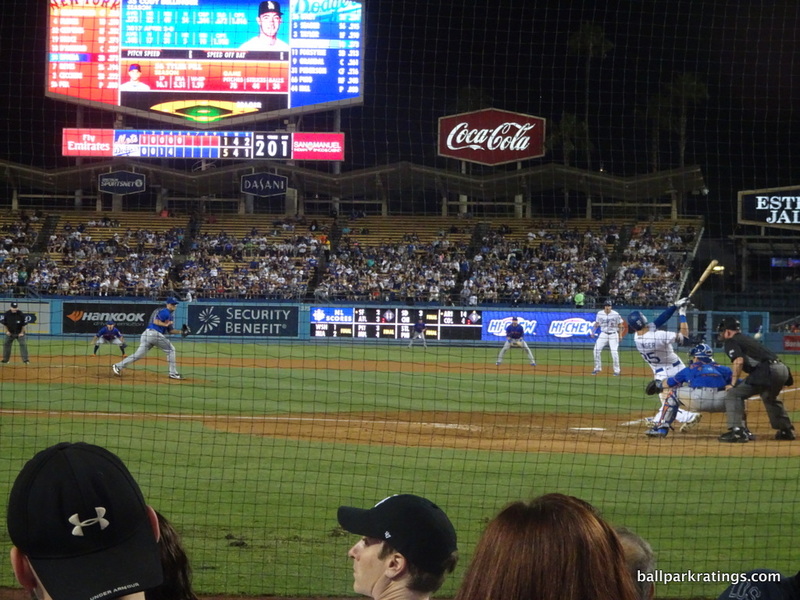 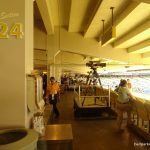 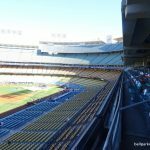 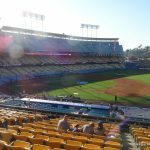 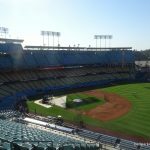 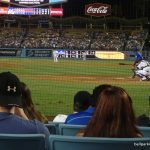 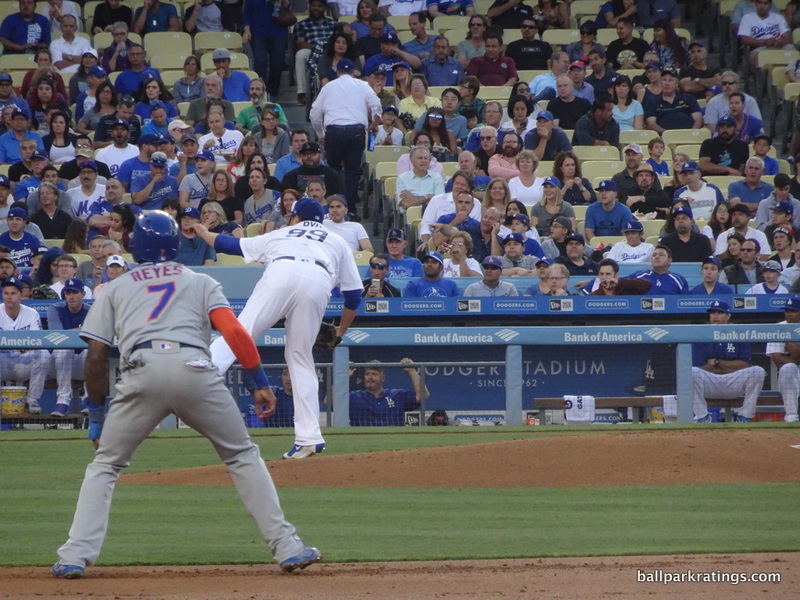 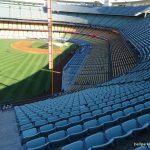 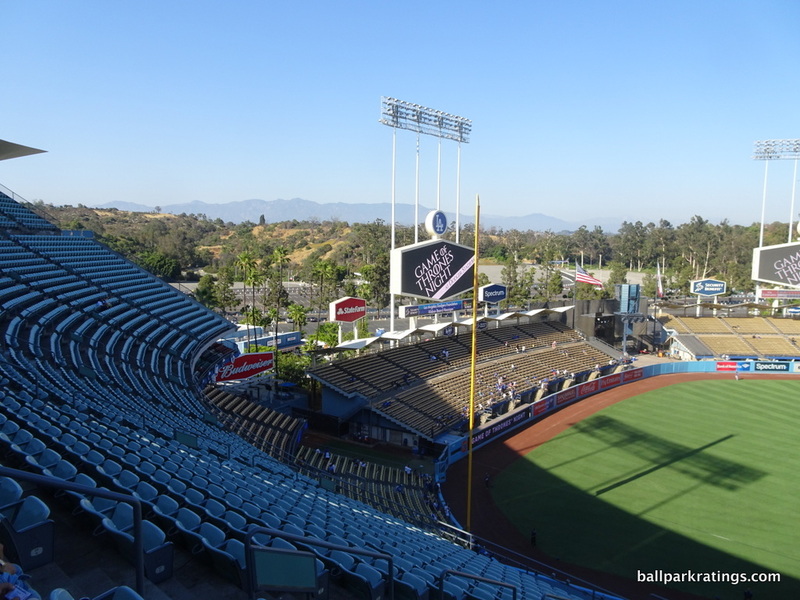 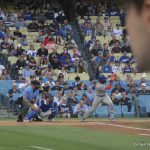 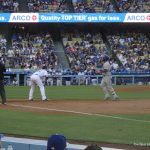 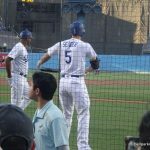 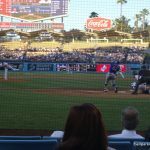 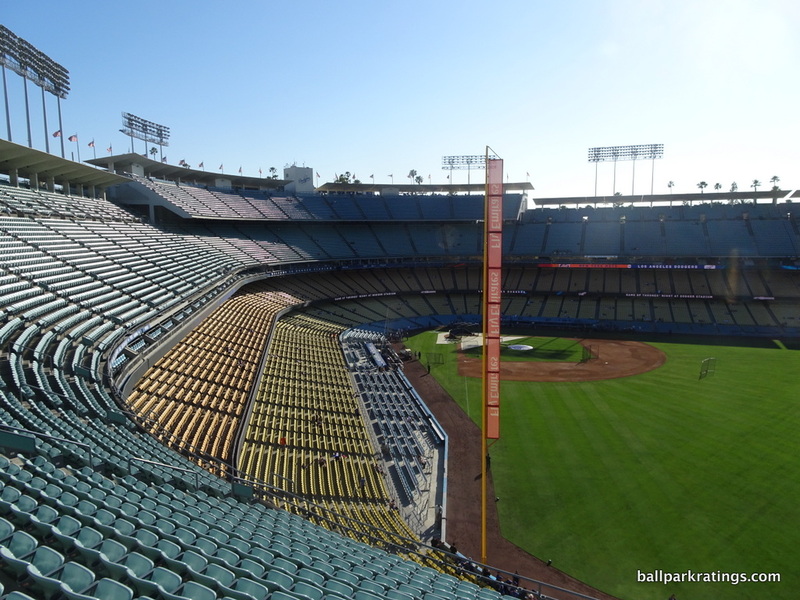 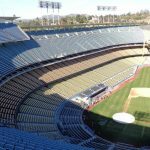 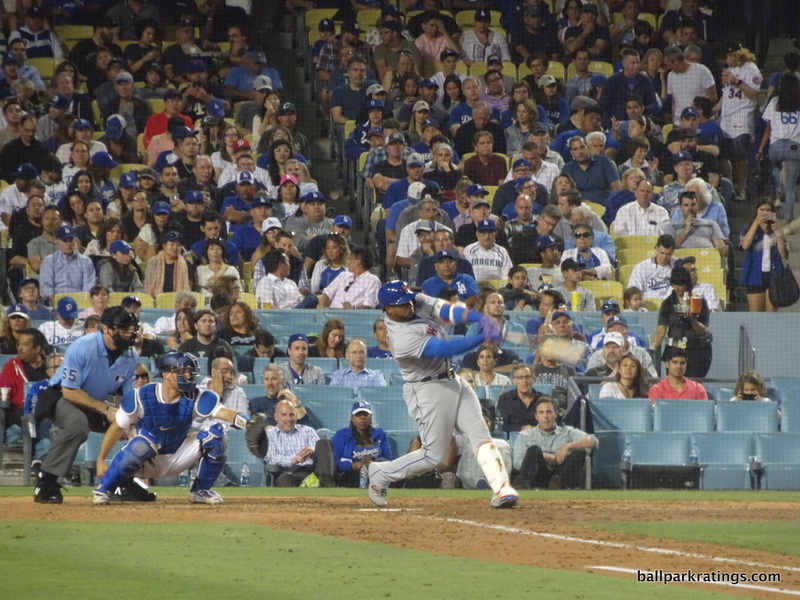 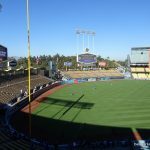 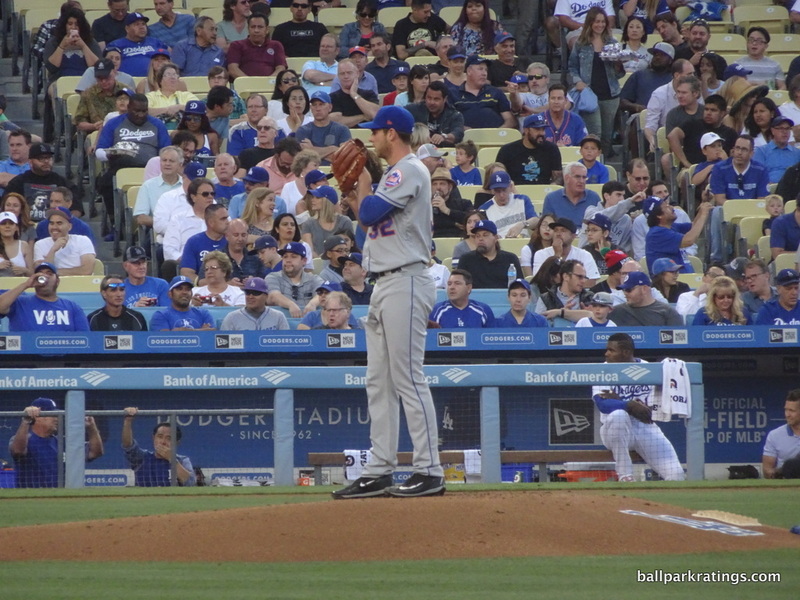 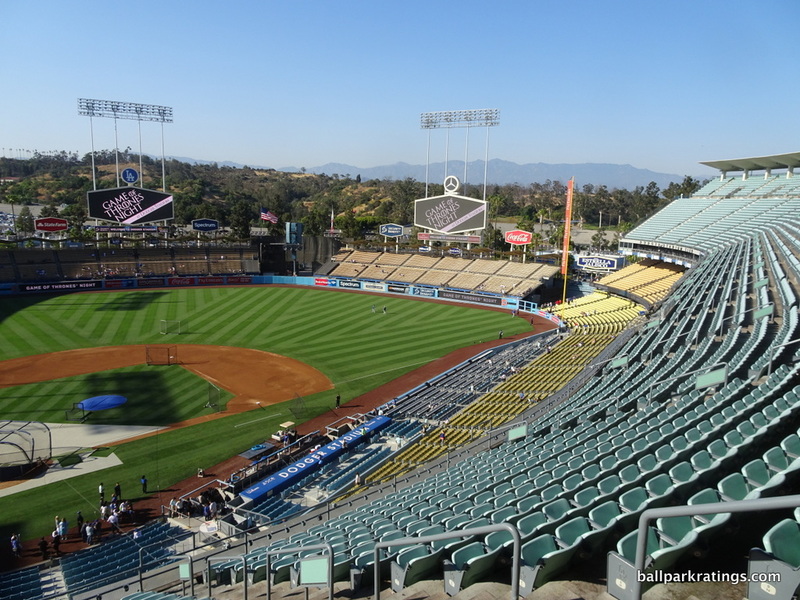 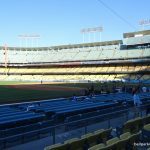 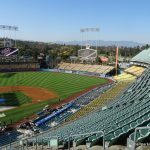 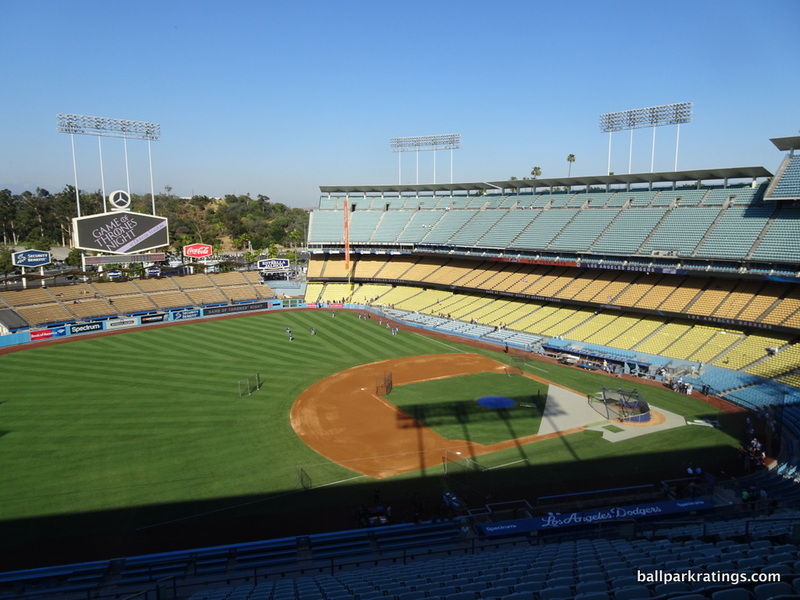 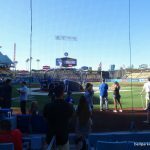 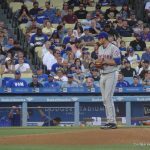 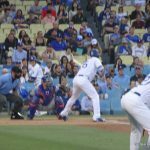 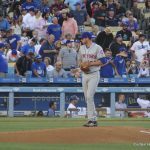 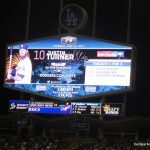 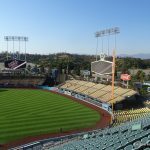 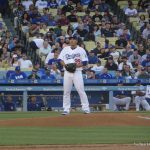 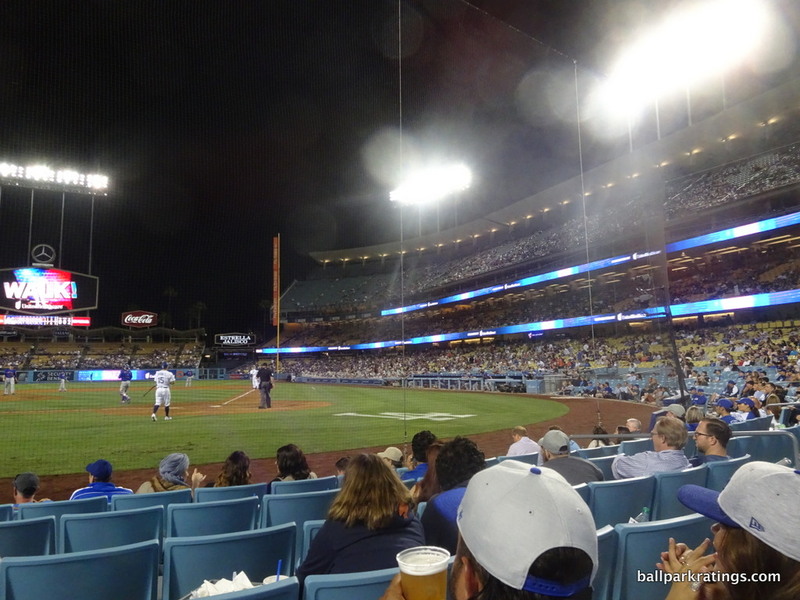 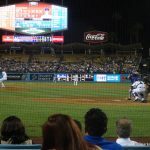 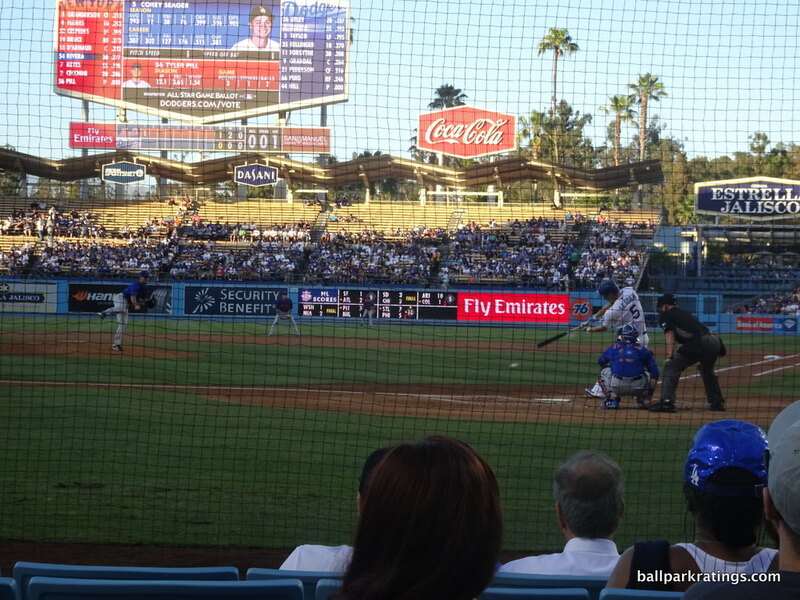 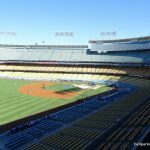 Dodger Stadium features terrific sightlines, as even though the seating structure looks high and far away, you feel right on top of the action from the upper decks. 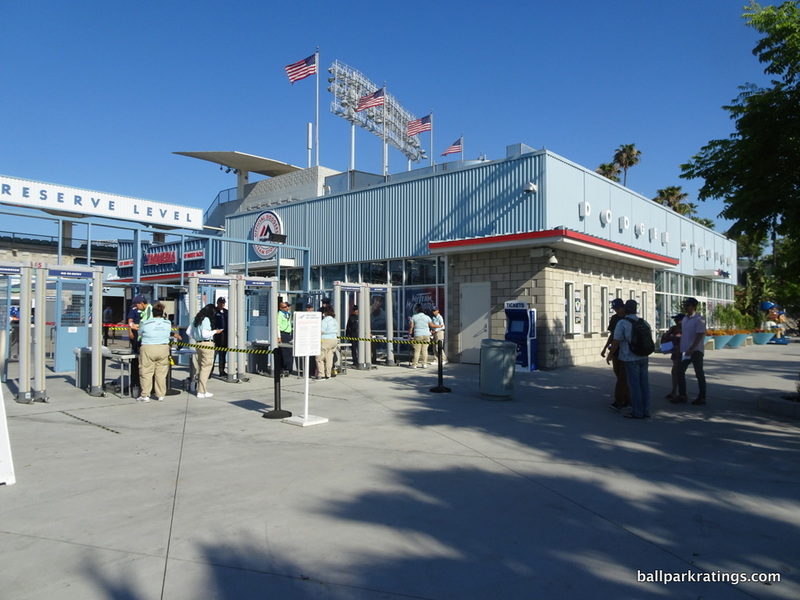 Simply because we take poor cantilevering for granted, we just assume a four-deck structure is subpar, but I was thoroughly impressed. 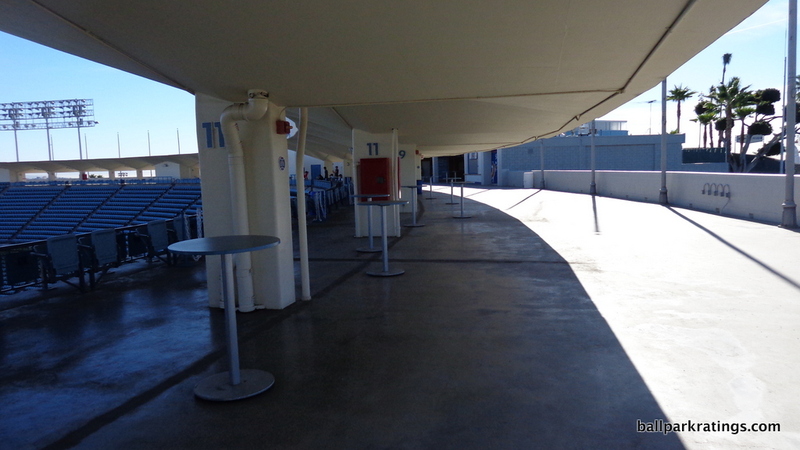 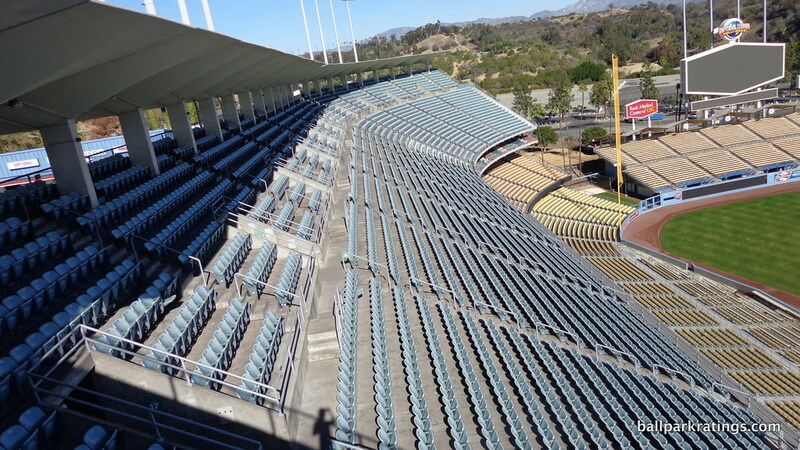 The curvilinear seating geometry works here as well. 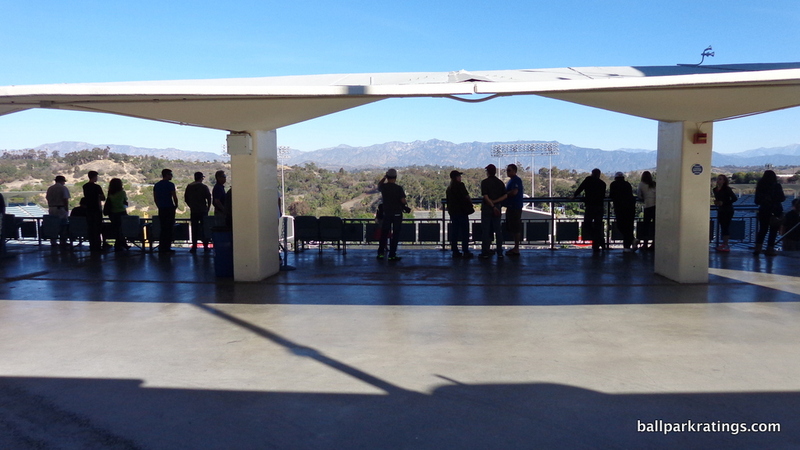 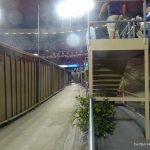 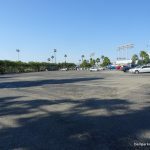 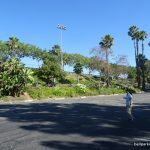 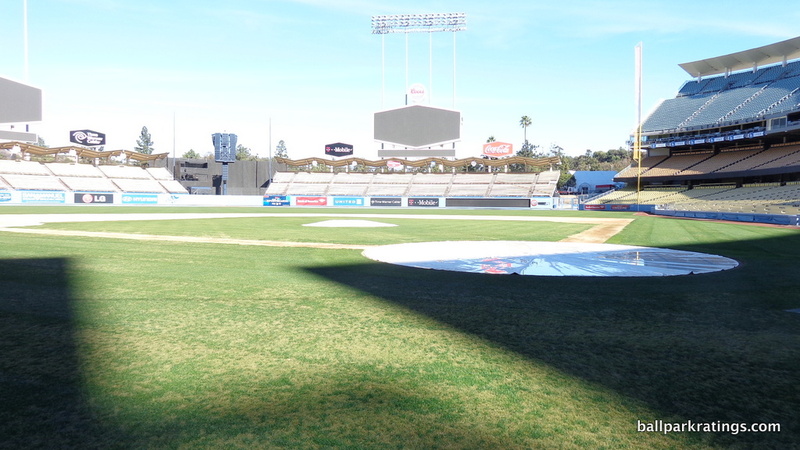 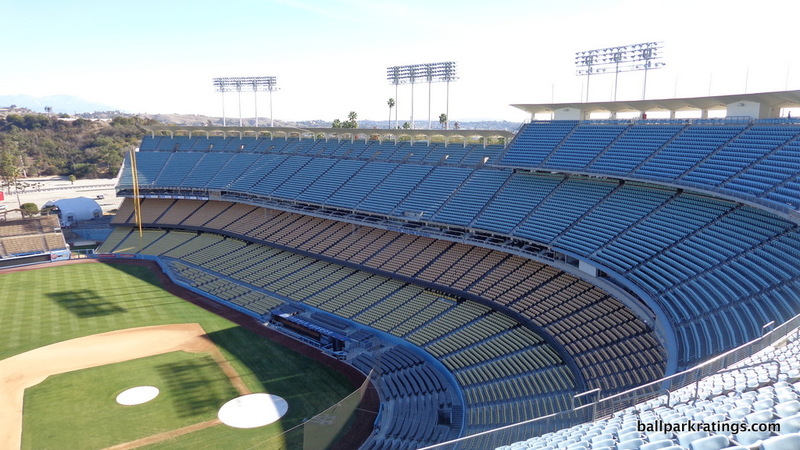 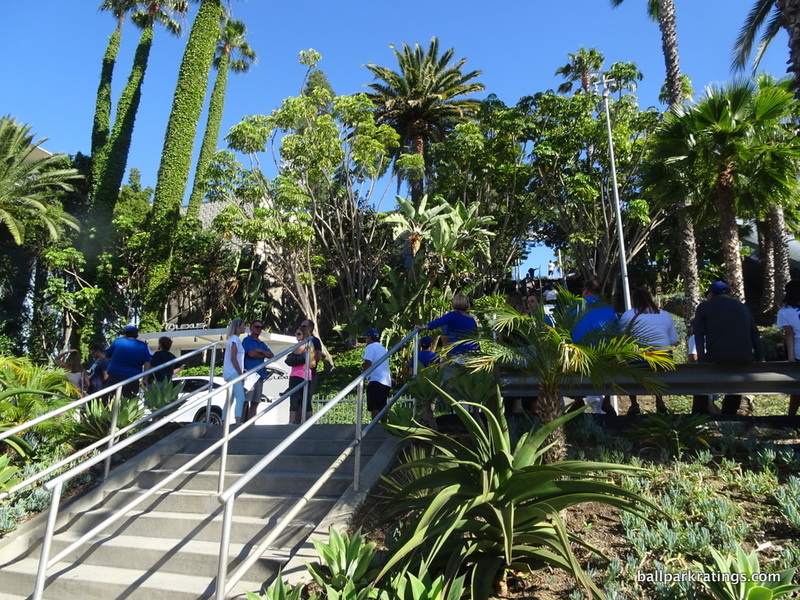 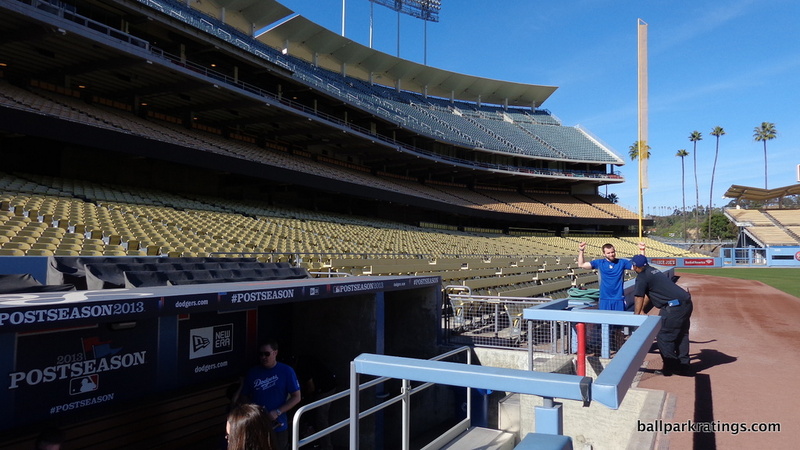 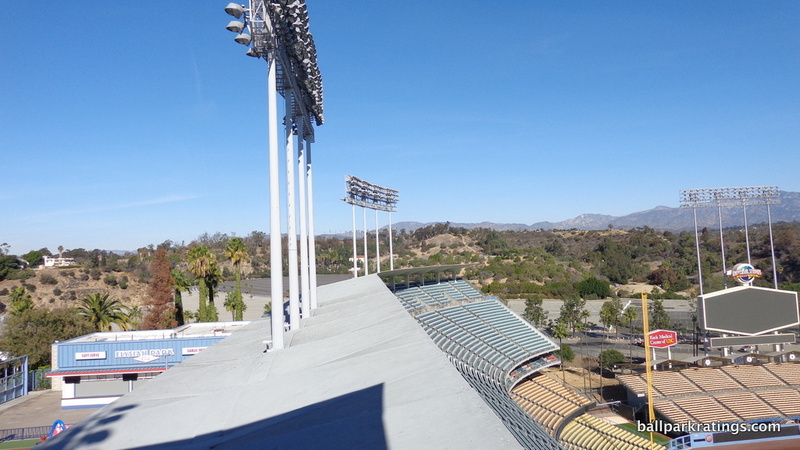 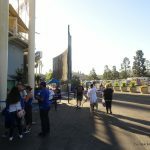 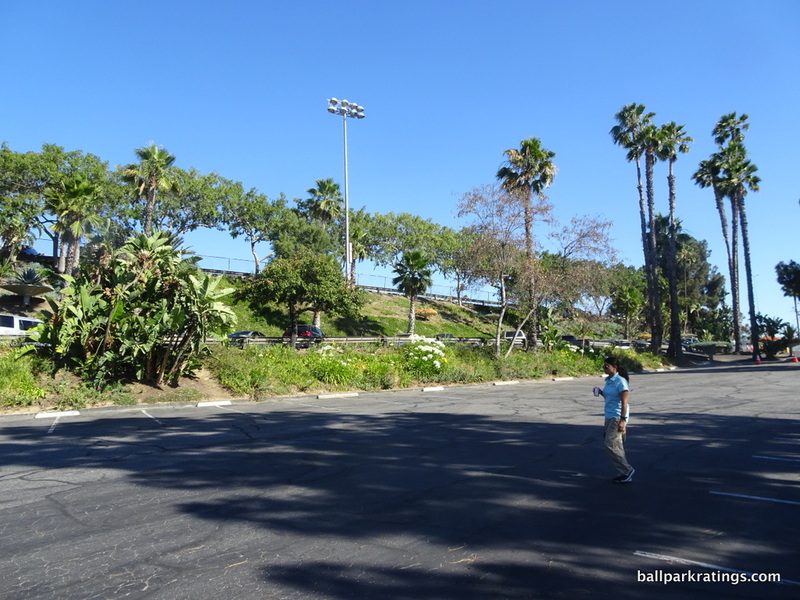 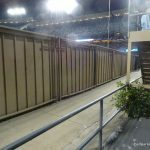 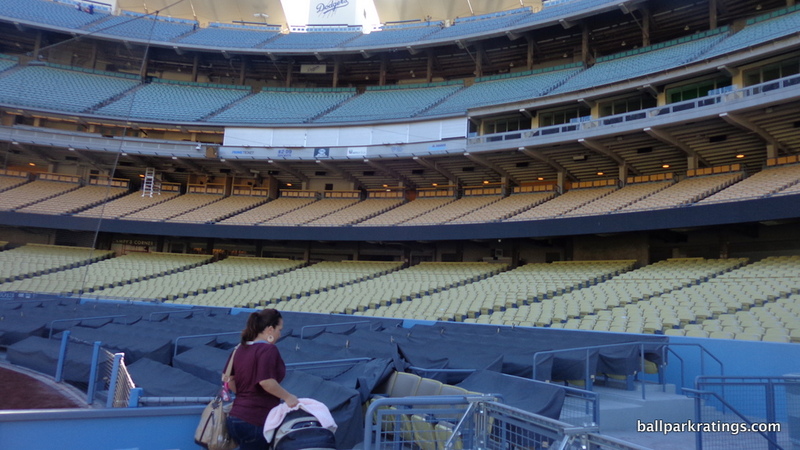 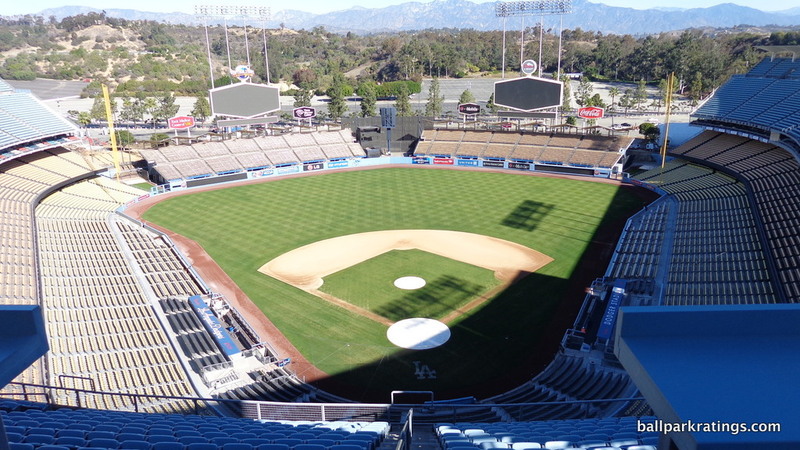 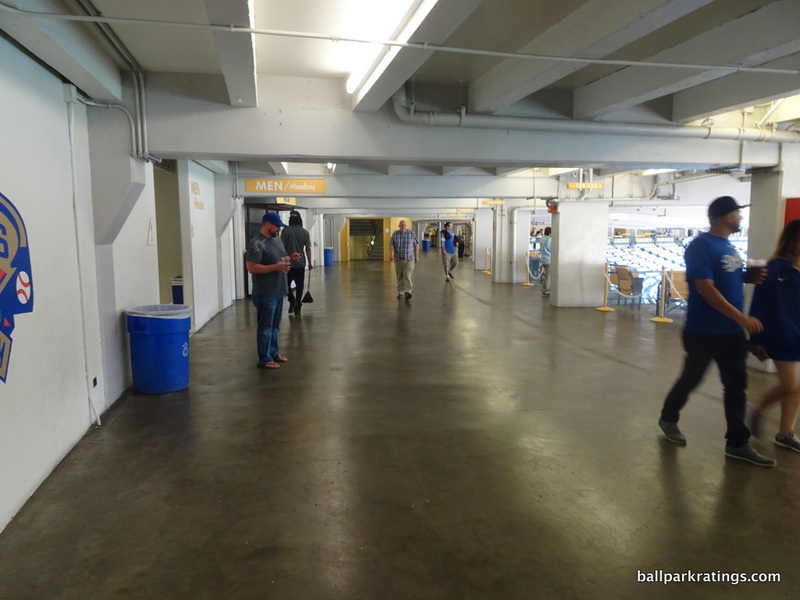 Dodger Stadium has traditionally gotten somewhat of a bad rap from ballpark aficionados/baseball tourists for one very practical reason: the inability to explore the park. 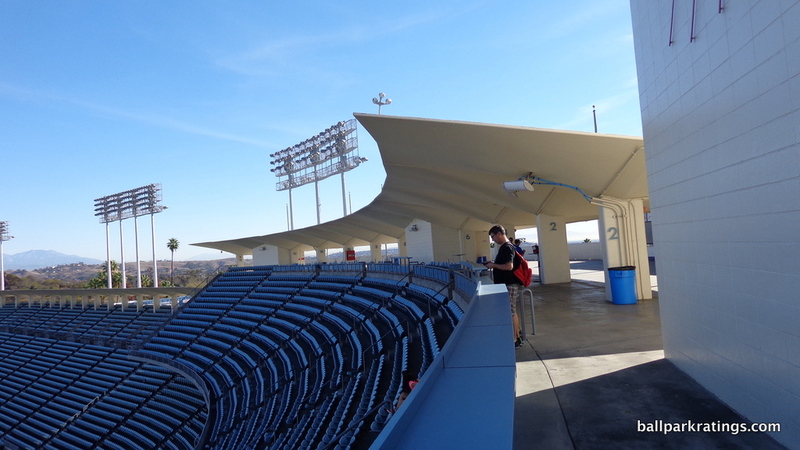 In what was rationalized due to the topography, fans used to be (are?) 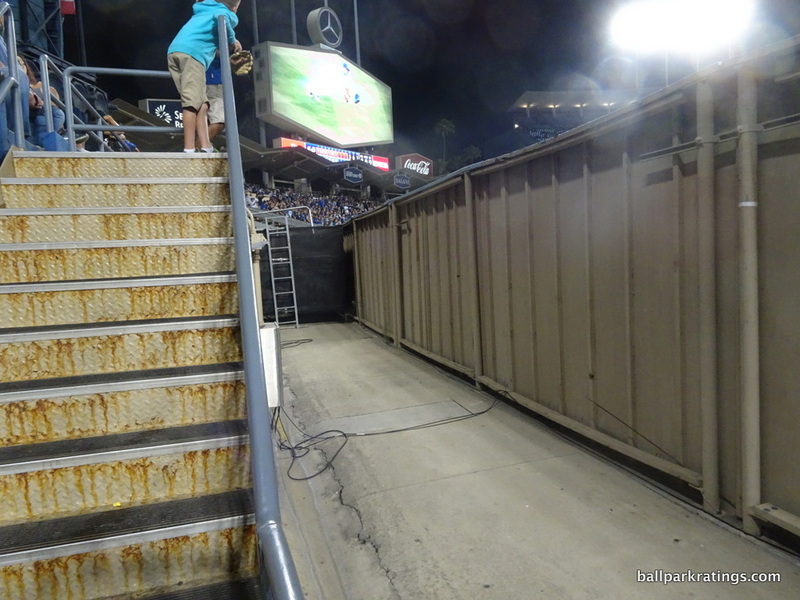 restricted to the concourse where their seat was located. 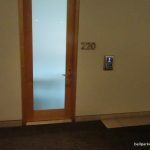 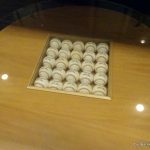 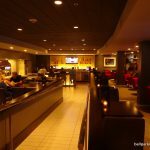 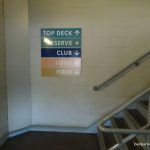 If you had a seat in a particular deck, you had to stay there. 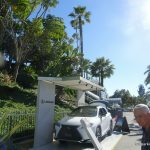 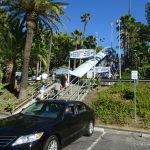 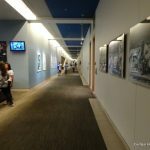 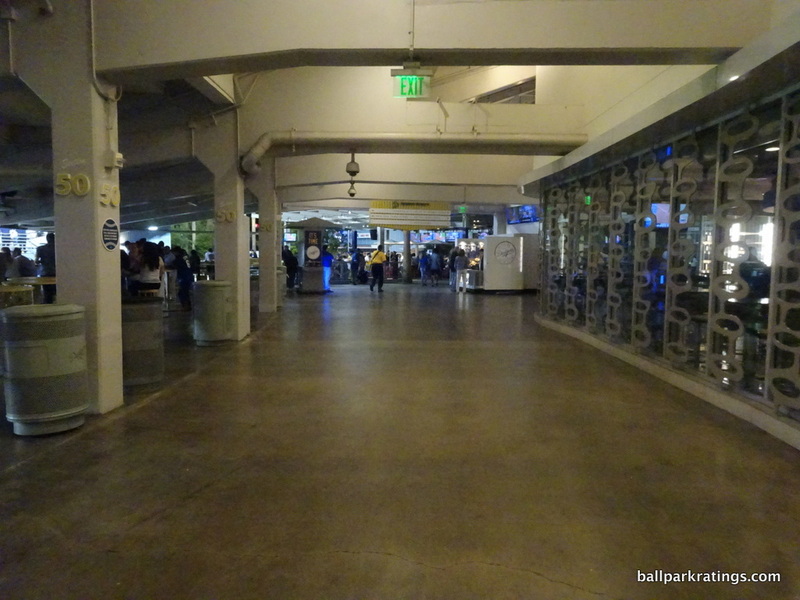 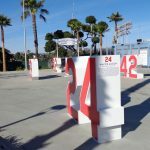 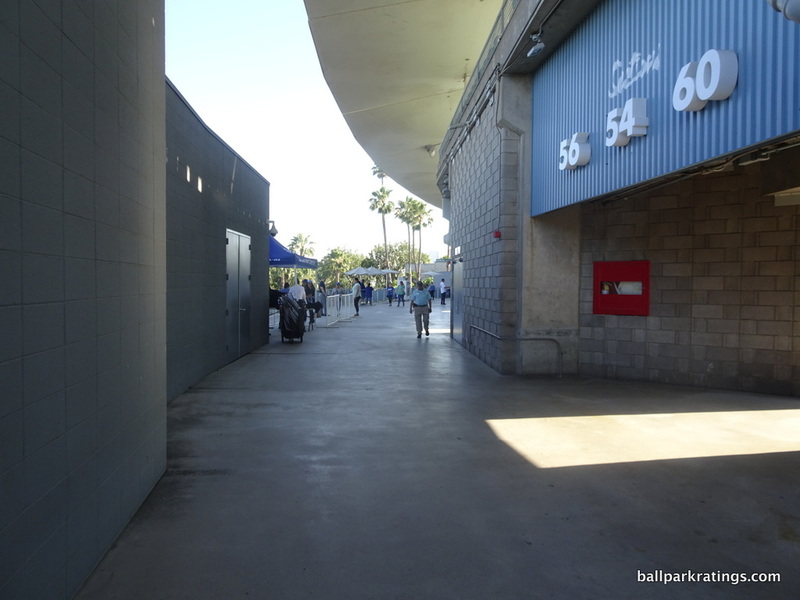 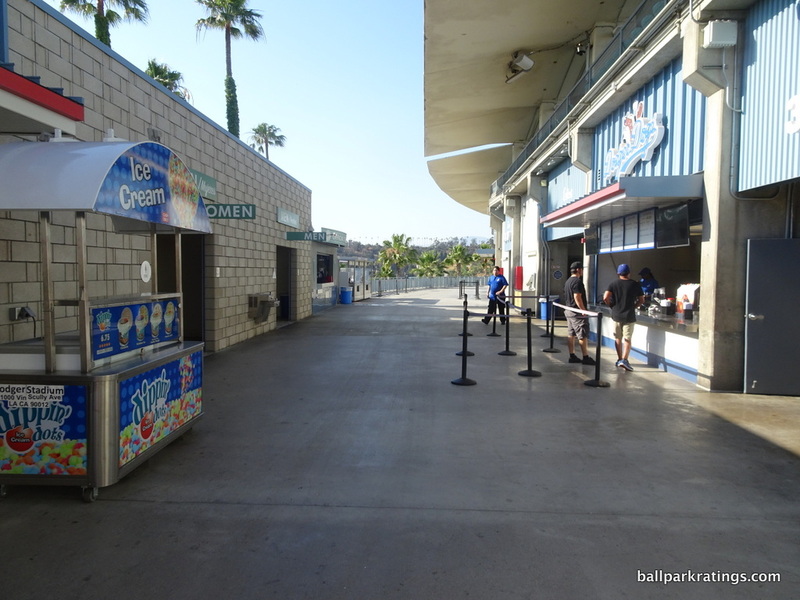 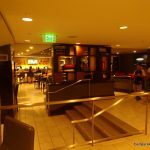 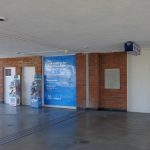 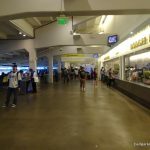 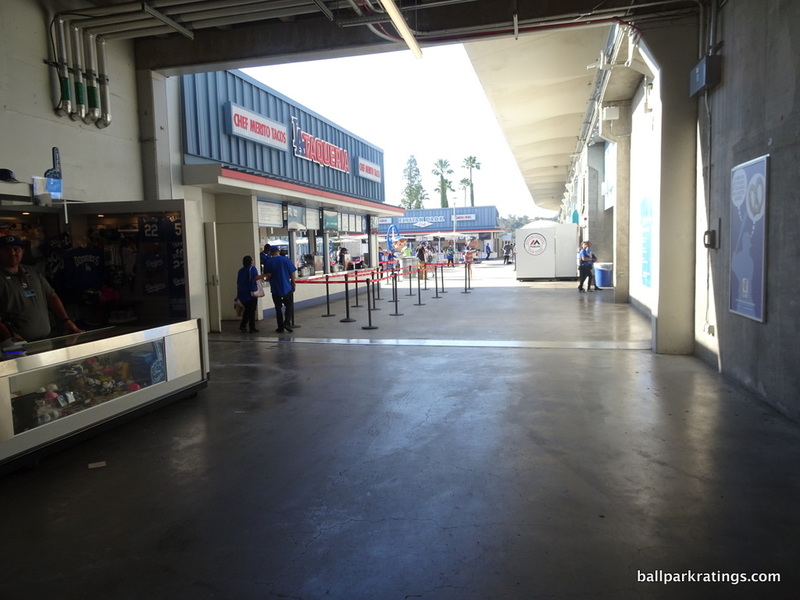 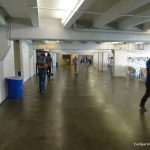 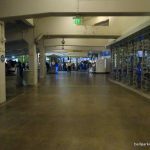 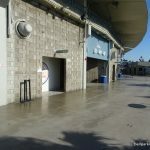 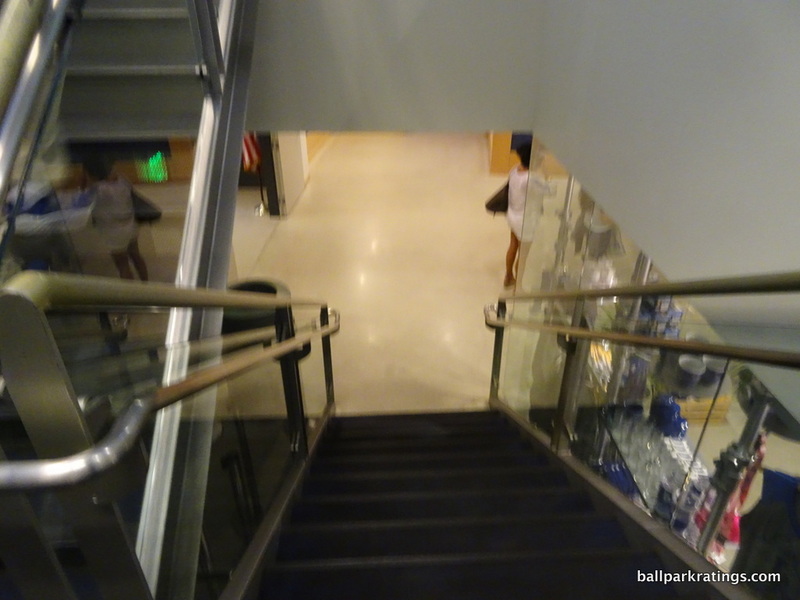 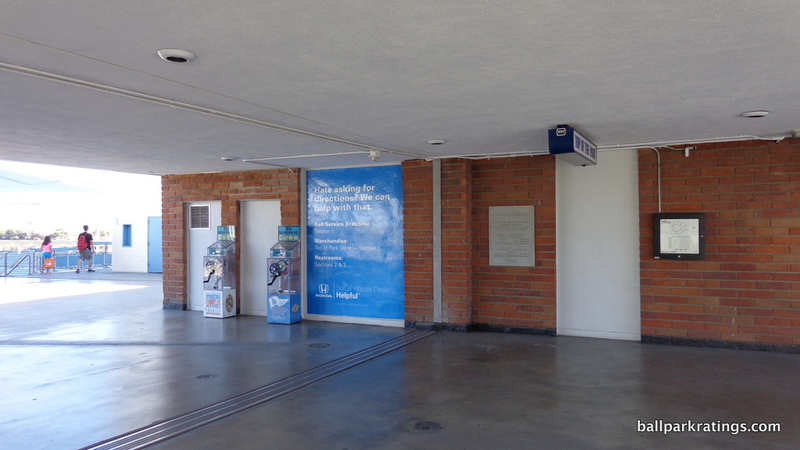 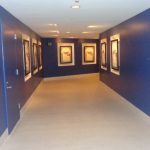 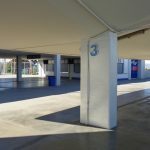 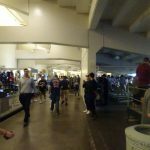 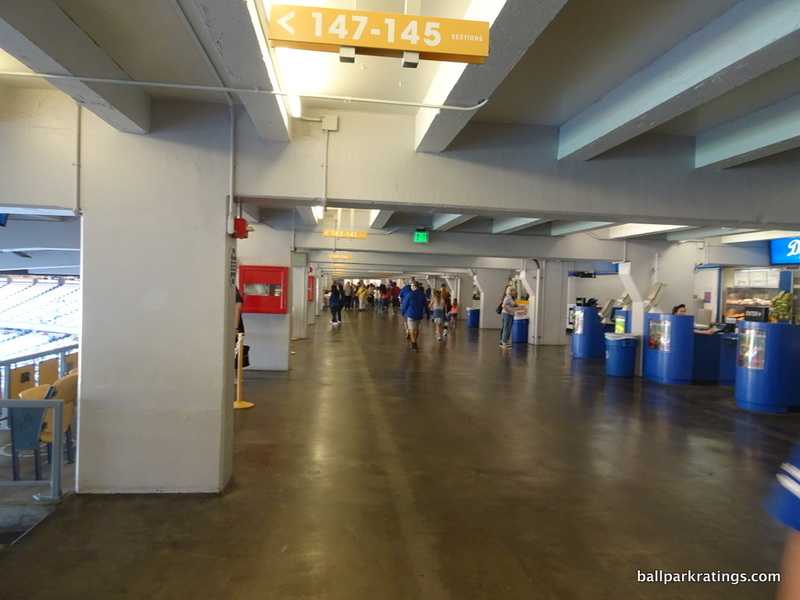 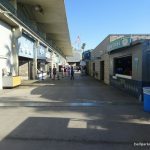 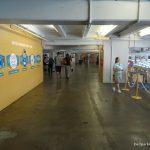 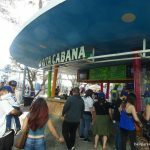 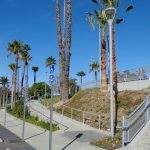 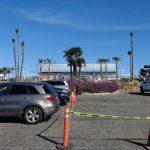 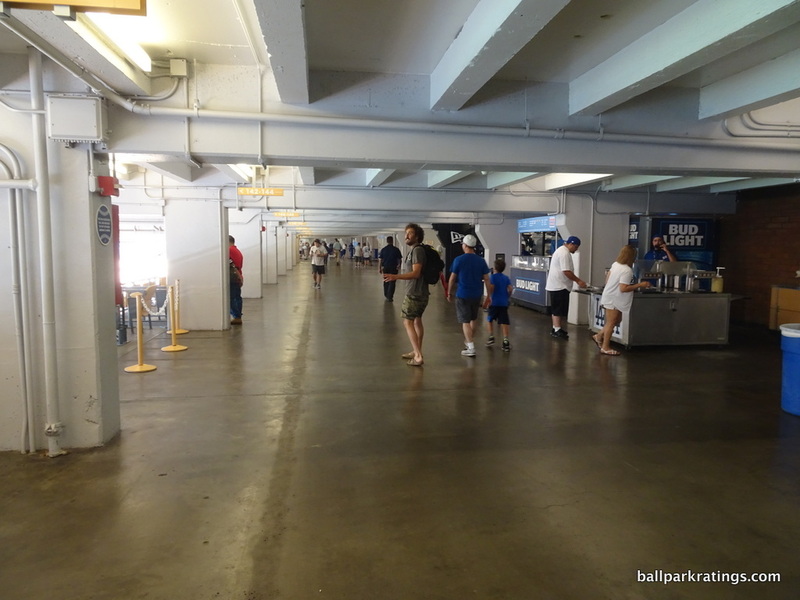 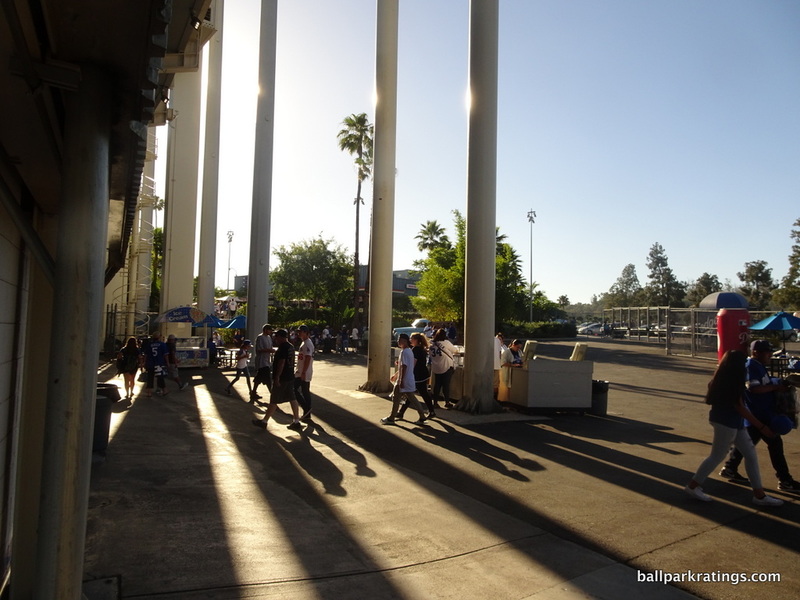 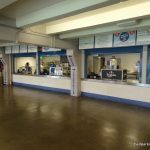 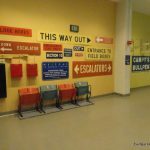 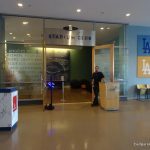 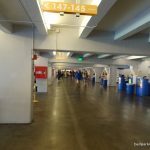 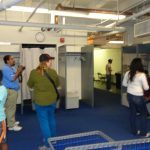 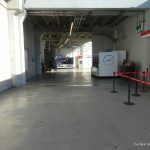 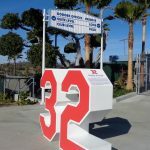 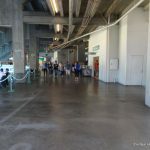 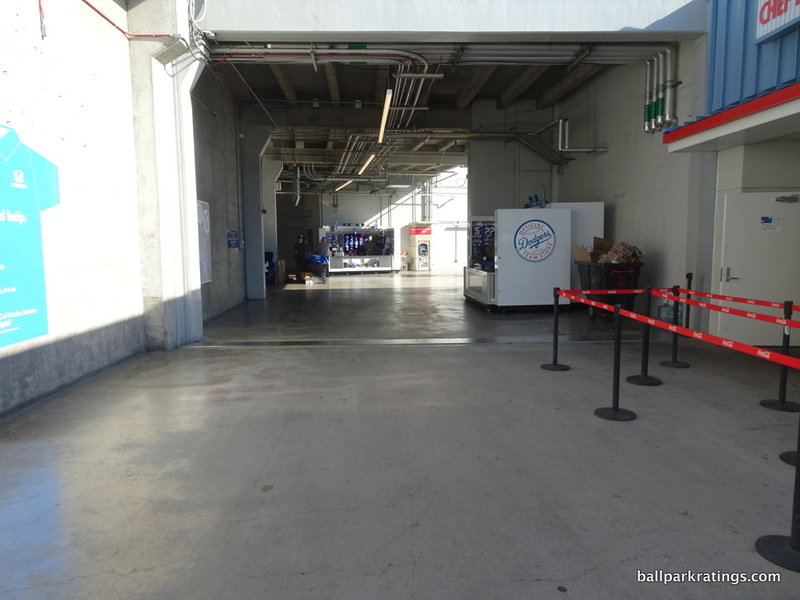 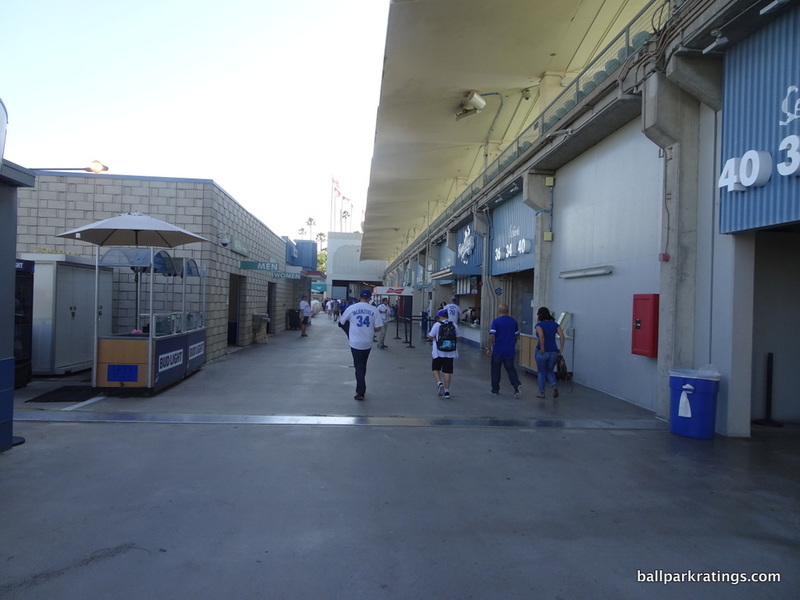 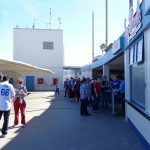 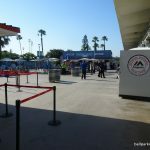 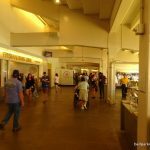 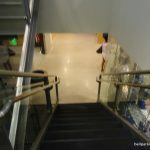 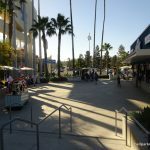 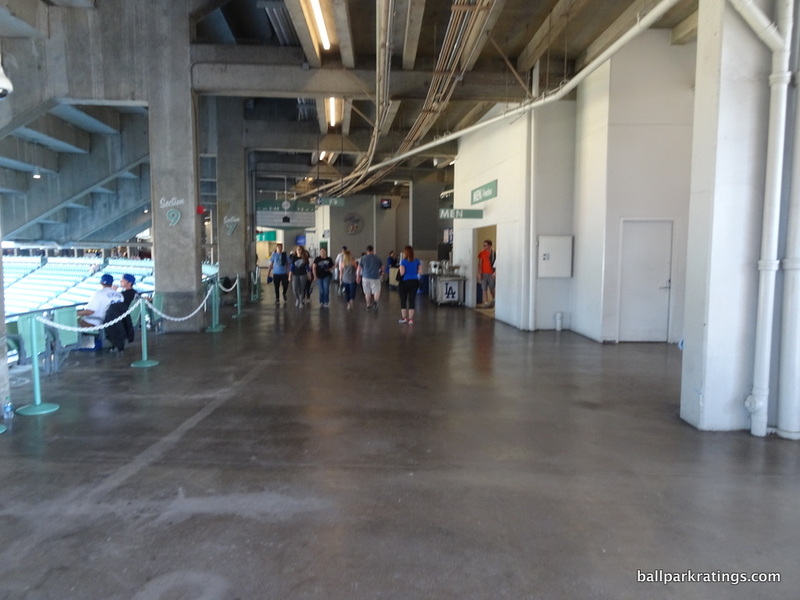 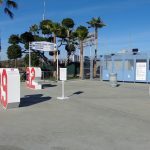 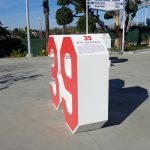 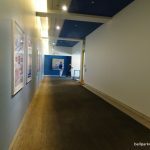 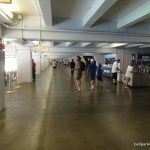 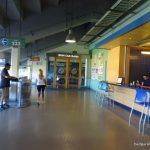 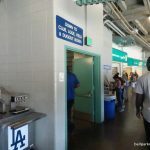 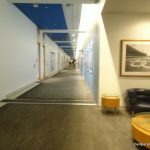 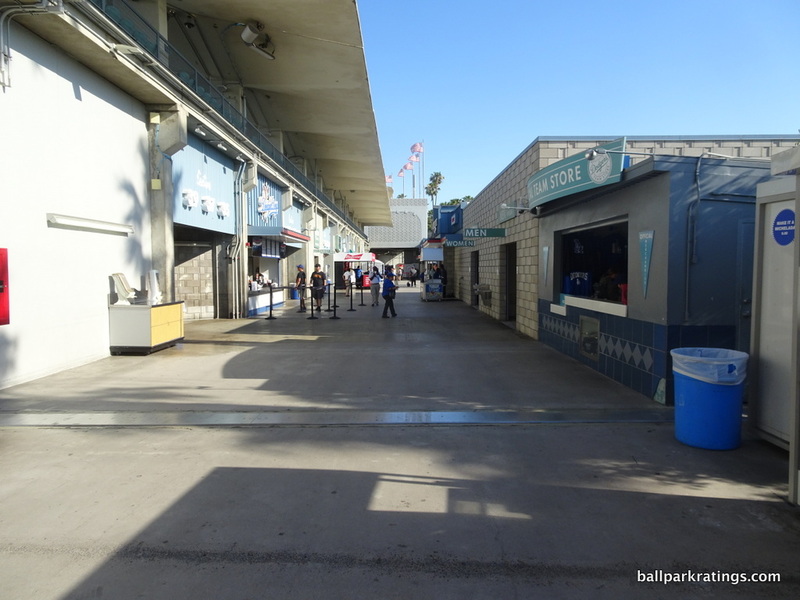 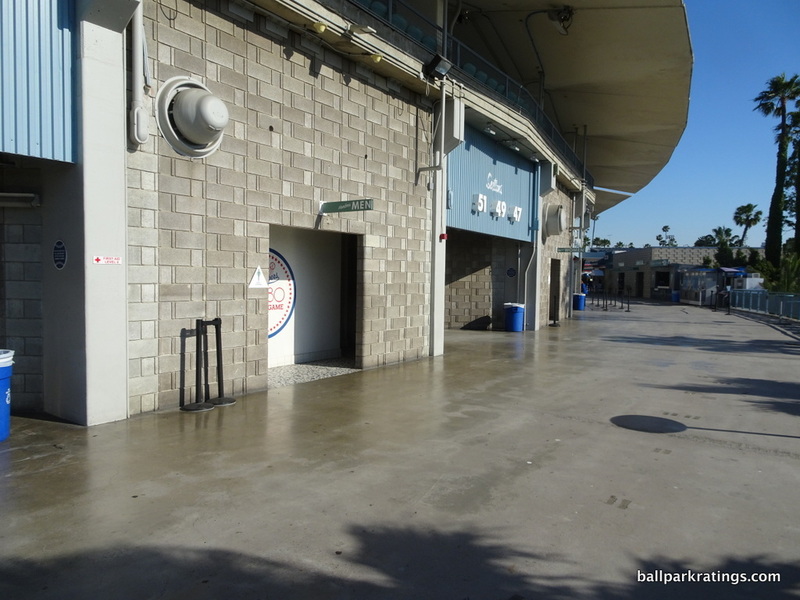 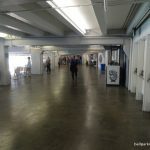 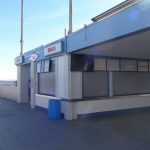 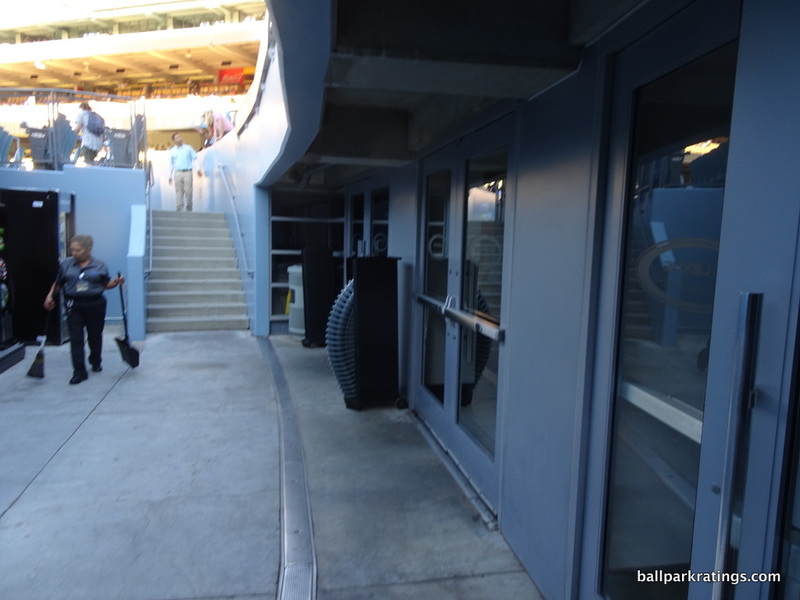 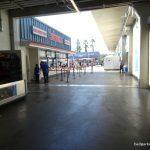 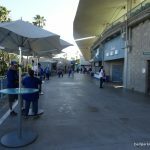 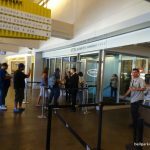 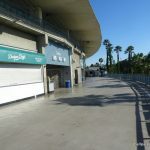 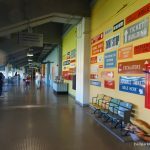 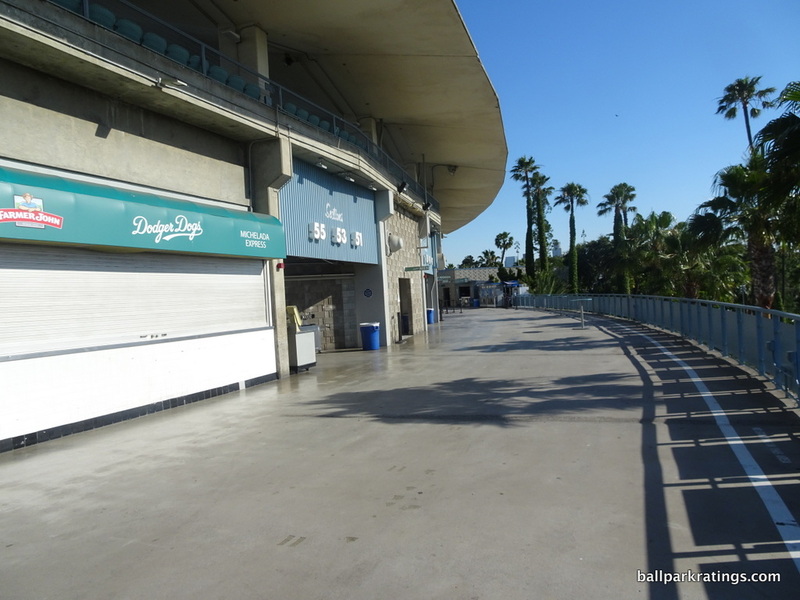 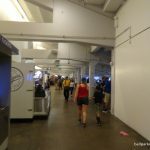 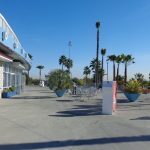 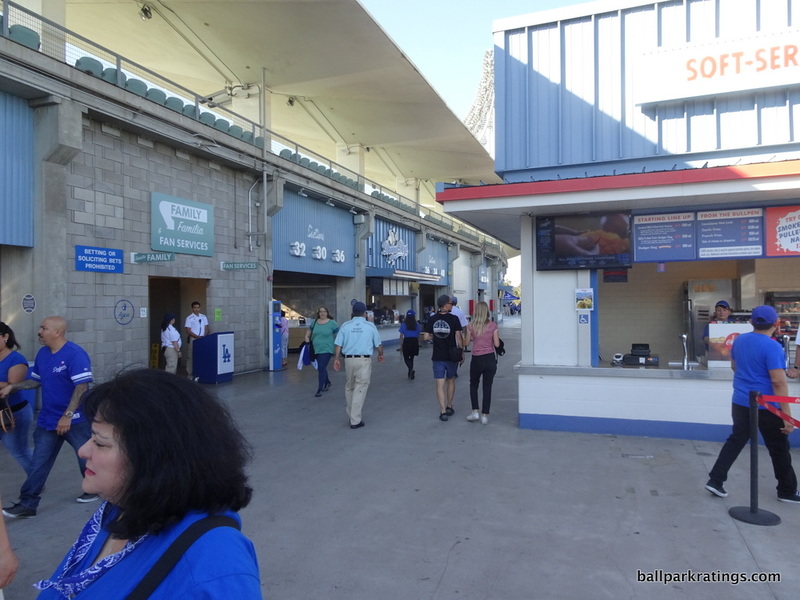 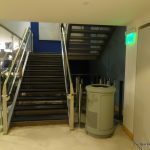 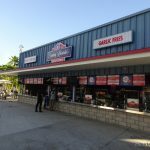 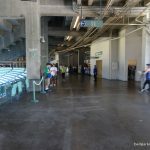 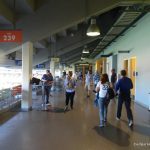 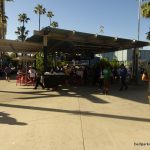 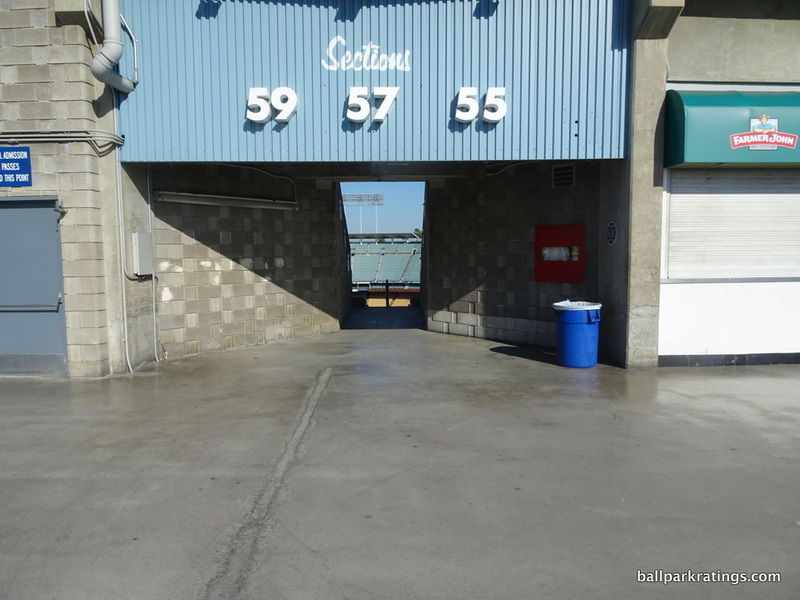 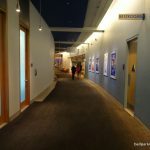 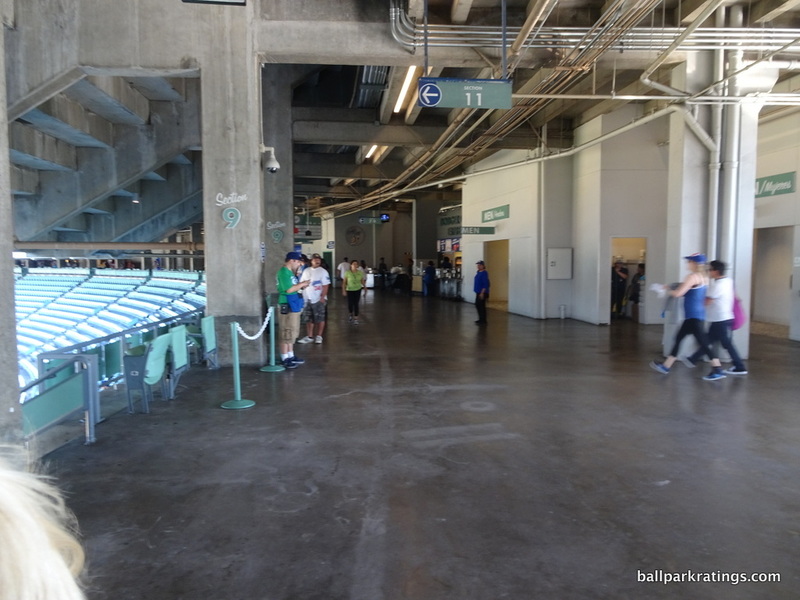 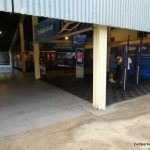 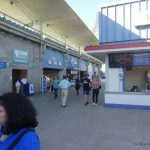 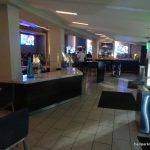 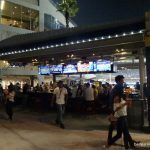 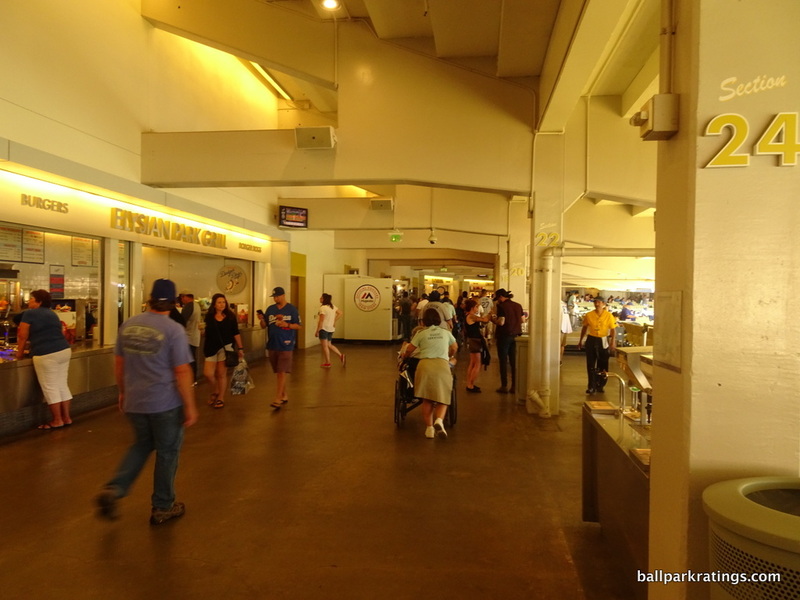 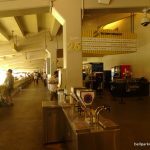 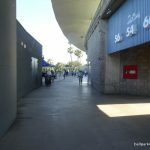 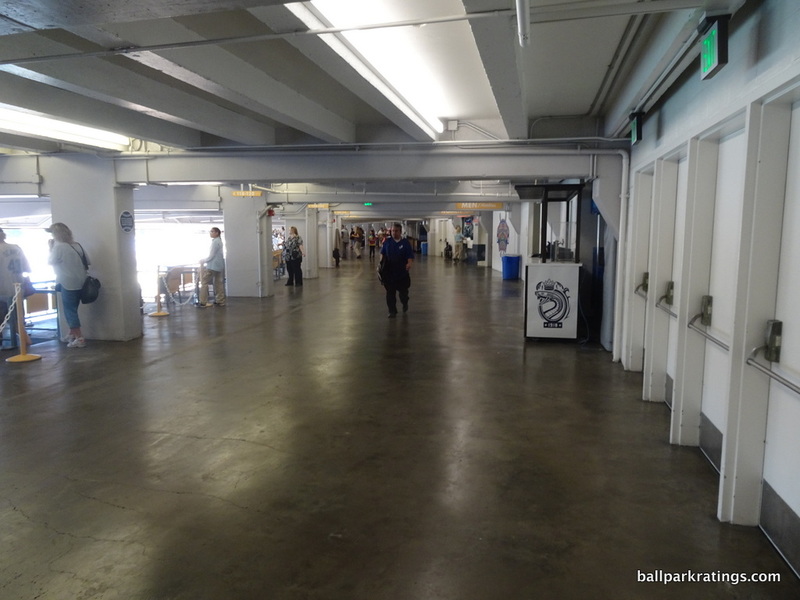 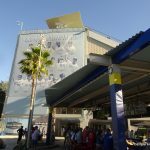 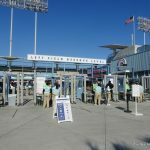 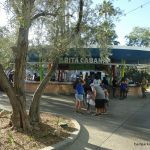 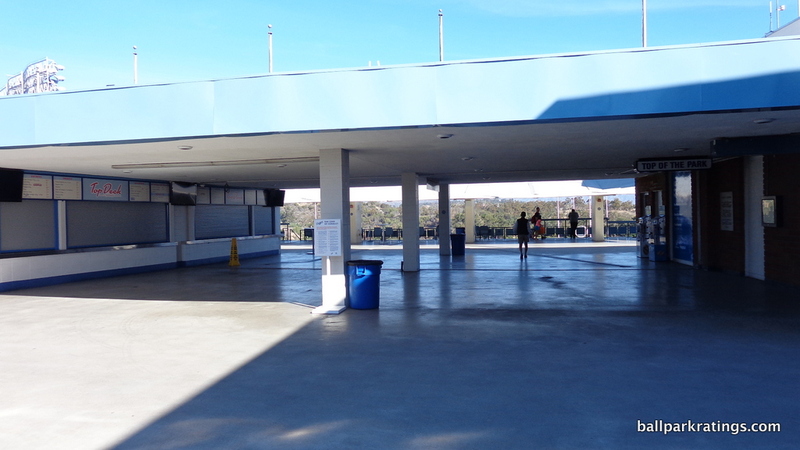 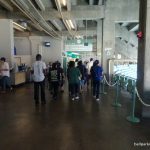 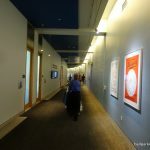 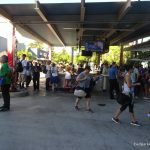 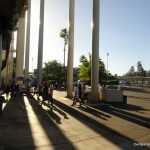 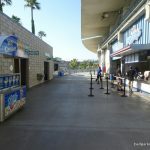 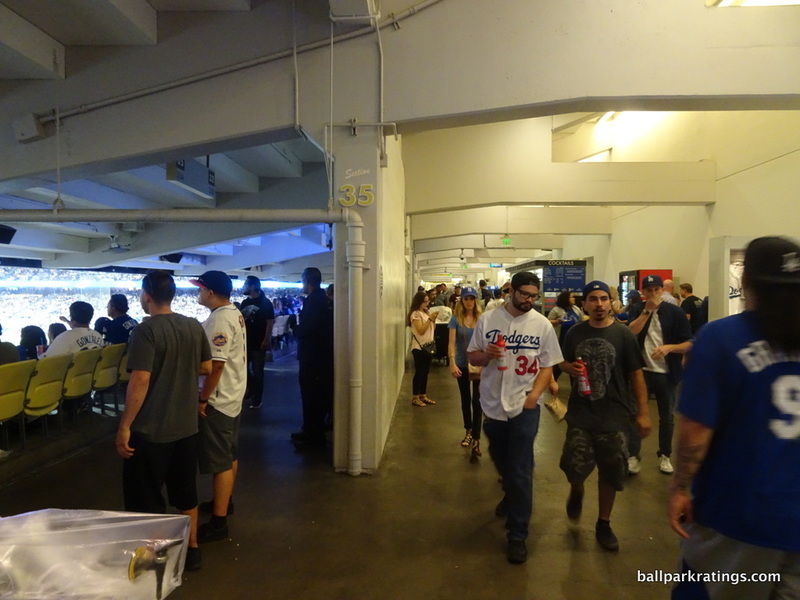 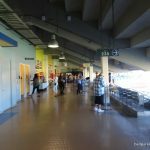 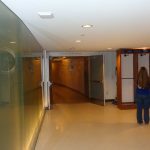 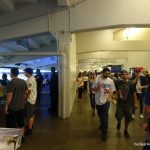 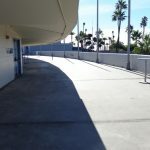 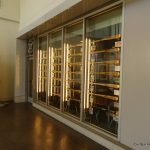 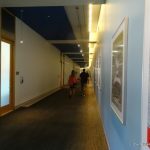 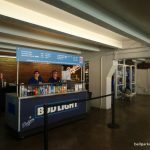 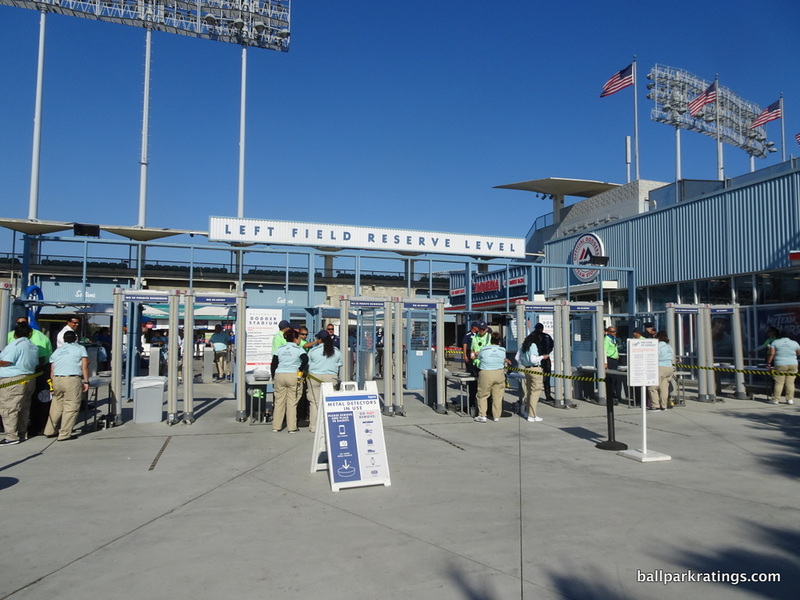 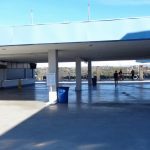 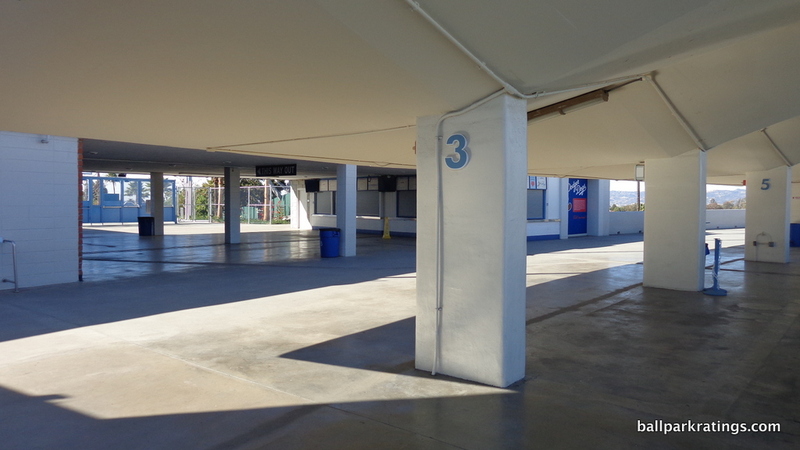 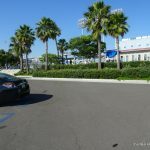 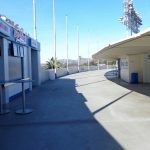 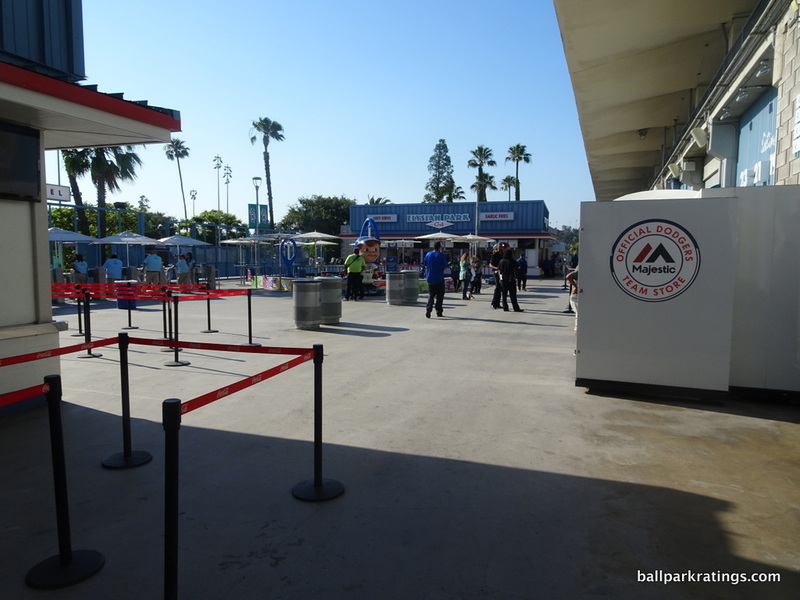 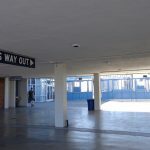 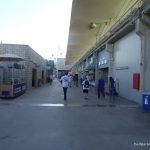 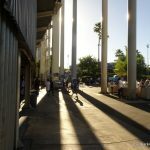 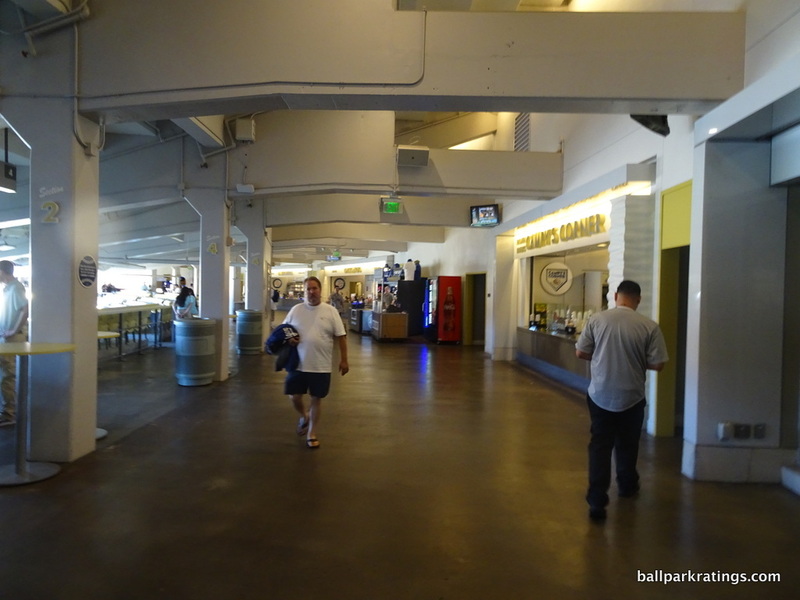 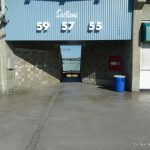 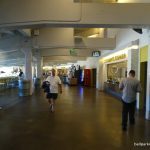 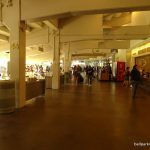 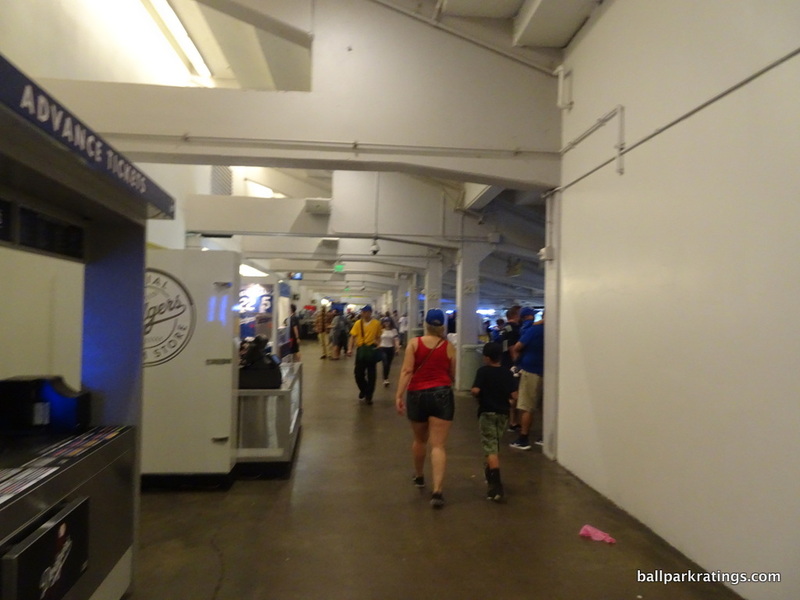 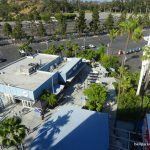 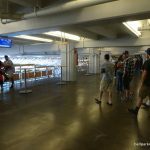 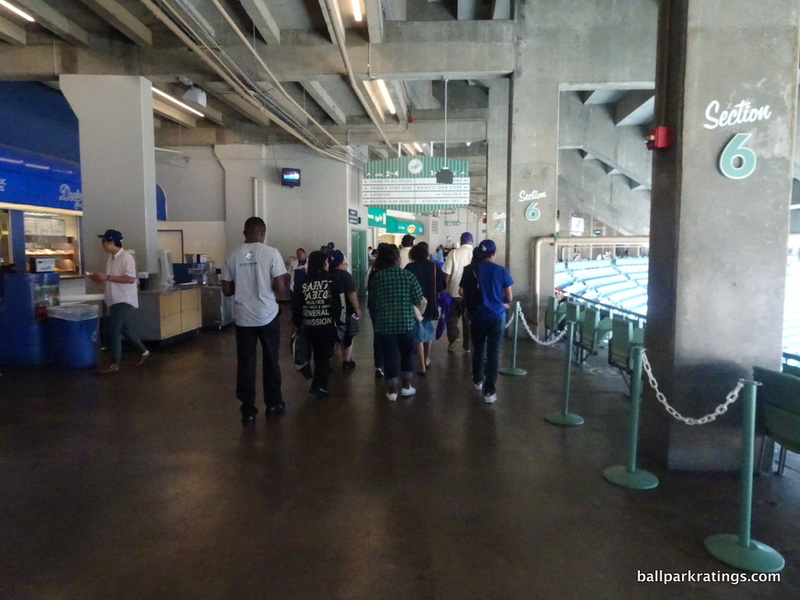 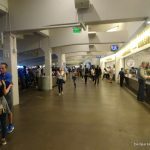 From personal experience, this is no longer an issue, as you can walk all the way around Dodger Stadium on the main, quasi-open concourse system. 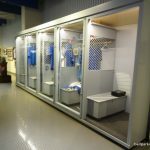 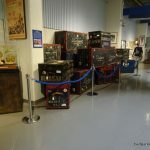 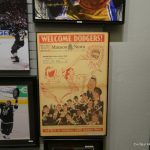 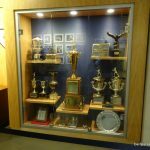 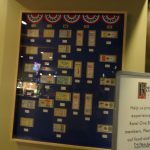 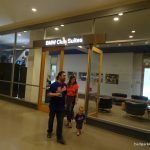 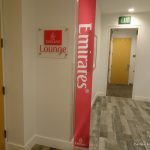 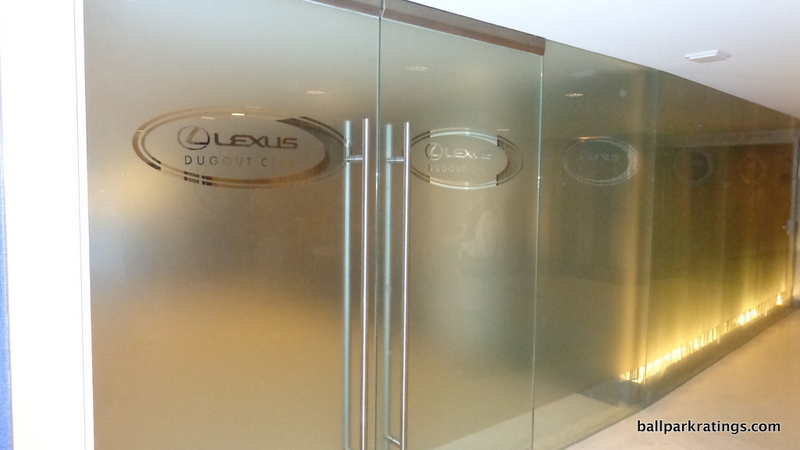 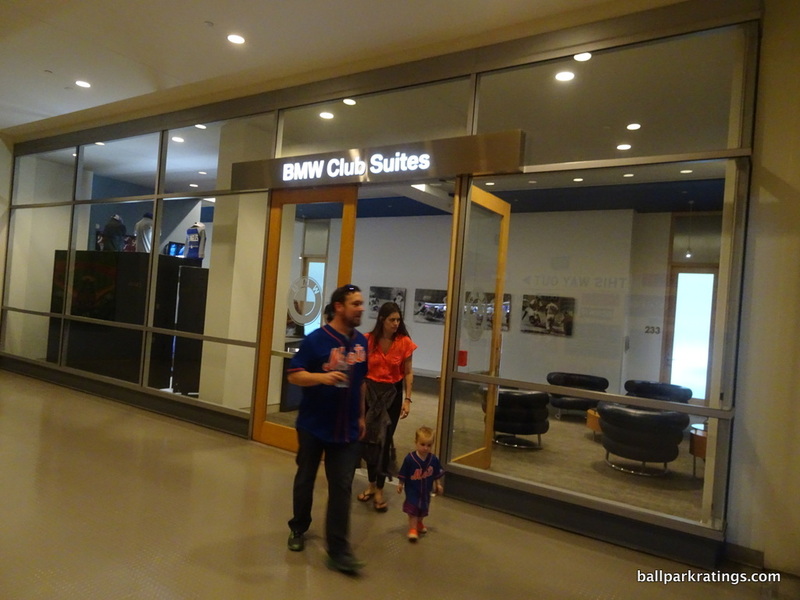 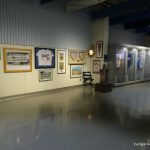 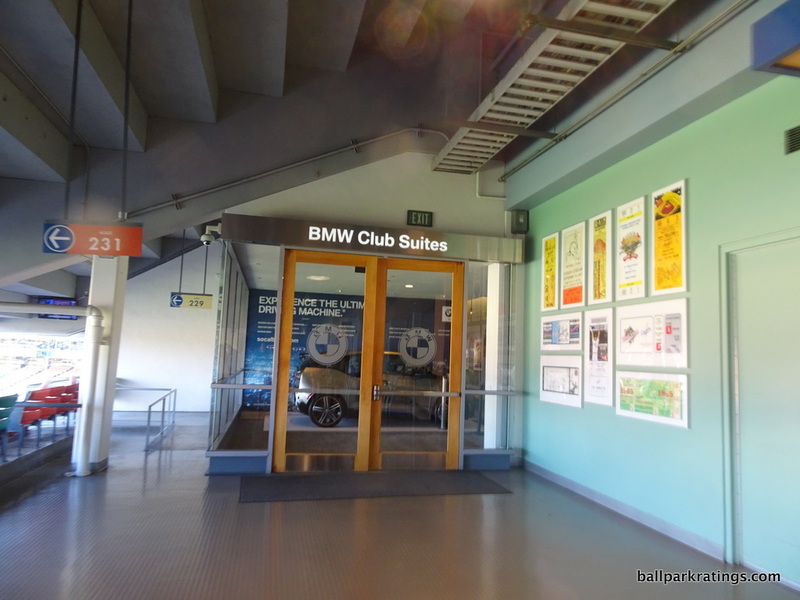 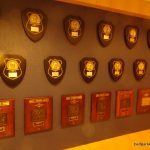 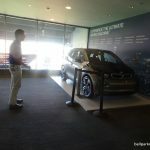 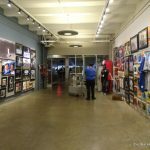 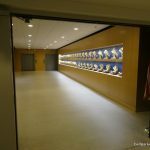 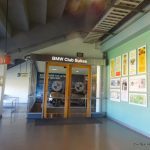 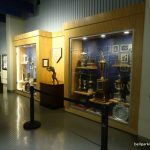 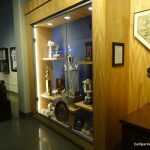 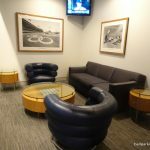 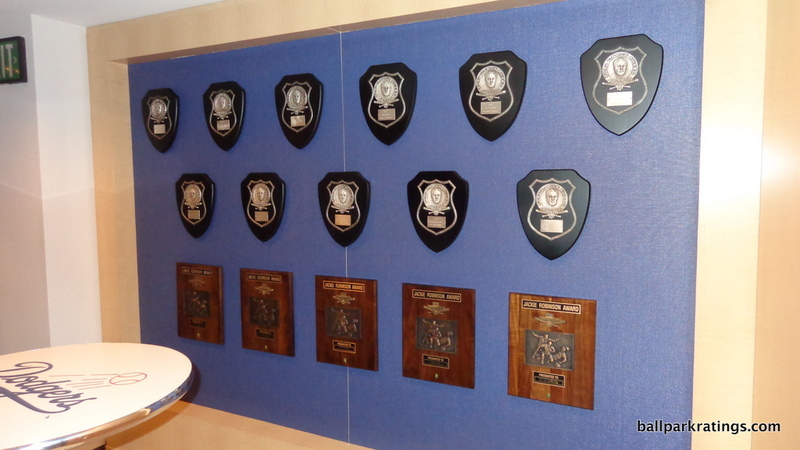 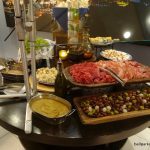 With a few exceptions, all fans are allowed access to most concourse areas, including the BMW Suite Level to explore the historical memorabilia. 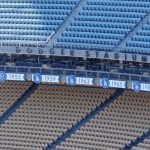 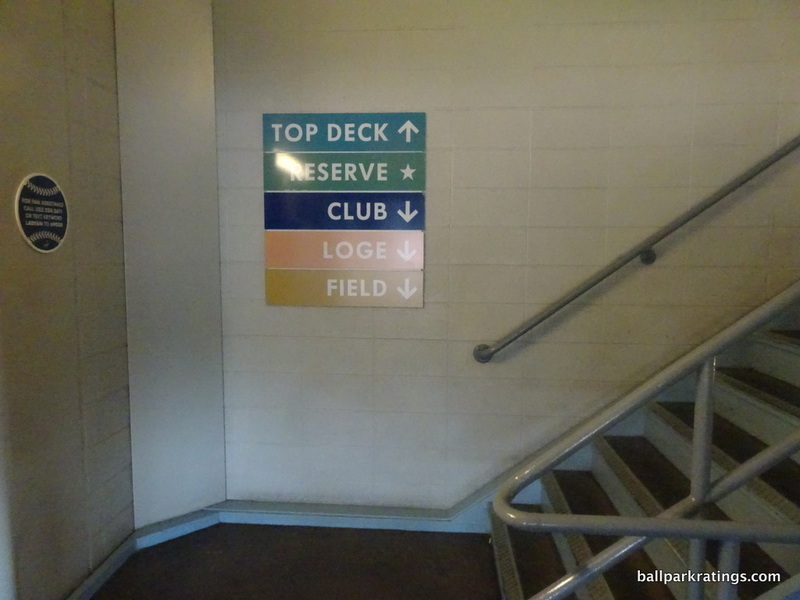 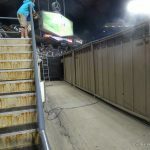 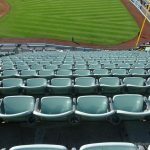 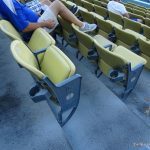 Oddly, the Dodgers’ website still indicates that fans in the upper and top deck must stay on that level, but I did not find that to be enforced. 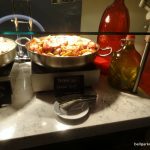 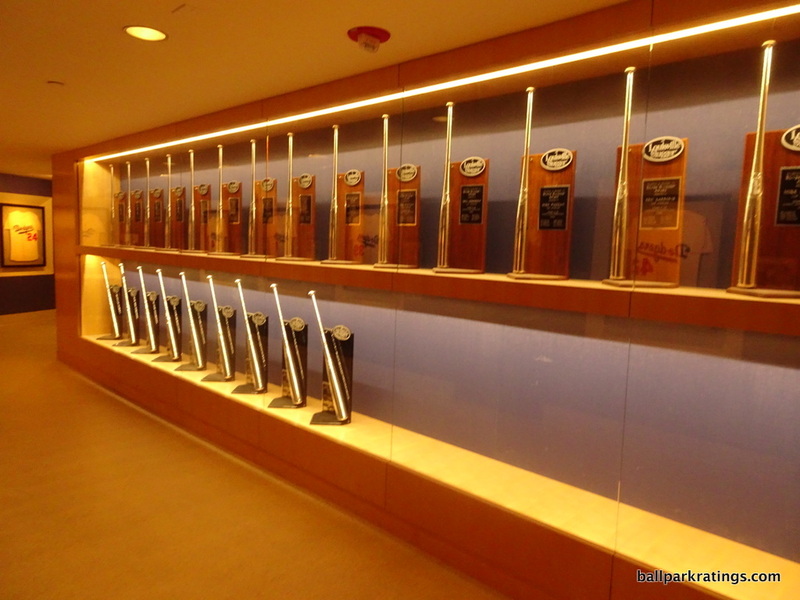 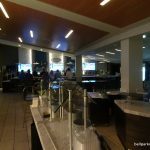 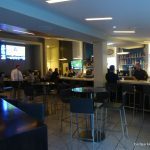 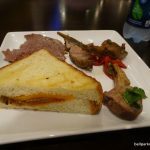 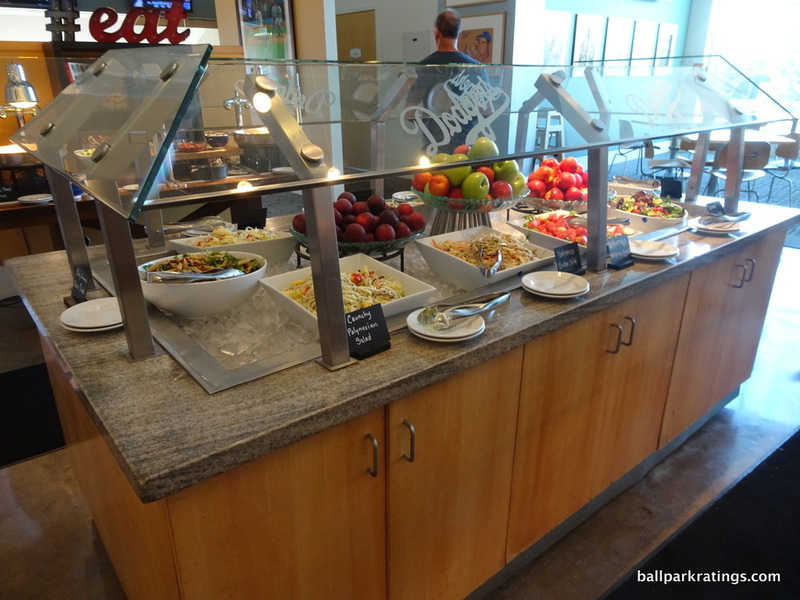 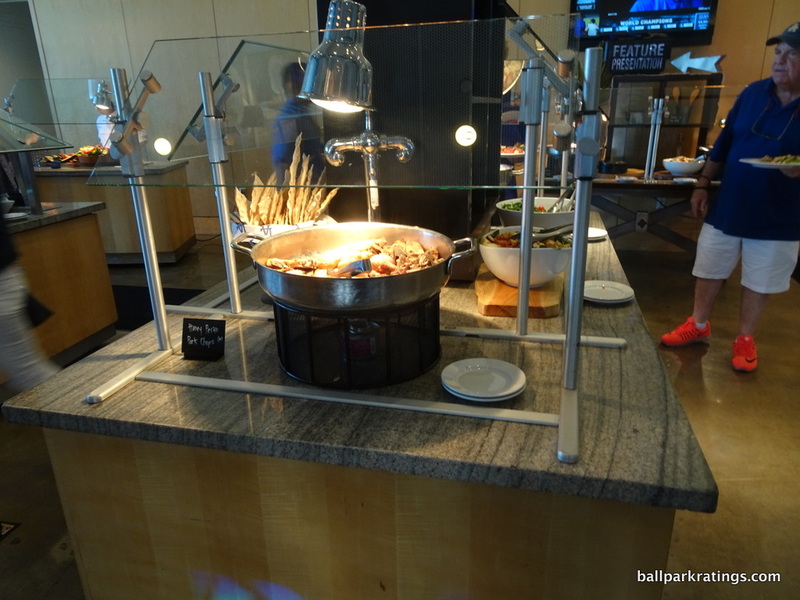 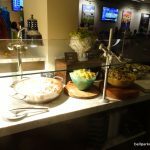 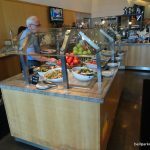 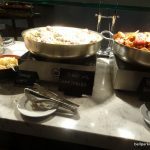 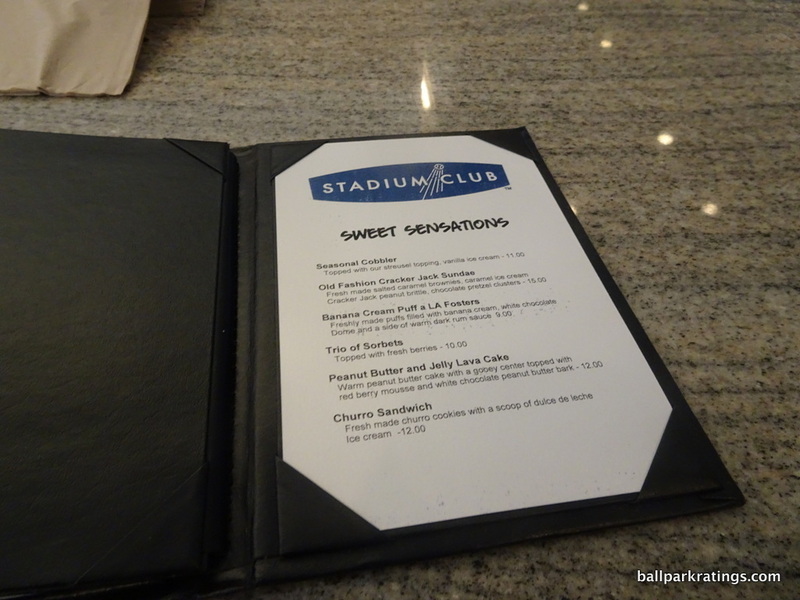 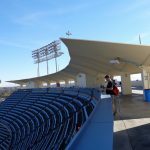 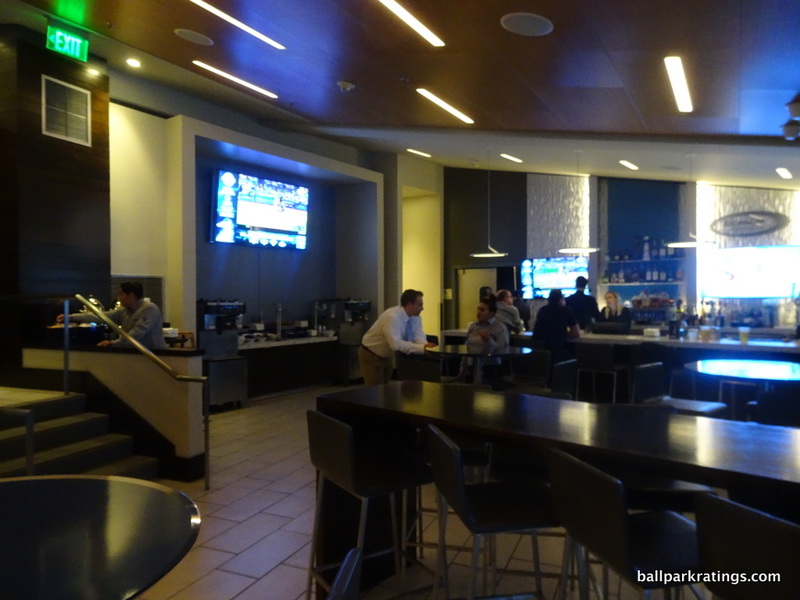 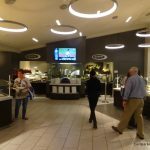 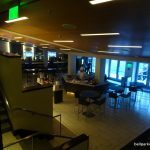 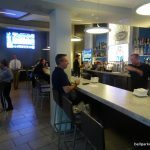 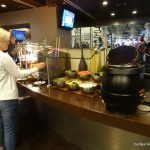 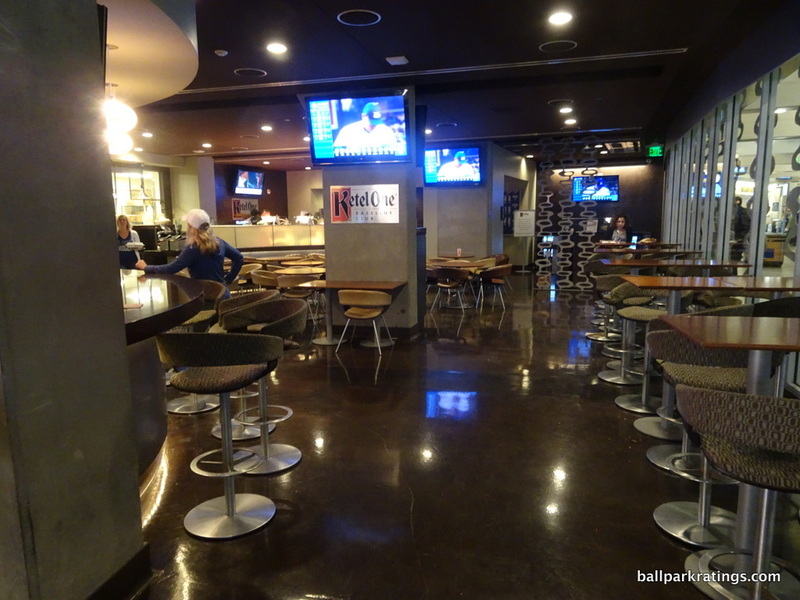 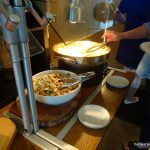 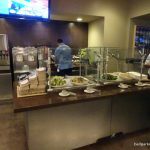 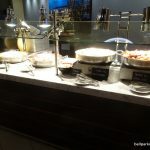 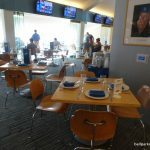 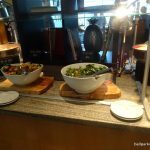 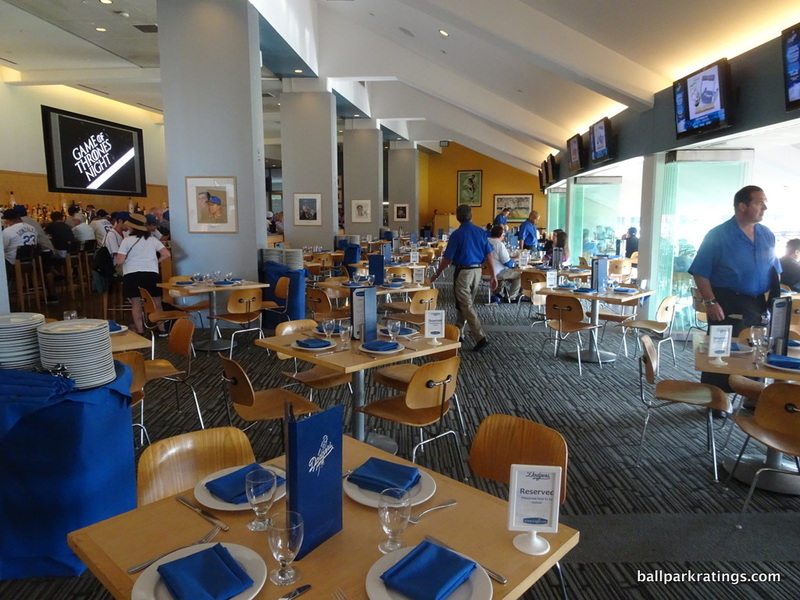 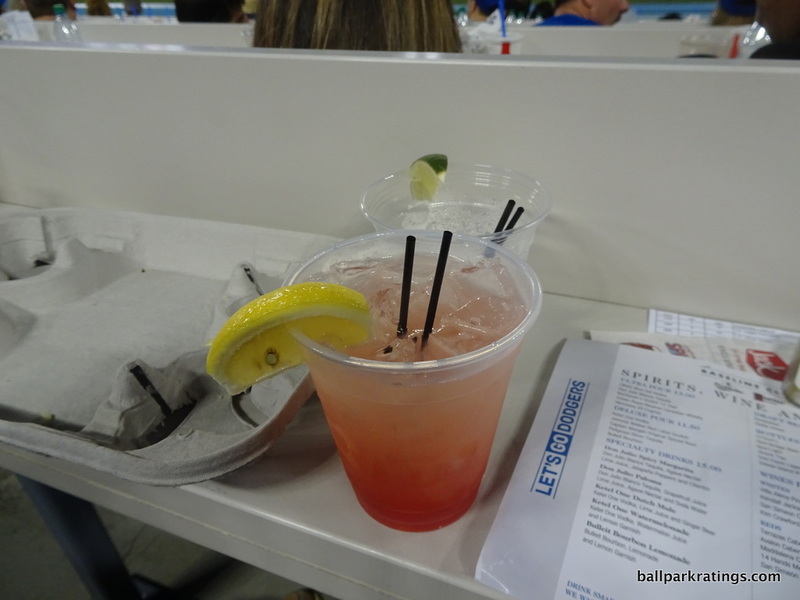 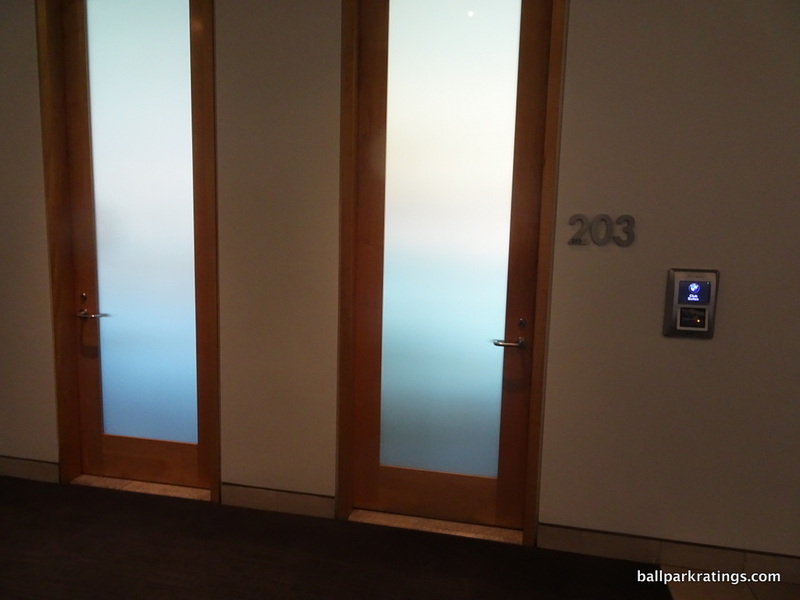 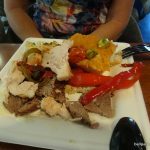 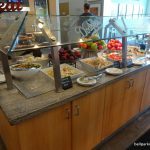 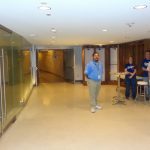 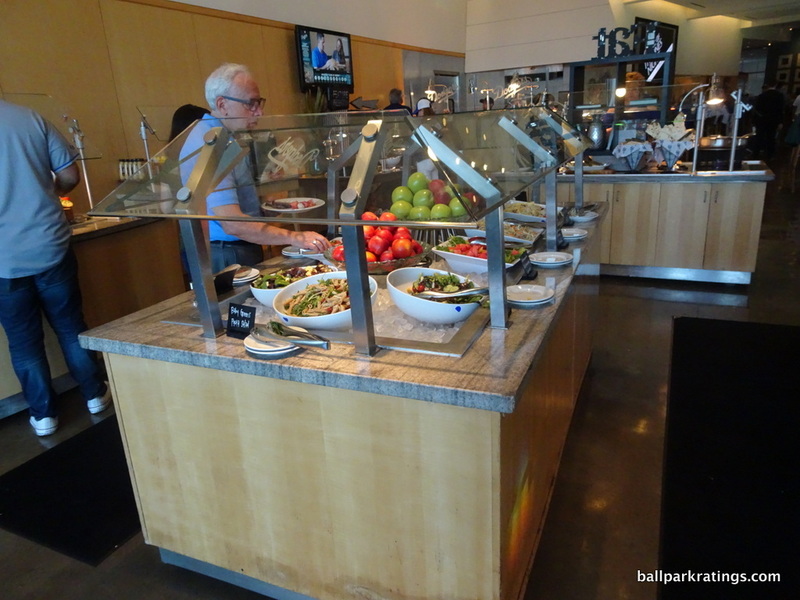 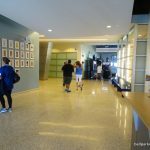 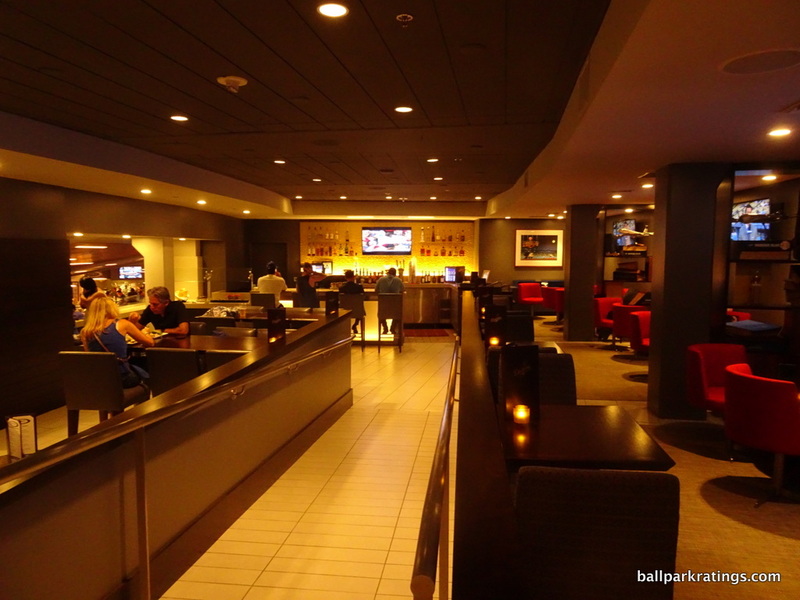 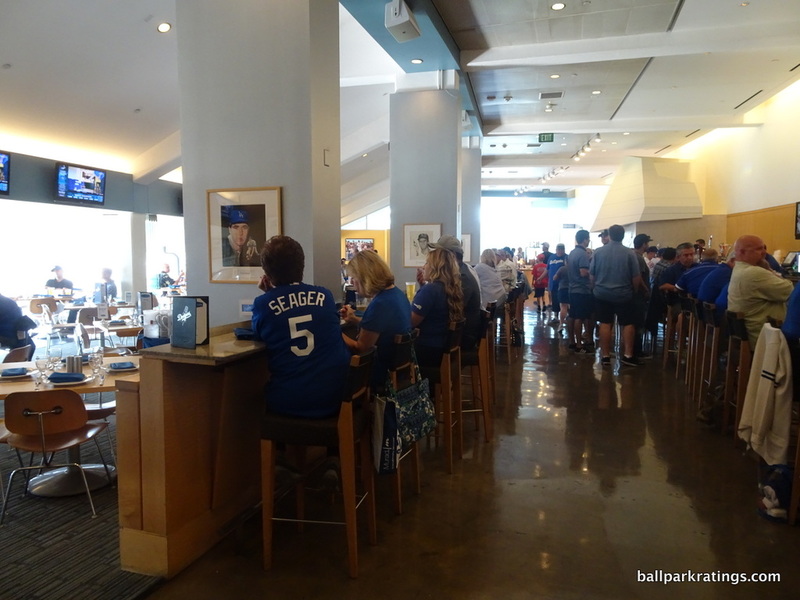 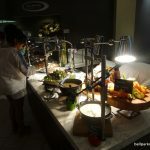 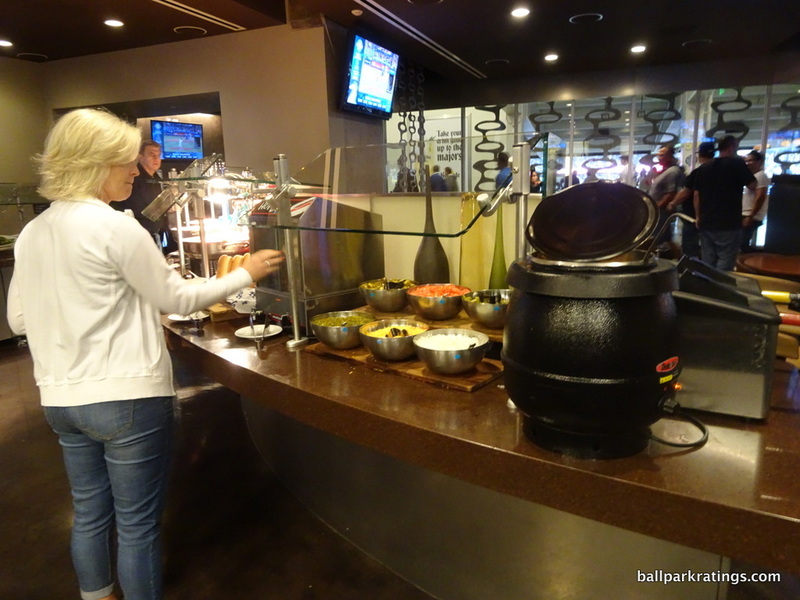 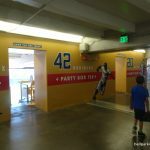 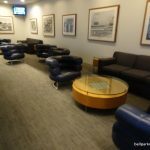 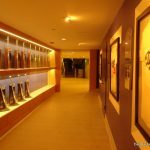 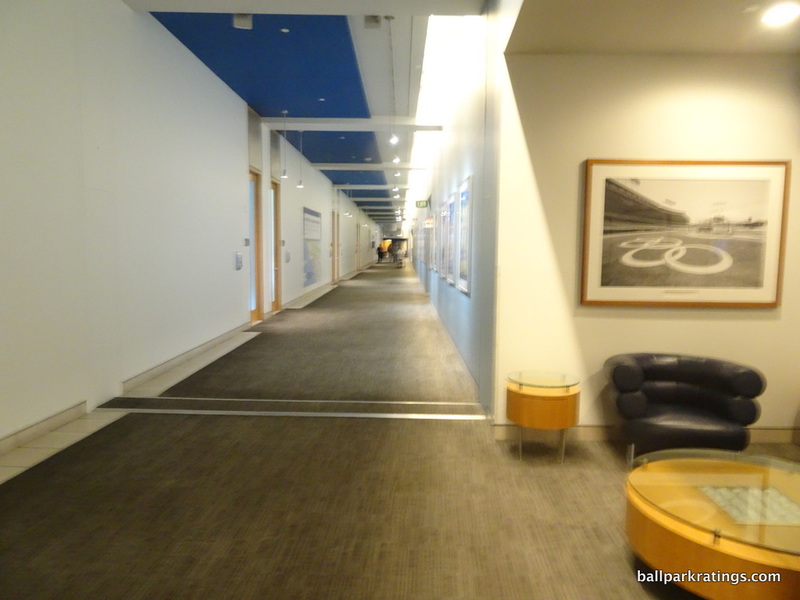 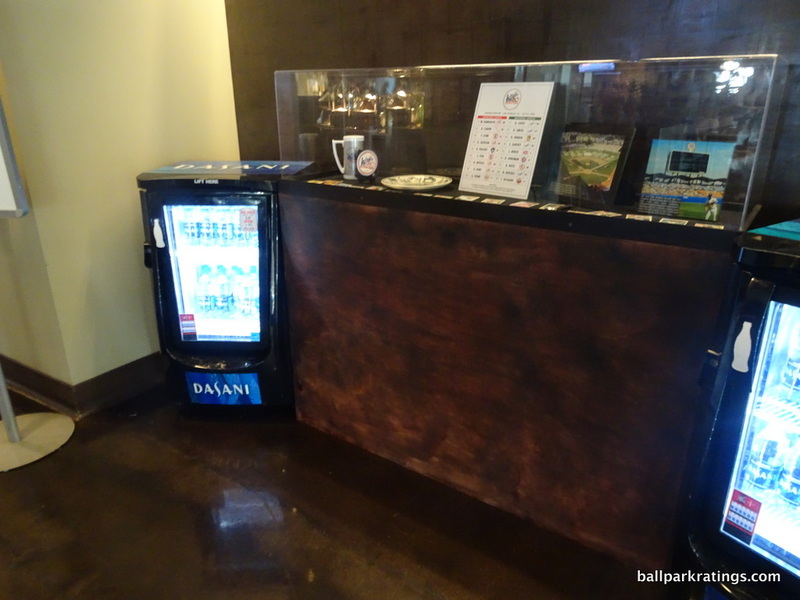 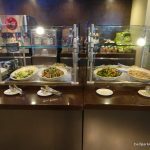 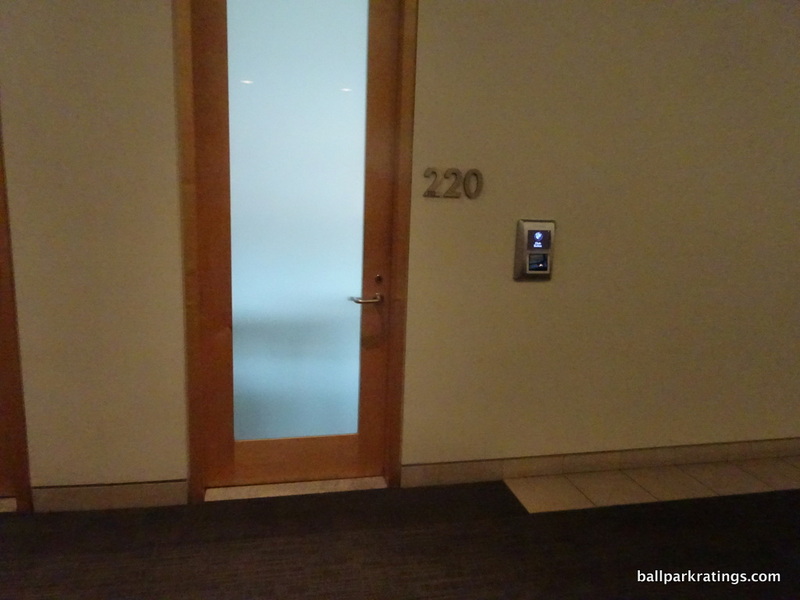 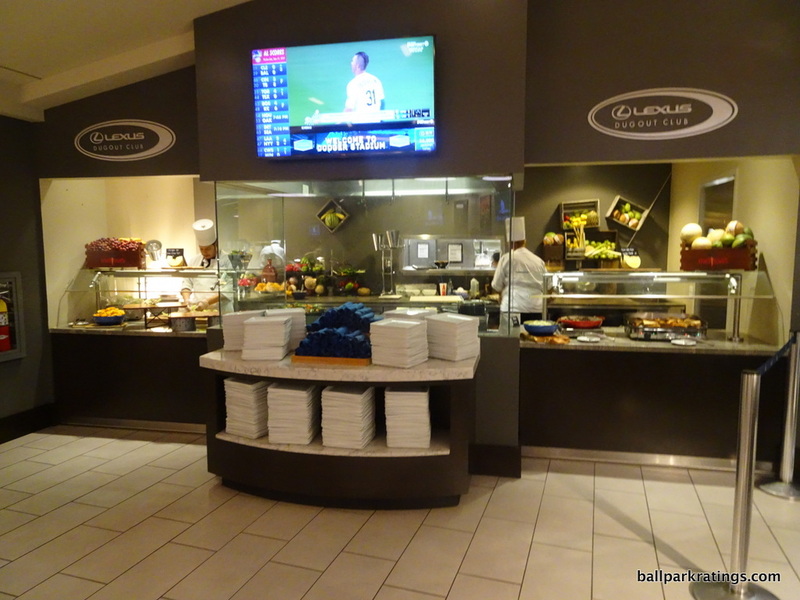 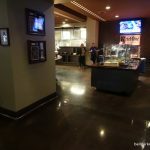 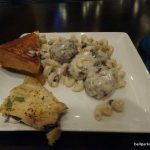 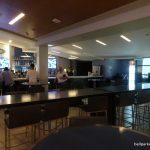 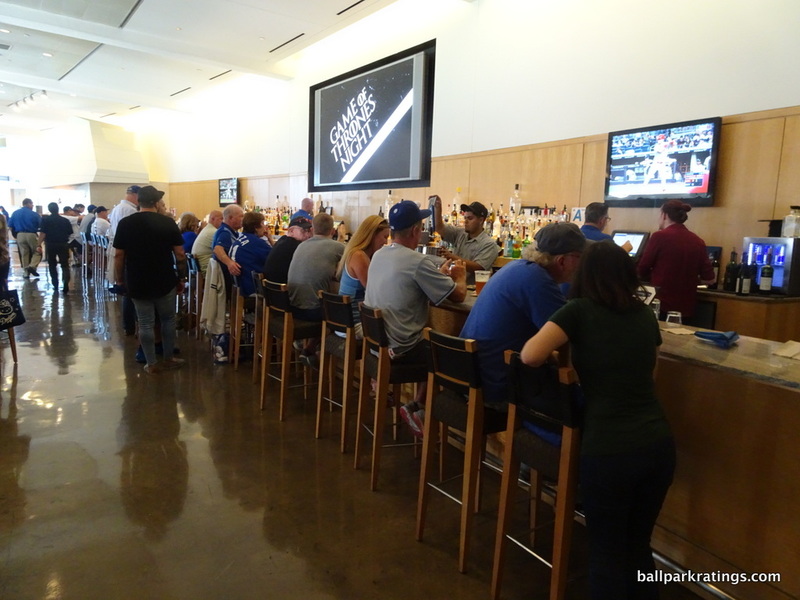 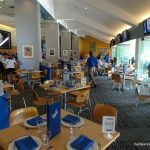 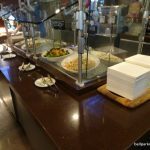 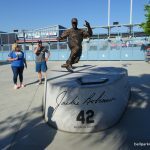 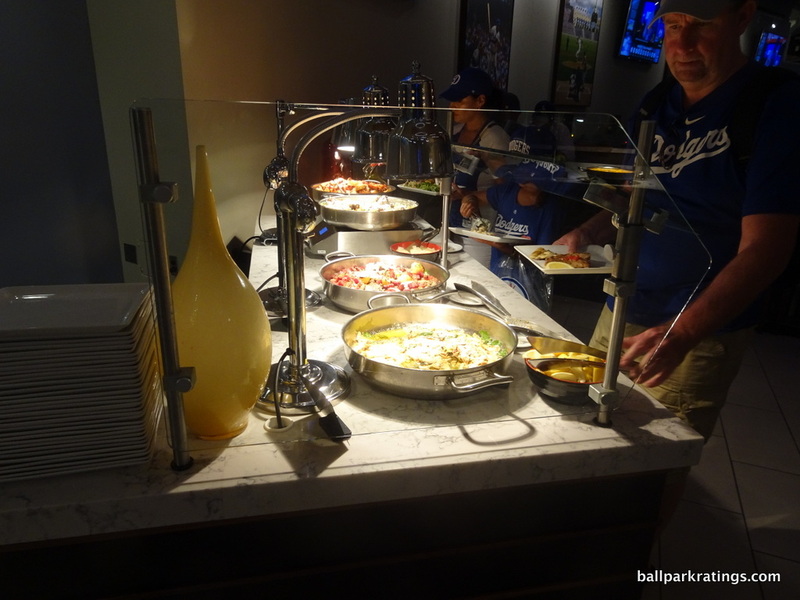 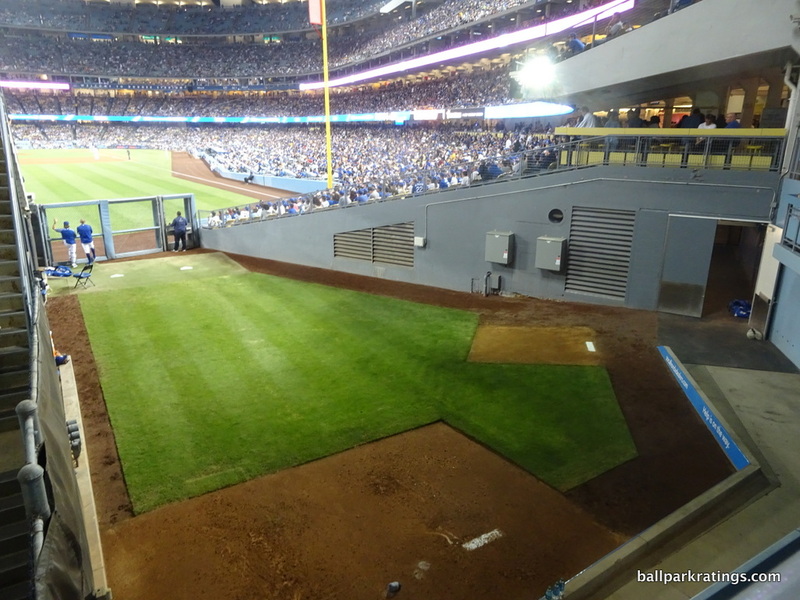 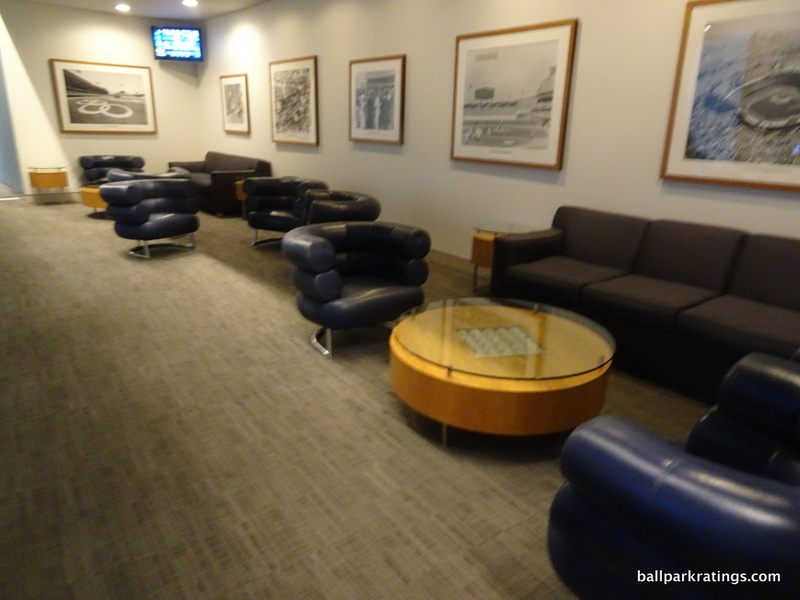 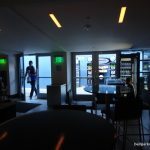 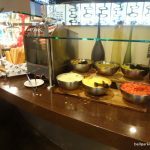 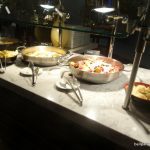 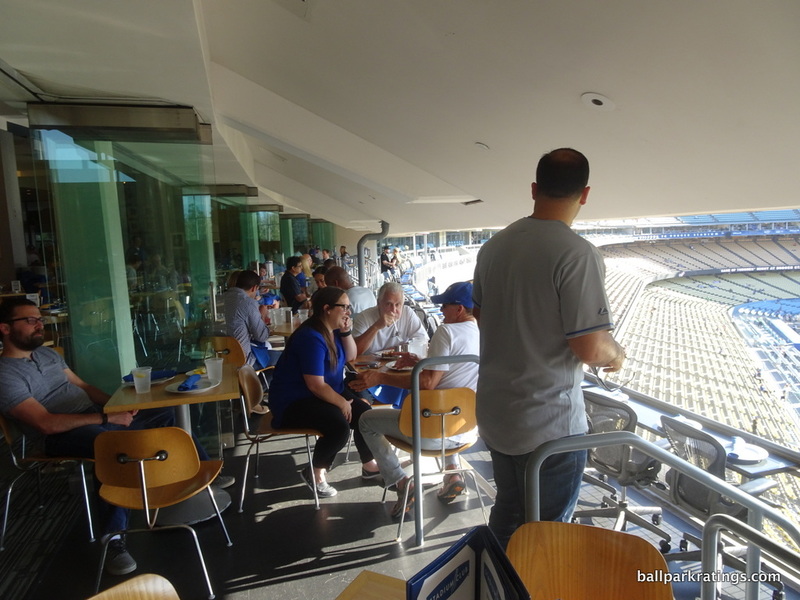 While it hasn’t undergone a renovation project on the scale of that at Kauffman Stadium, Dodger Stadium possesses average amenities. 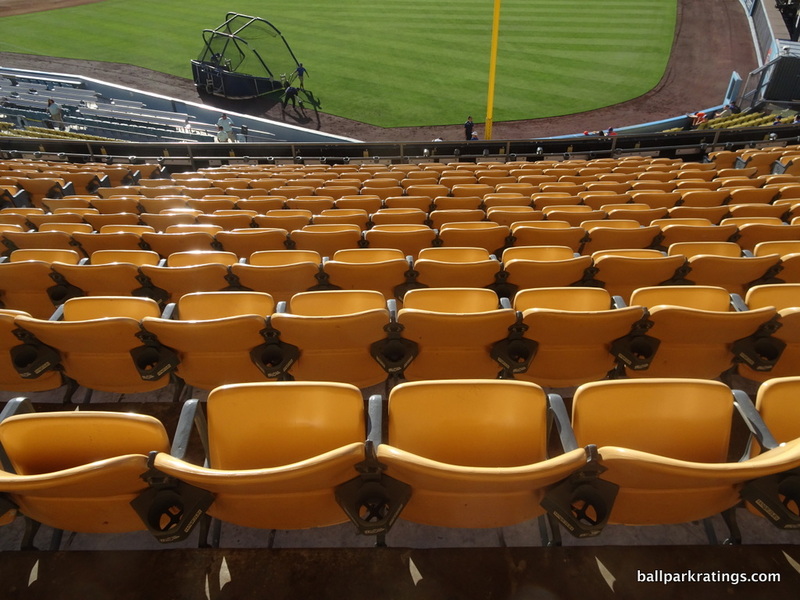 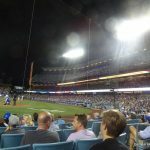 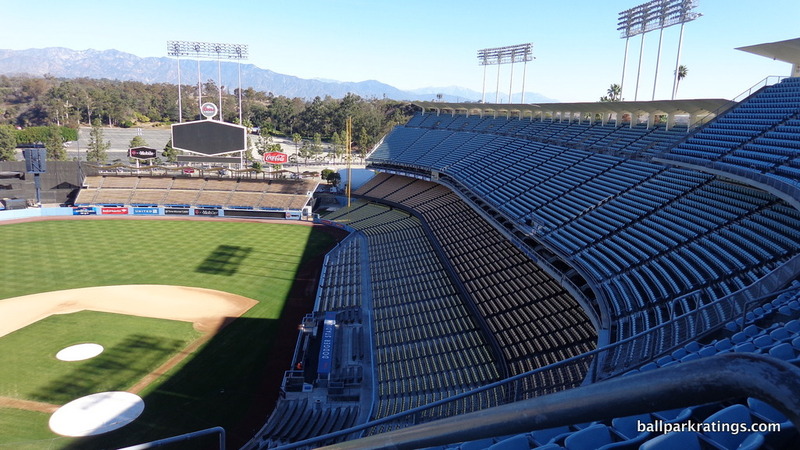 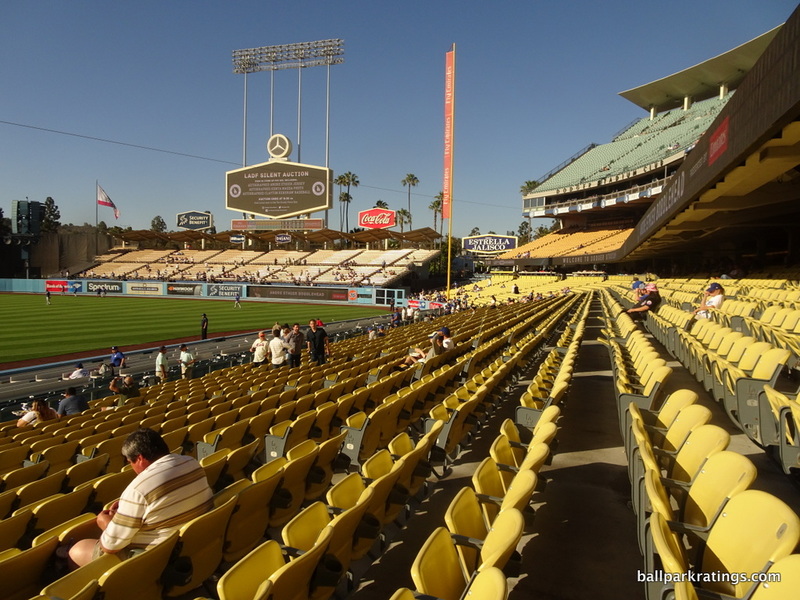 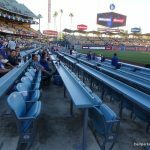 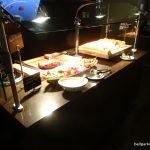 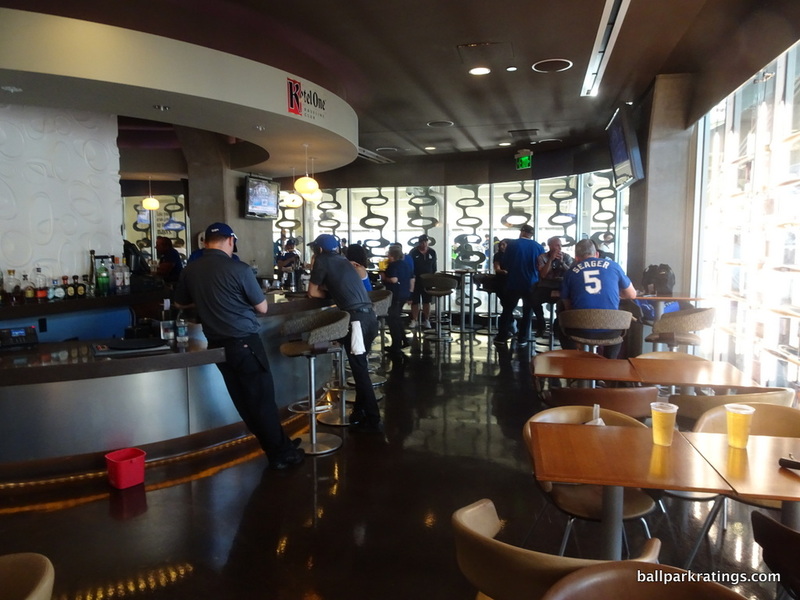 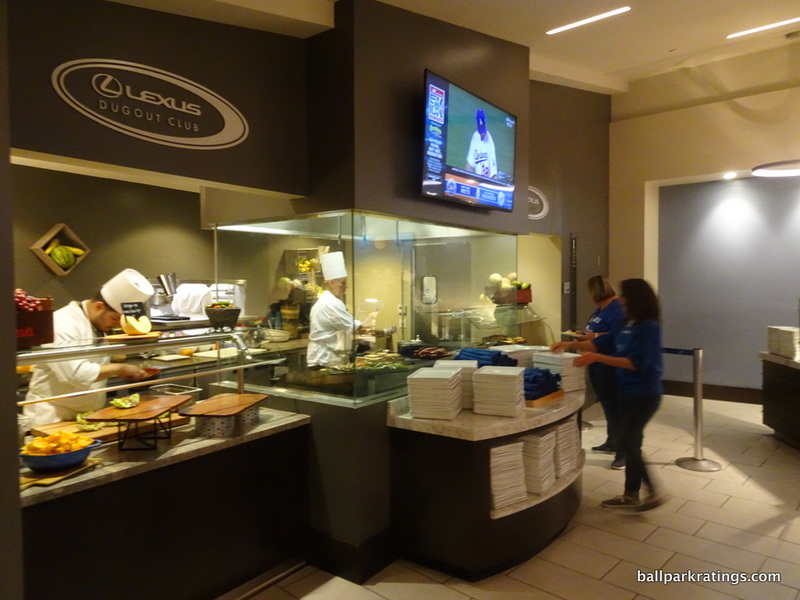 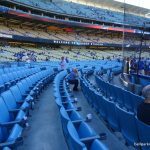 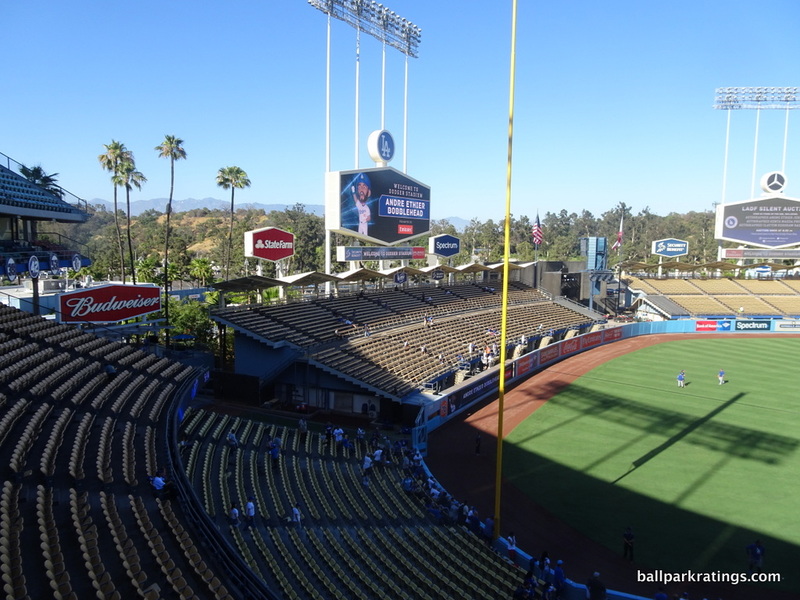 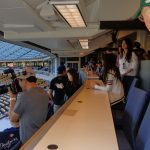 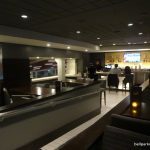 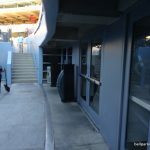 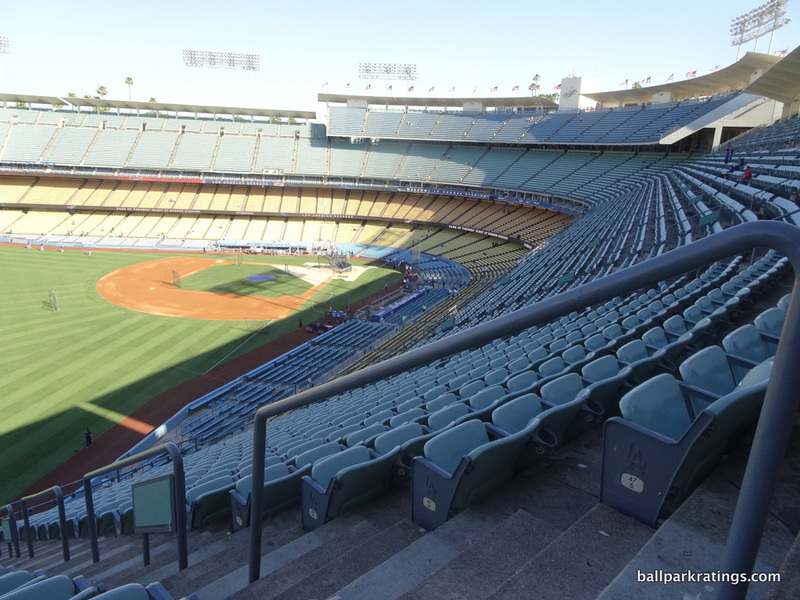 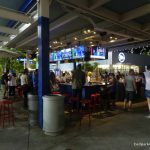 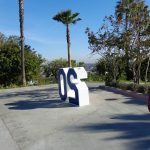 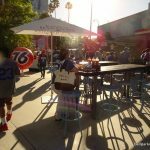 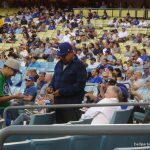 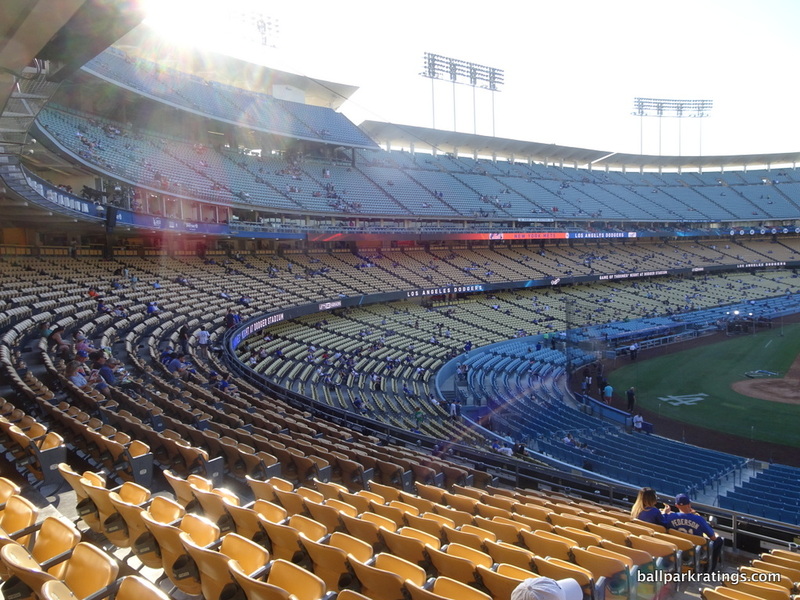 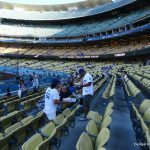 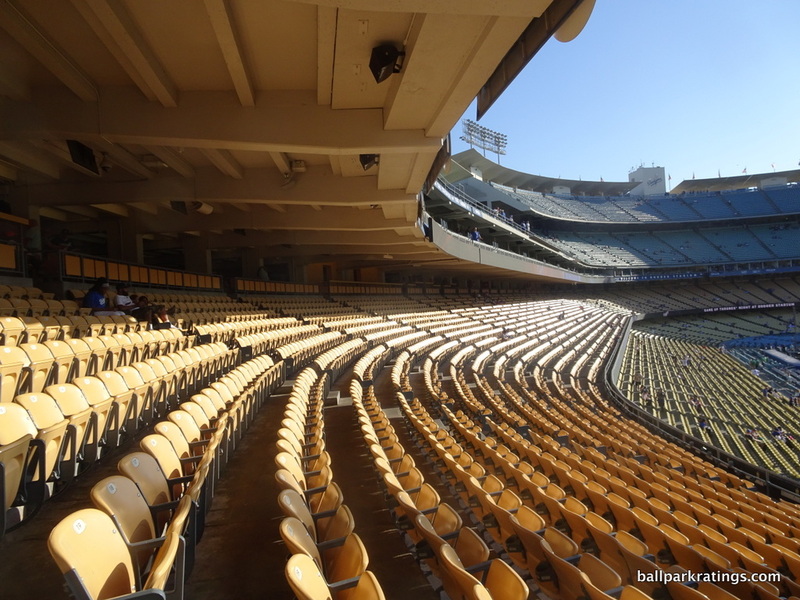 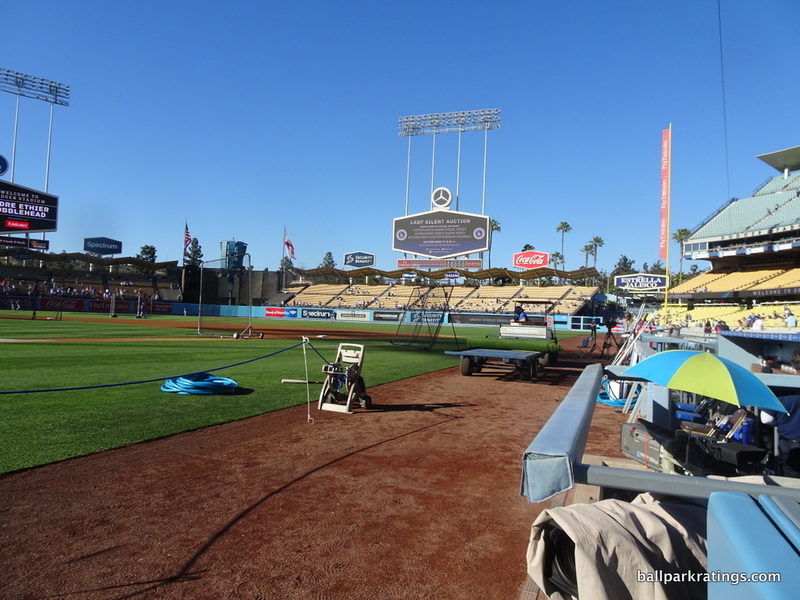 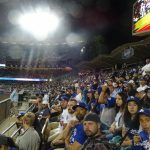 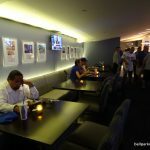 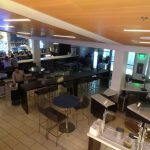 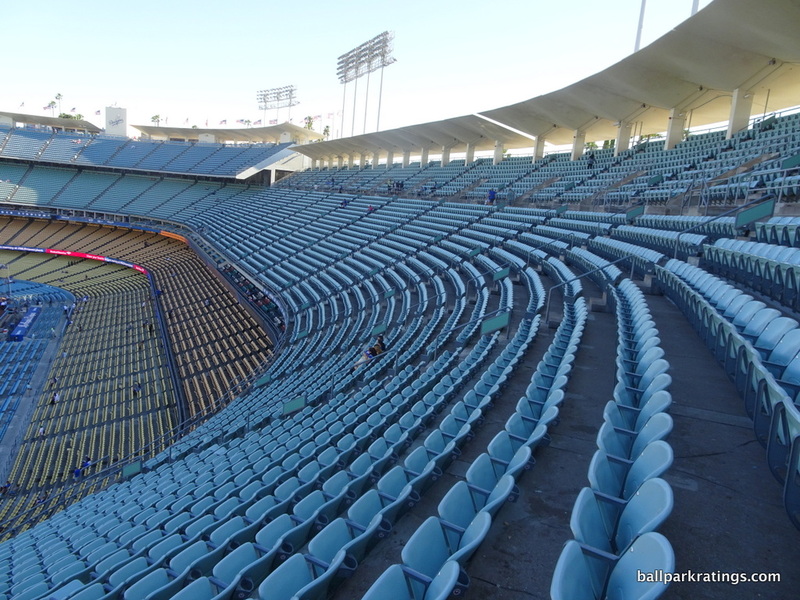 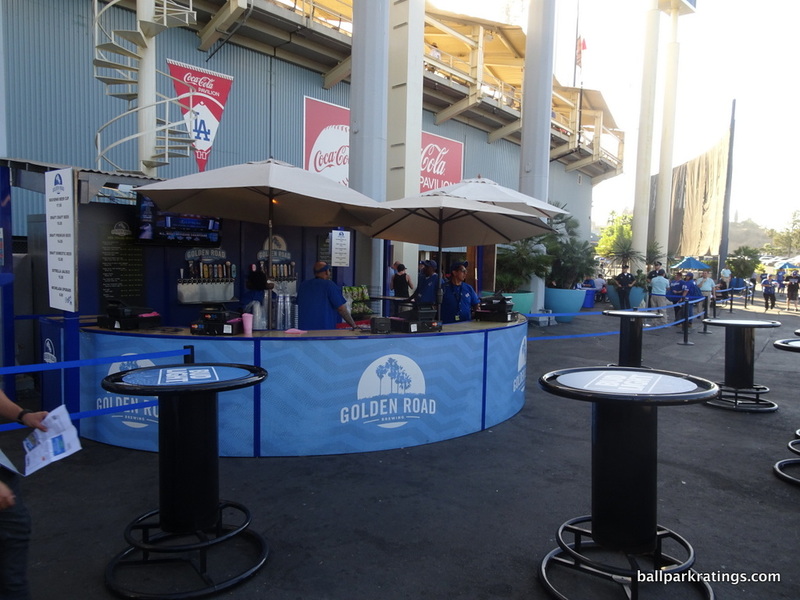 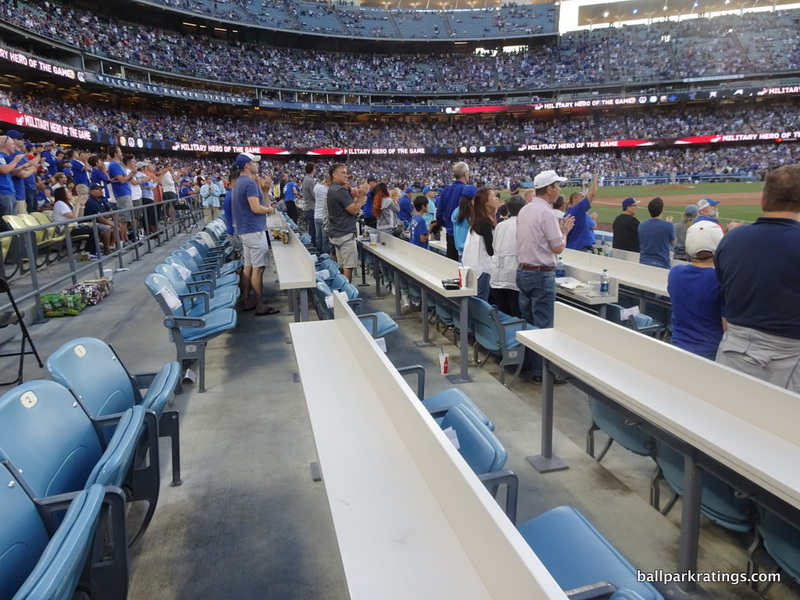 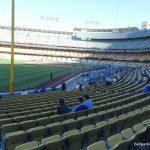 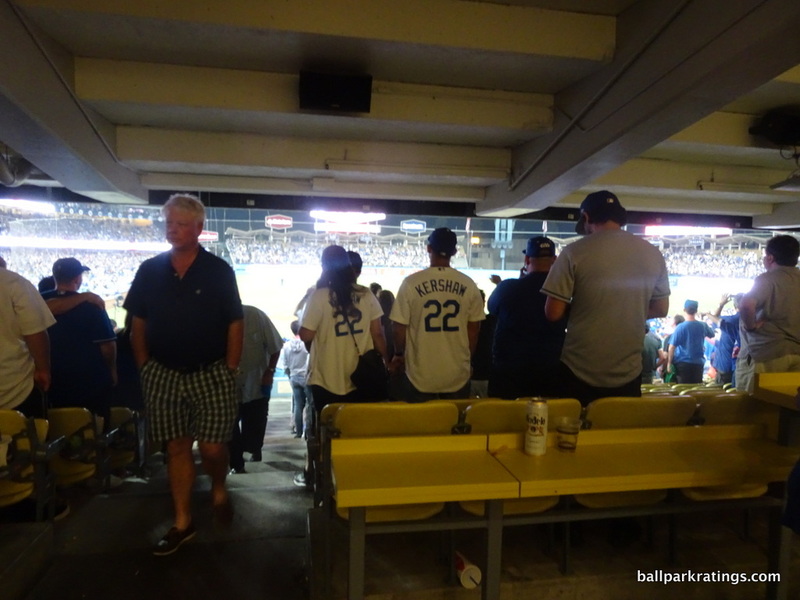 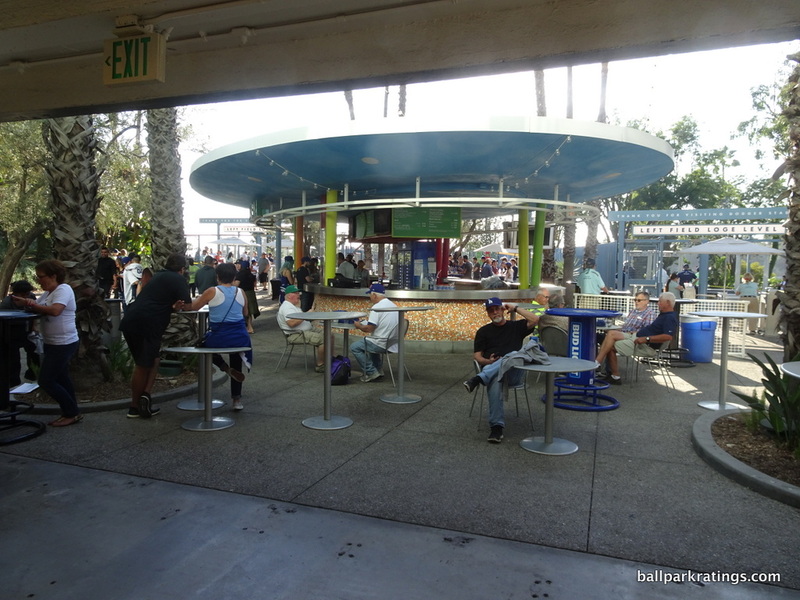 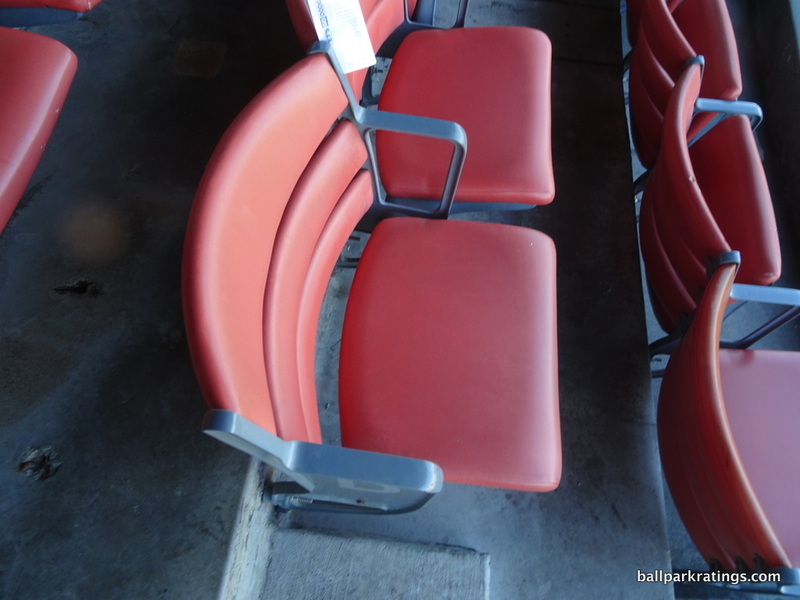 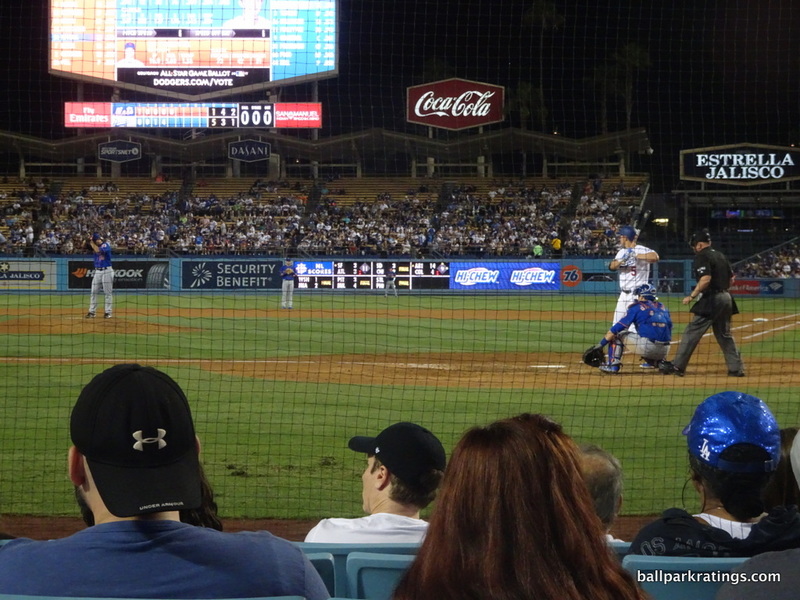 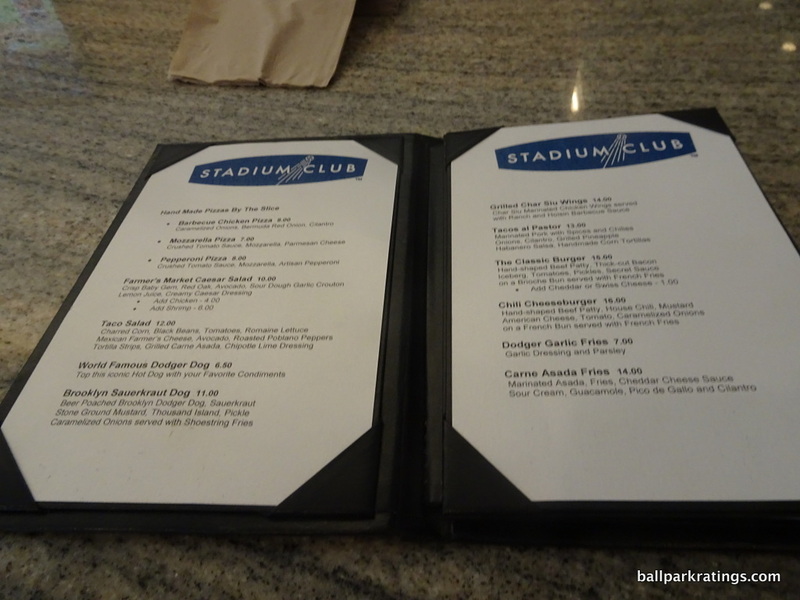 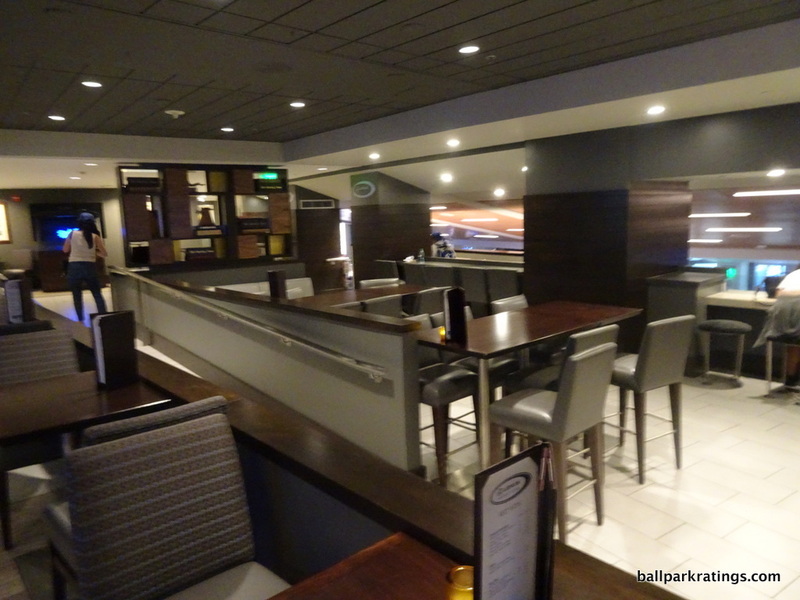 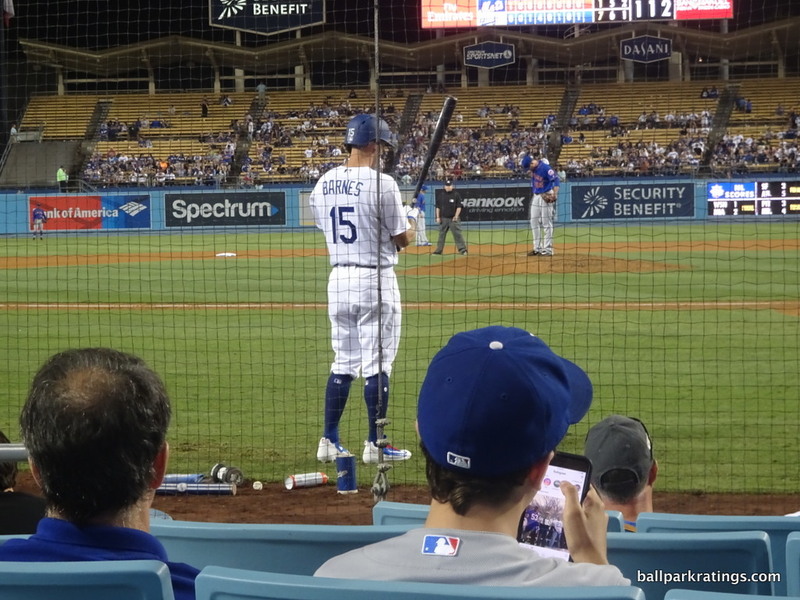 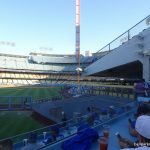 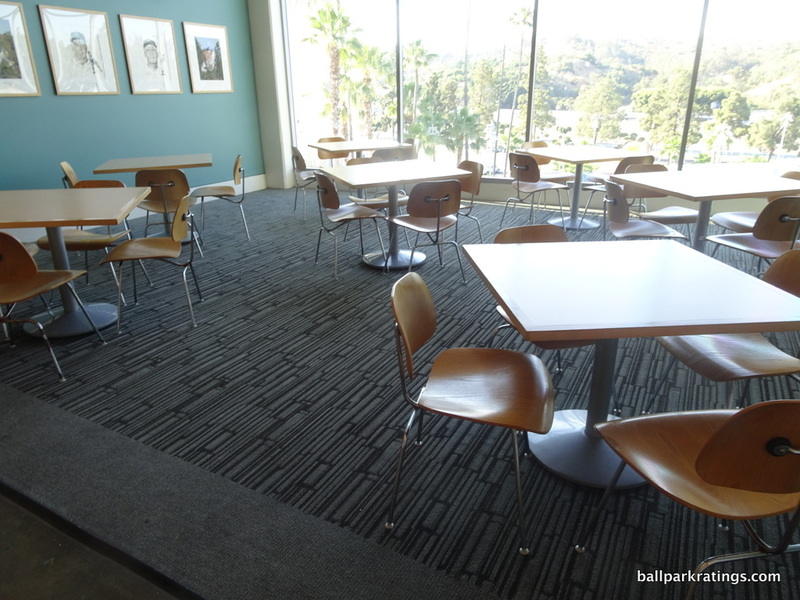 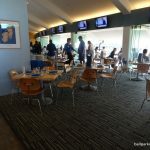 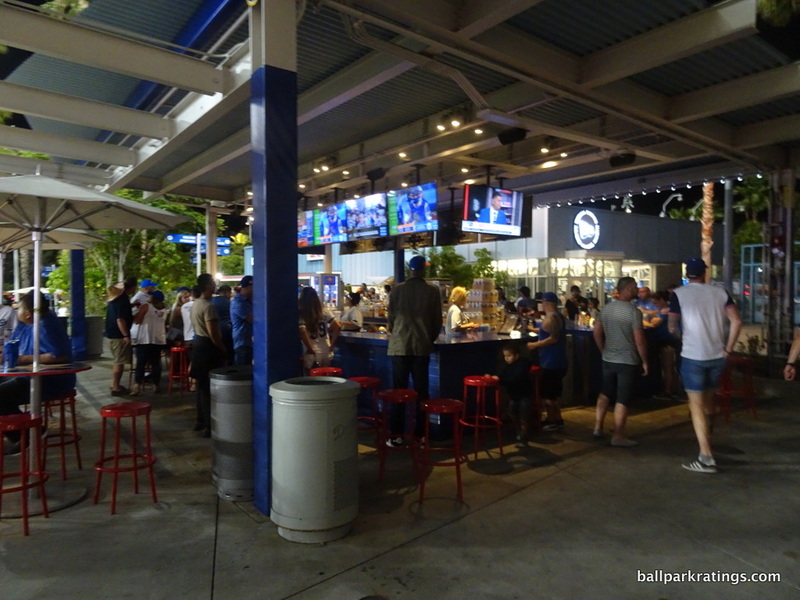 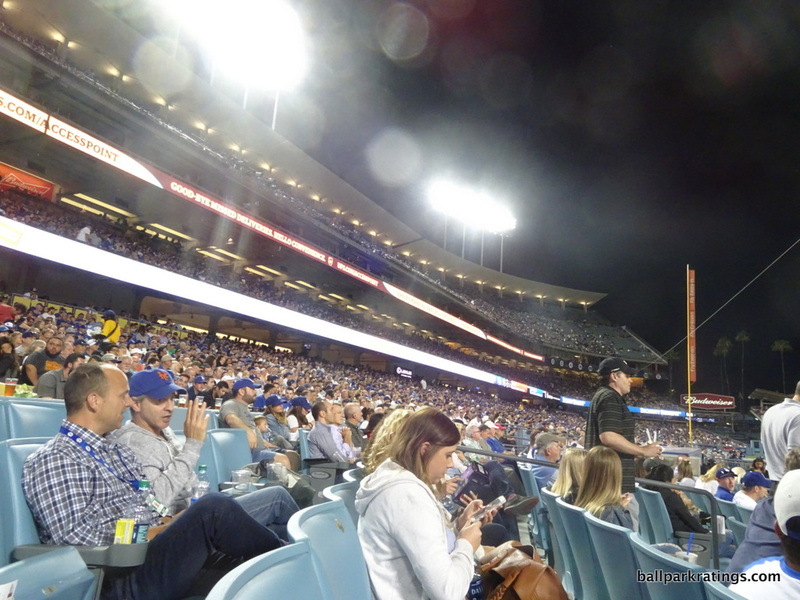 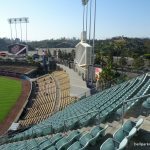 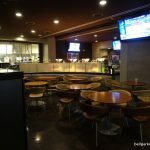 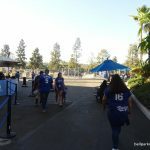 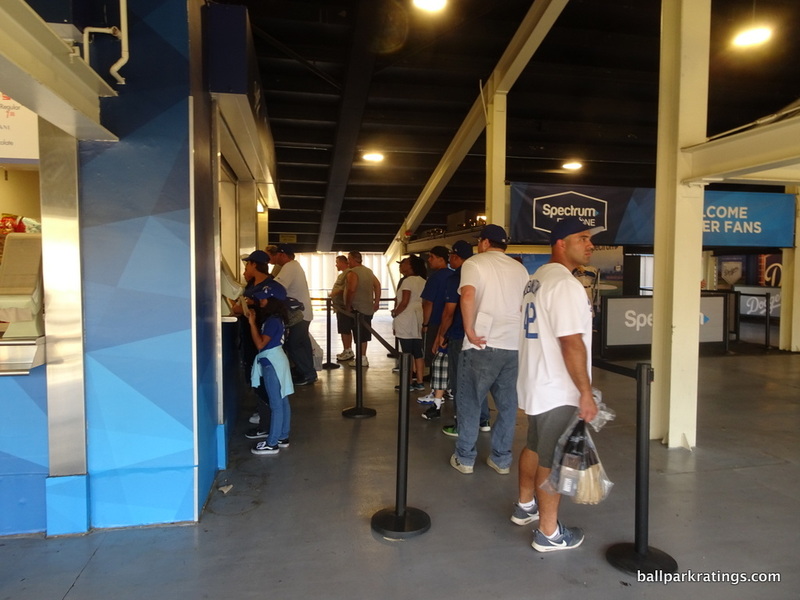 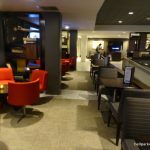 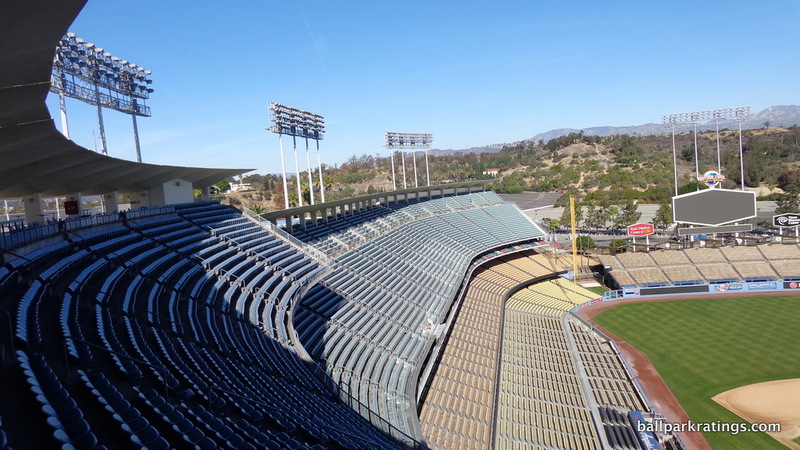 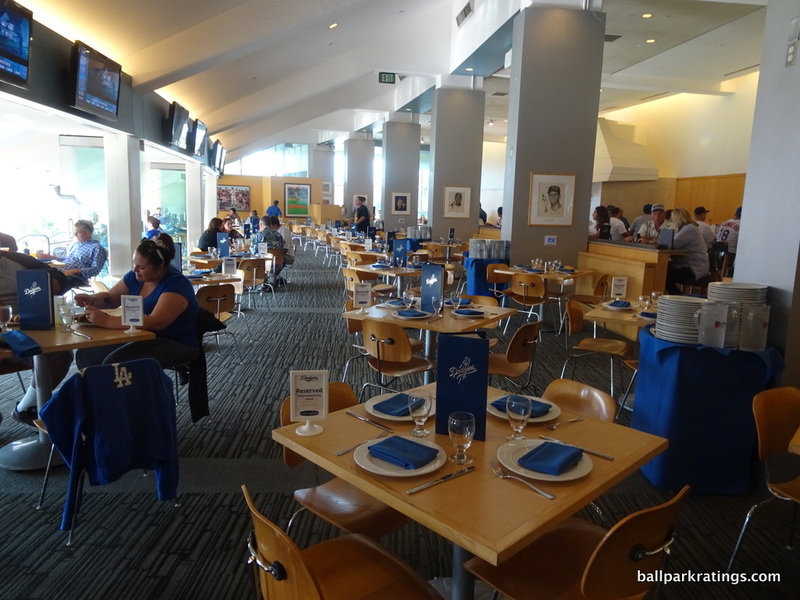 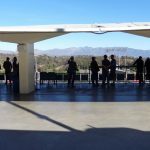 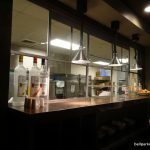 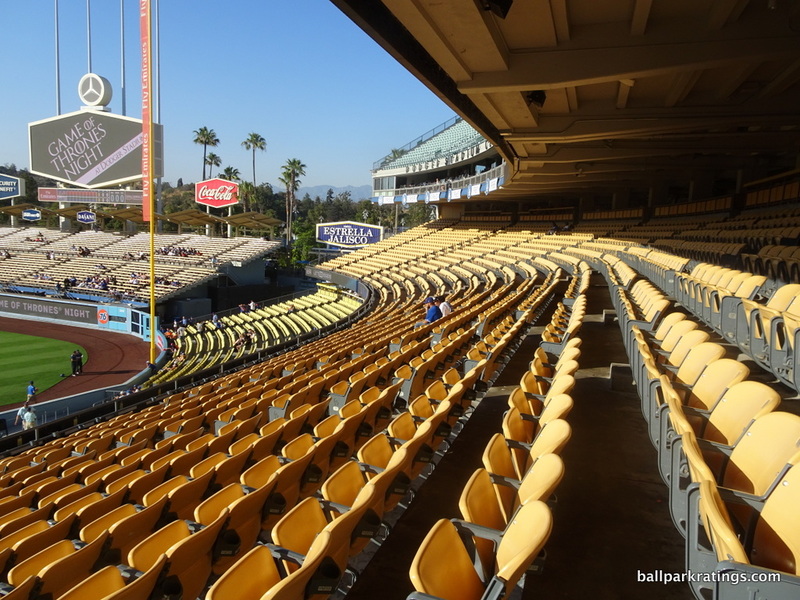 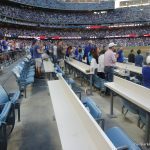 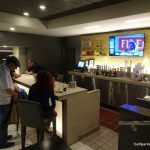 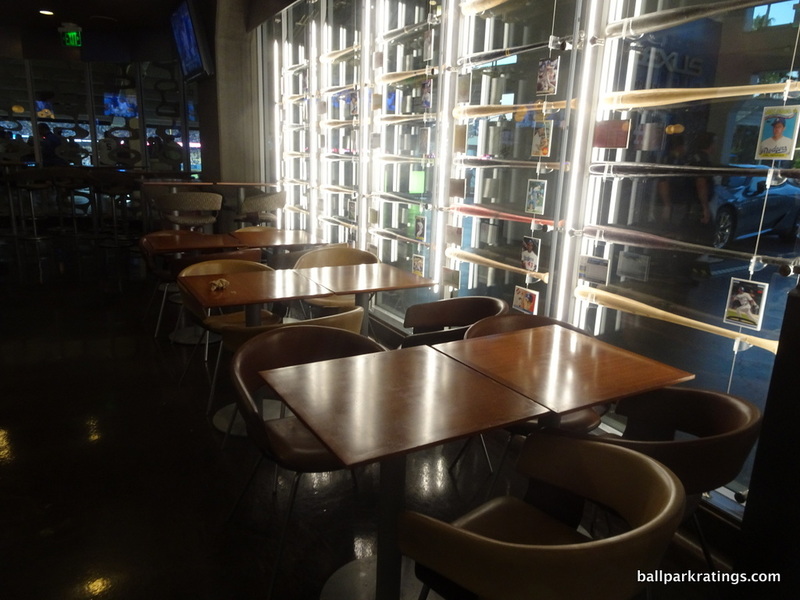 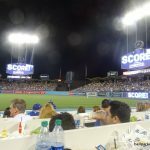 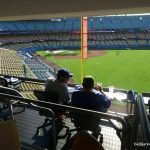 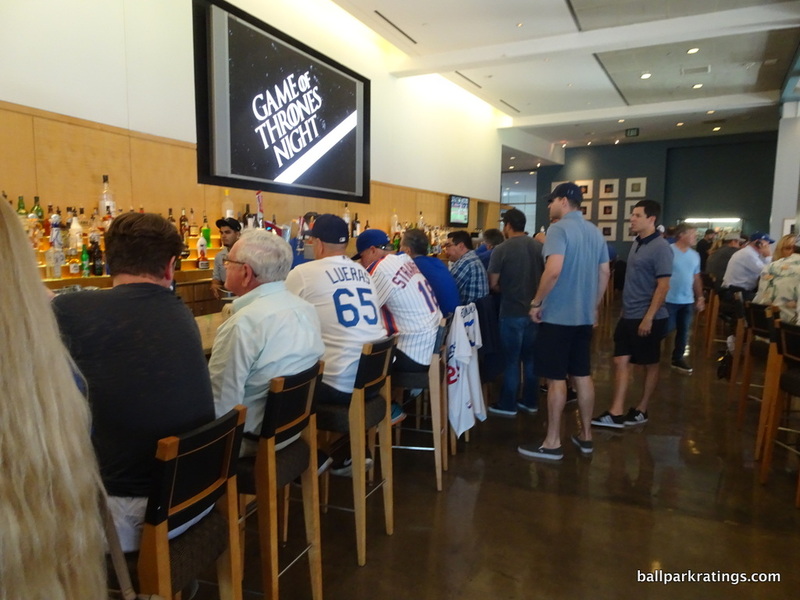 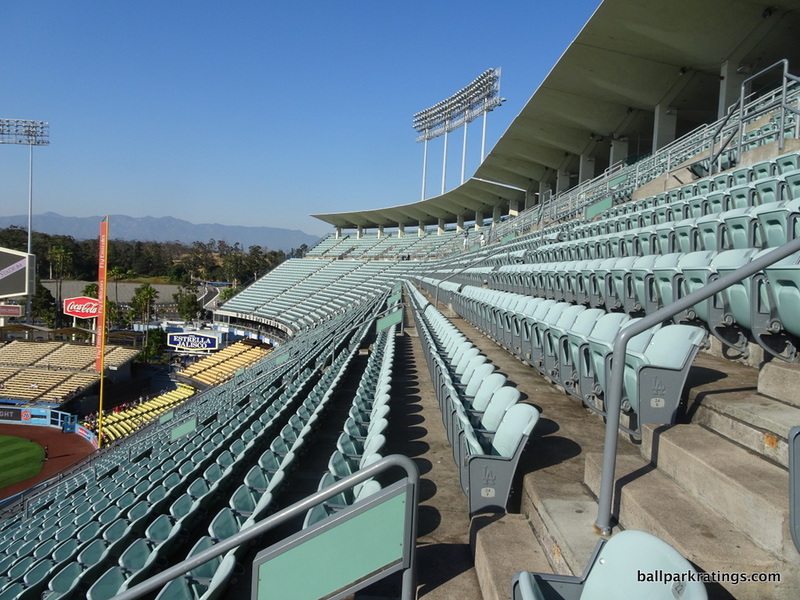 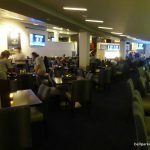 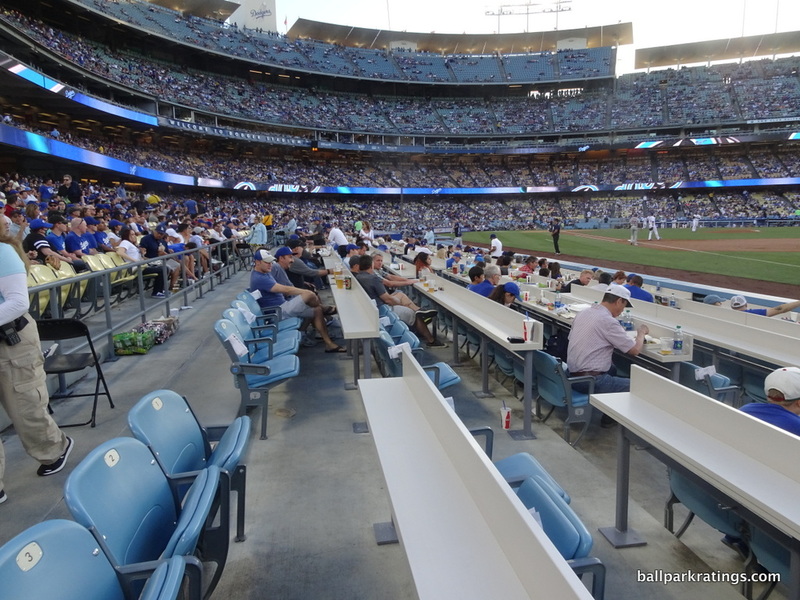 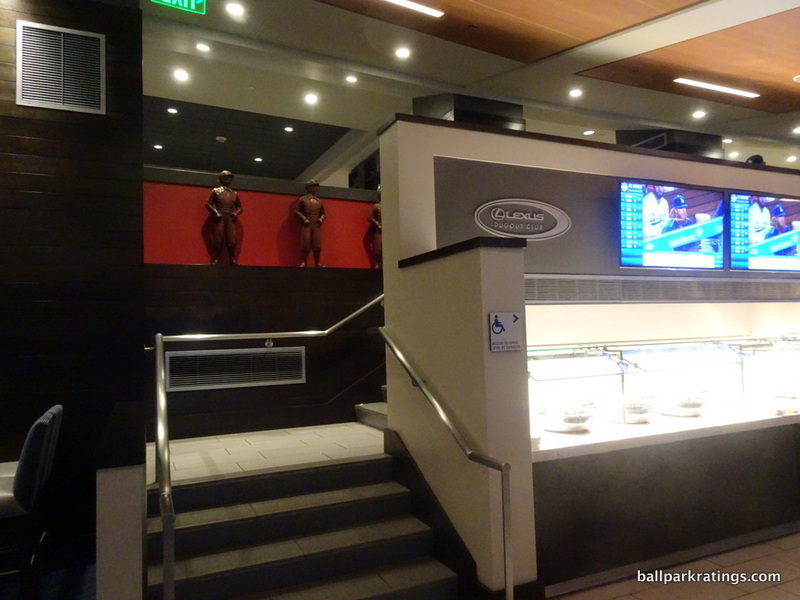 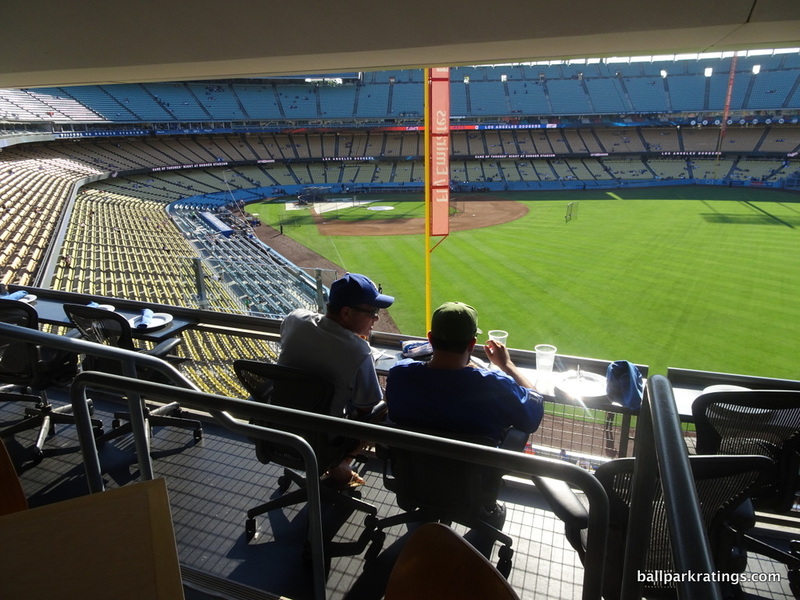 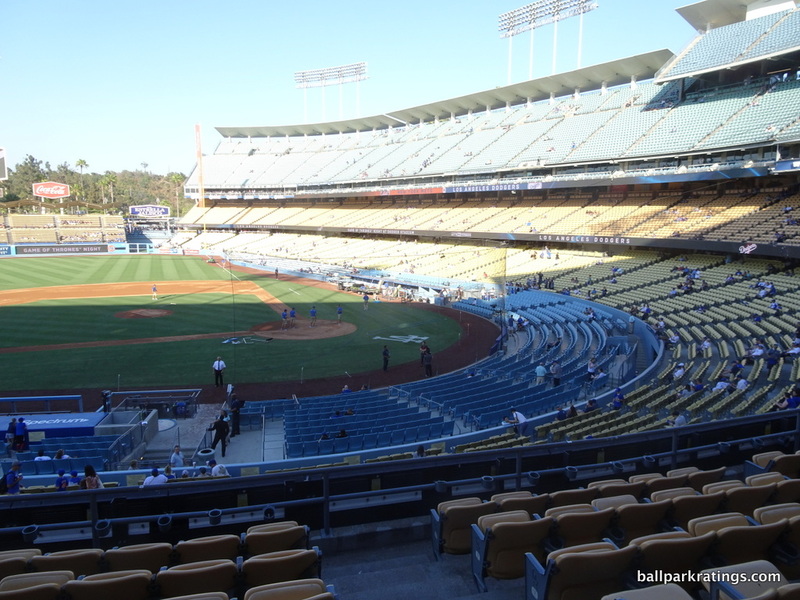 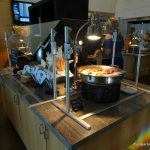 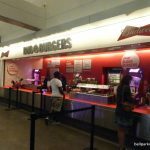 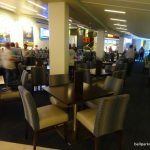 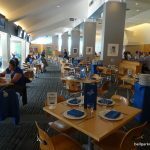 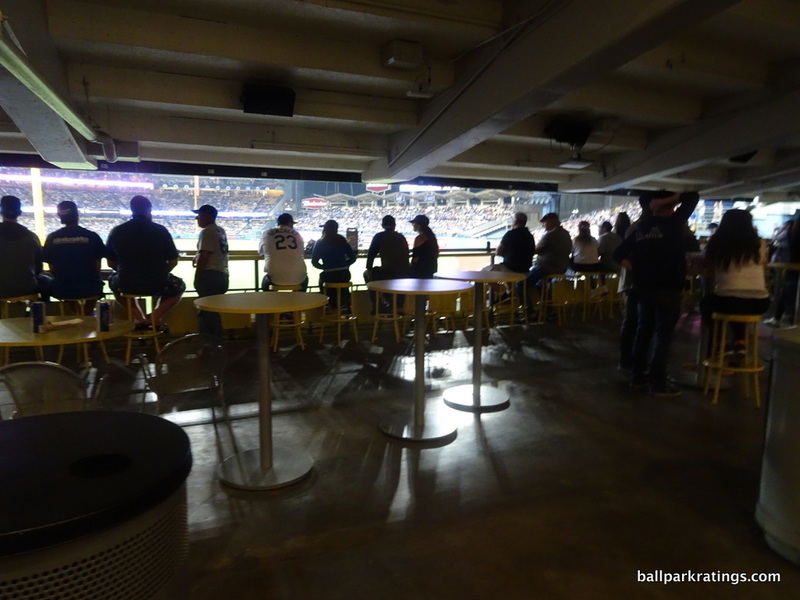 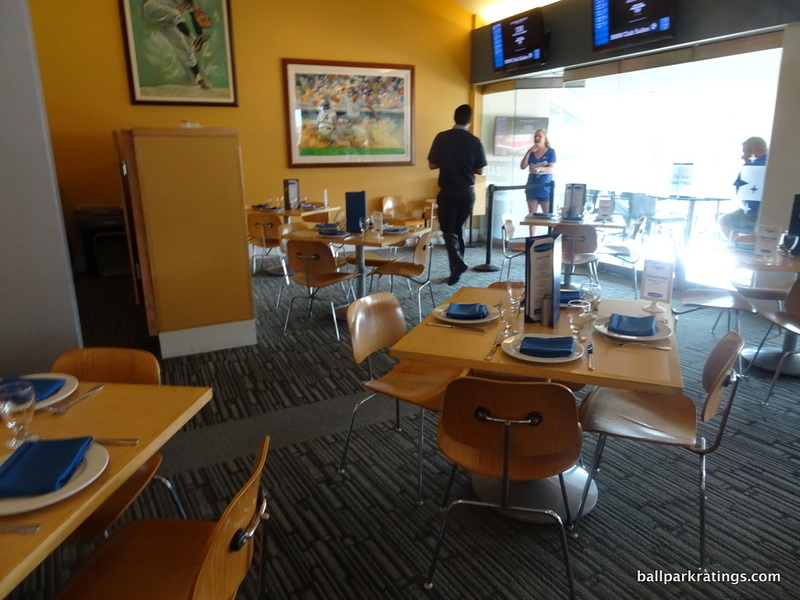 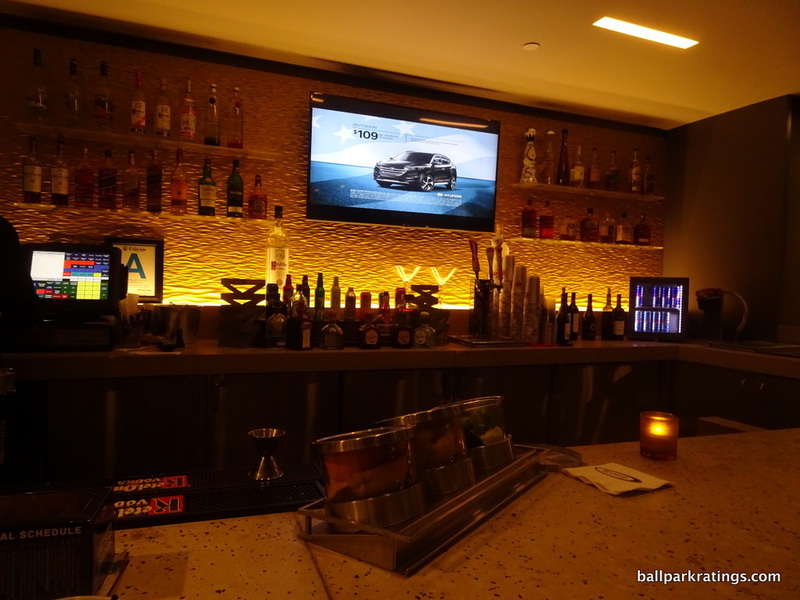 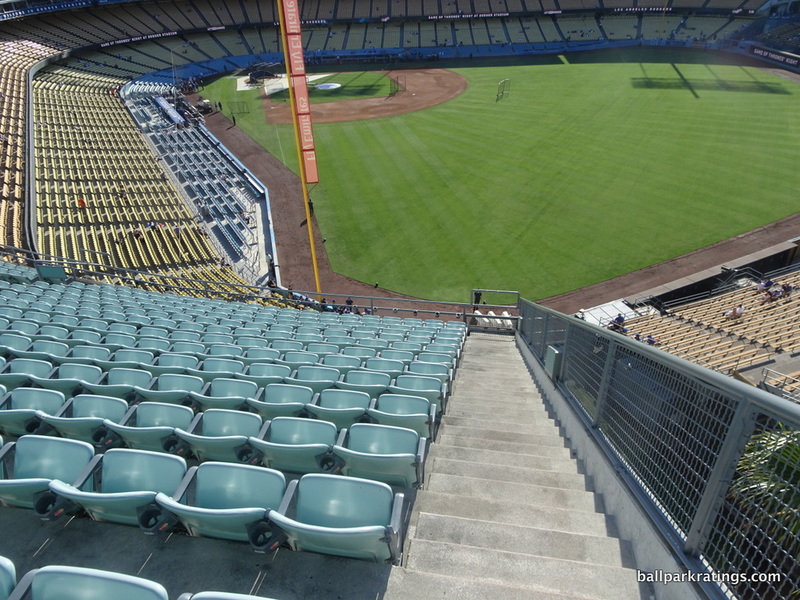 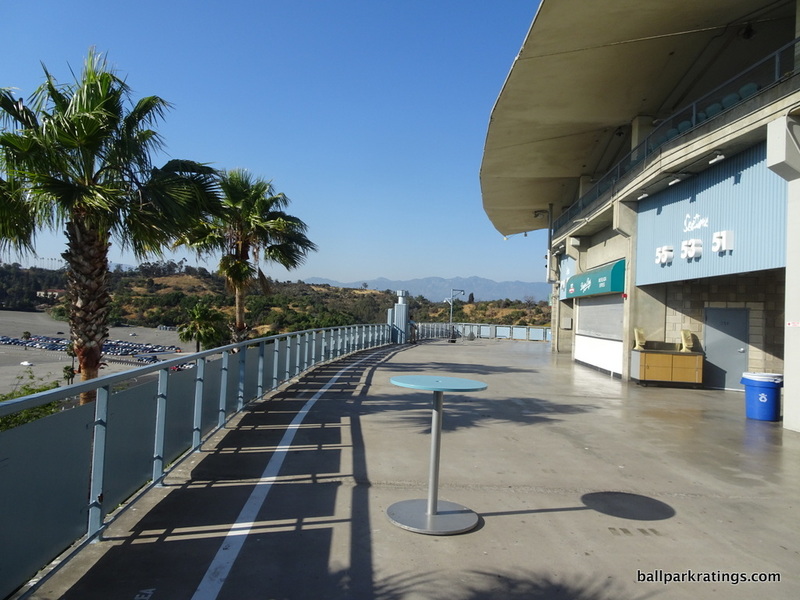 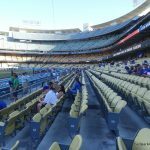 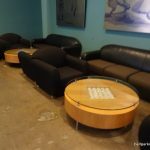 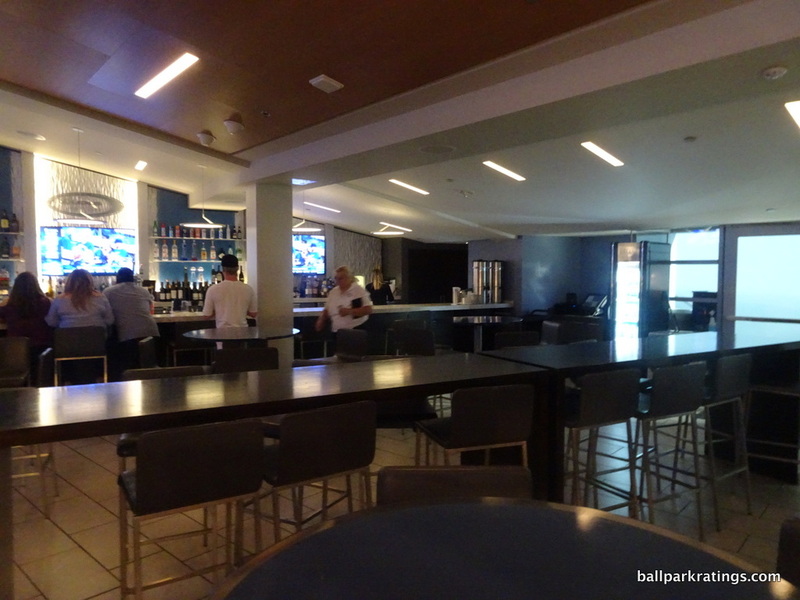 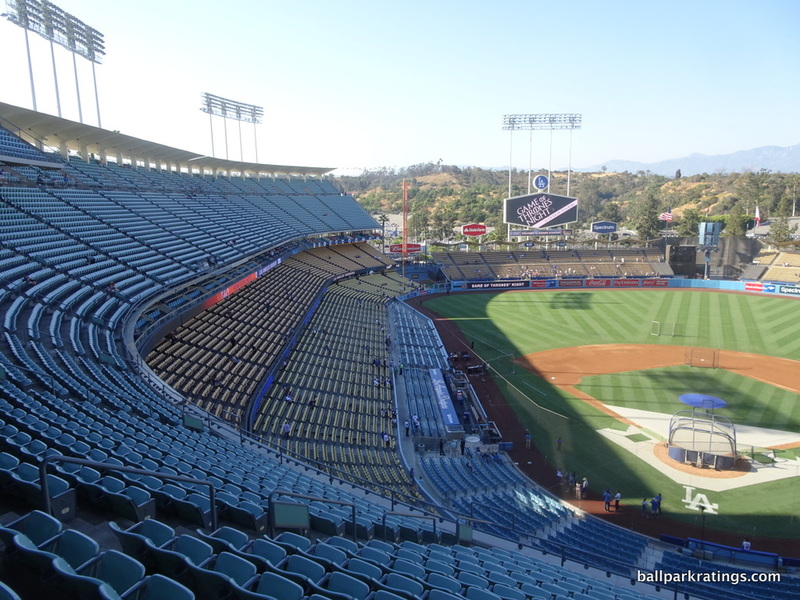 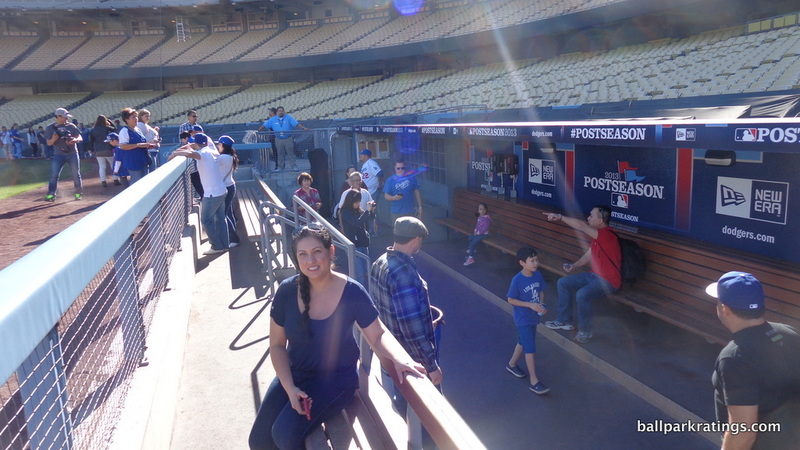 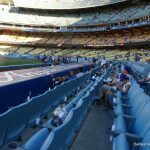 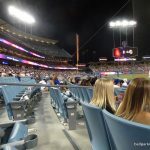 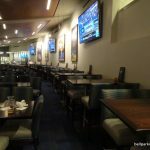 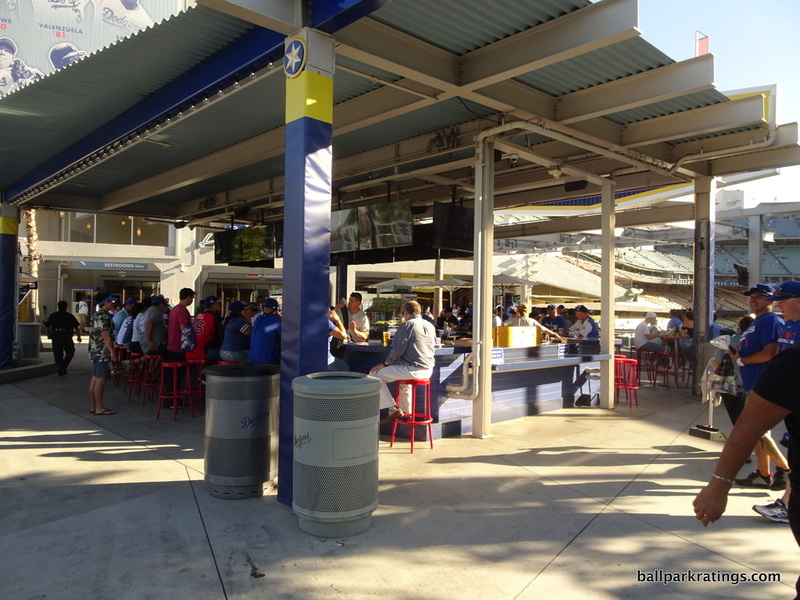 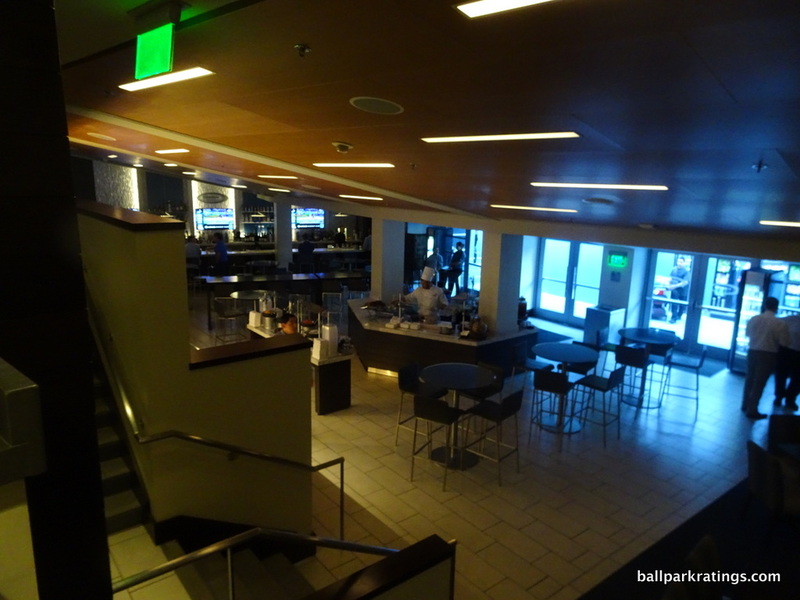 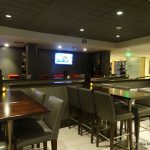 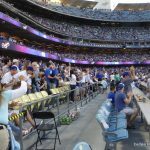 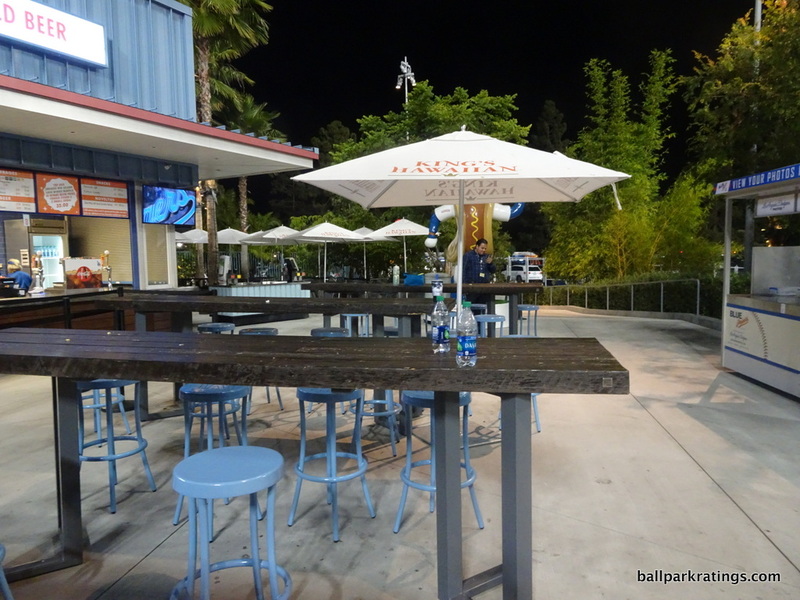 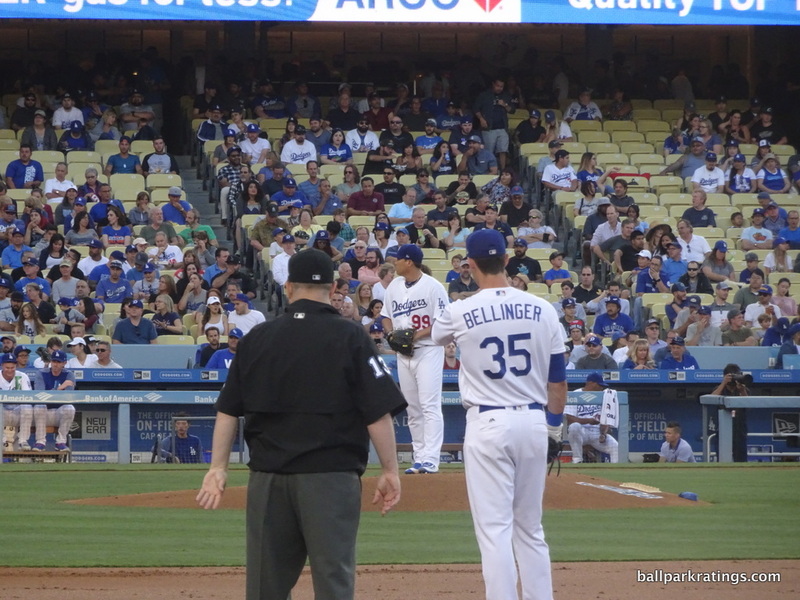 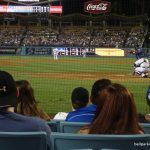 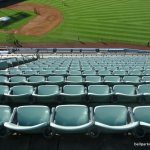 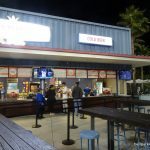 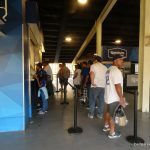 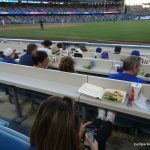 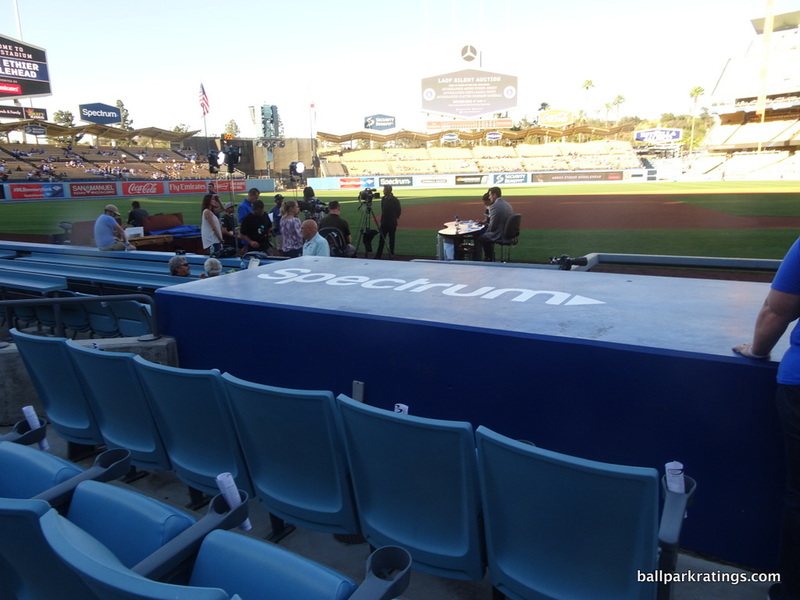 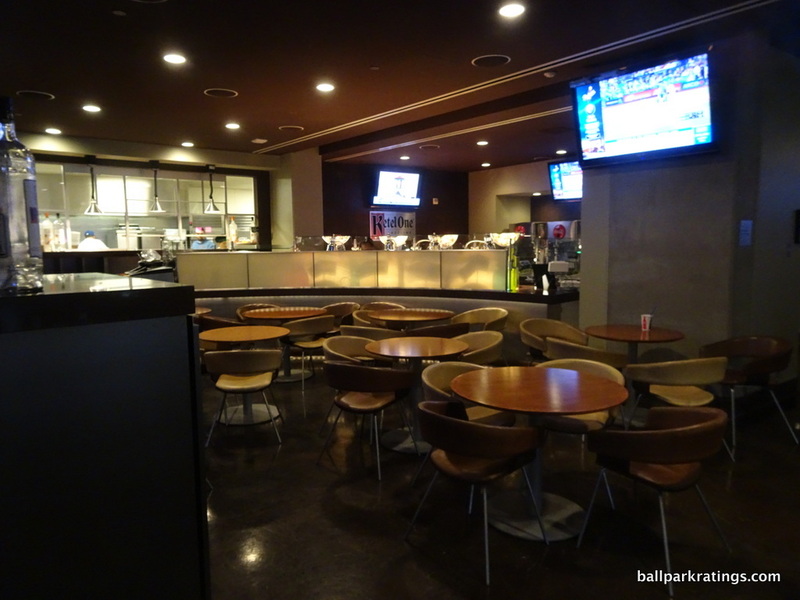 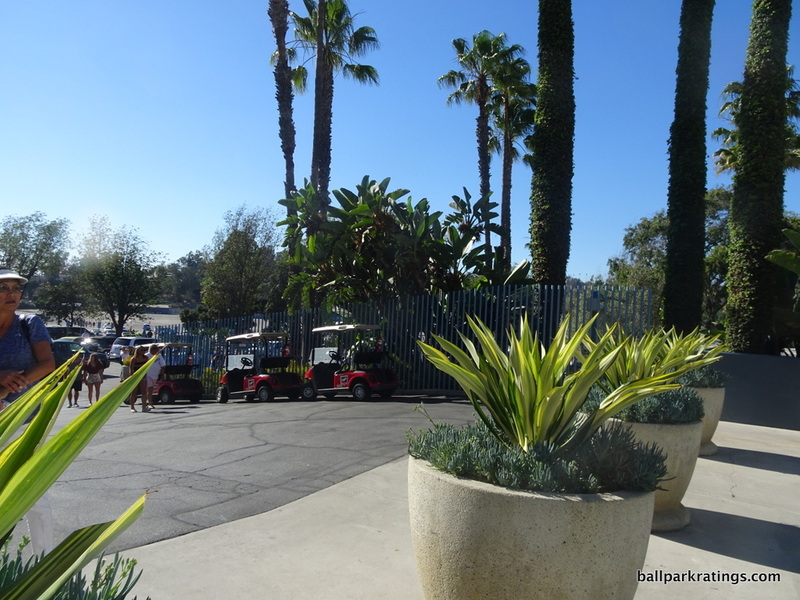 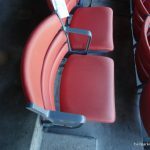 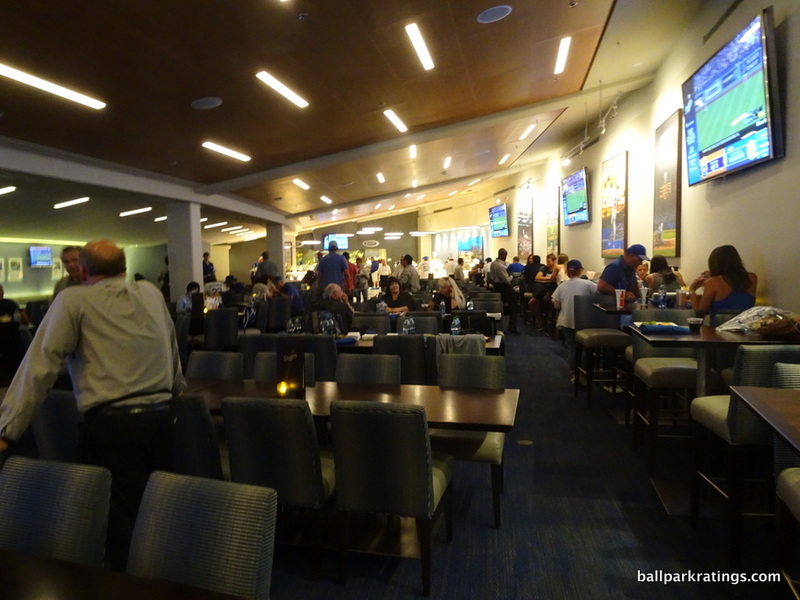 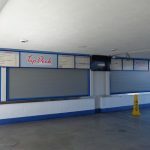 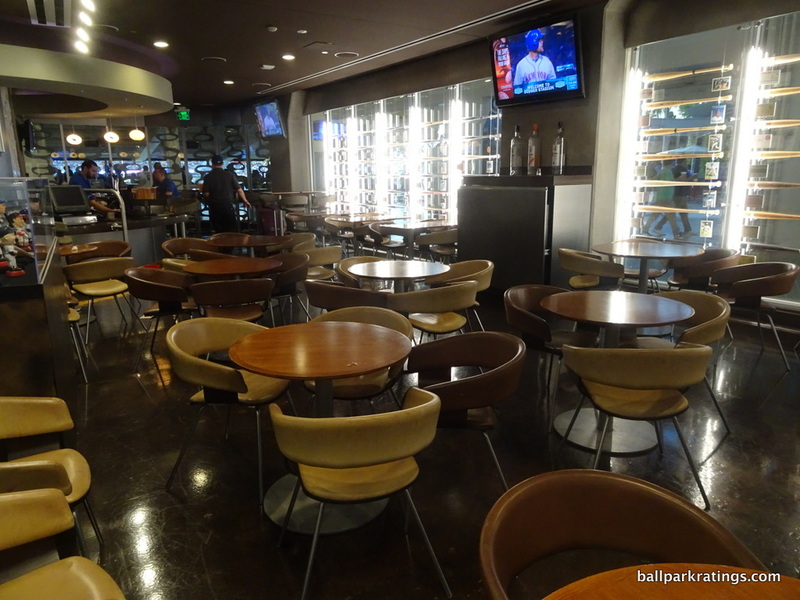 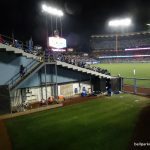 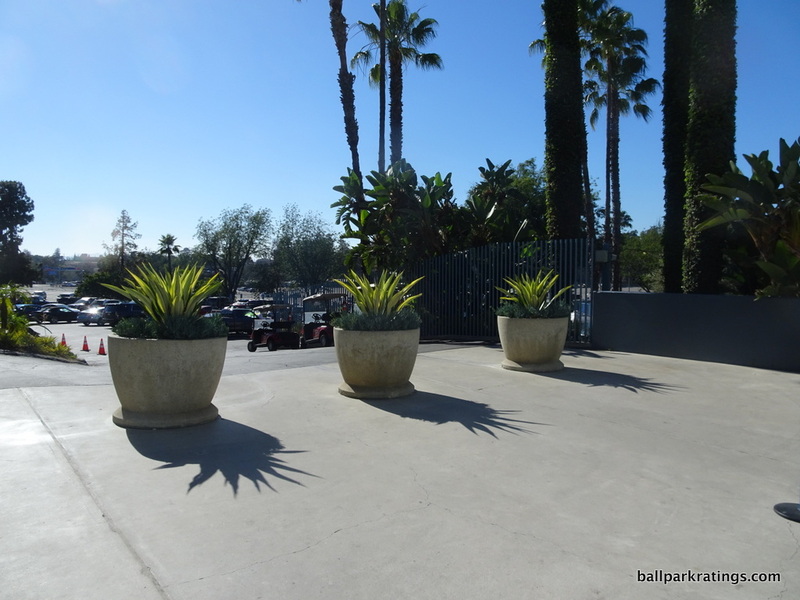 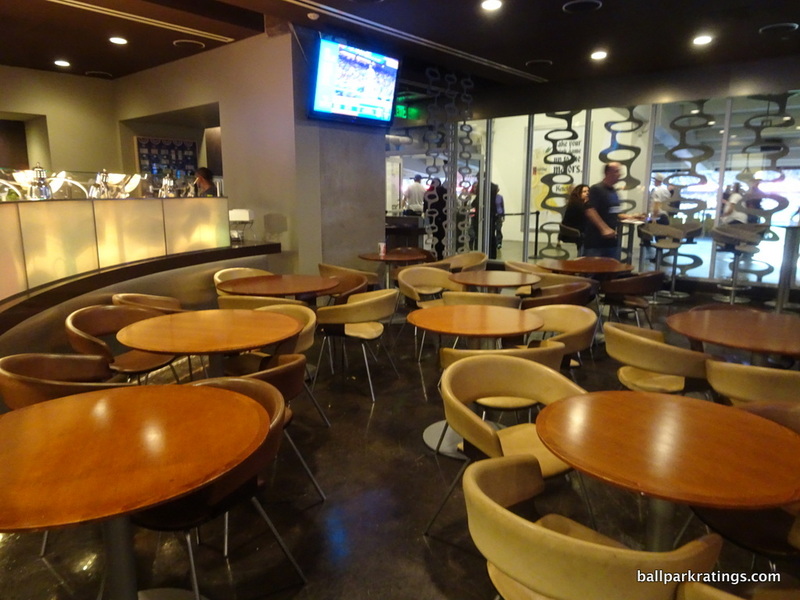 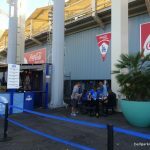 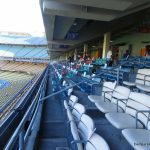 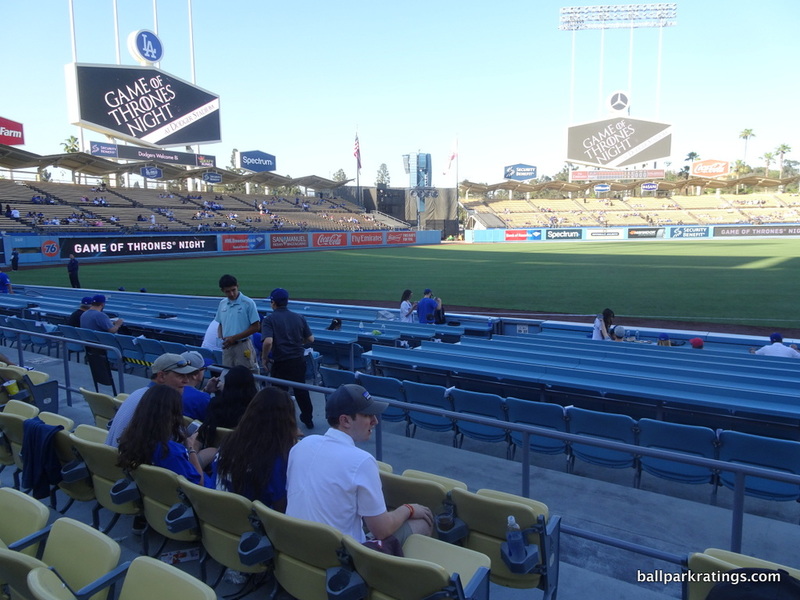 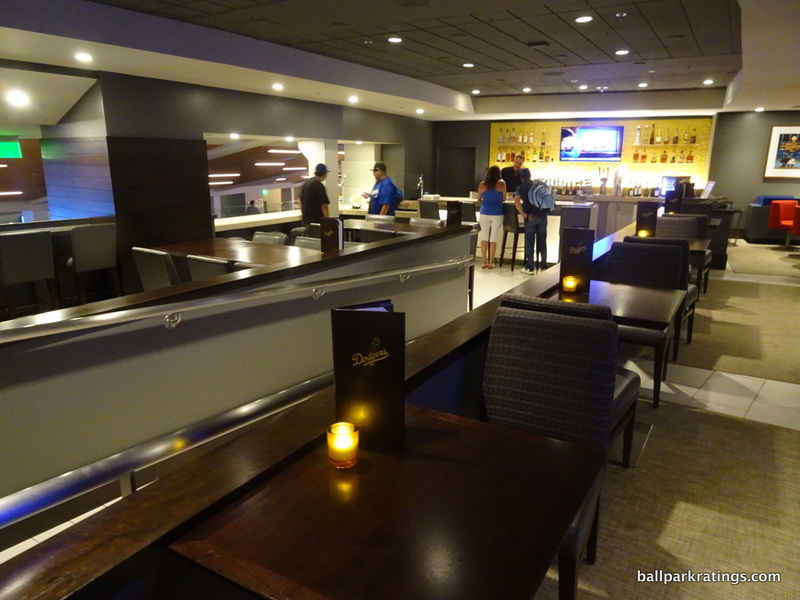 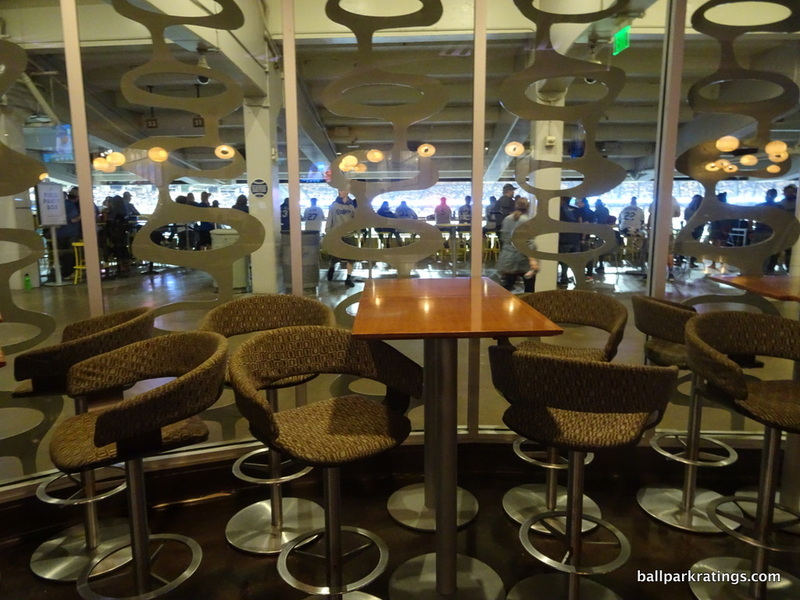 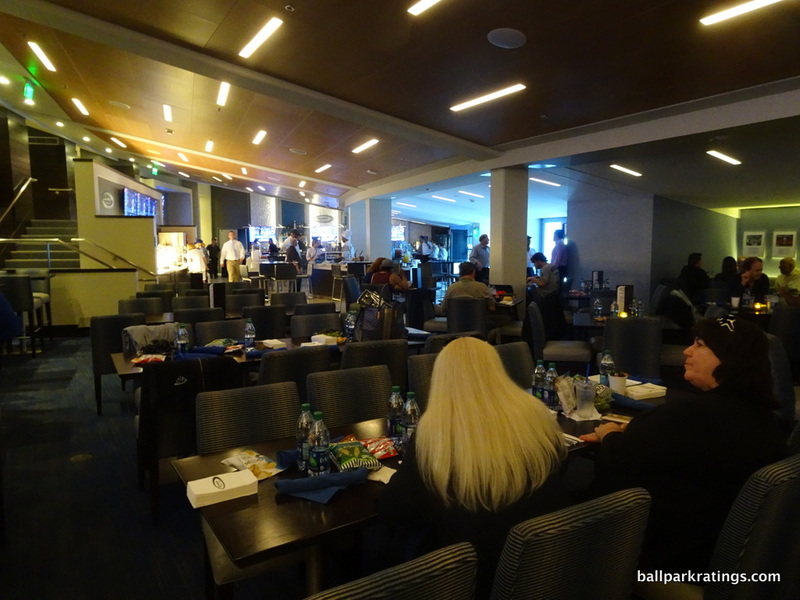 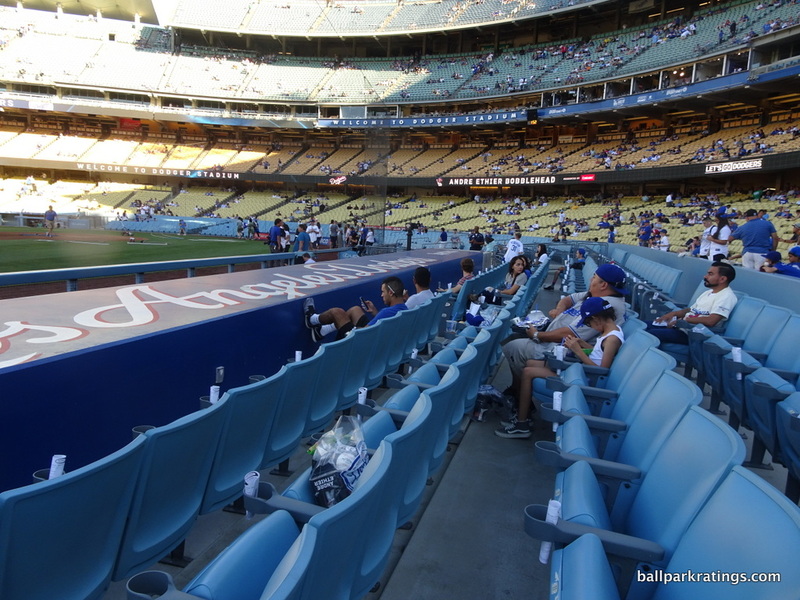 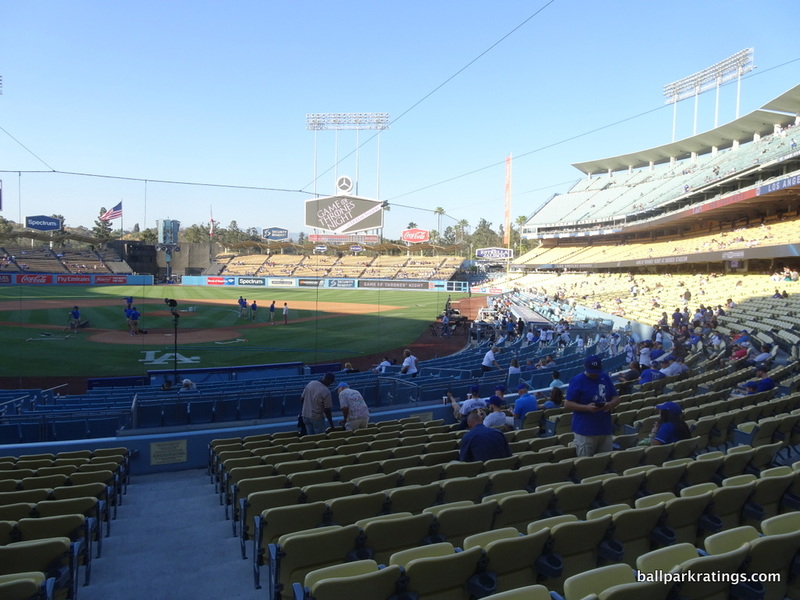 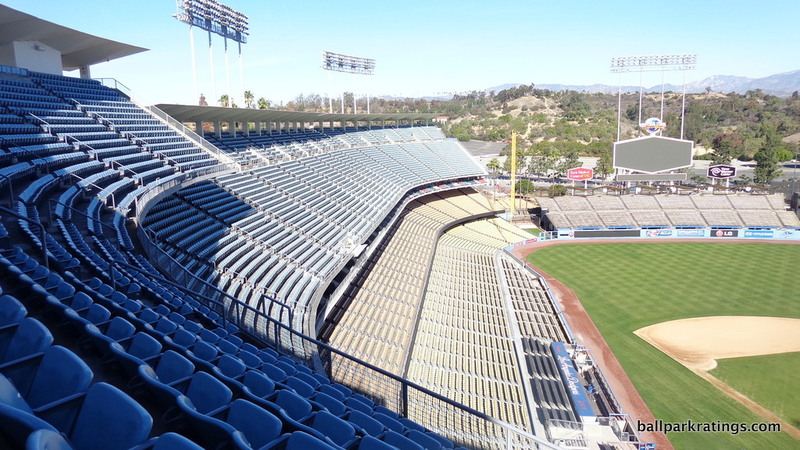 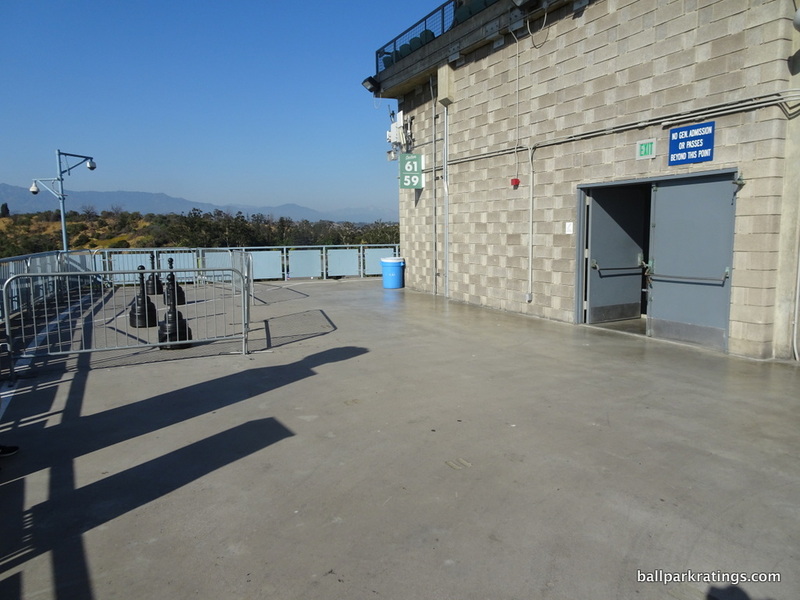 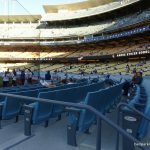 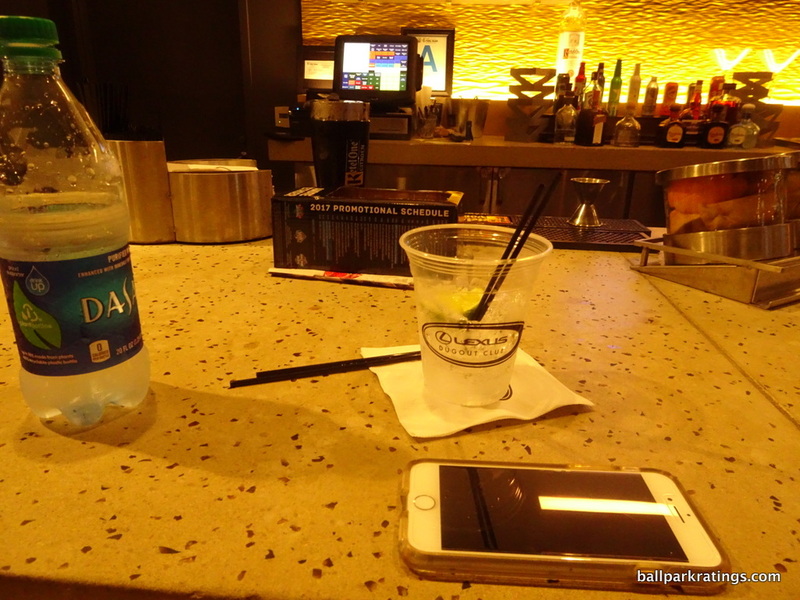 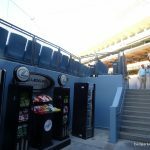 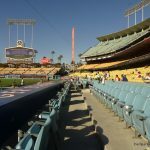 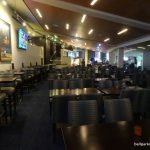 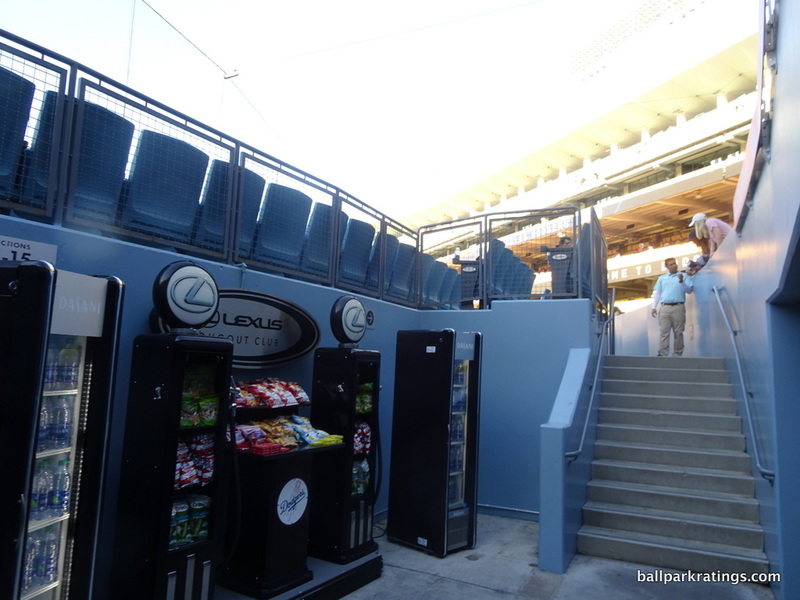 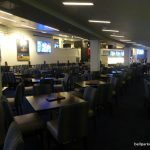 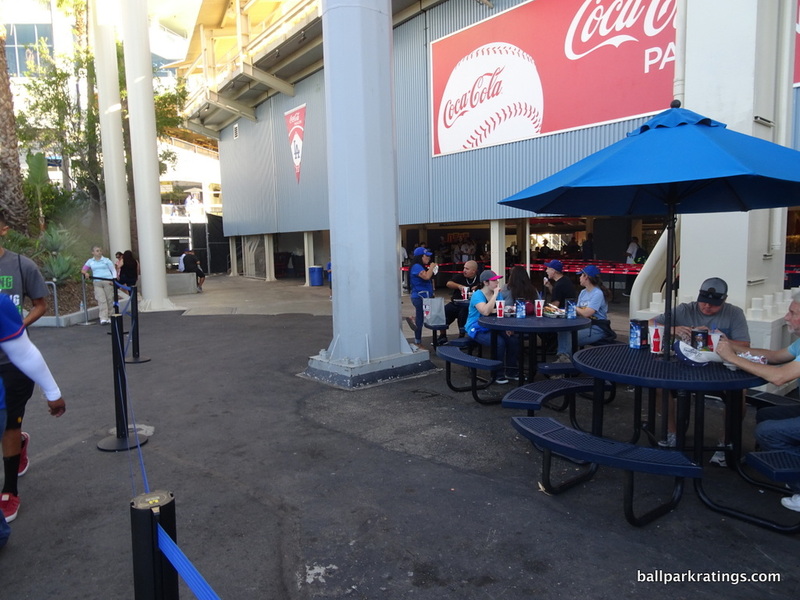 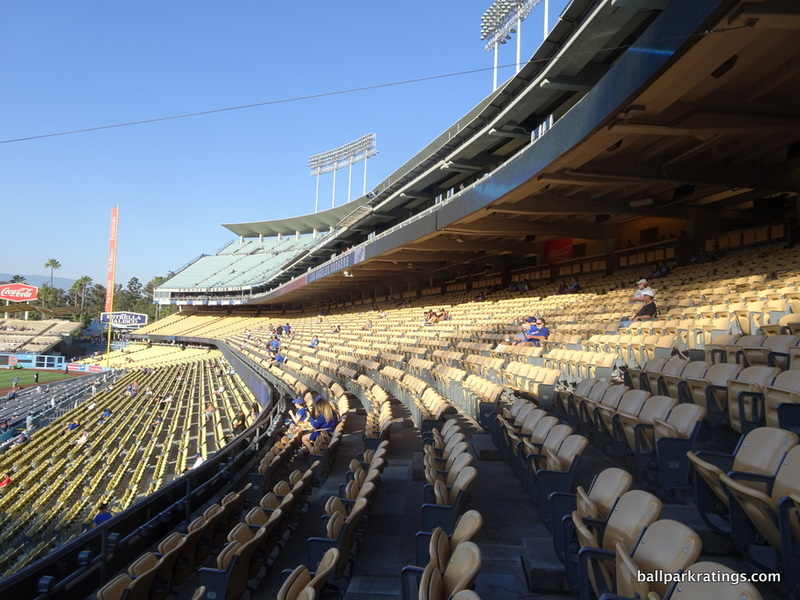 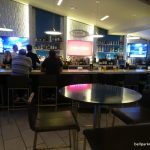 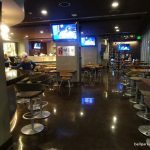 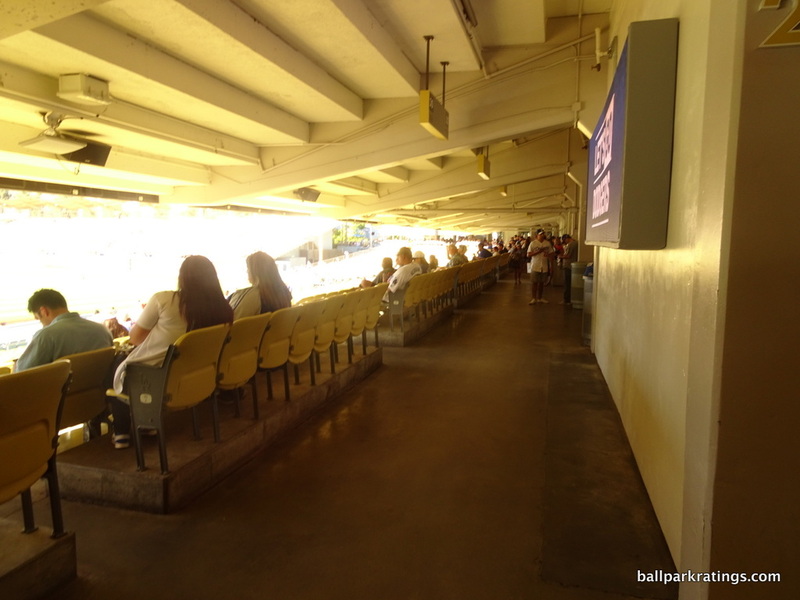 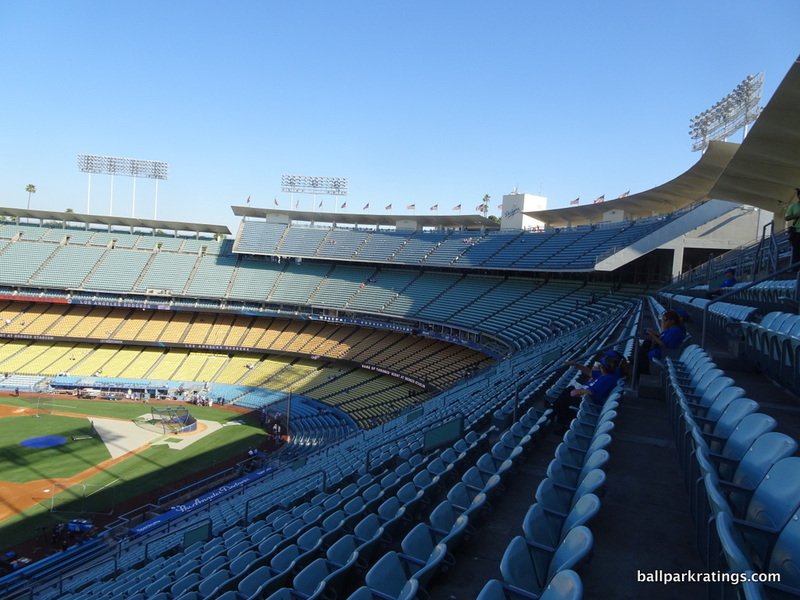 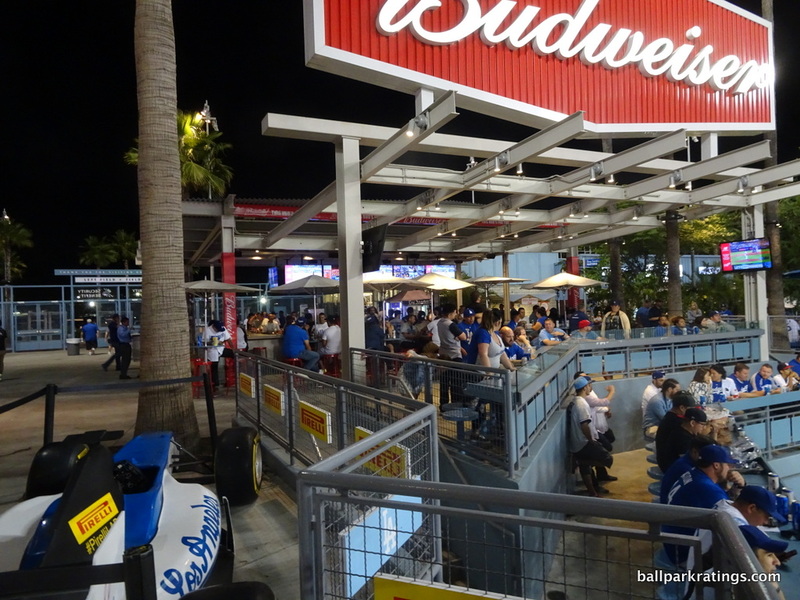 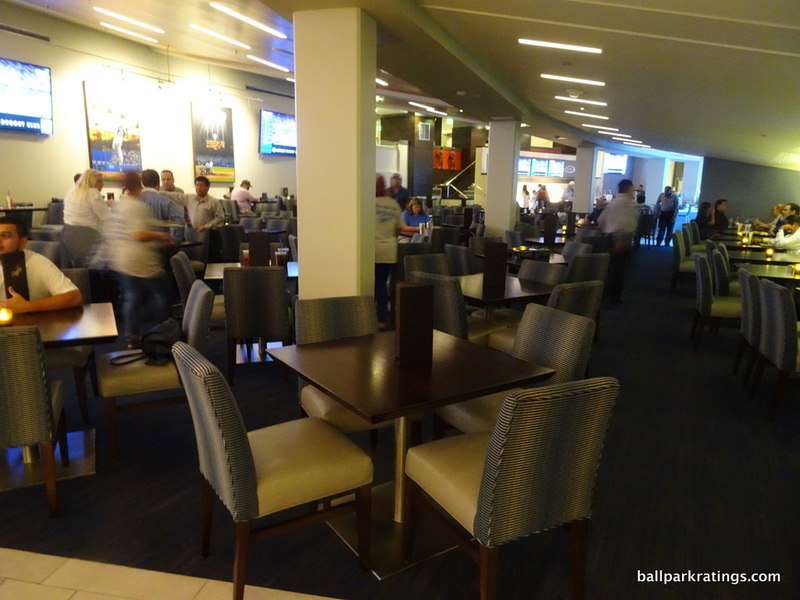 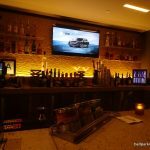 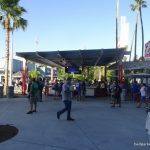 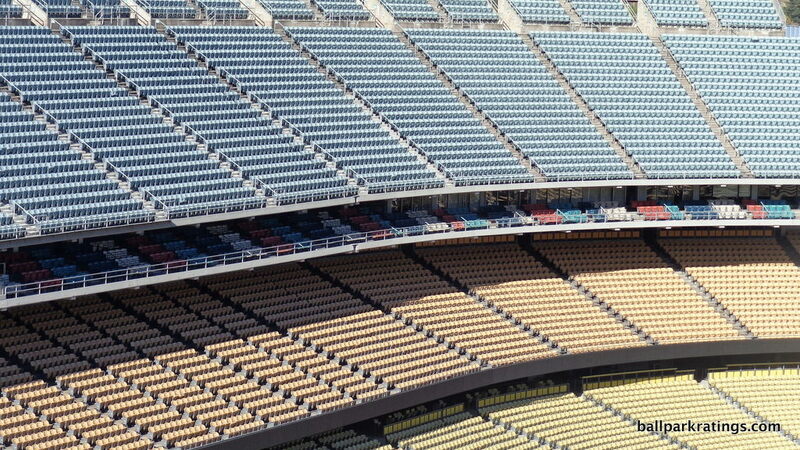 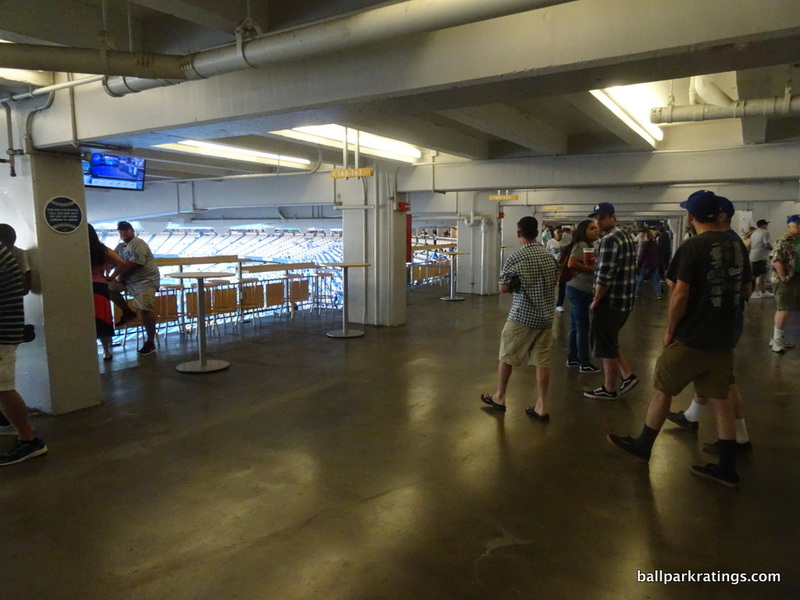 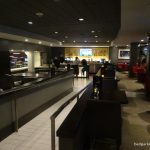 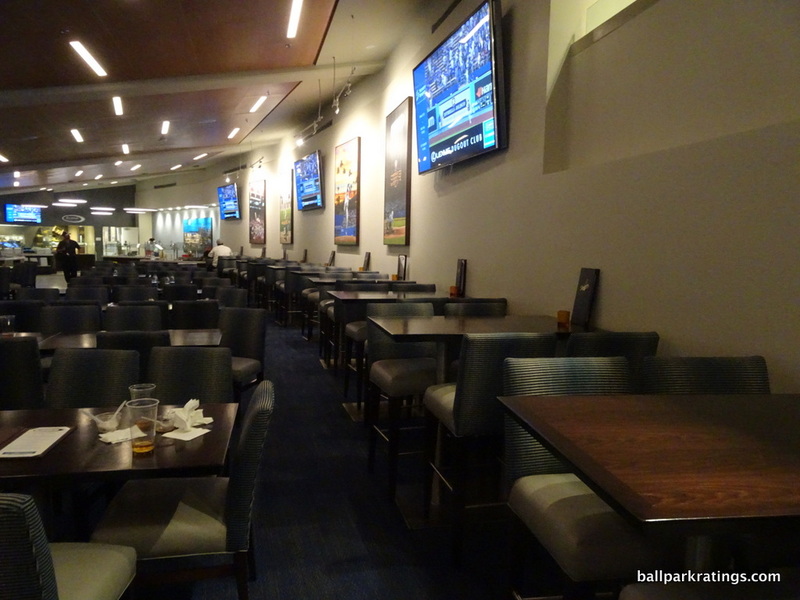 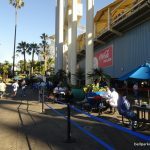 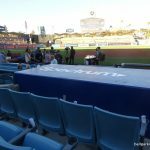 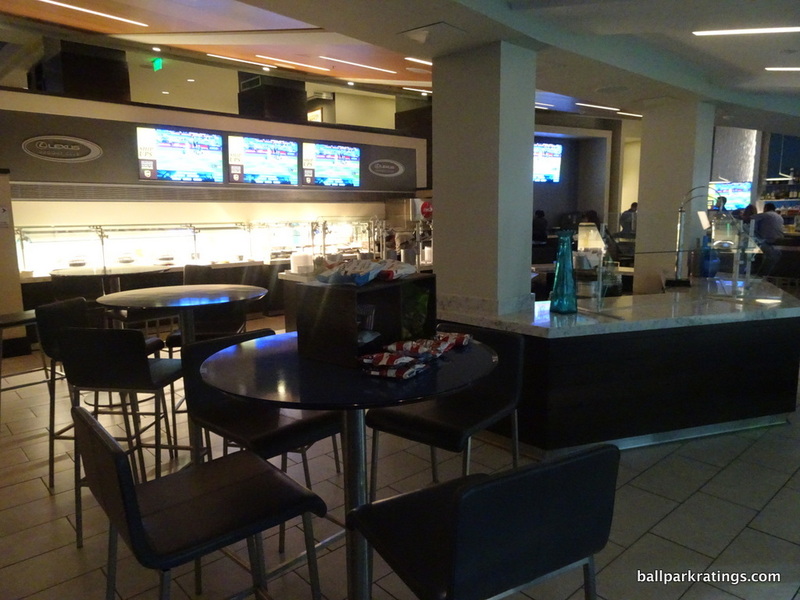 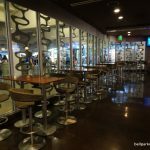 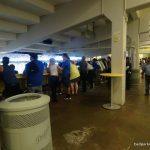 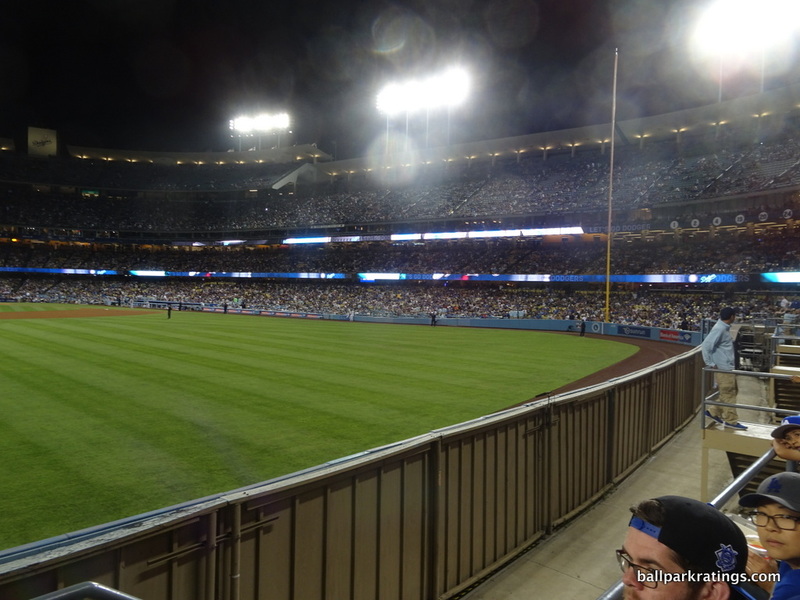 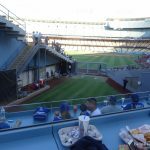 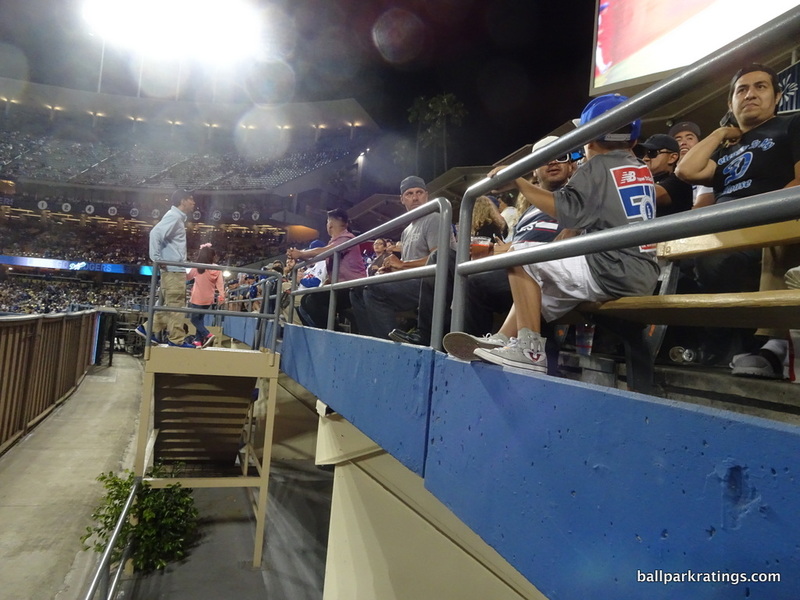 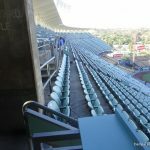 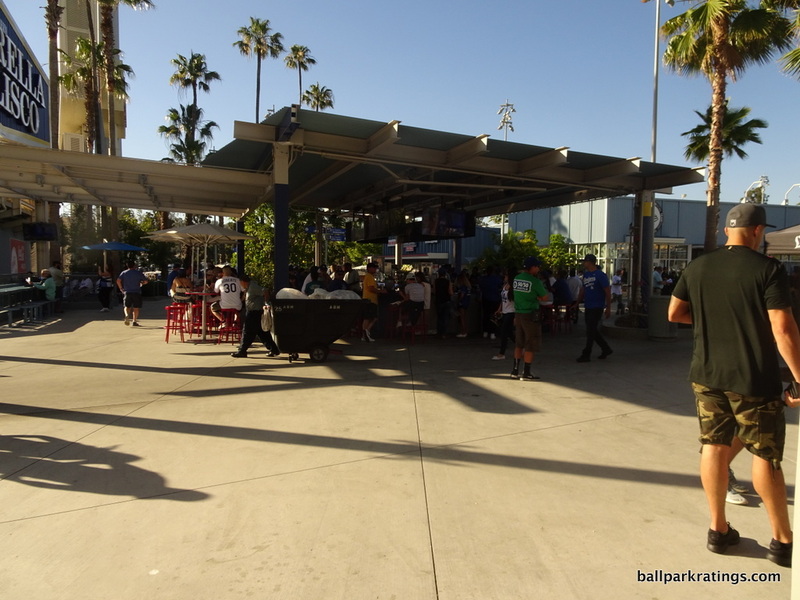 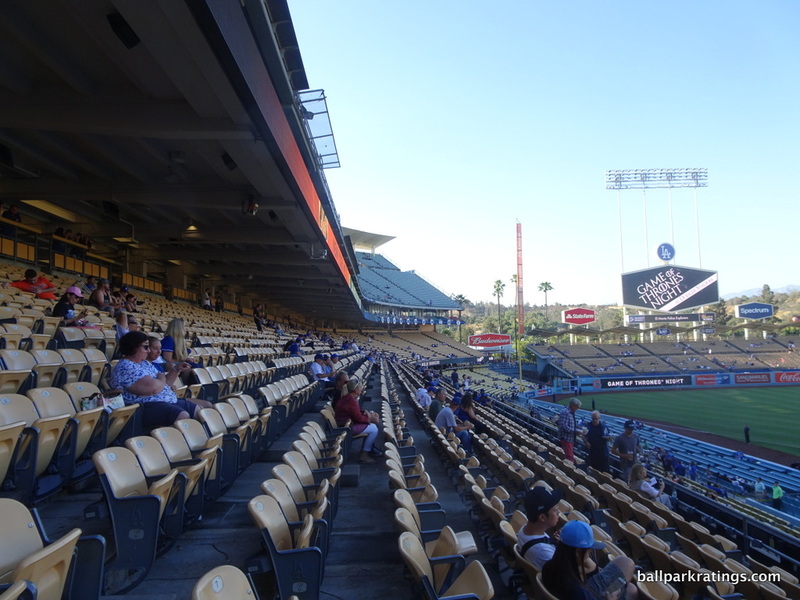 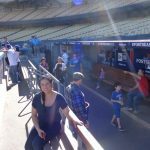 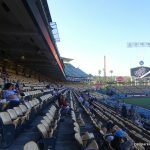 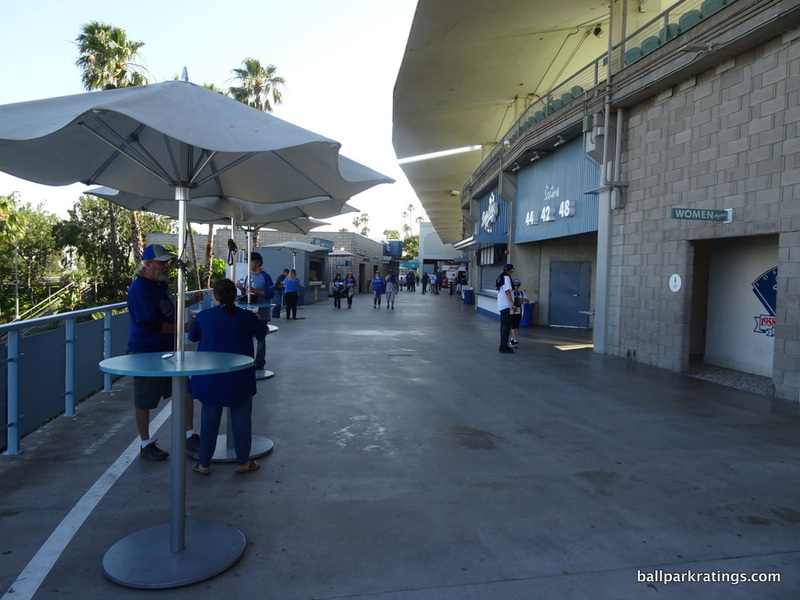 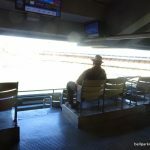 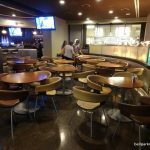 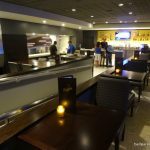 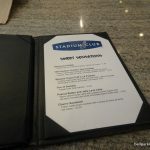 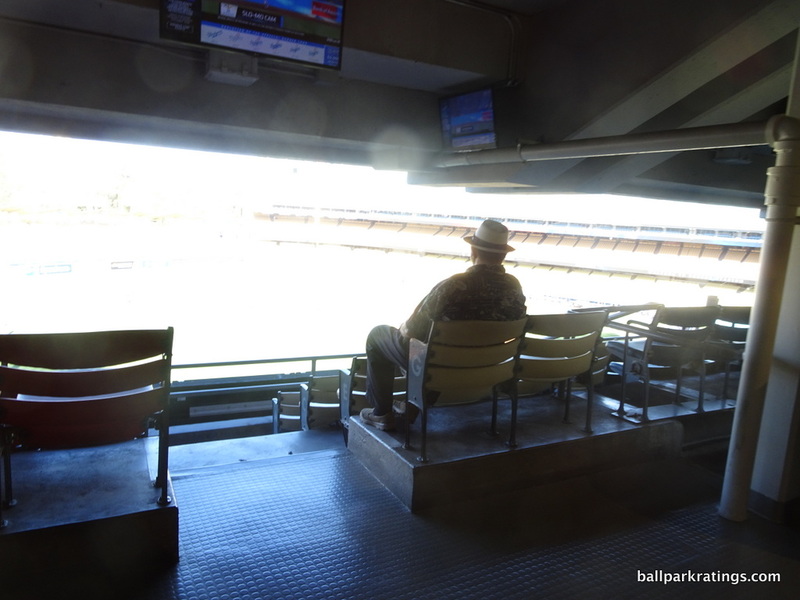 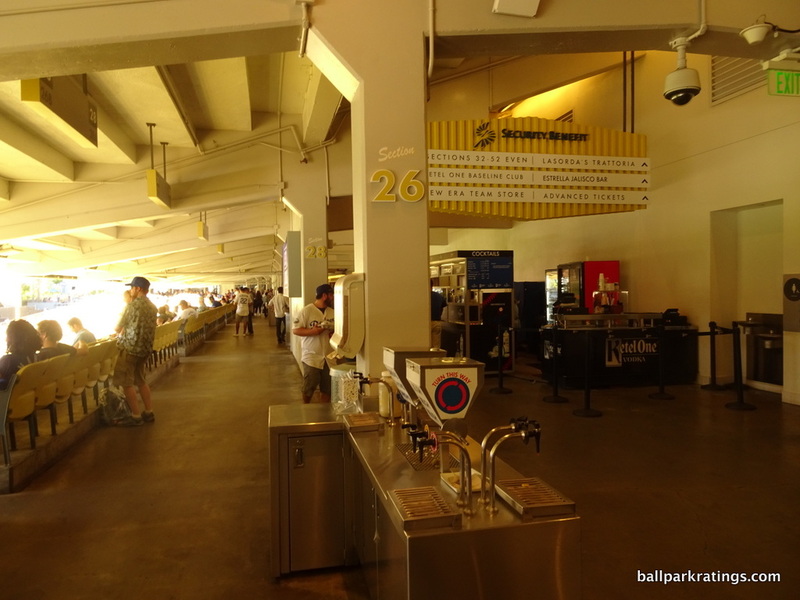 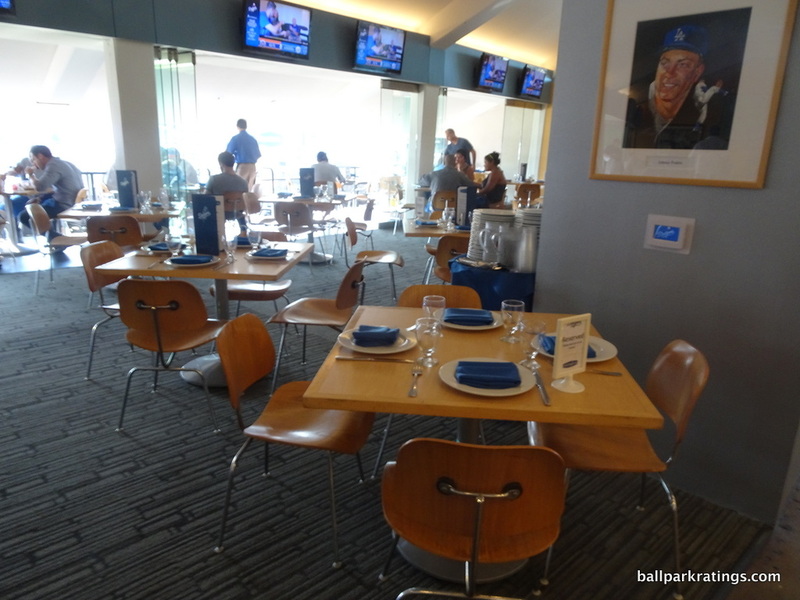 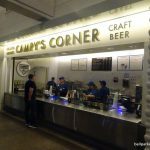 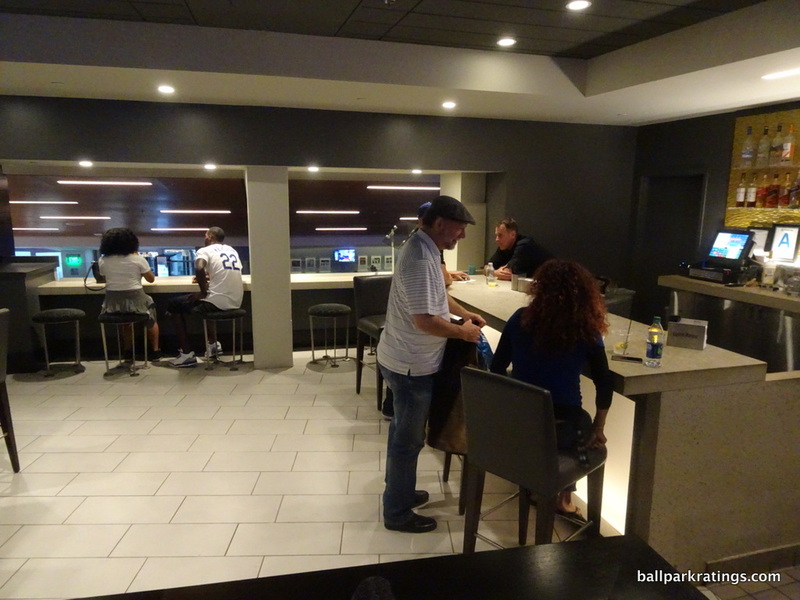 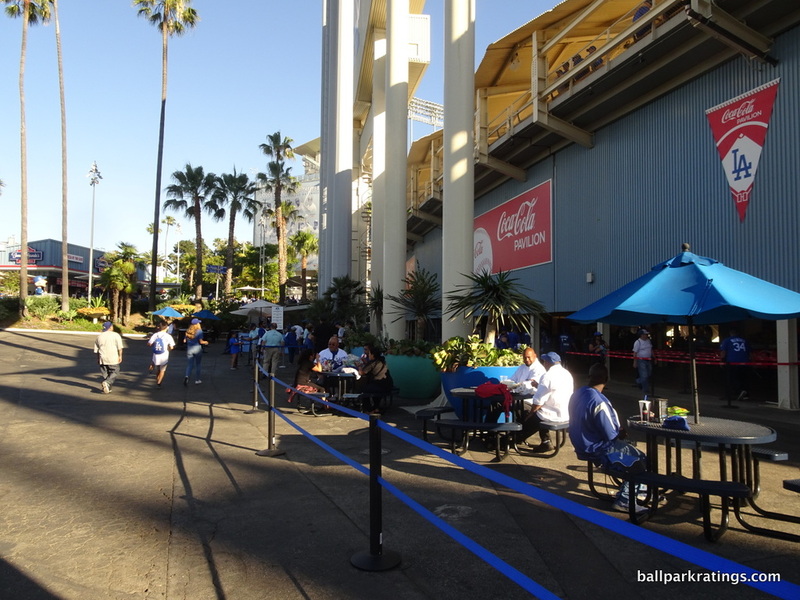 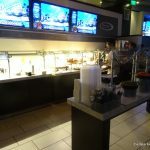 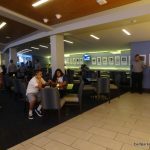 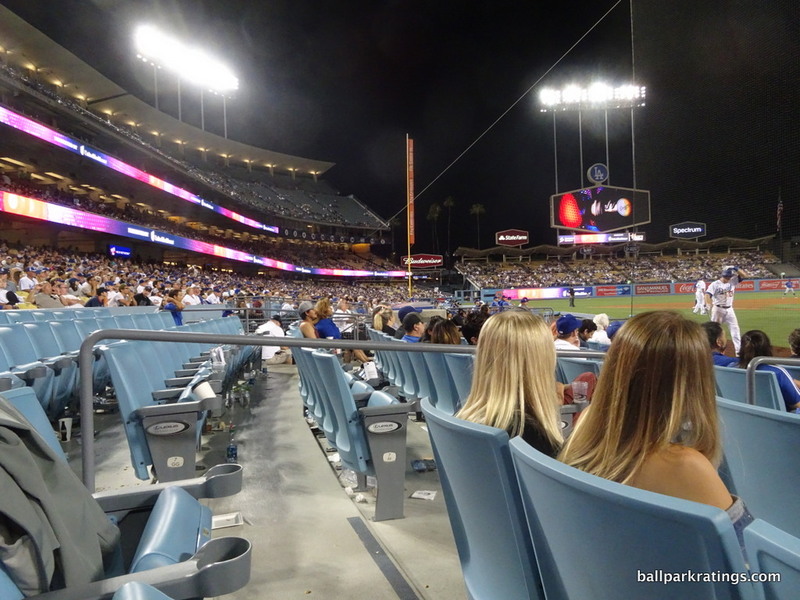 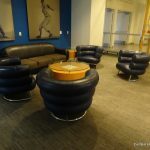 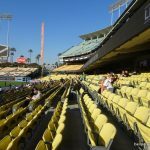 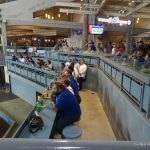 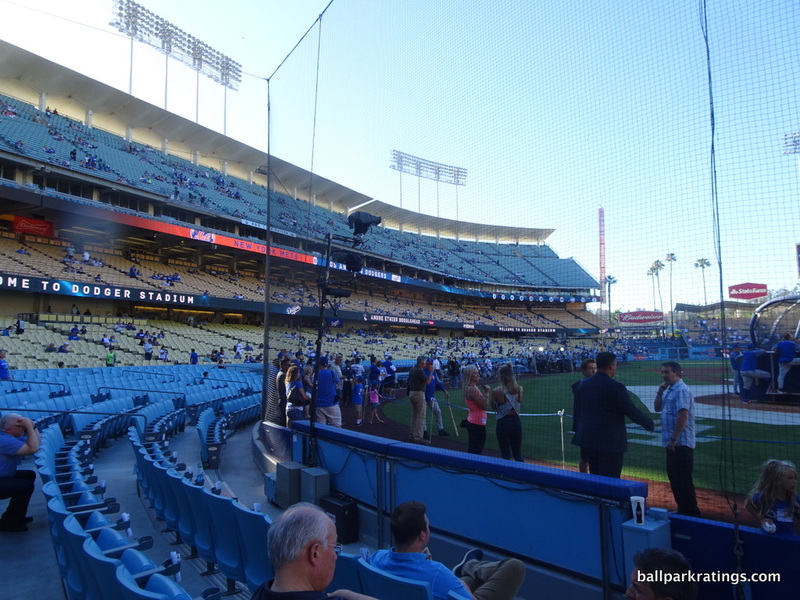 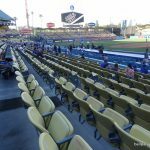 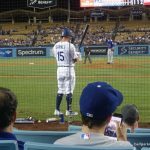 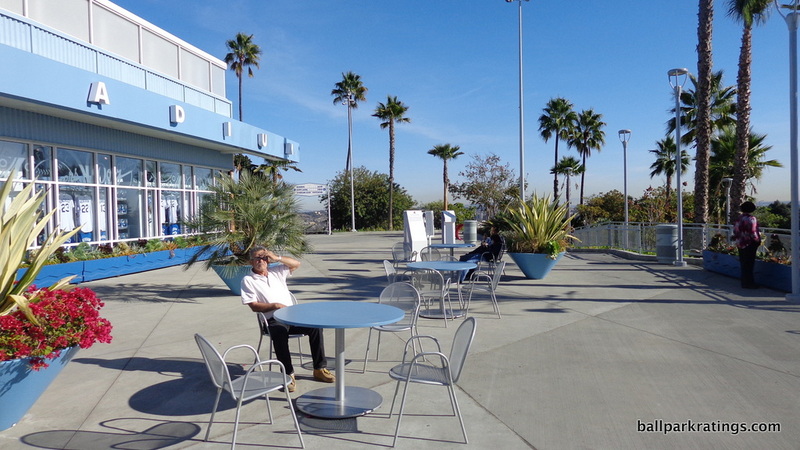 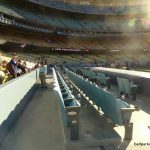 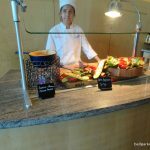 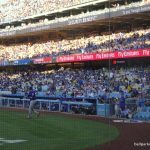 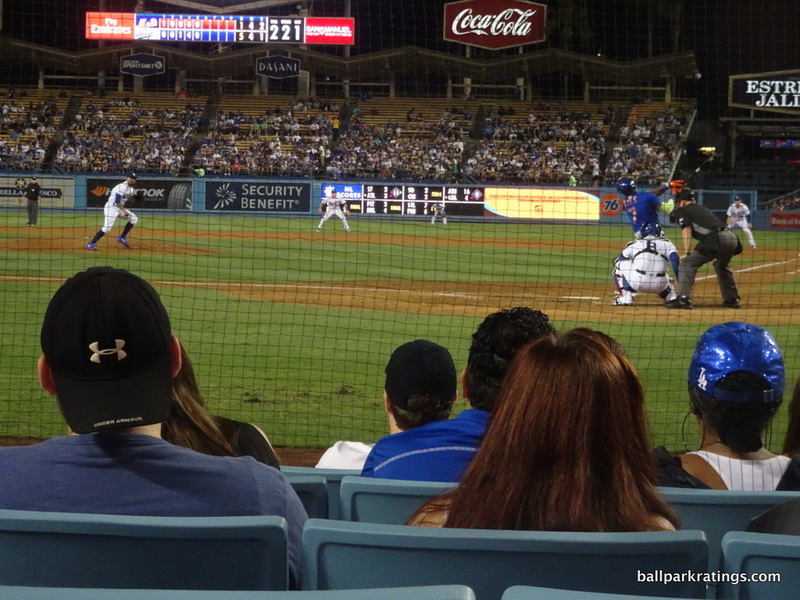 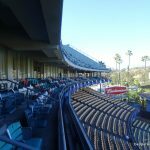 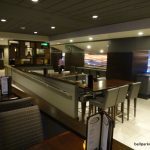 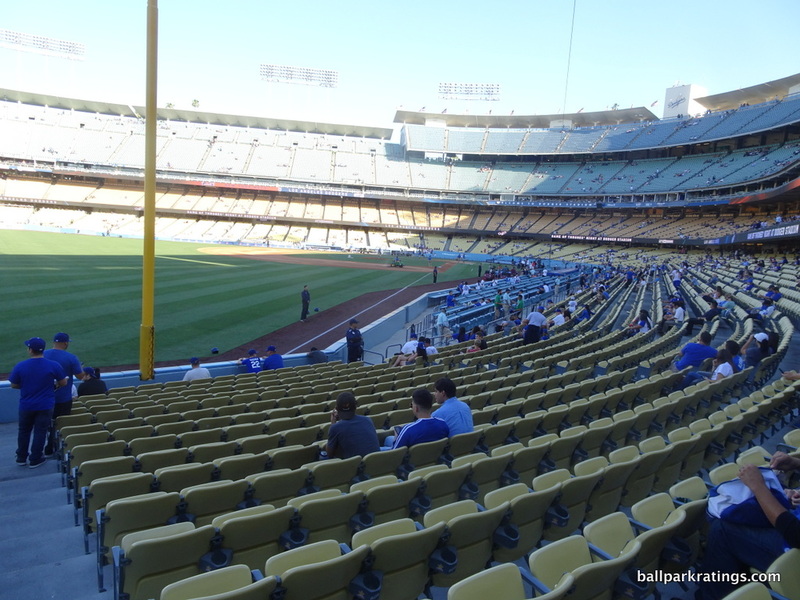 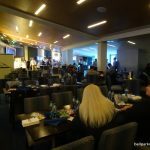 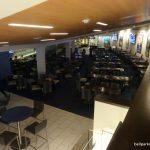 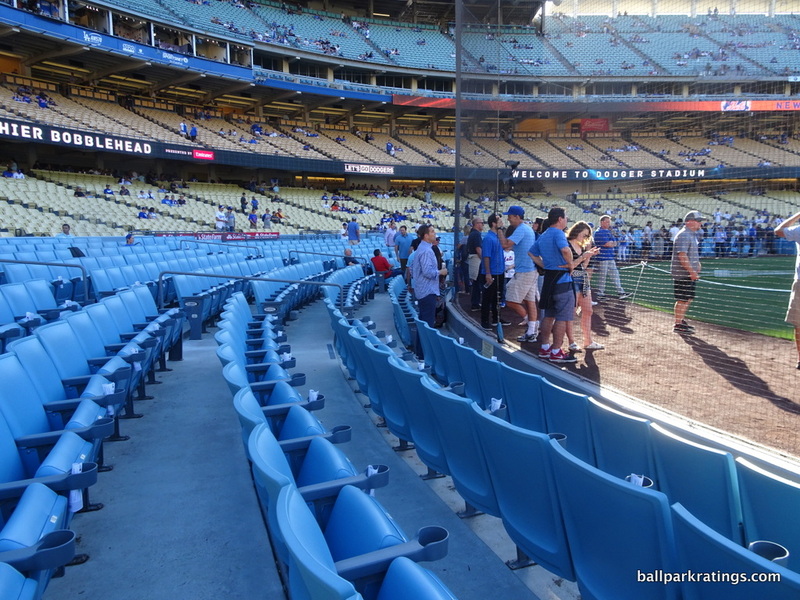 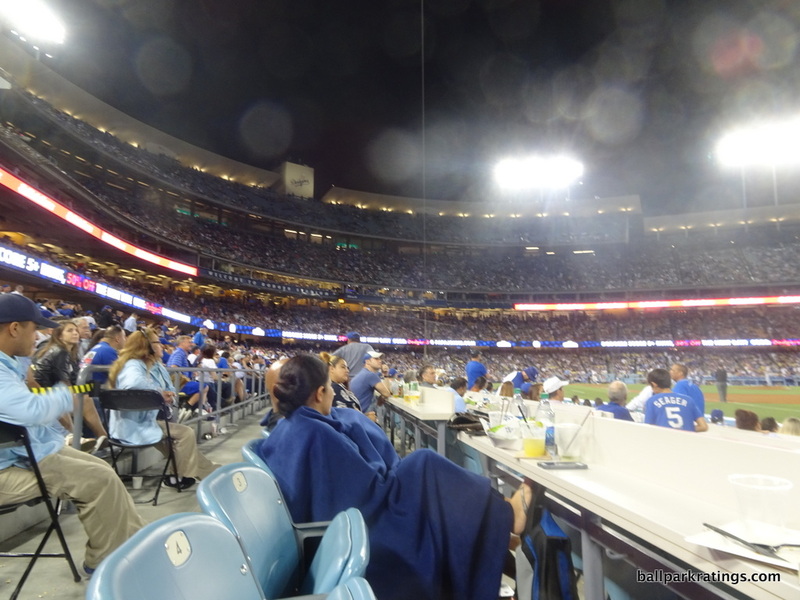 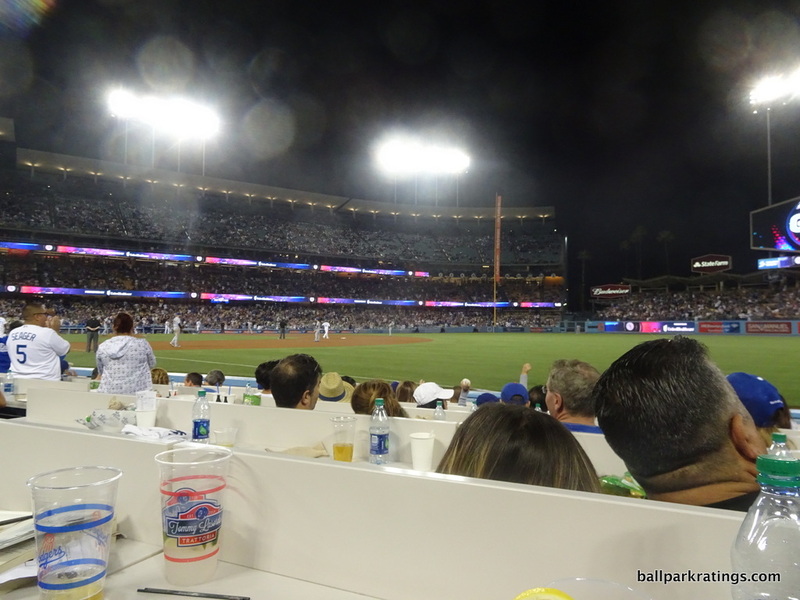 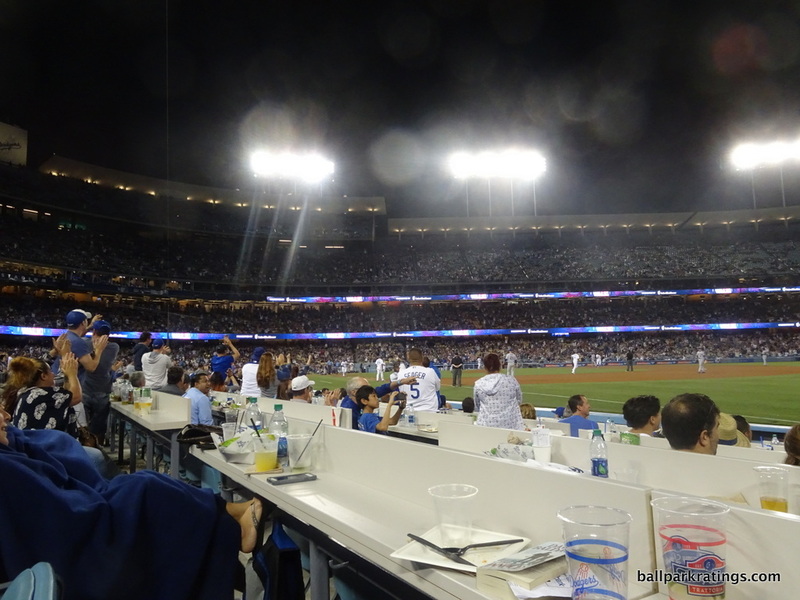 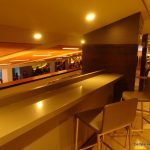 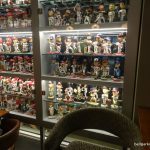 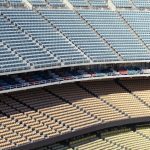 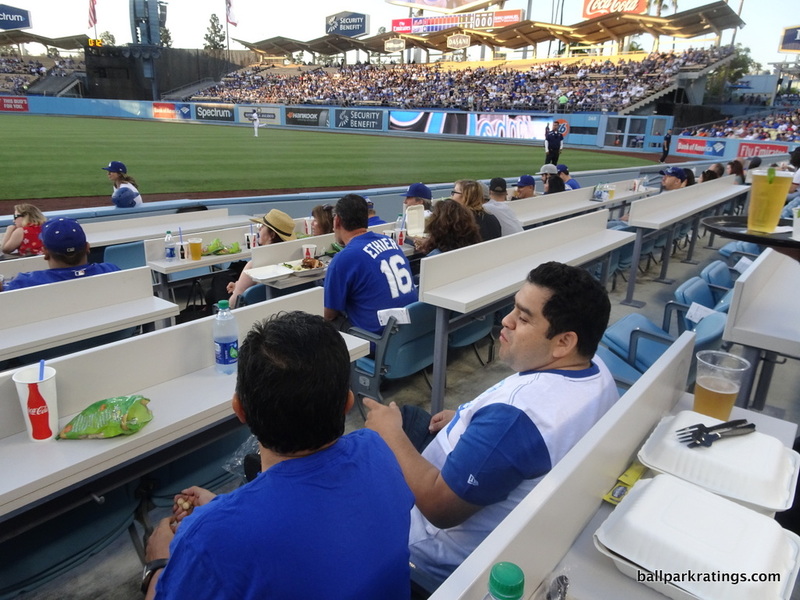 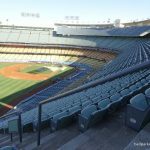 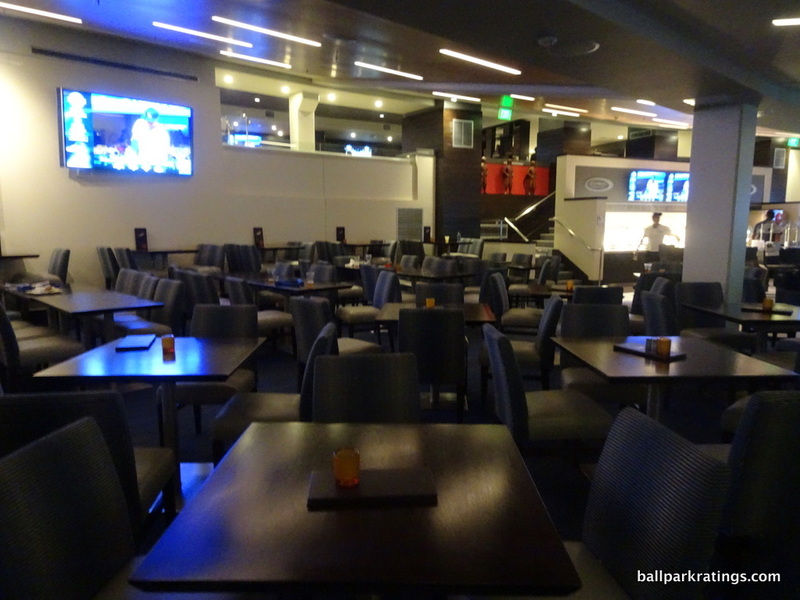 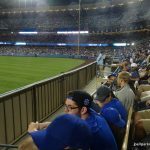 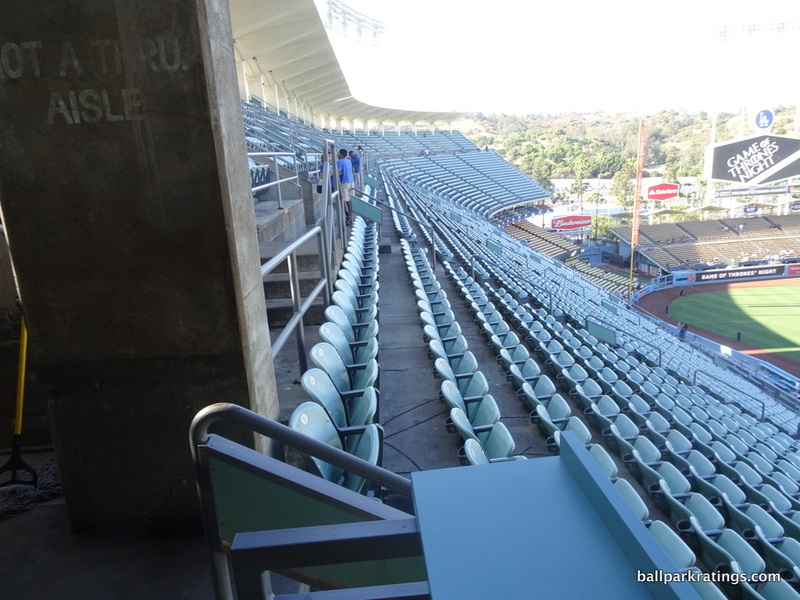 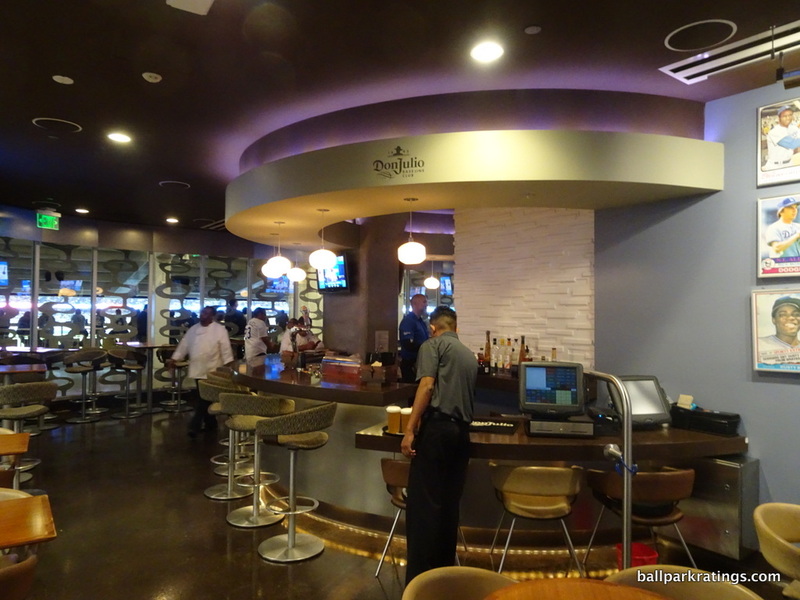 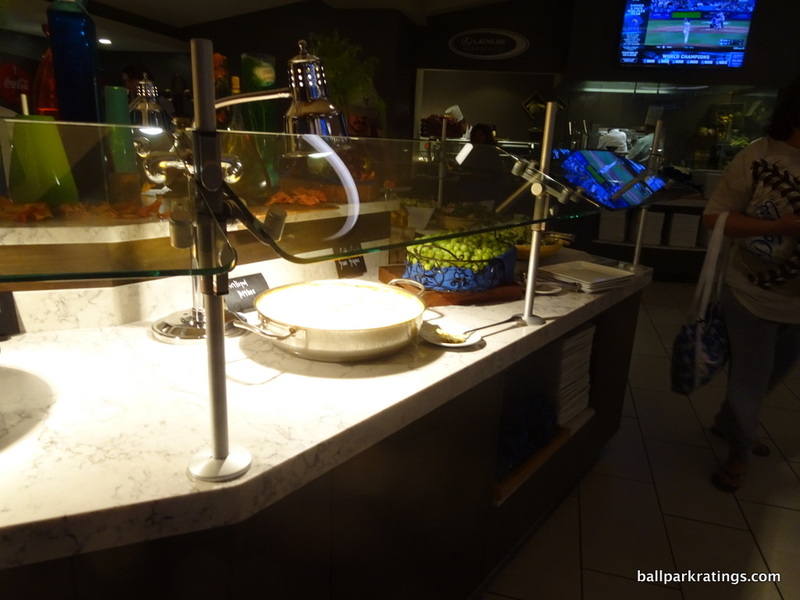 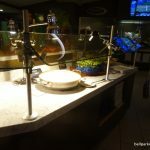 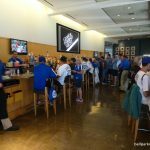 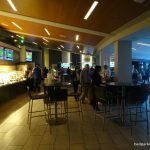 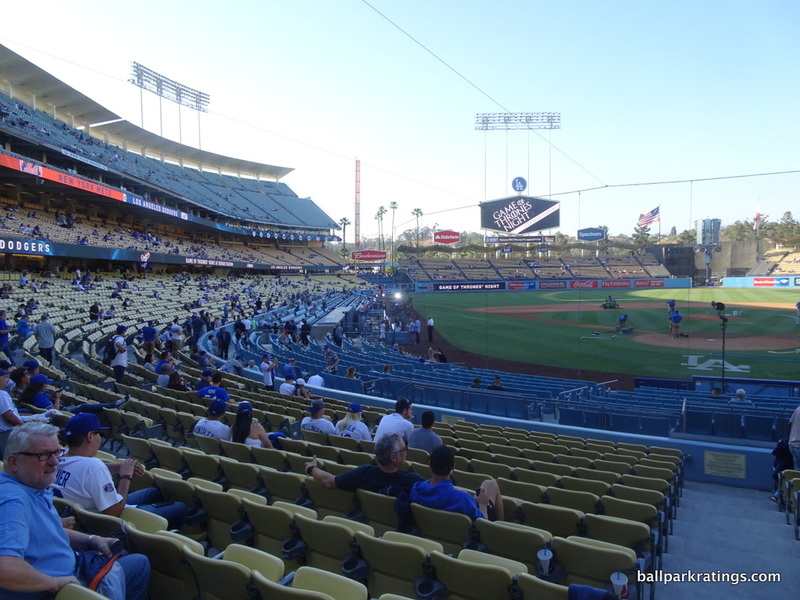 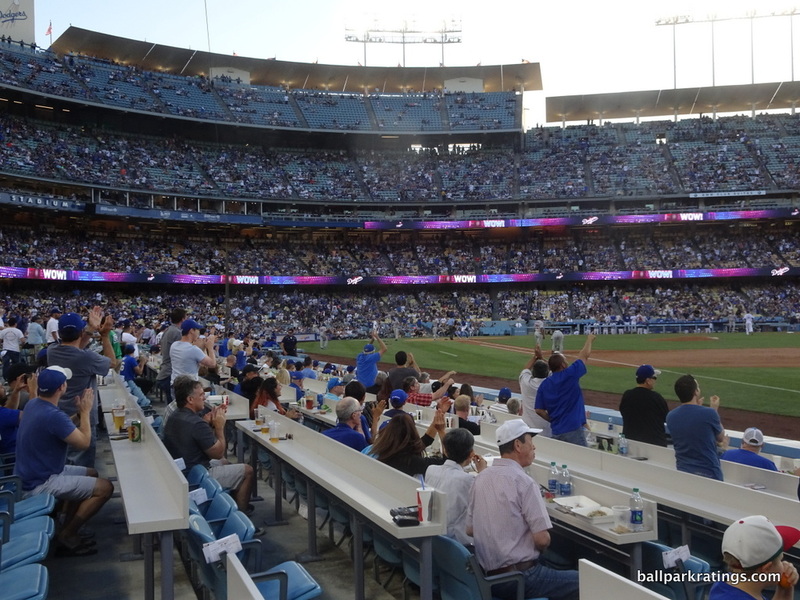 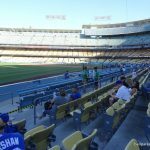 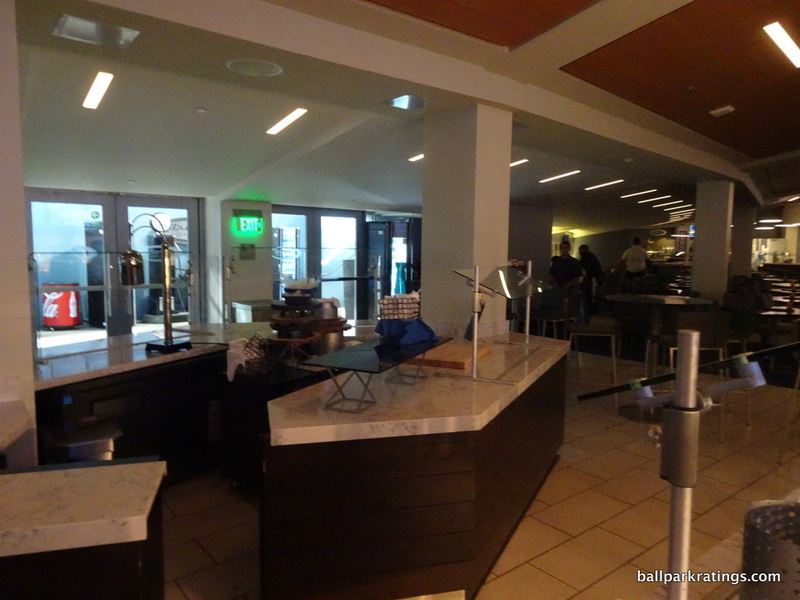 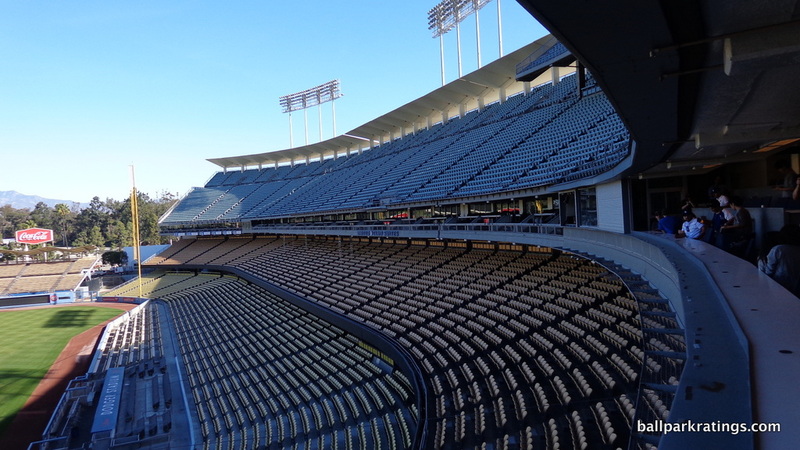 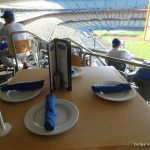 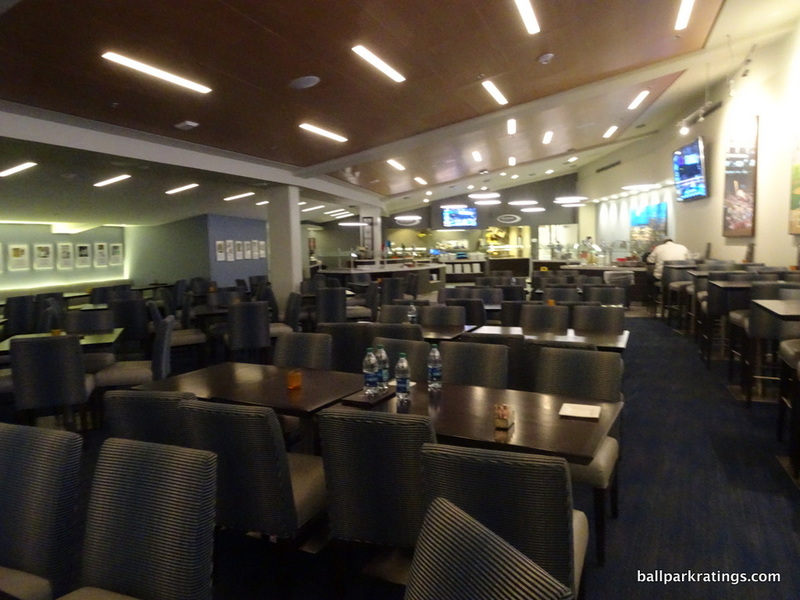 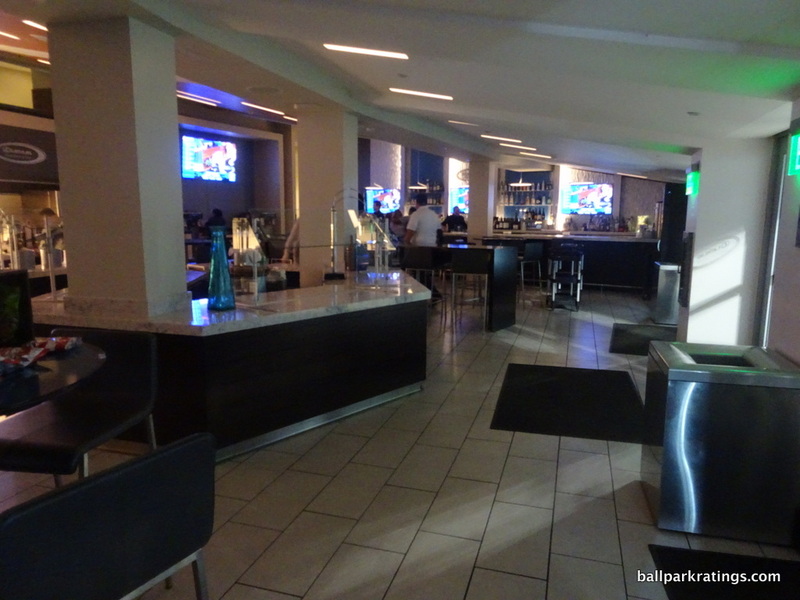 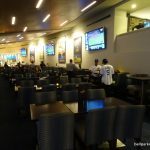 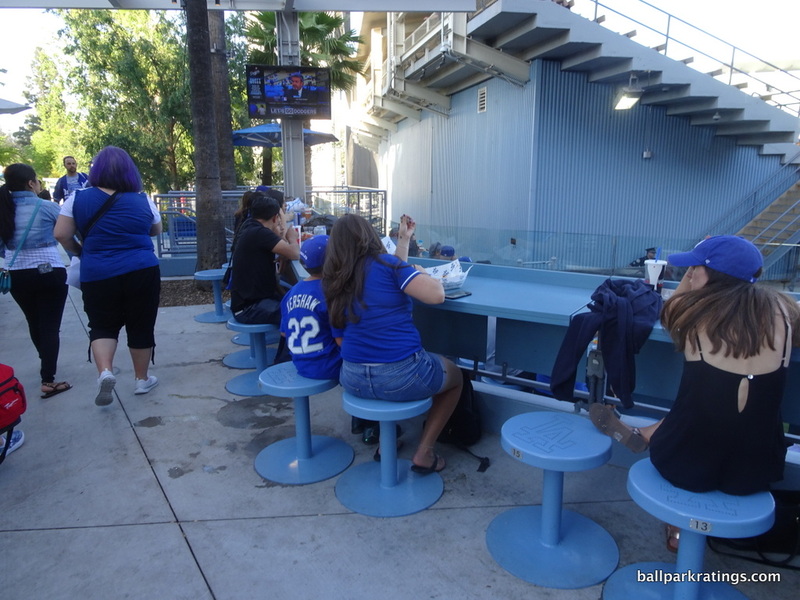 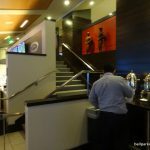 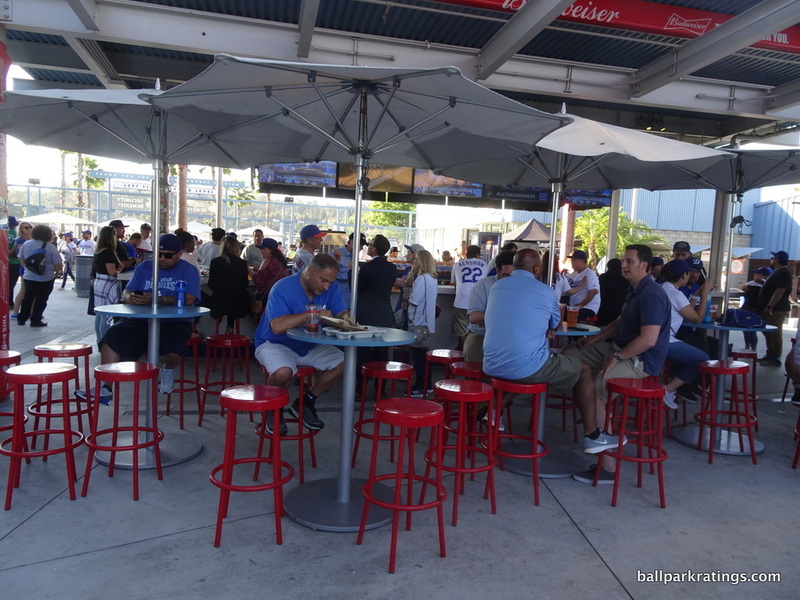 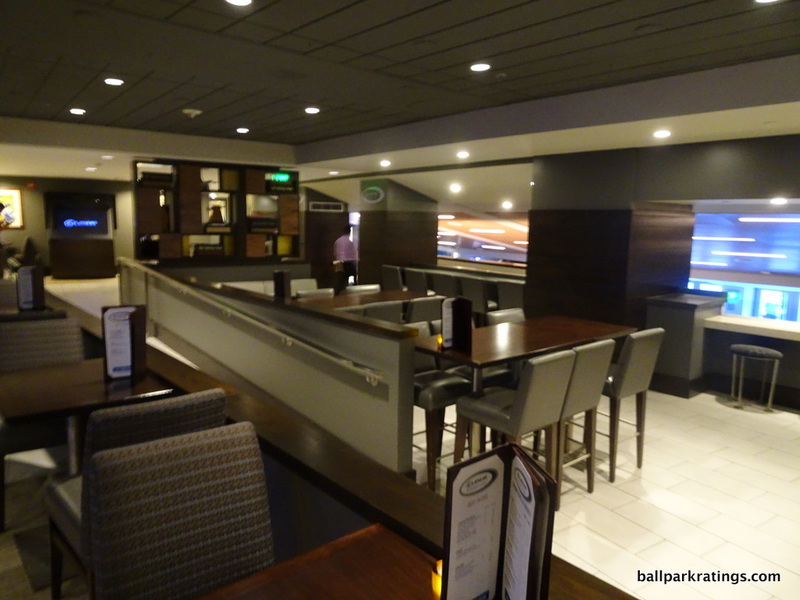 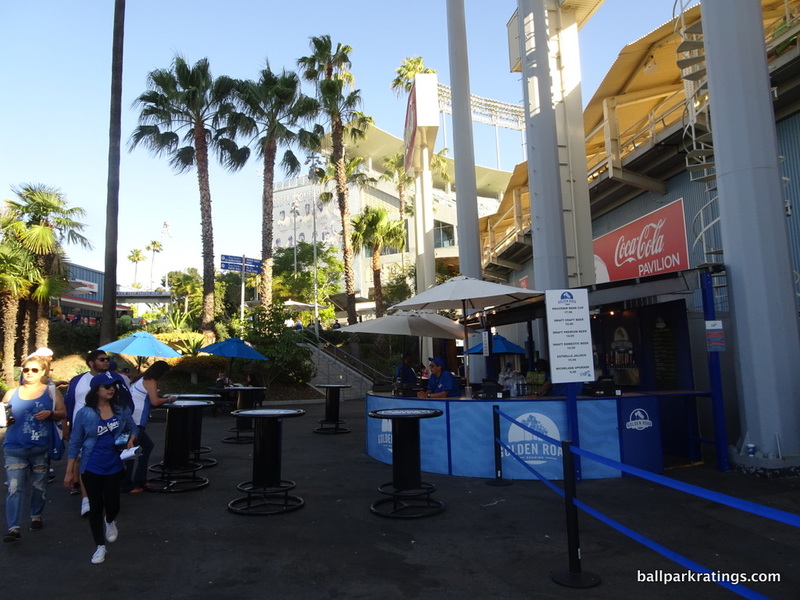 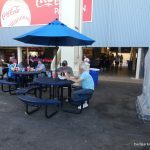 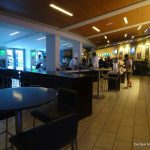 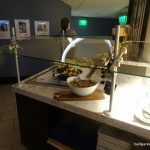 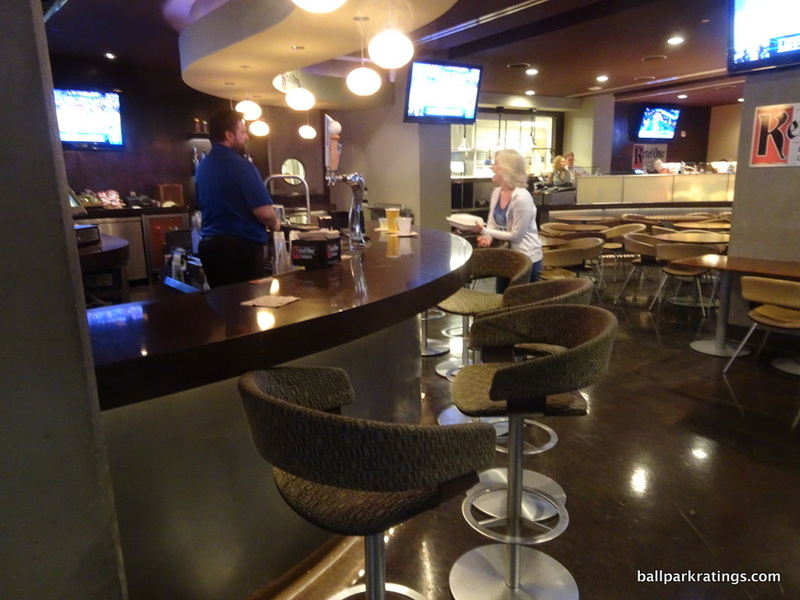 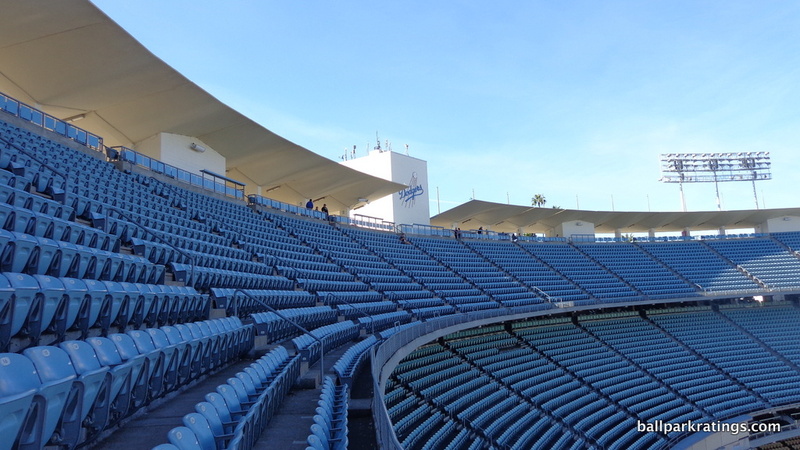 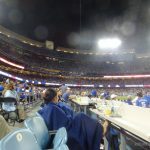 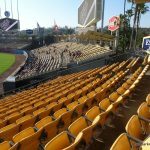 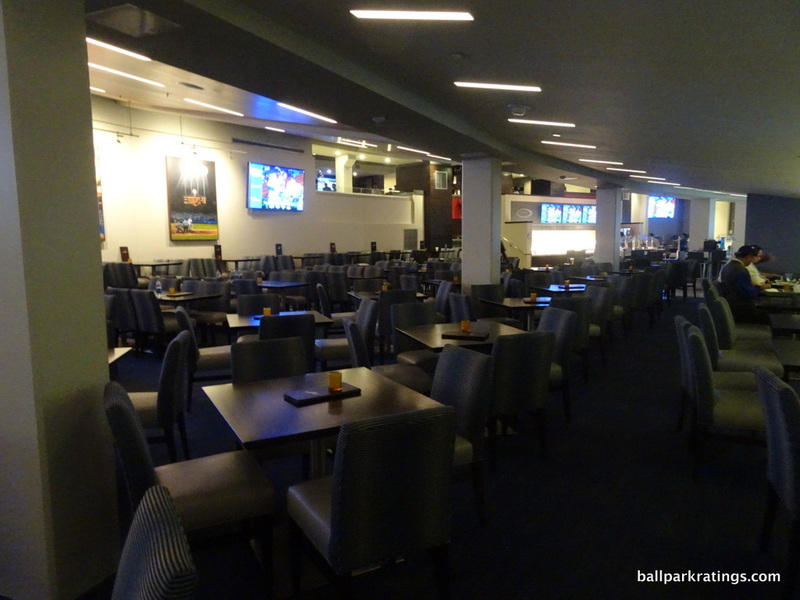 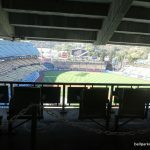 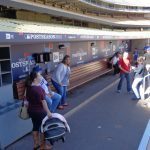 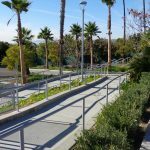 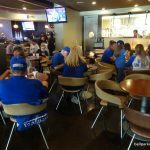 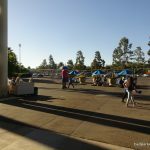 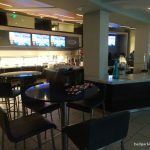 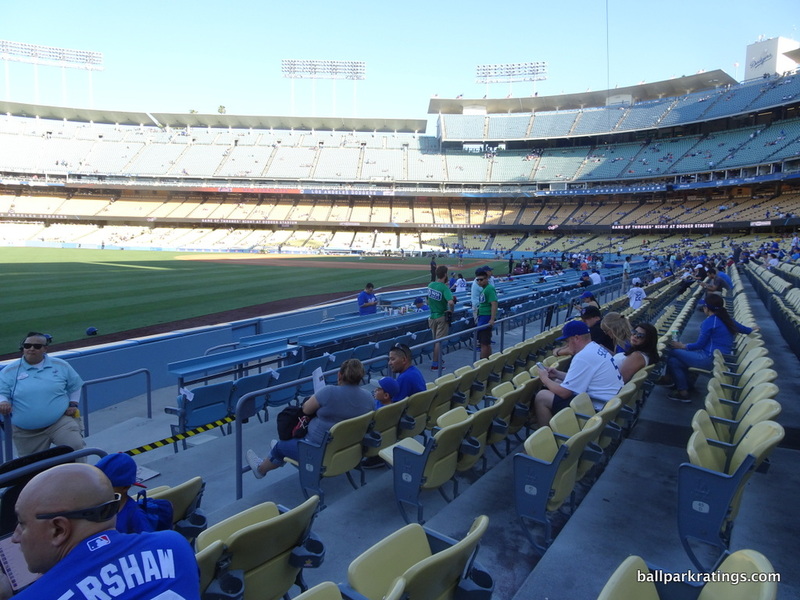 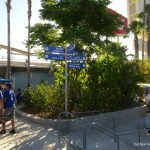 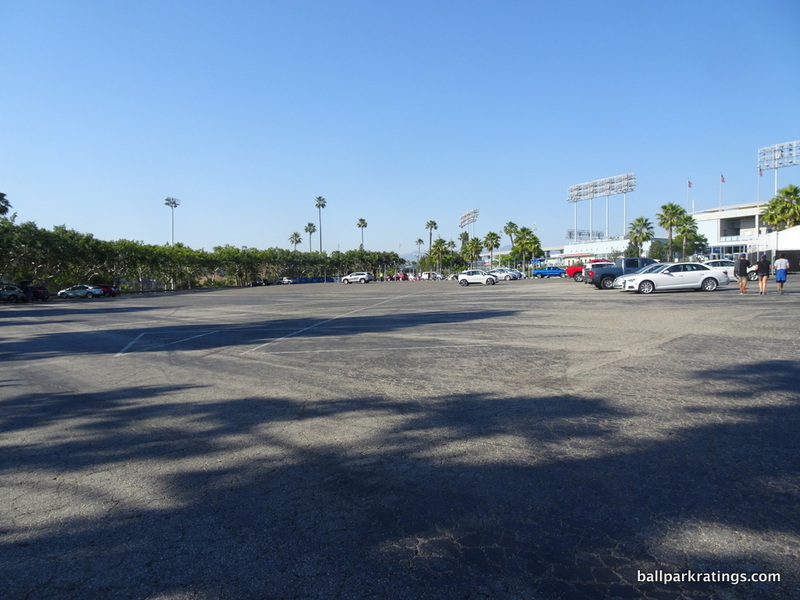 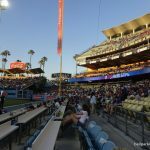 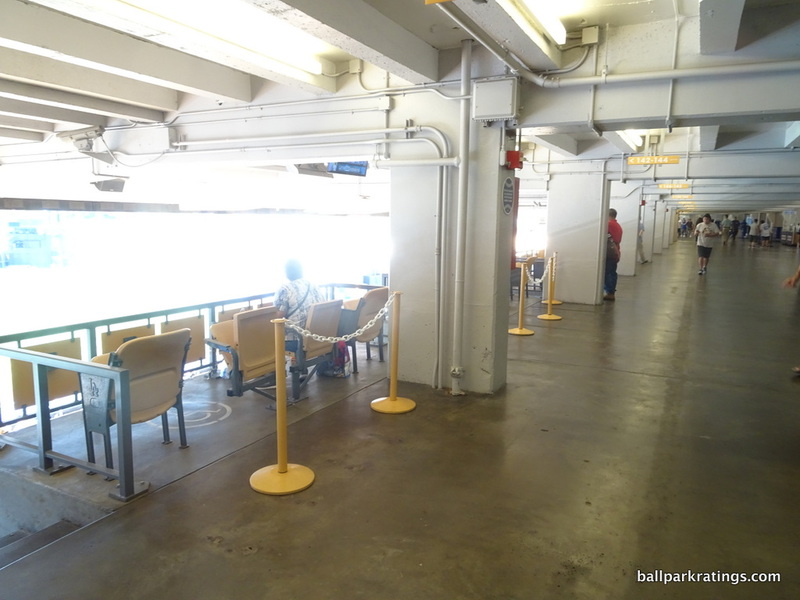 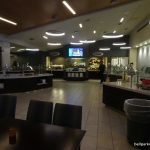 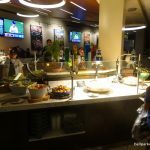 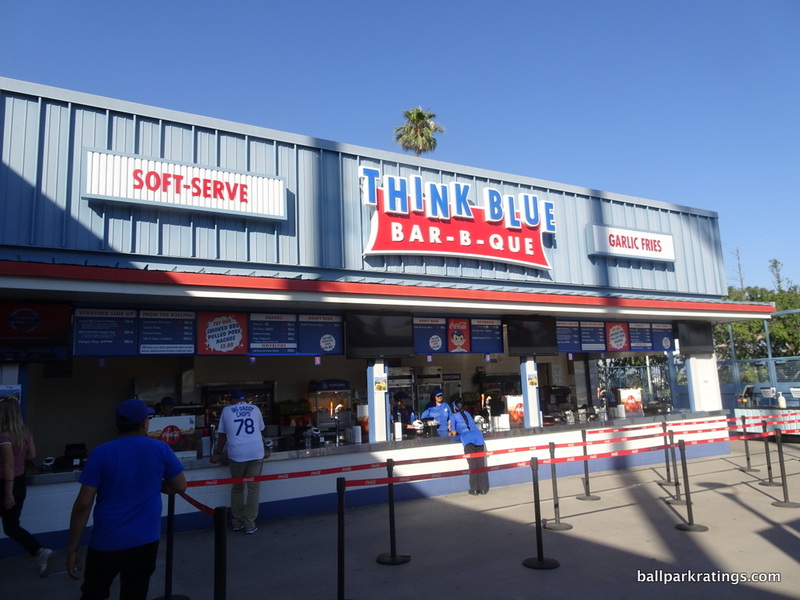 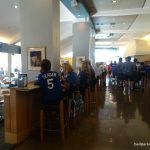 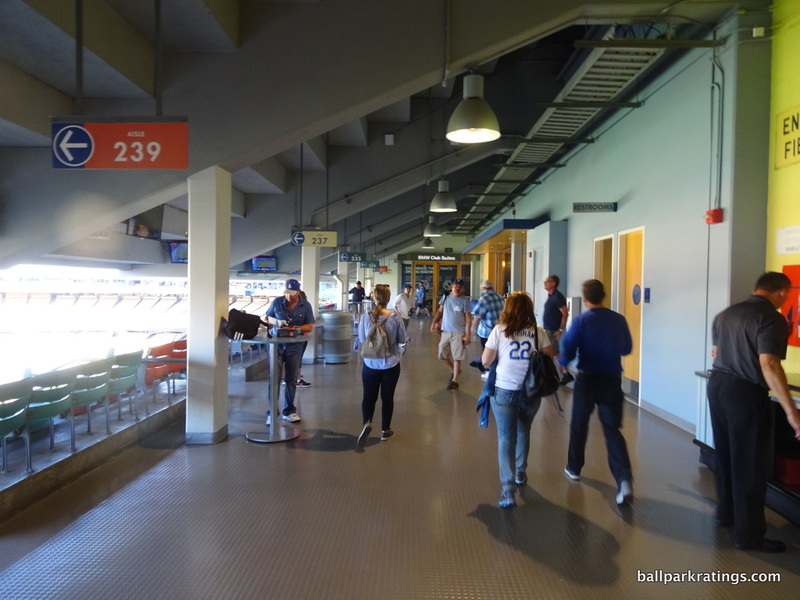 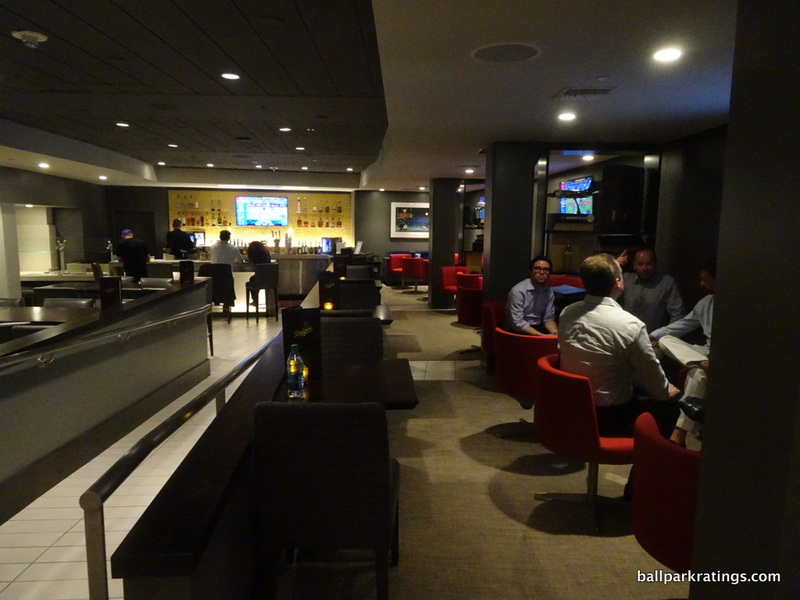 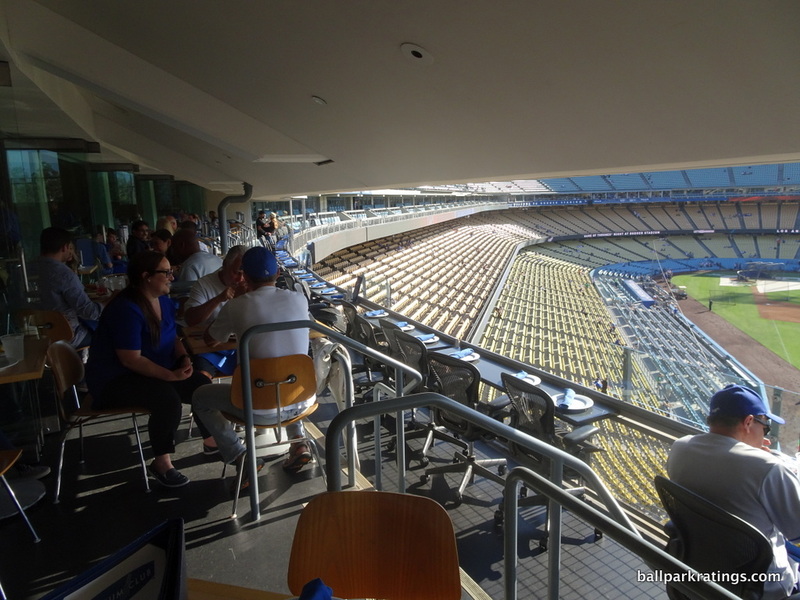 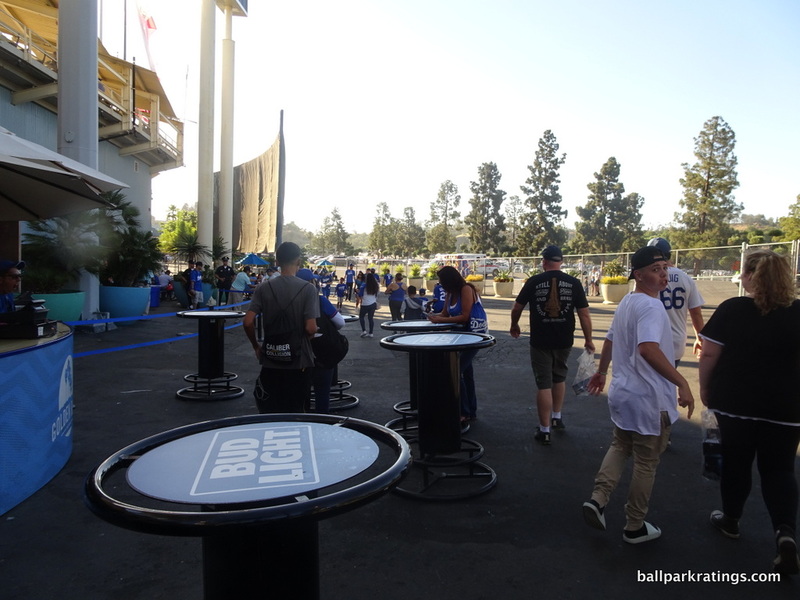 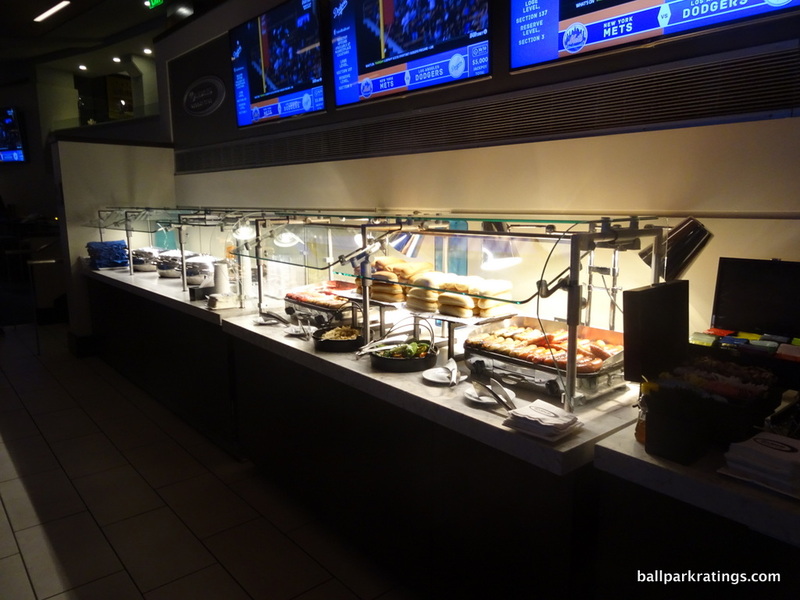 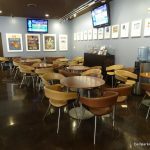 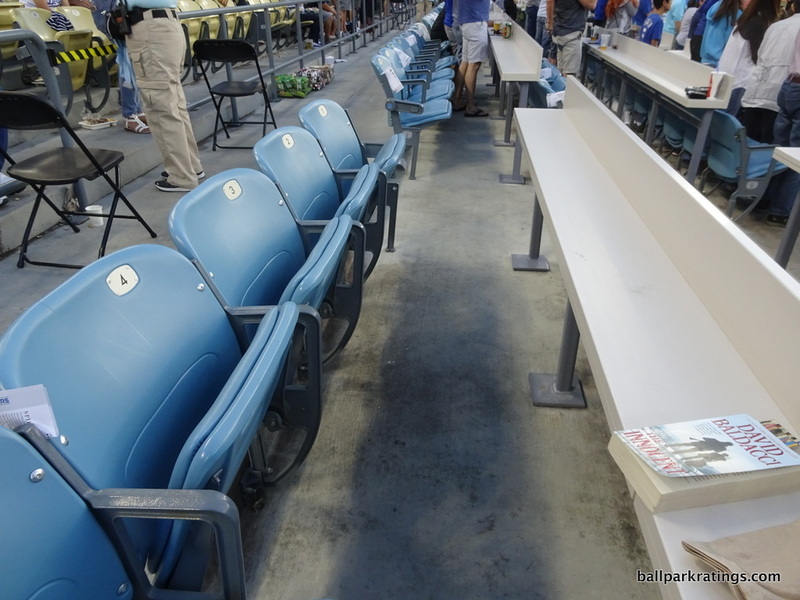 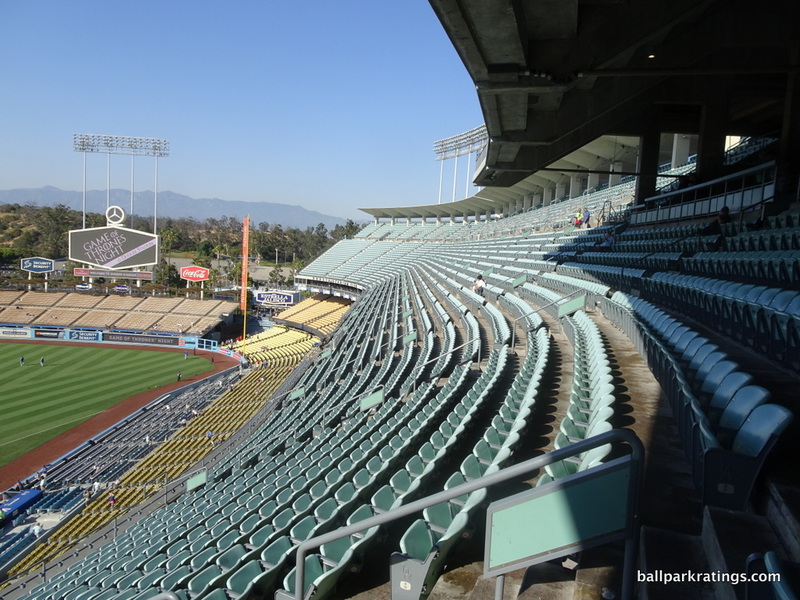 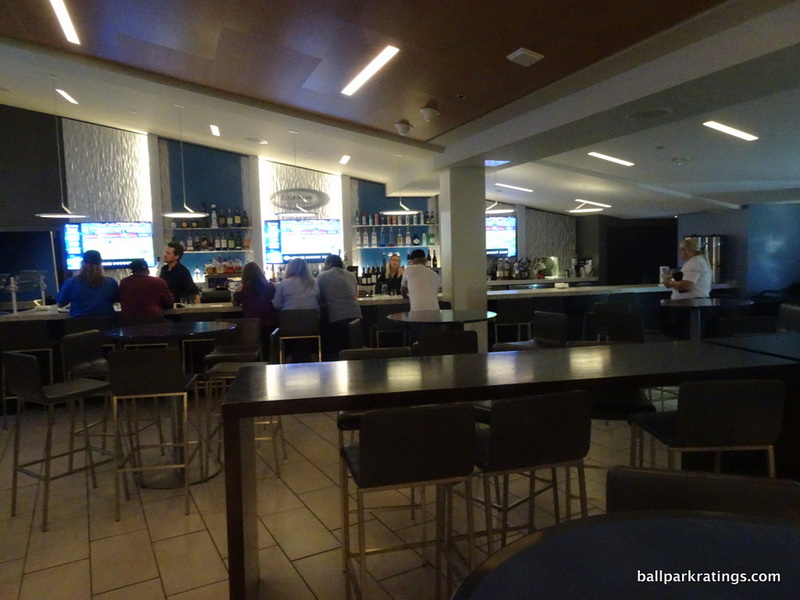 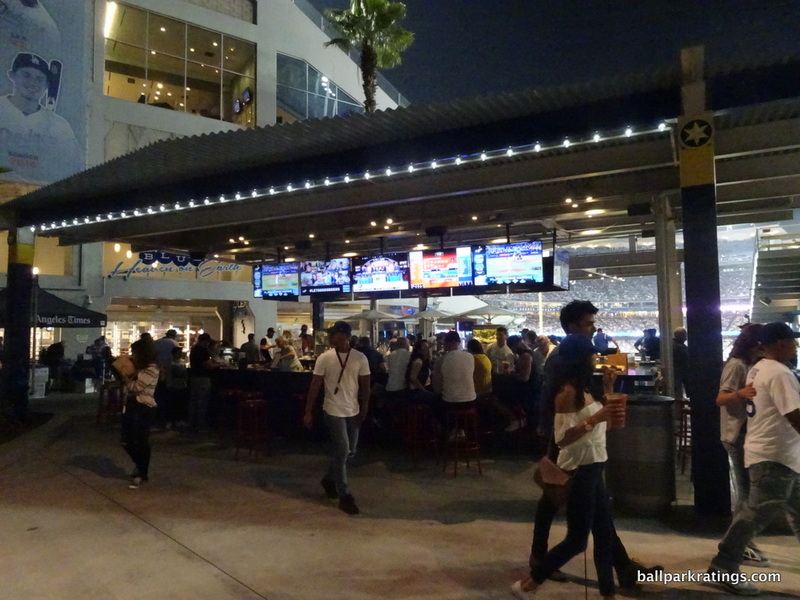 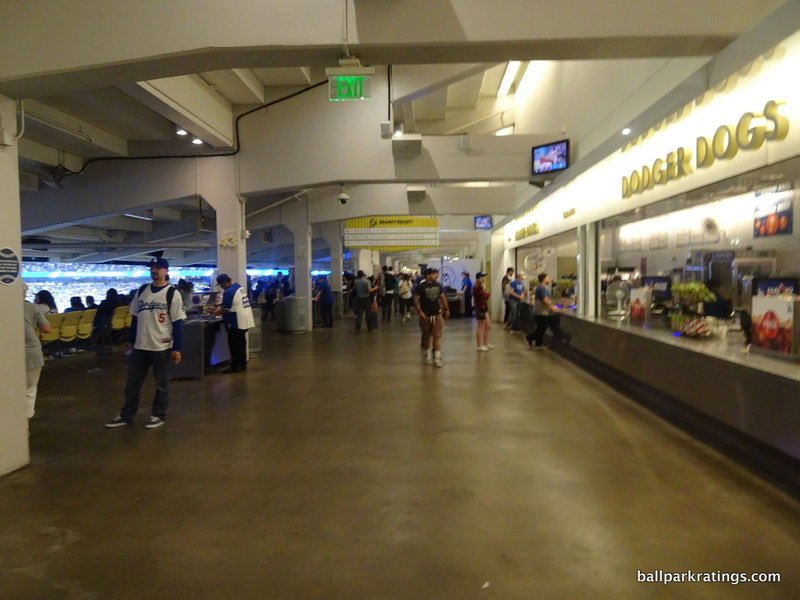 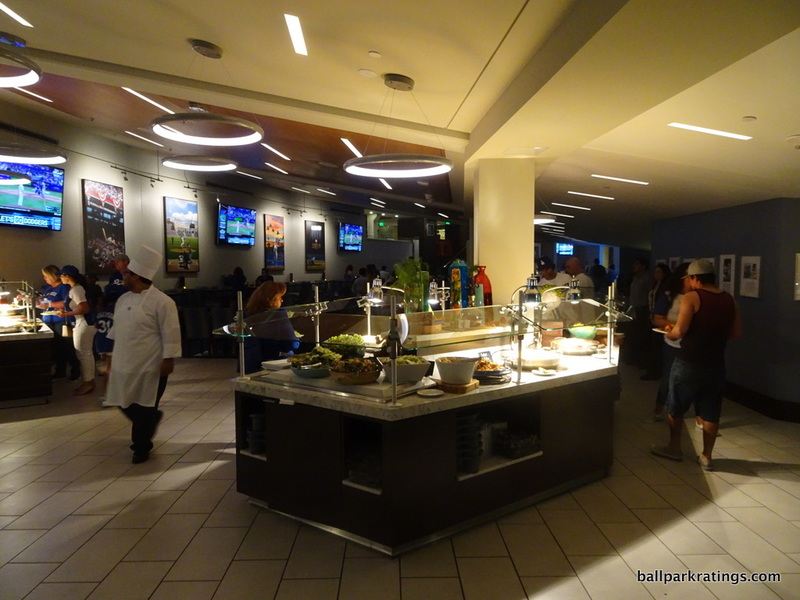 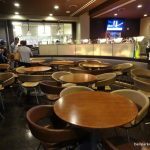 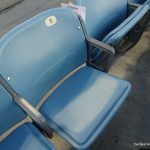 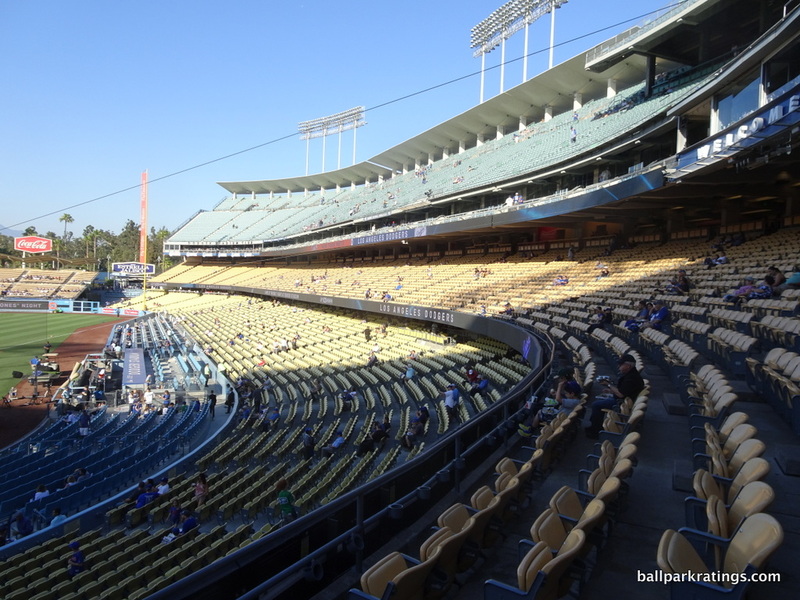 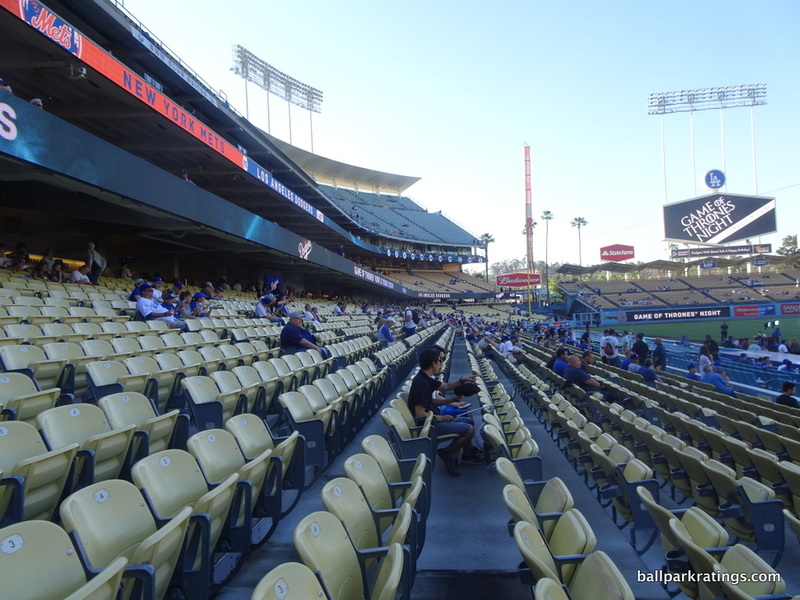 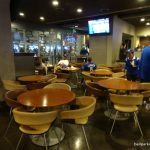 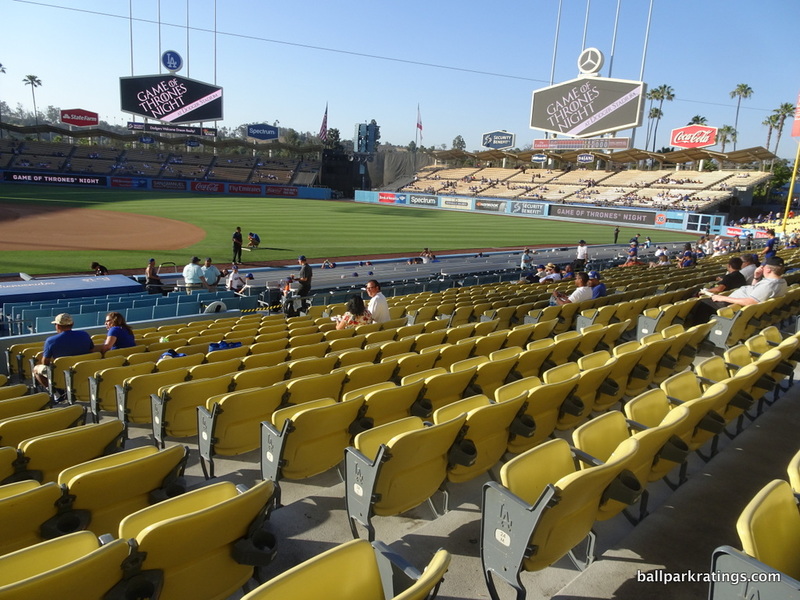 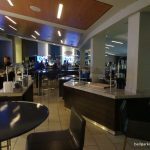 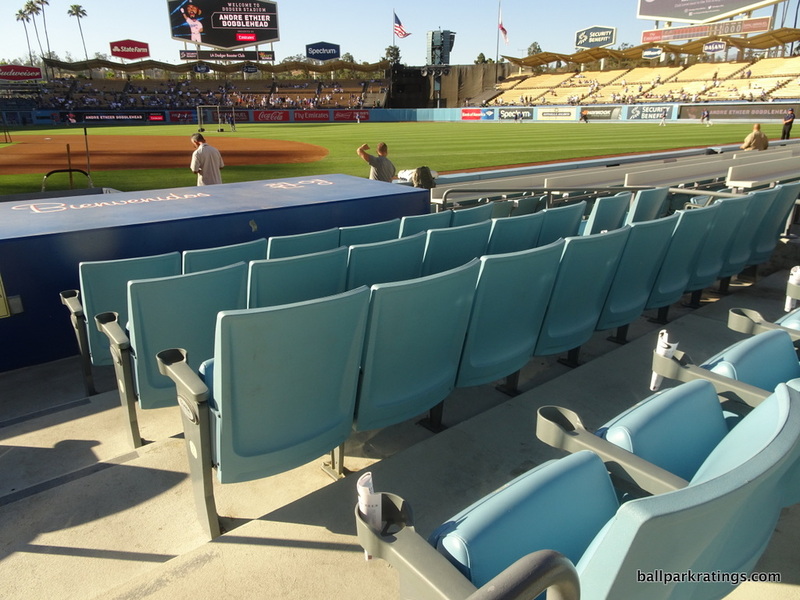 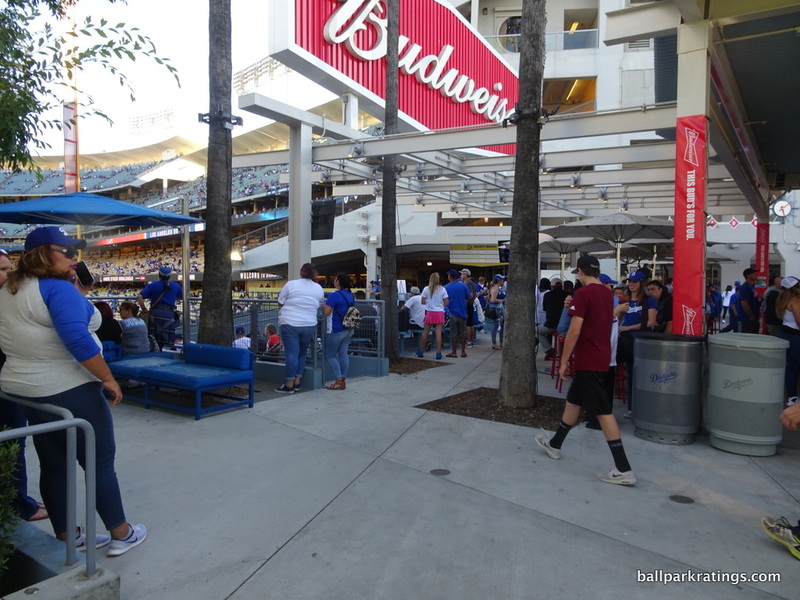 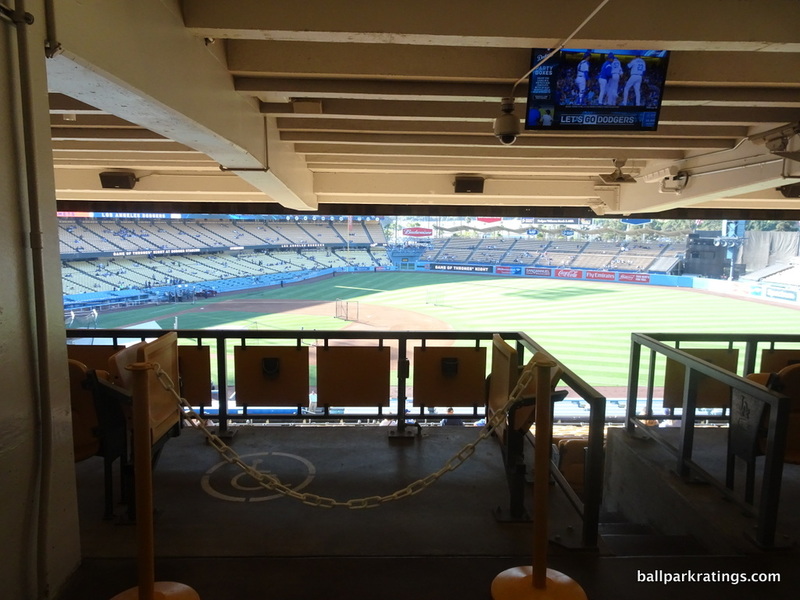 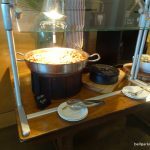 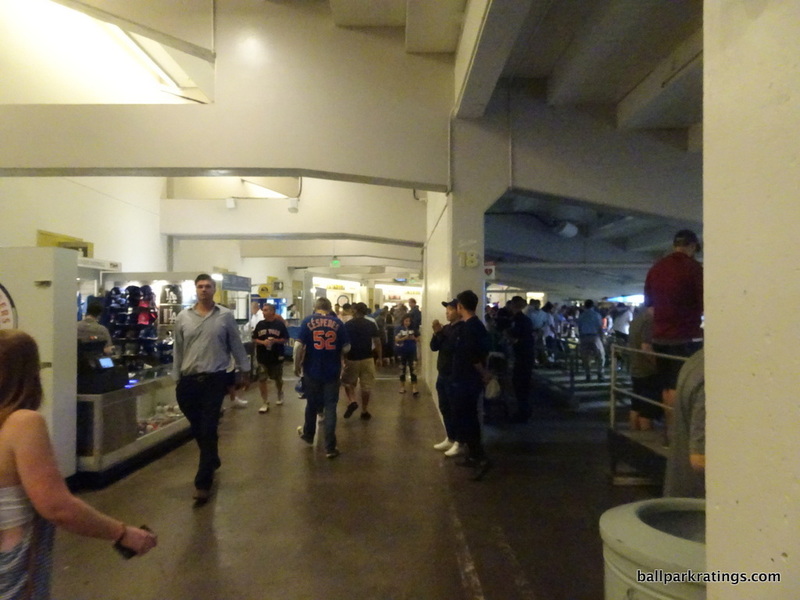 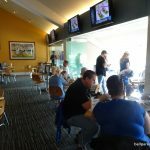 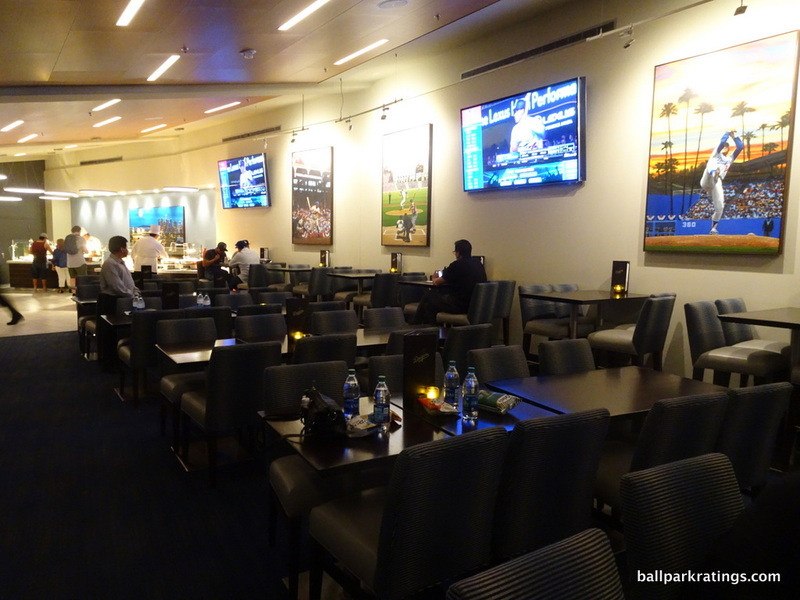 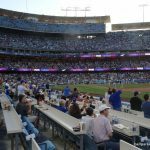 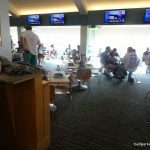 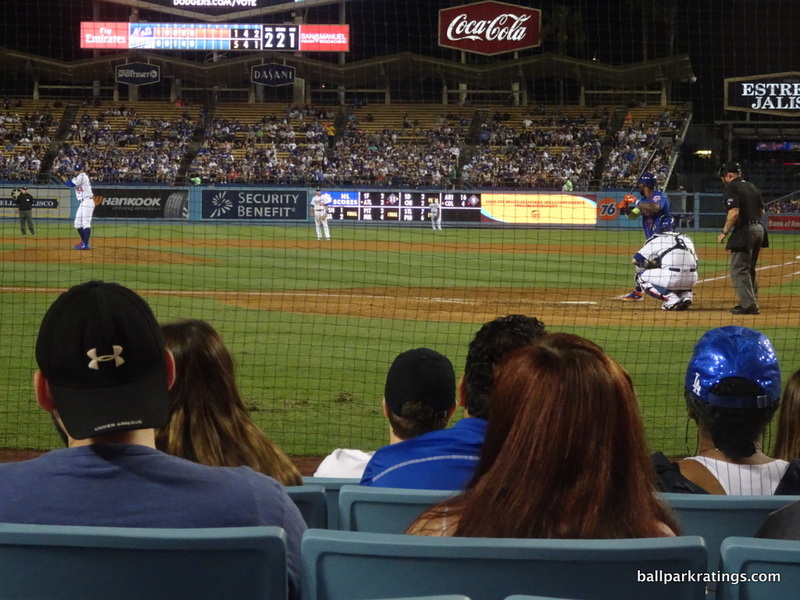 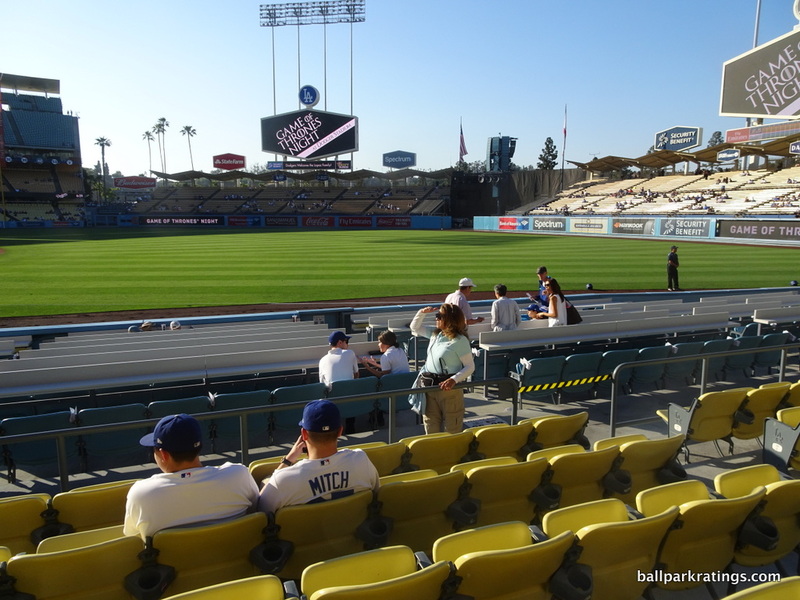 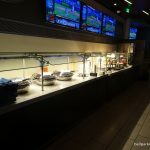 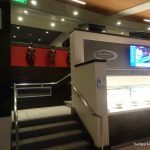 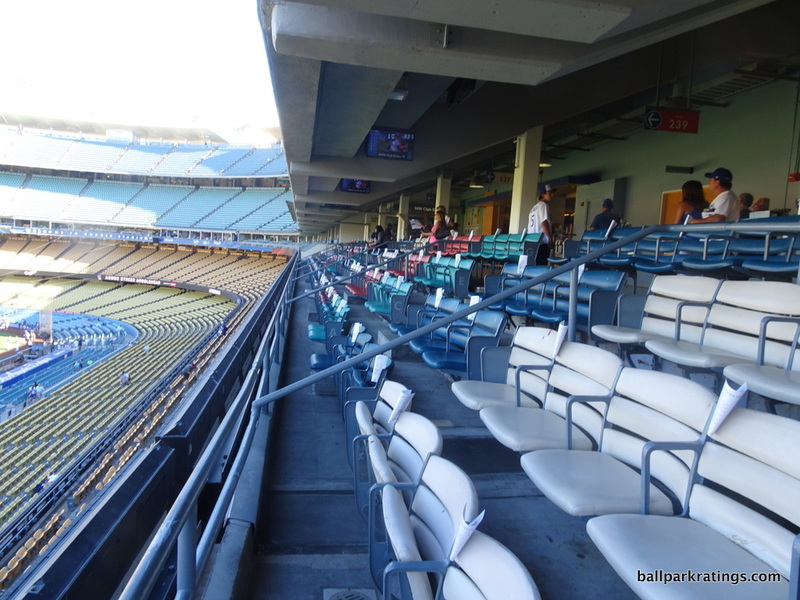 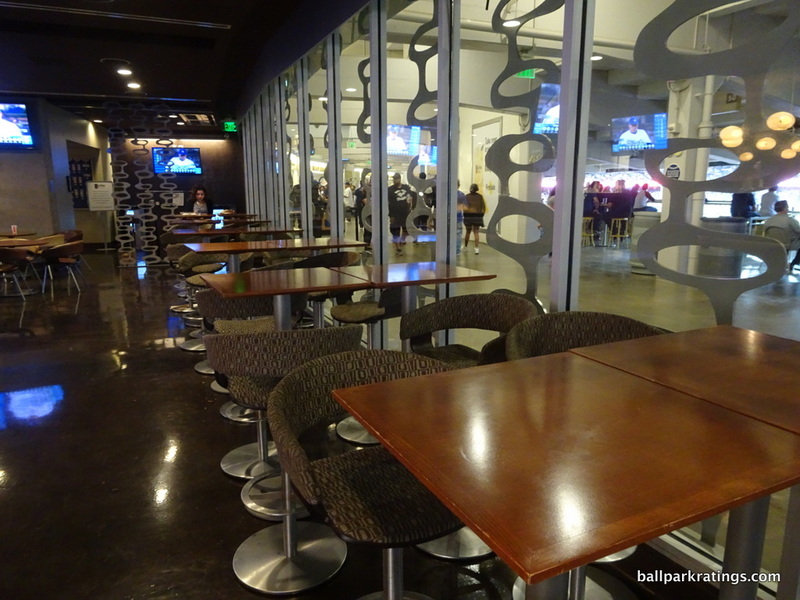 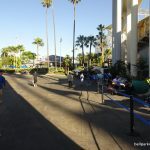 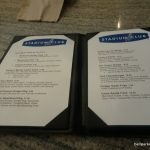 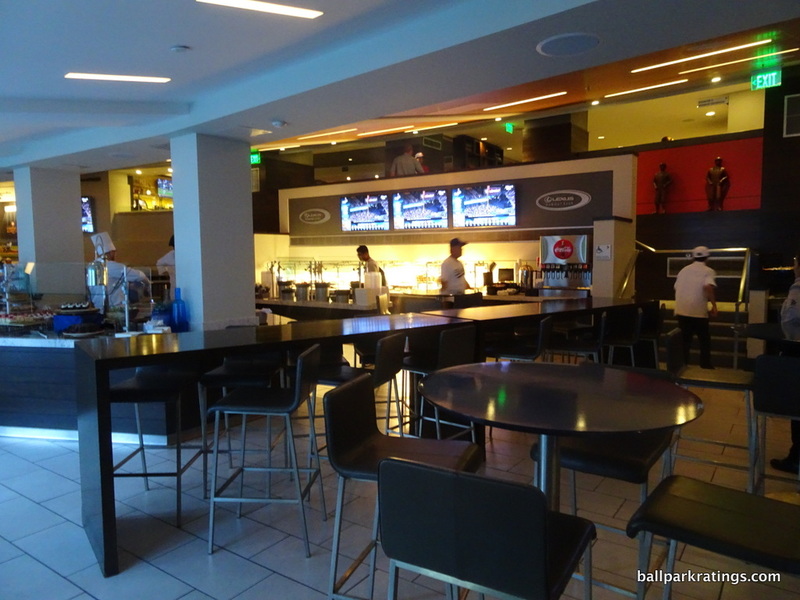 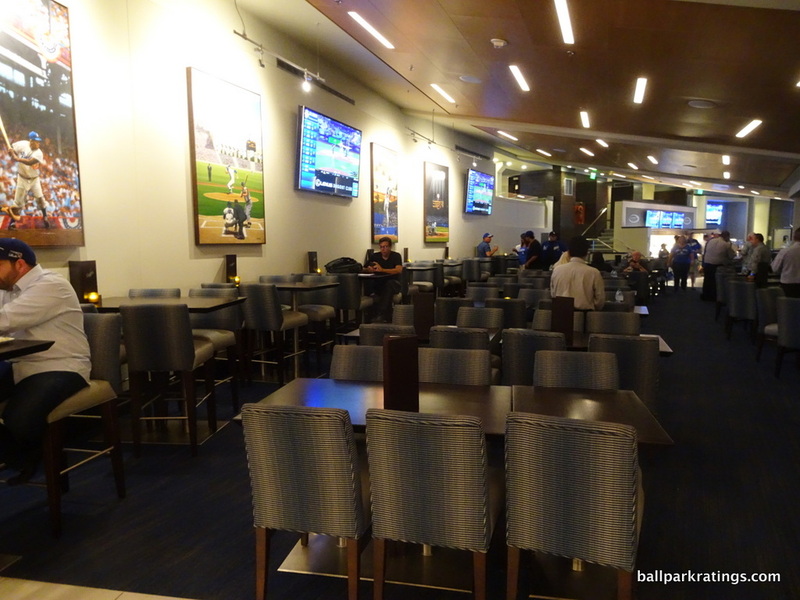 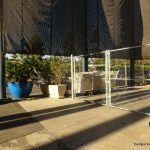 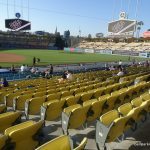 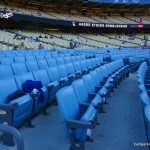 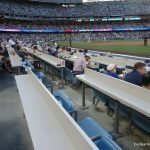 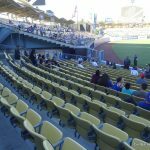 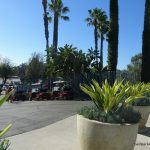 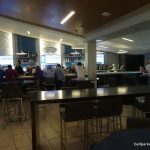 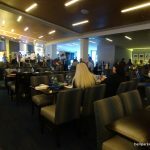 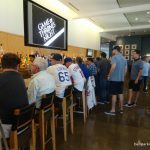 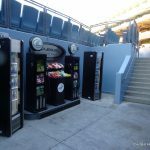 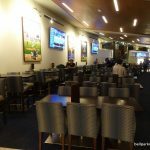 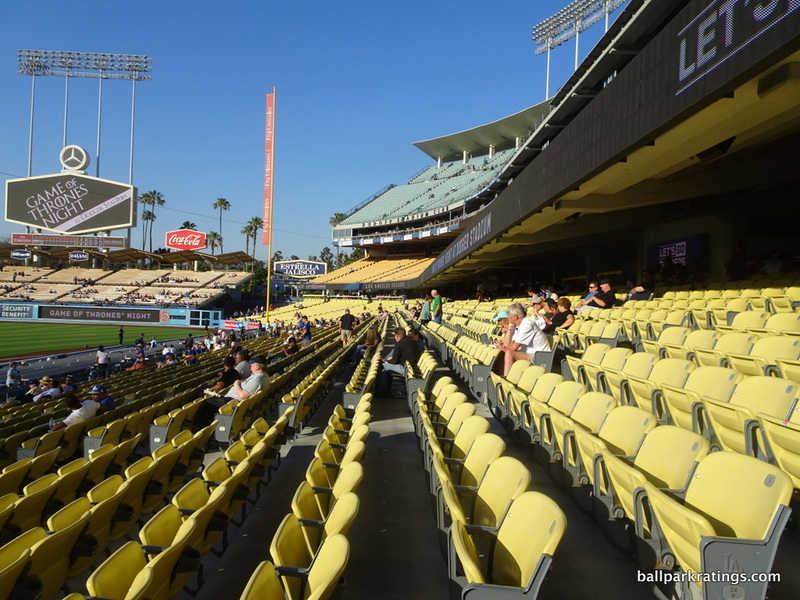 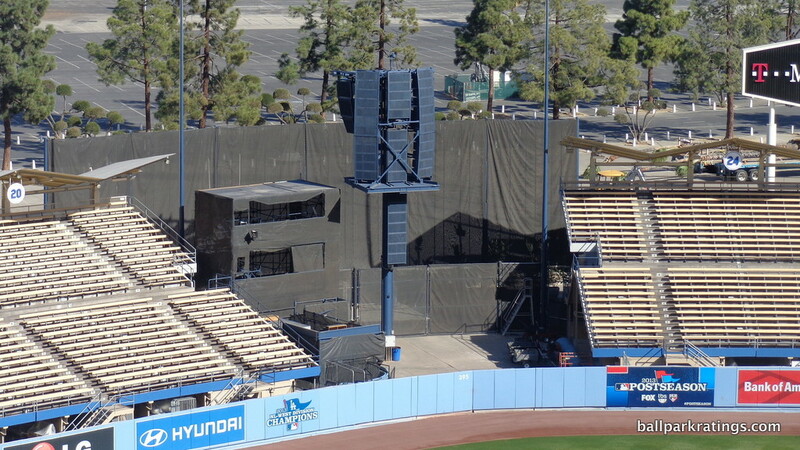 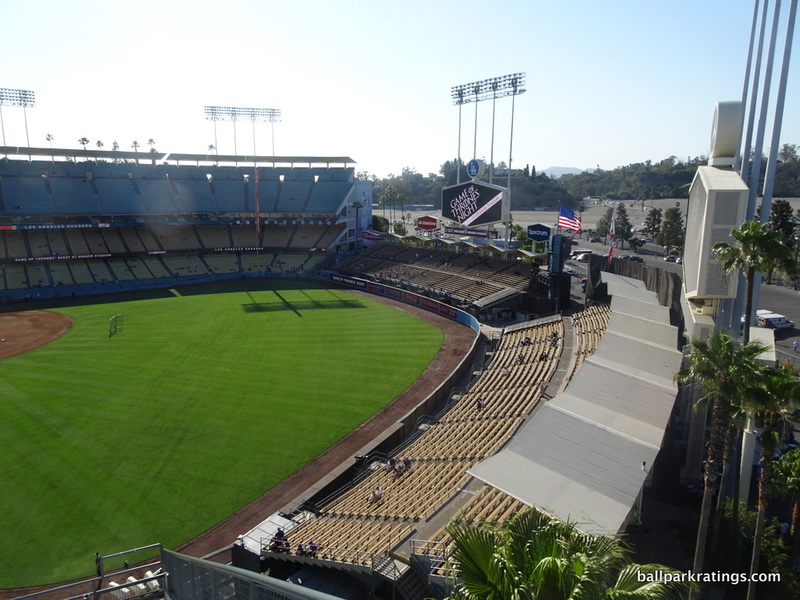 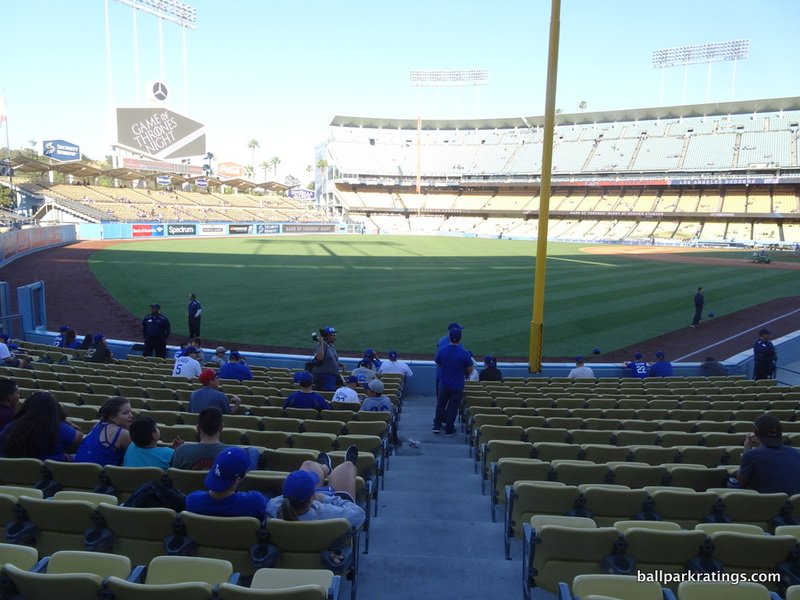 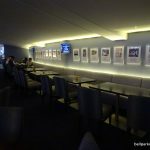 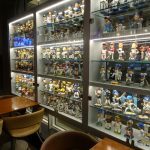 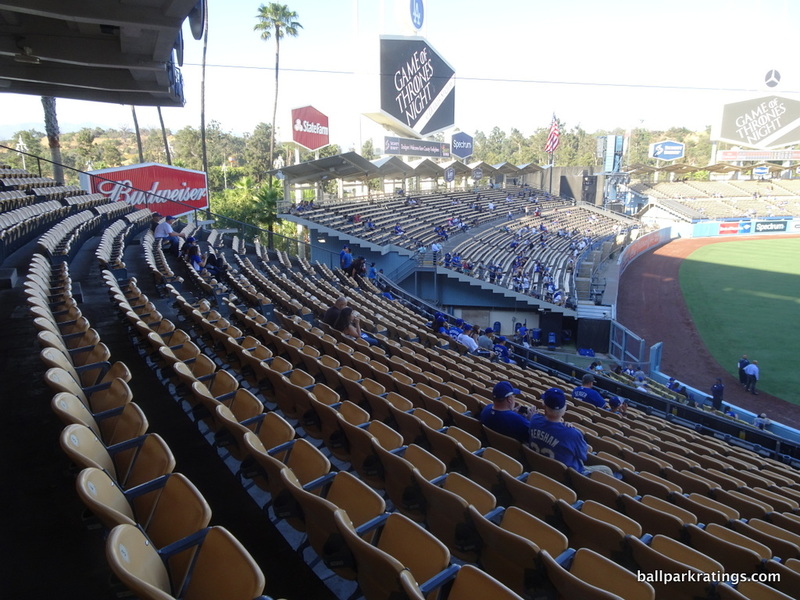 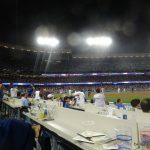 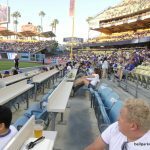 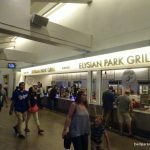 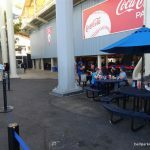 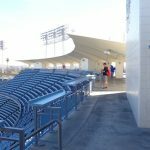 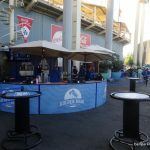 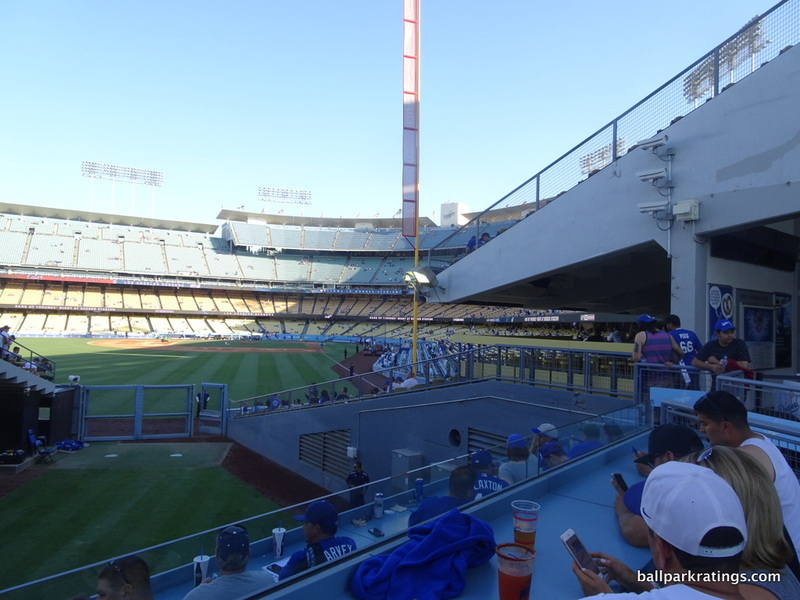 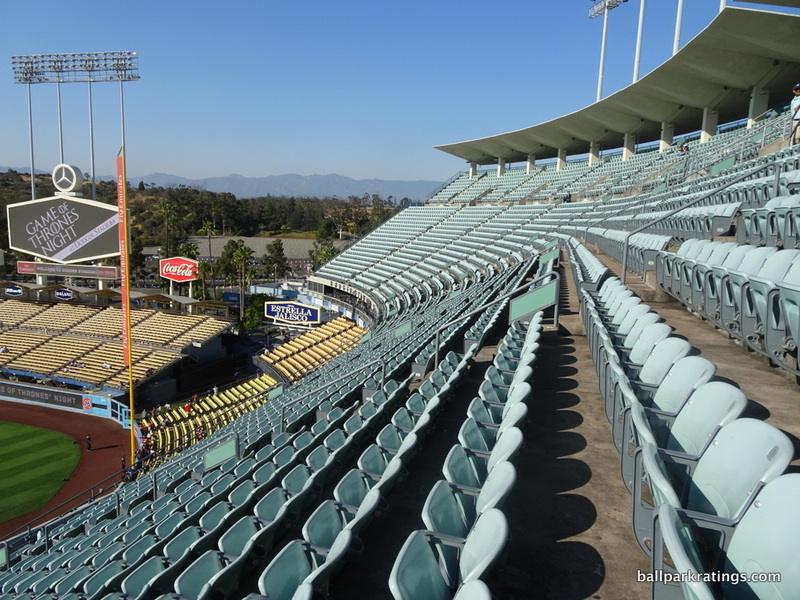 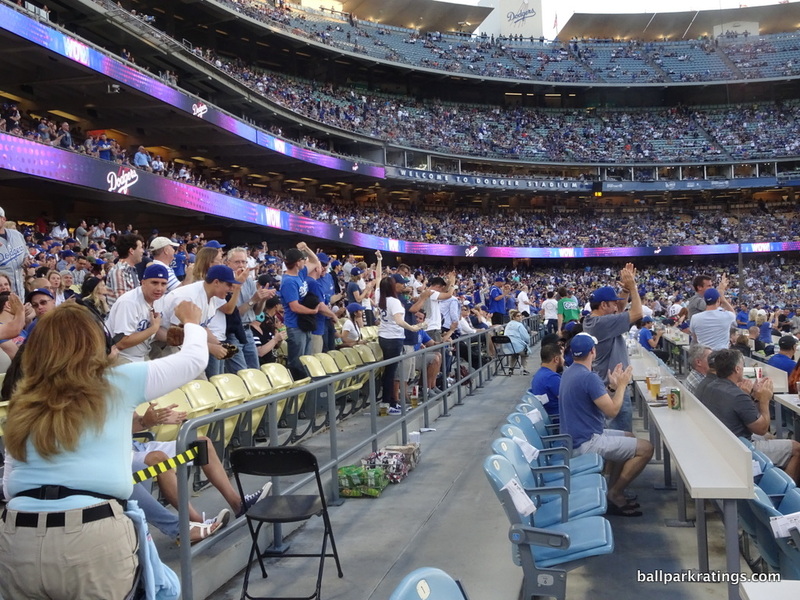 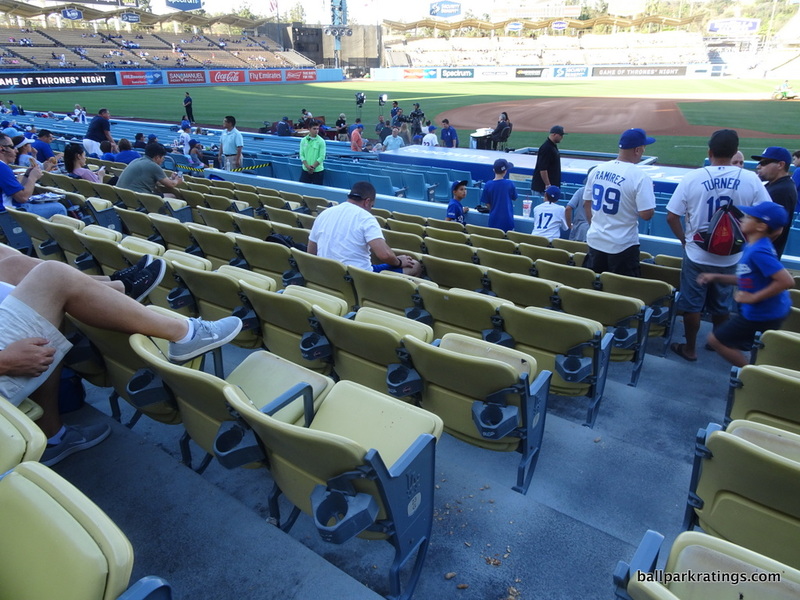 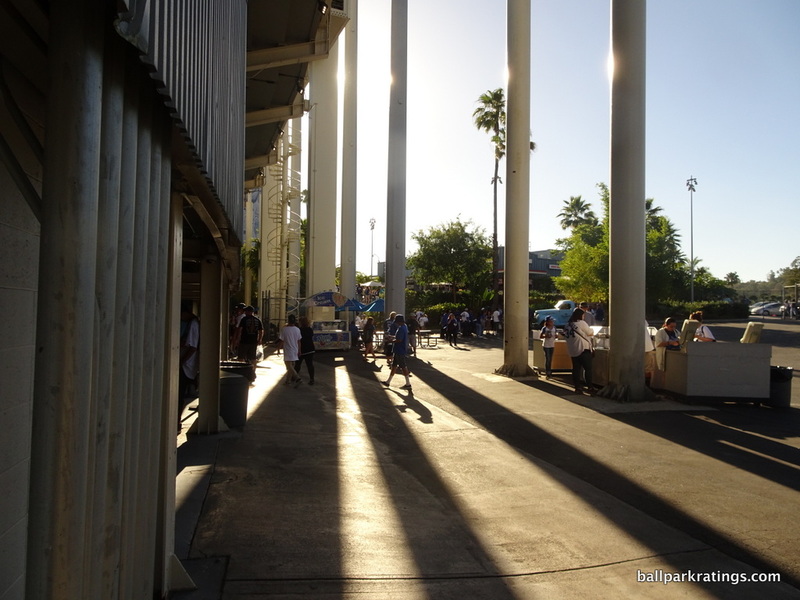 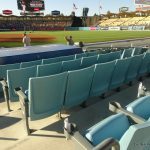 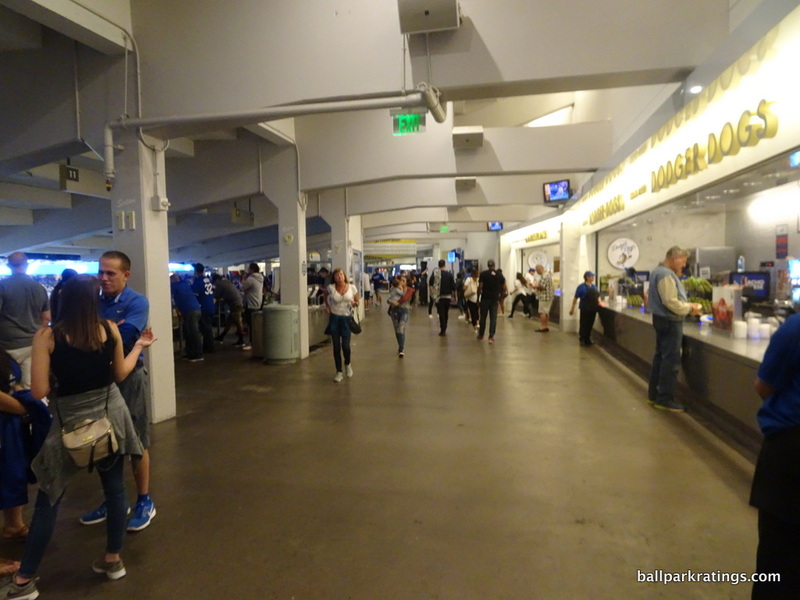 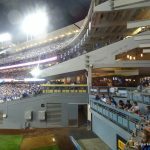 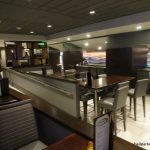 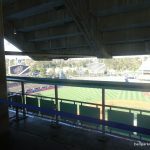 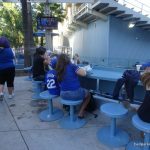 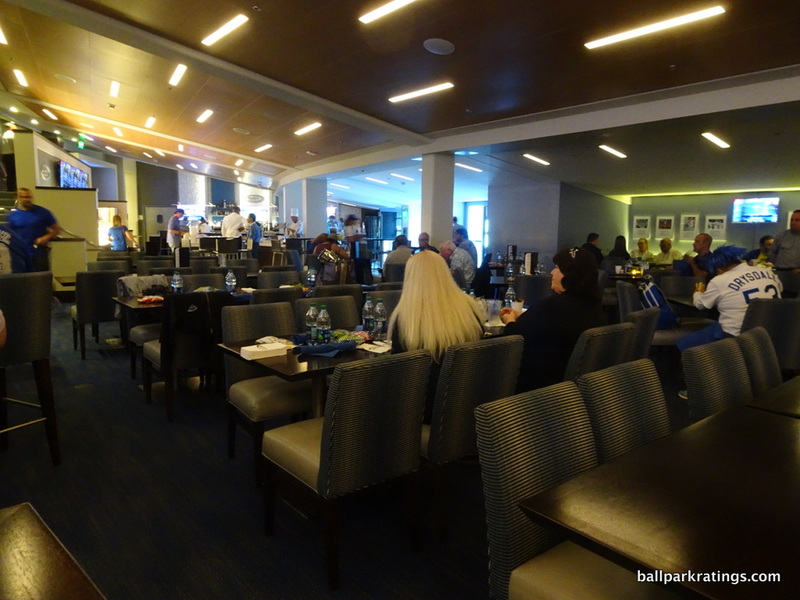 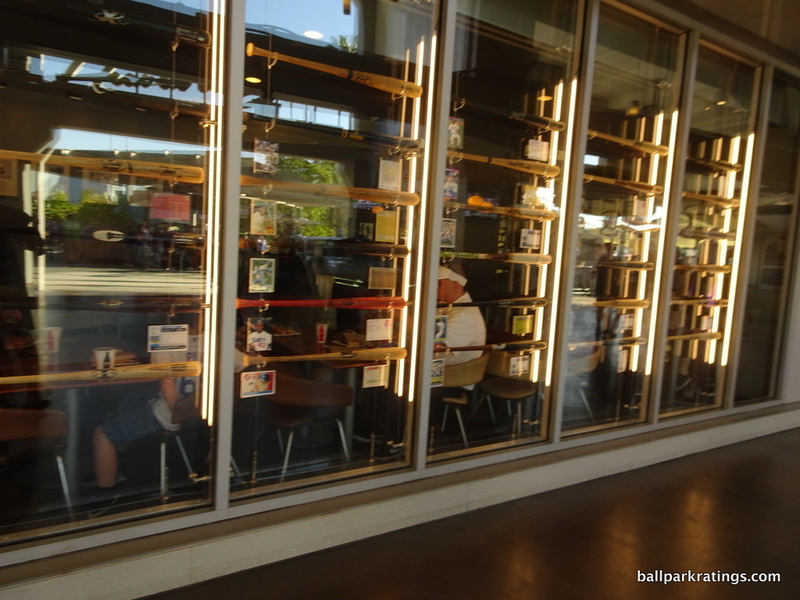 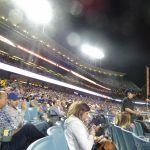 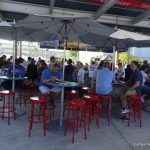 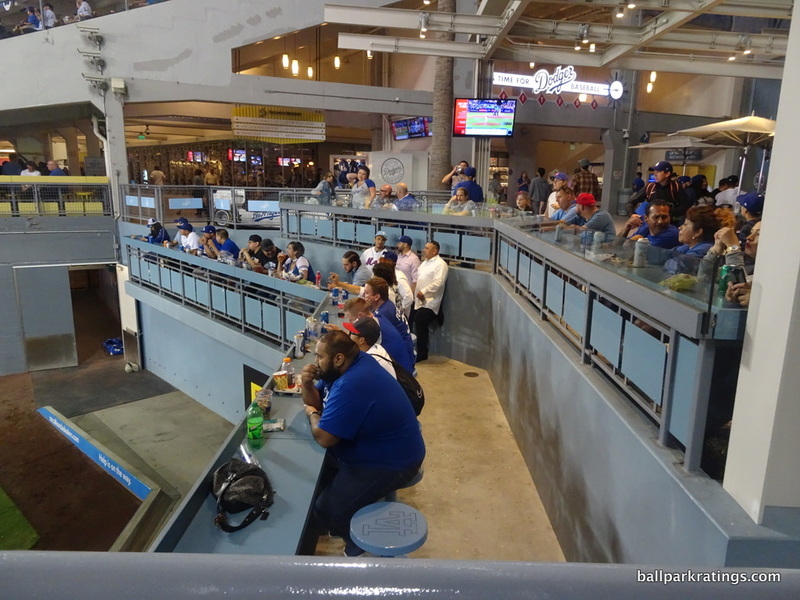 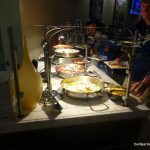 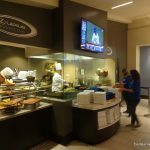 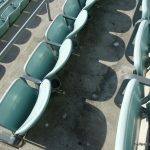 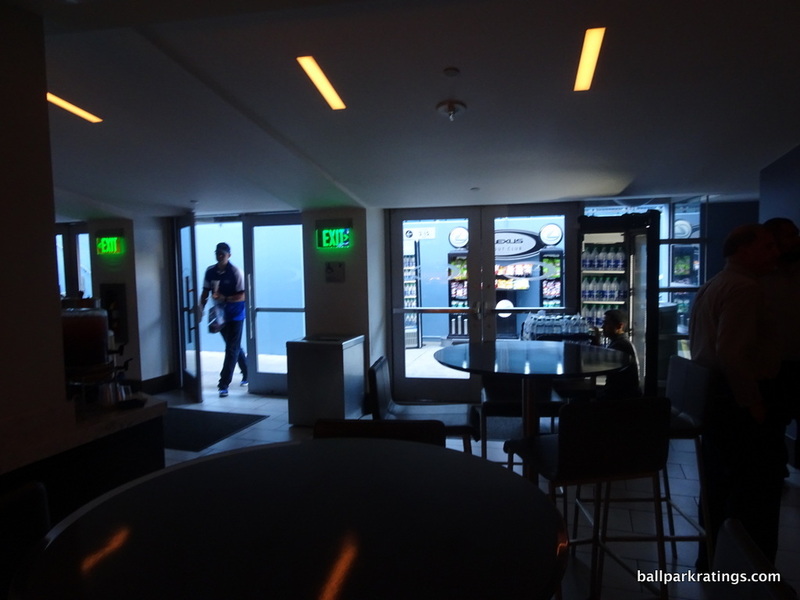 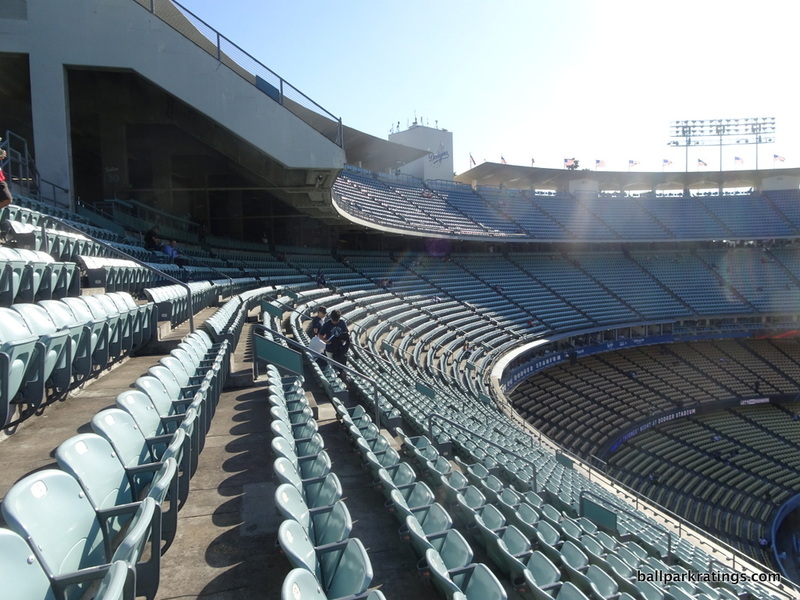 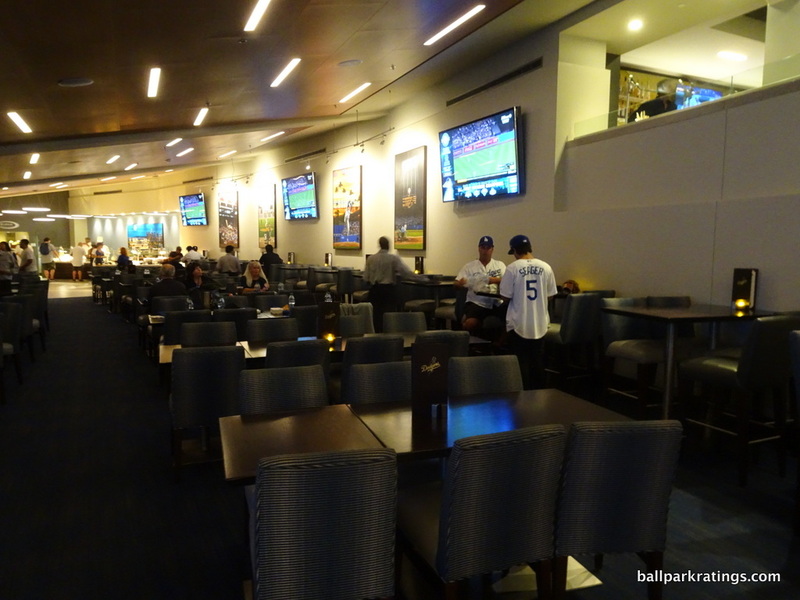 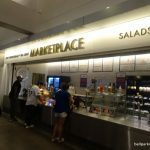 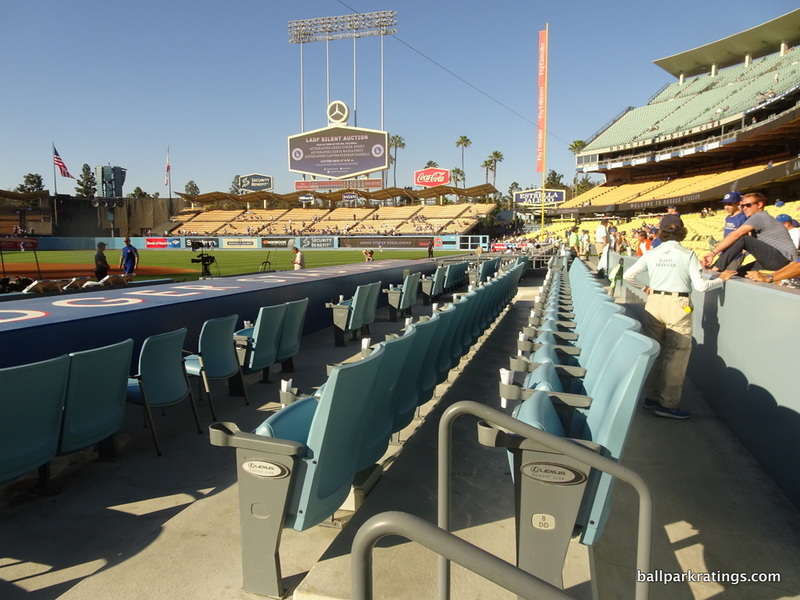 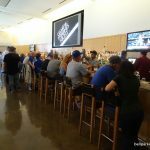 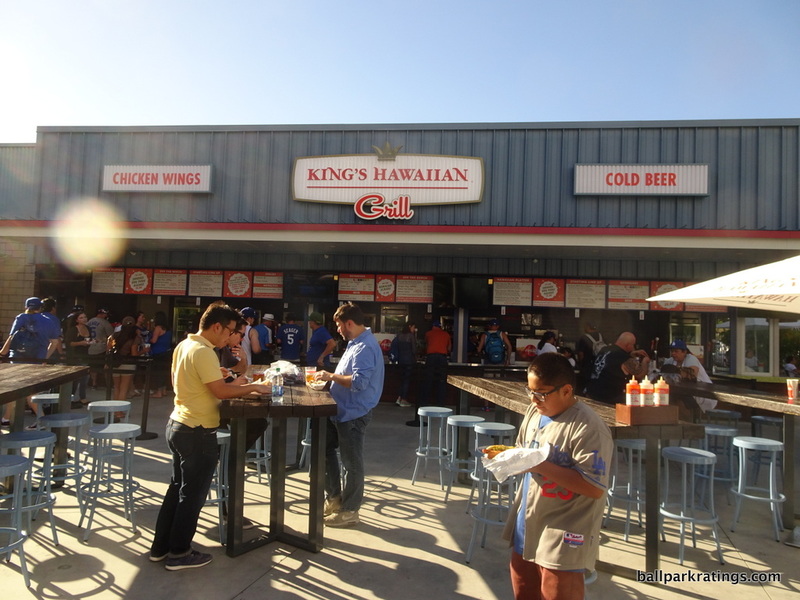 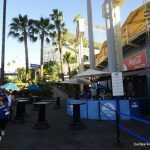 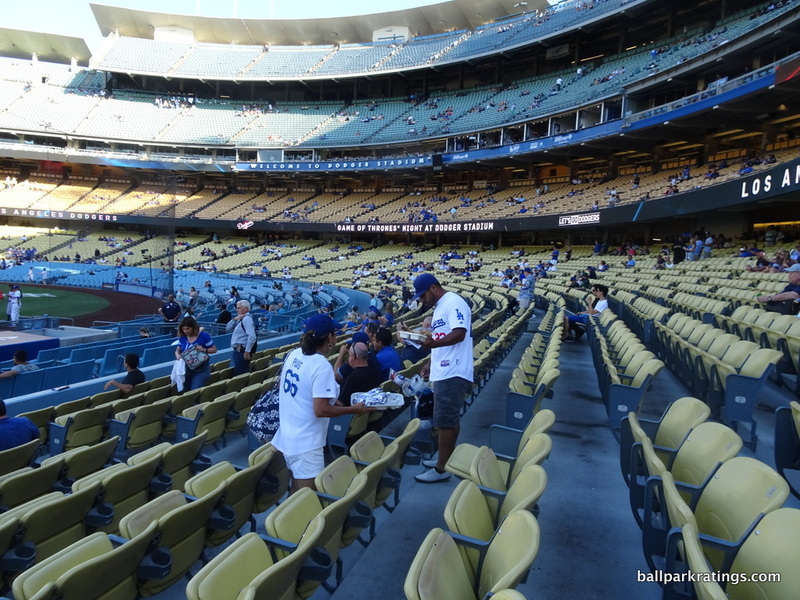 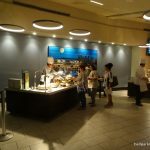 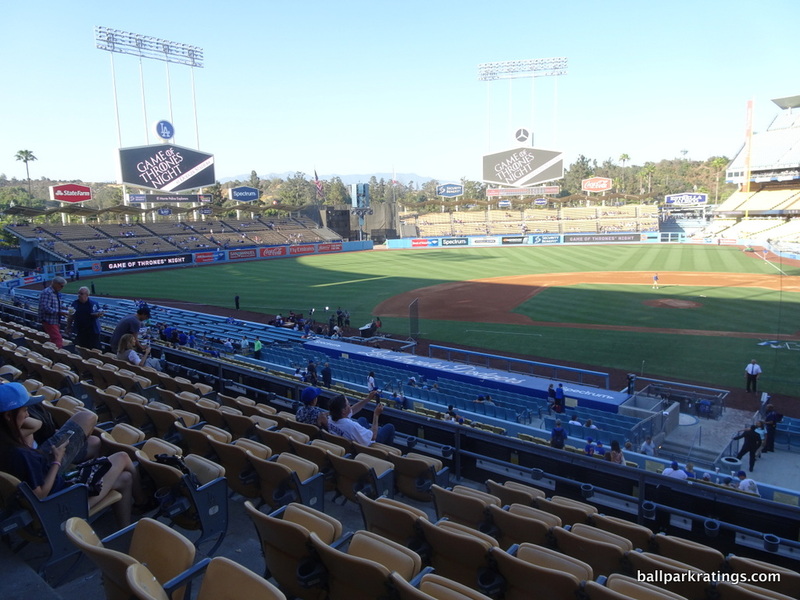 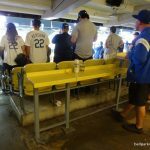 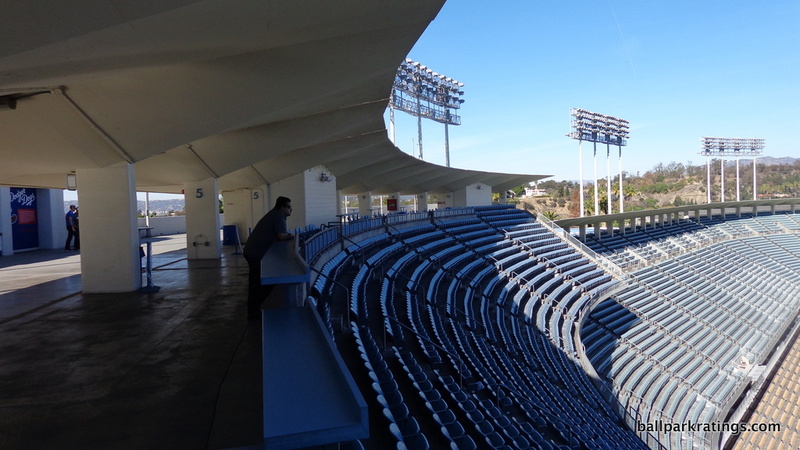 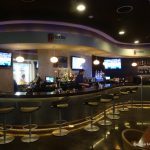 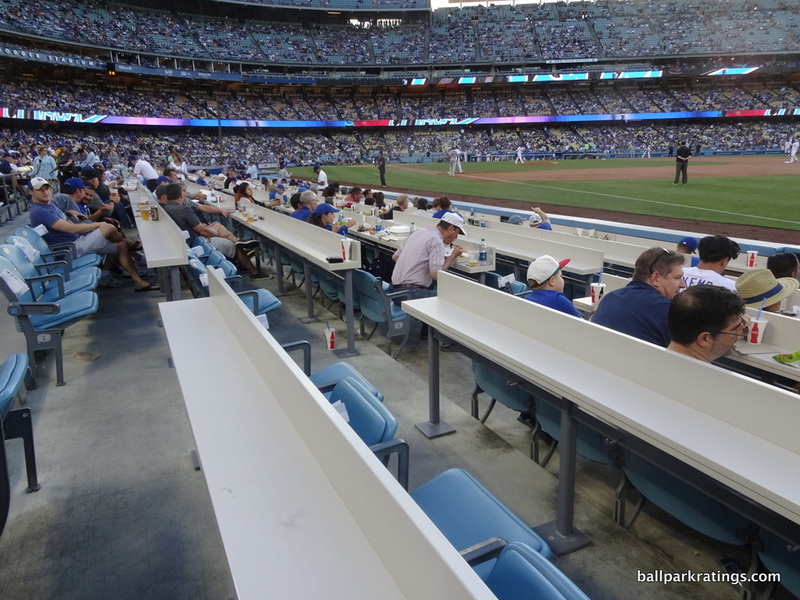 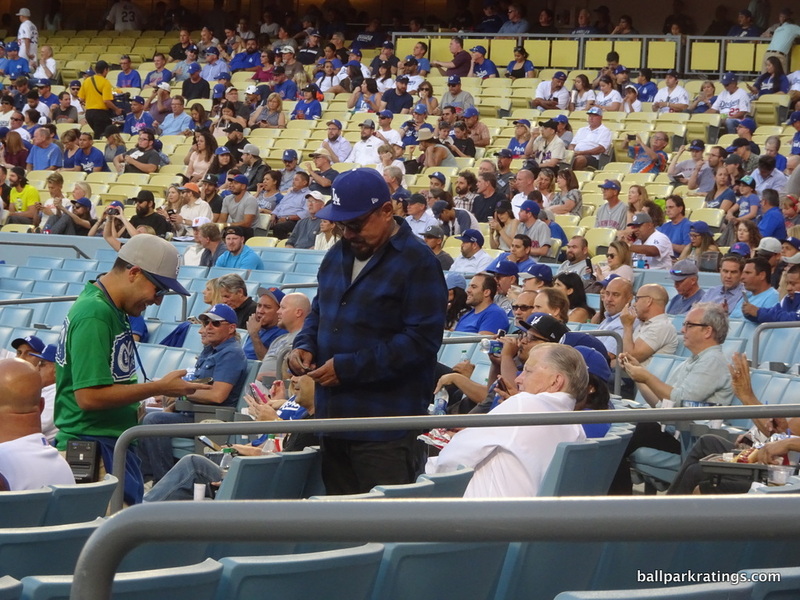 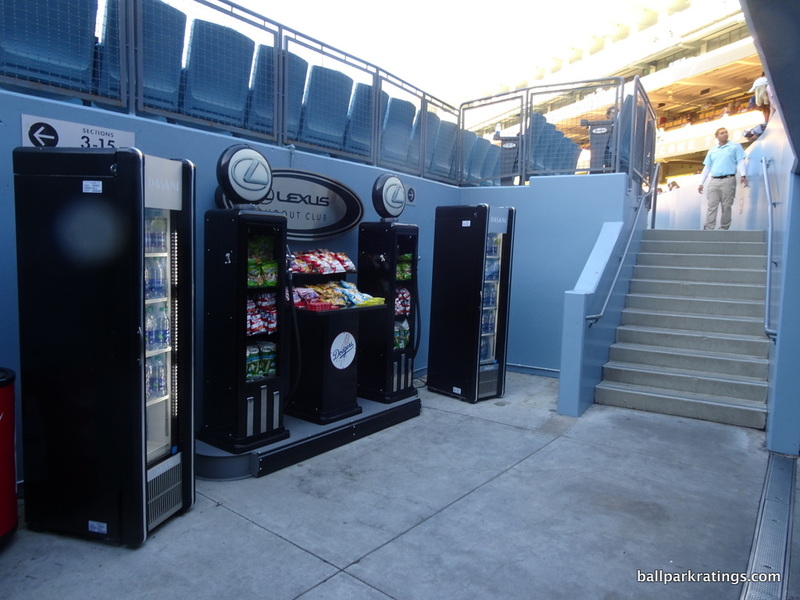 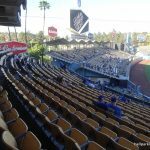 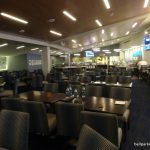 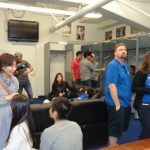 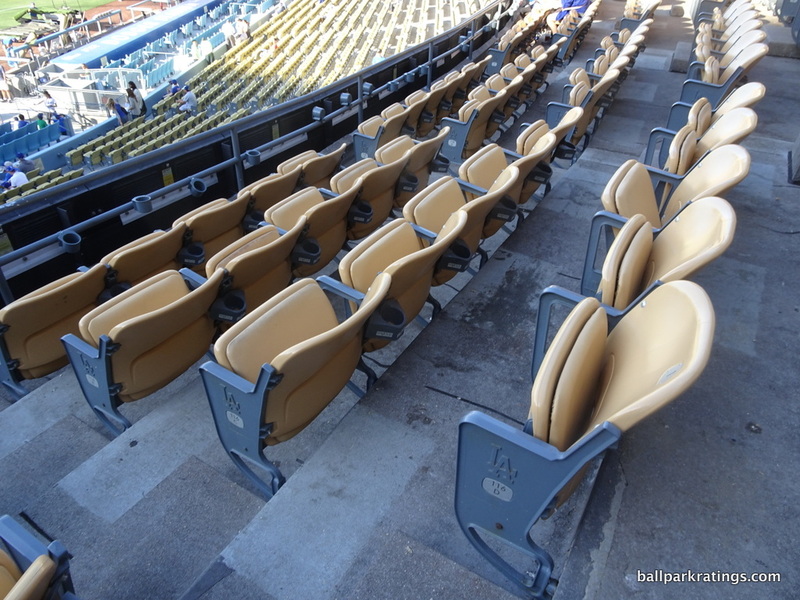 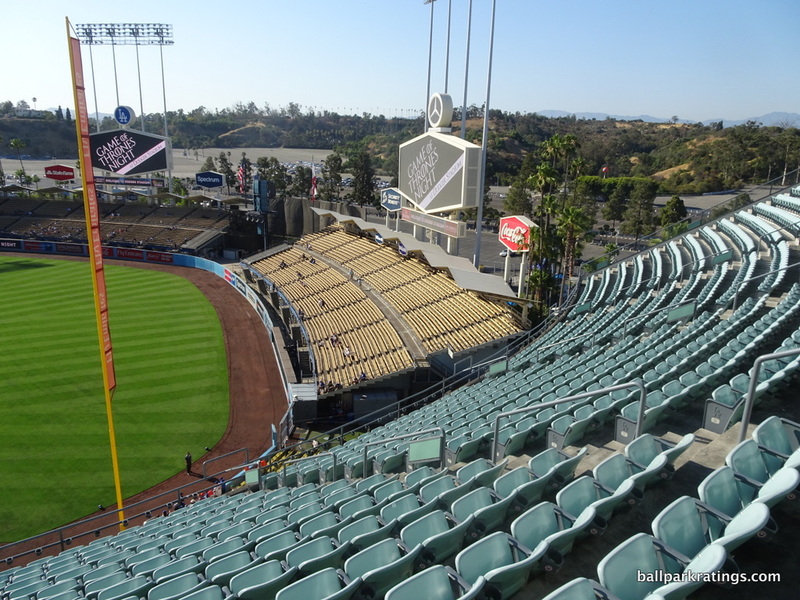 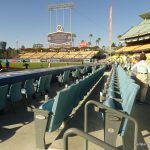 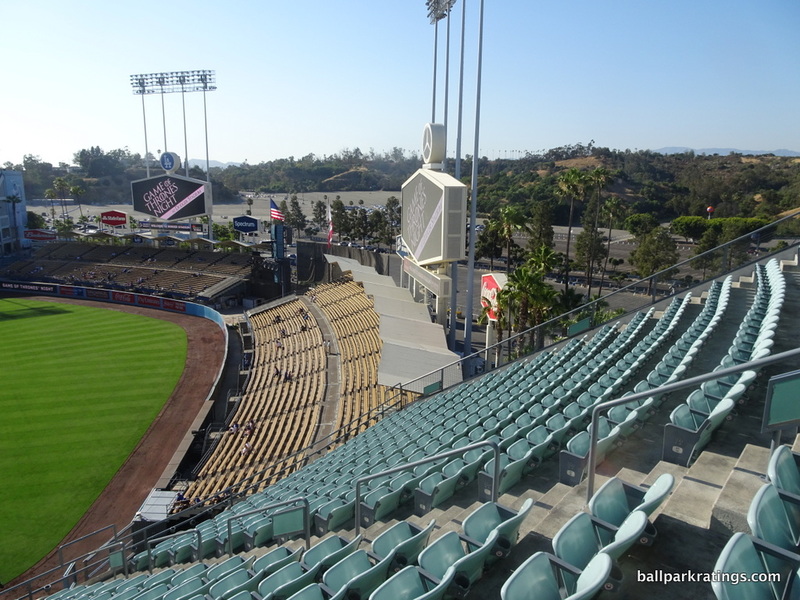 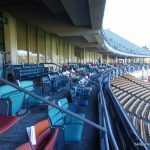 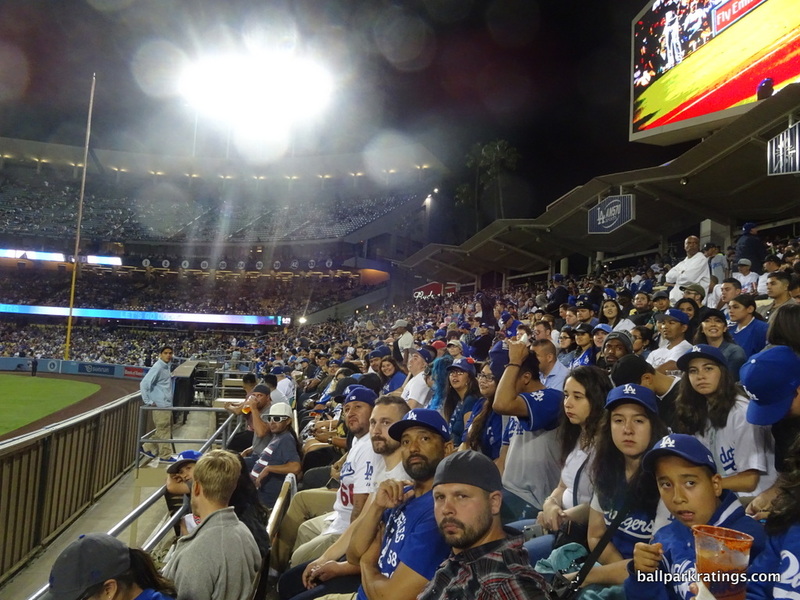 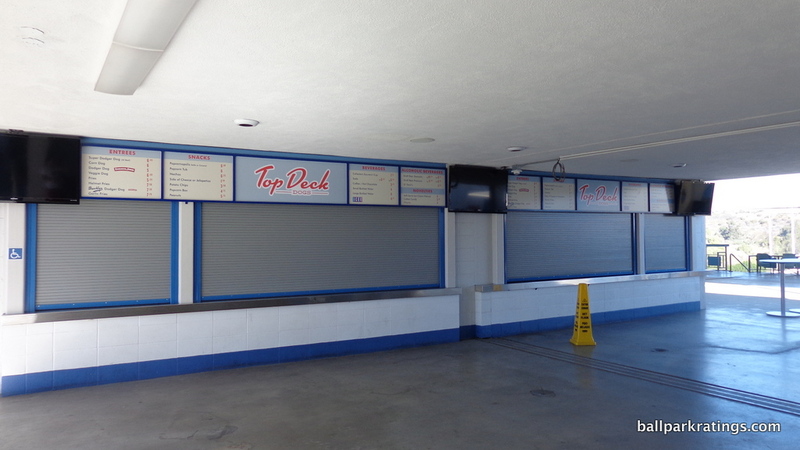 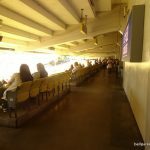 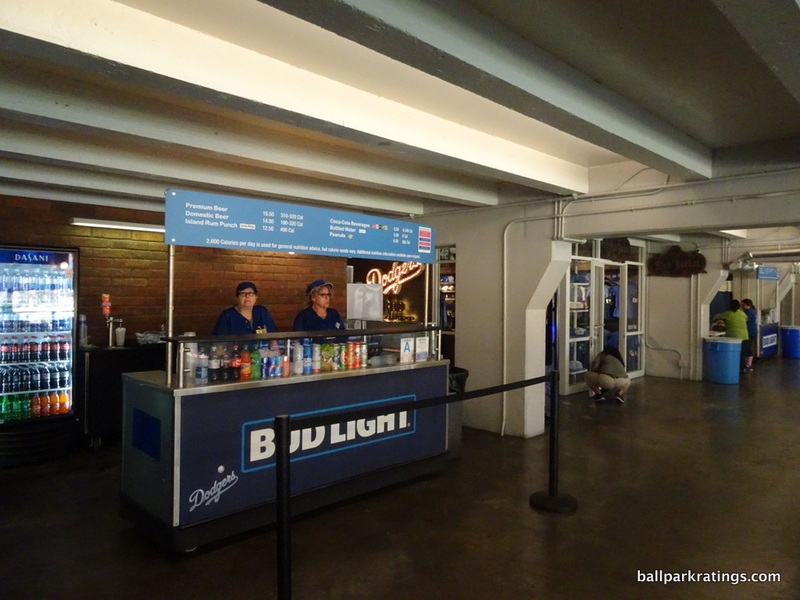 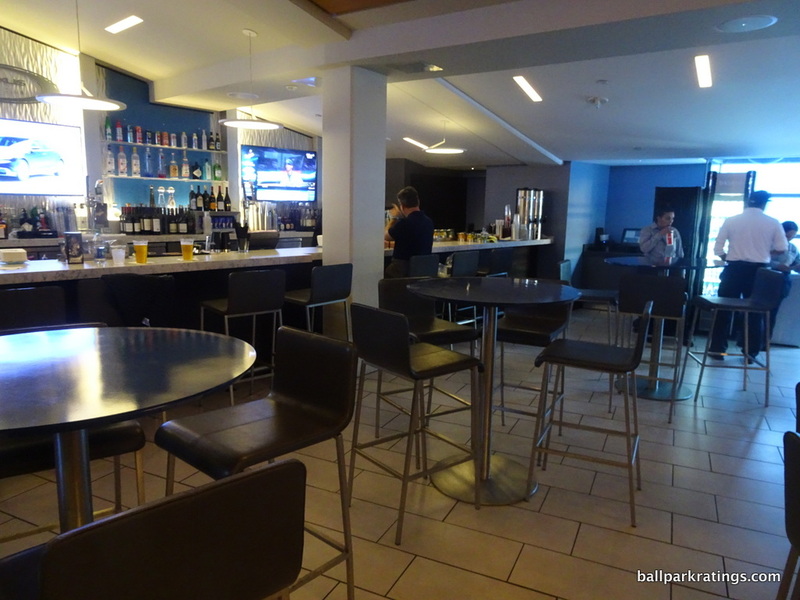 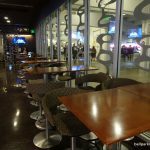 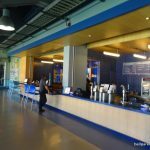 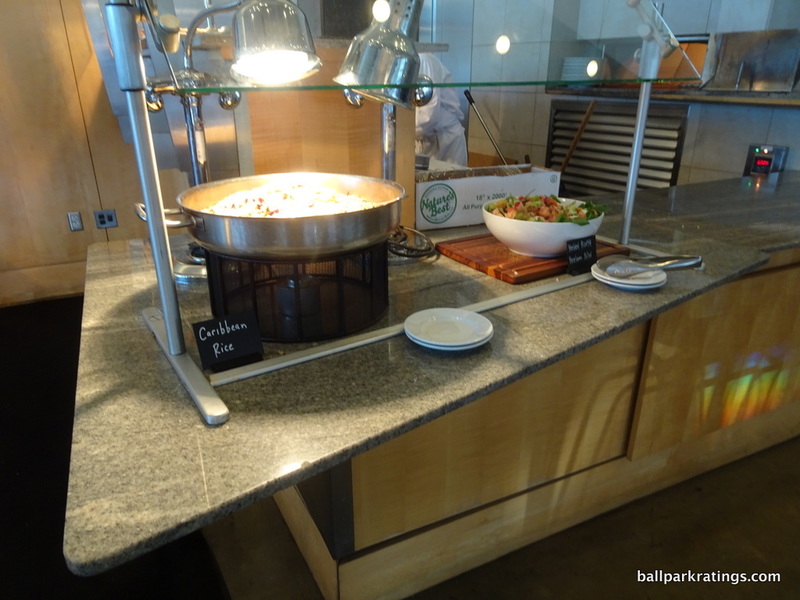 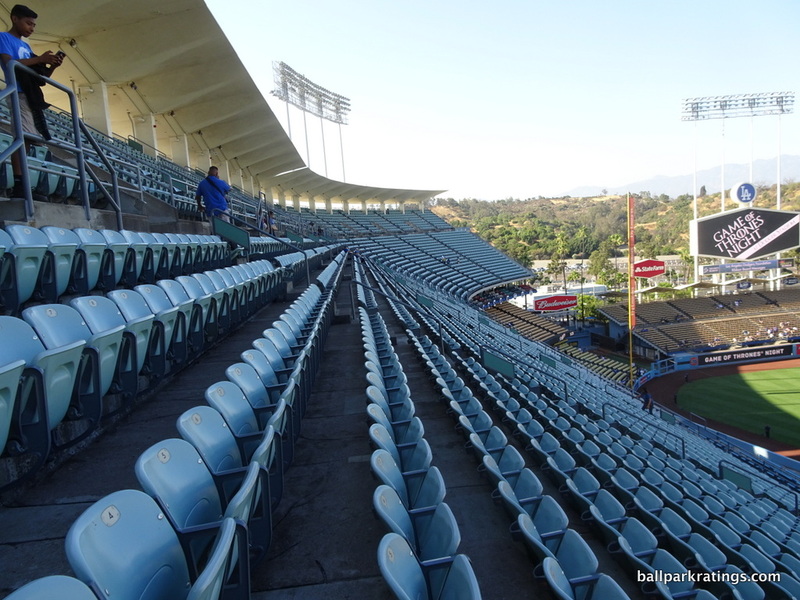 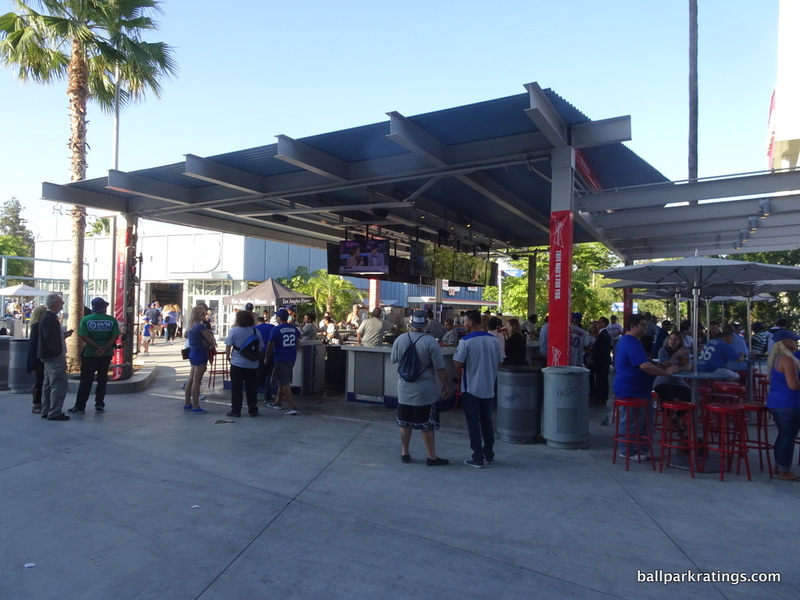 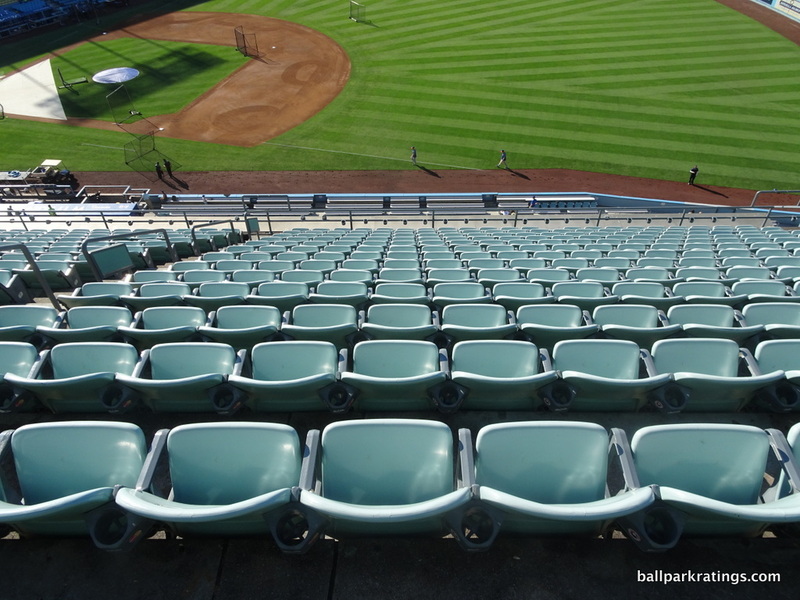 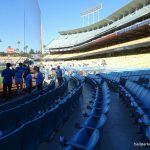 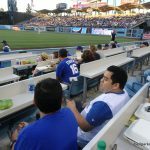 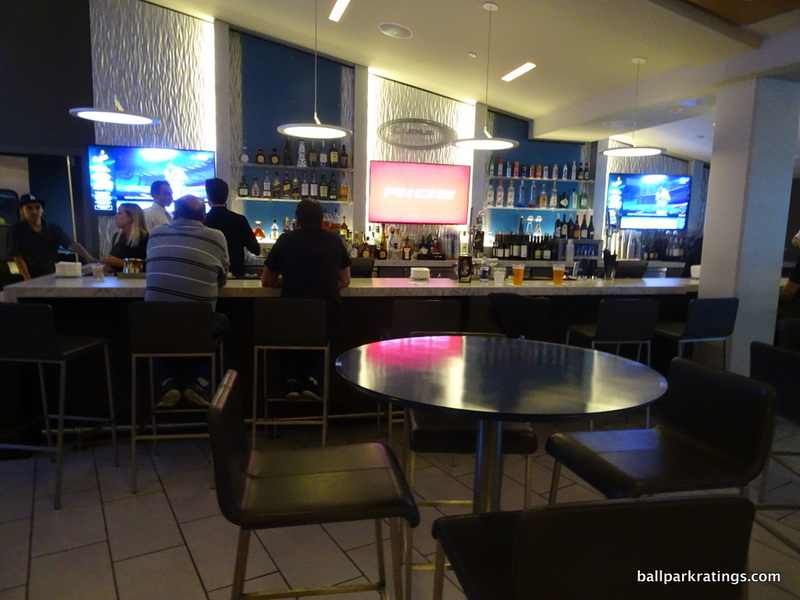 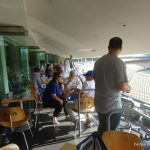 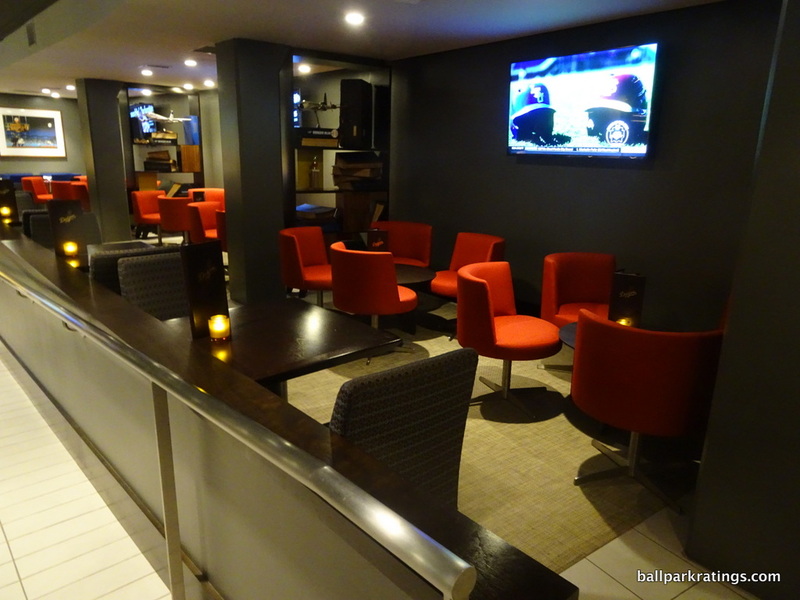 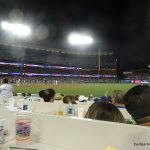 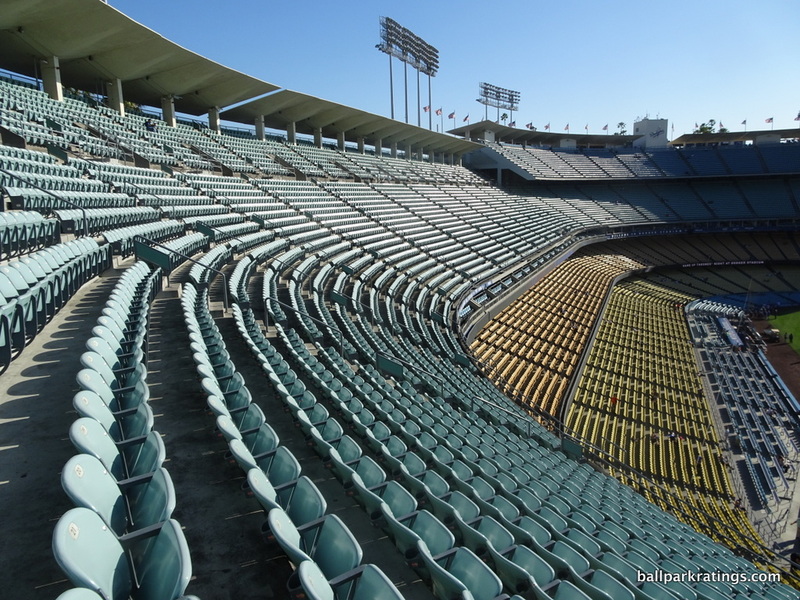 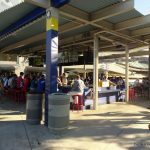 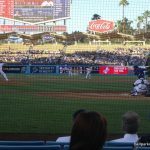 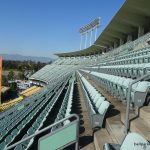 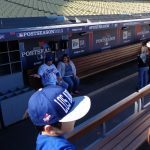 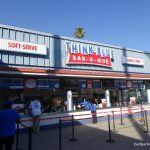 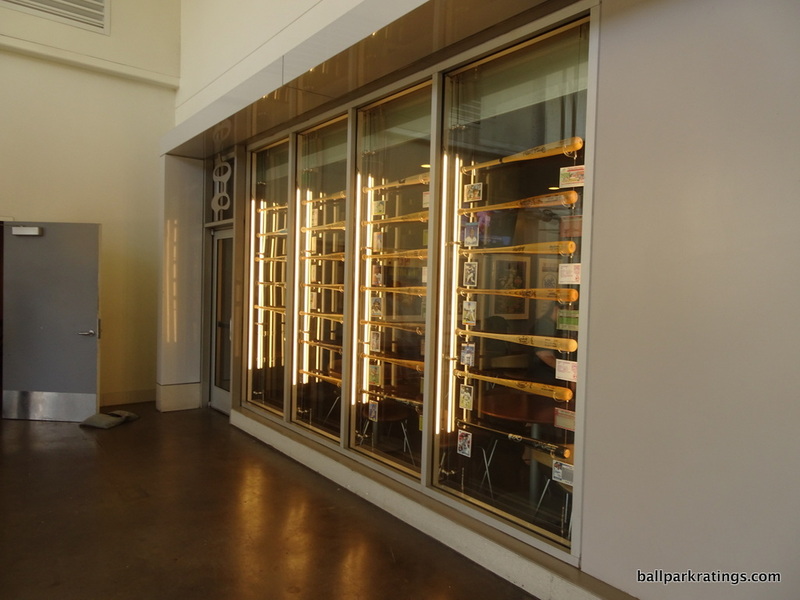 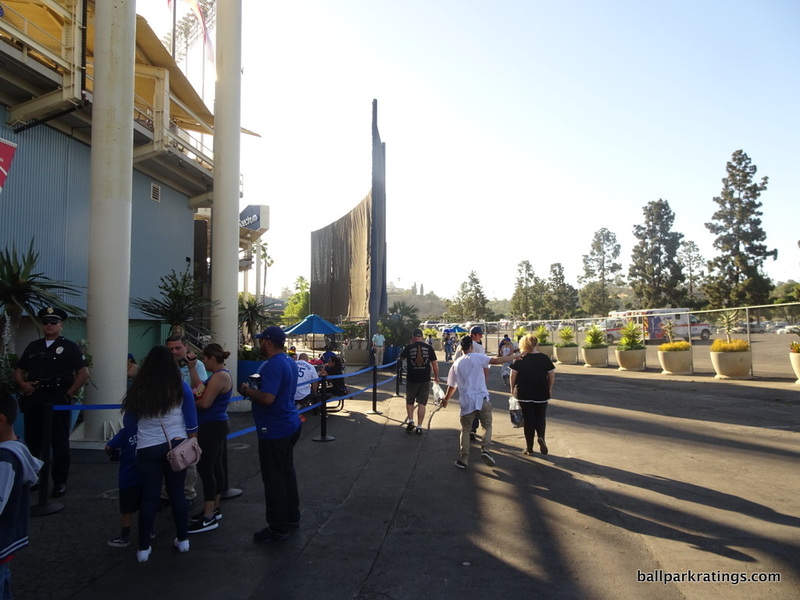 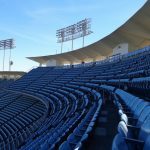 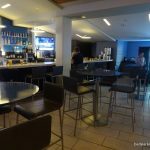 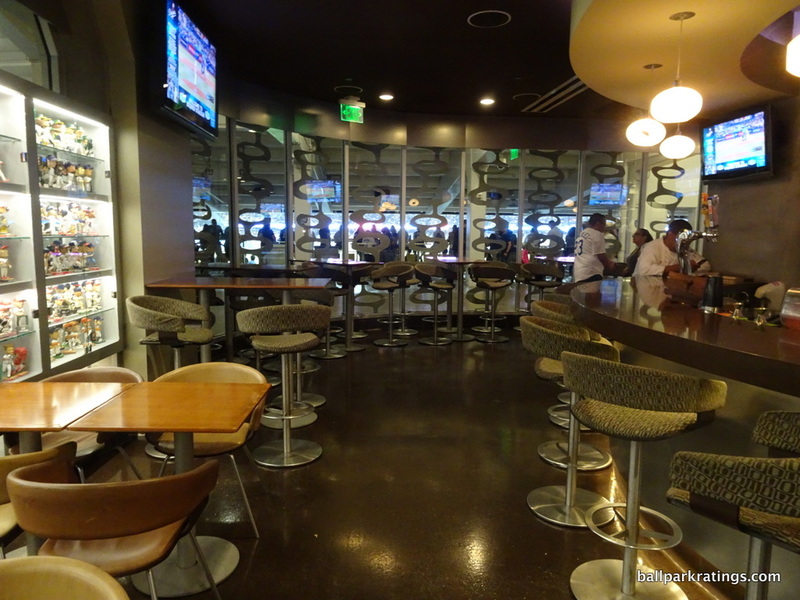 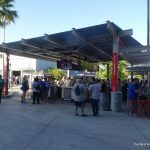 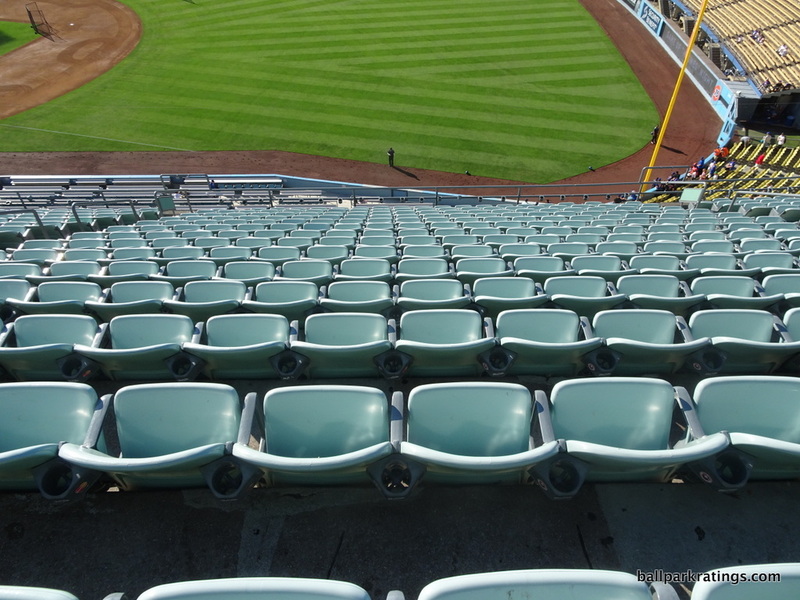 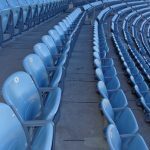 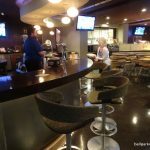 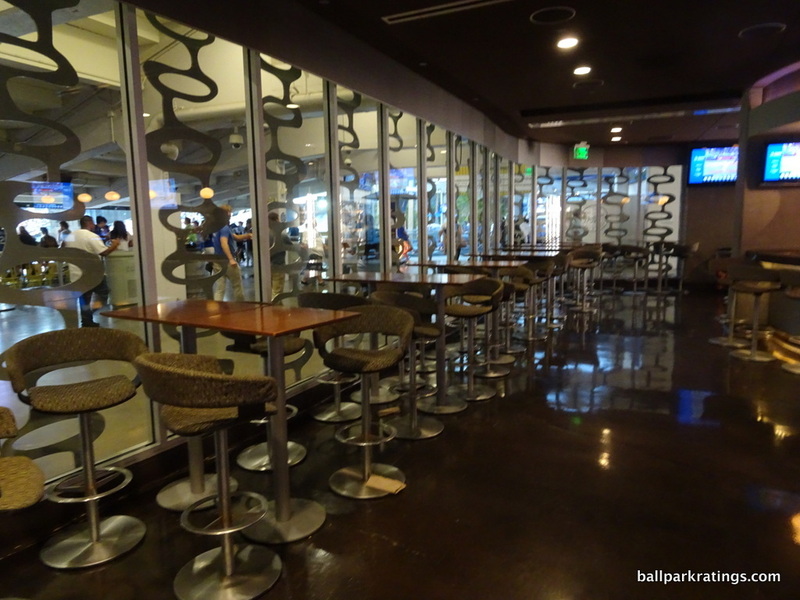 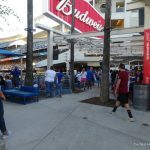 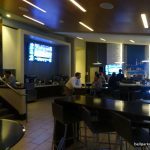 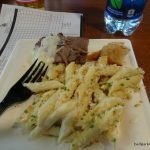 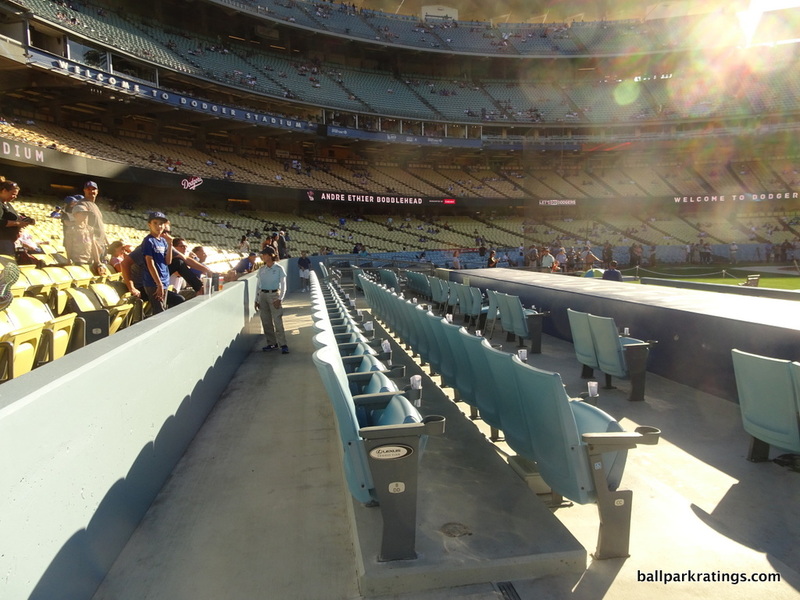 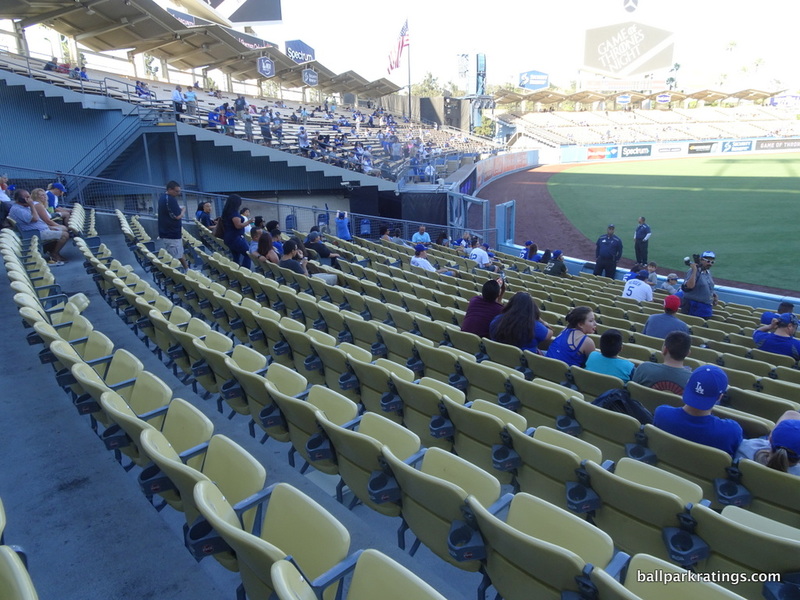 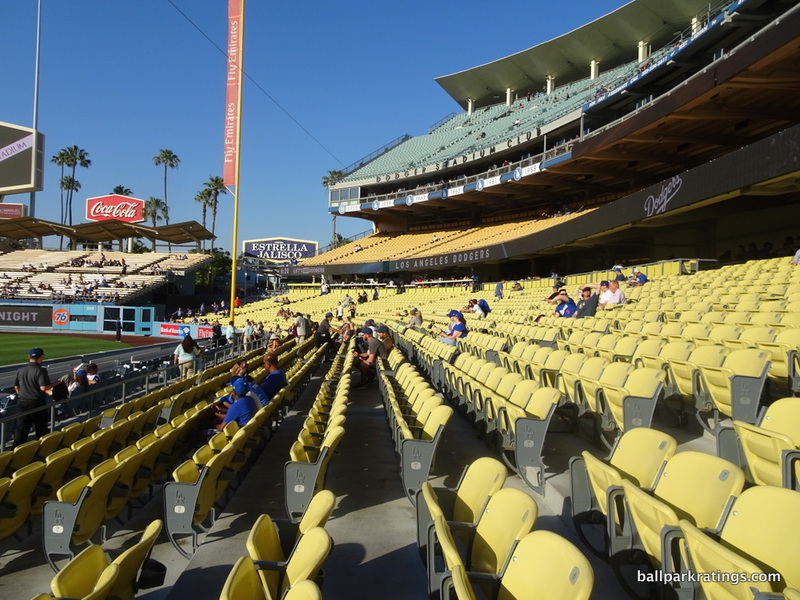 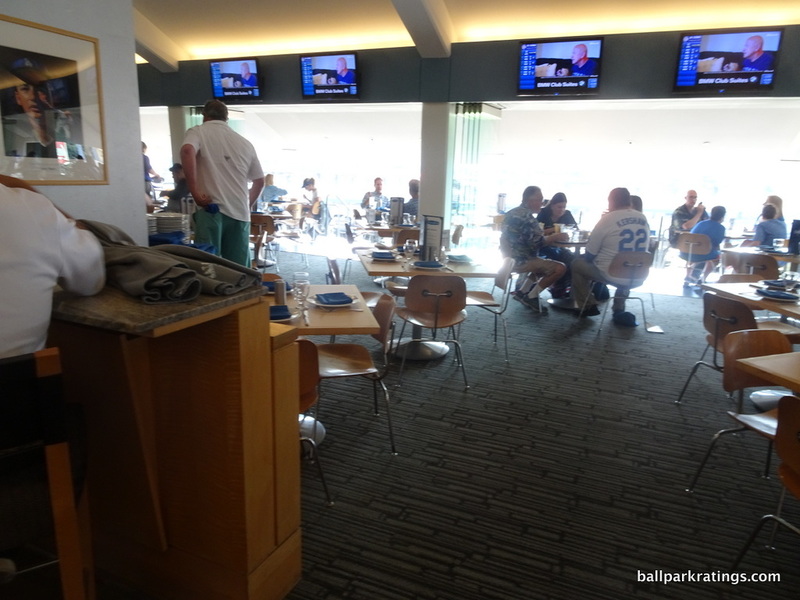 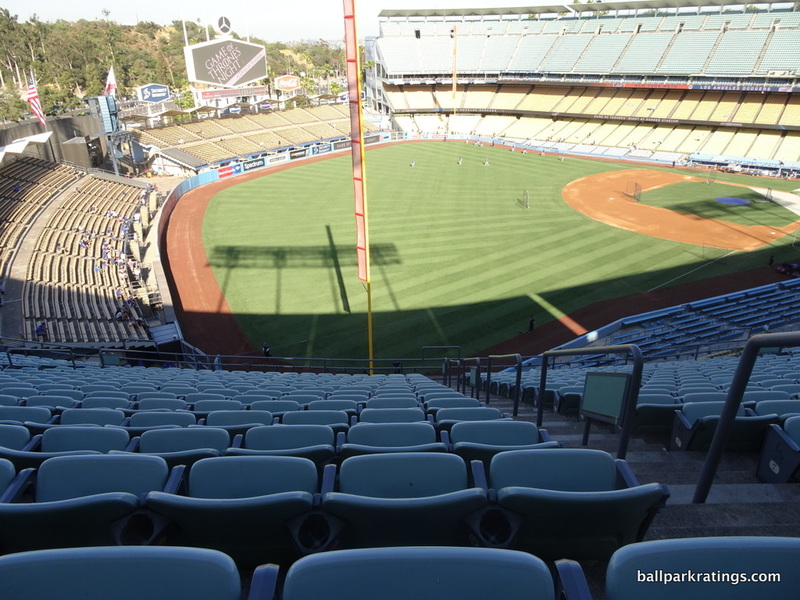 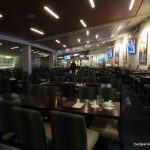 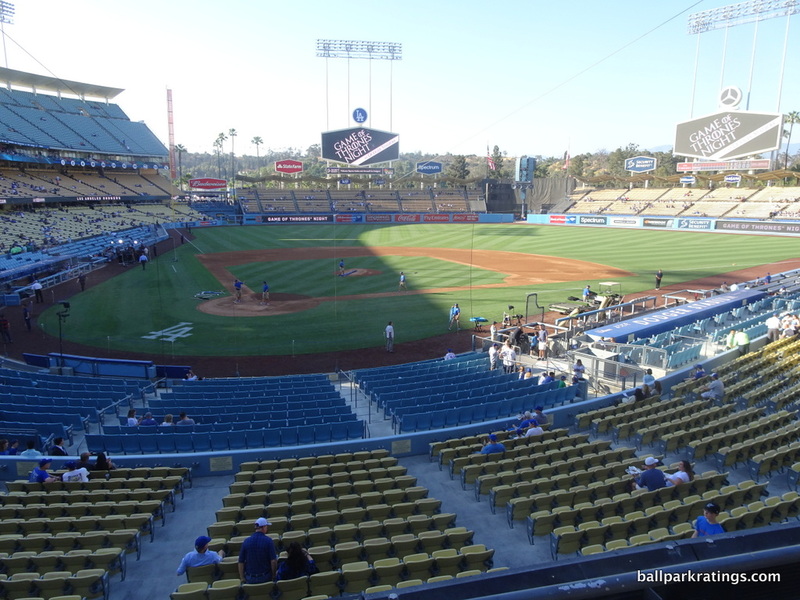 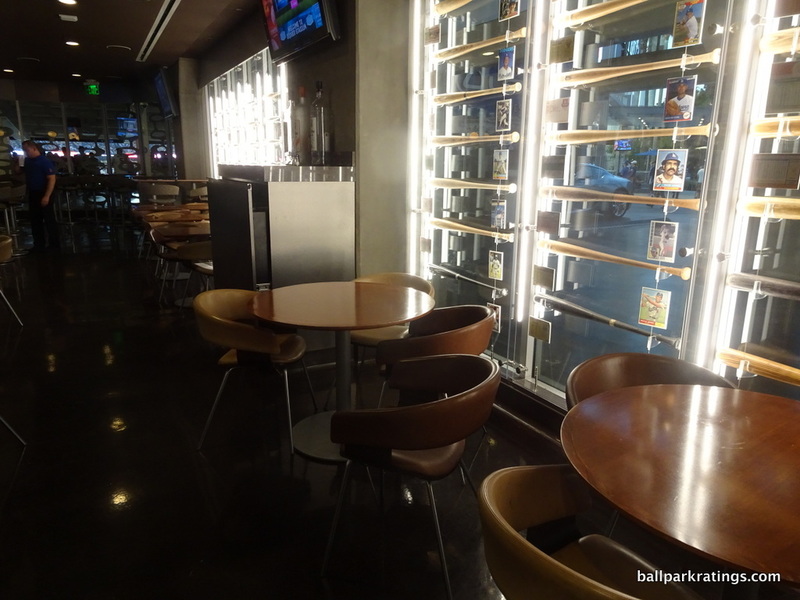 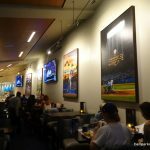 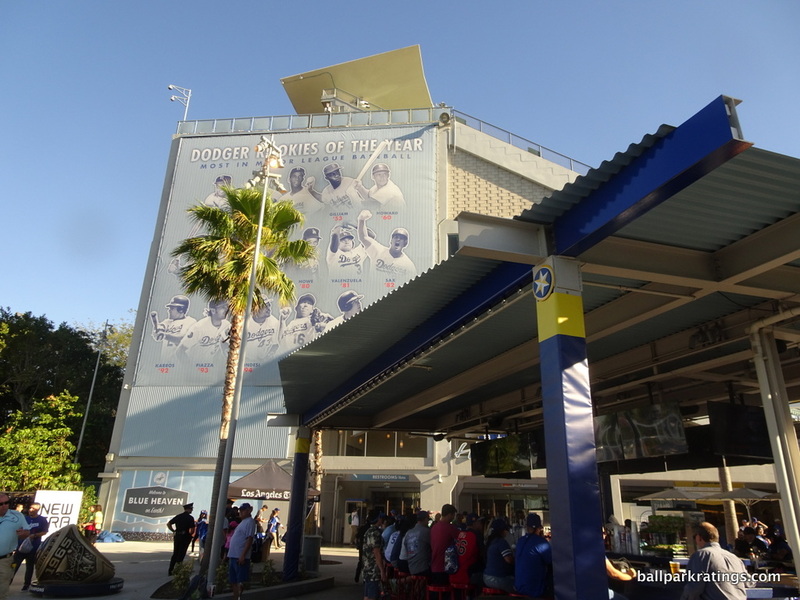 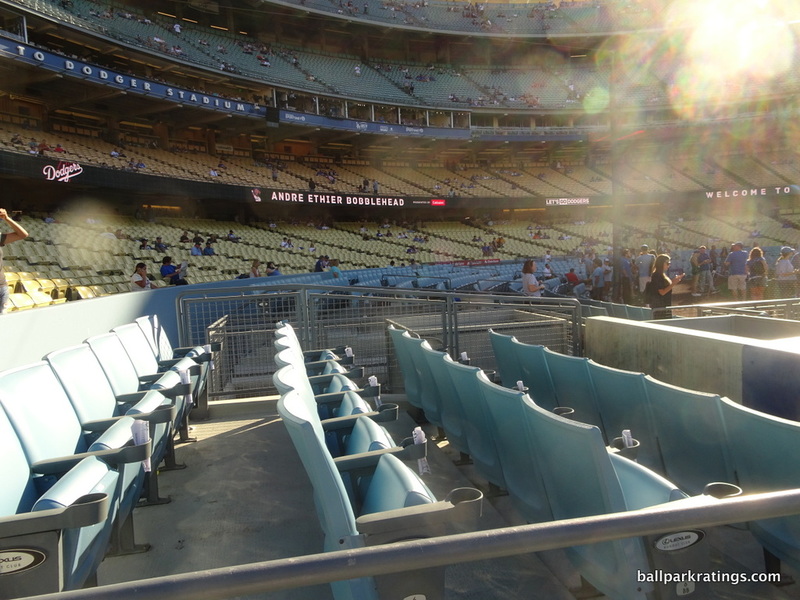 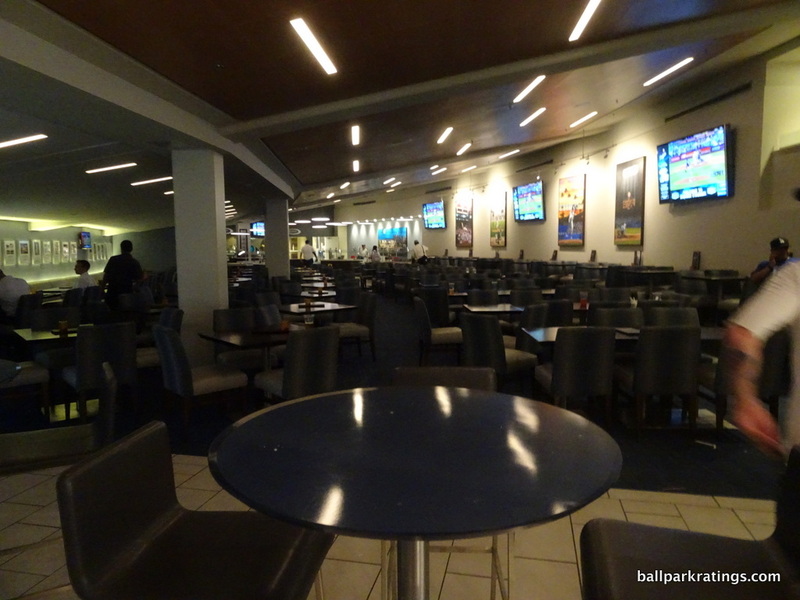 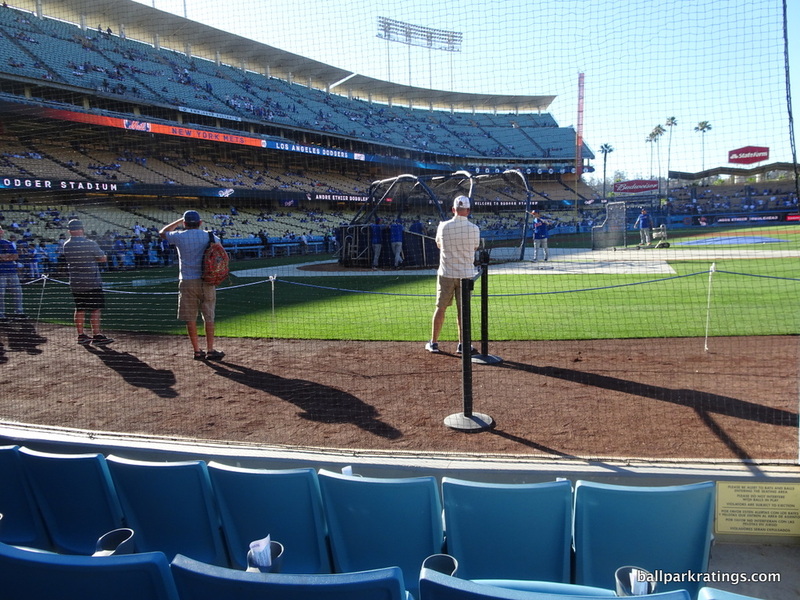 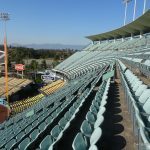 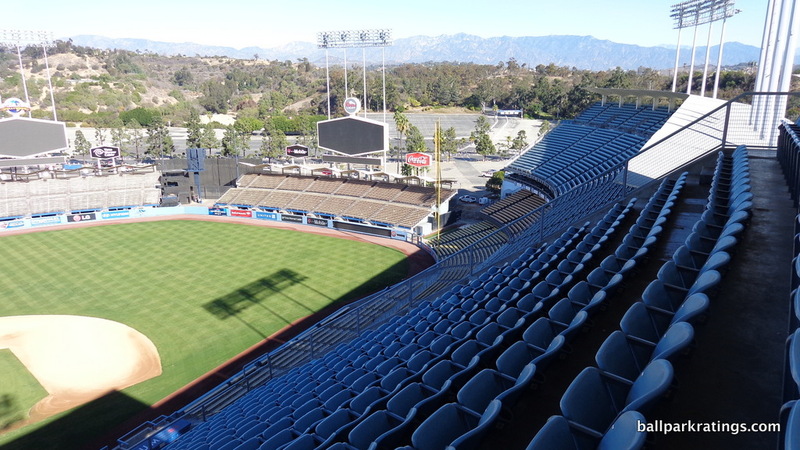 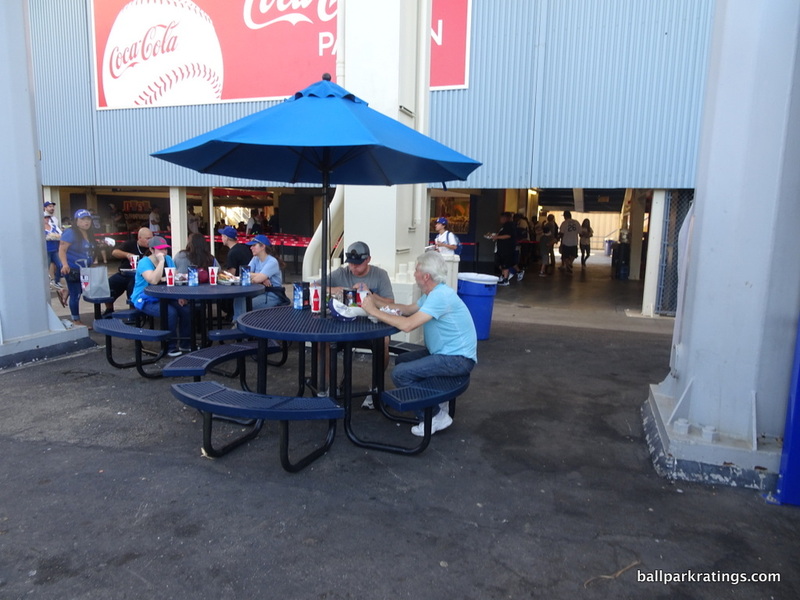 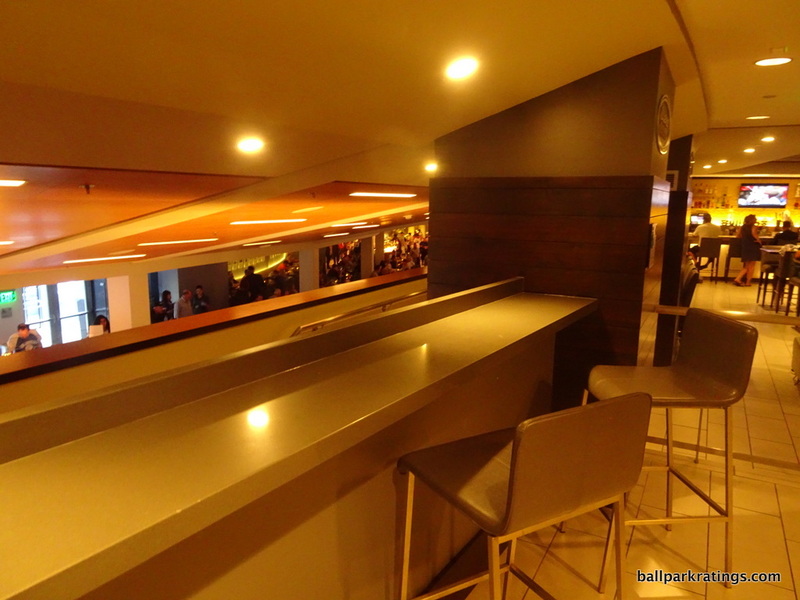 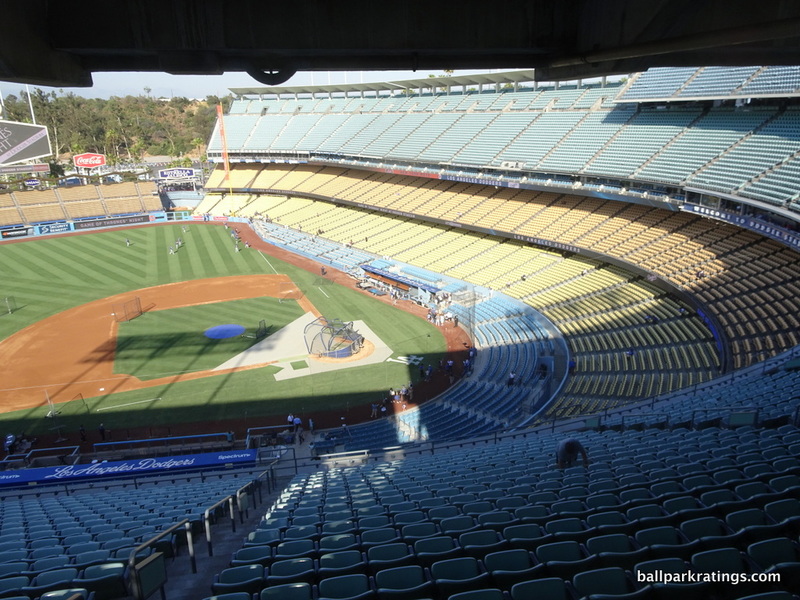 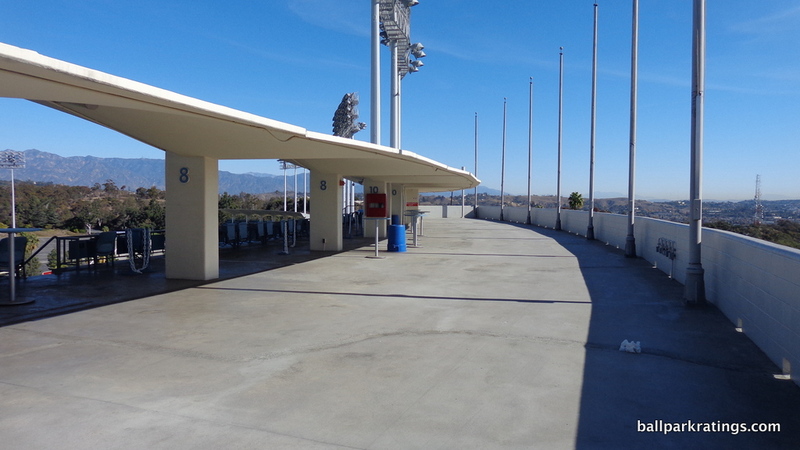 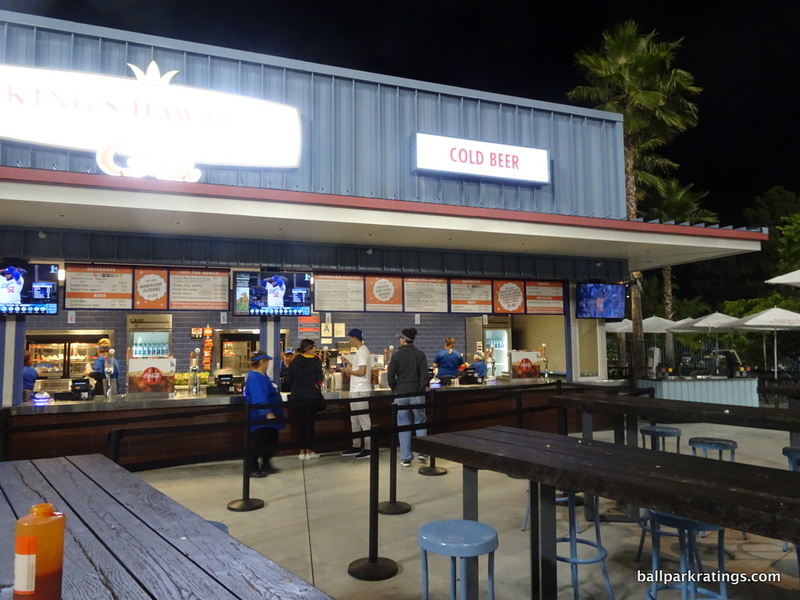 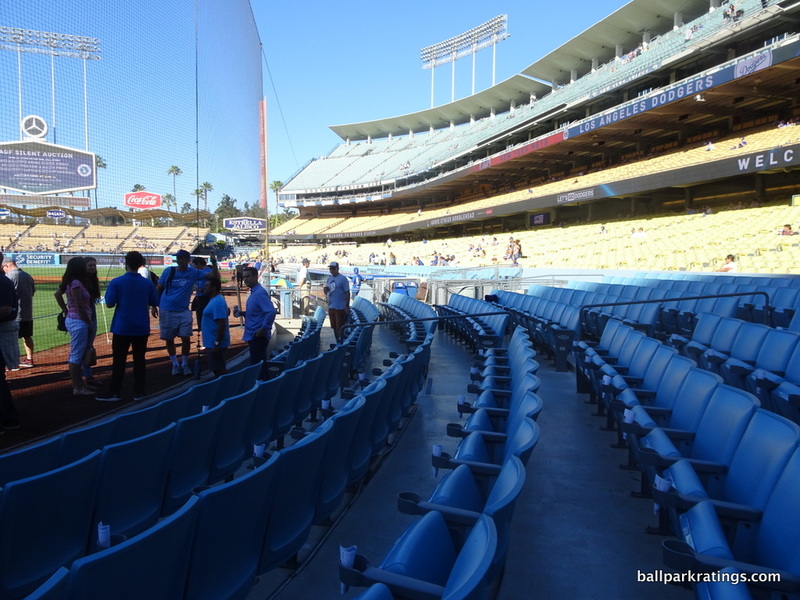 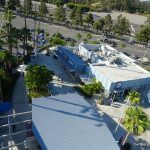 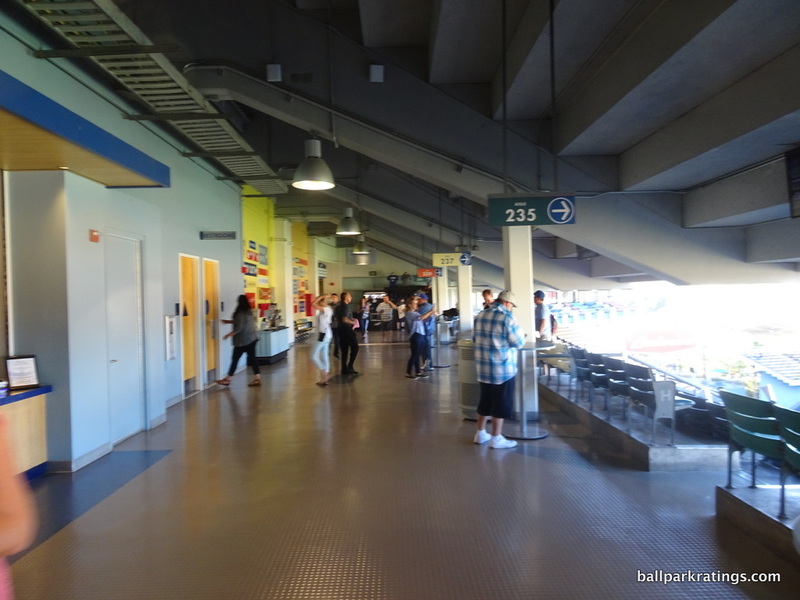 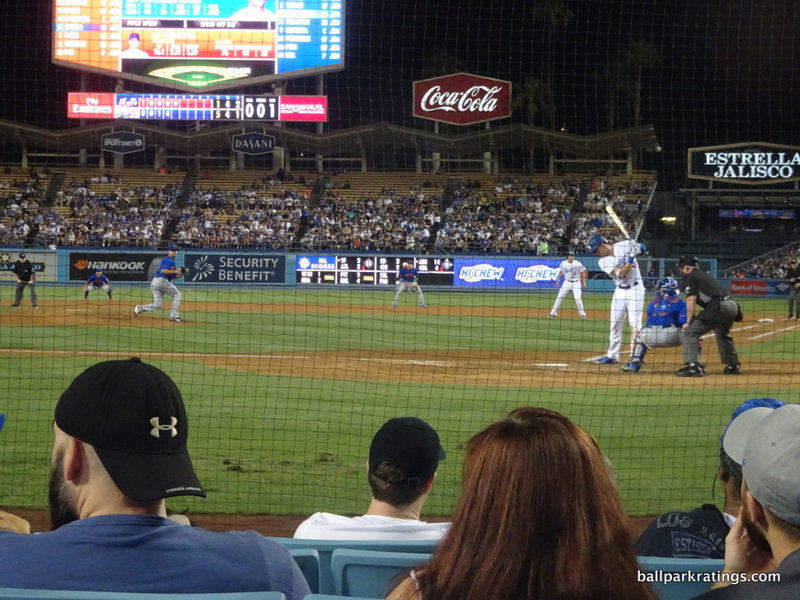 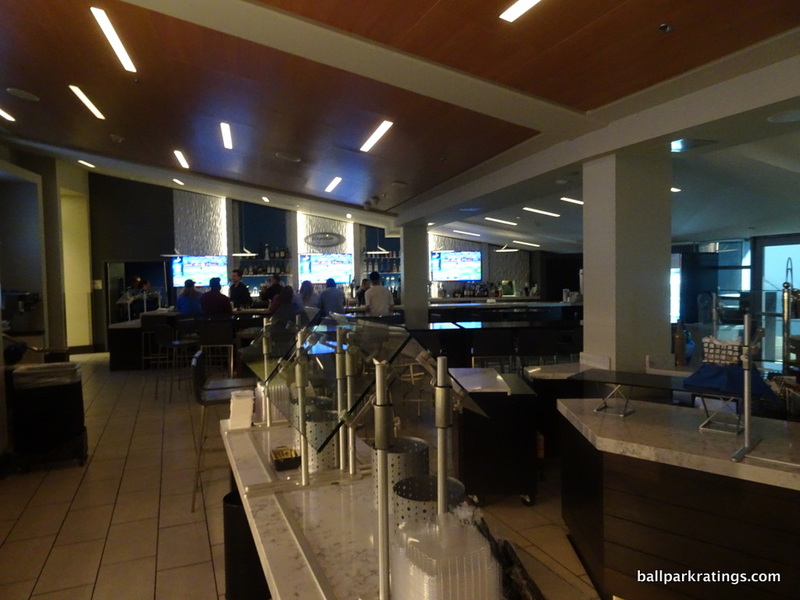 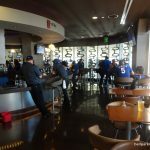 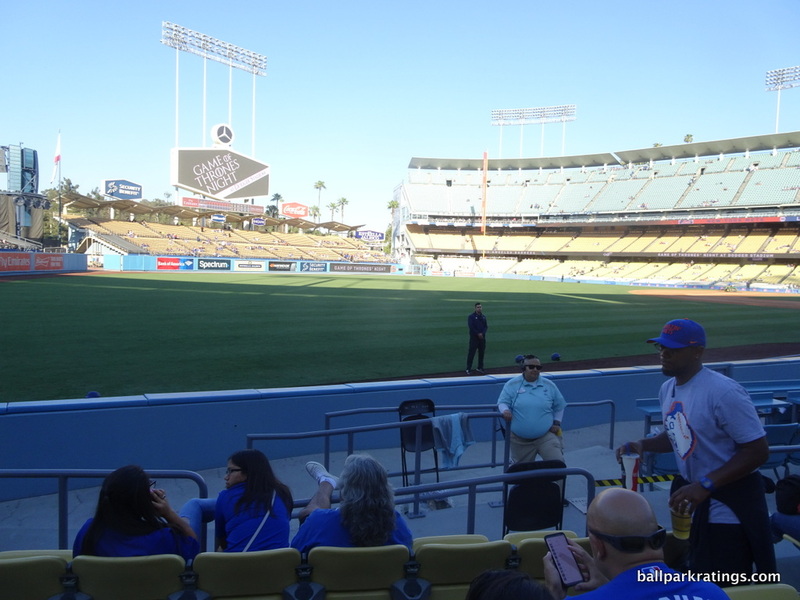 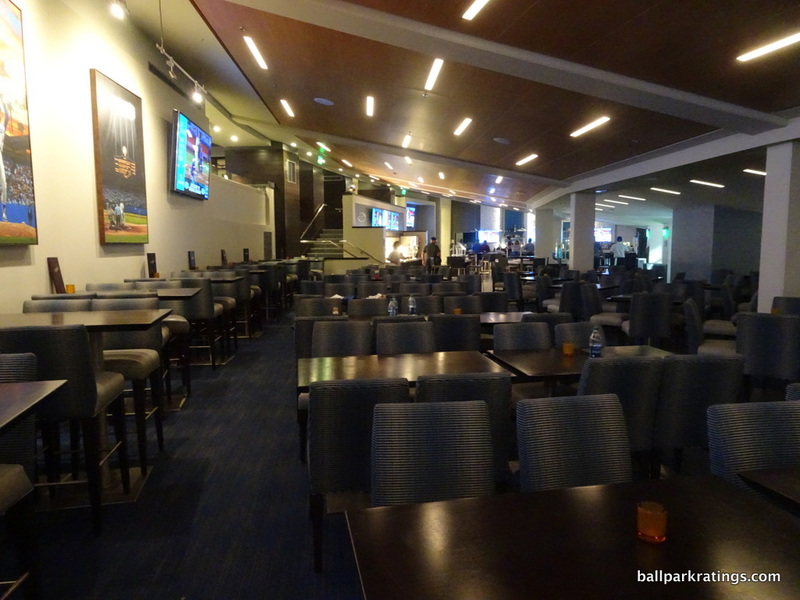 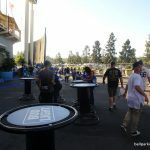 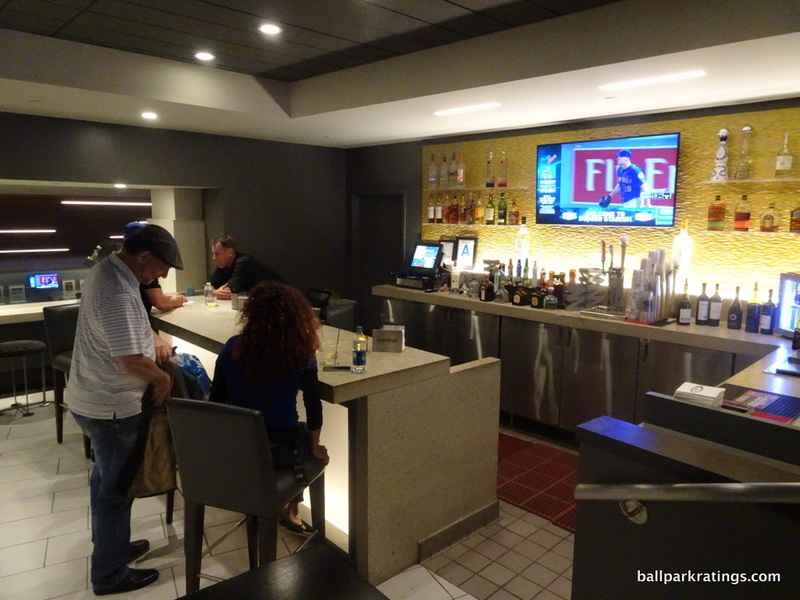 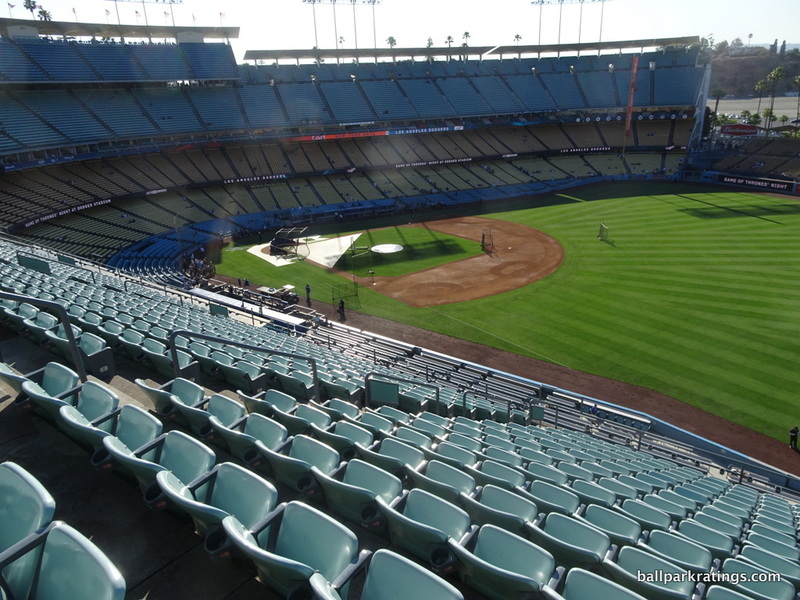 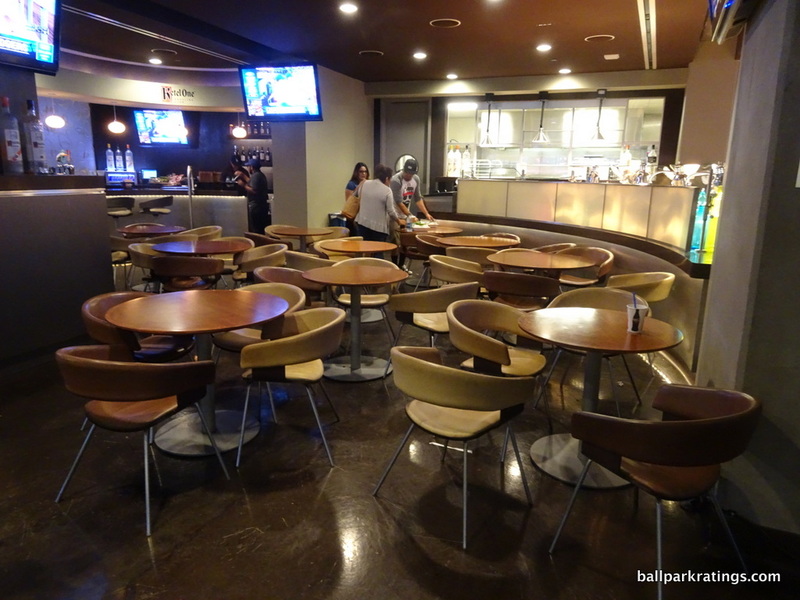 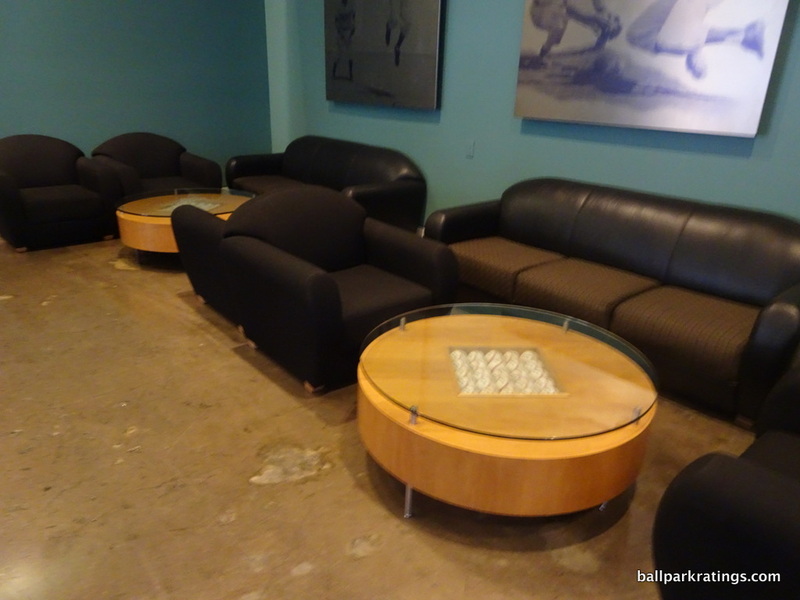 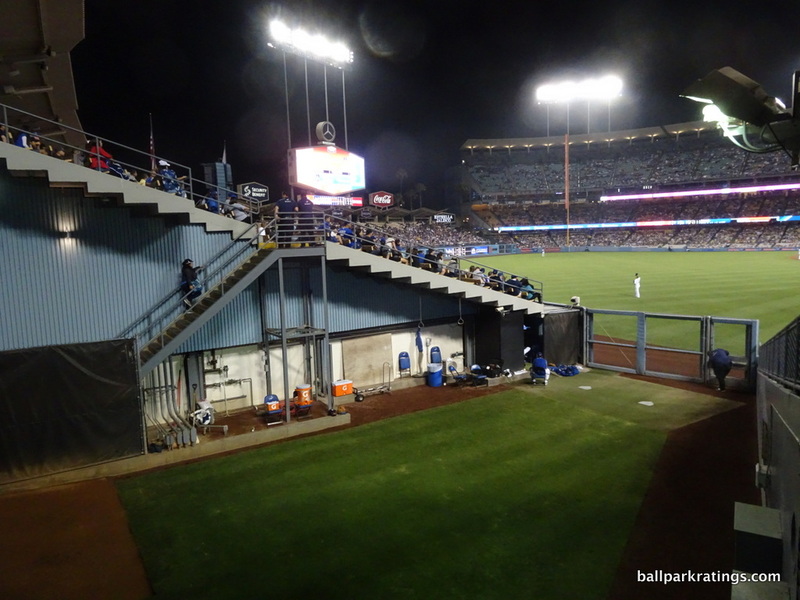 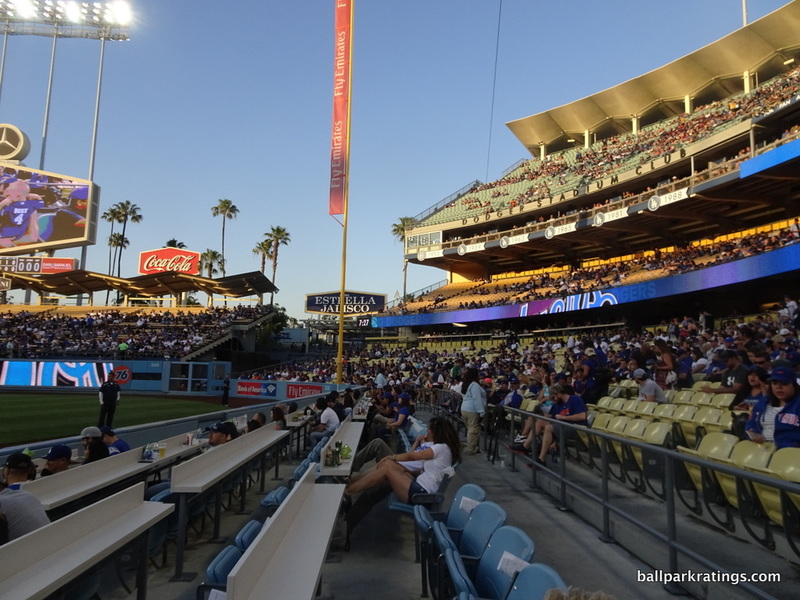 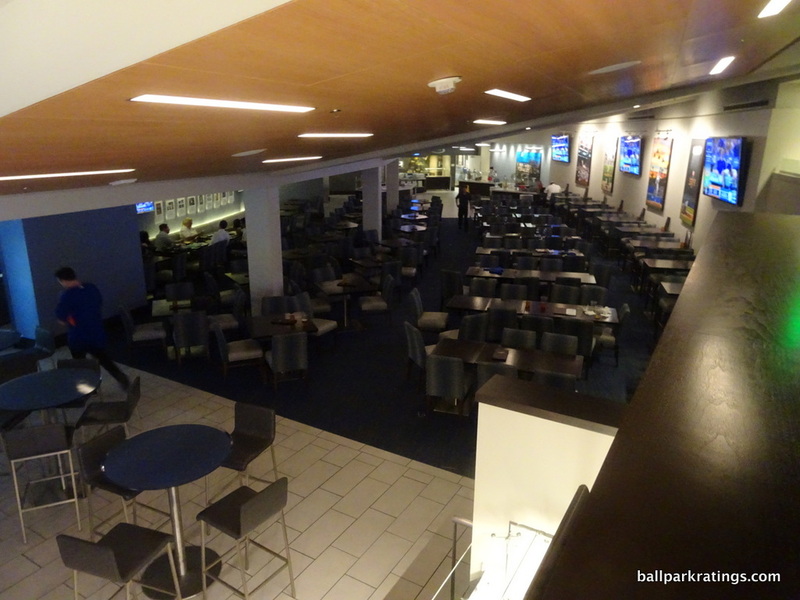 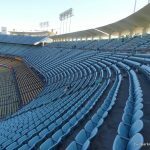 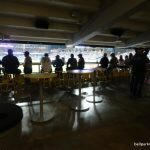 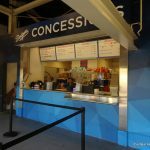 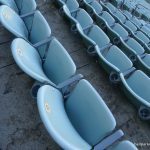 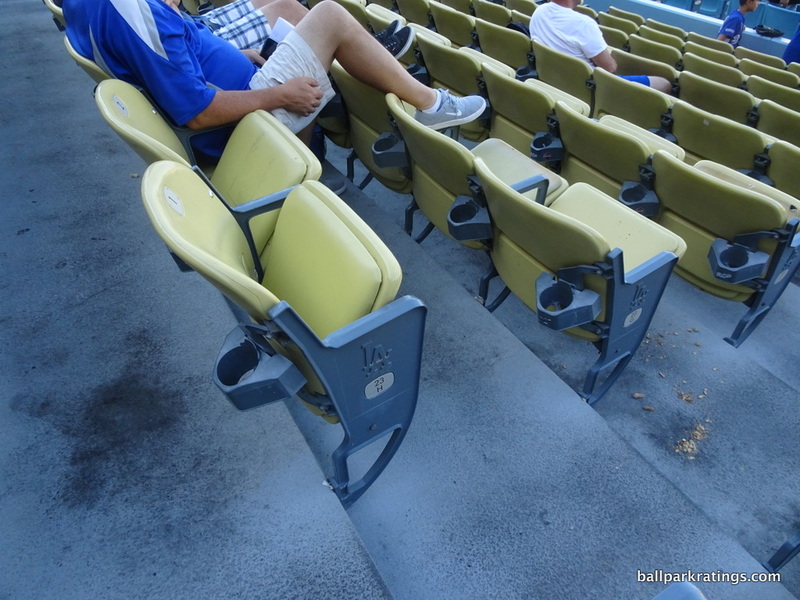 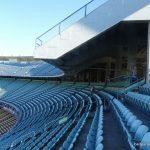 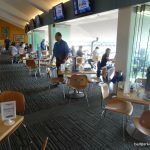 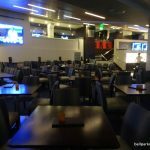 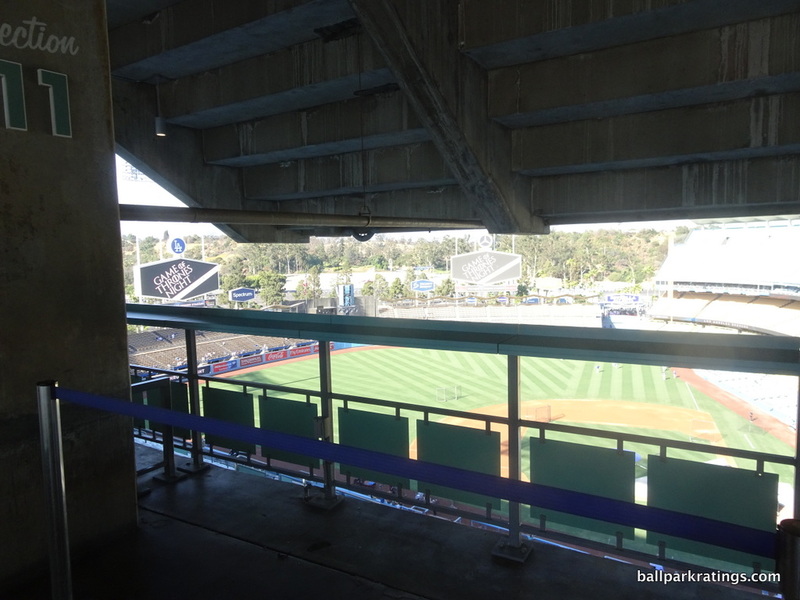 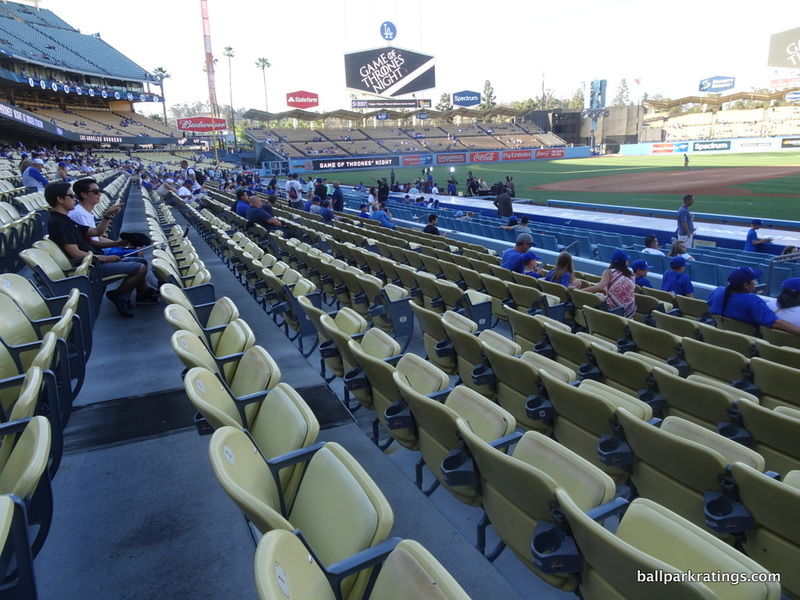 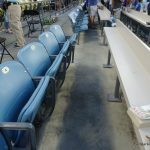 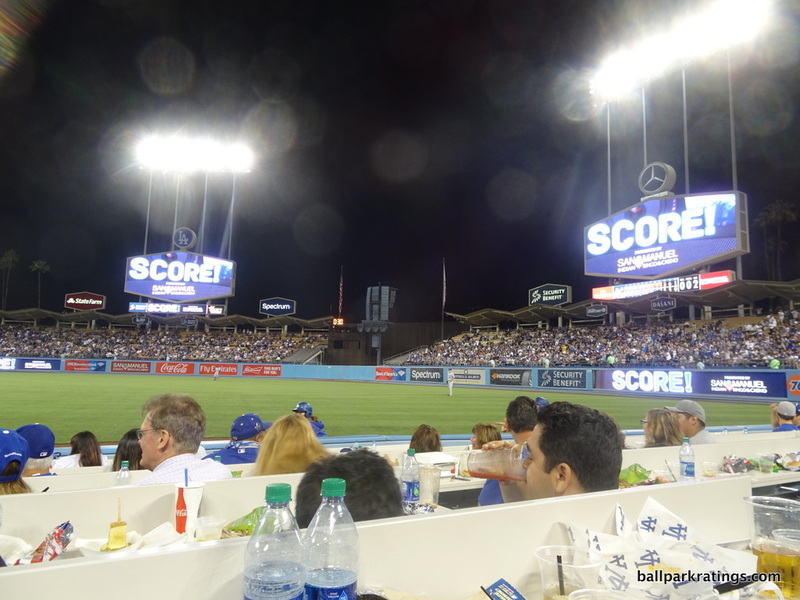 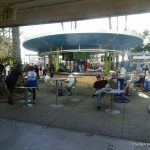 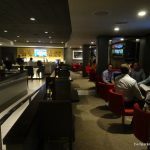 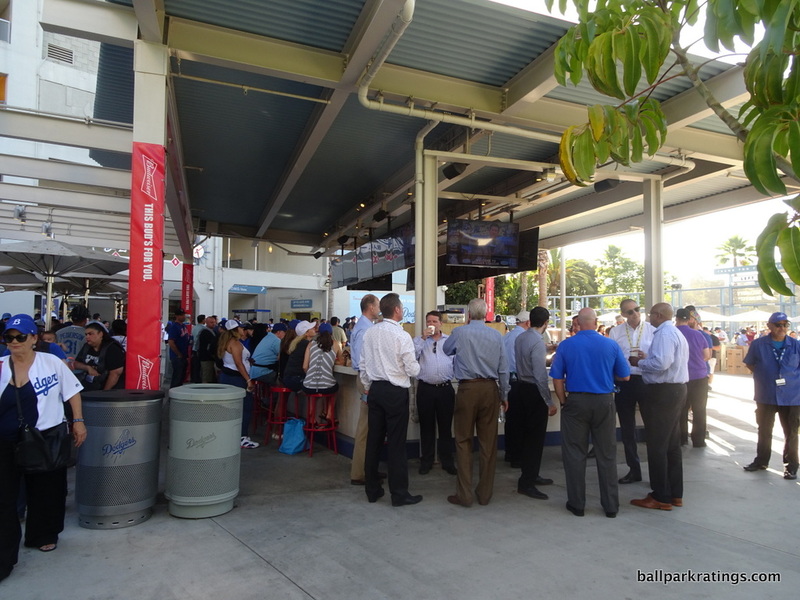 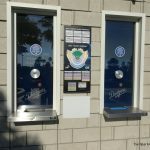 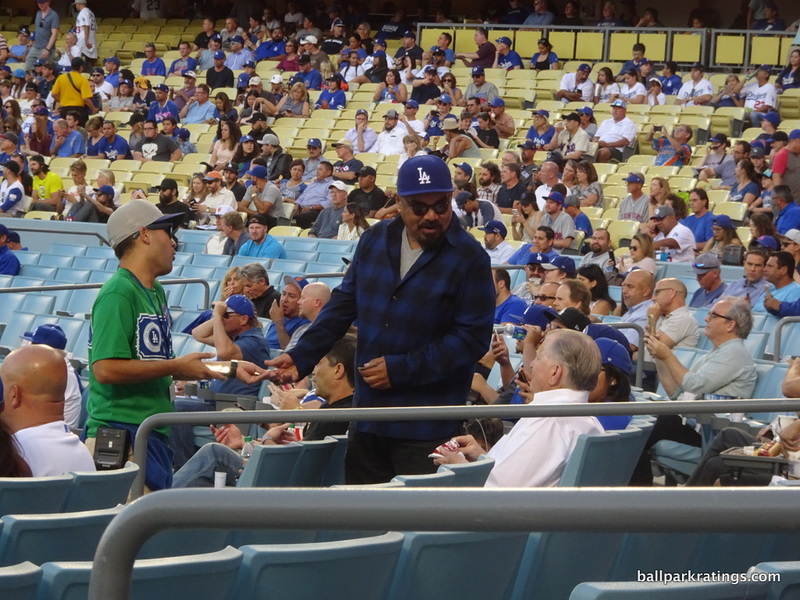 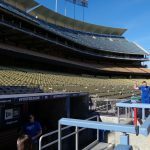 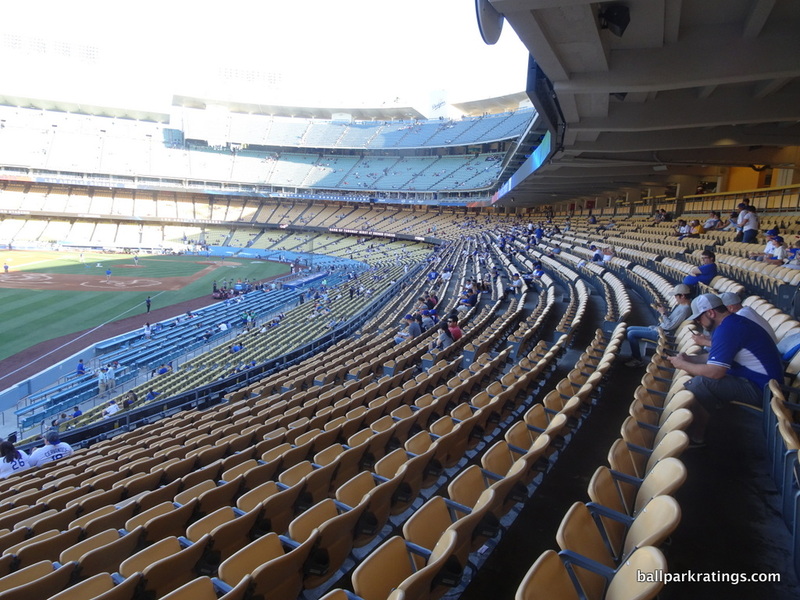 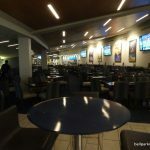 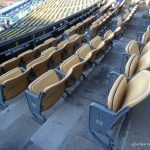 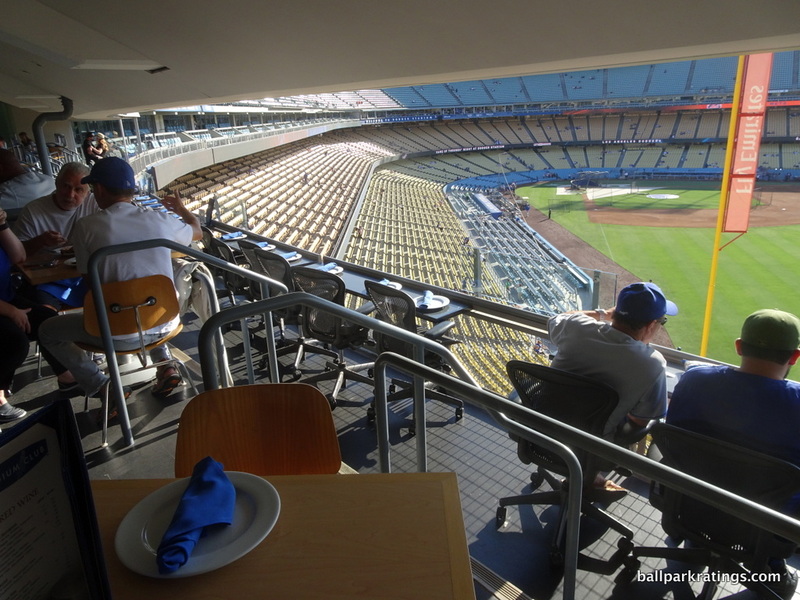 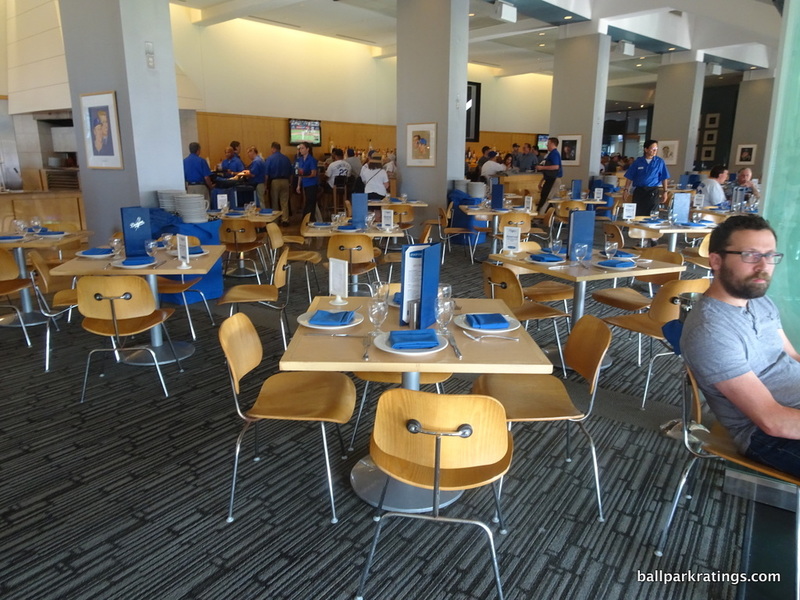 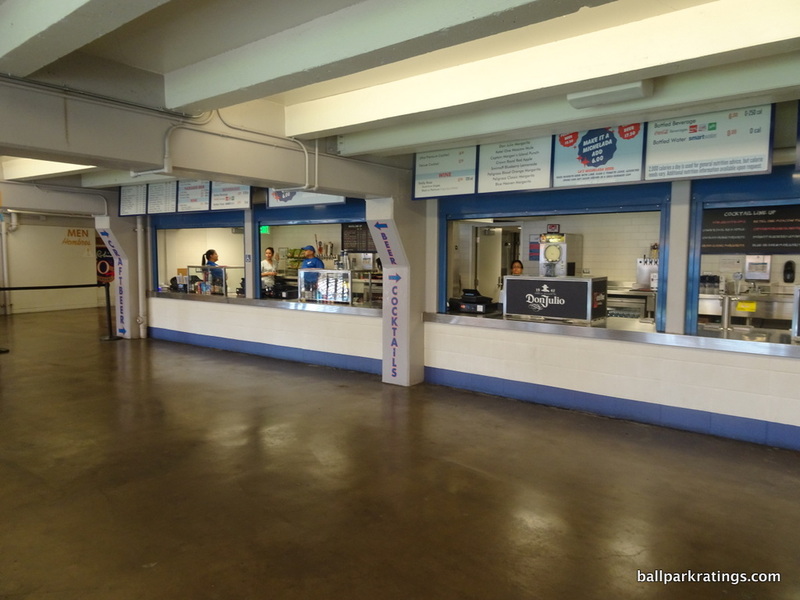 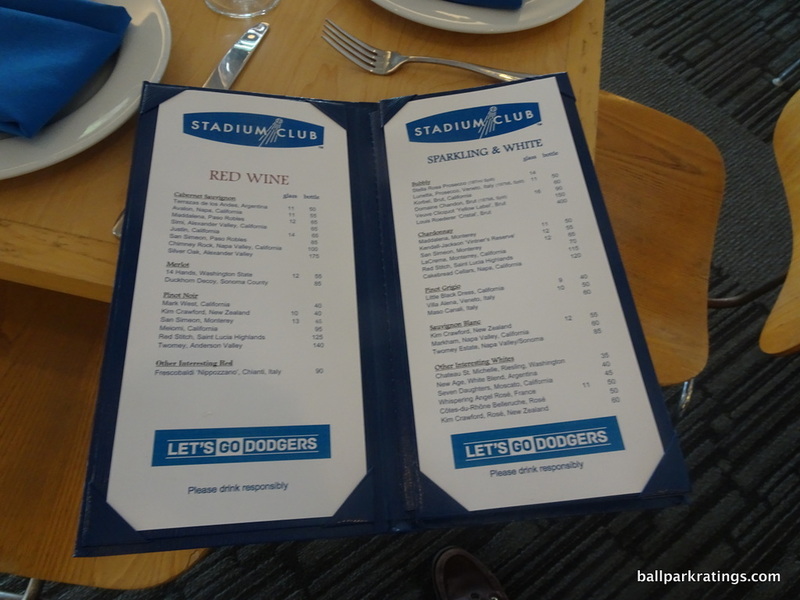 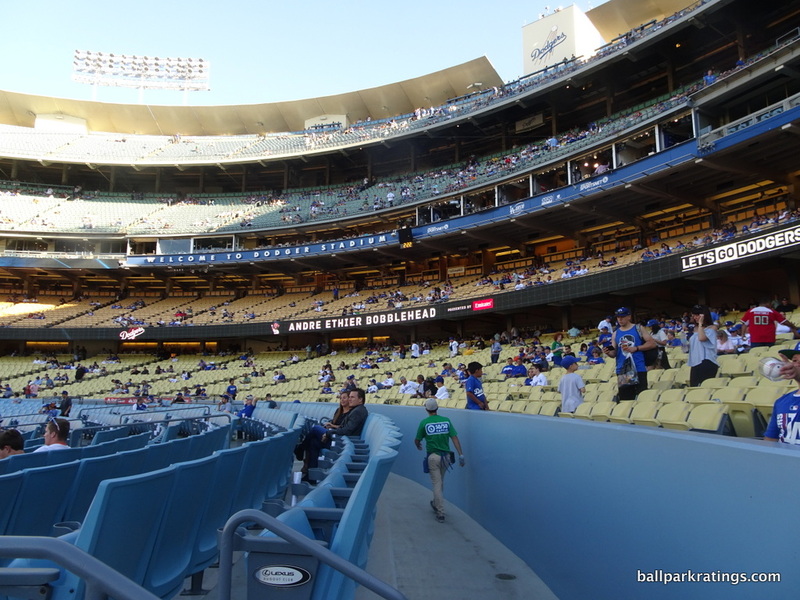 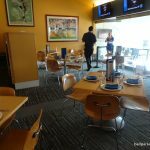 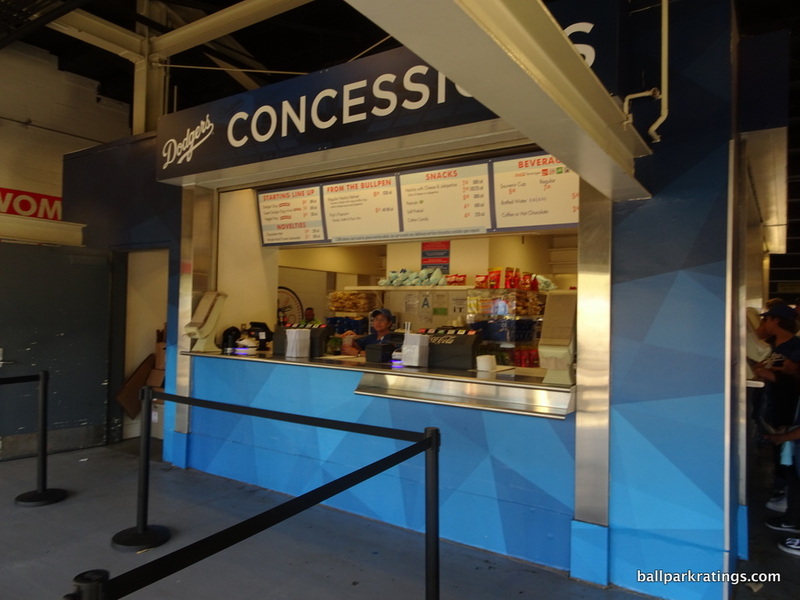 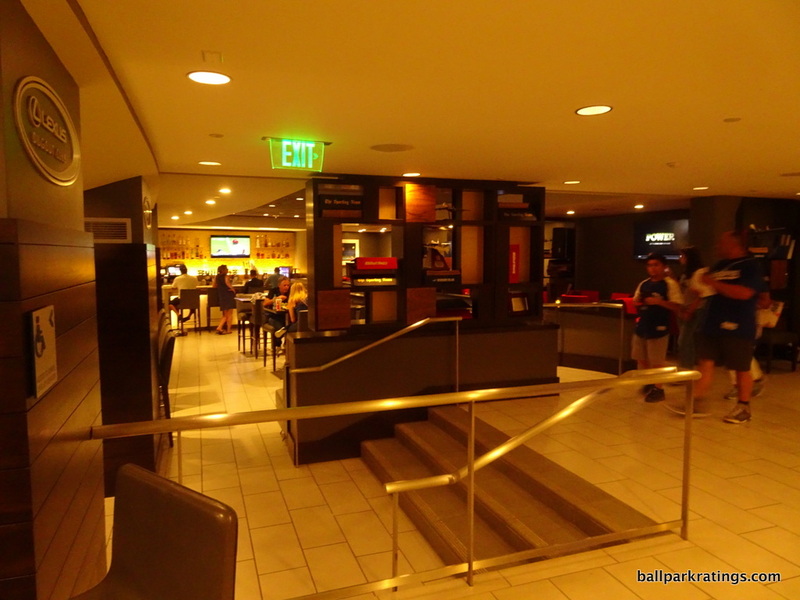 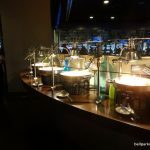 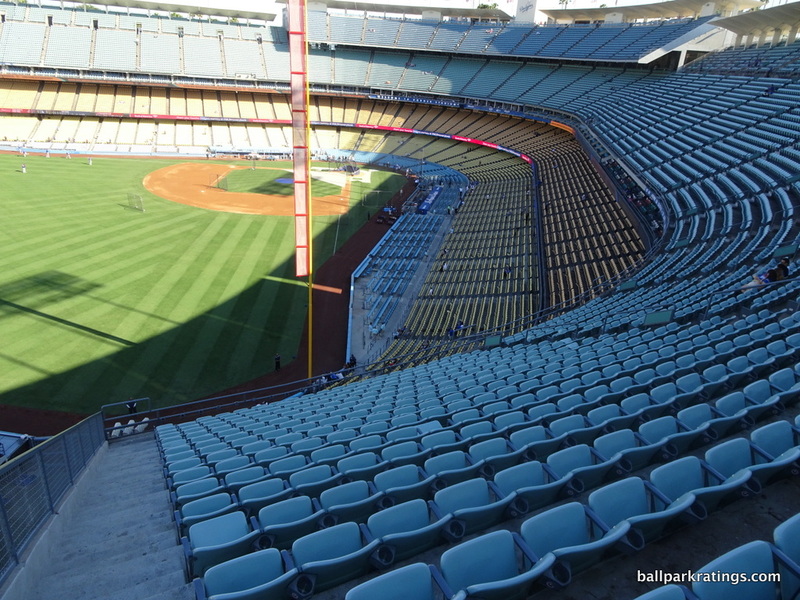 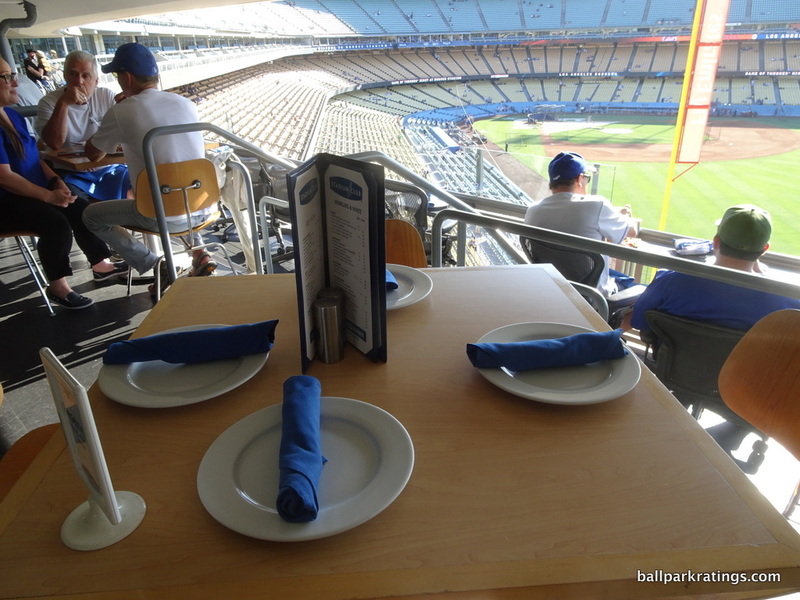 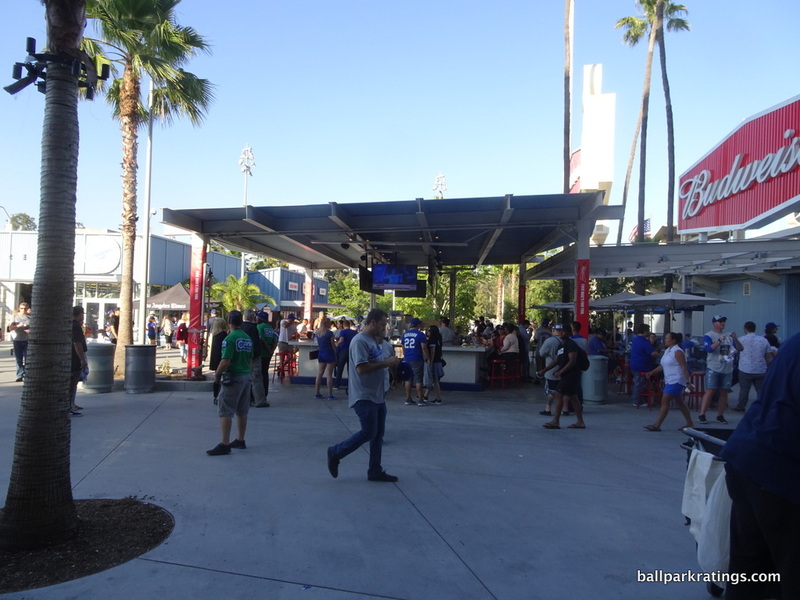 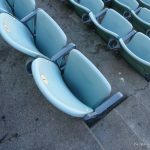 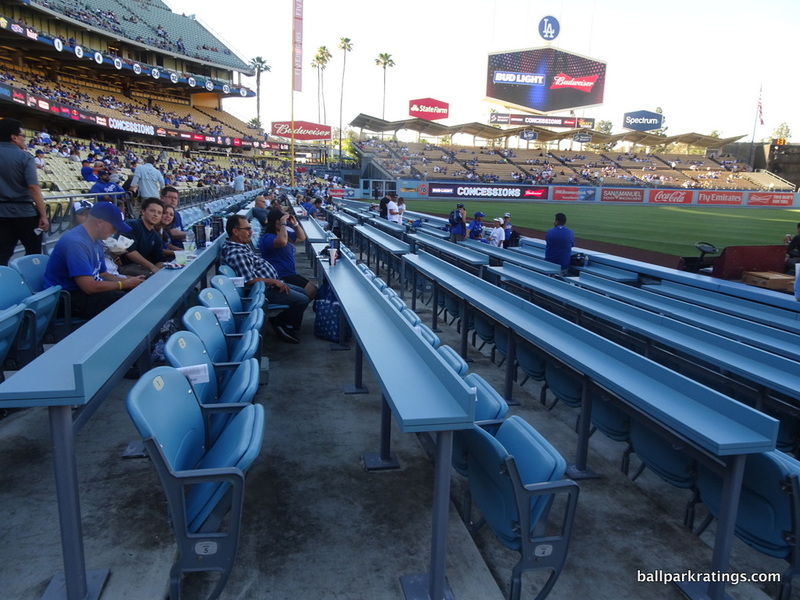 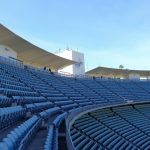 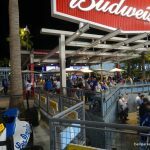 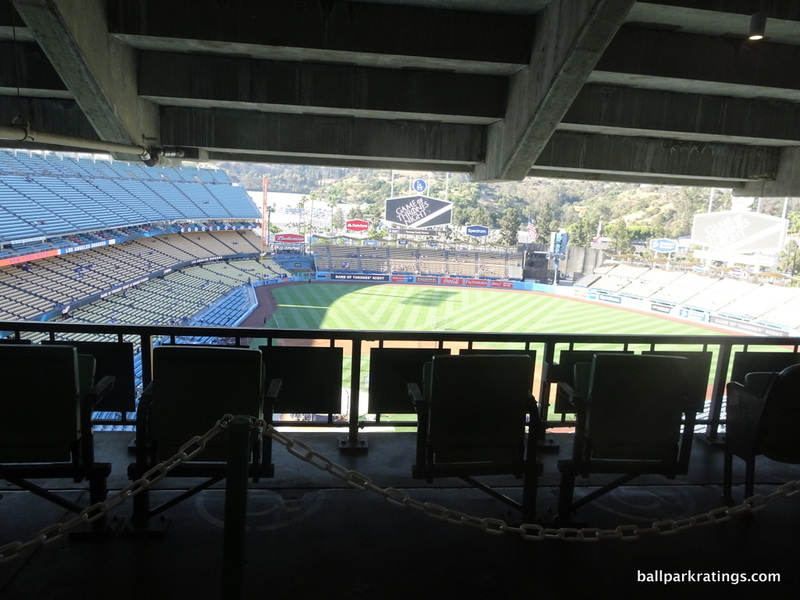 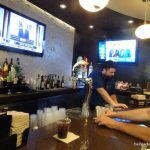 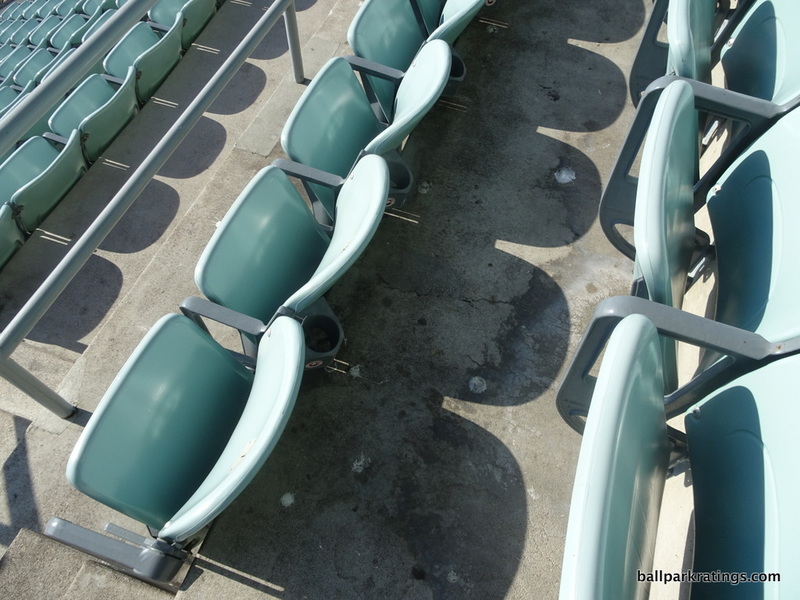 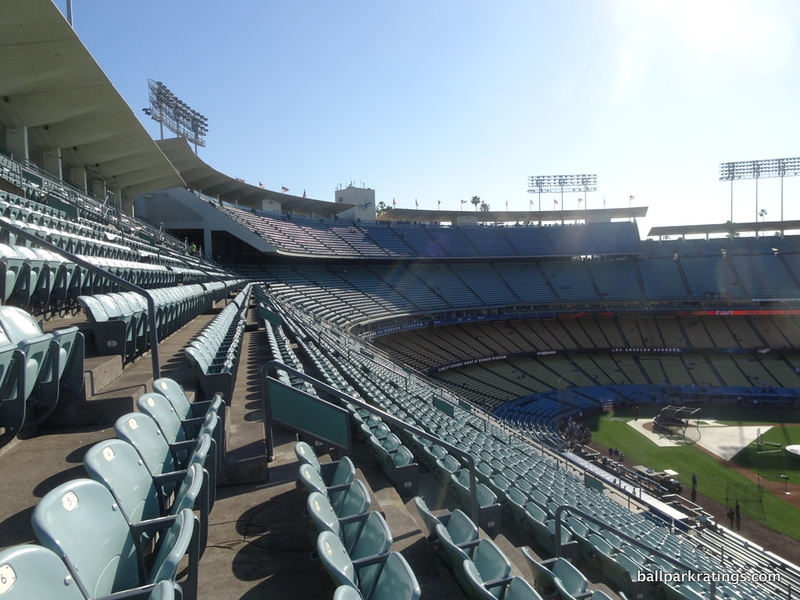 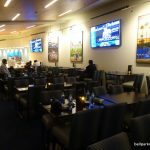 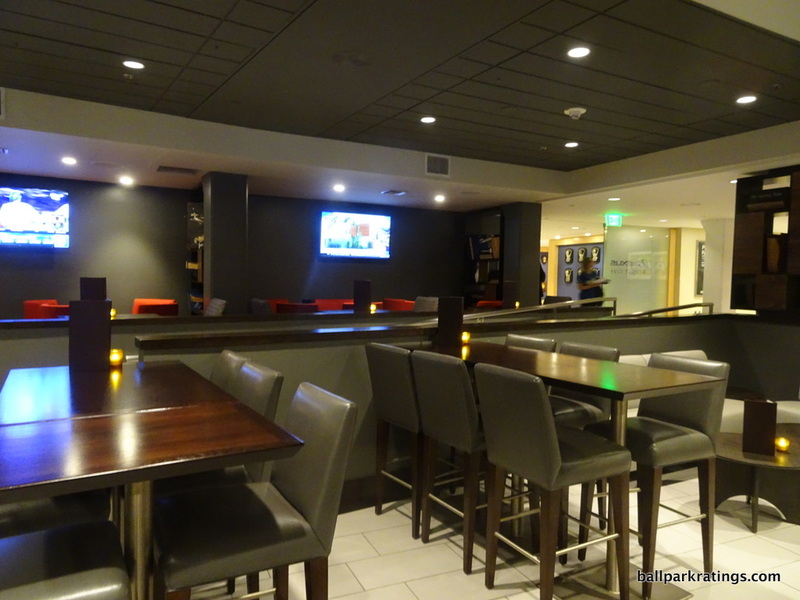 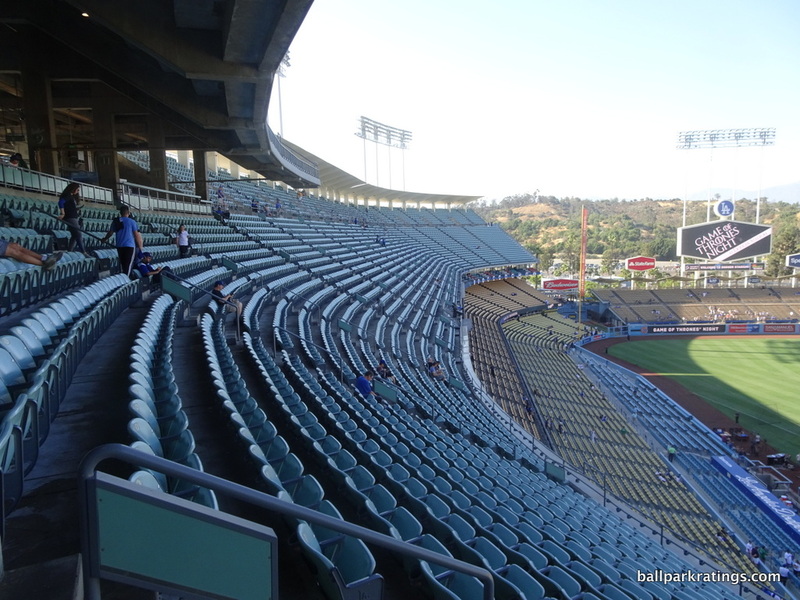 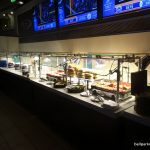 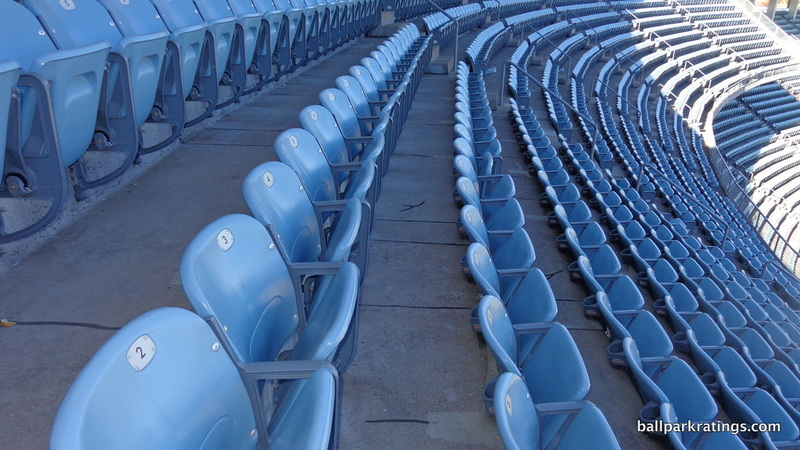 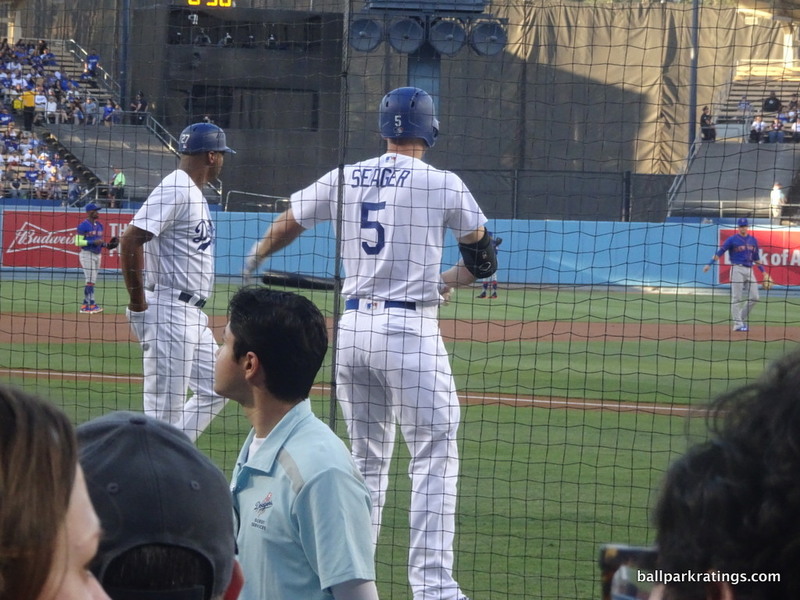 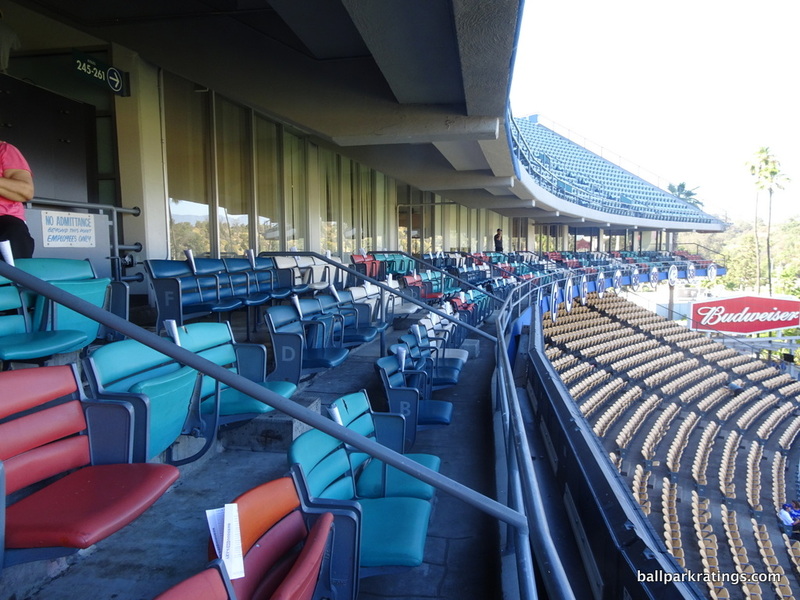 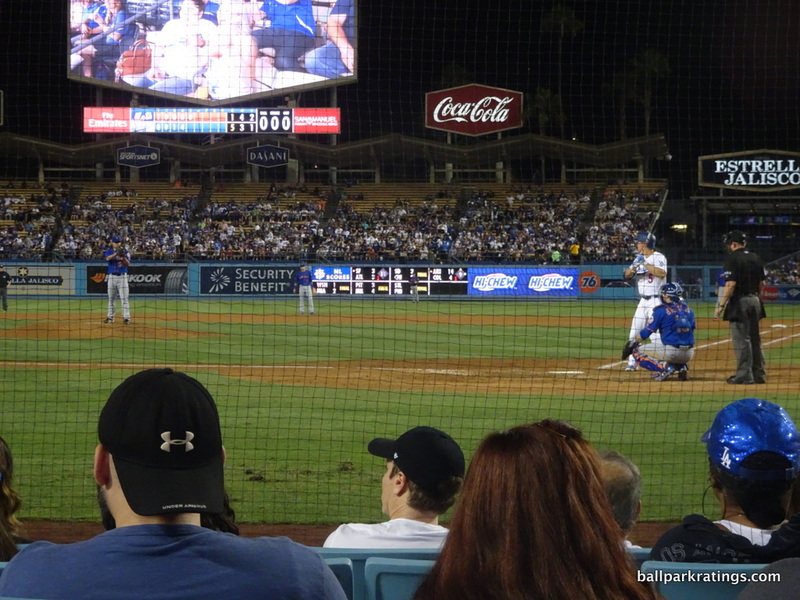 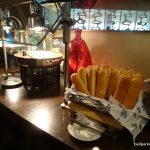 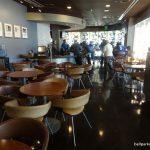 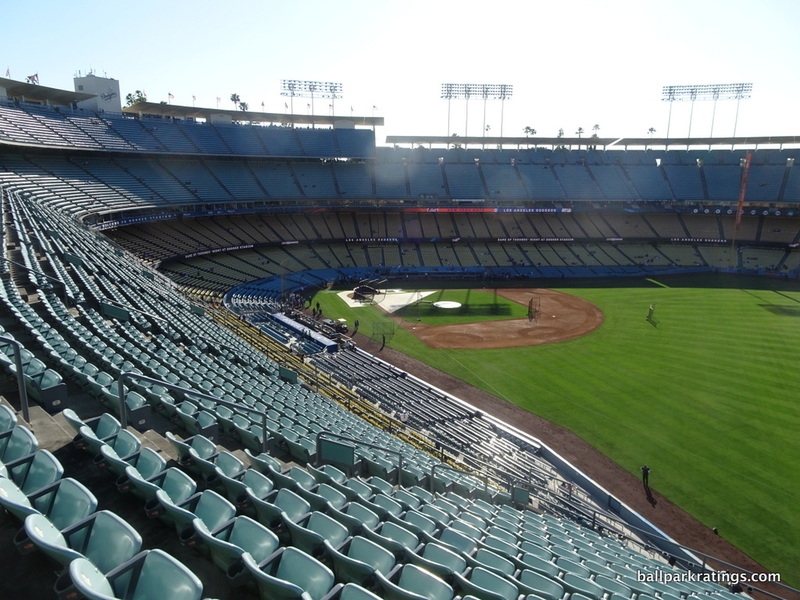 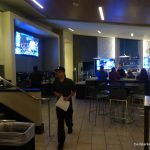 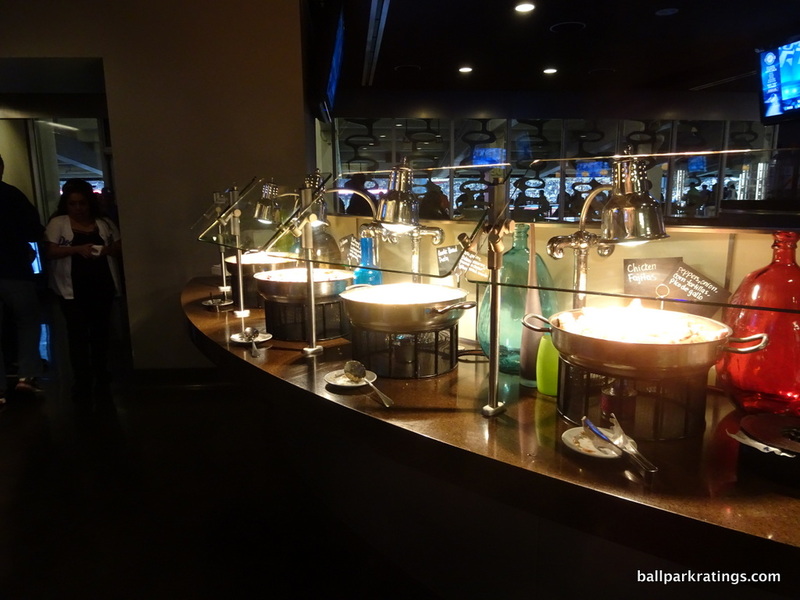 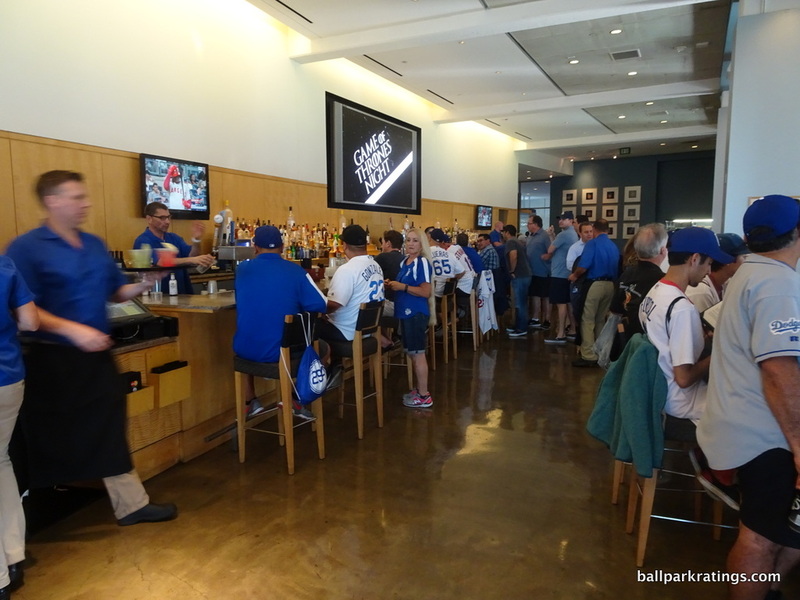 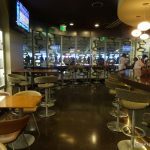 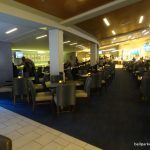 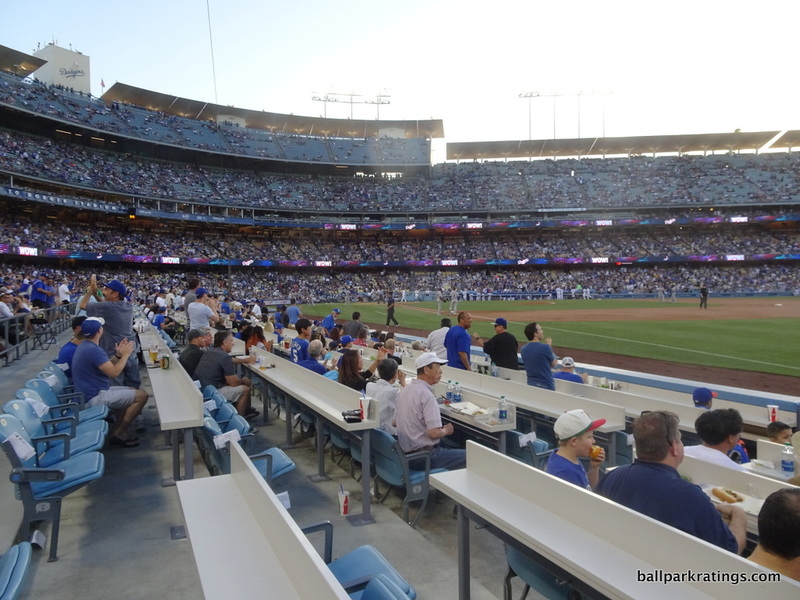 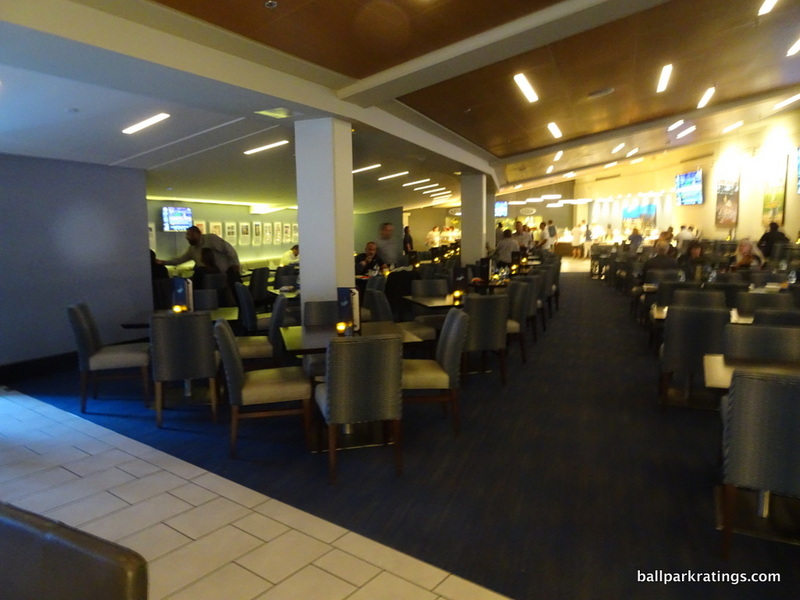 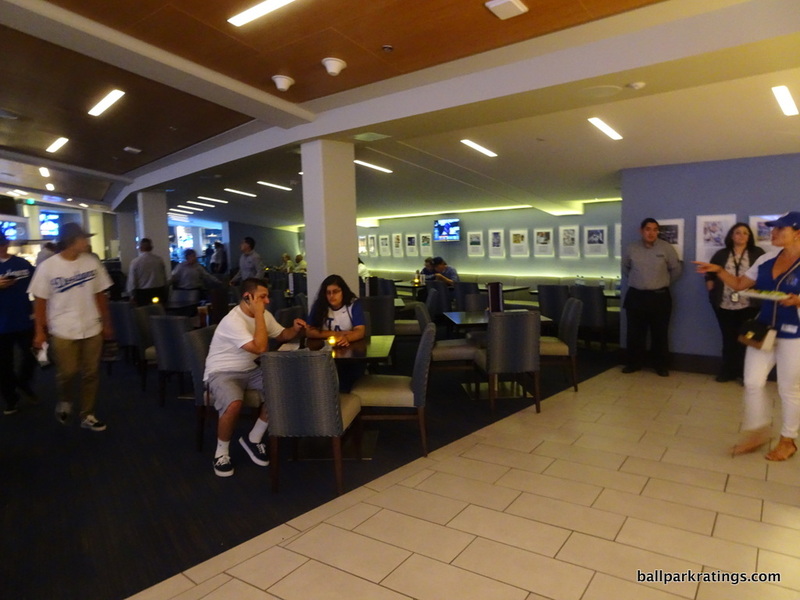 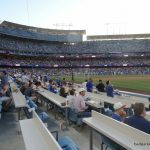 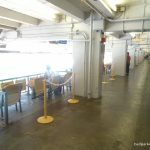 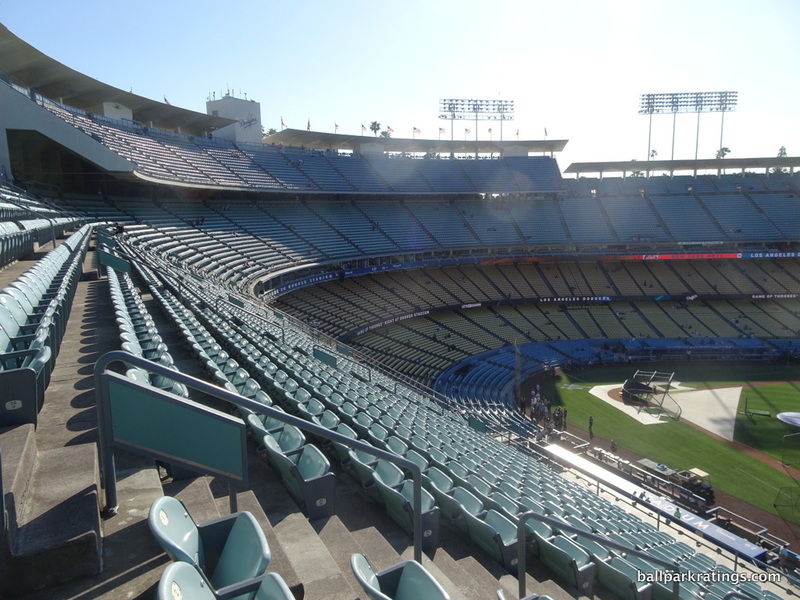 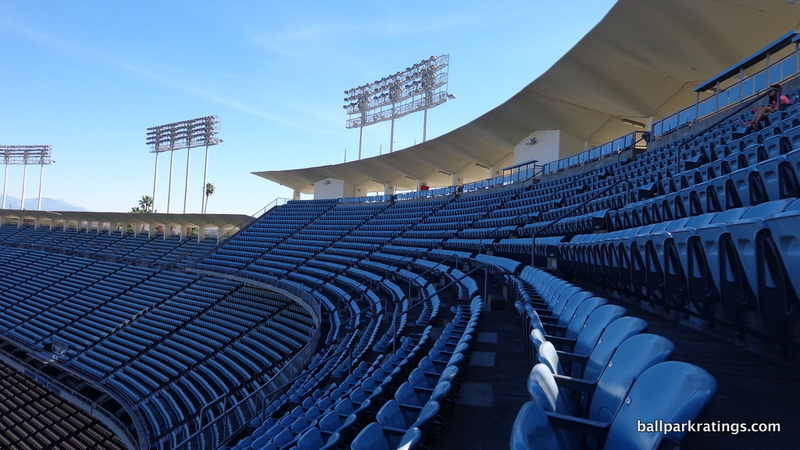 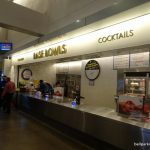 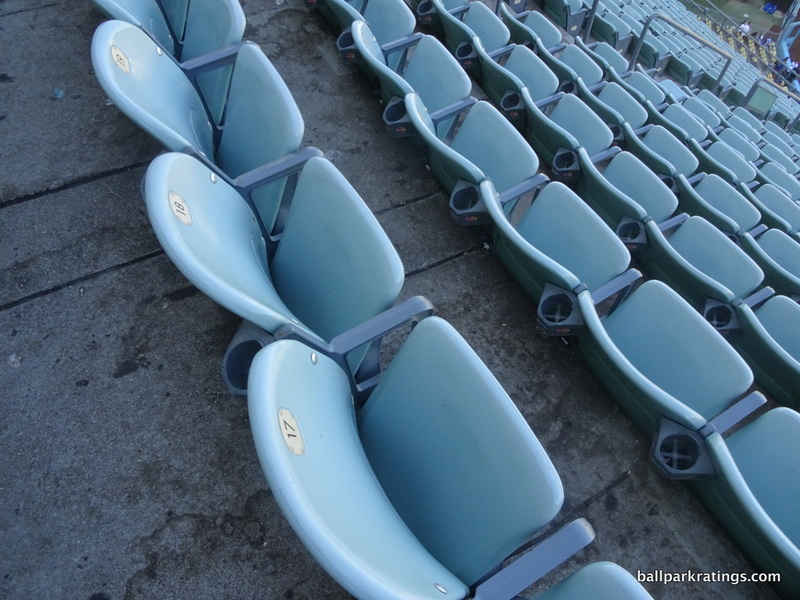 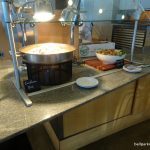 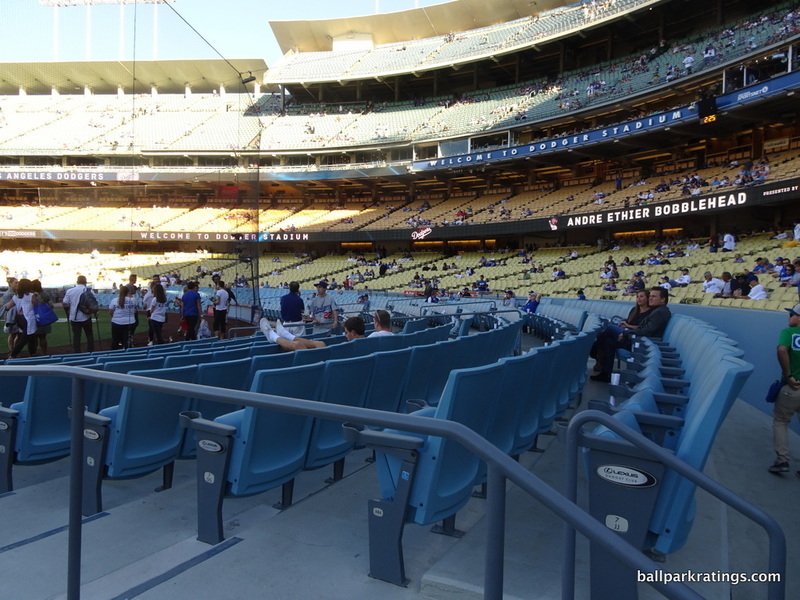 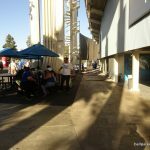 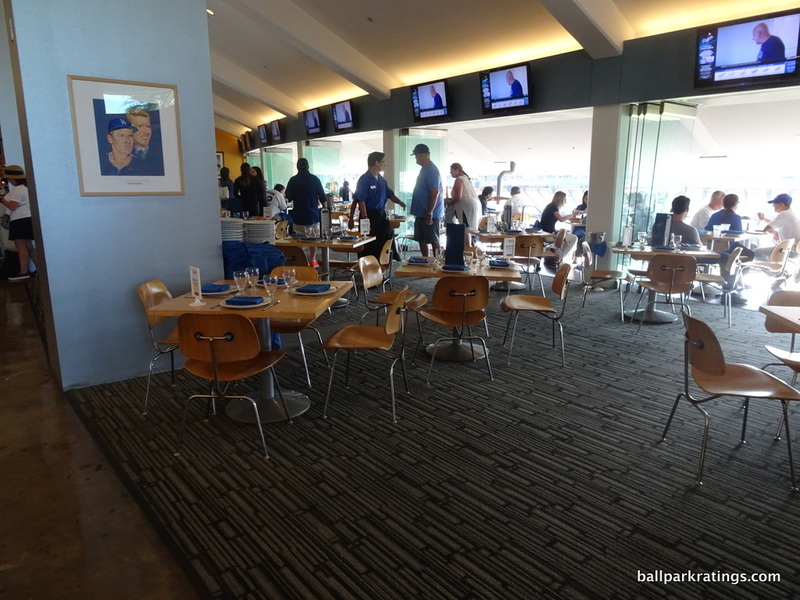 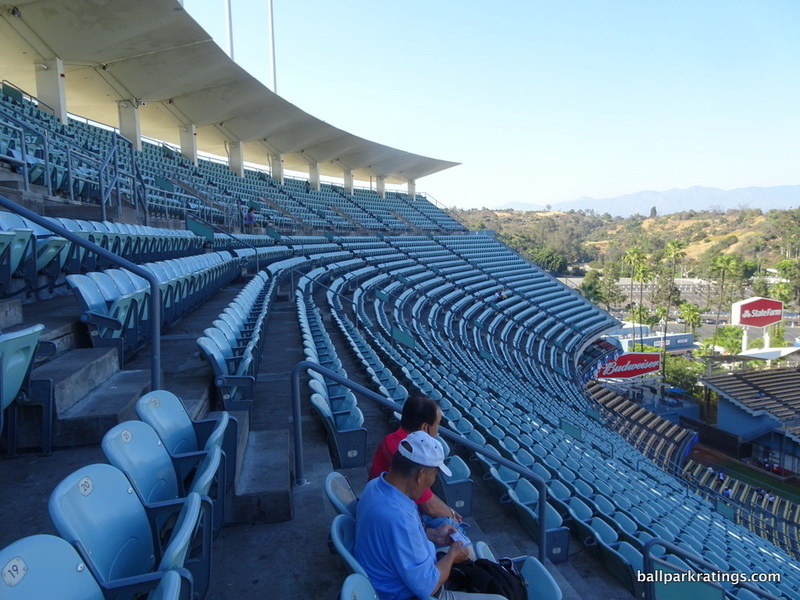 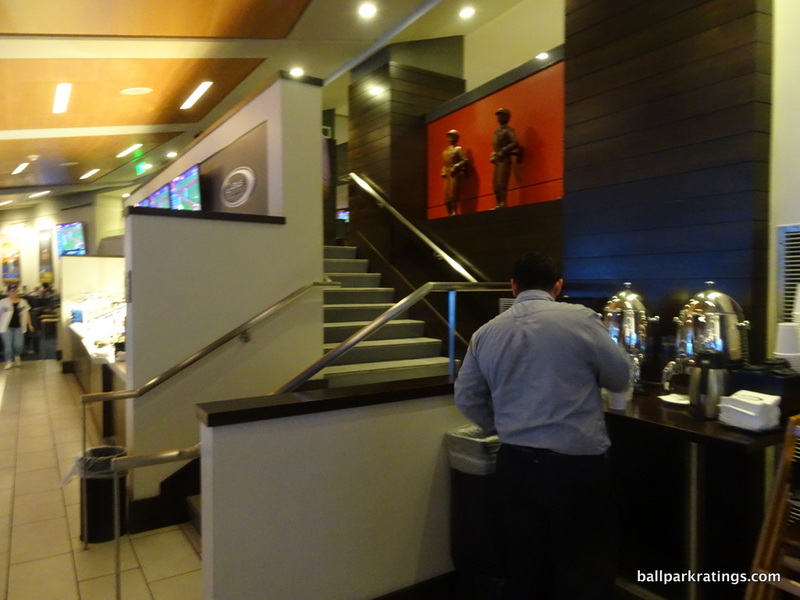 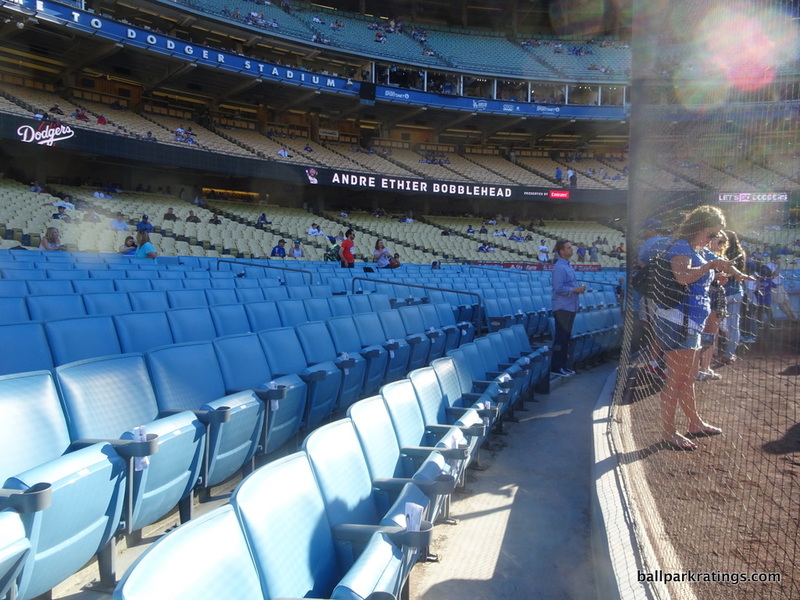 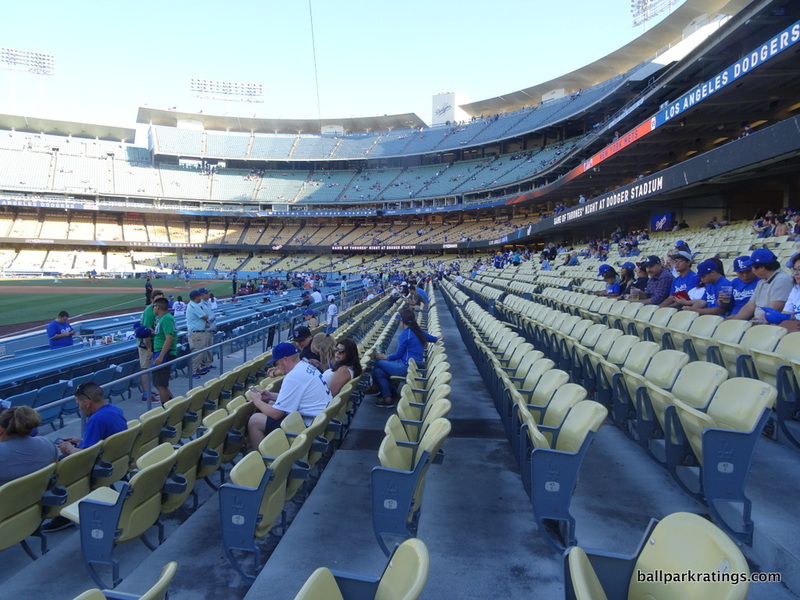 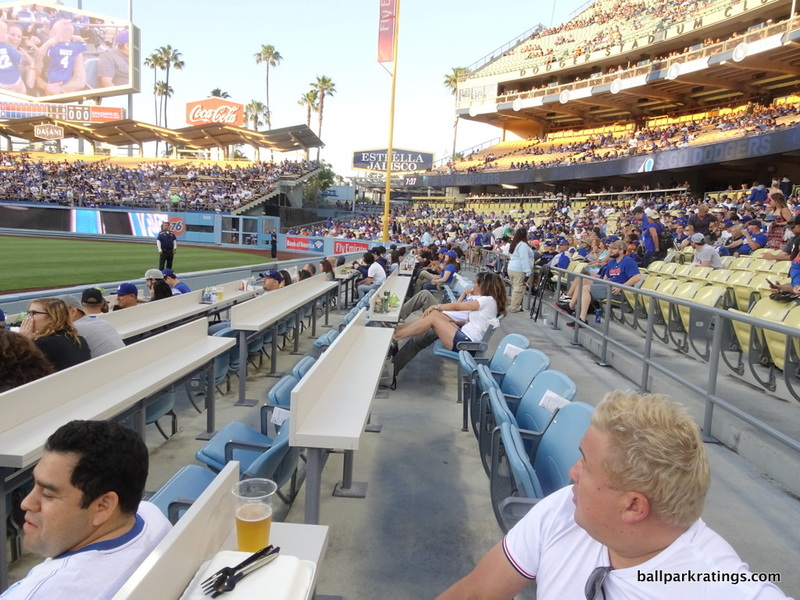 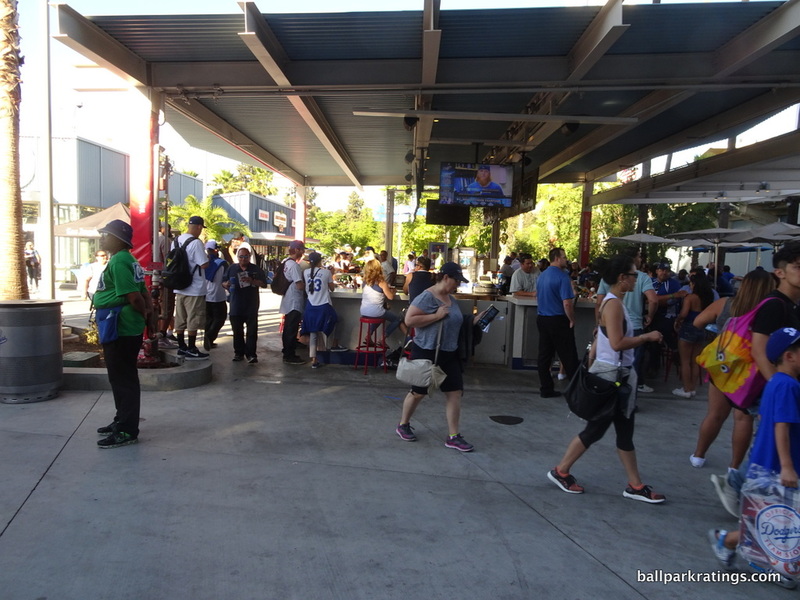 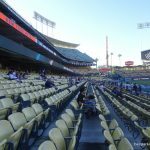 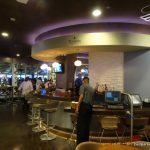 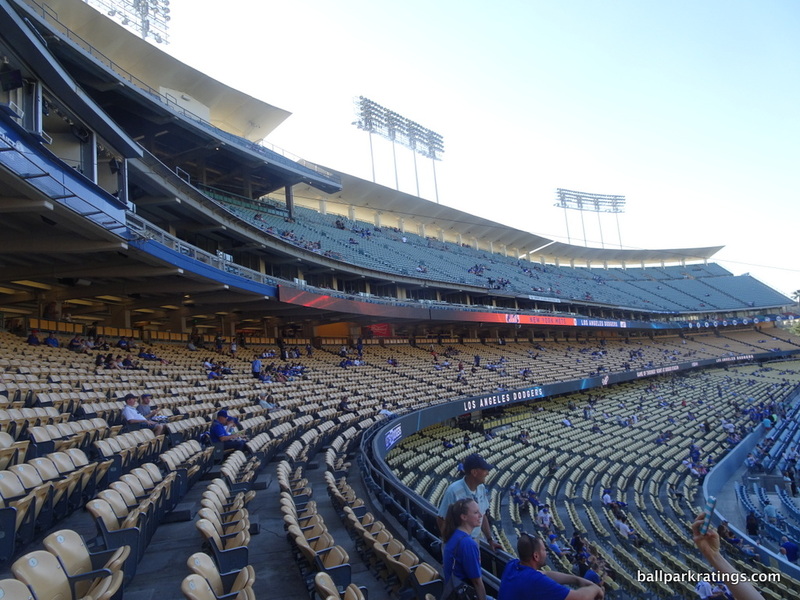 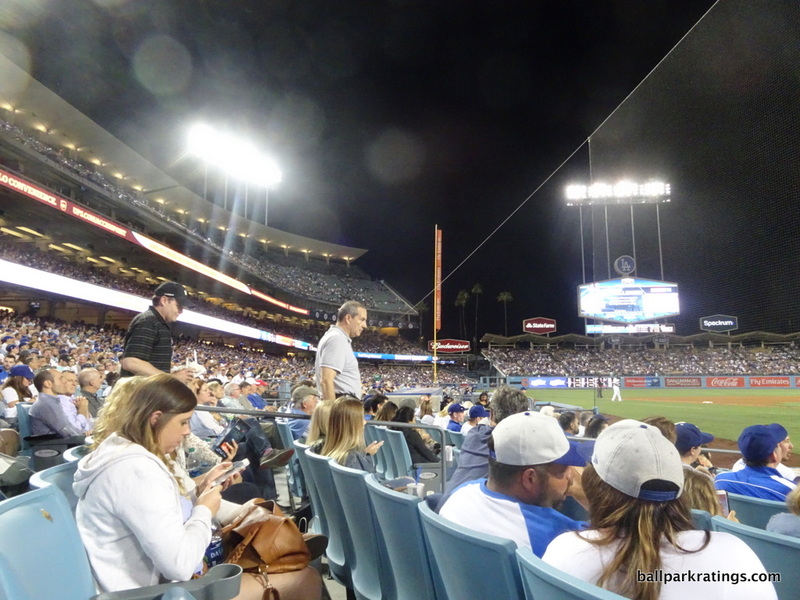 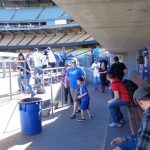 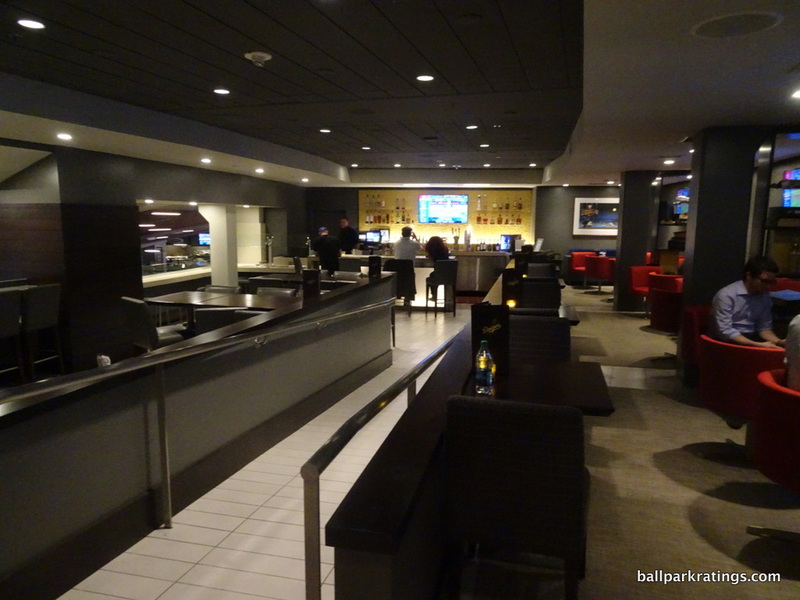 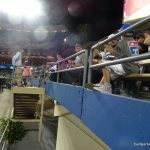 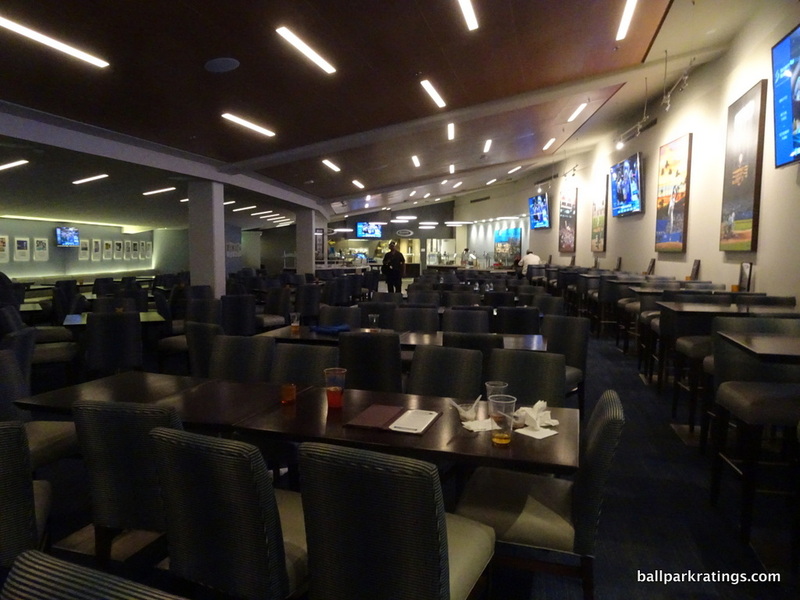 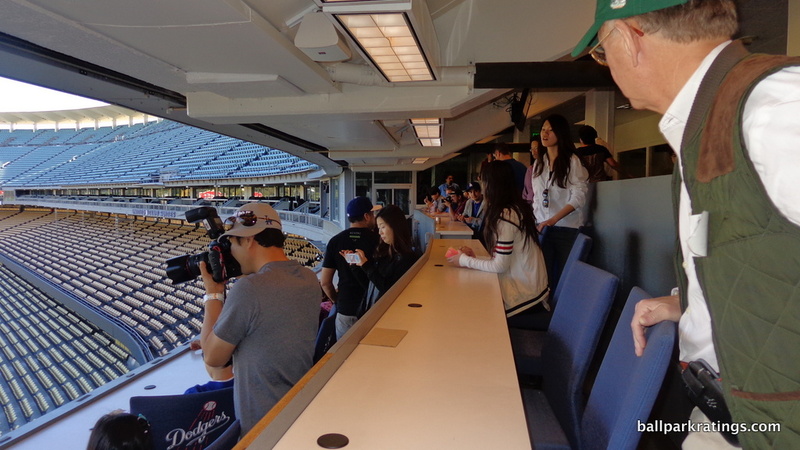 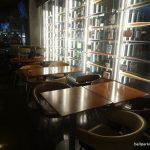 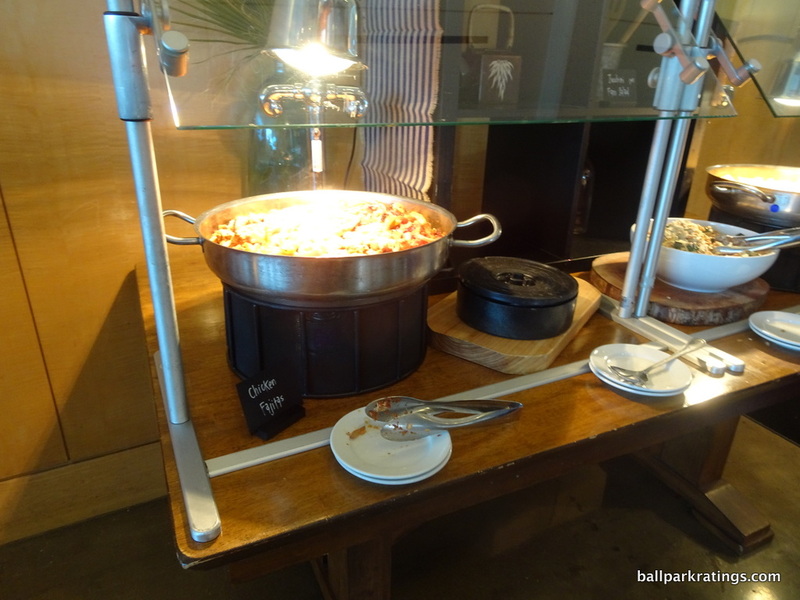 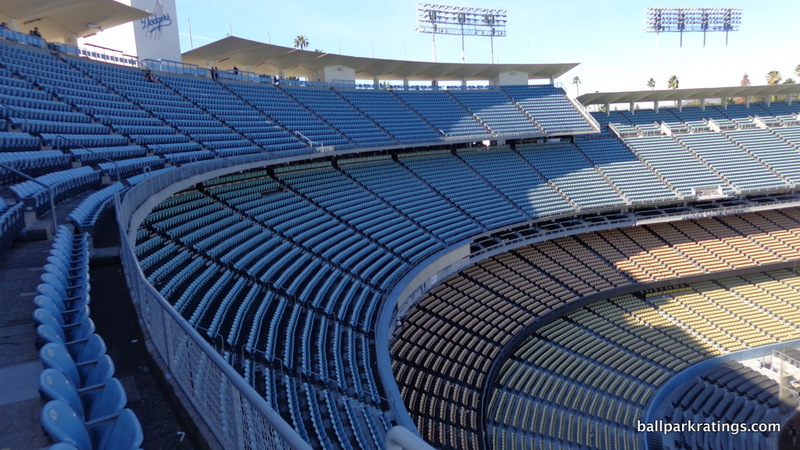 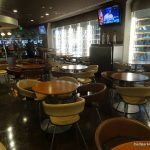 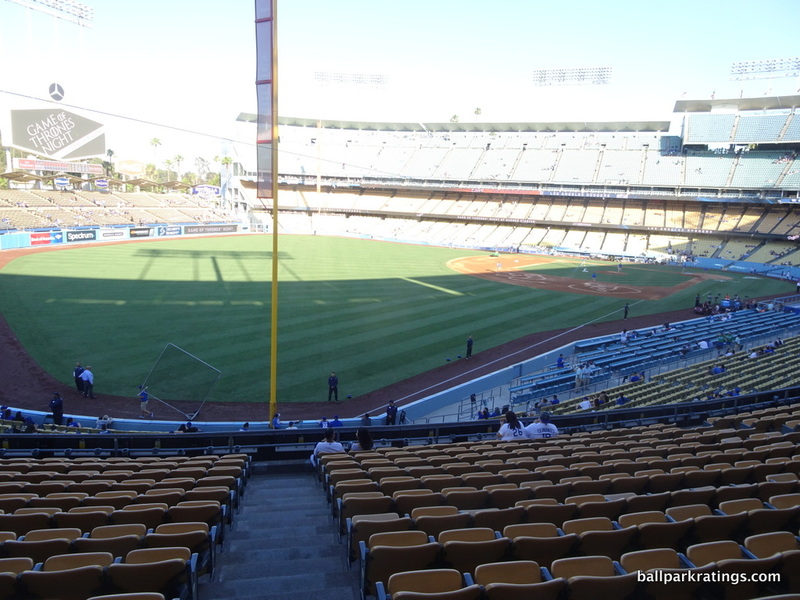 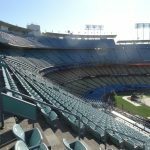 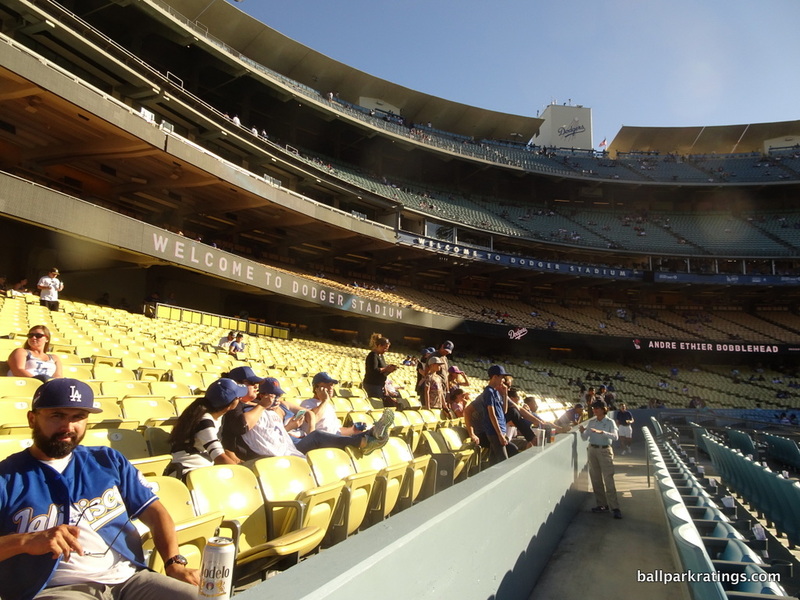 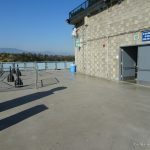 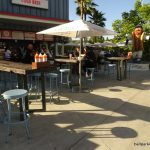 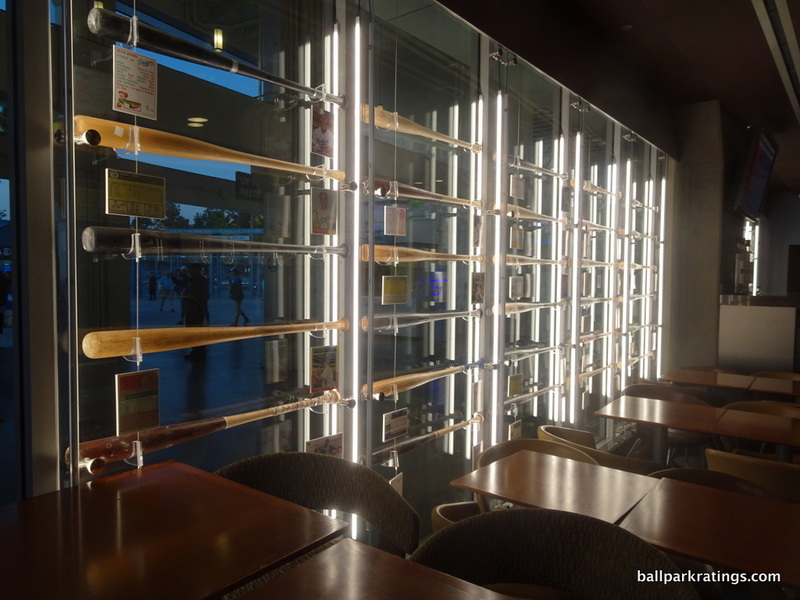 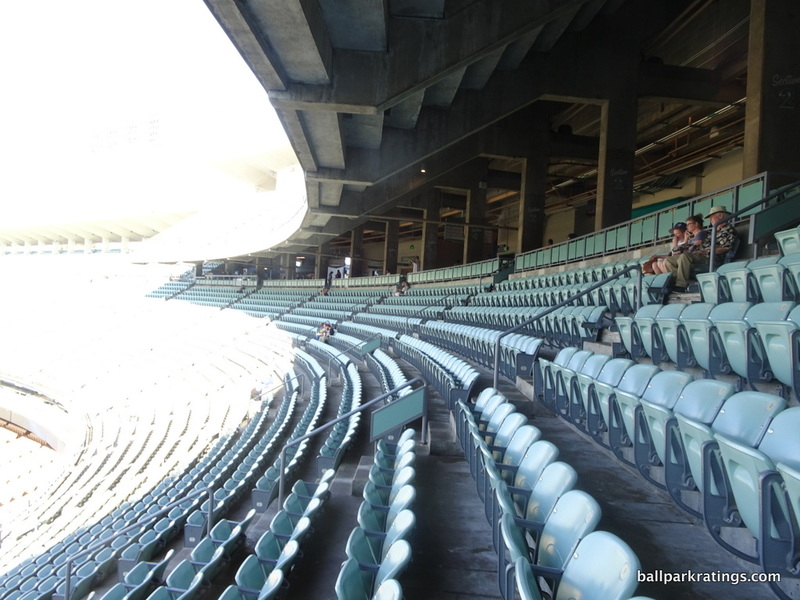 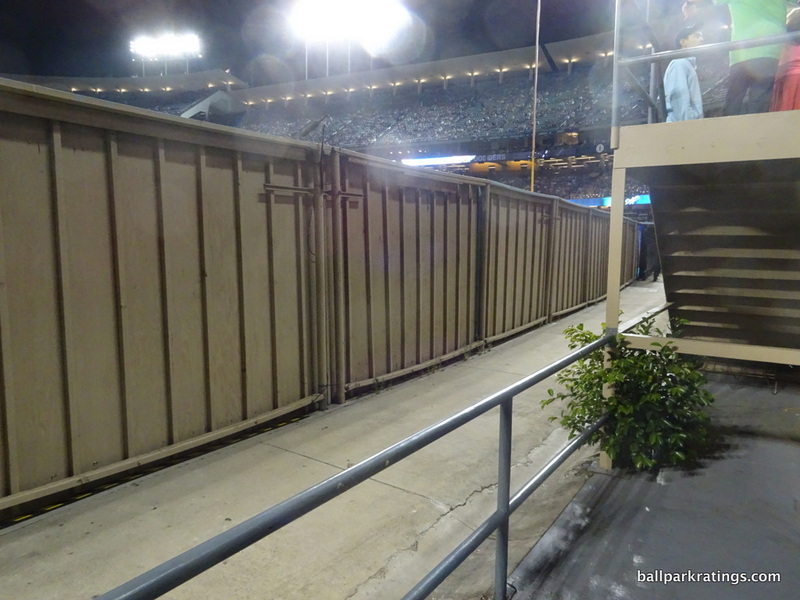 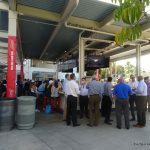 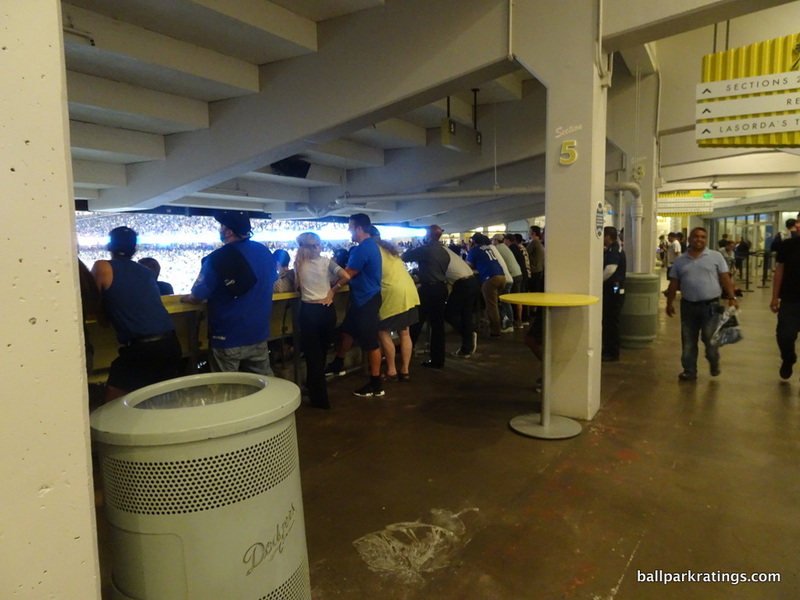 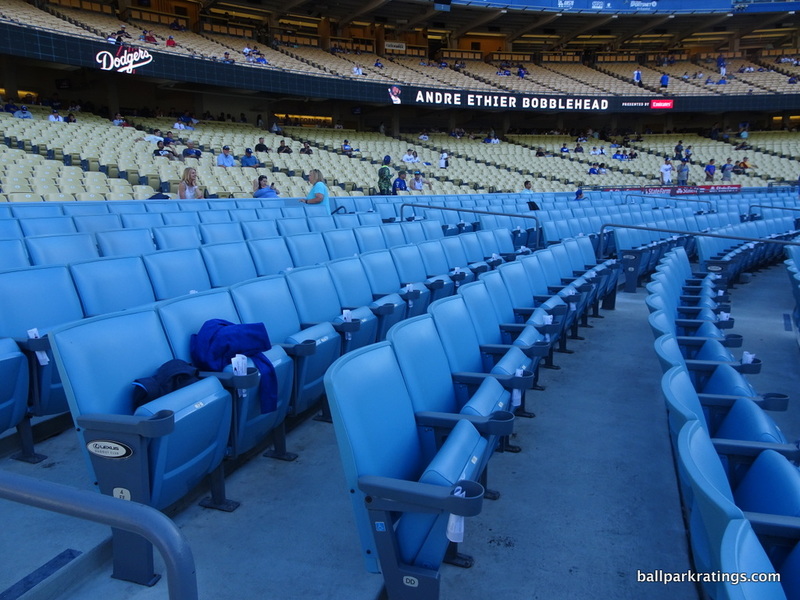 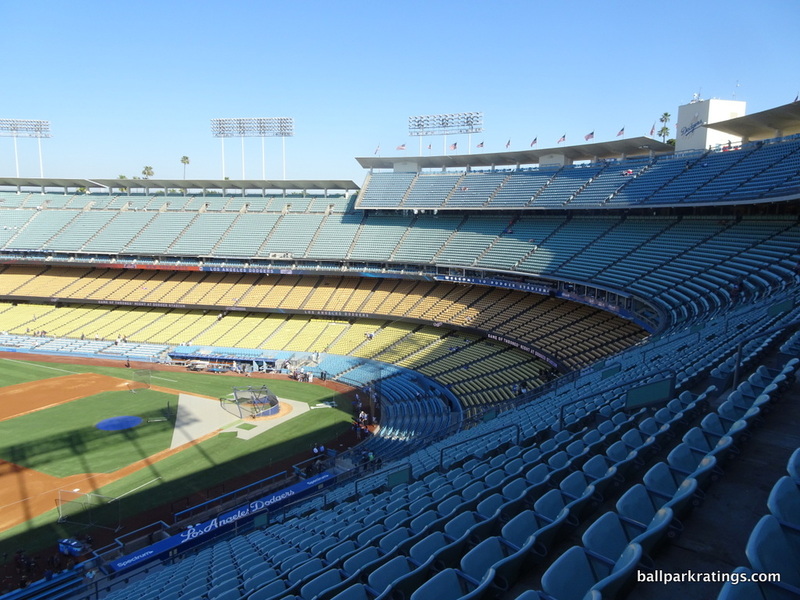 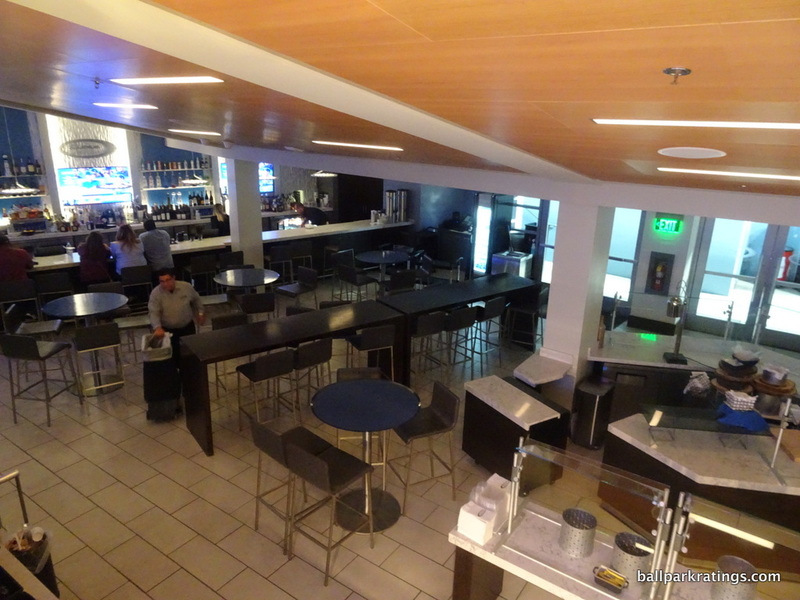 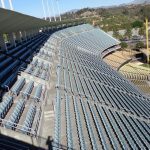 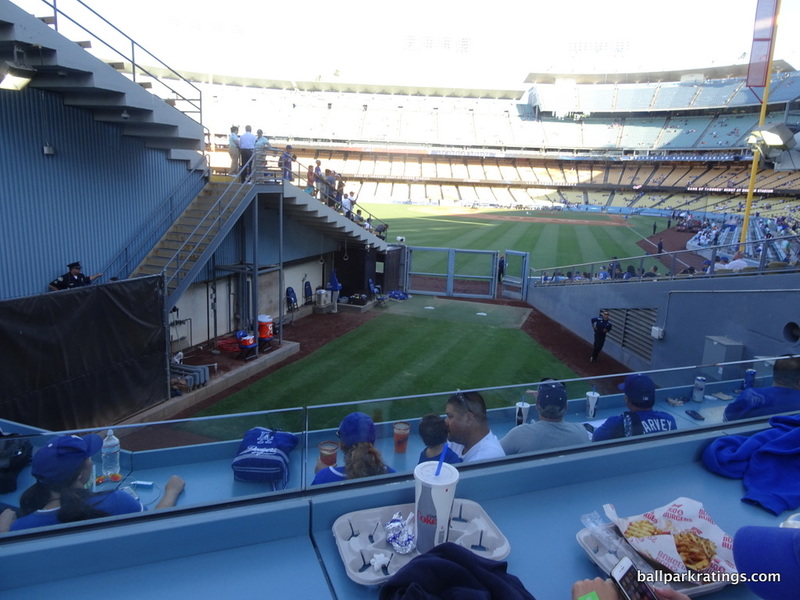 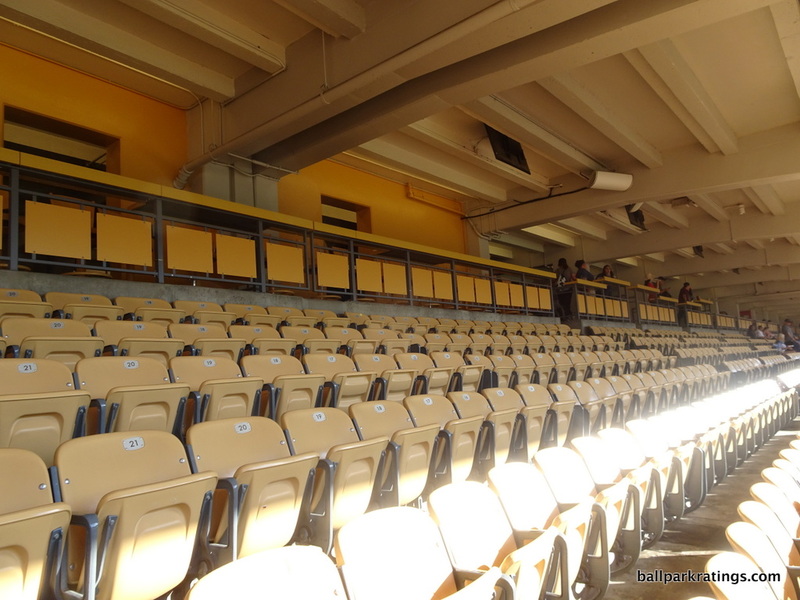 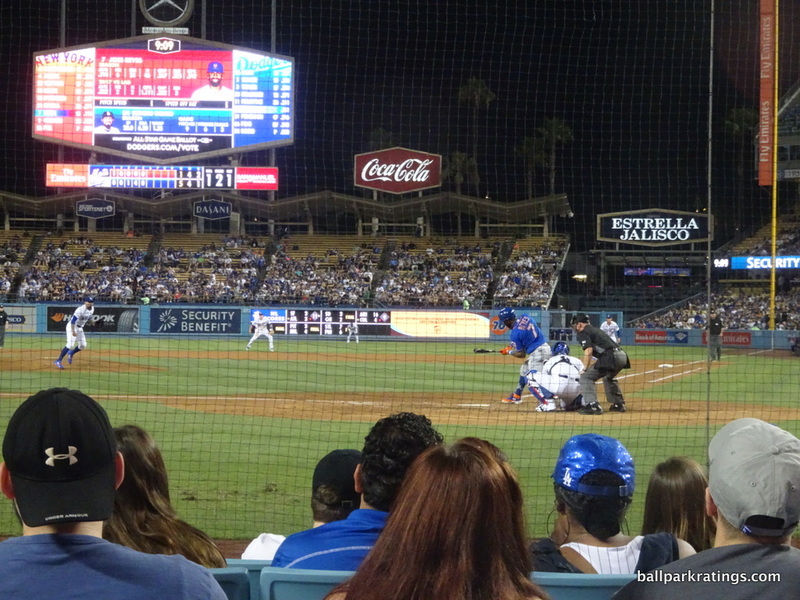 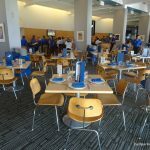 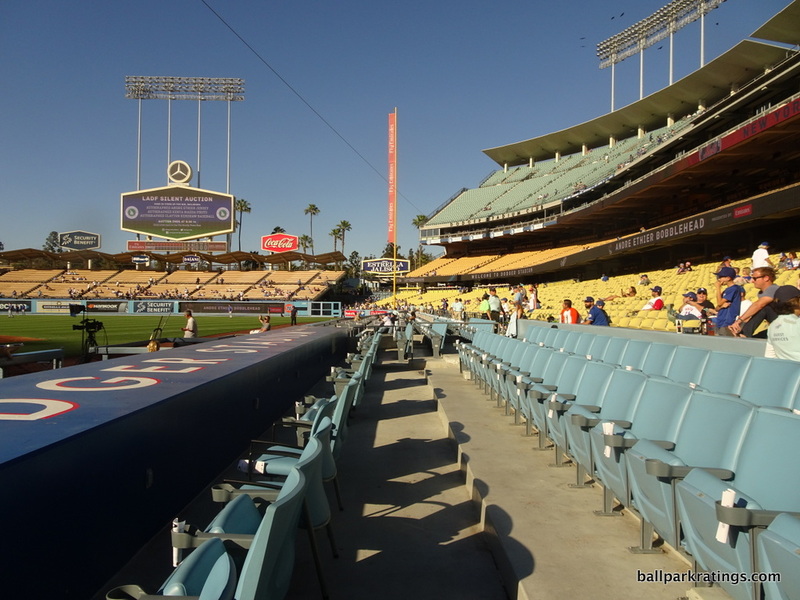 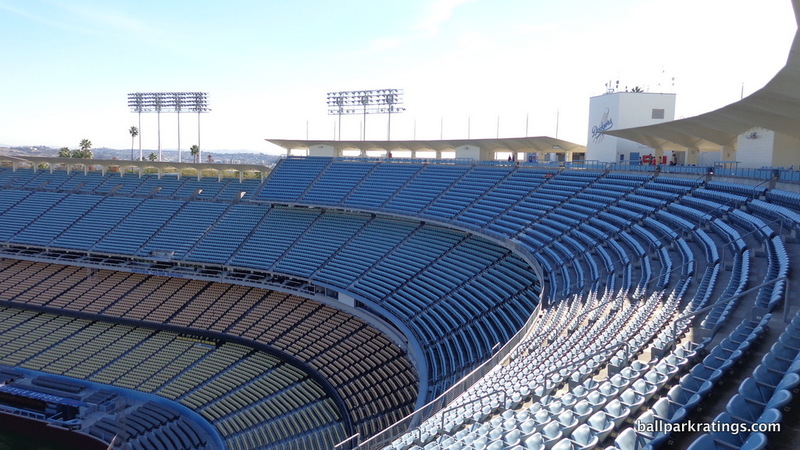 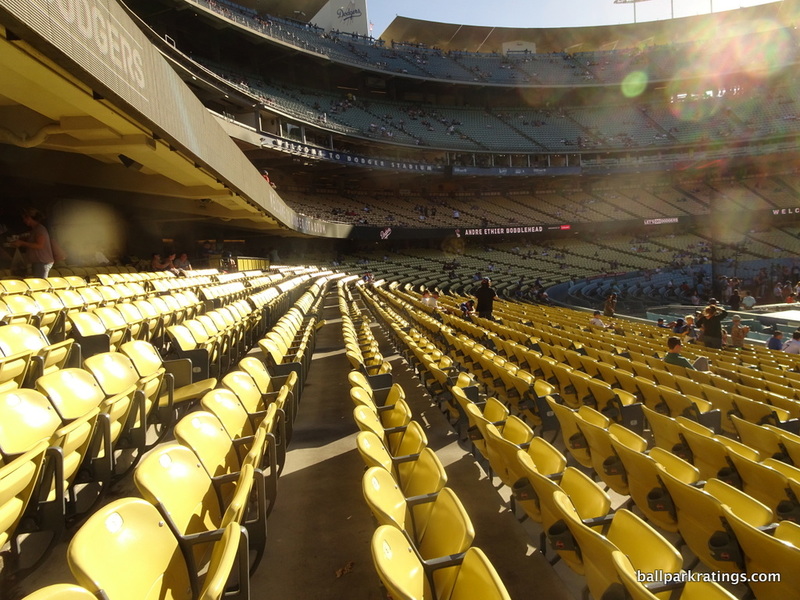 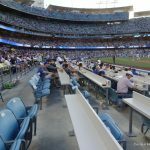 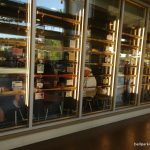 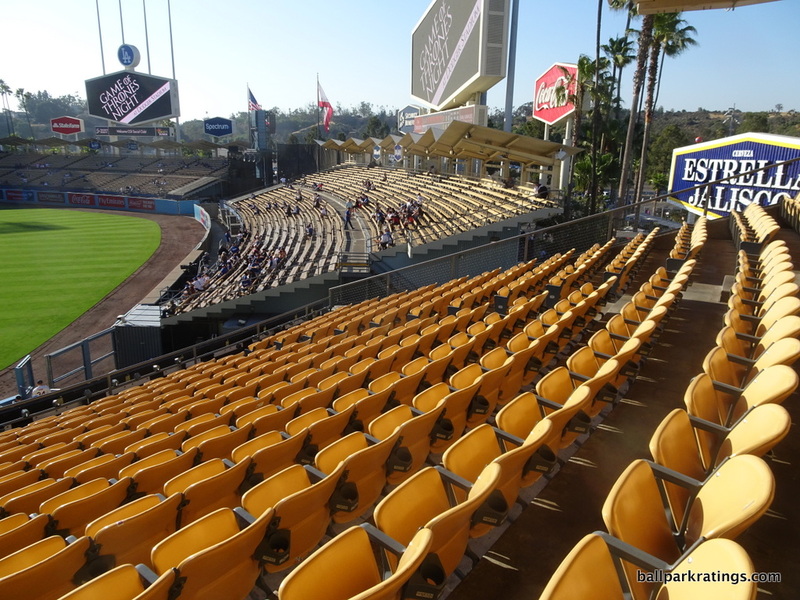 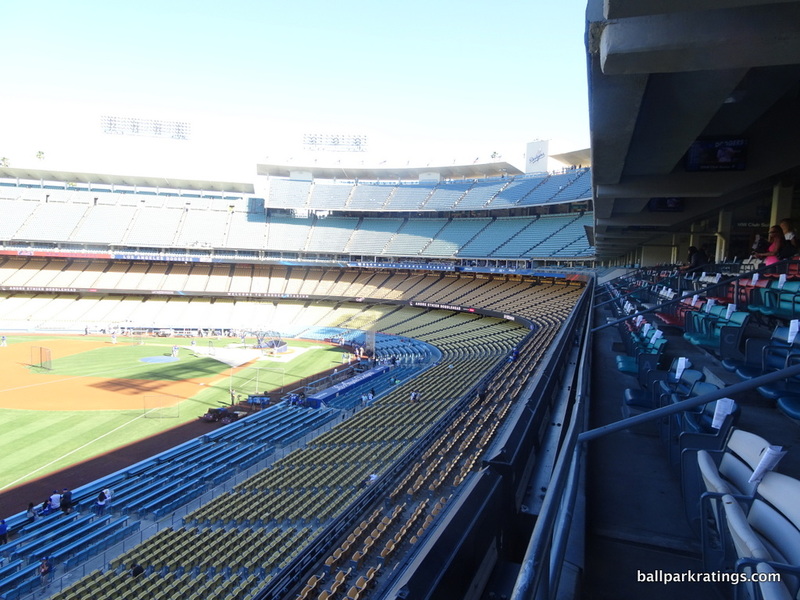 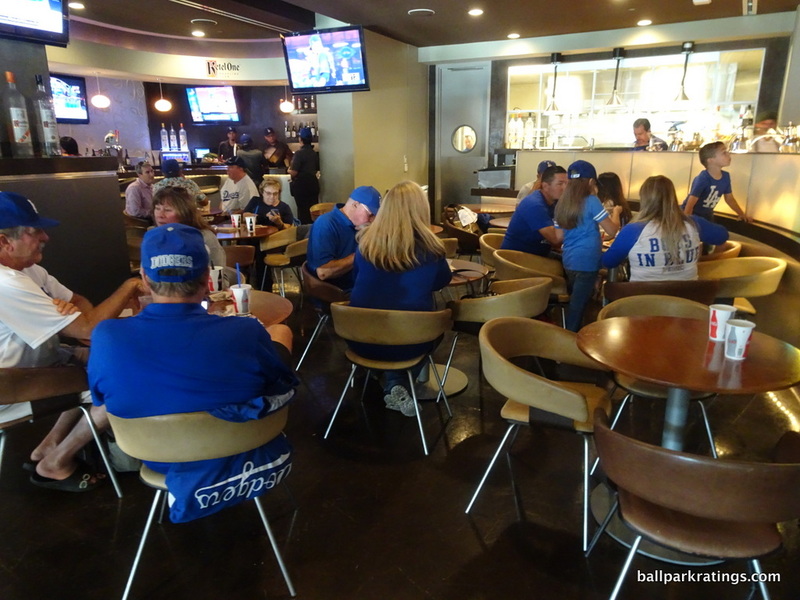 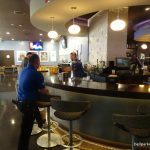 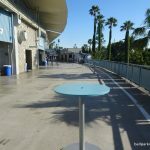 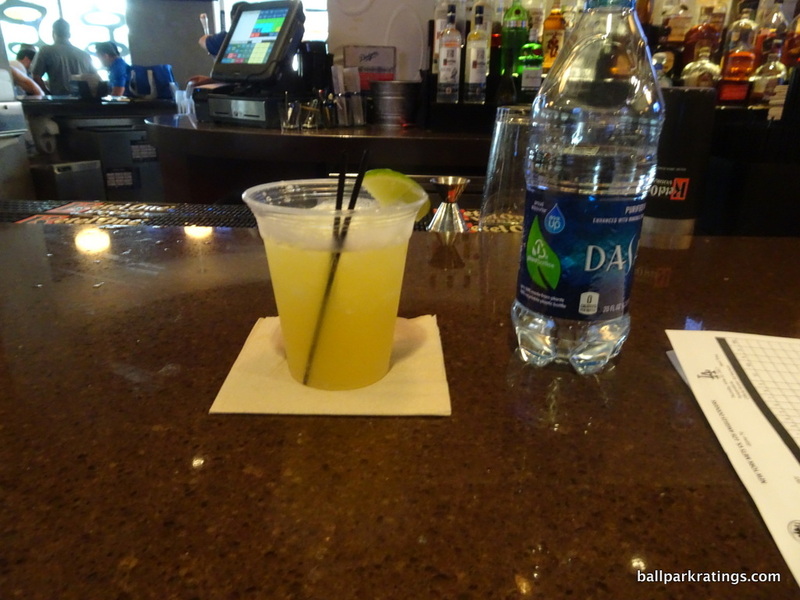 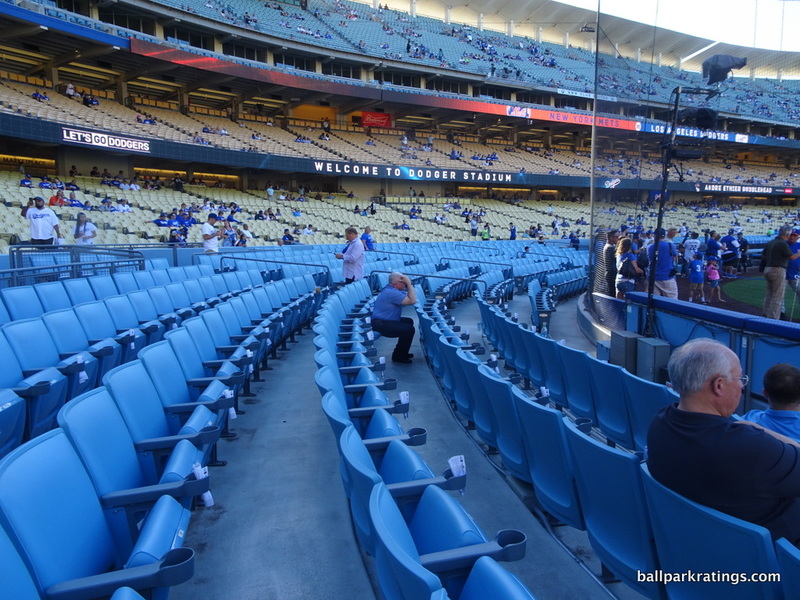 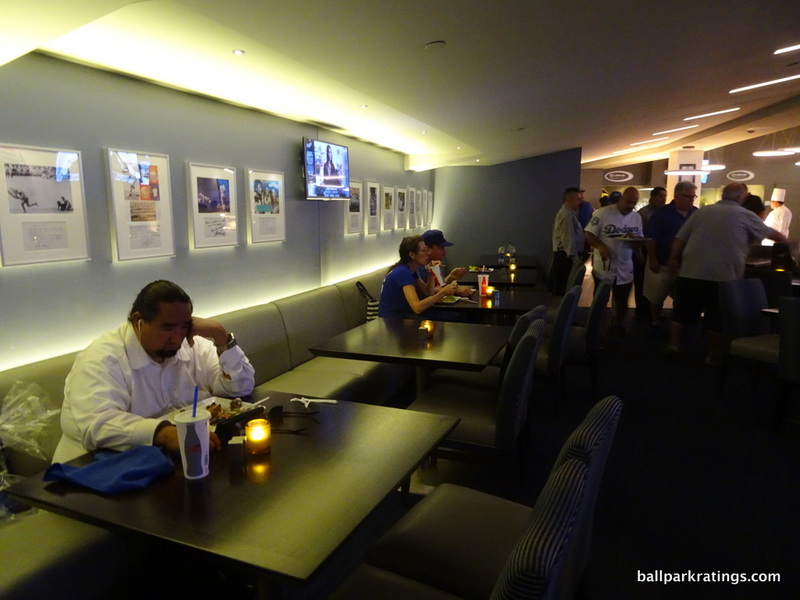 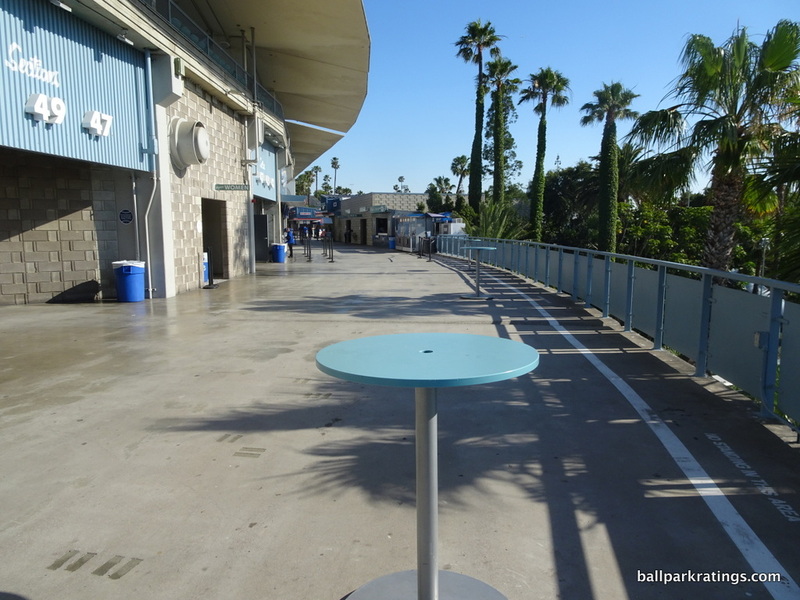 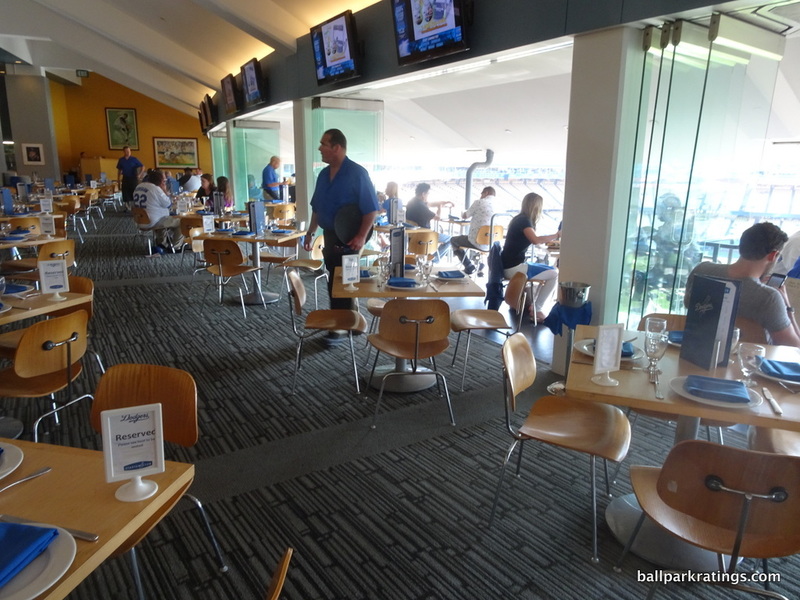 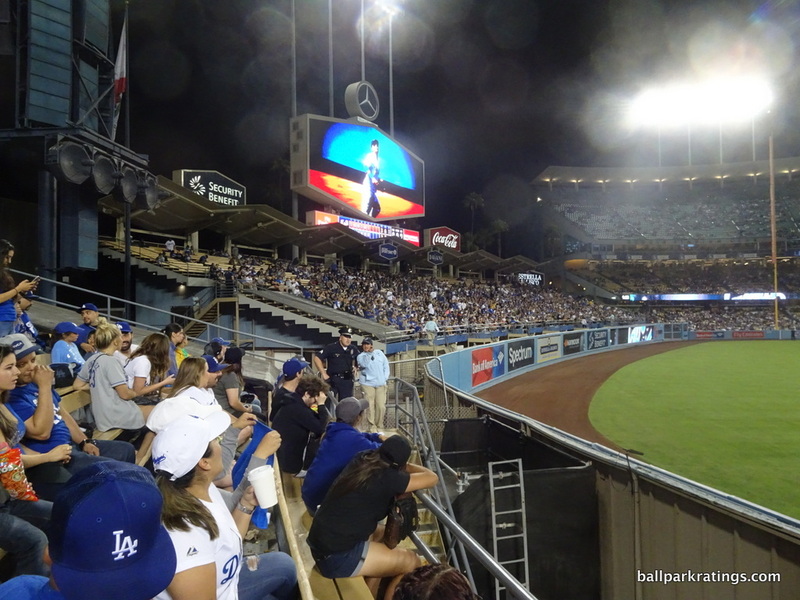 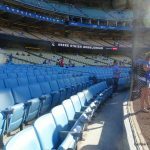 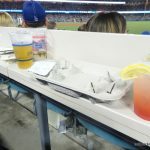 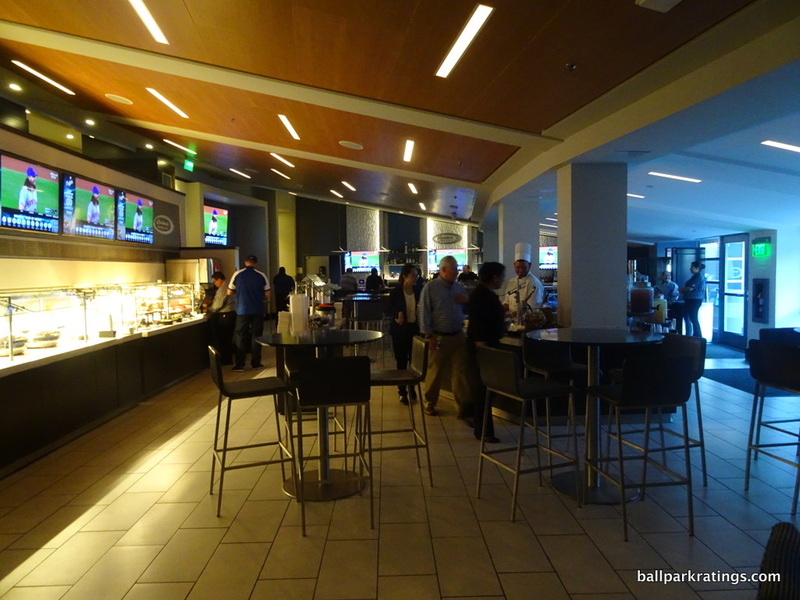 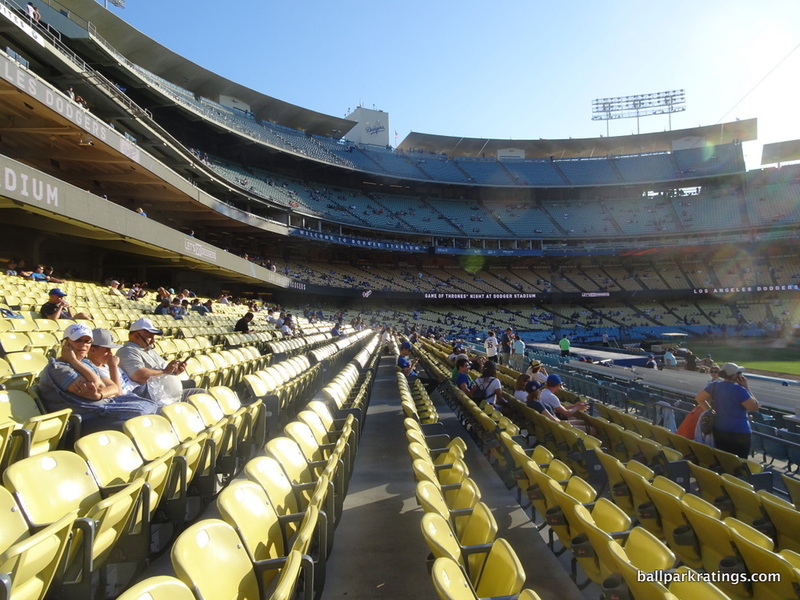 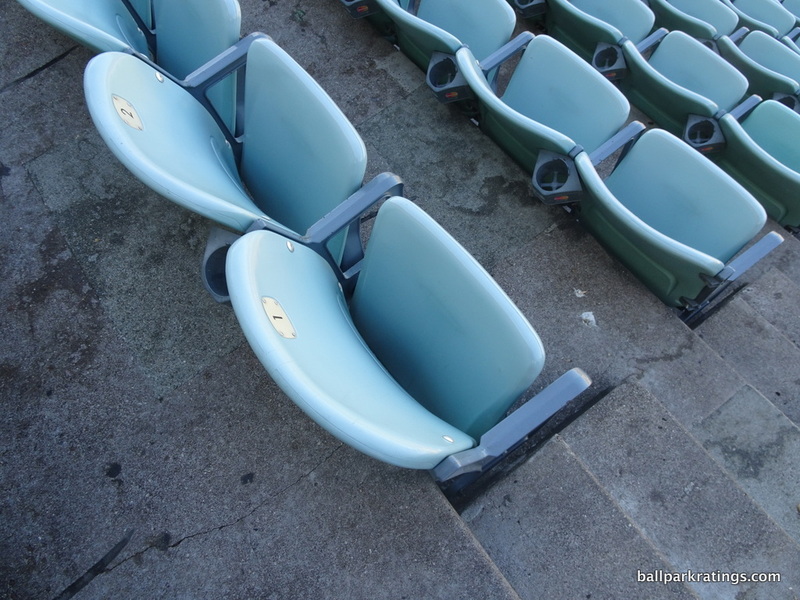 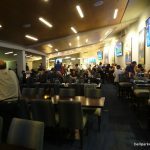 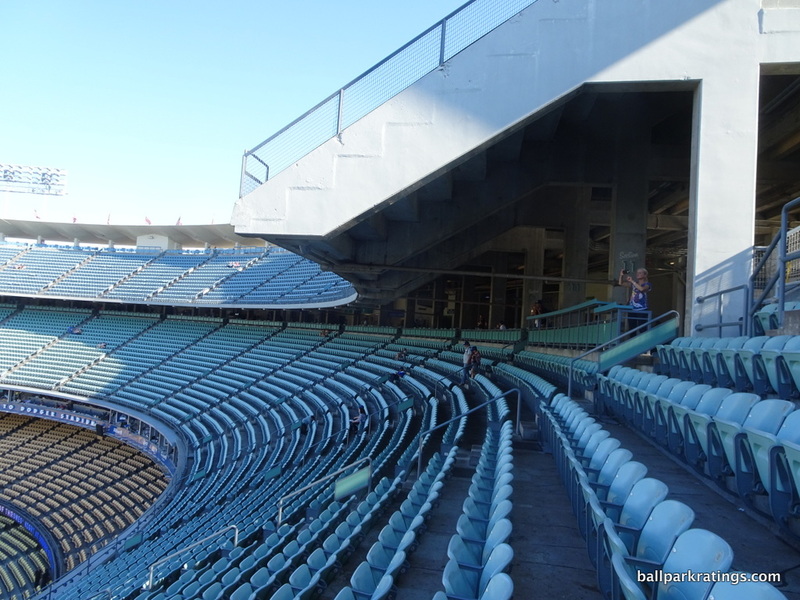 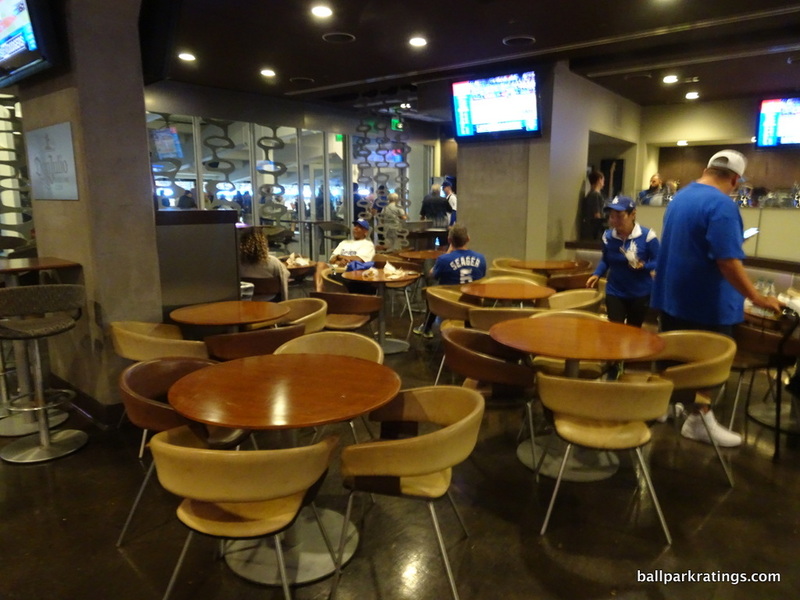 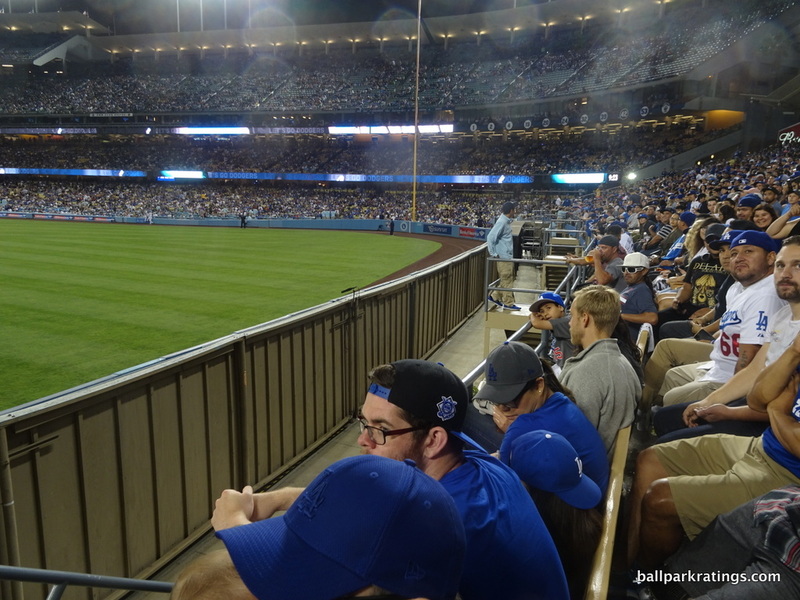 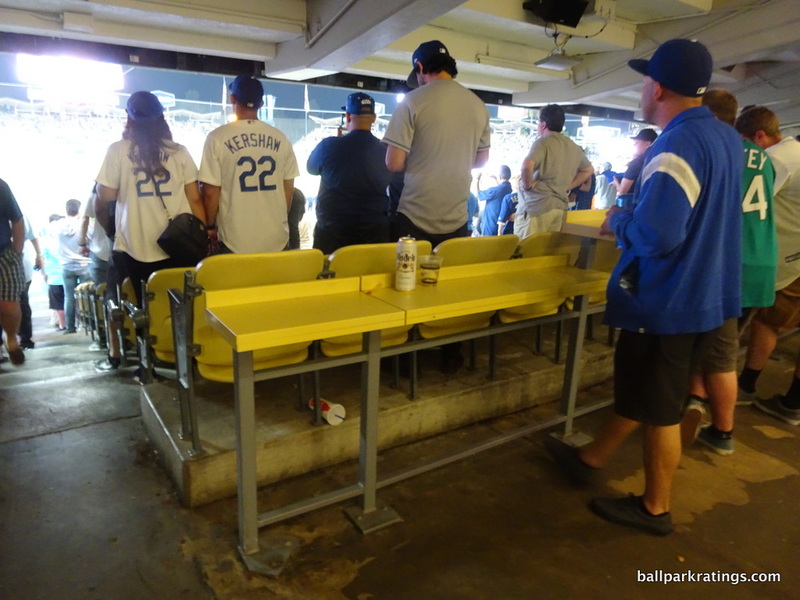 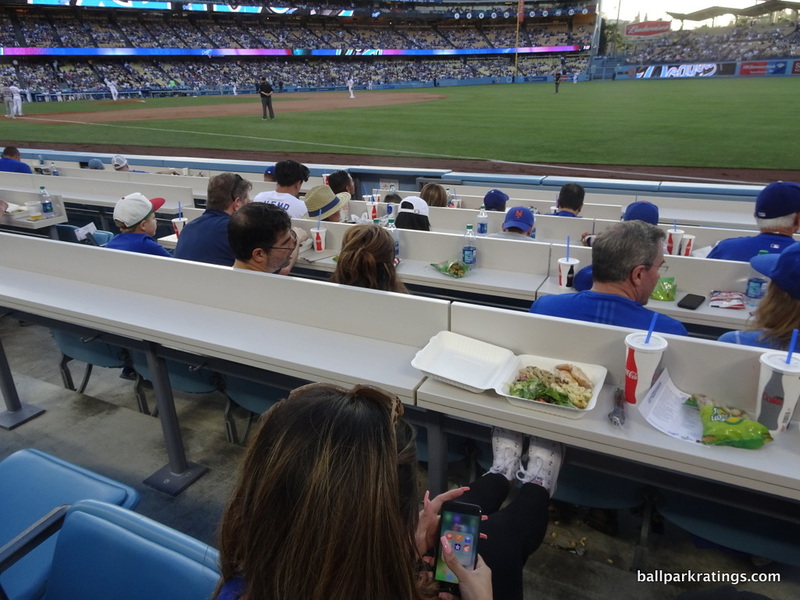 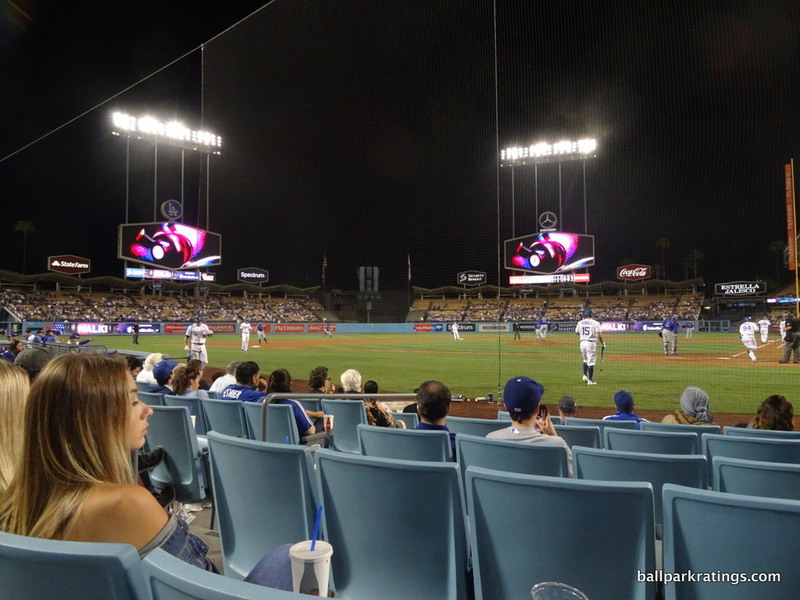 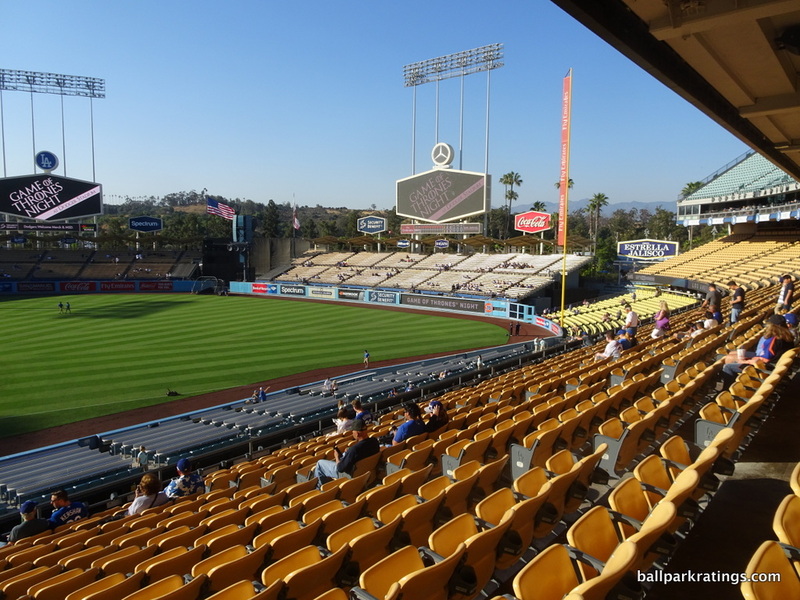 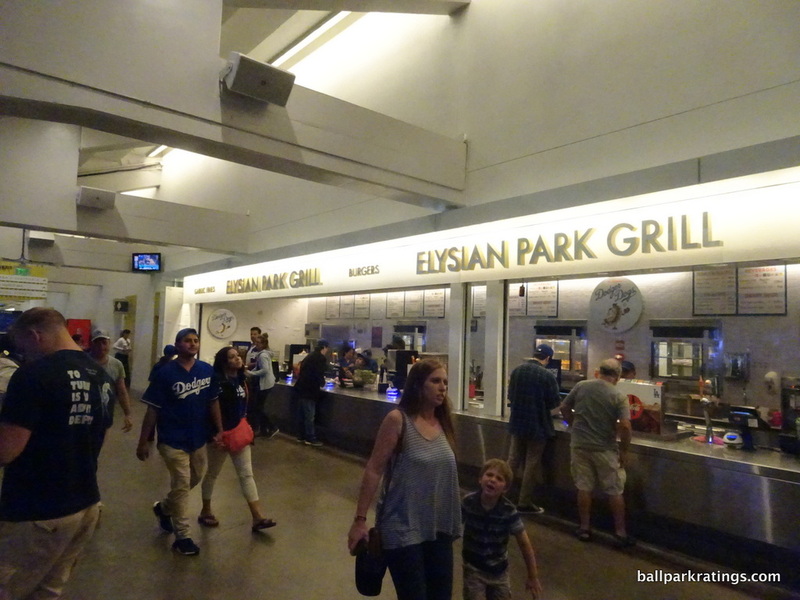 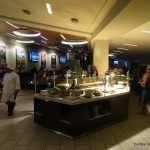 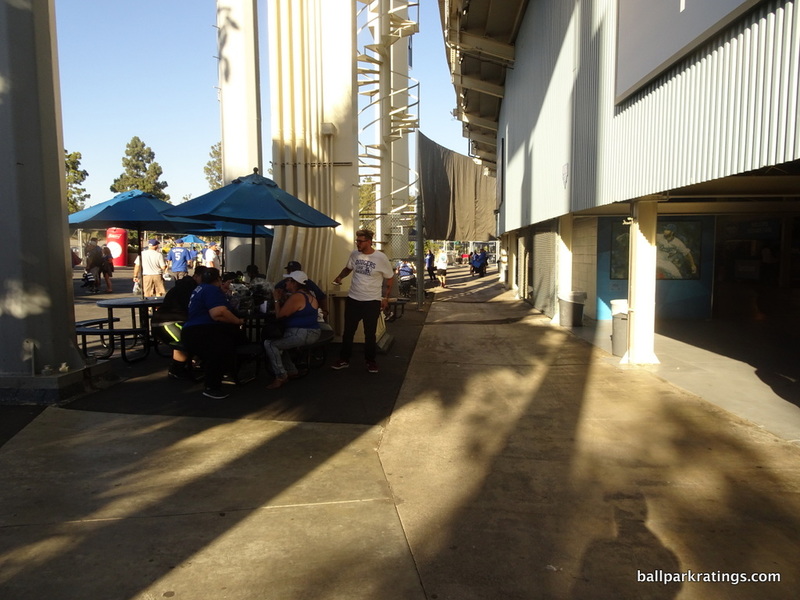 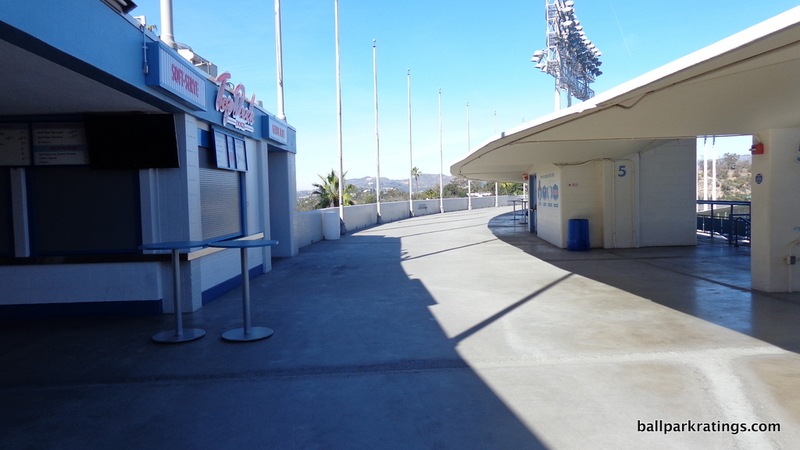 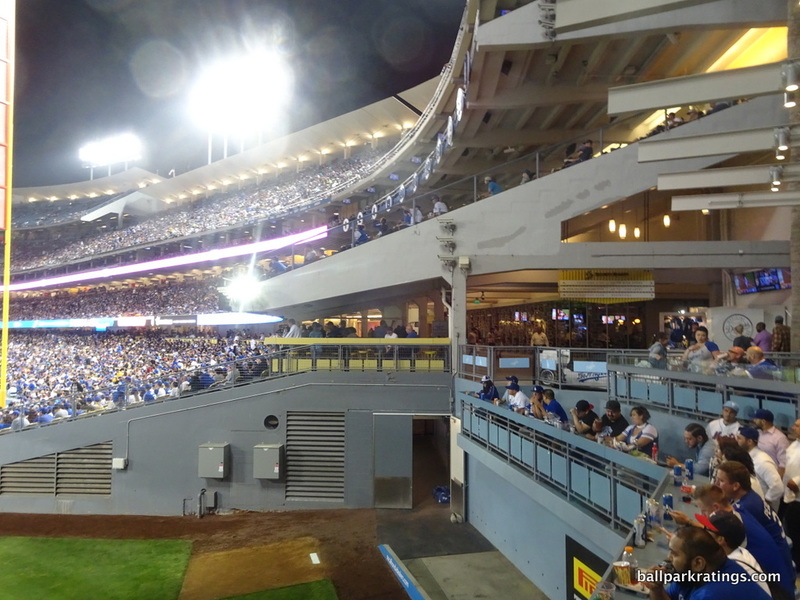 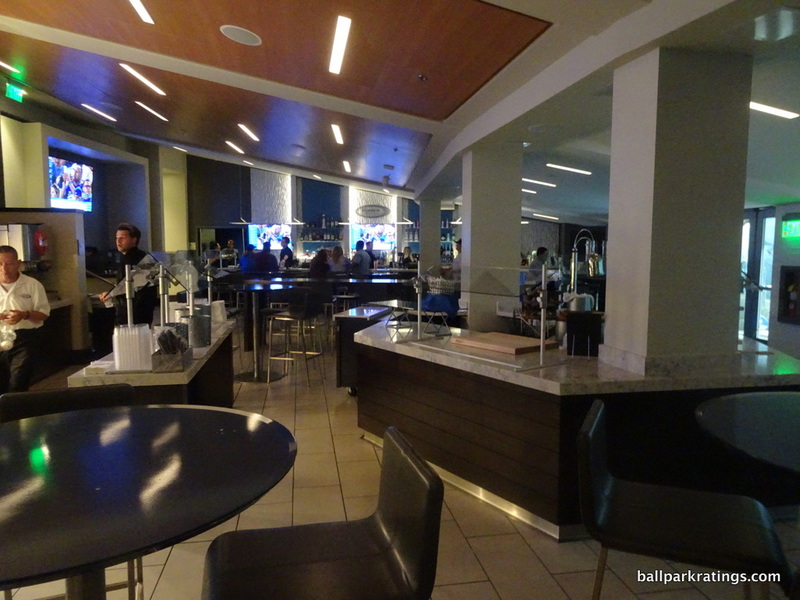 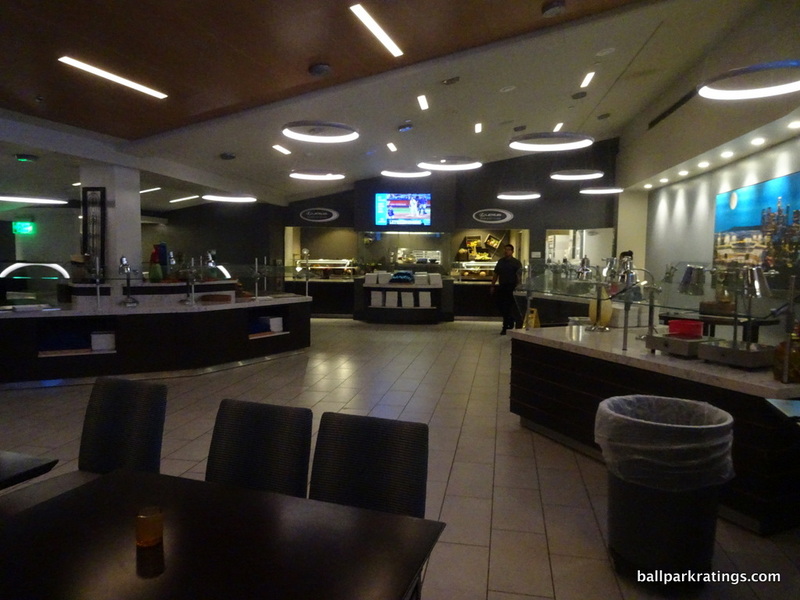 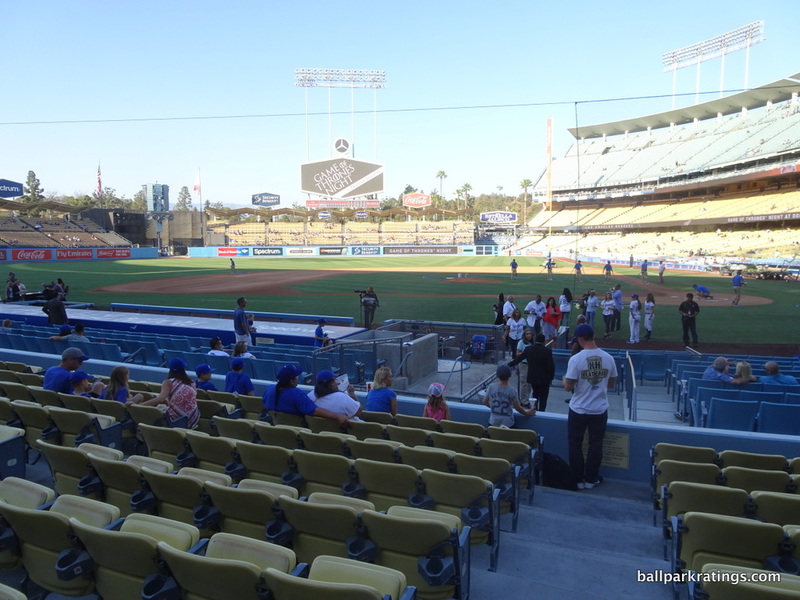 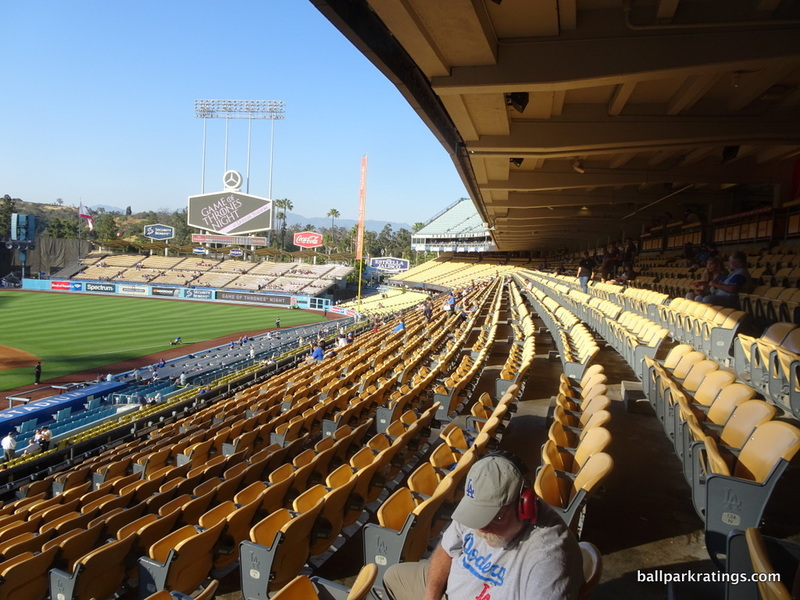 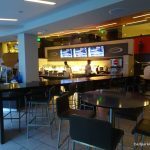 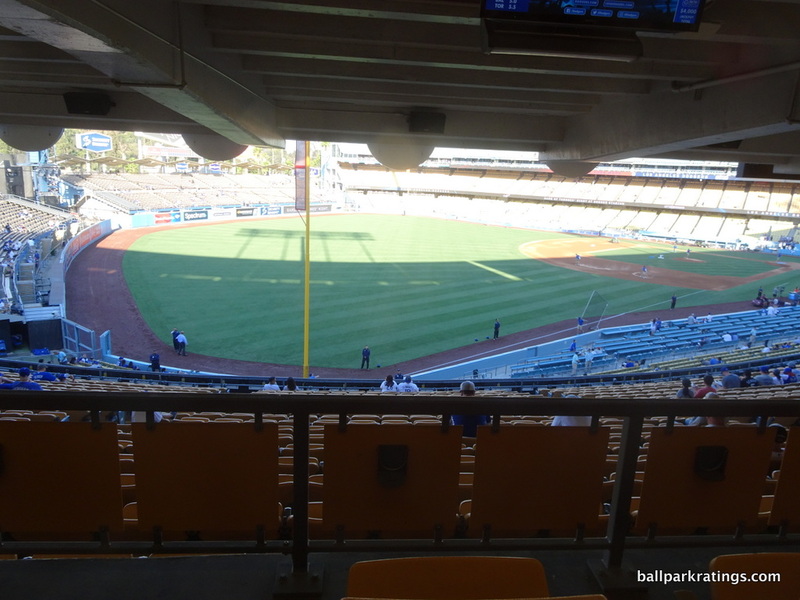 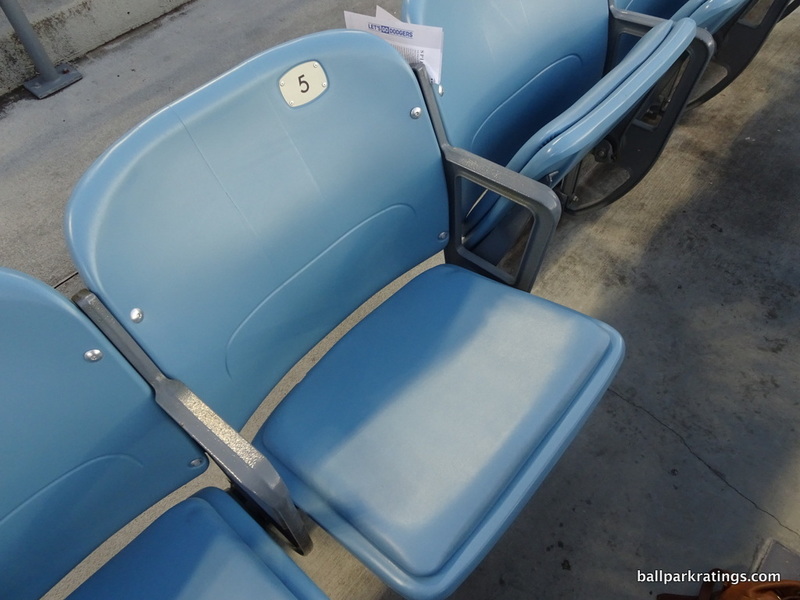 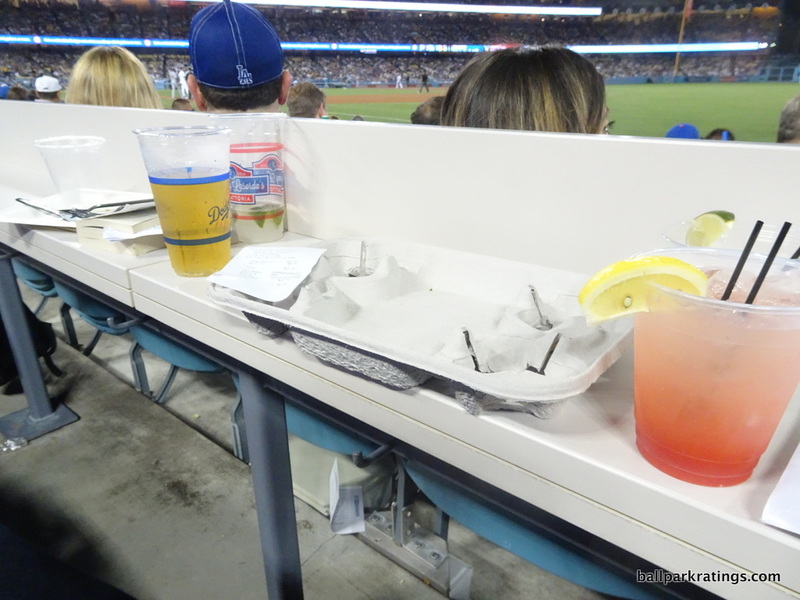 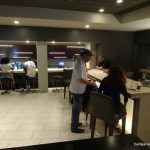 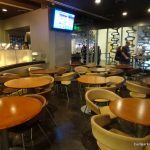 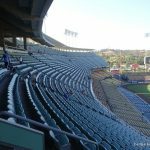 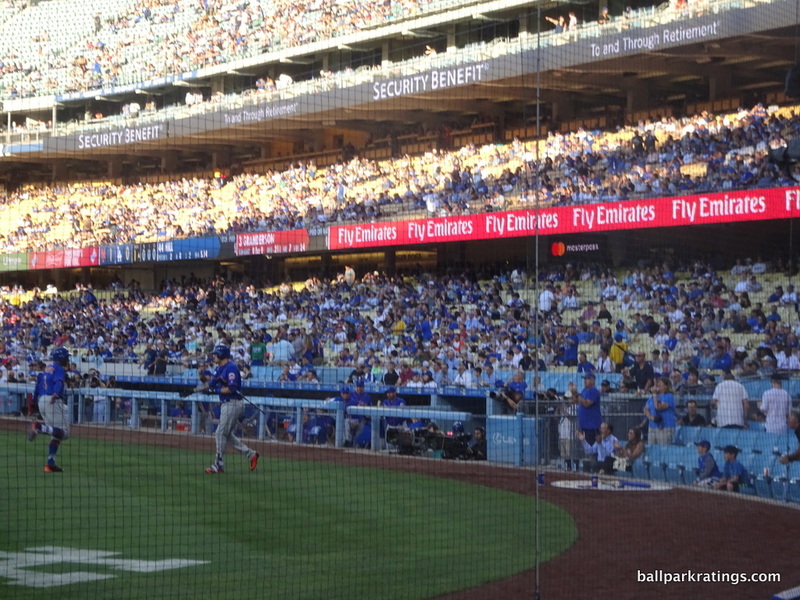 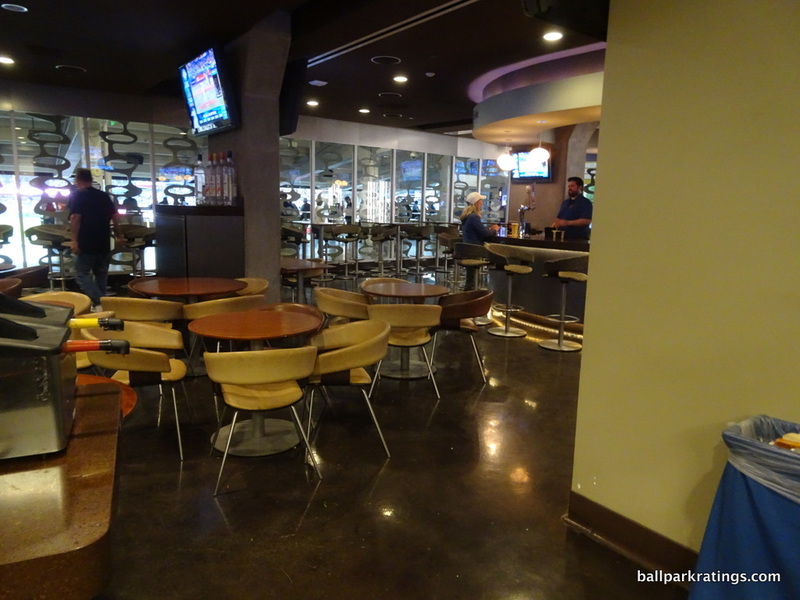 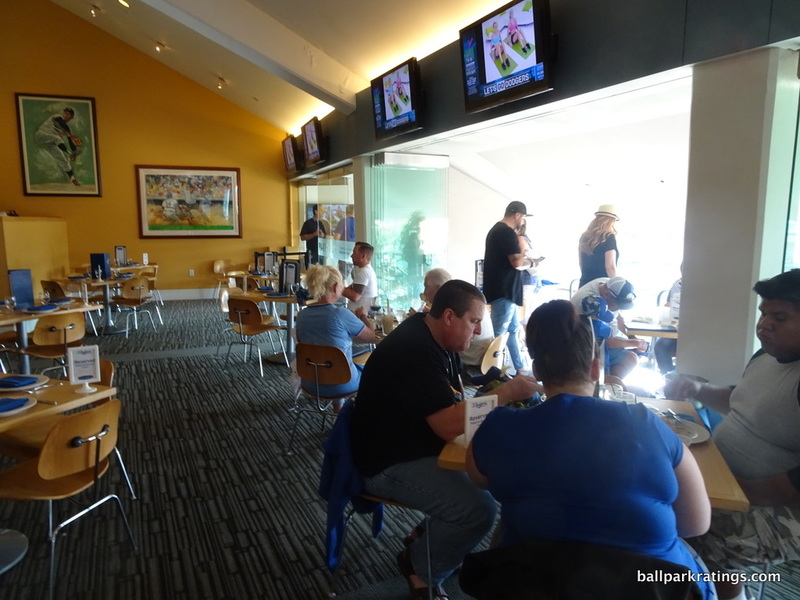 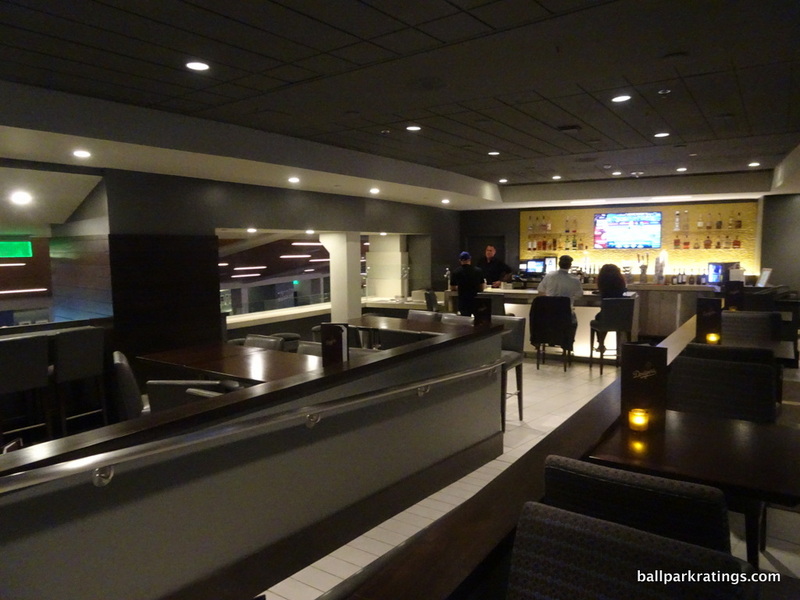 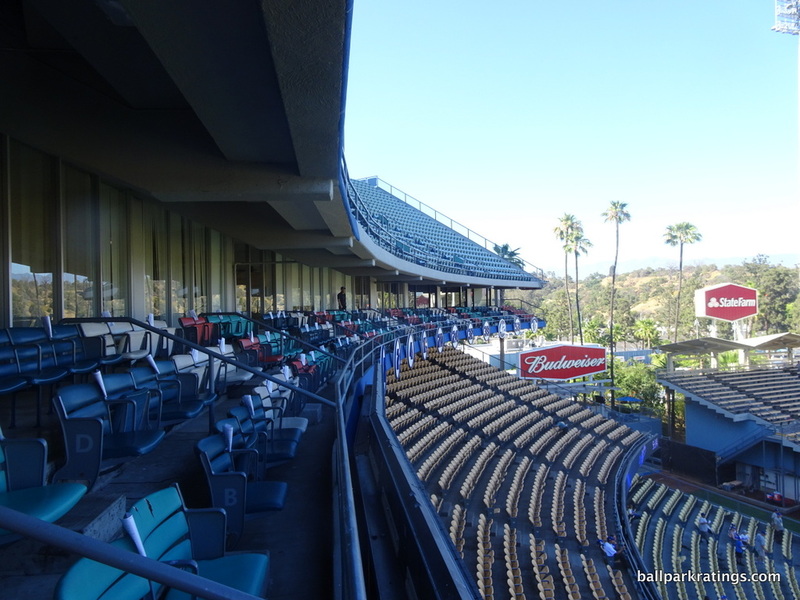 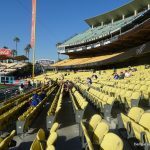 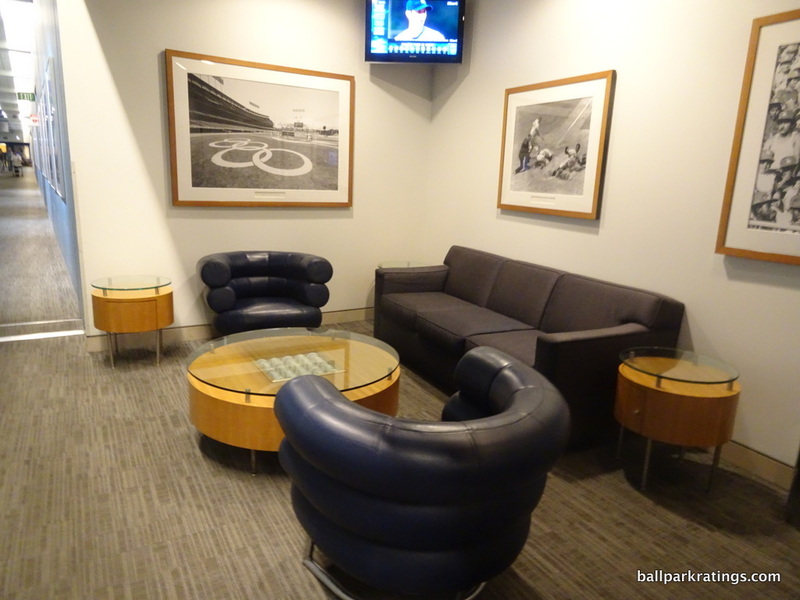 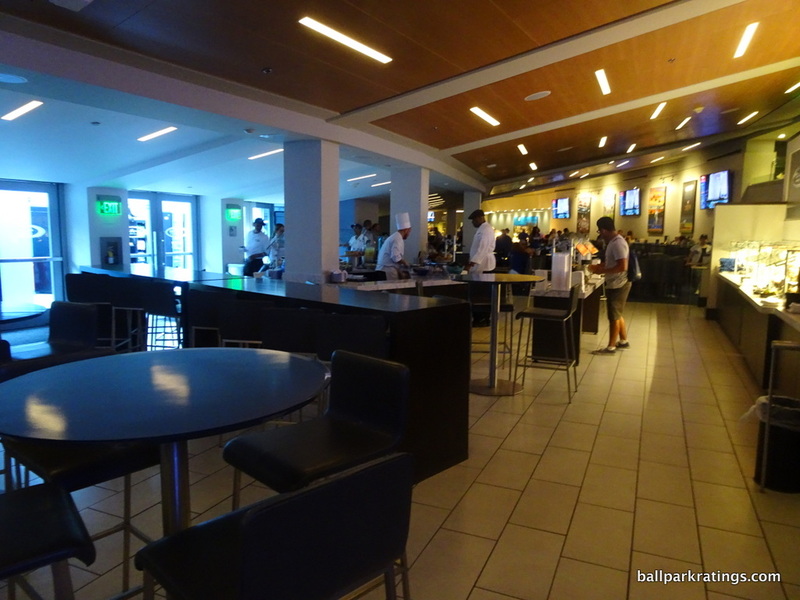 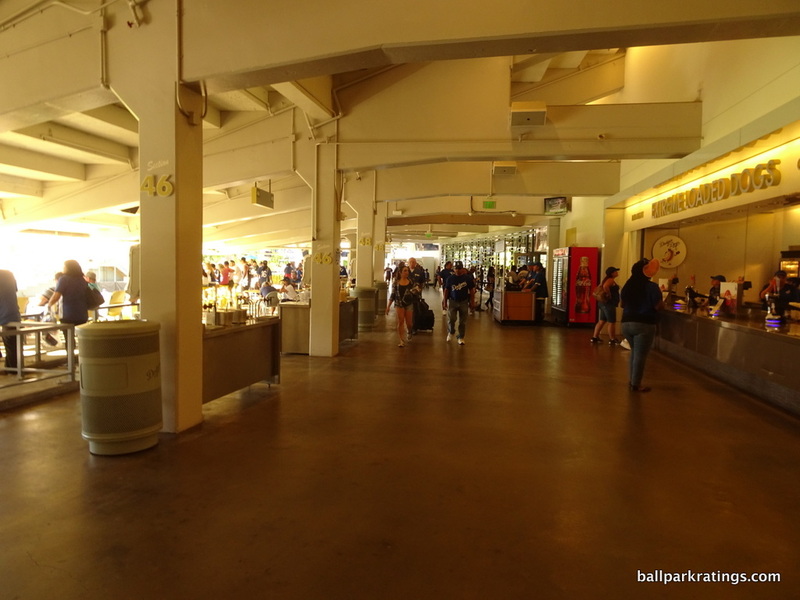 Although the concession quality can be lacking and Dodger Stadium doesn’t have social spaces of most other parks (despite improvements), the premium seating meets industry standards. 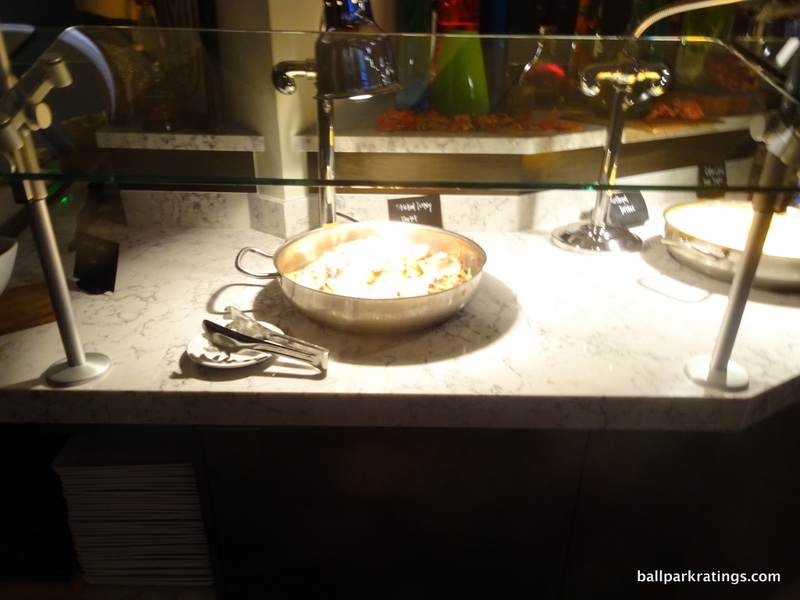 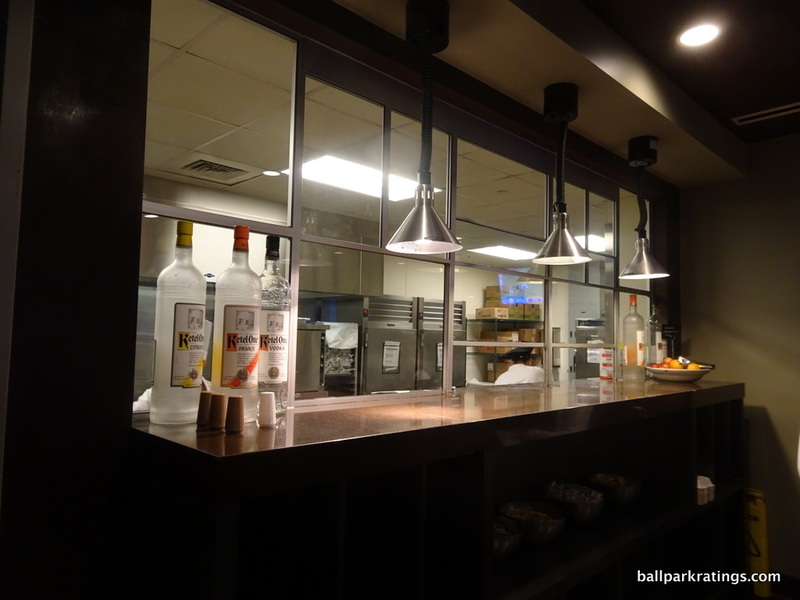 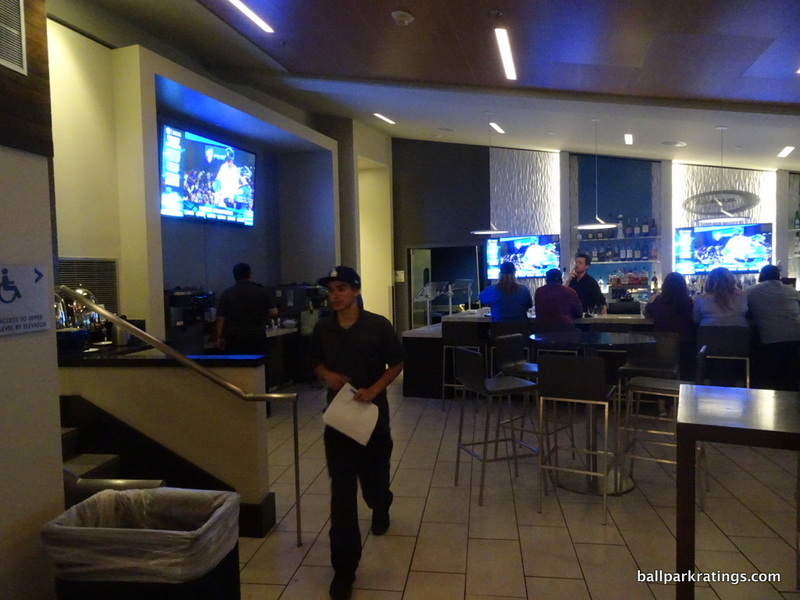 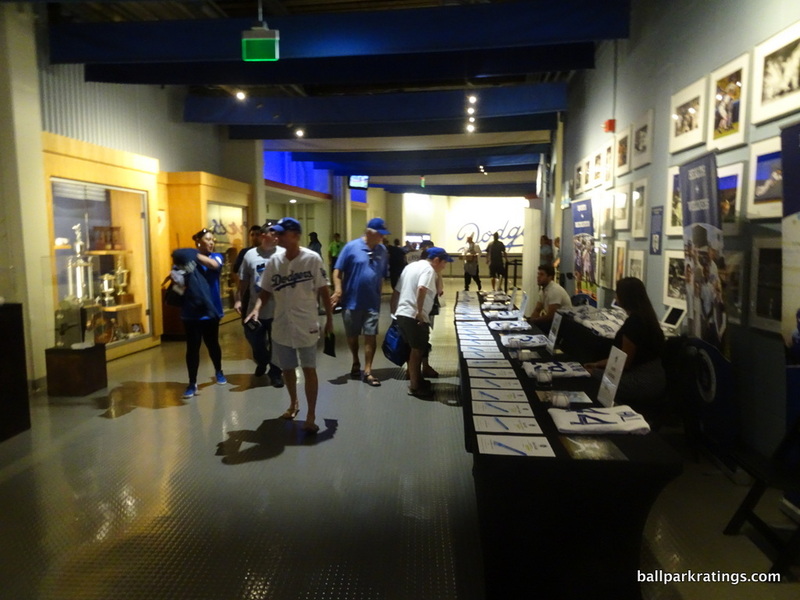 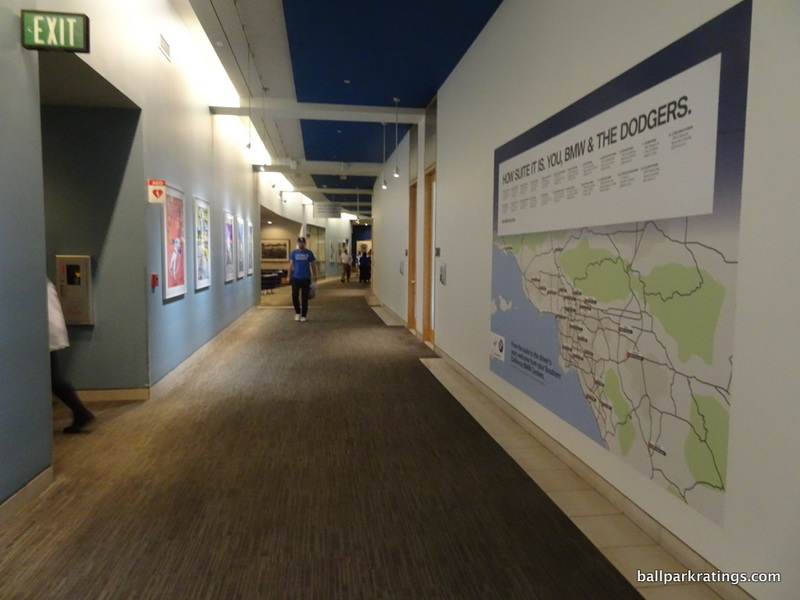 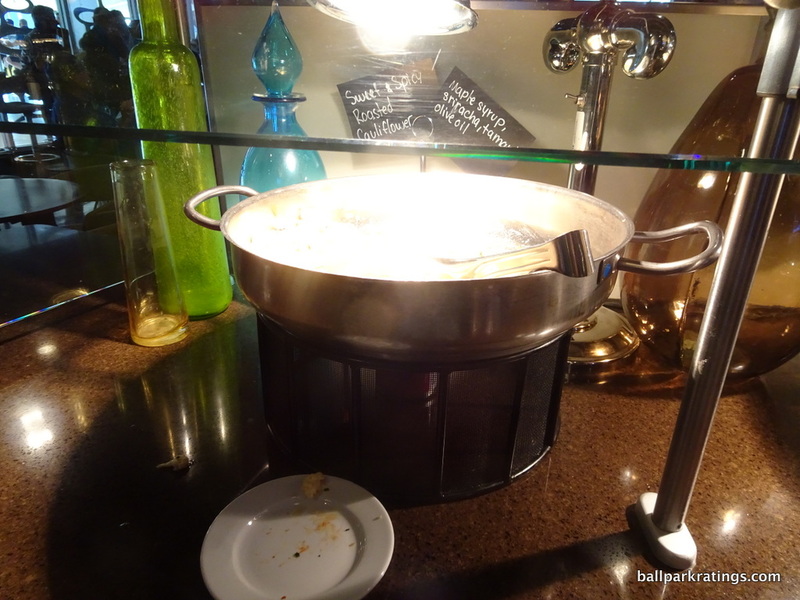 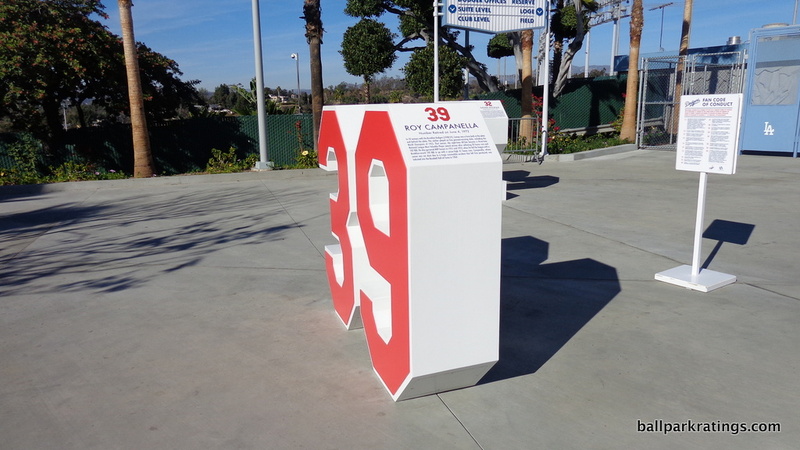 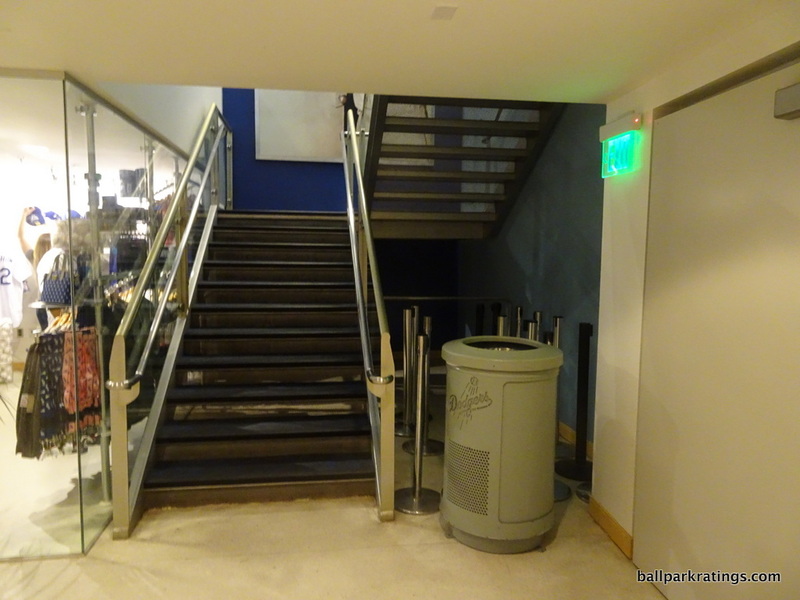 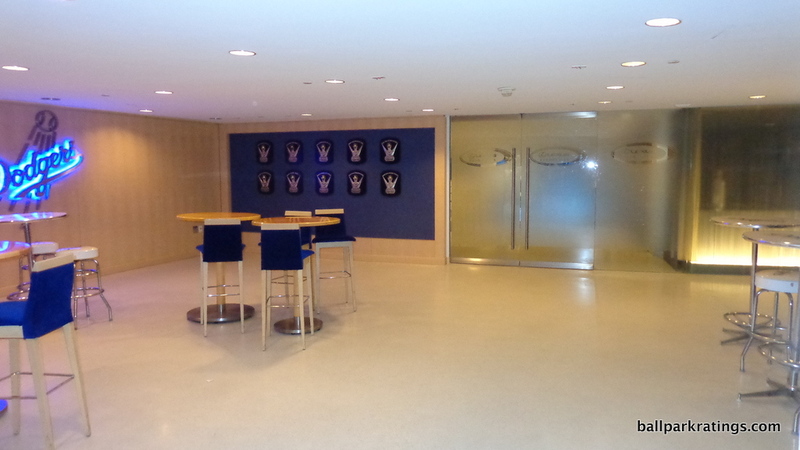 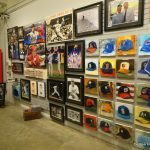 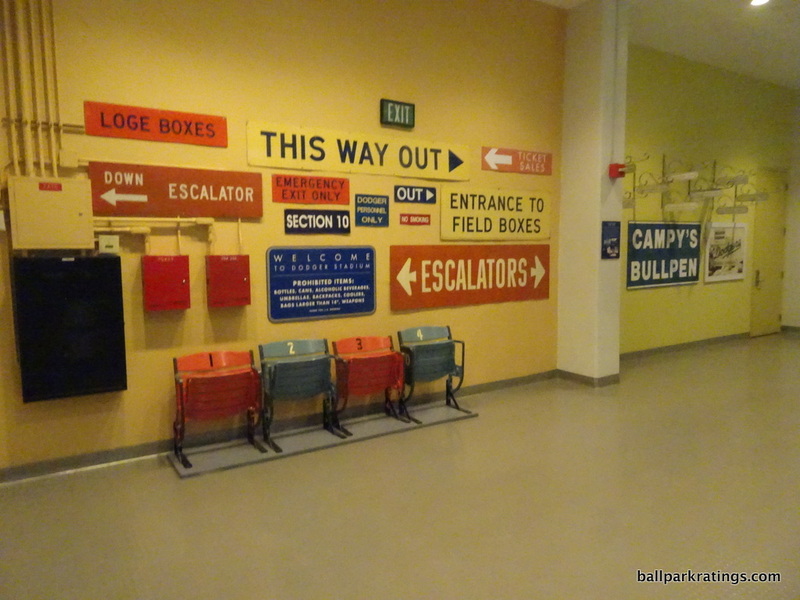 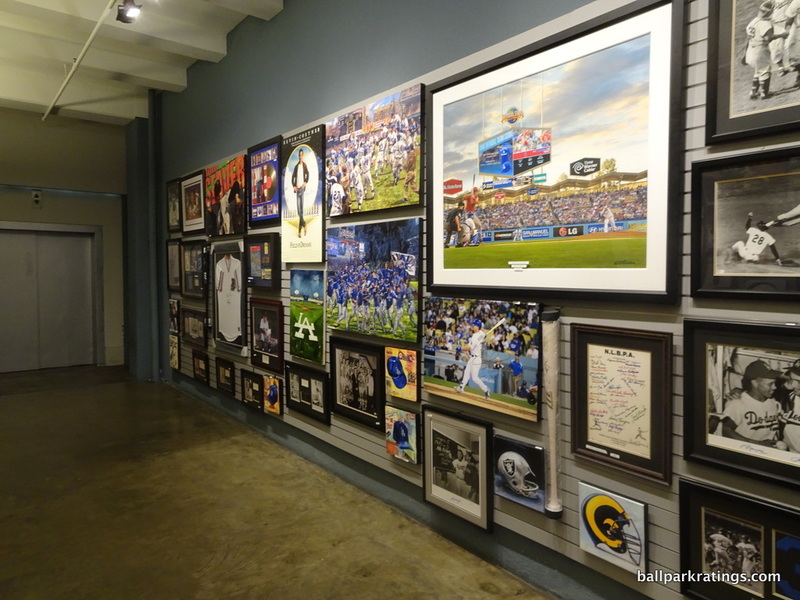 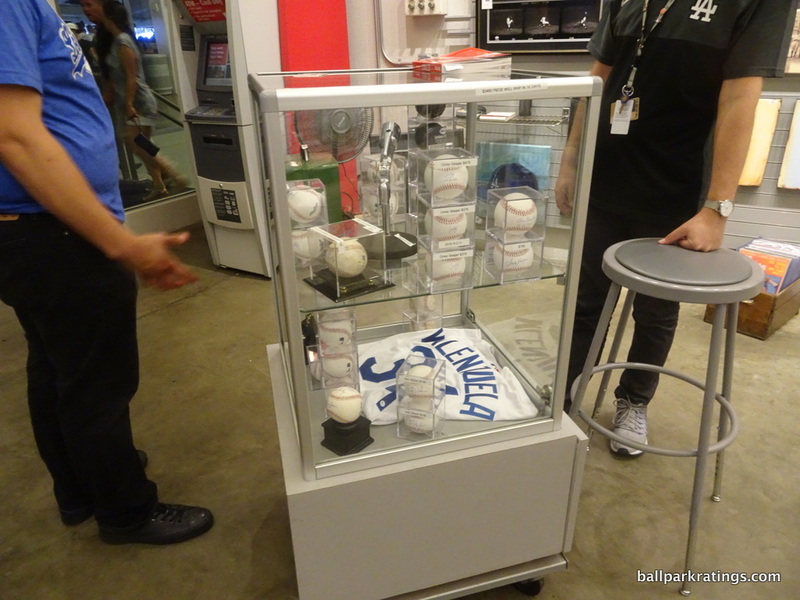 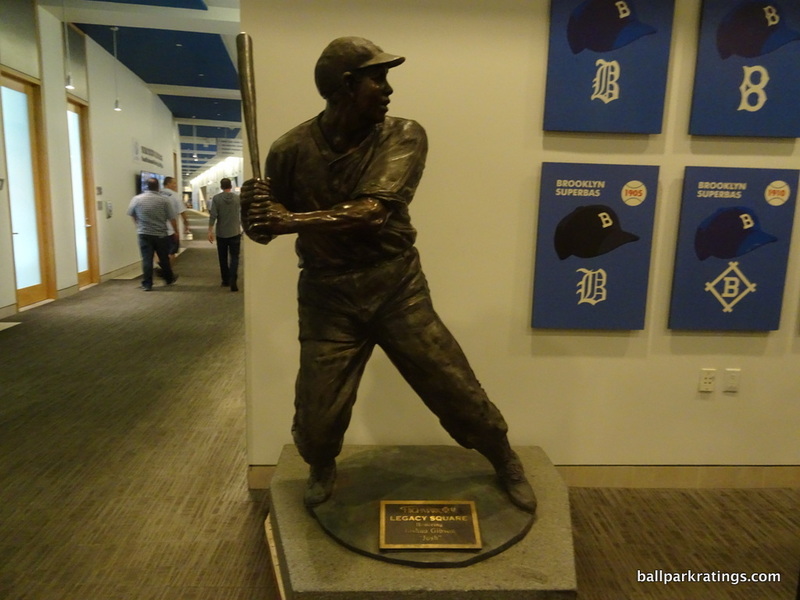 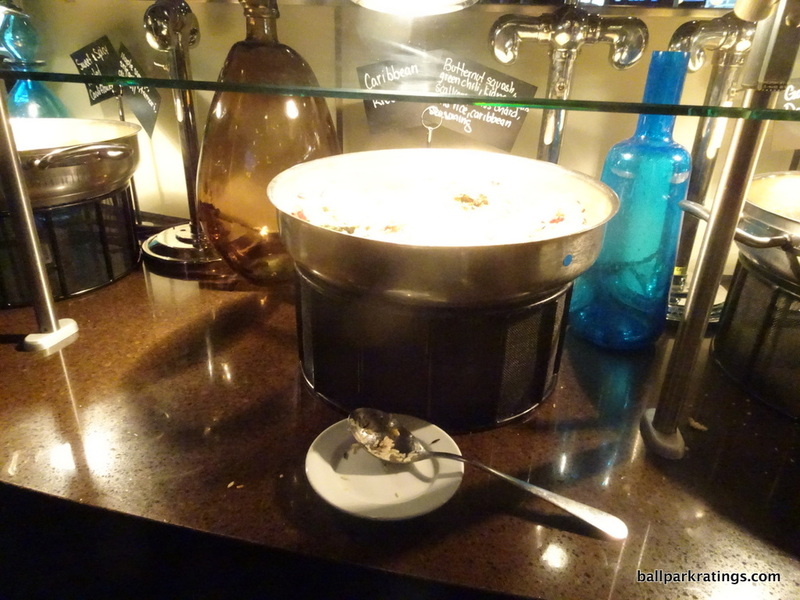 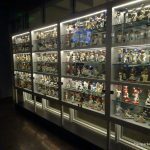 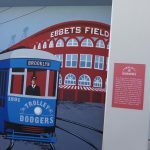 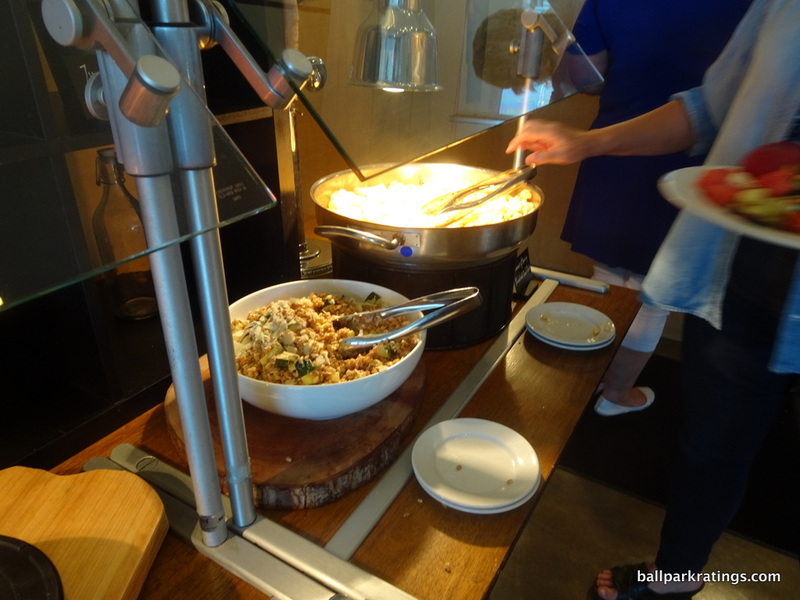 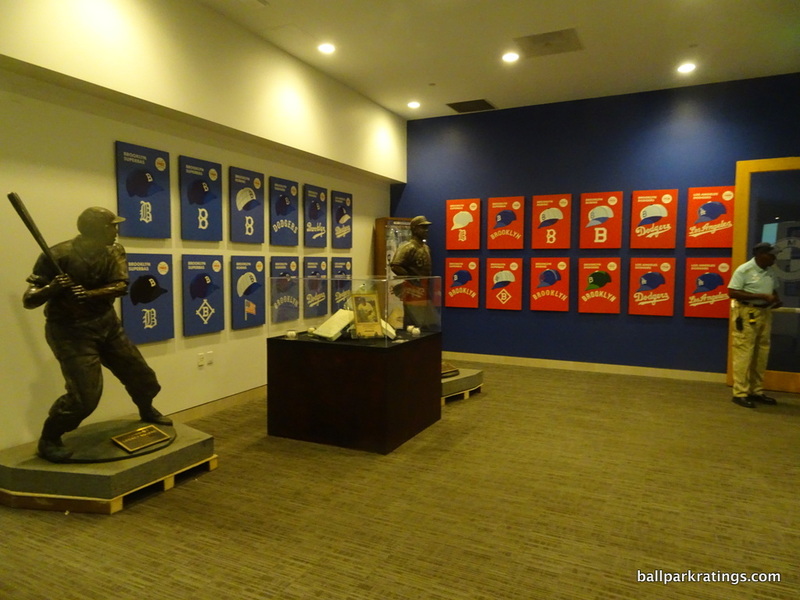 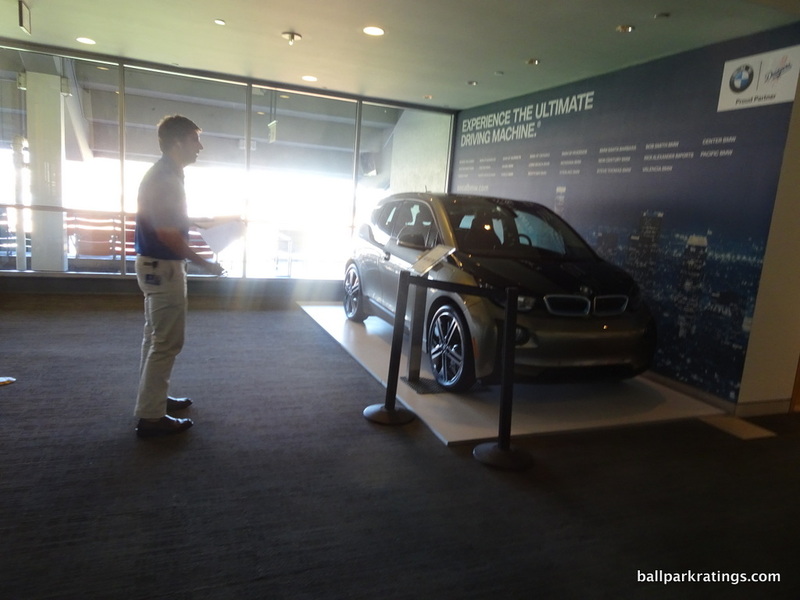 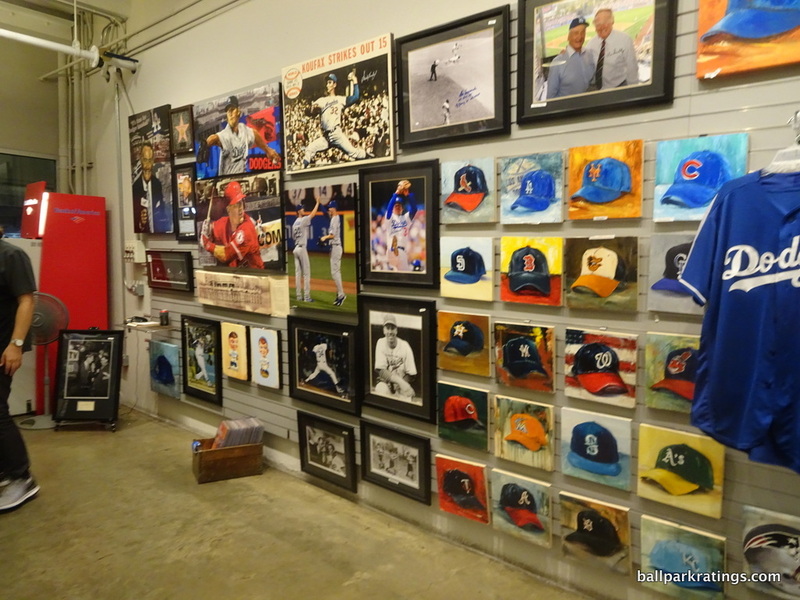 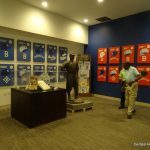 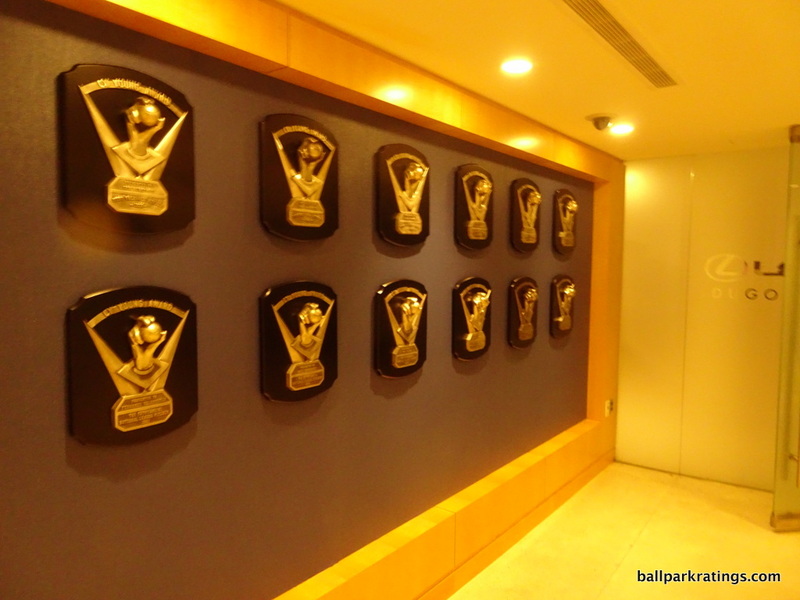 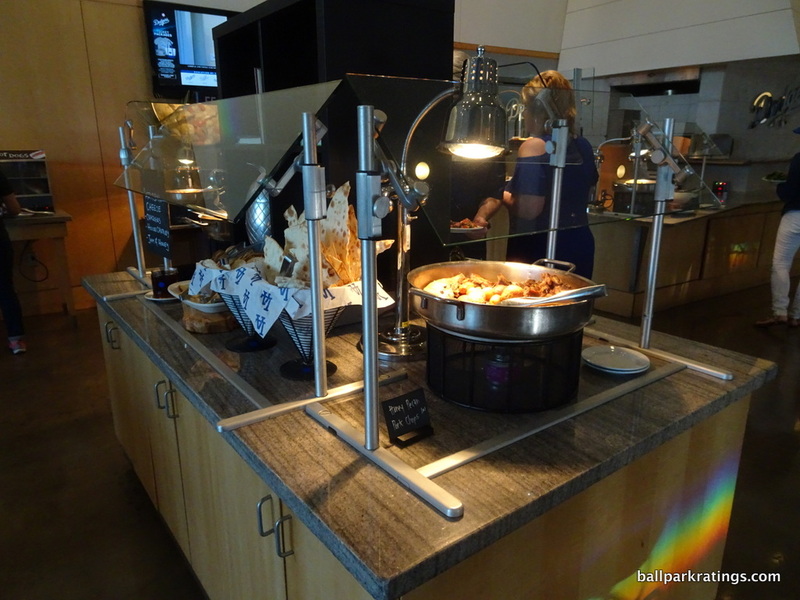 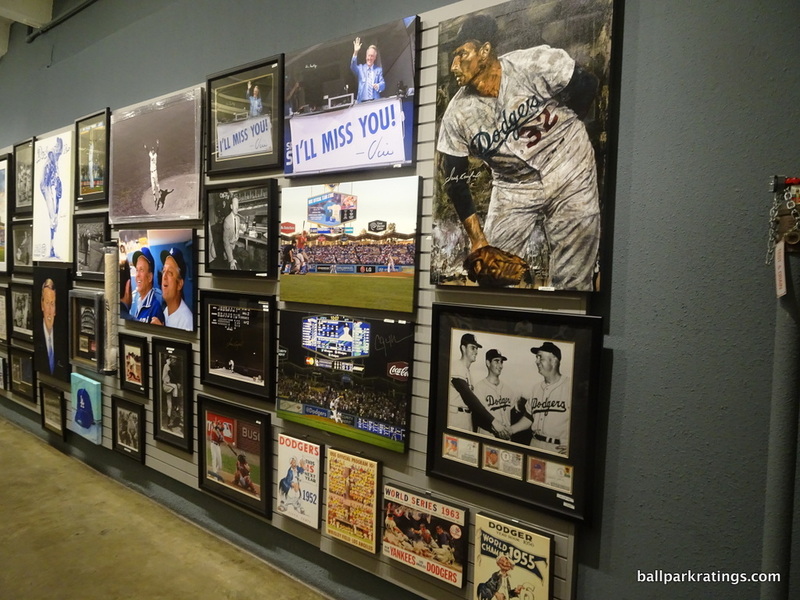 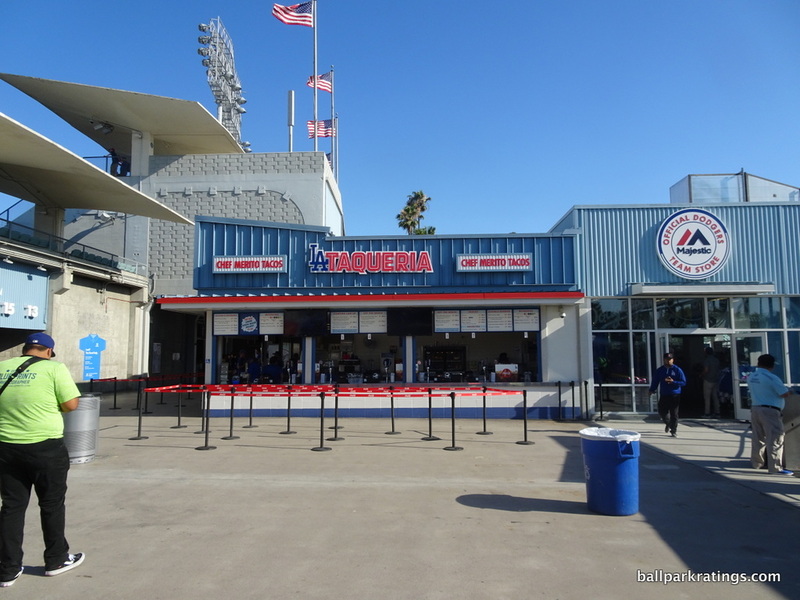 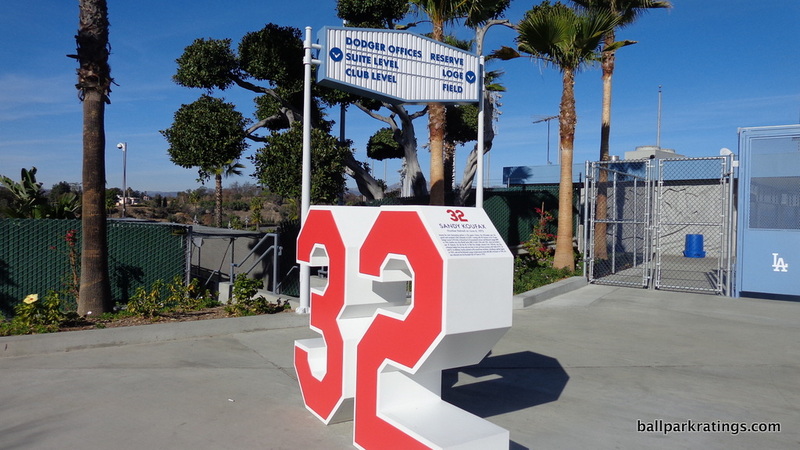 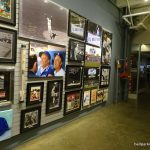 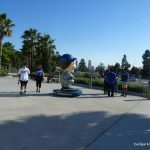 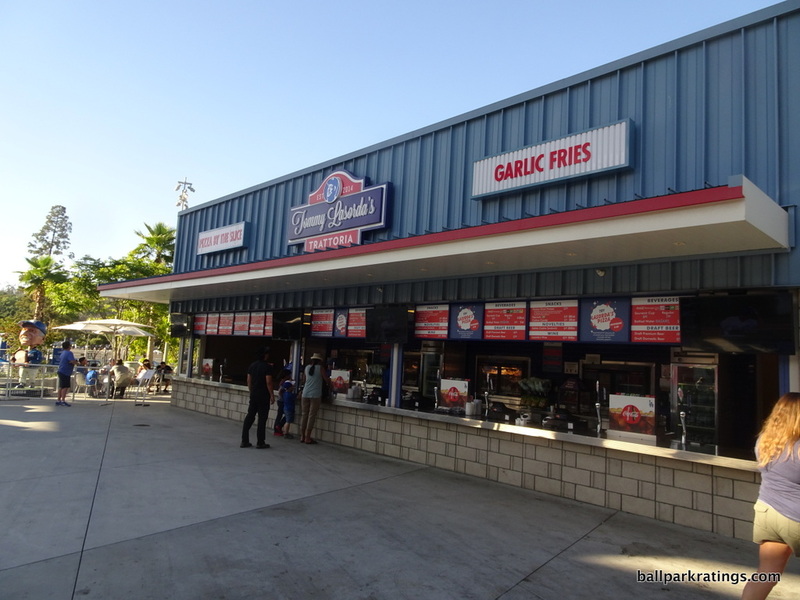 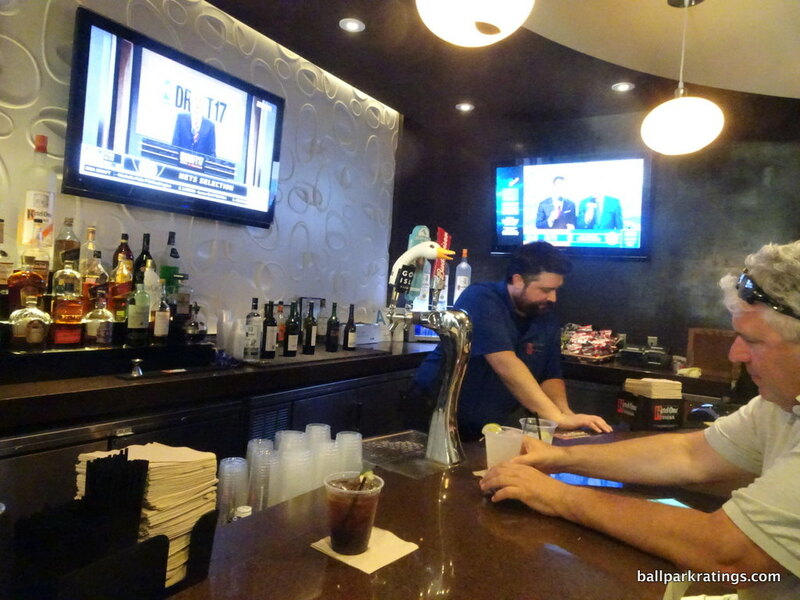 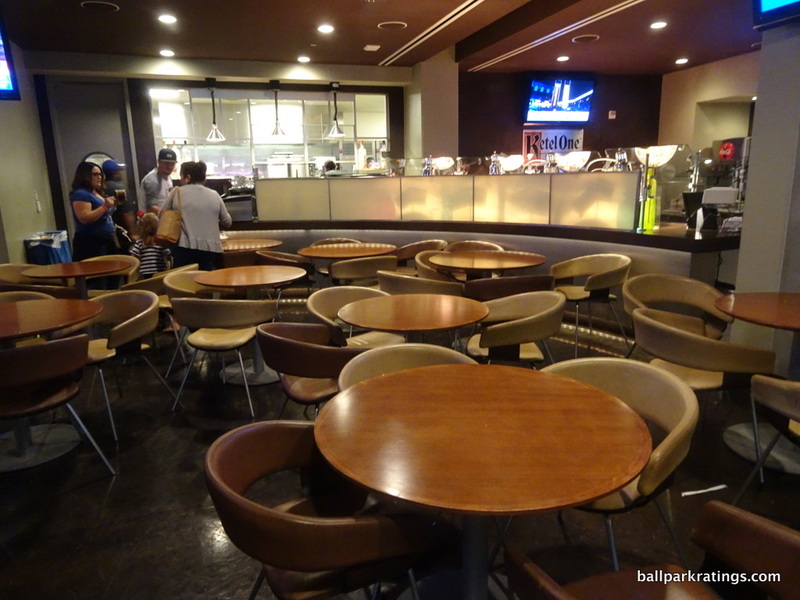 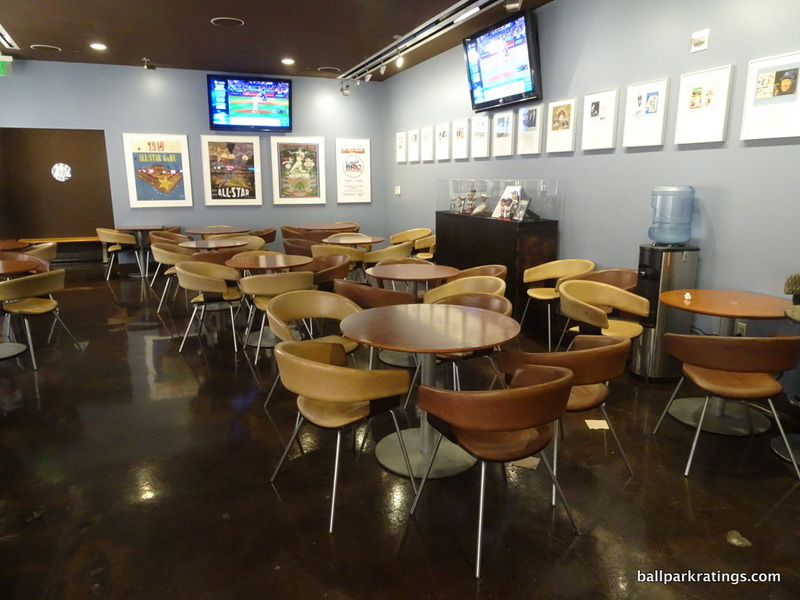 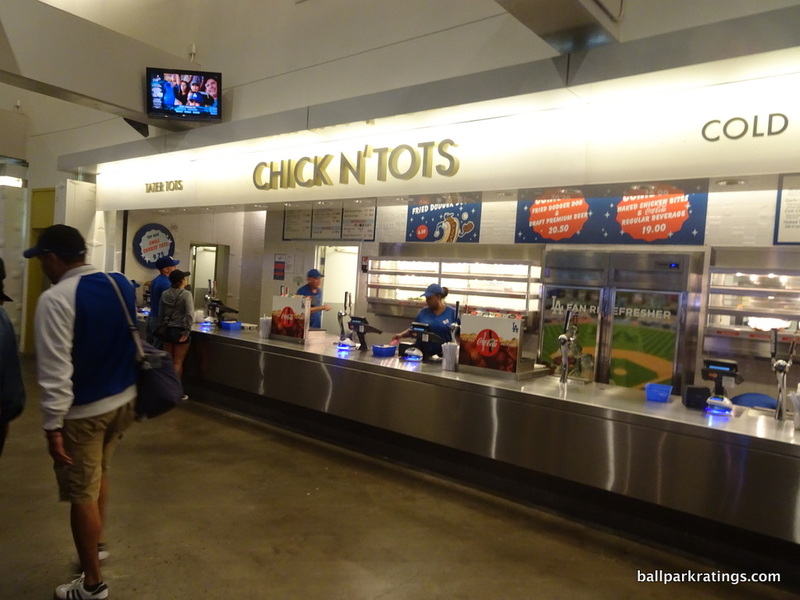 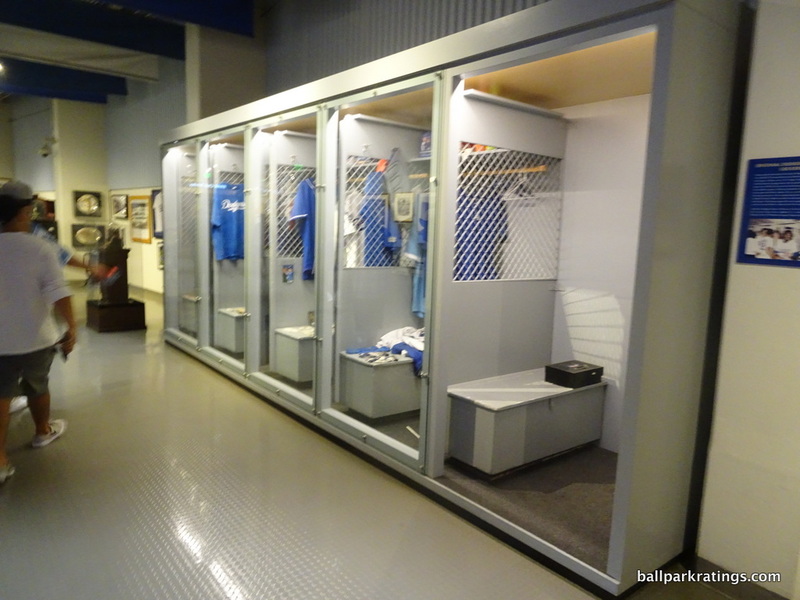 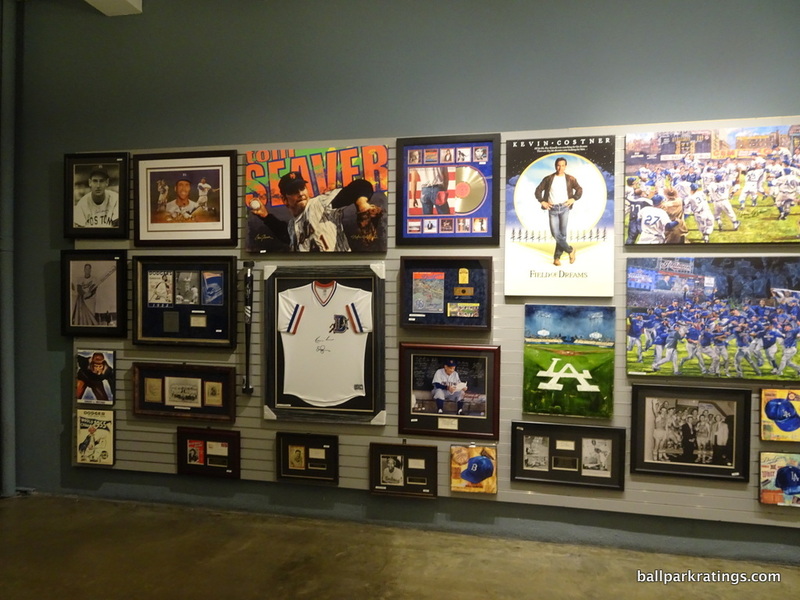 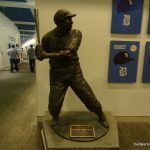 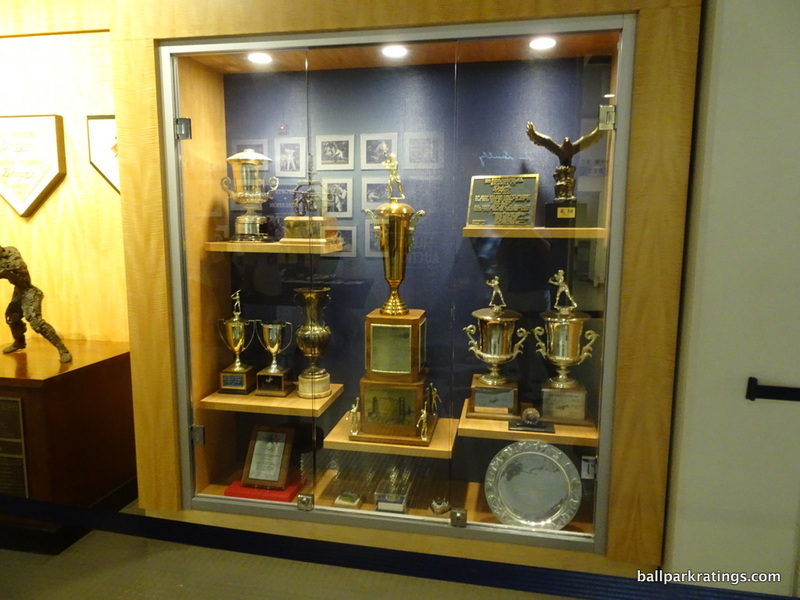 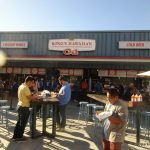 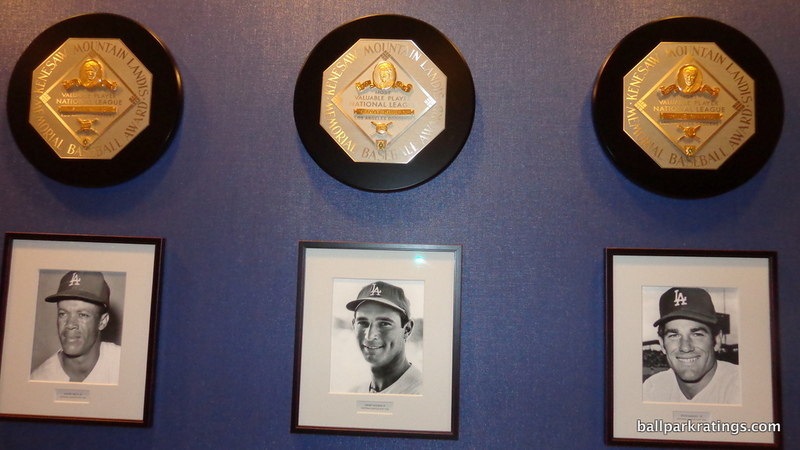 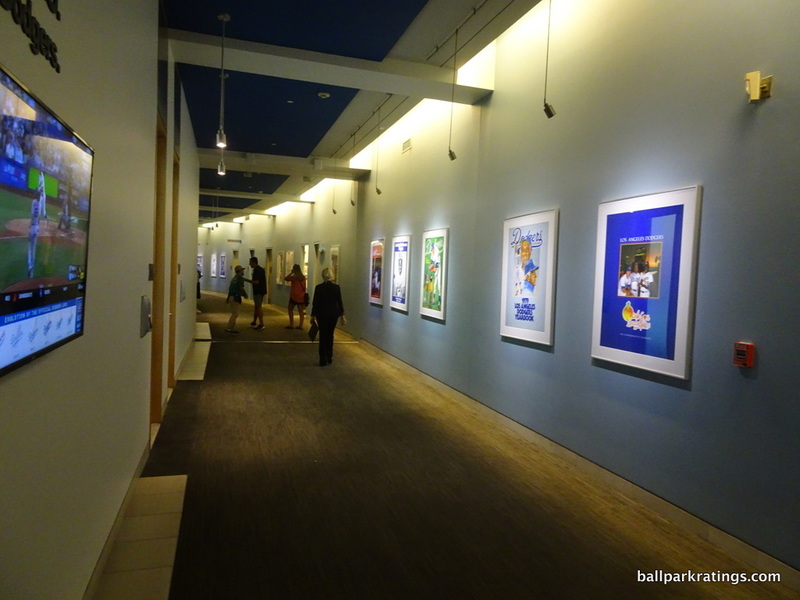 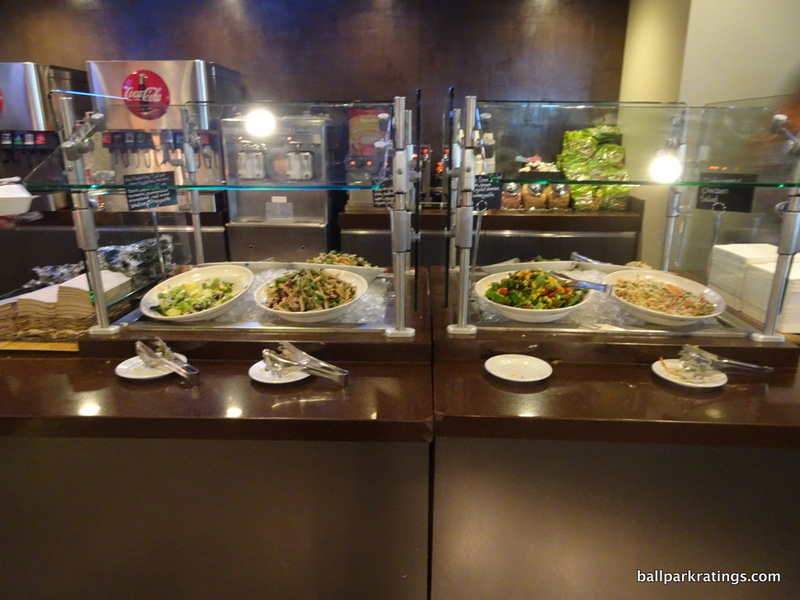 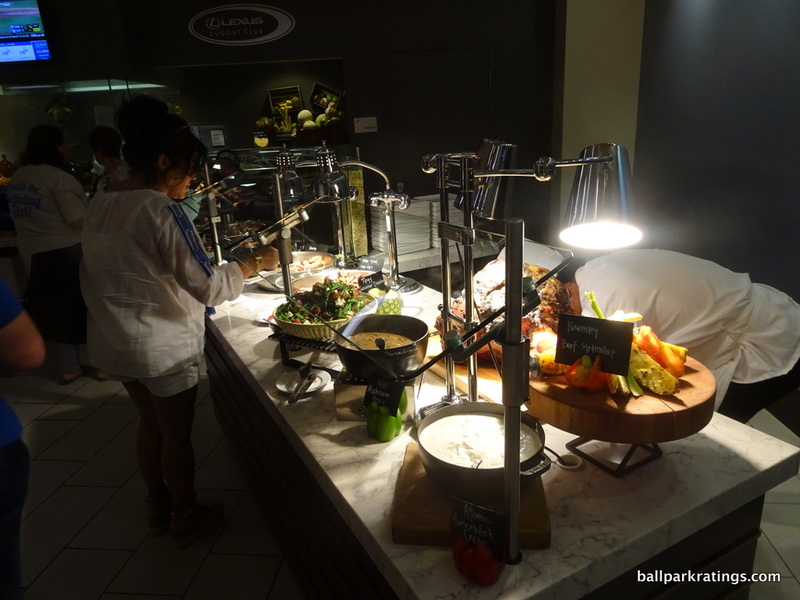 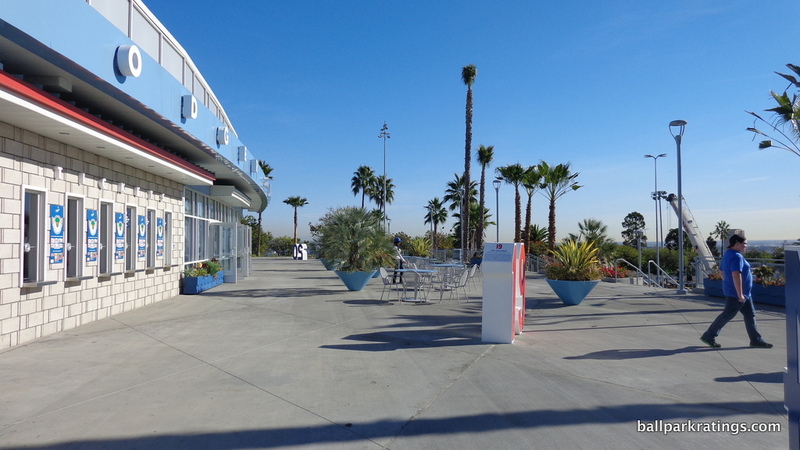 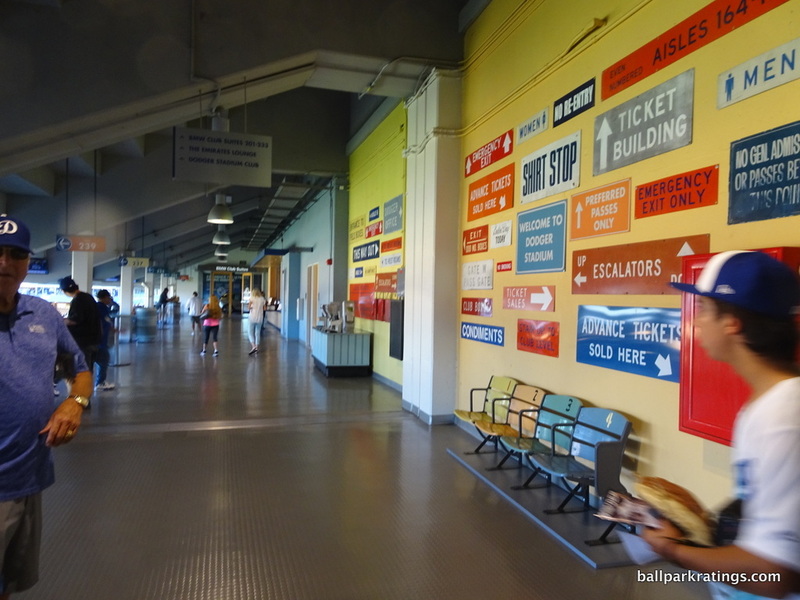 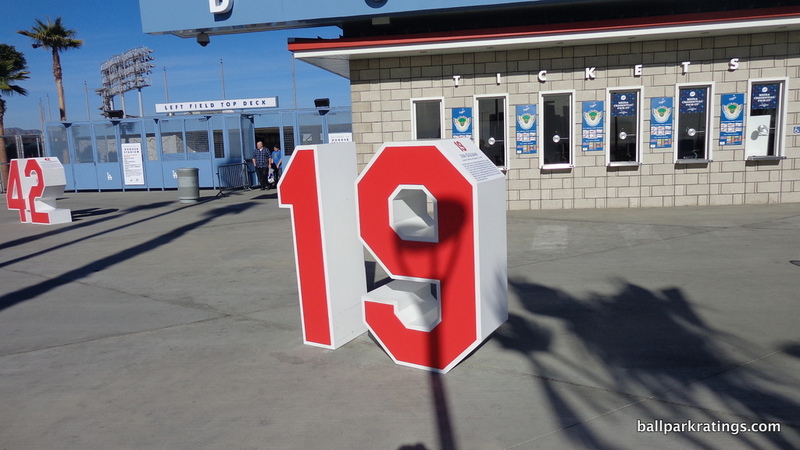 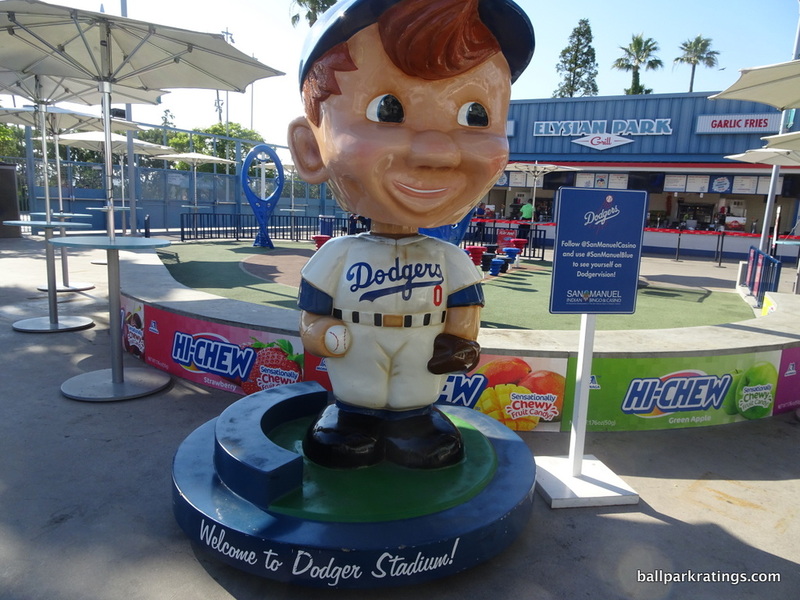 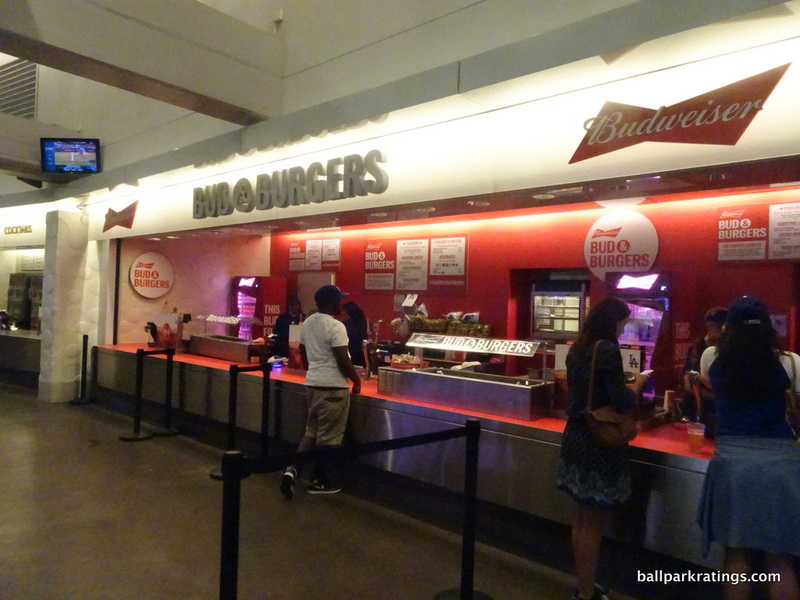 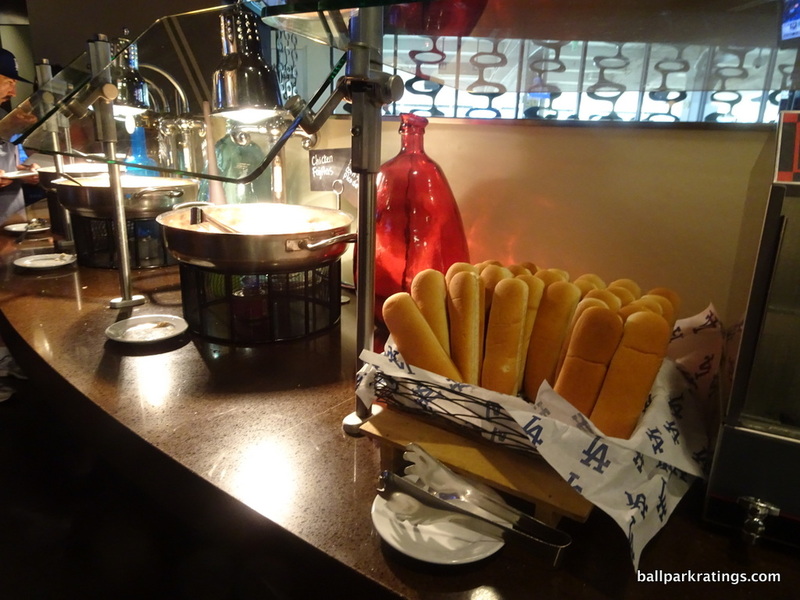 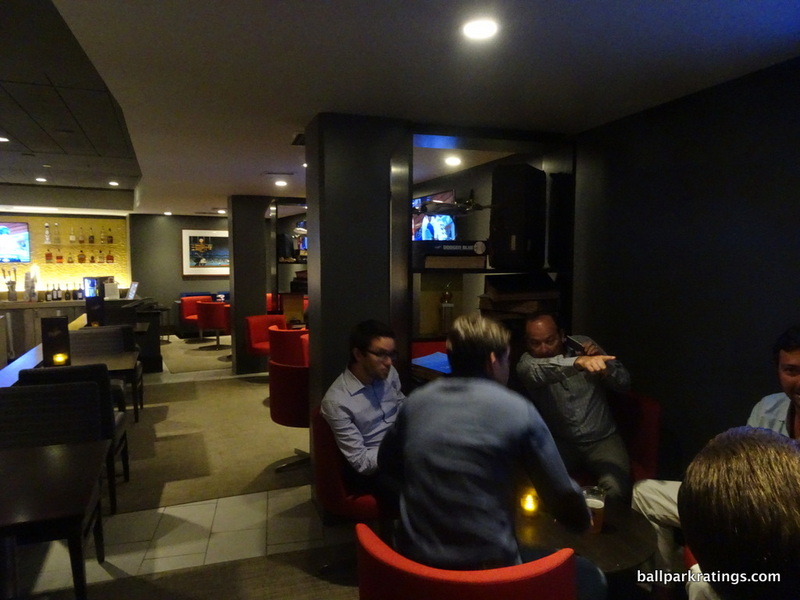 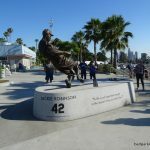 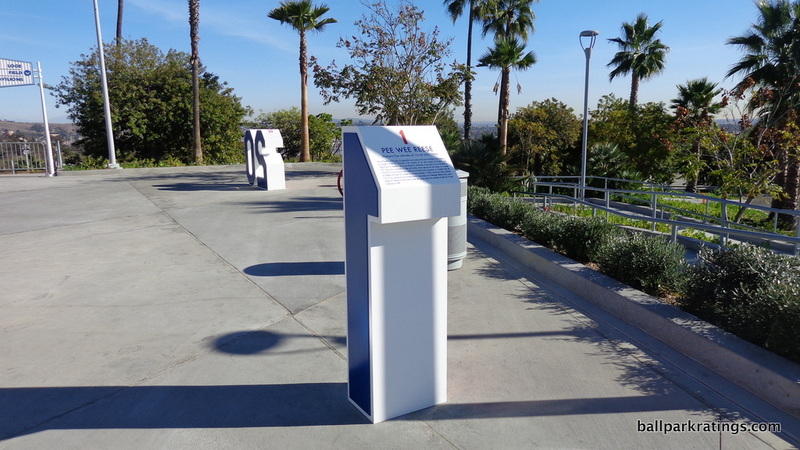 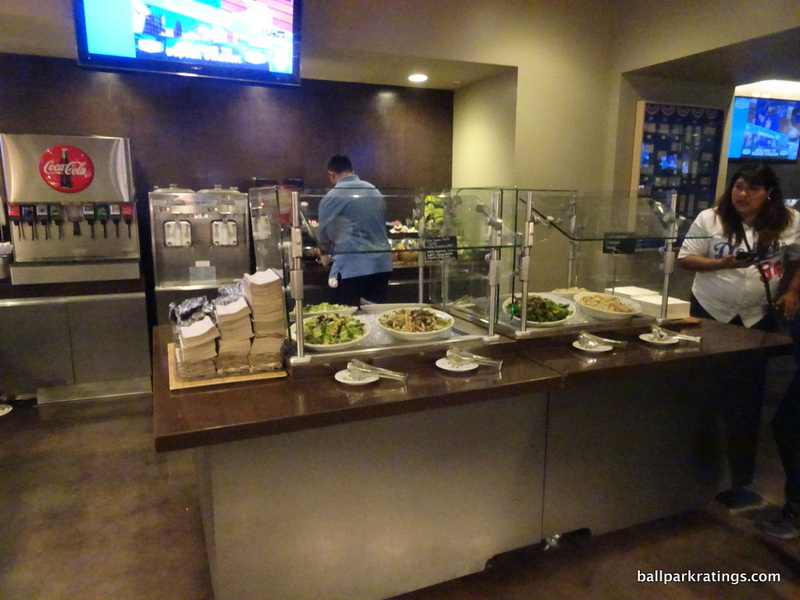 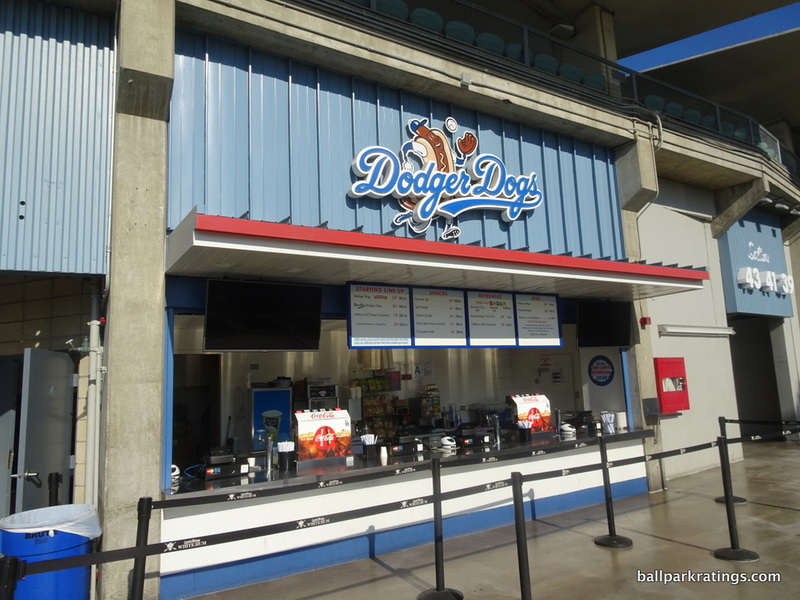 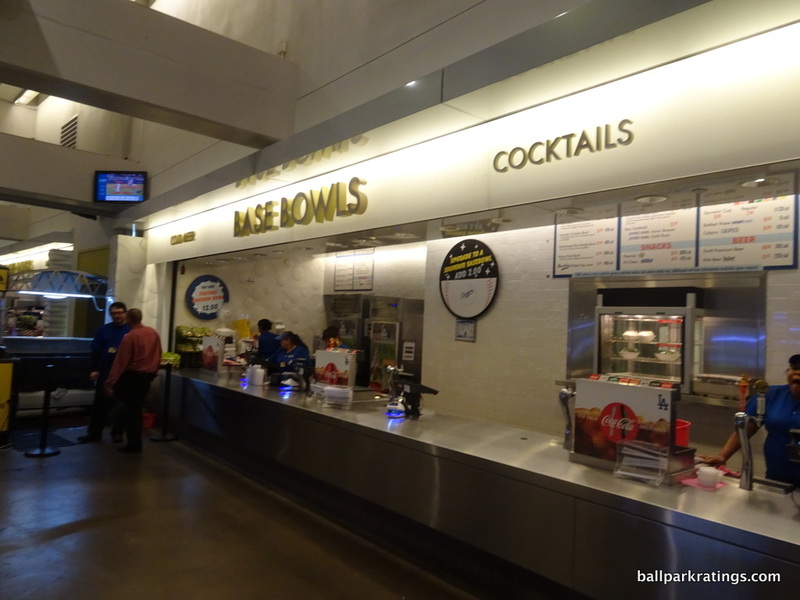 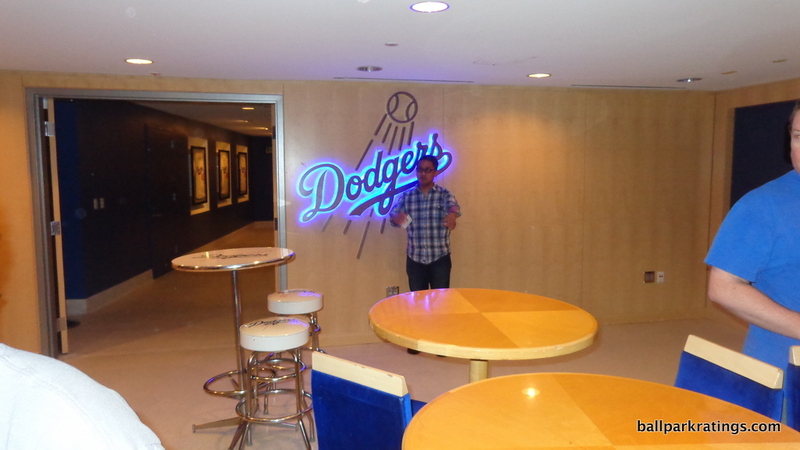 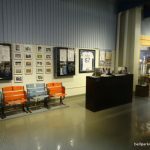 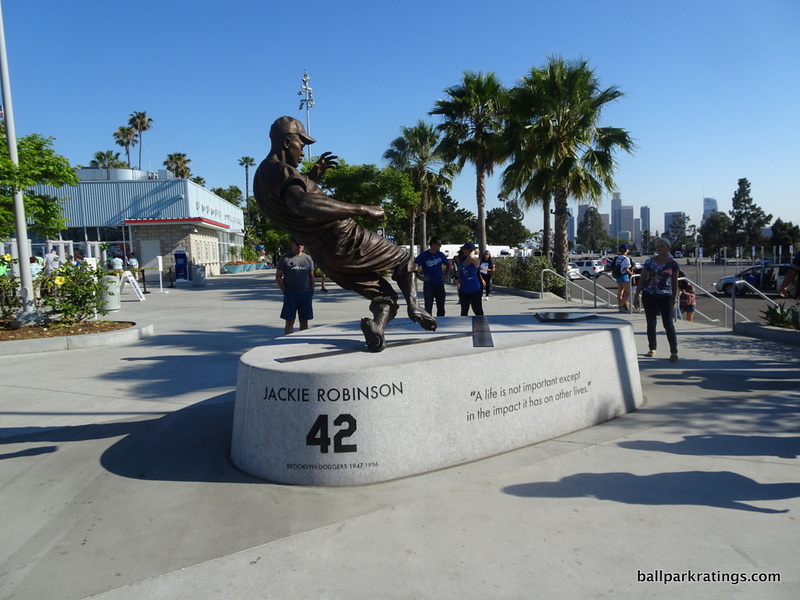 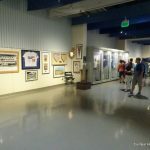 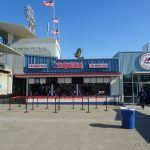 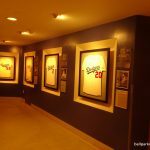 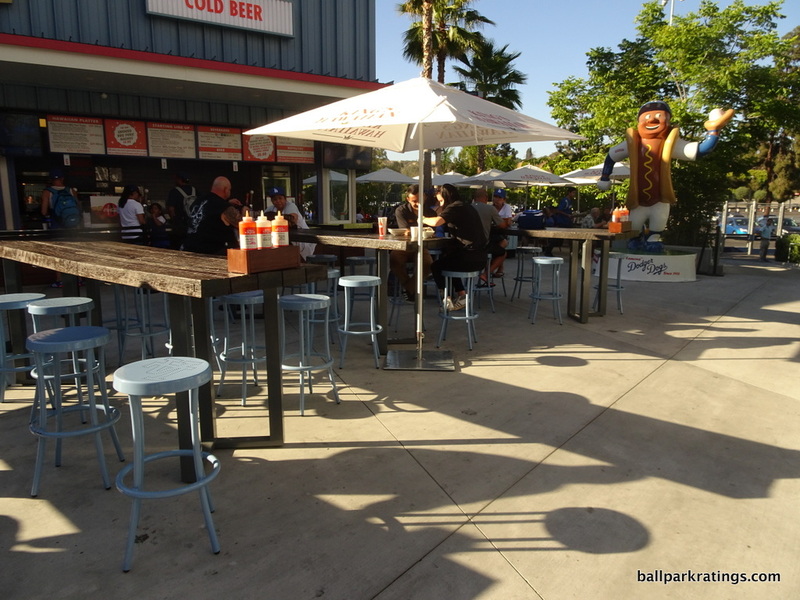 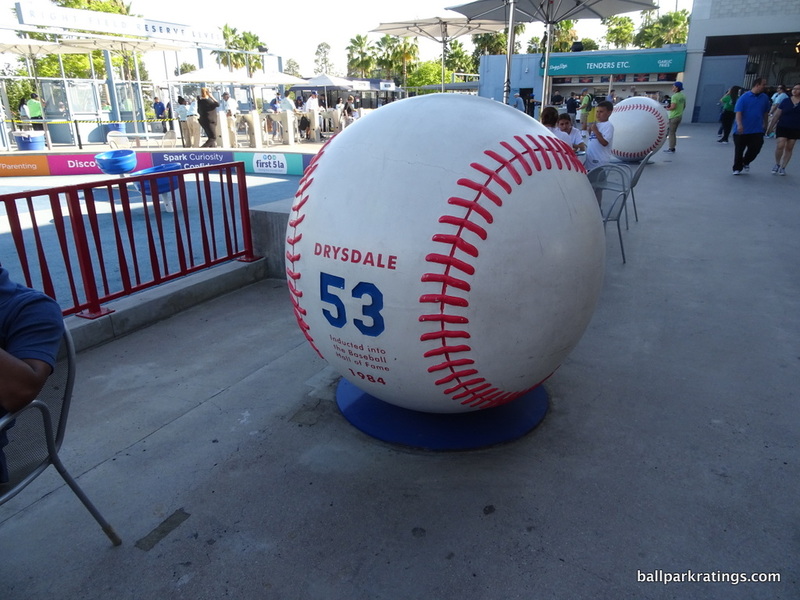 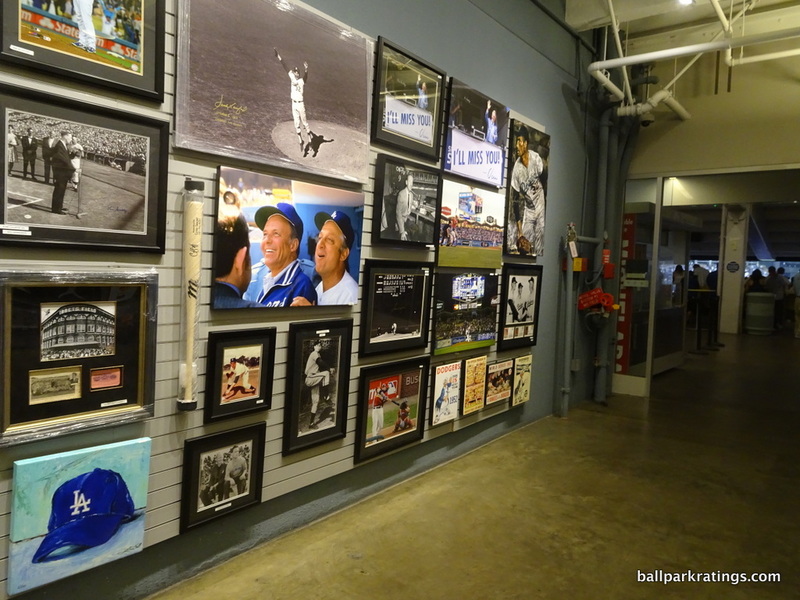 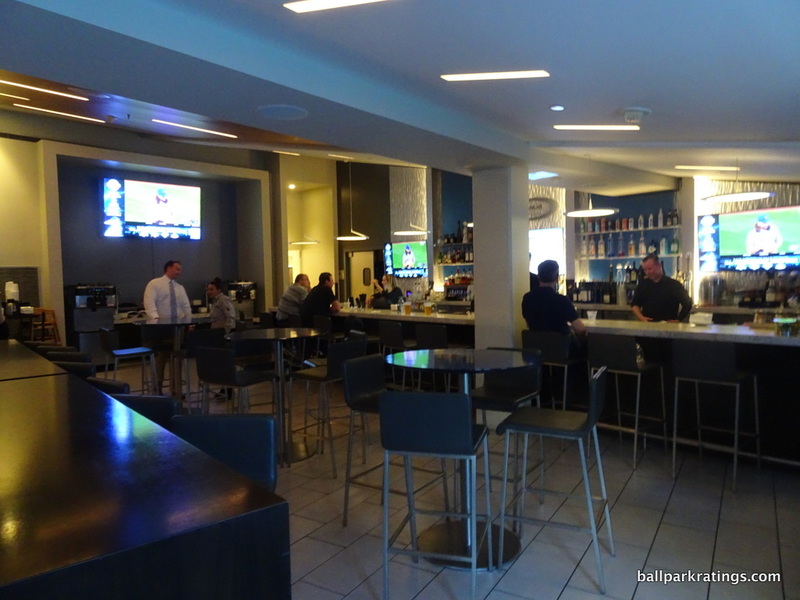 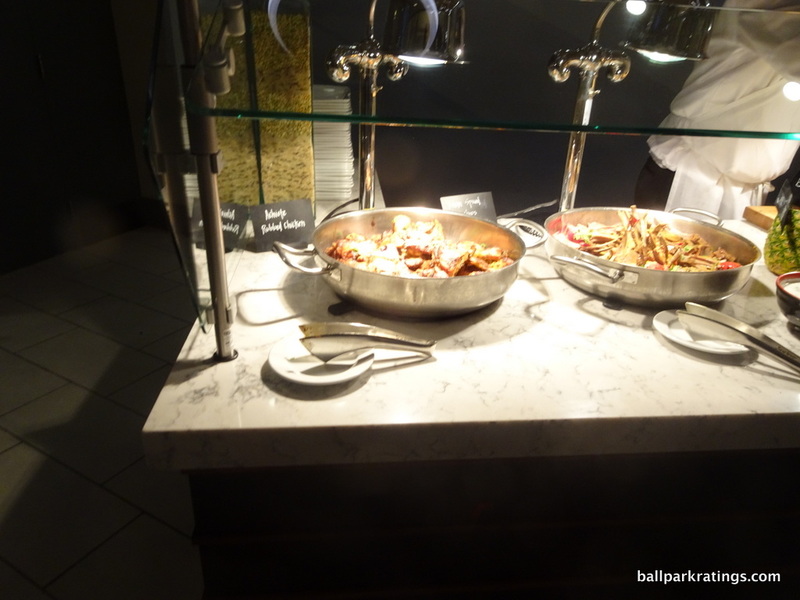 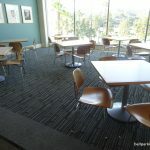 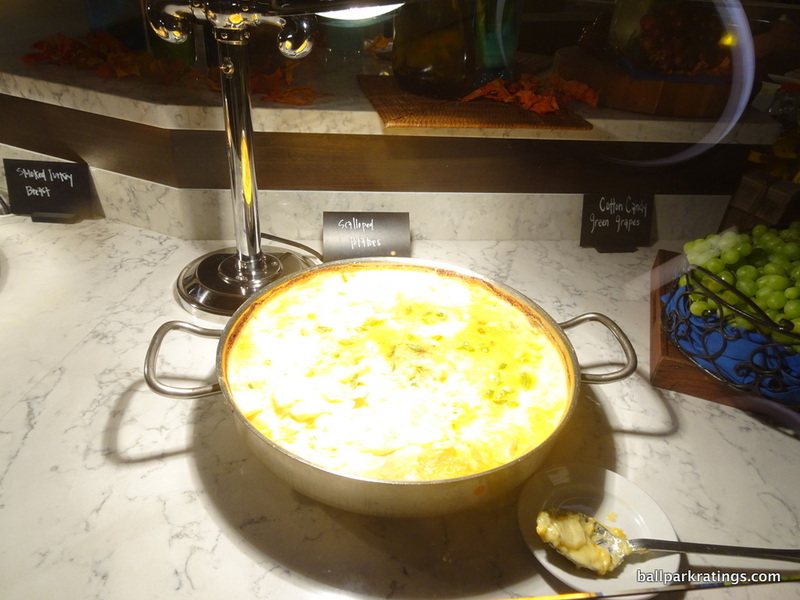 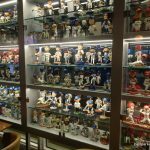 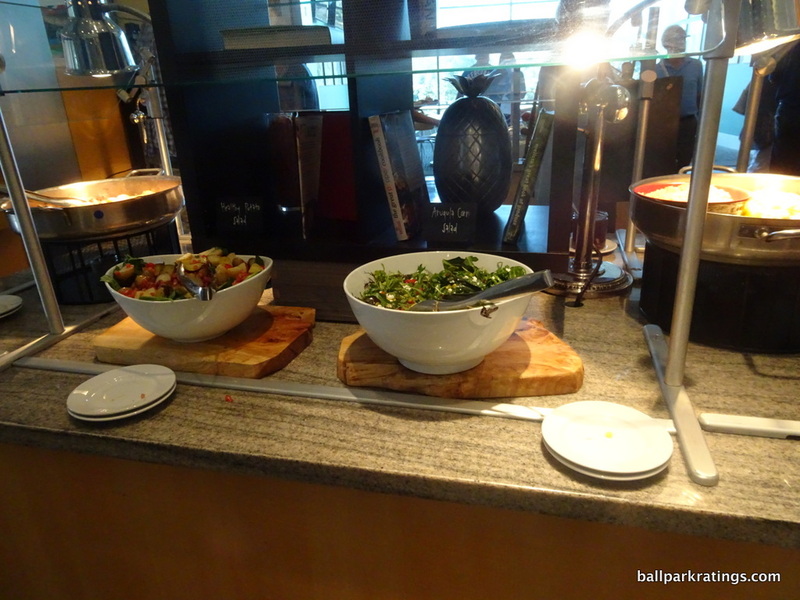 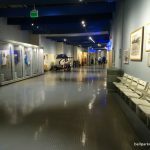 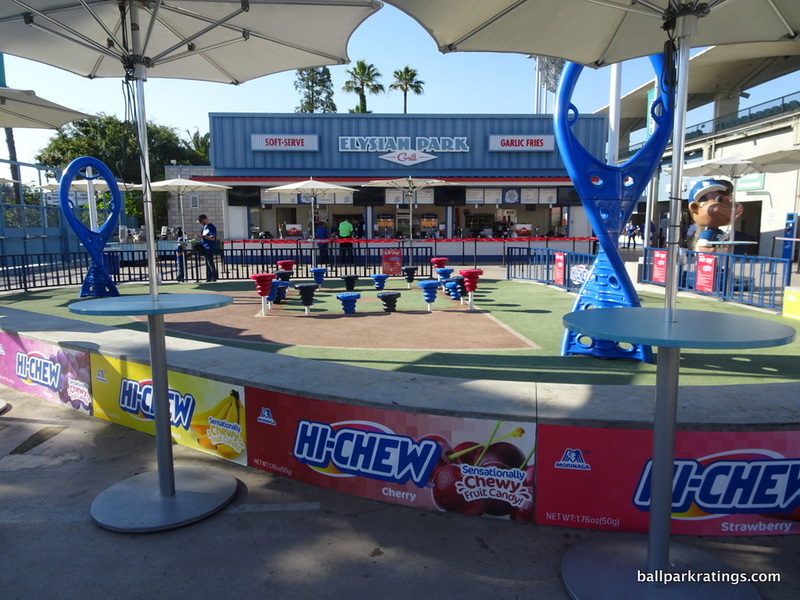 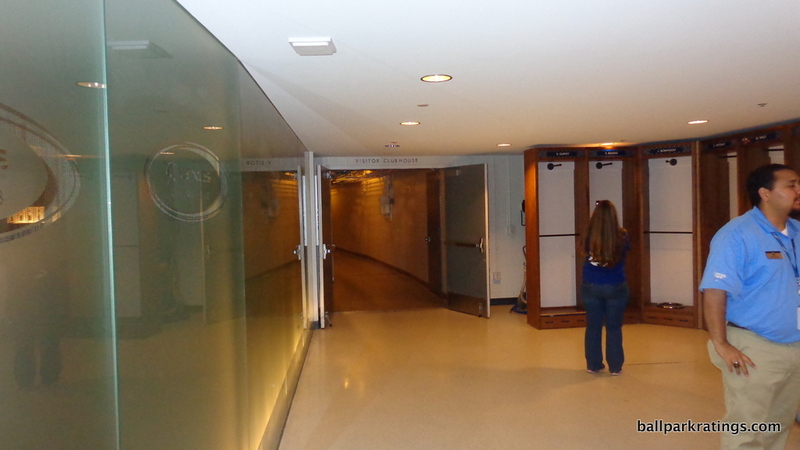 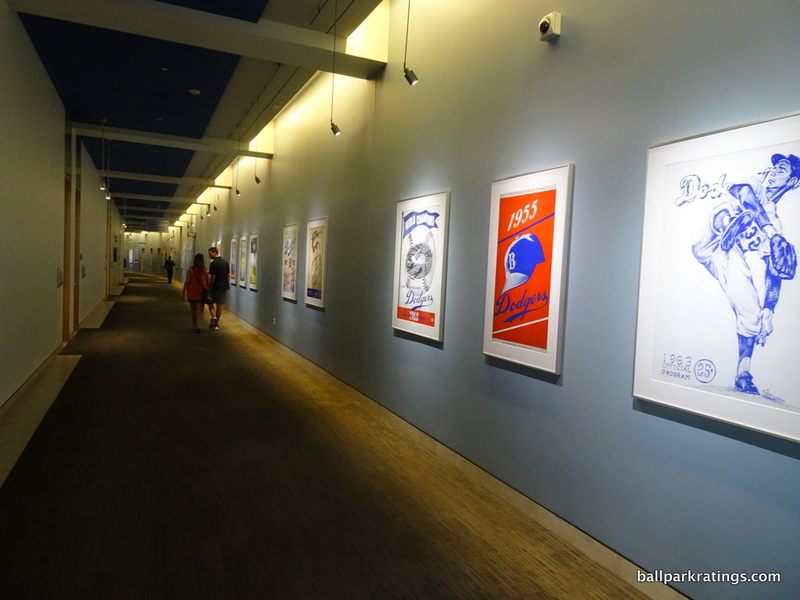 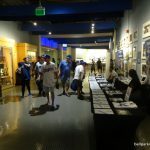 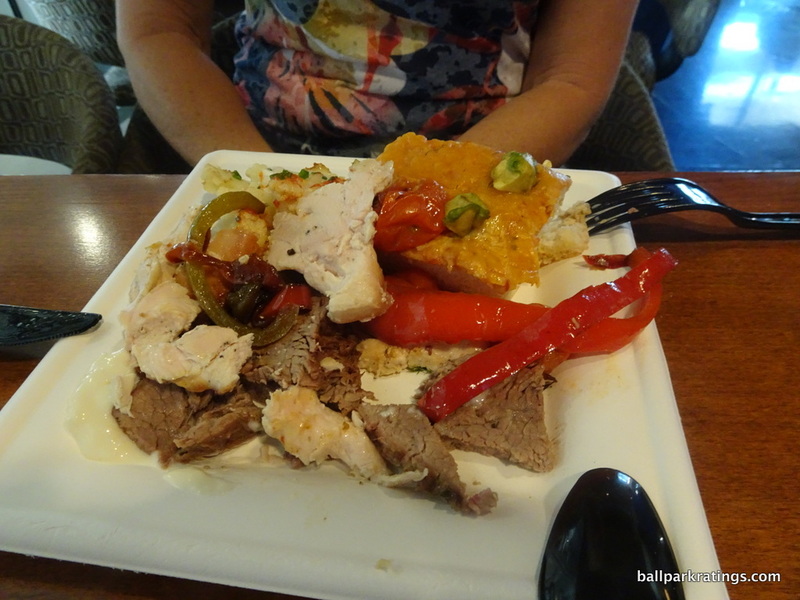 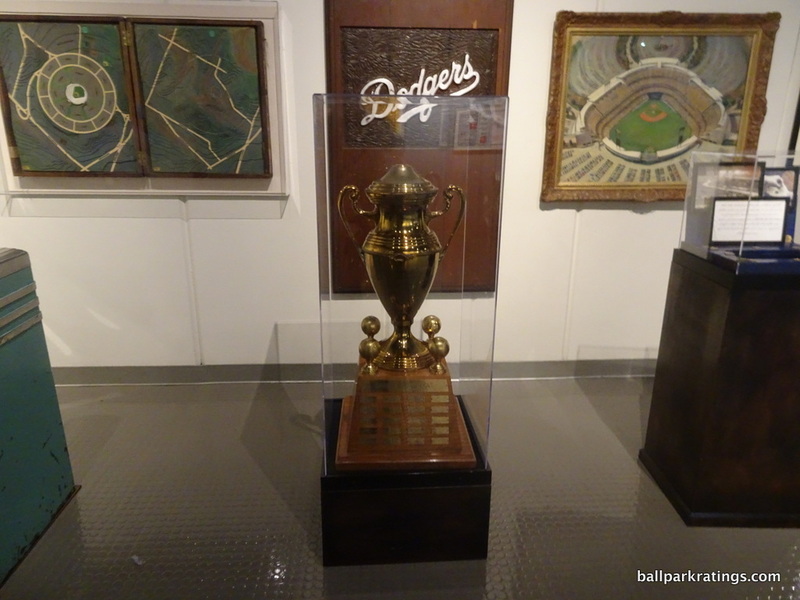 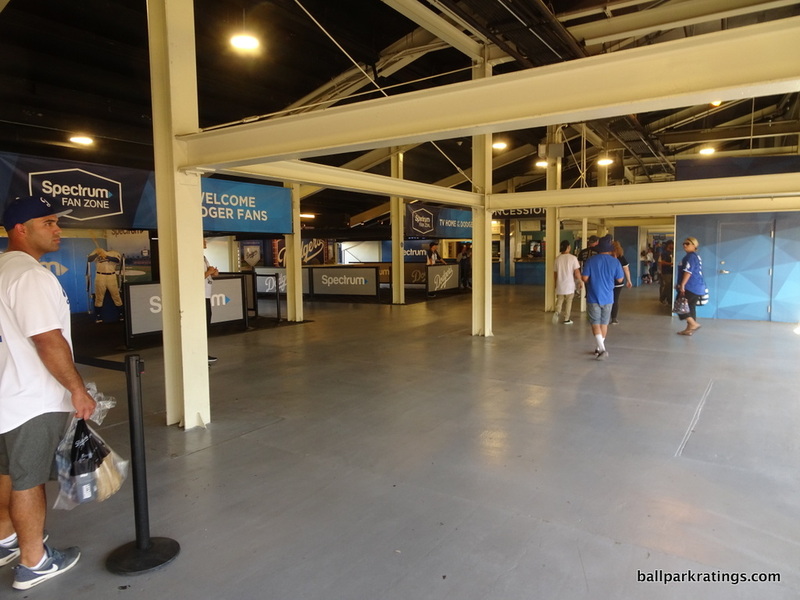 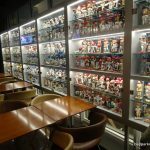 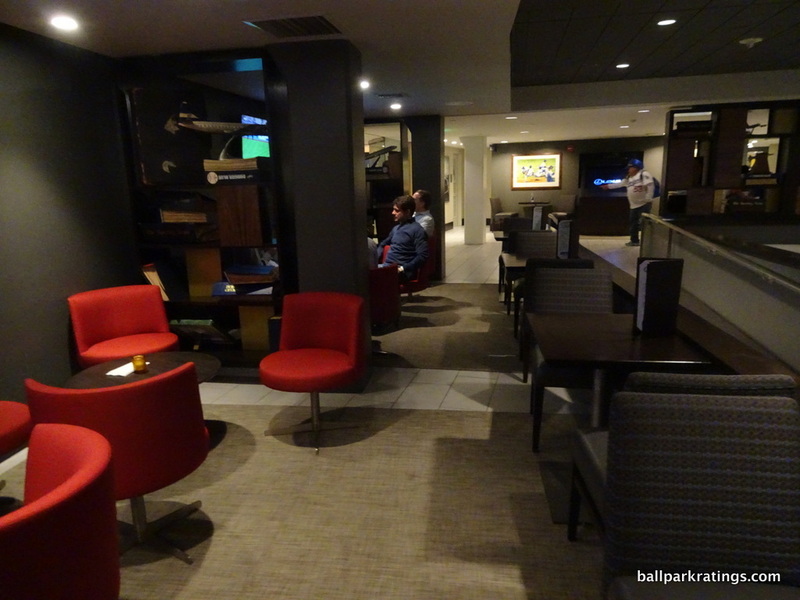 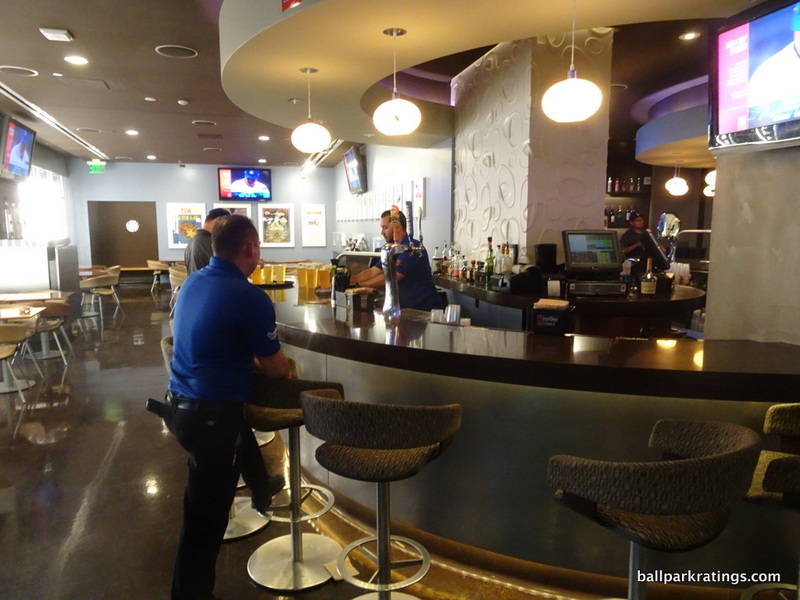 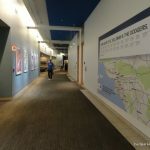 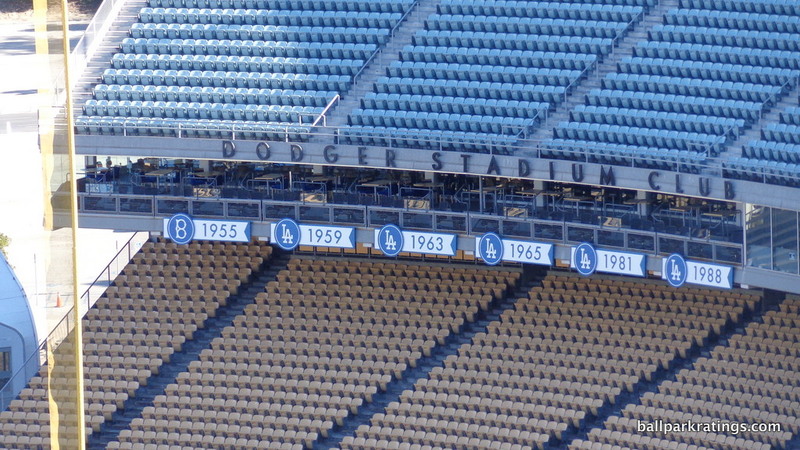 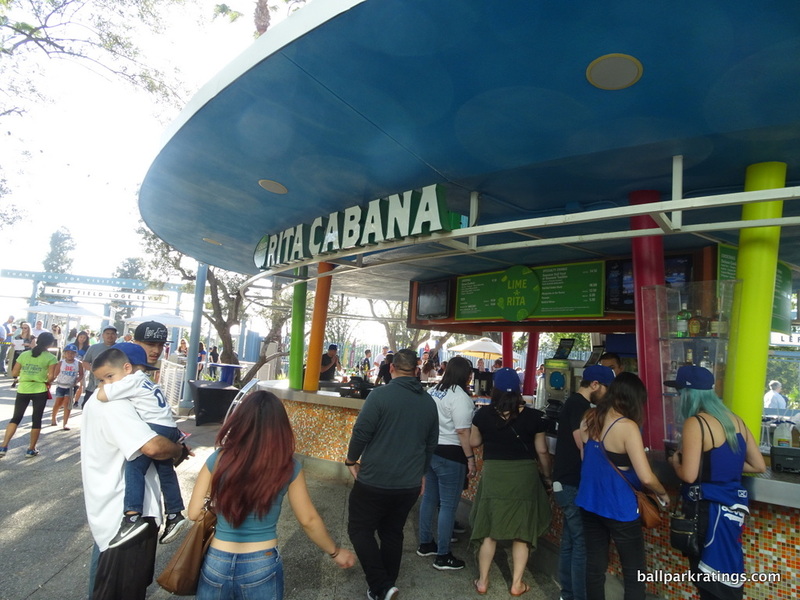 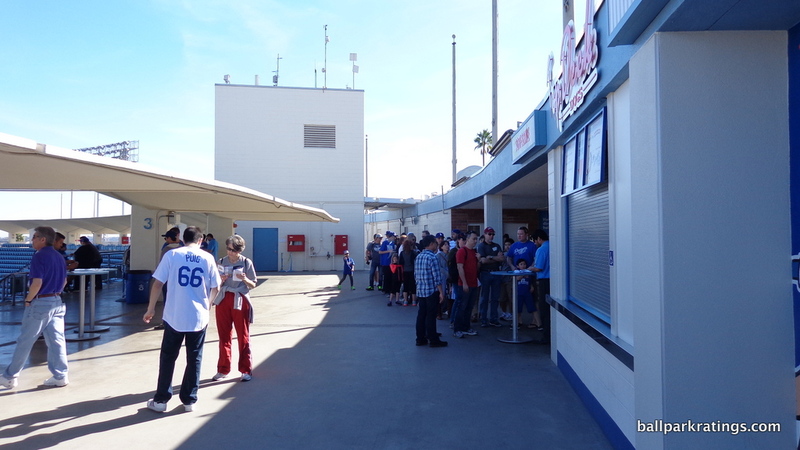 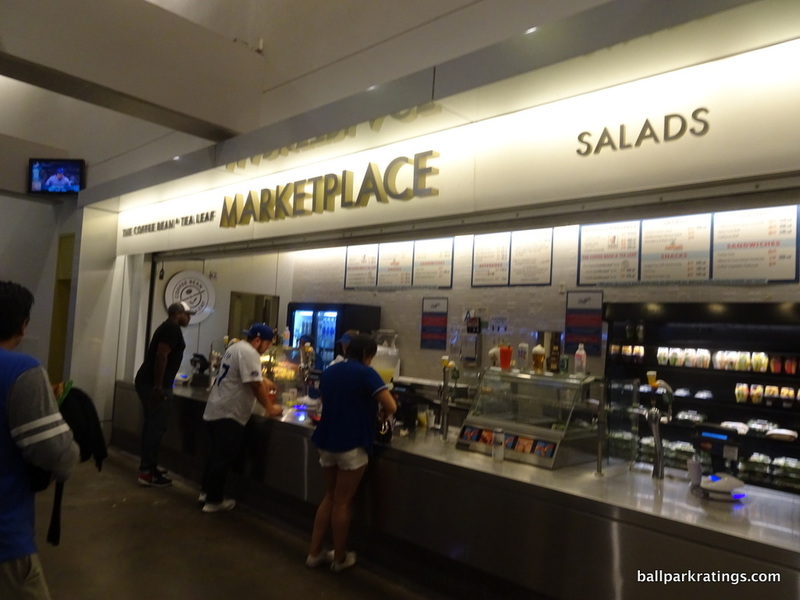 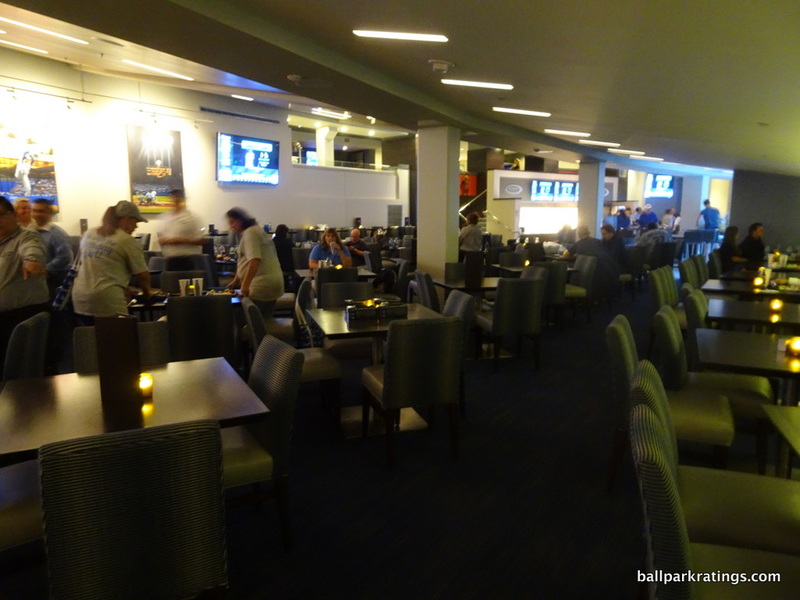 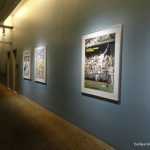 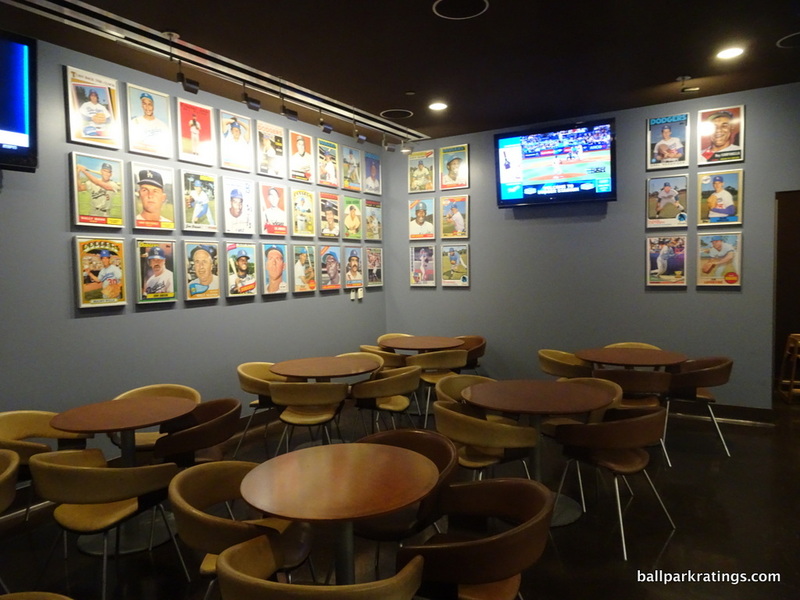 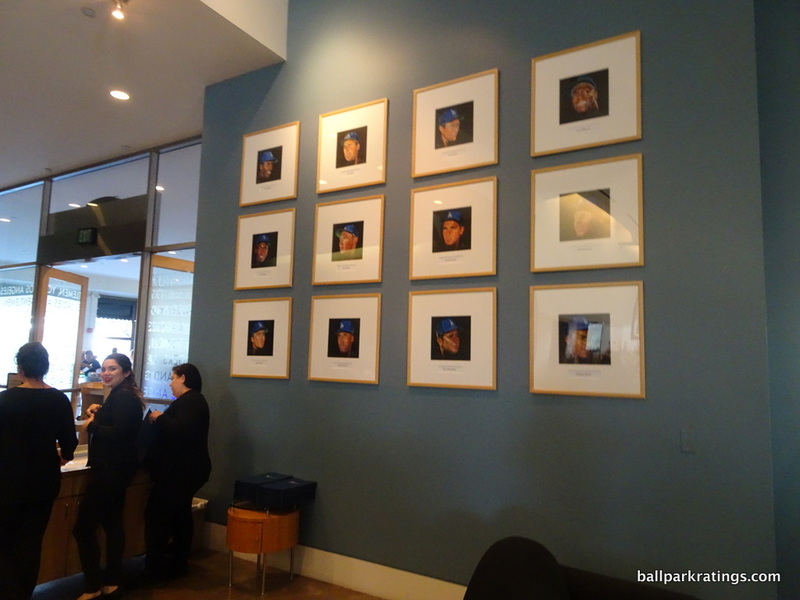 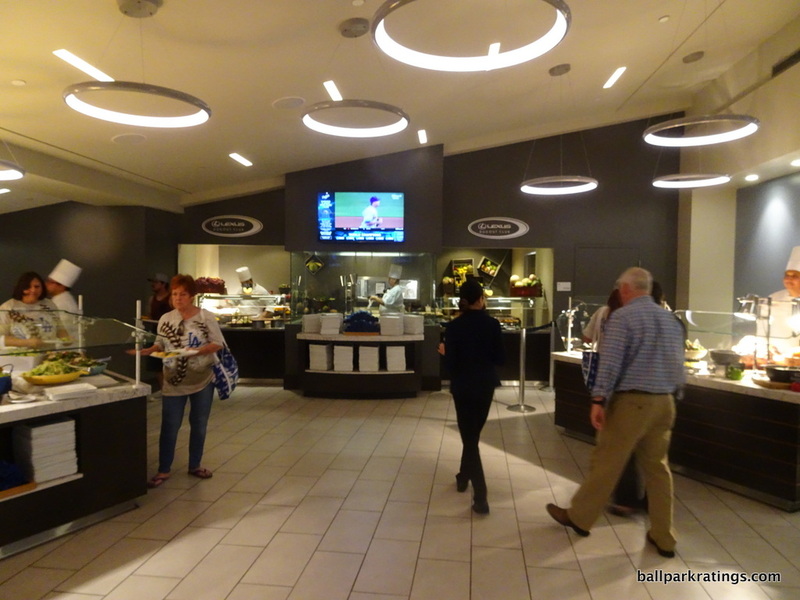 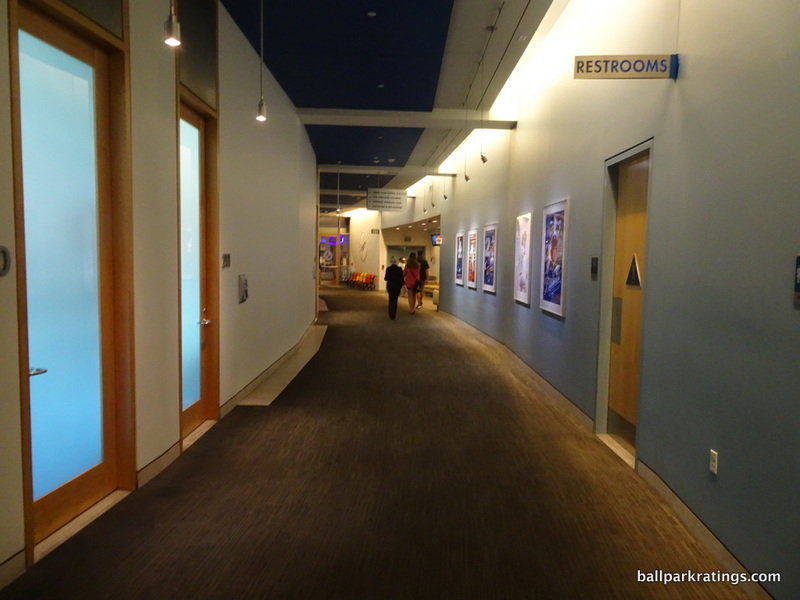 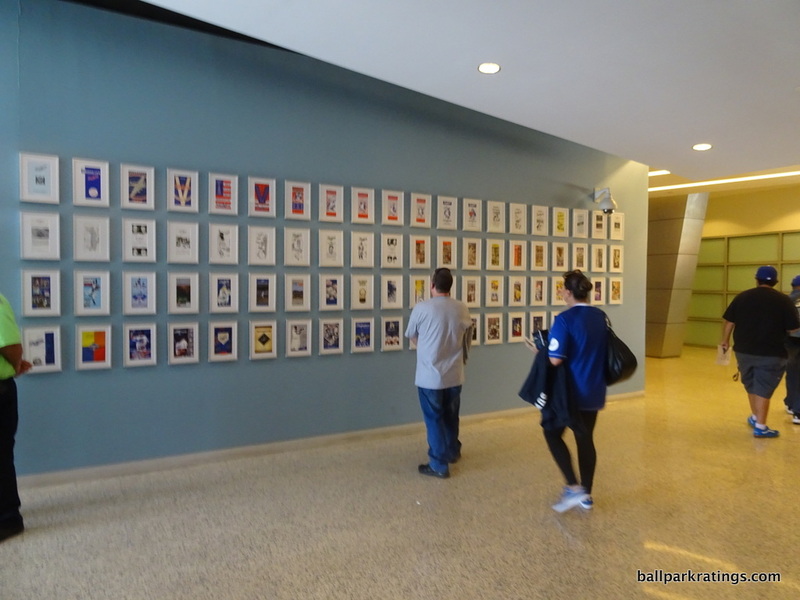 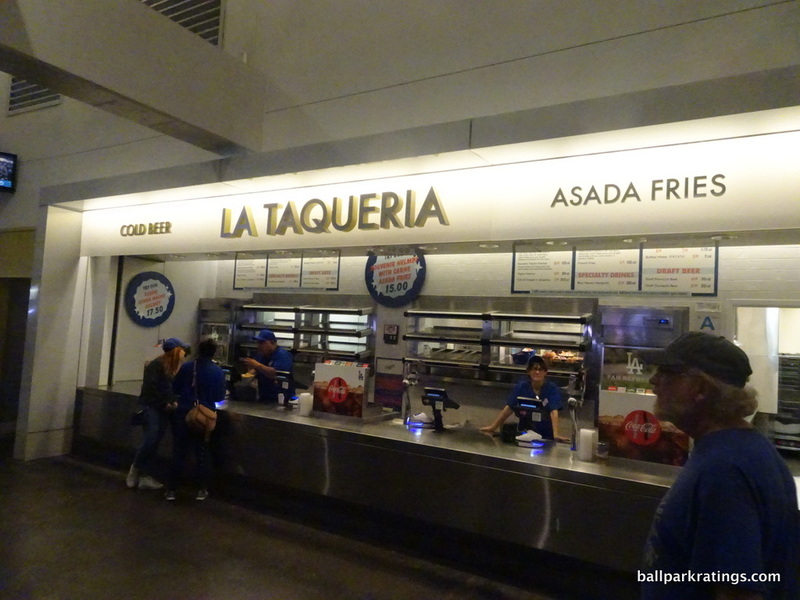 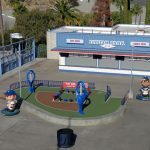 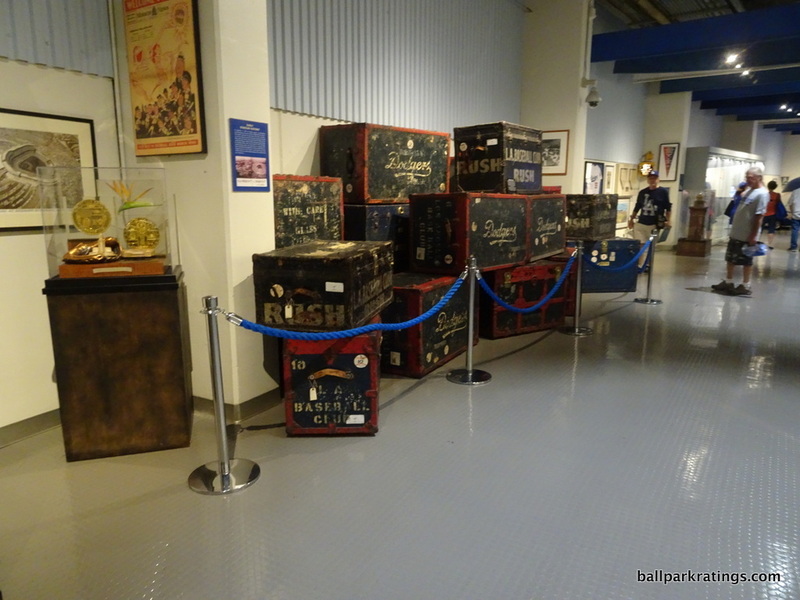 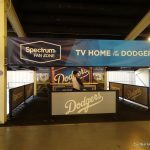 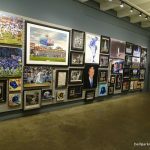 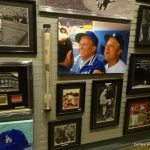 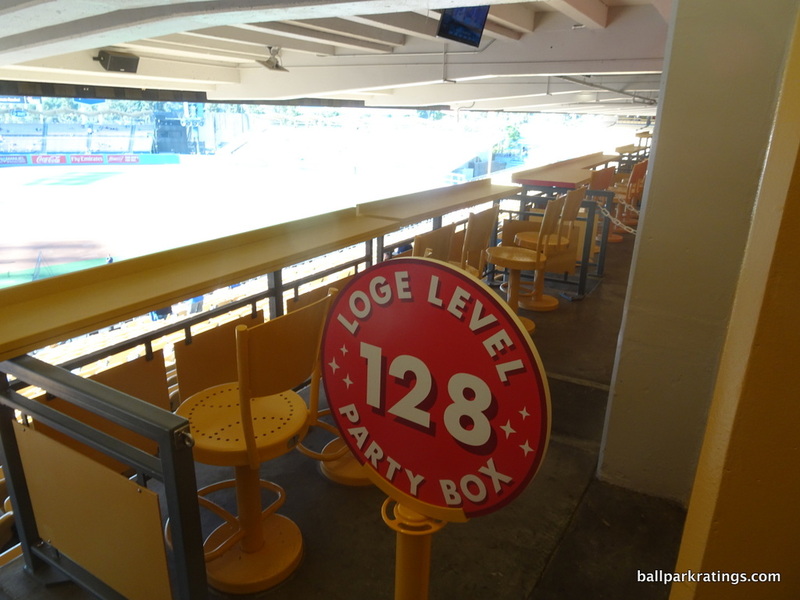 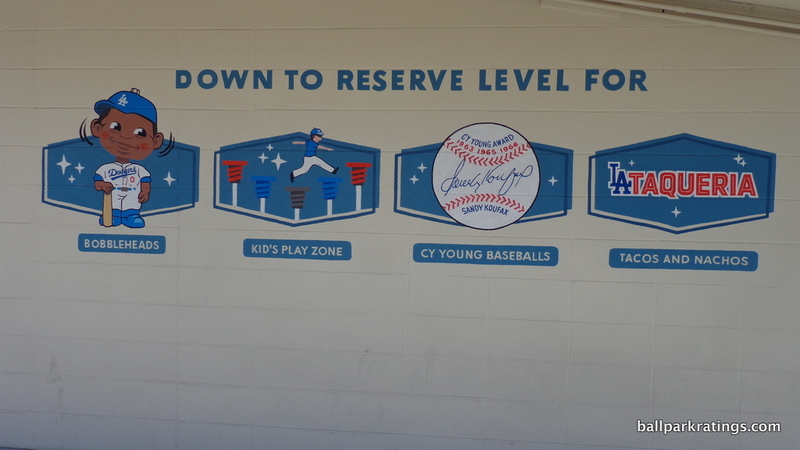 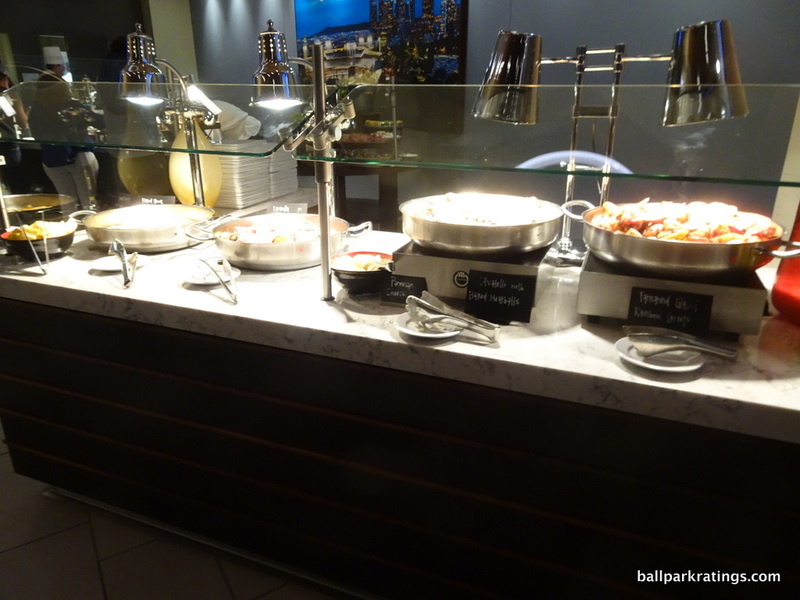 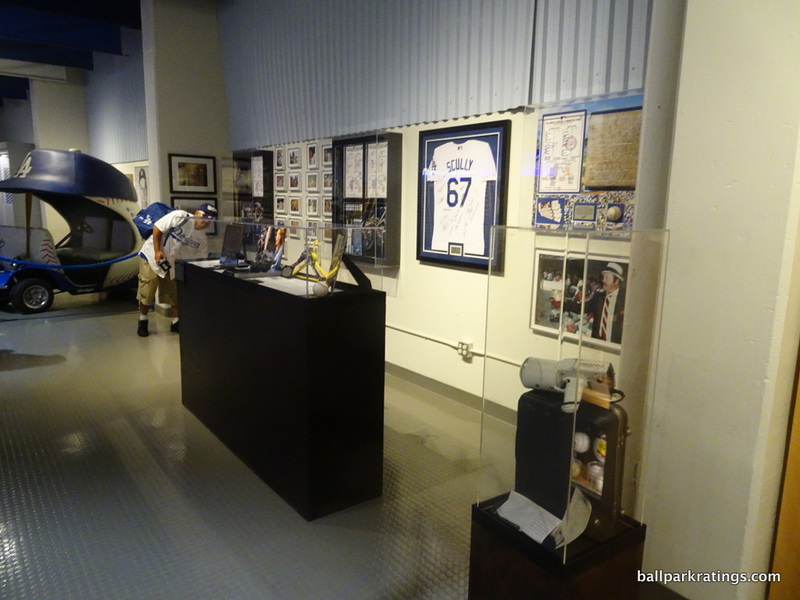 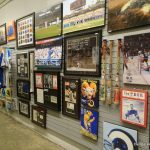 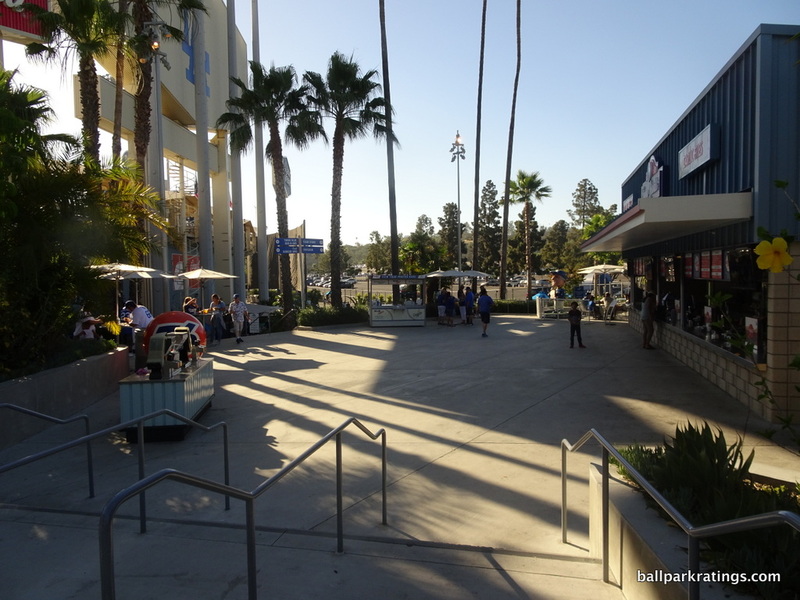 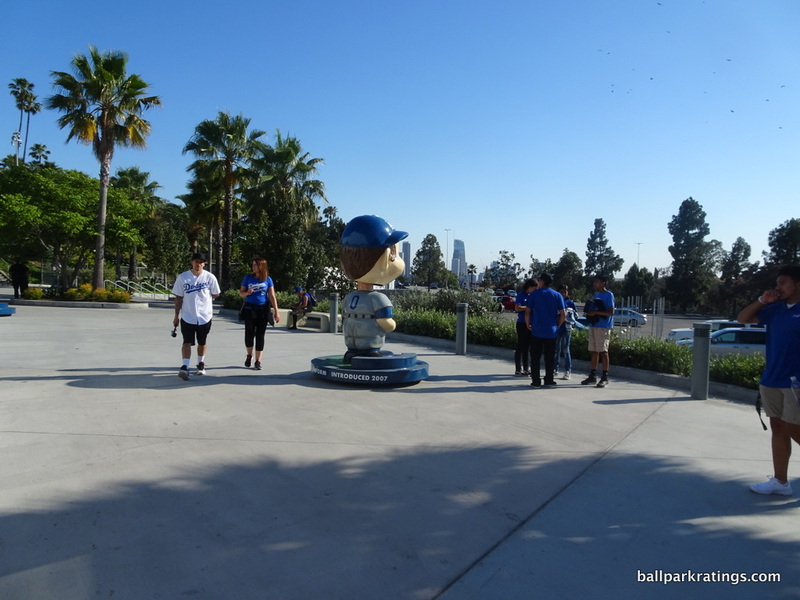 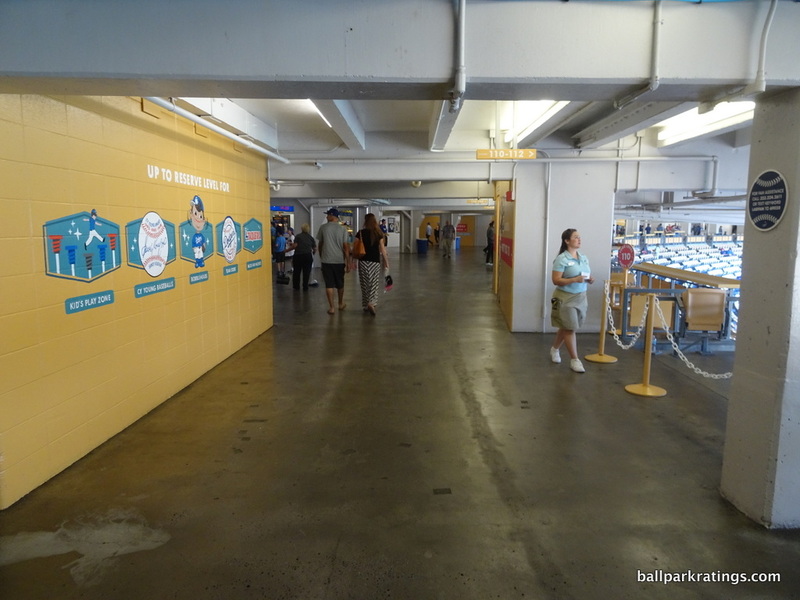 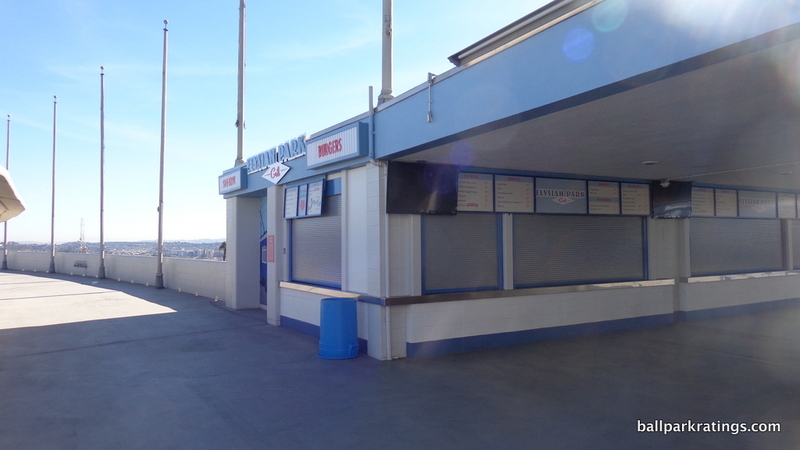 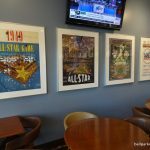 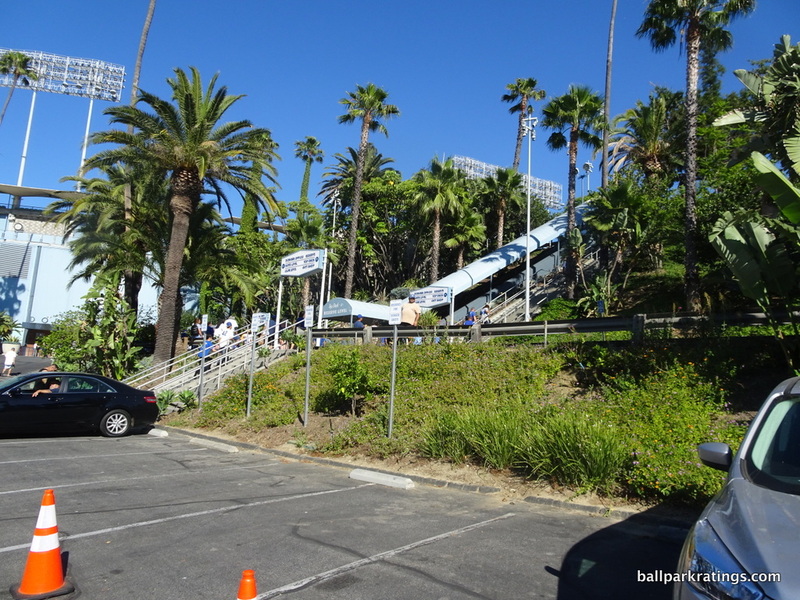 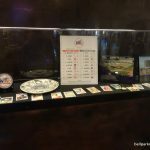 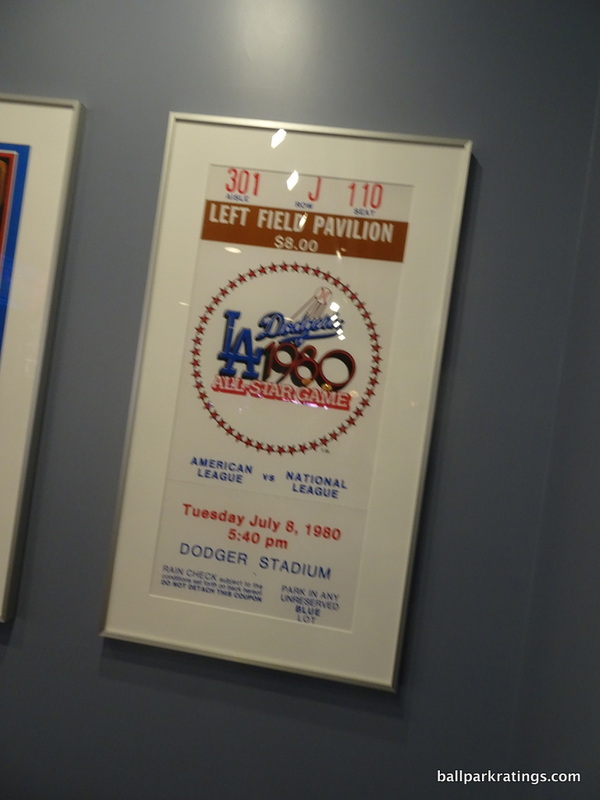 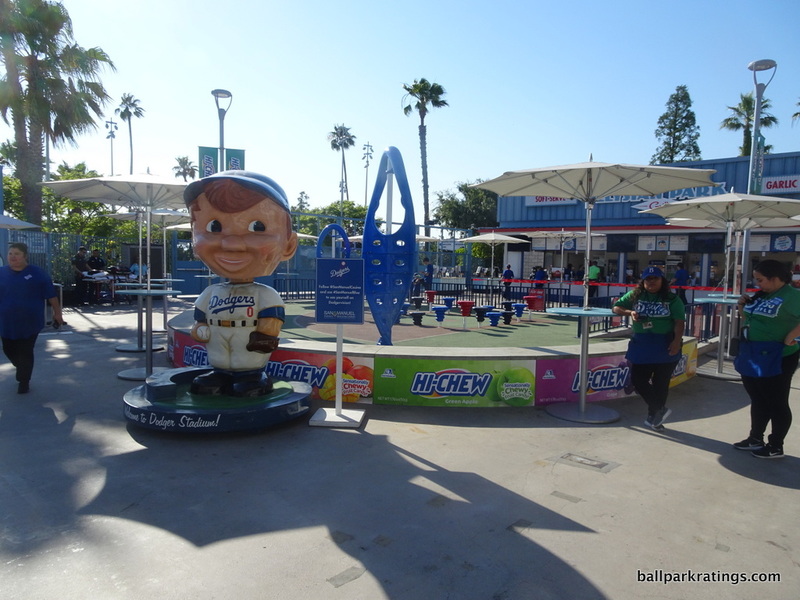 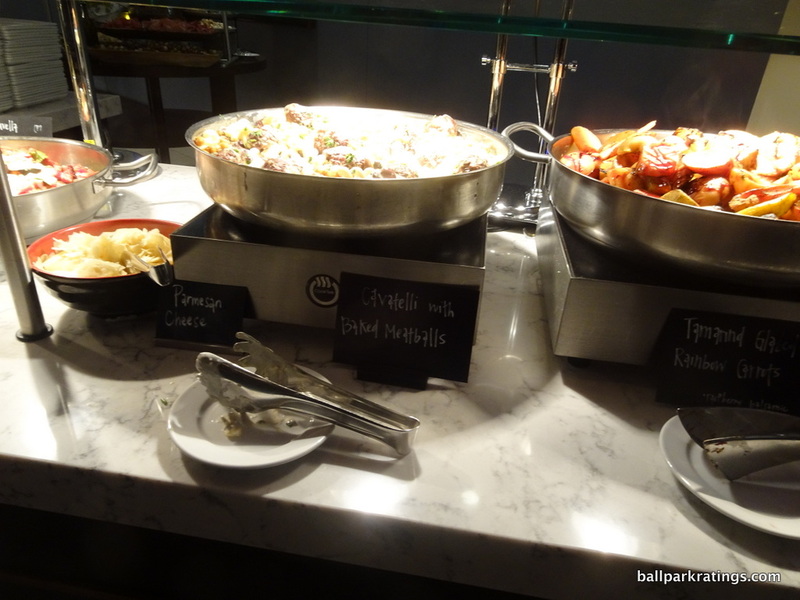 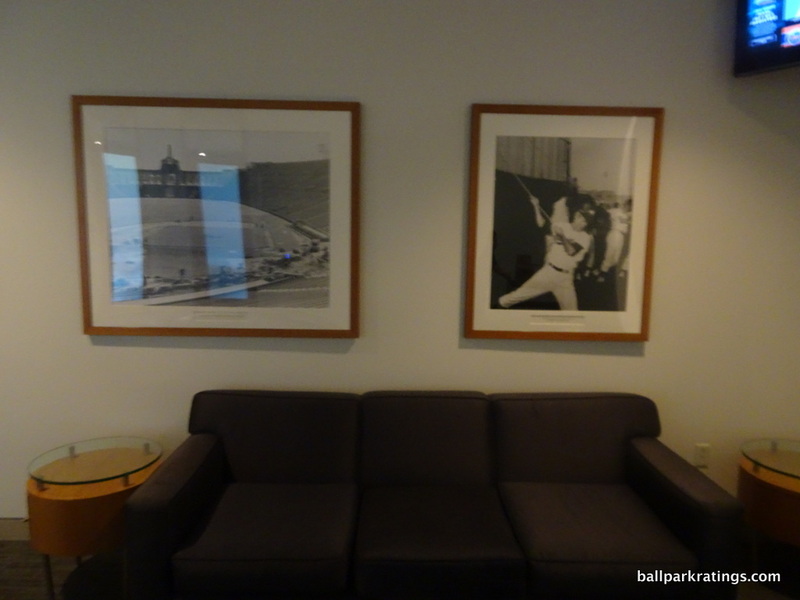 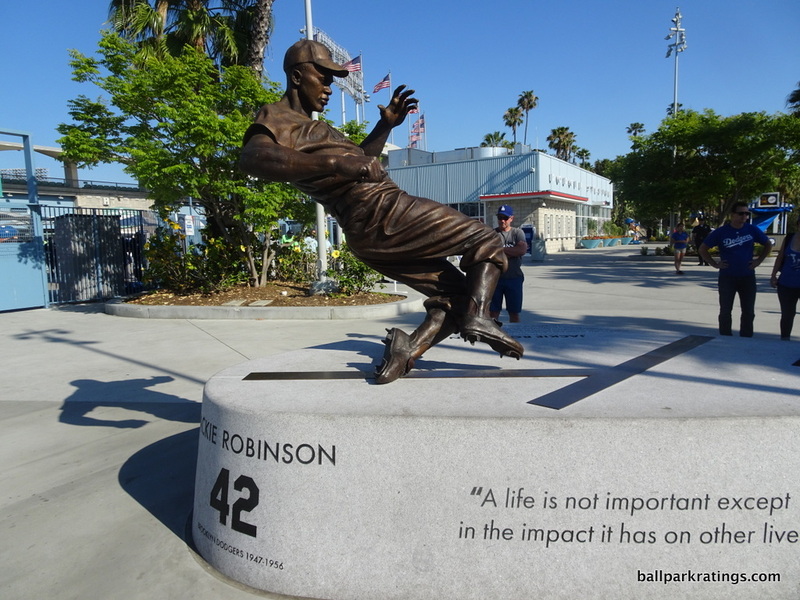 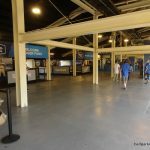 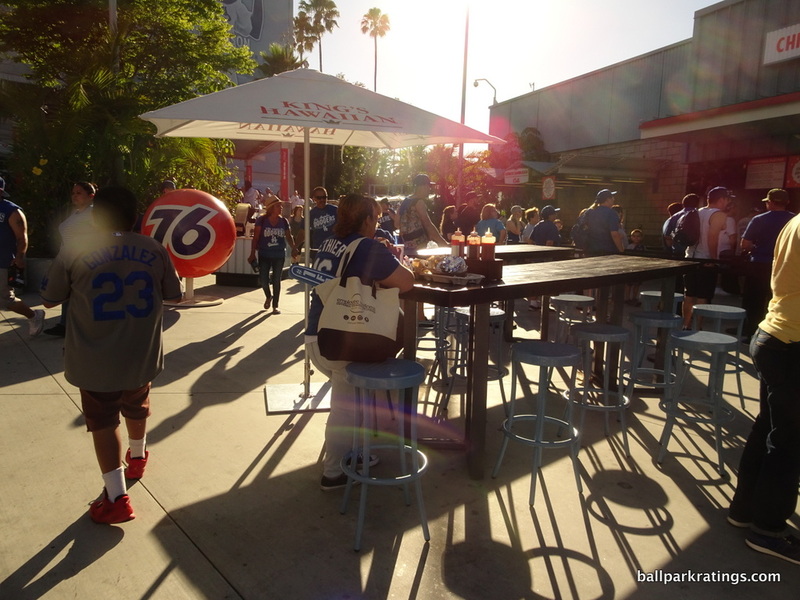 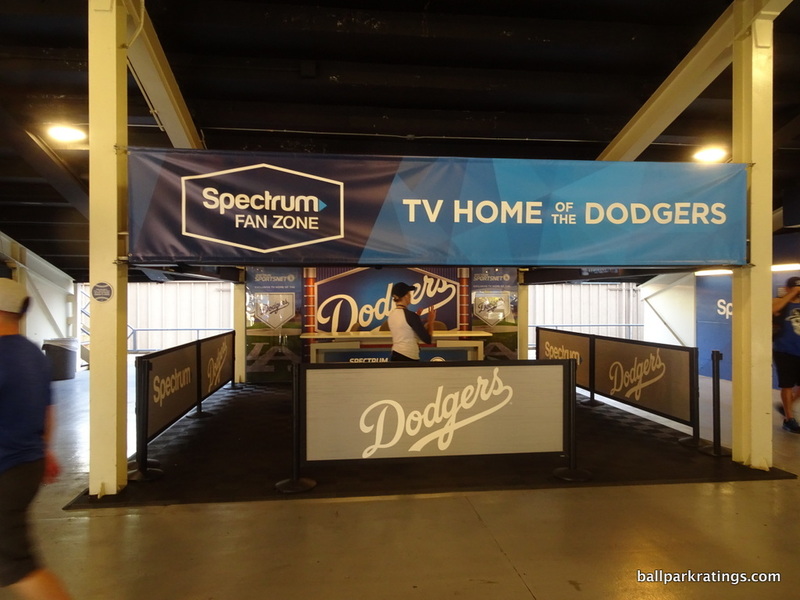 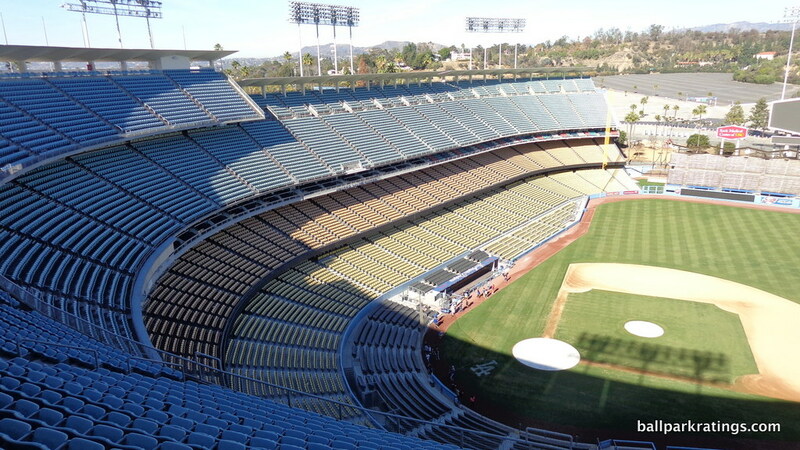 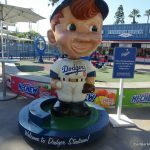 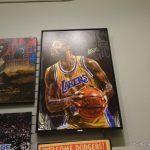 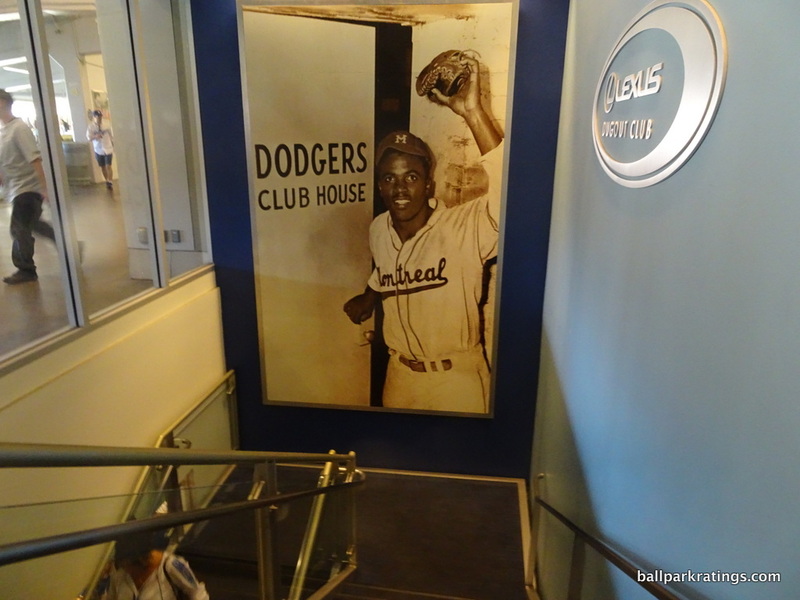 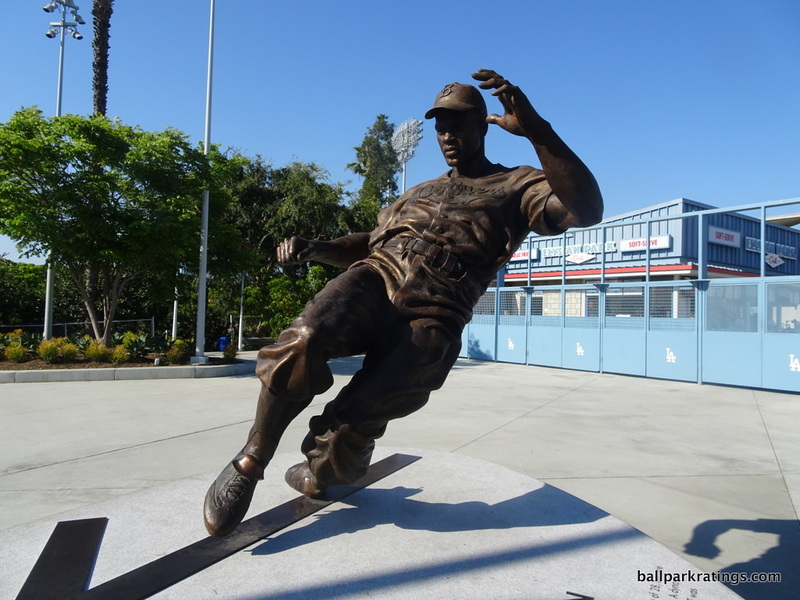 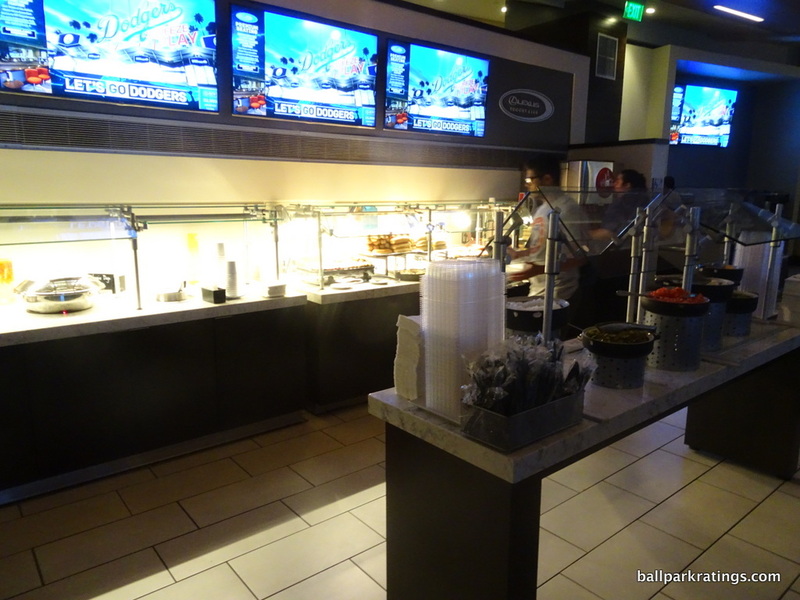 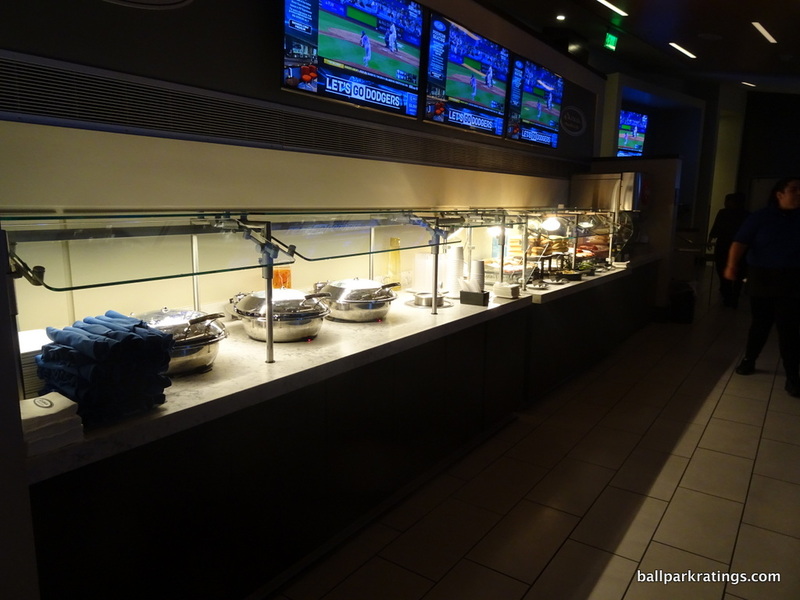 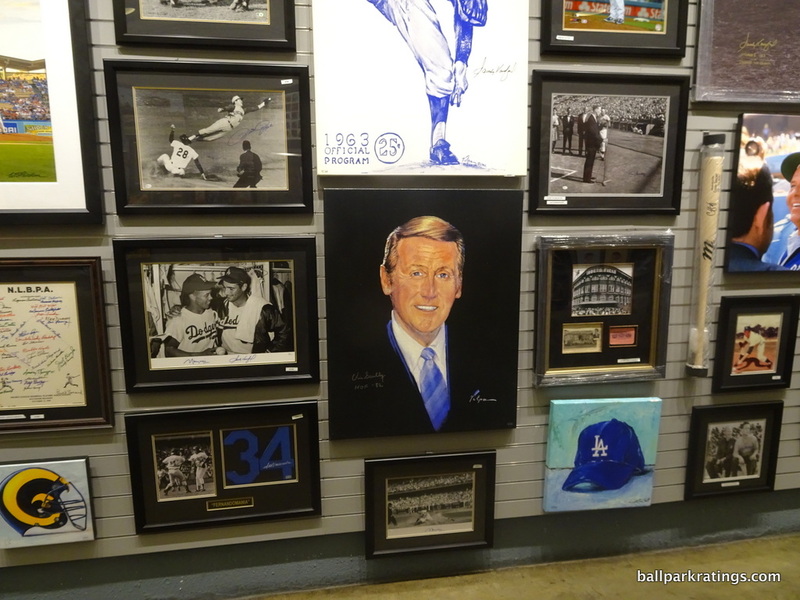 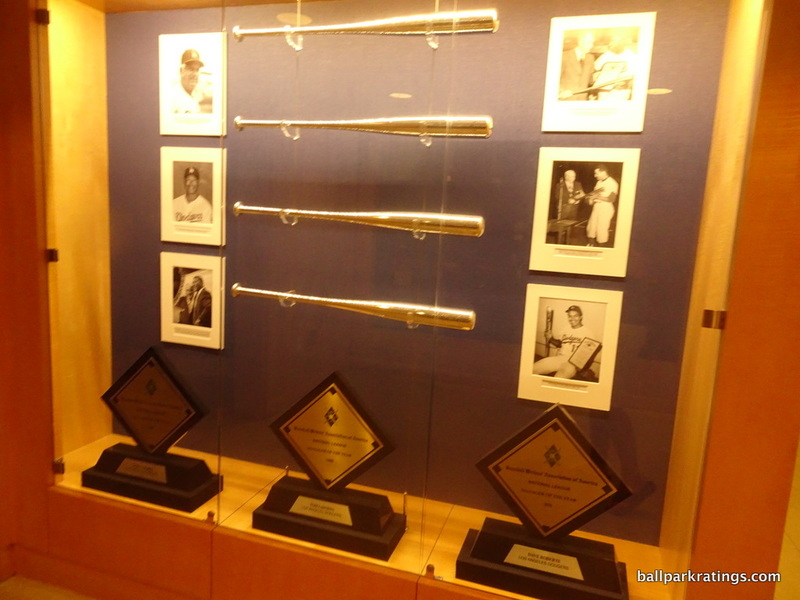 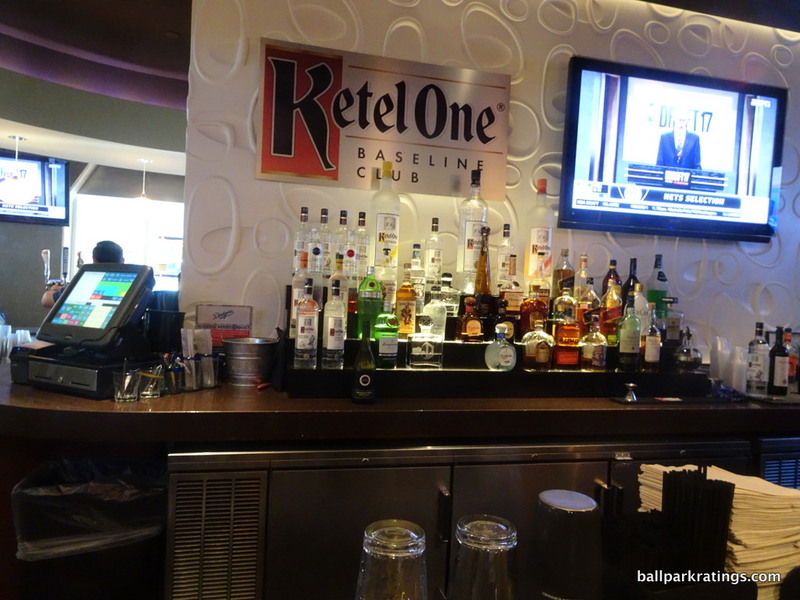 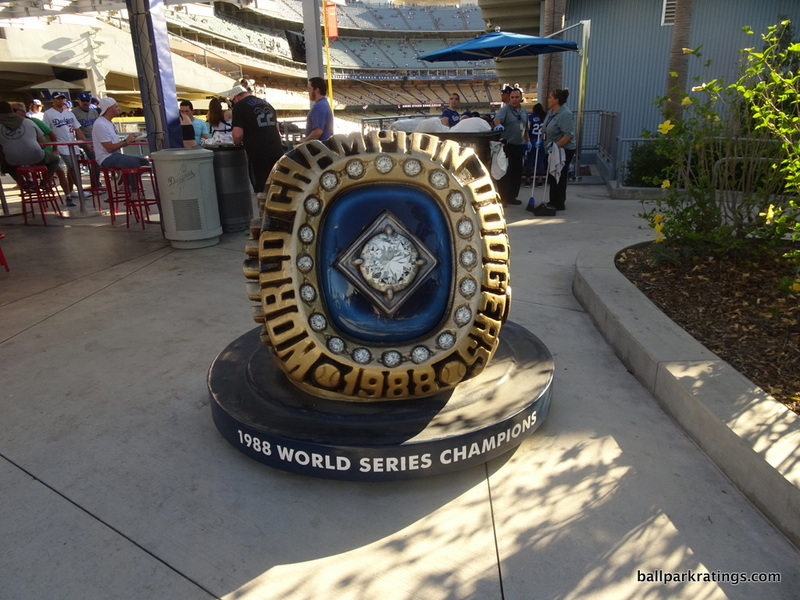 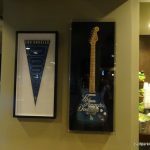 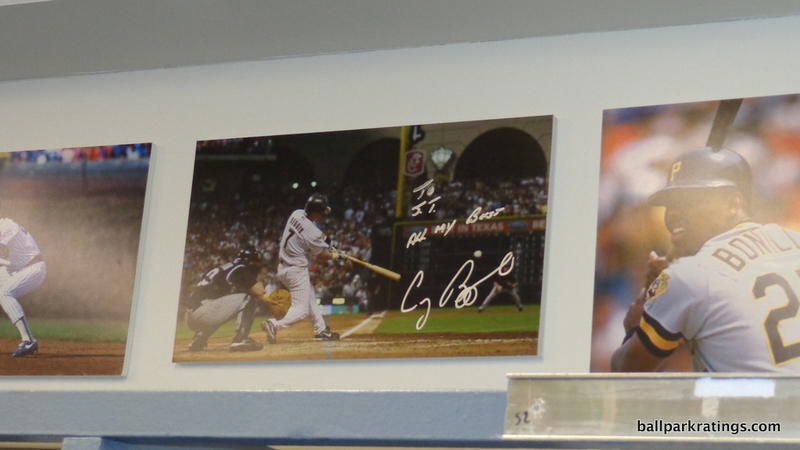 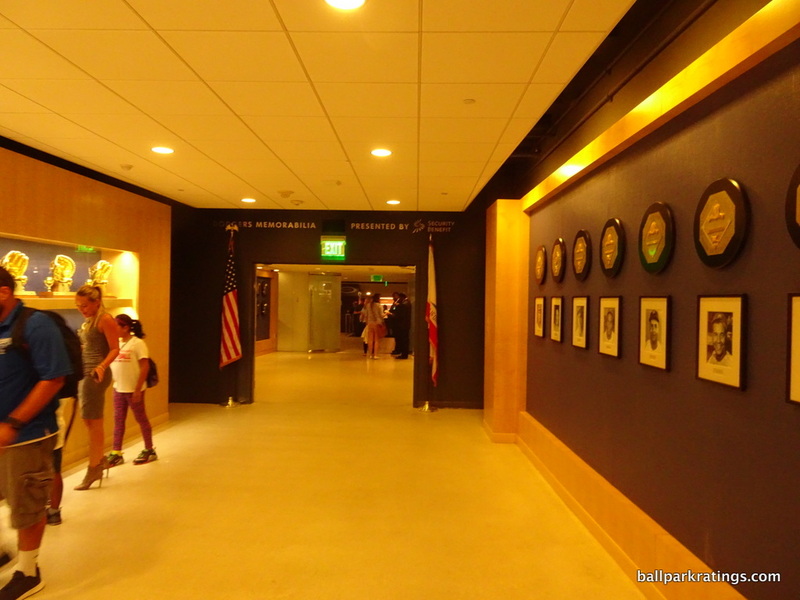 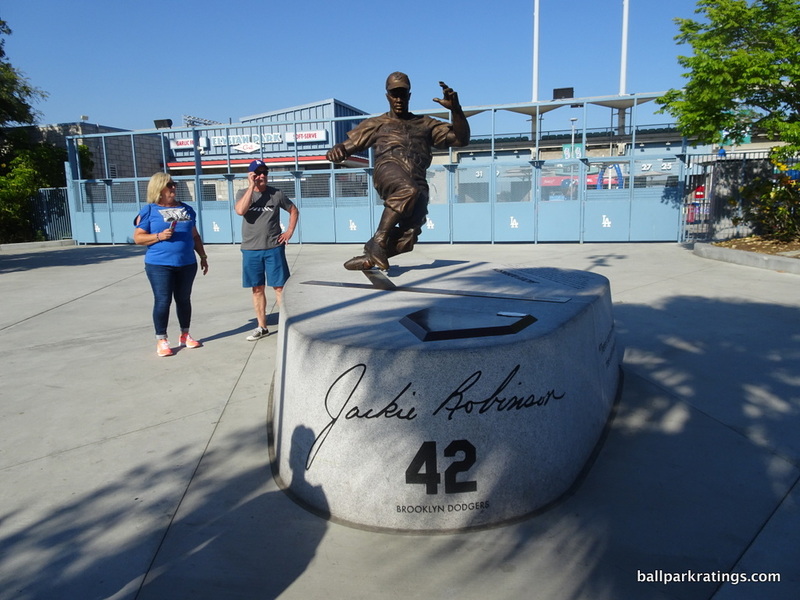 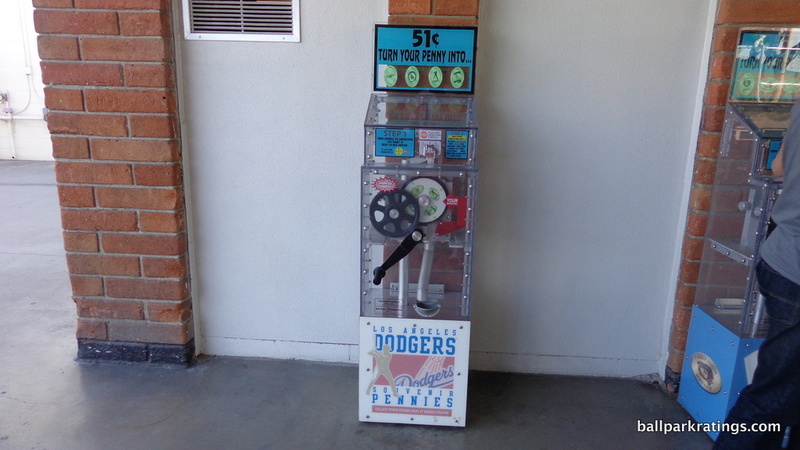 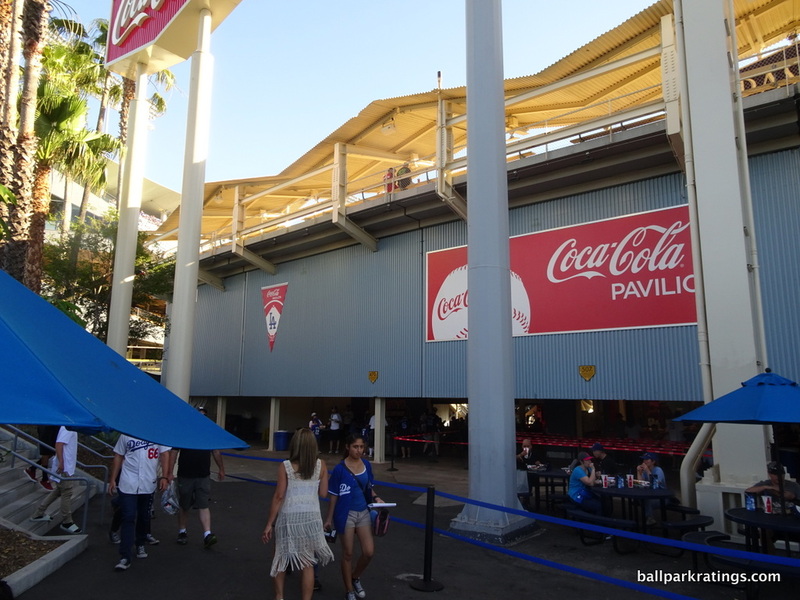 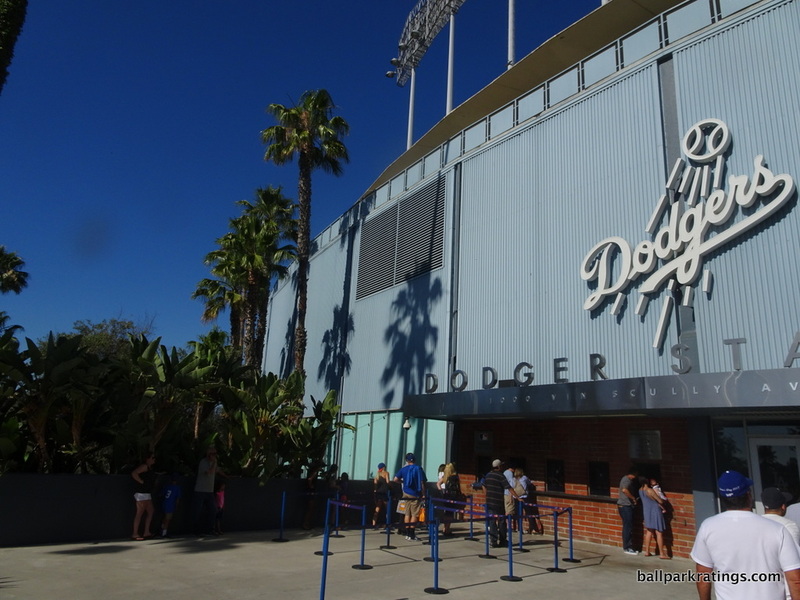 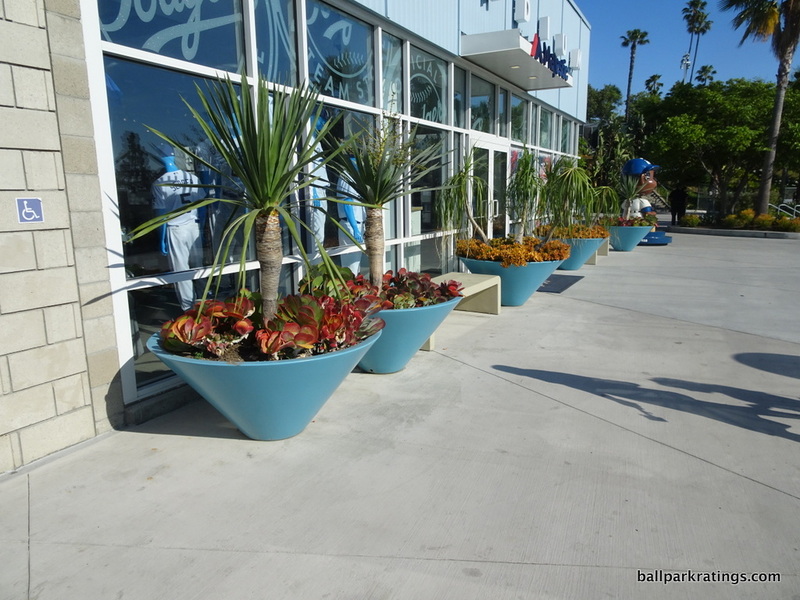 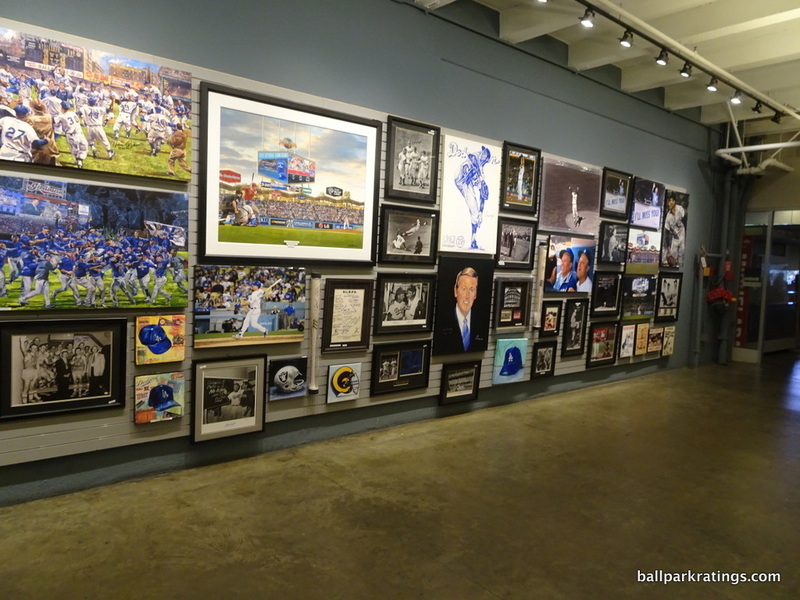 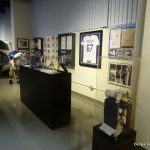 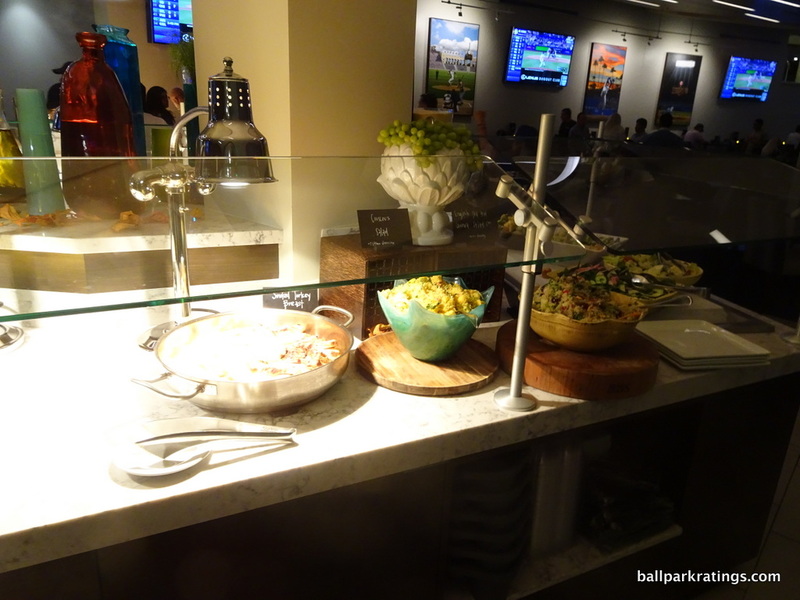 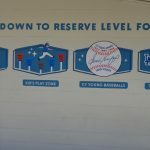 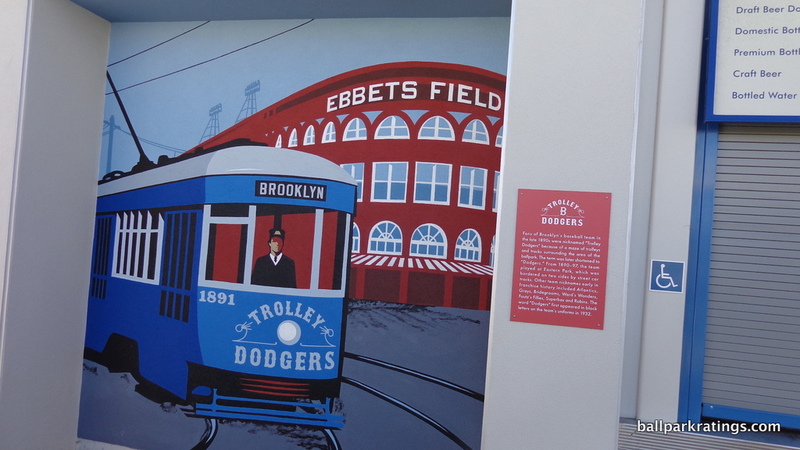 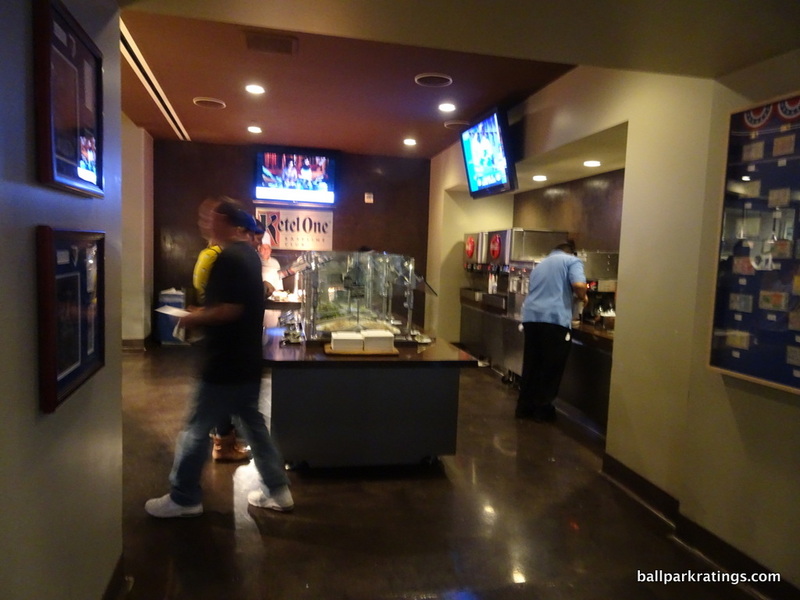 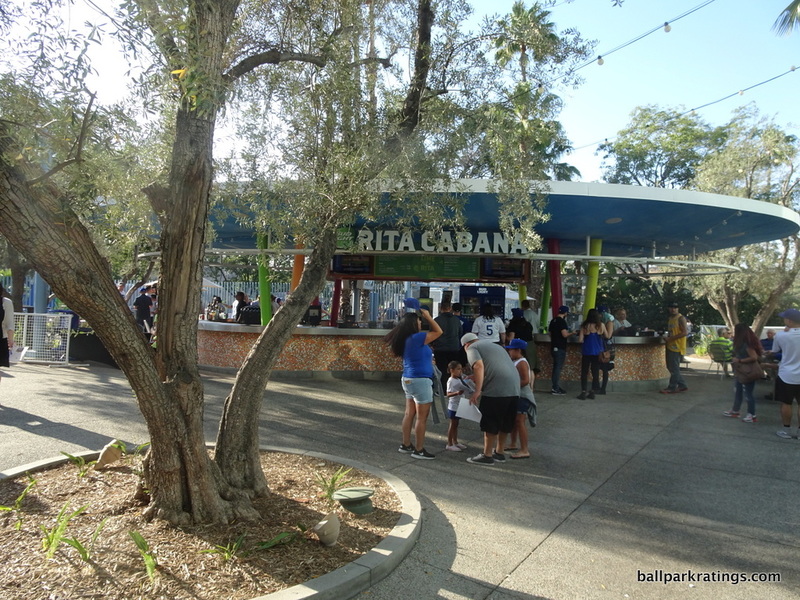 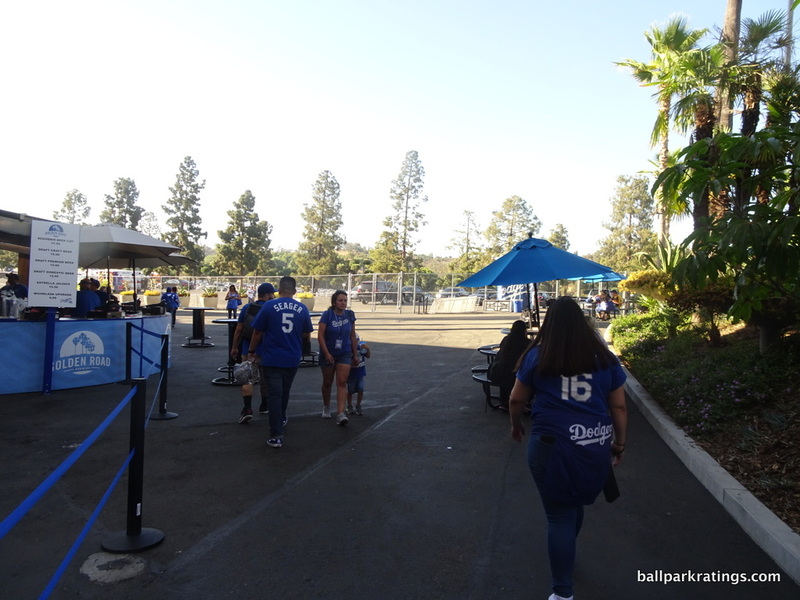 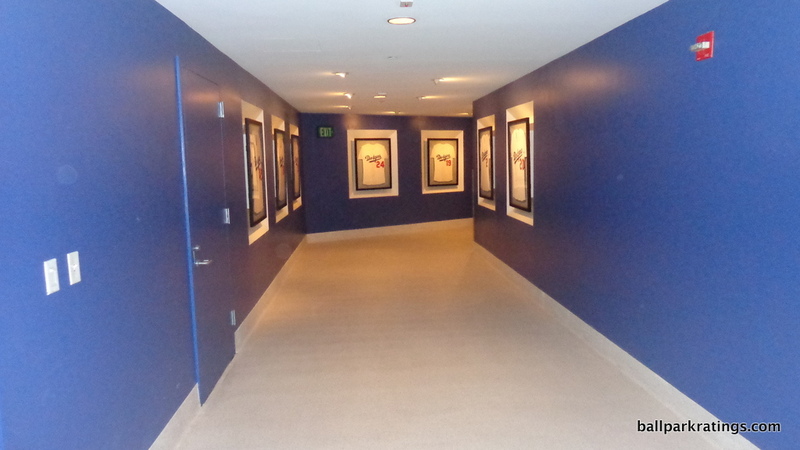 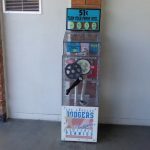 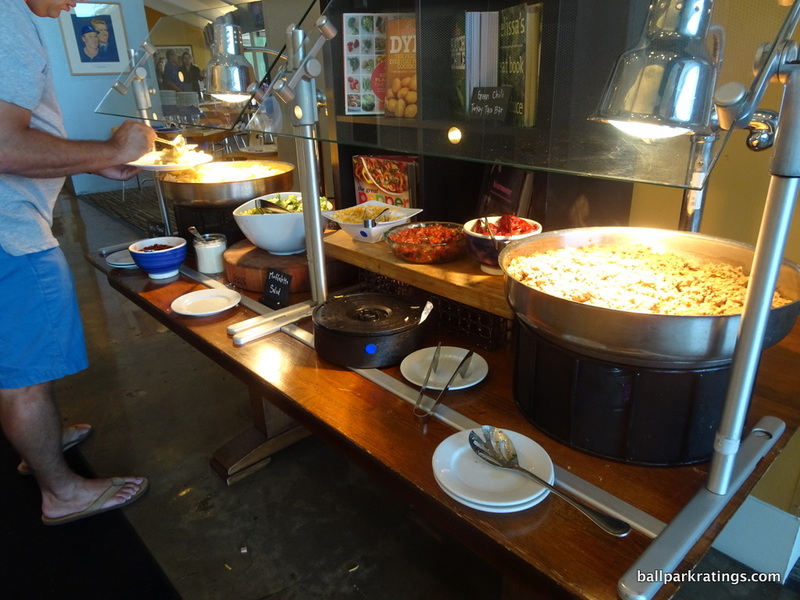 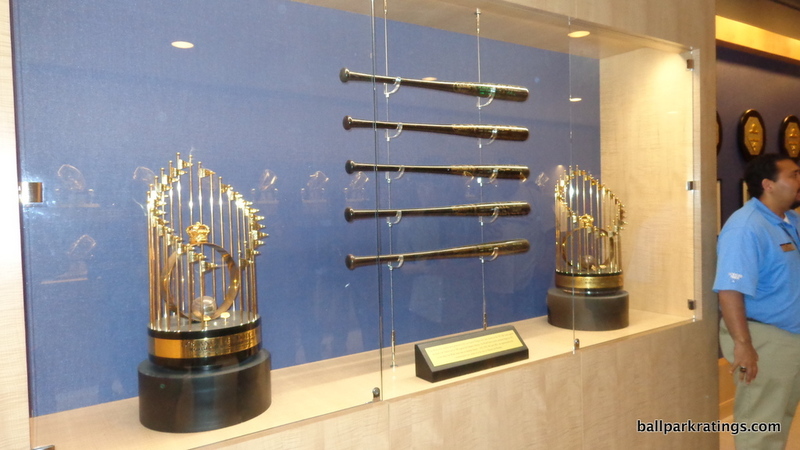 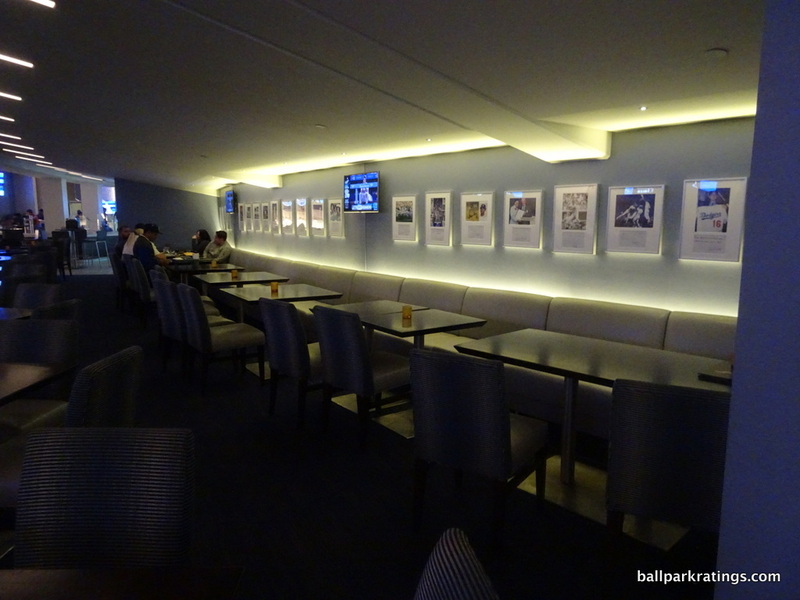 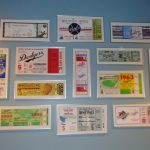 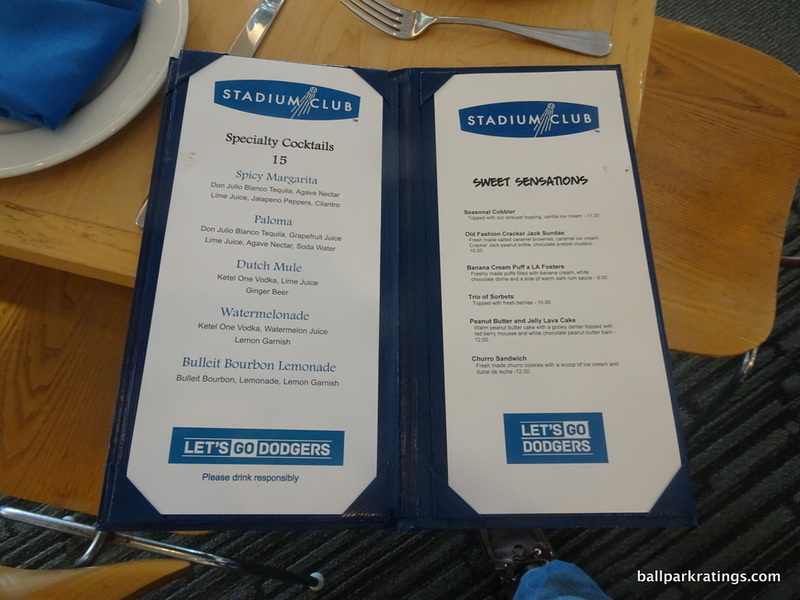 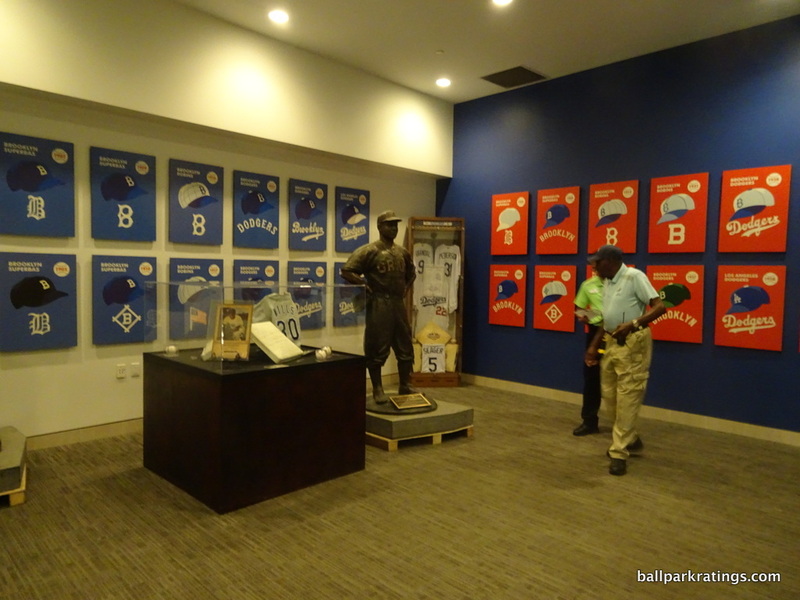 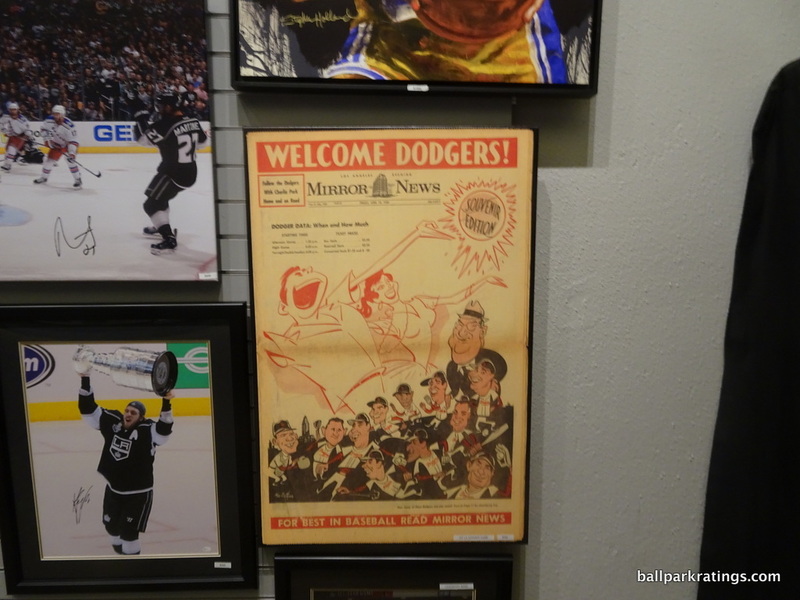 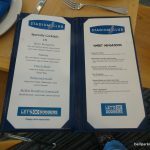 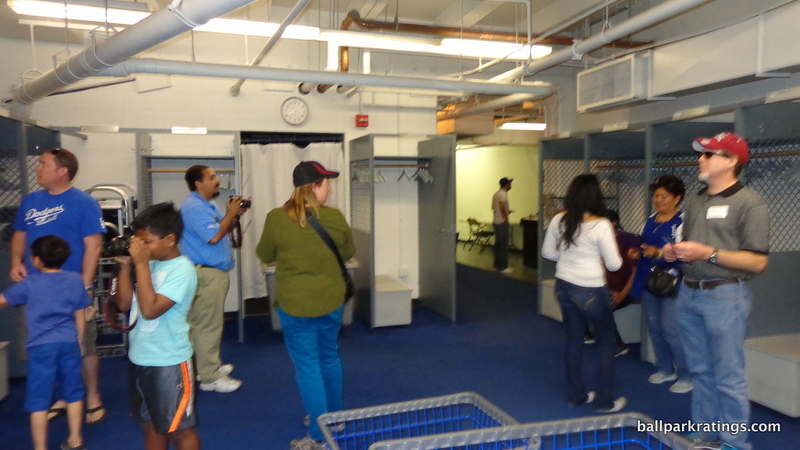 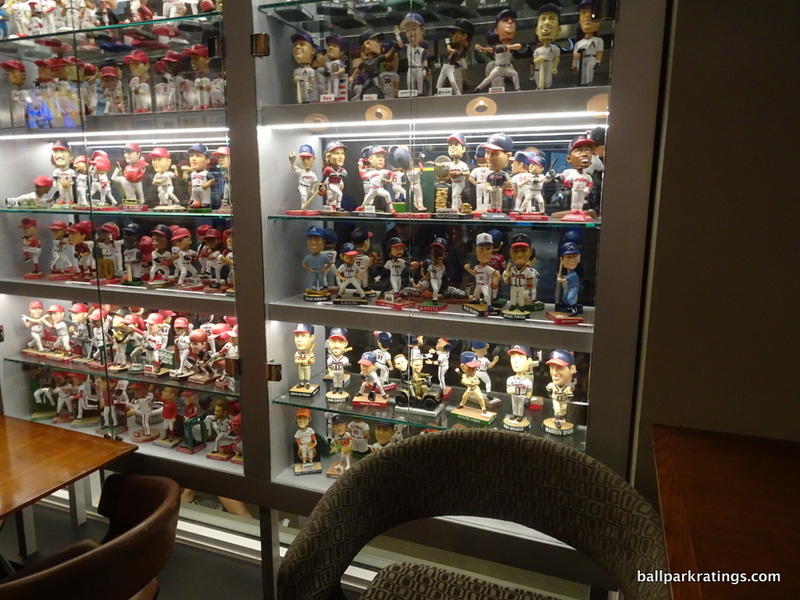 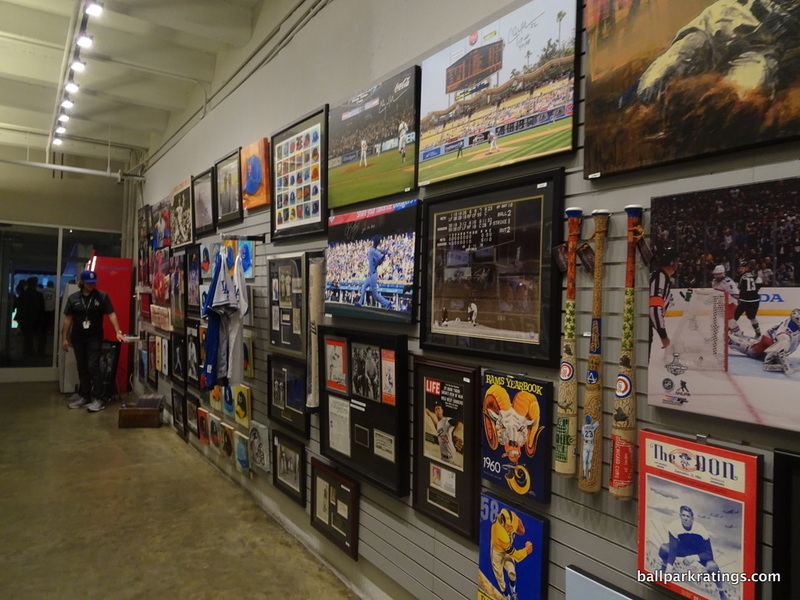 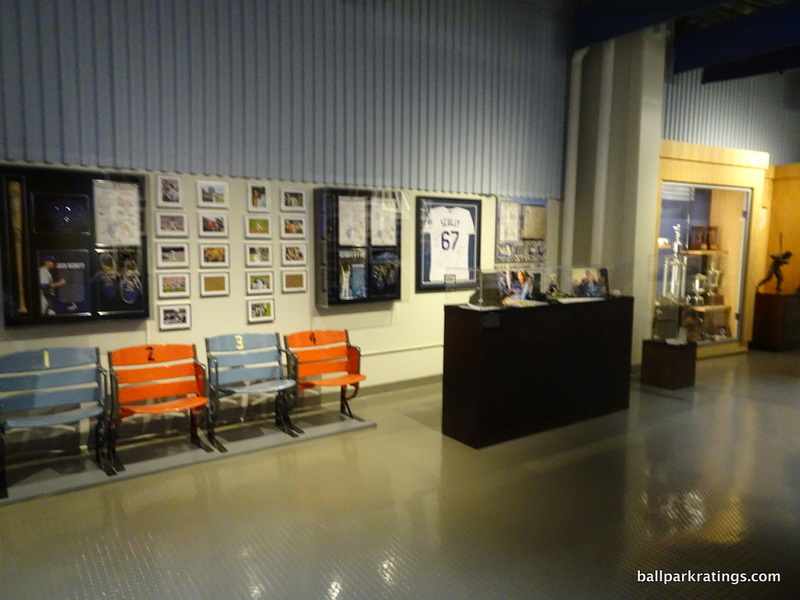 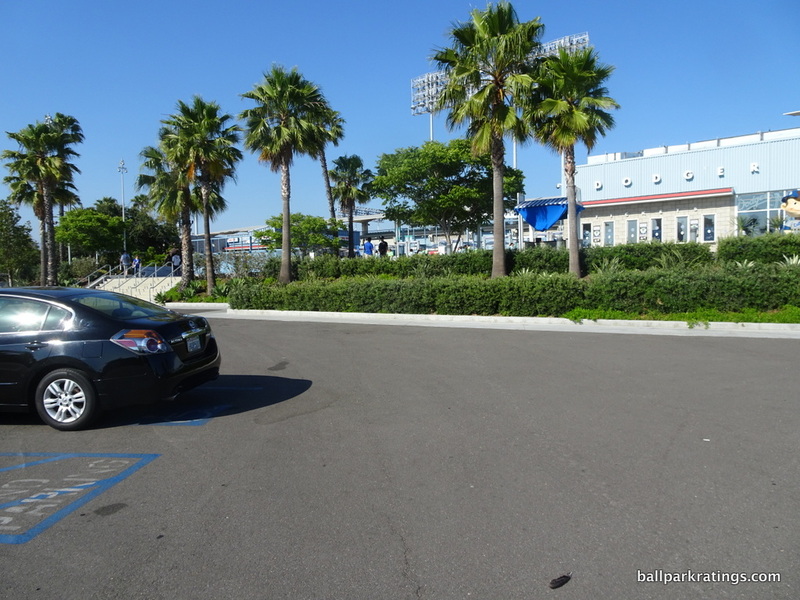 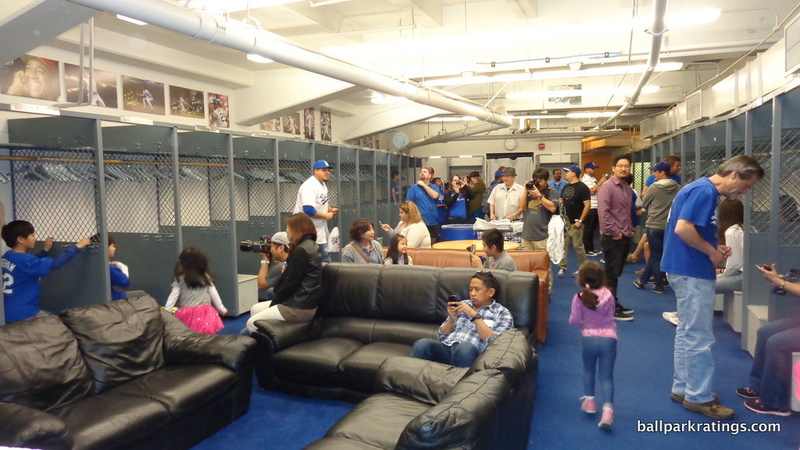 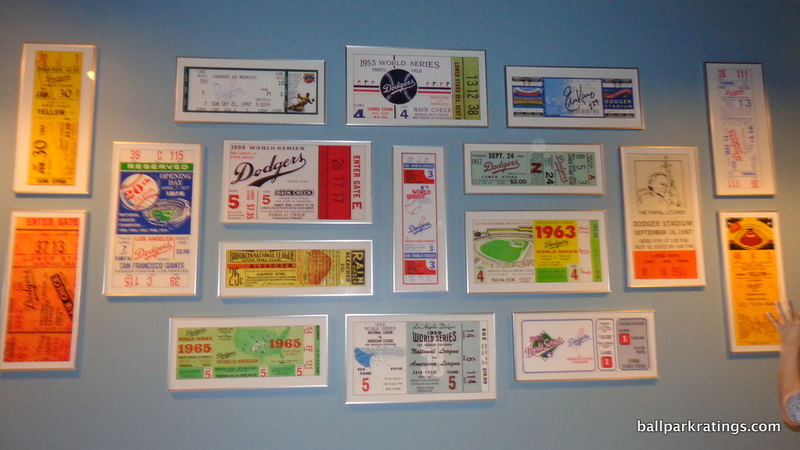 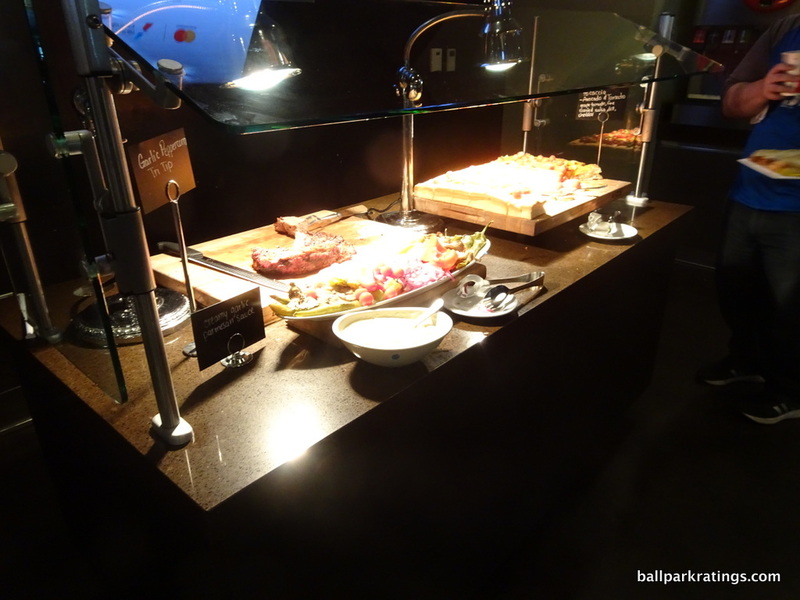 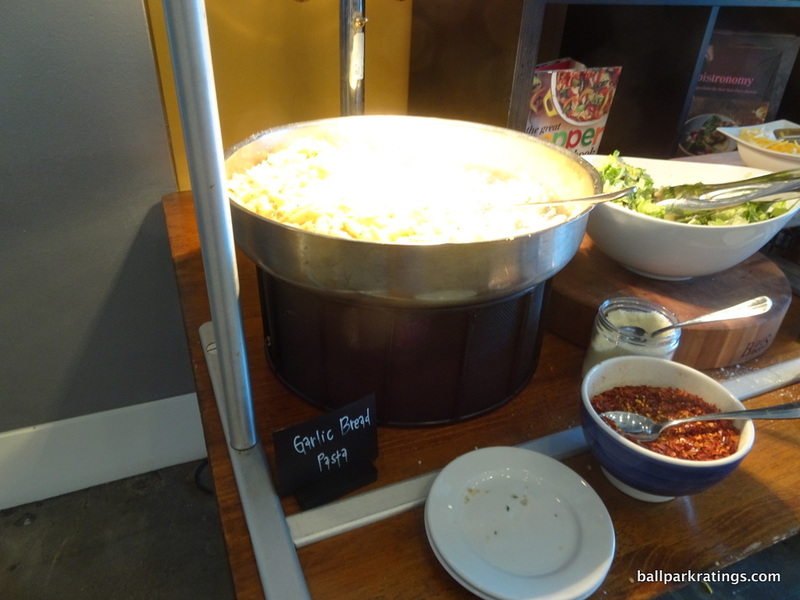 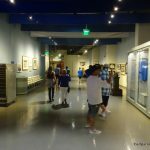 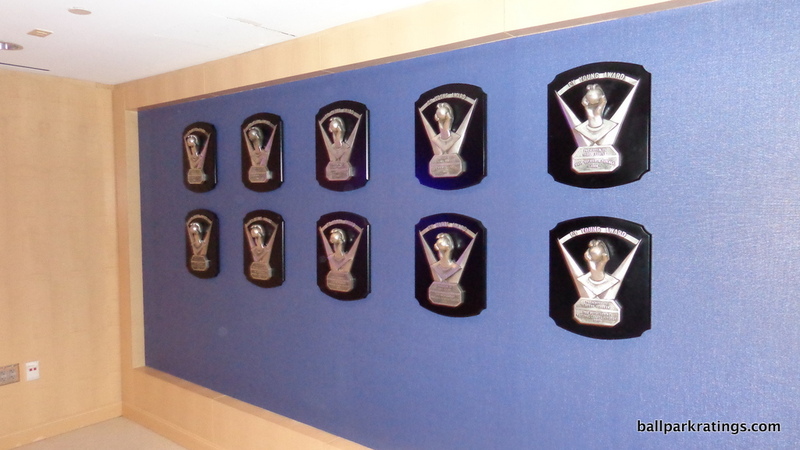 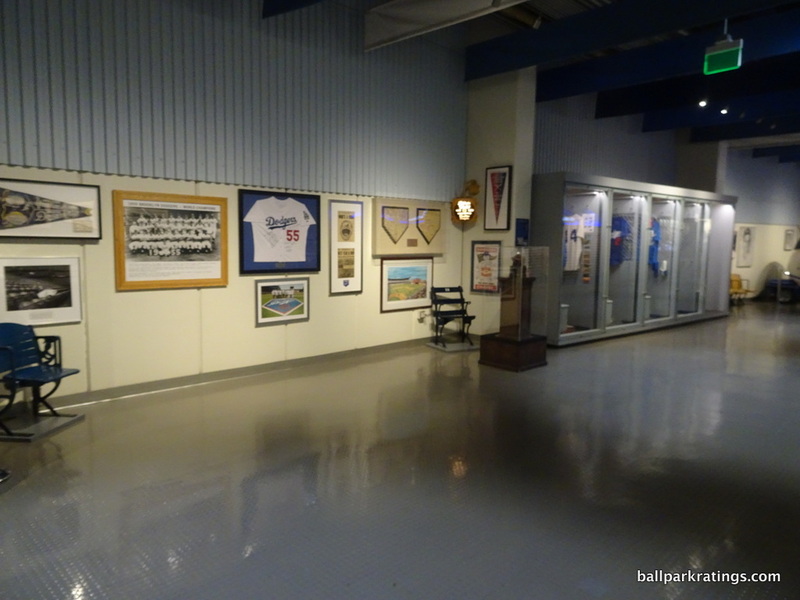 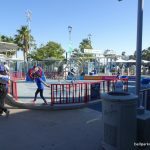 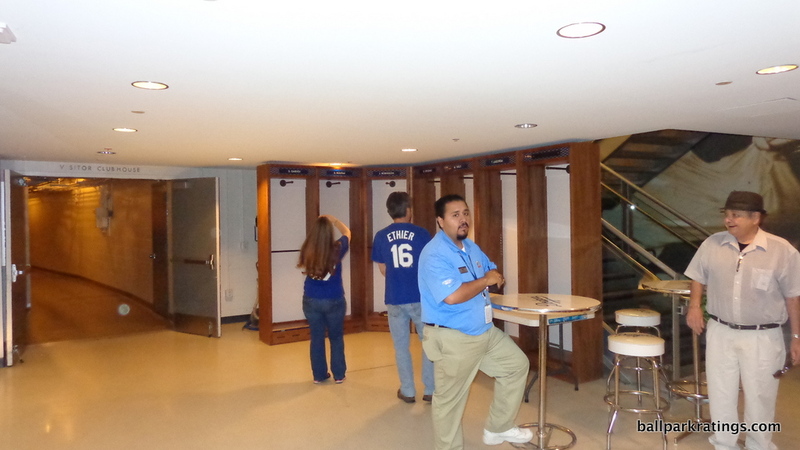 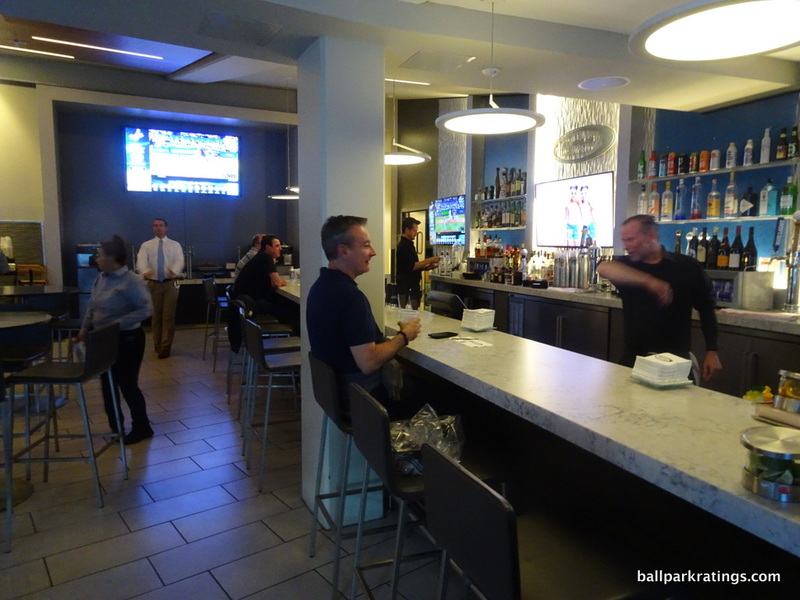 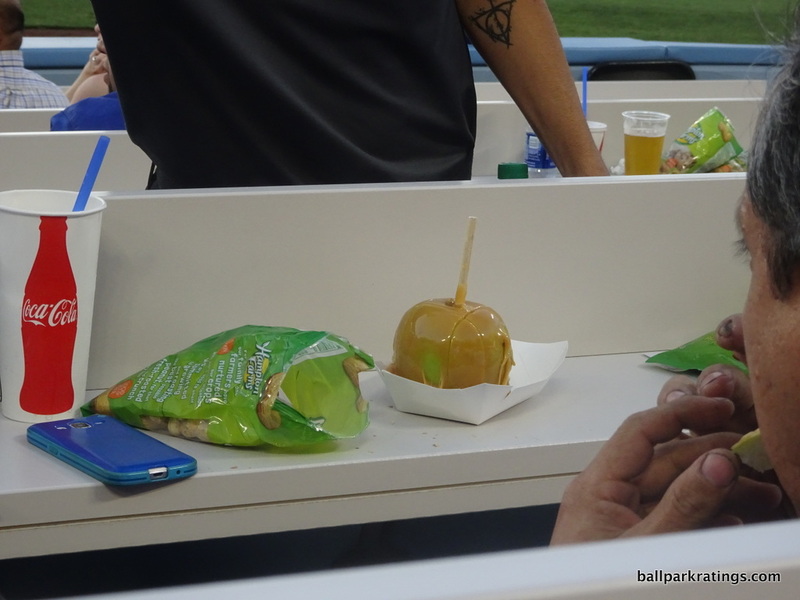 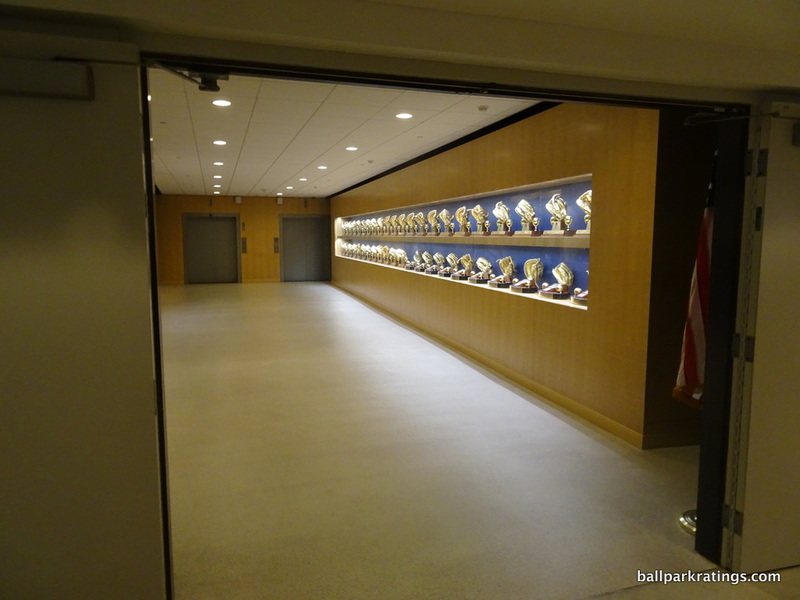 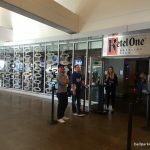 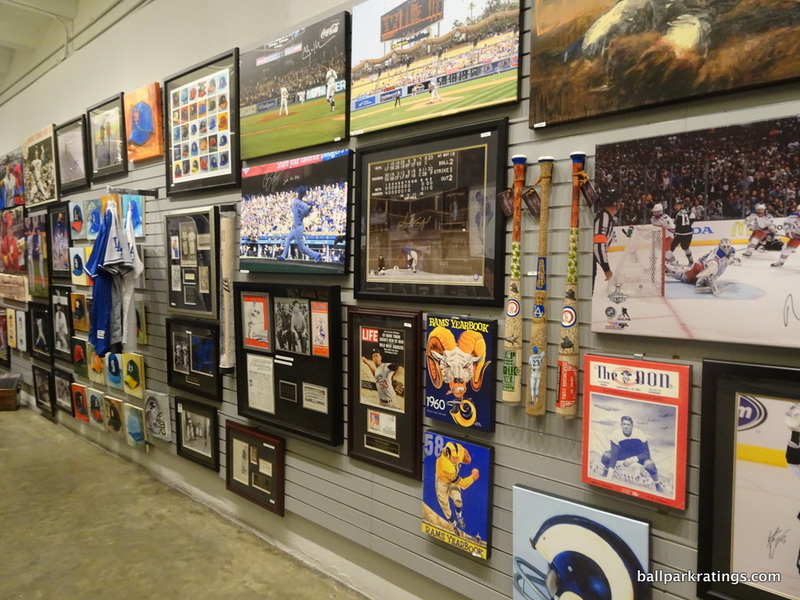 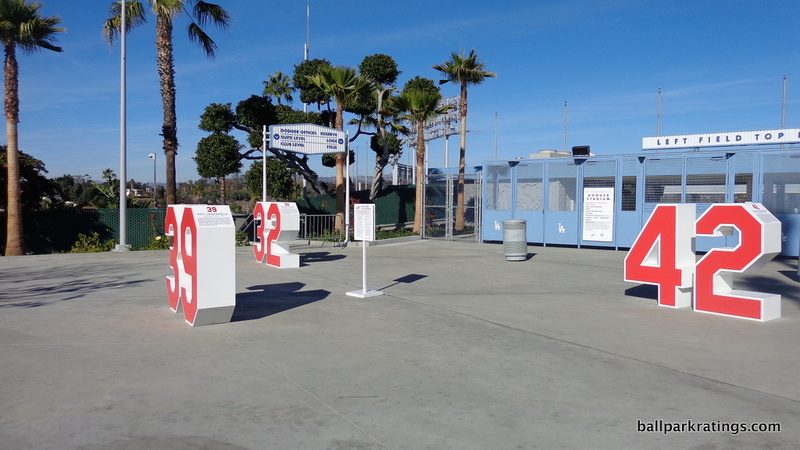 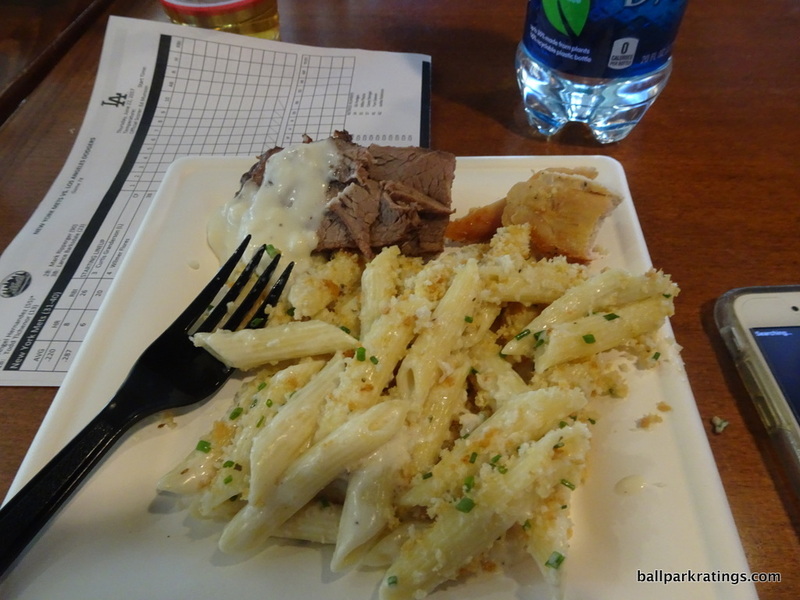 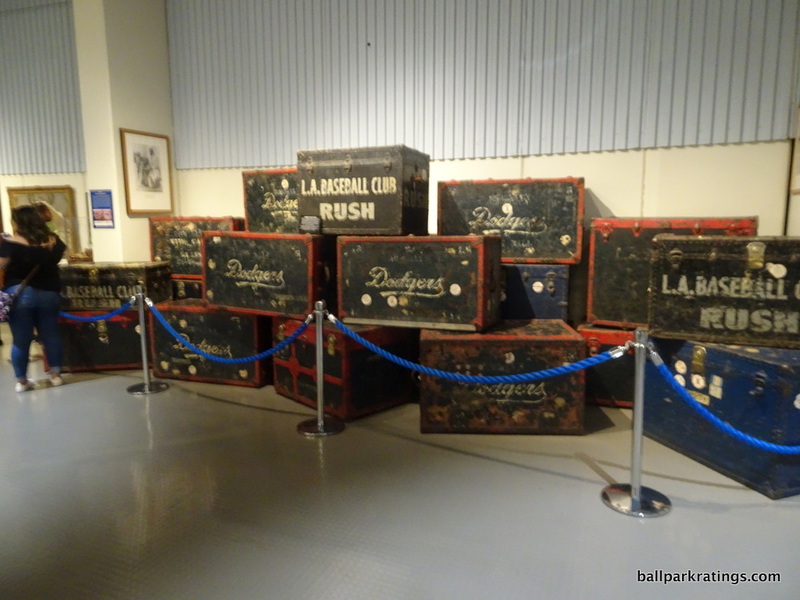 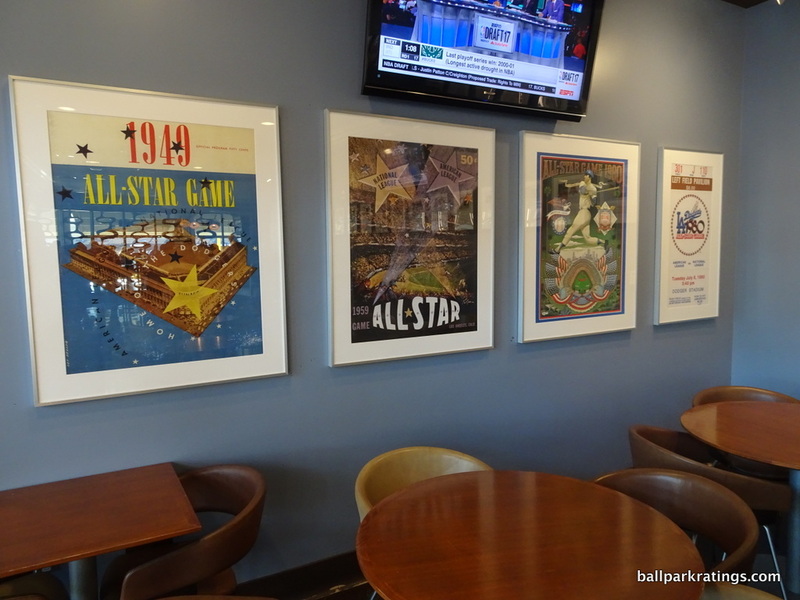 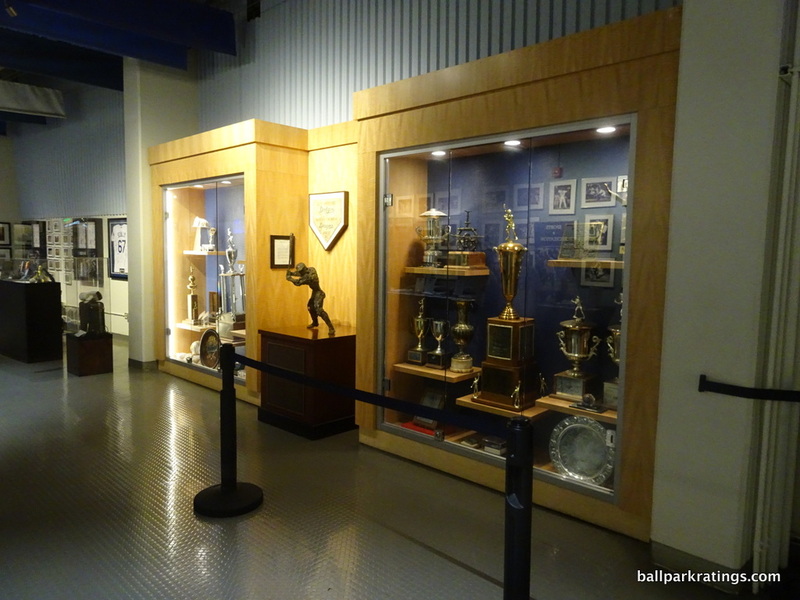 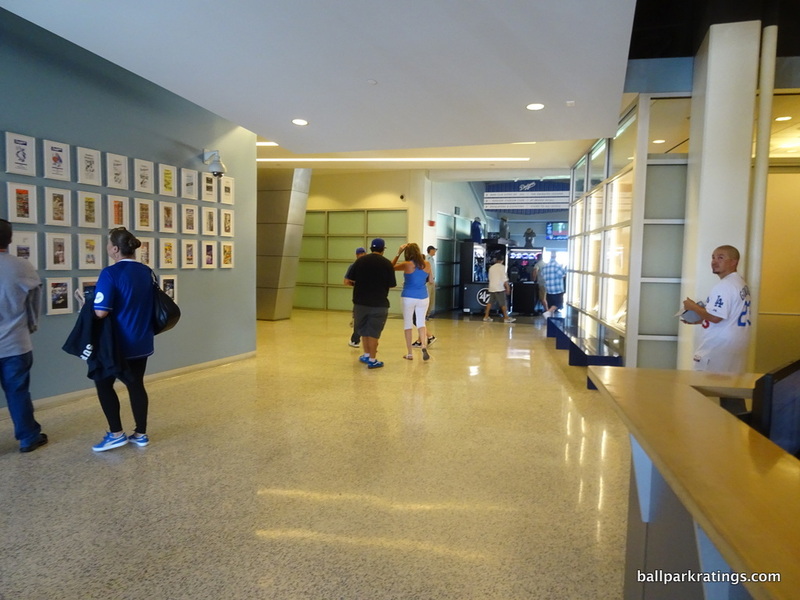 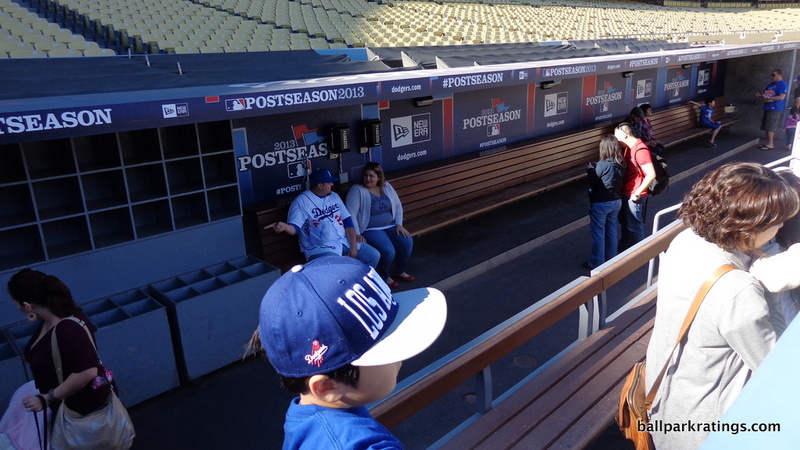 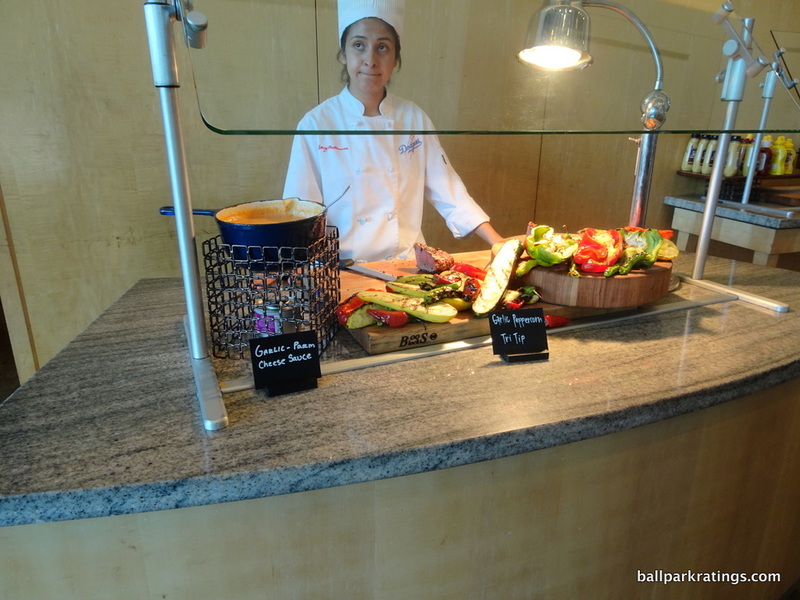 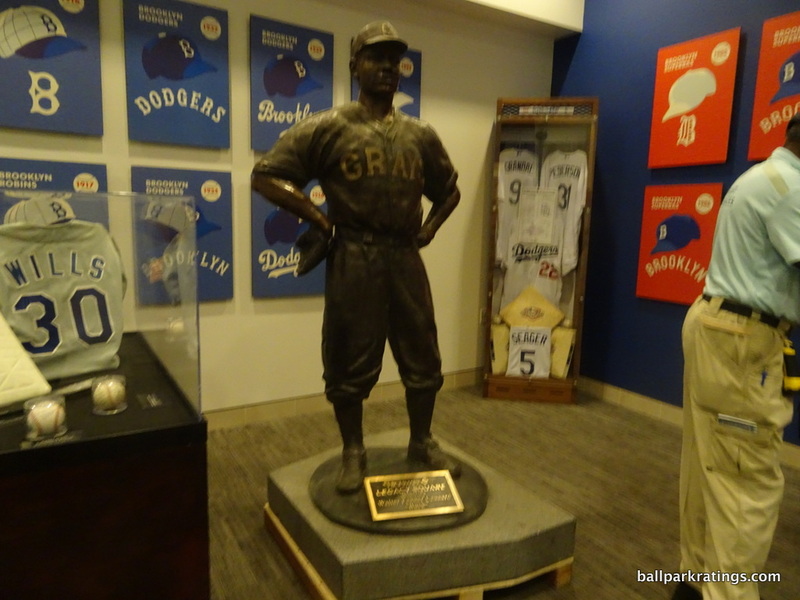 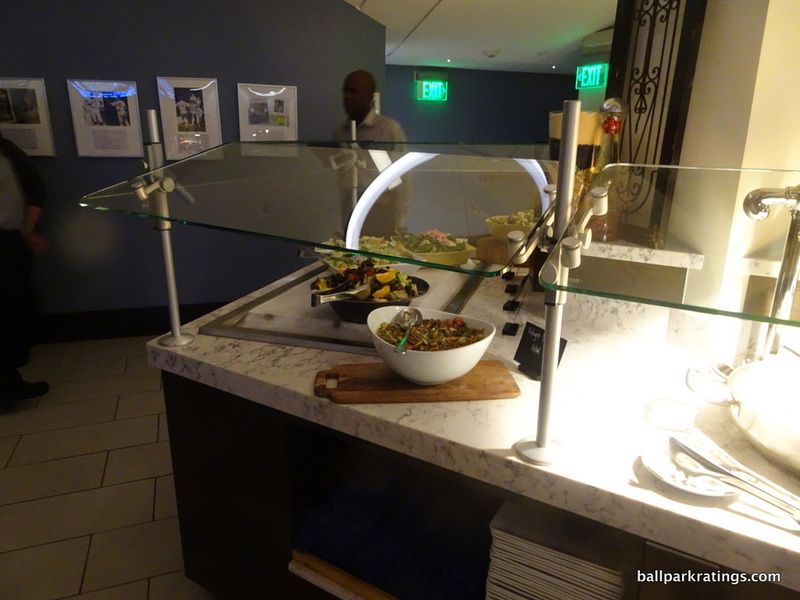 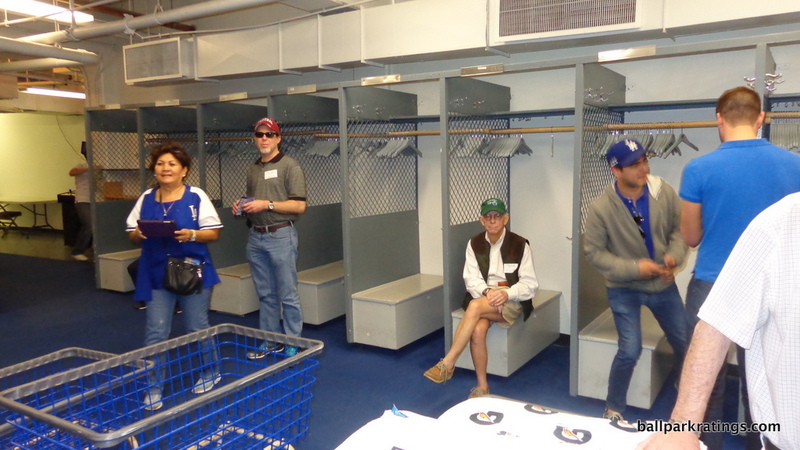 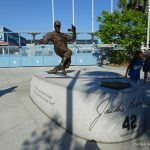 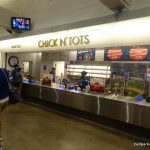 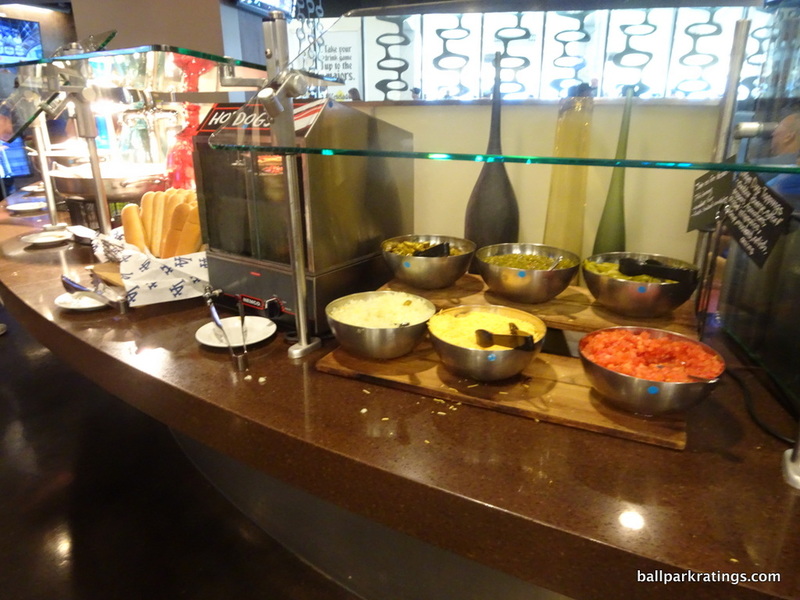 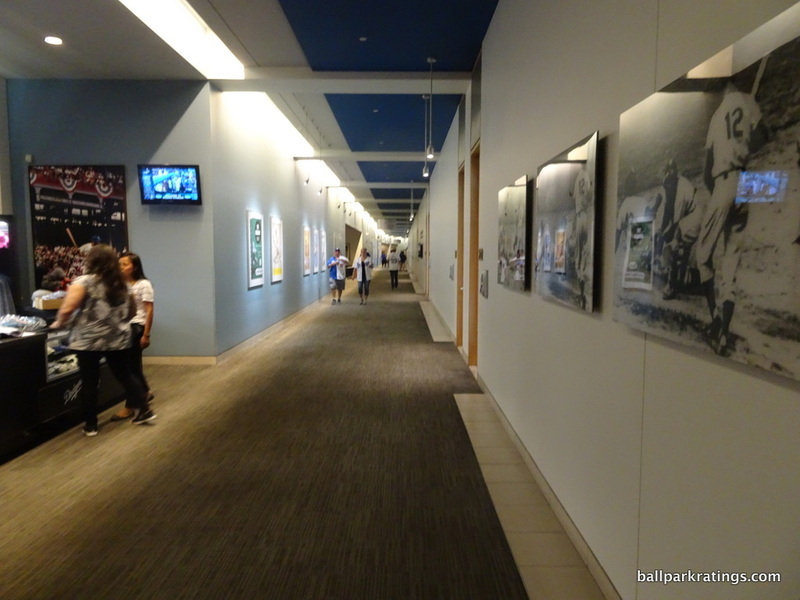 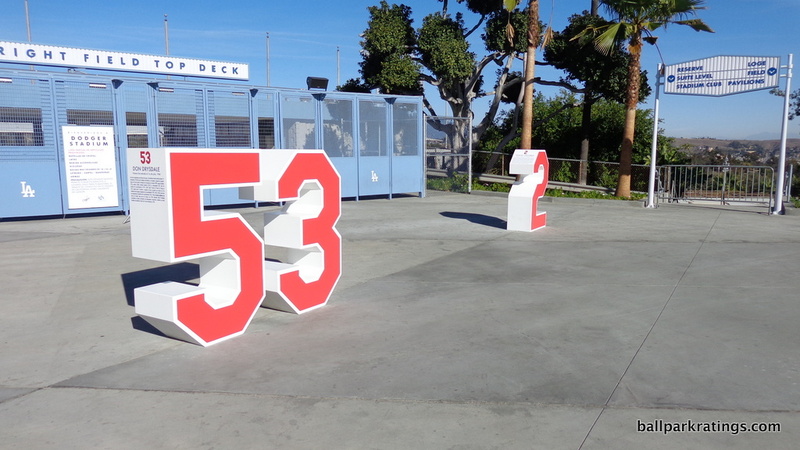 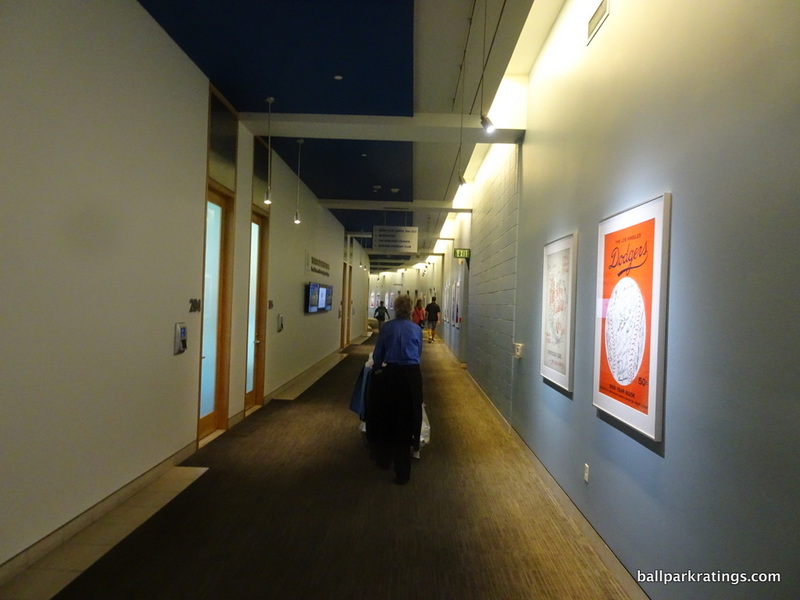 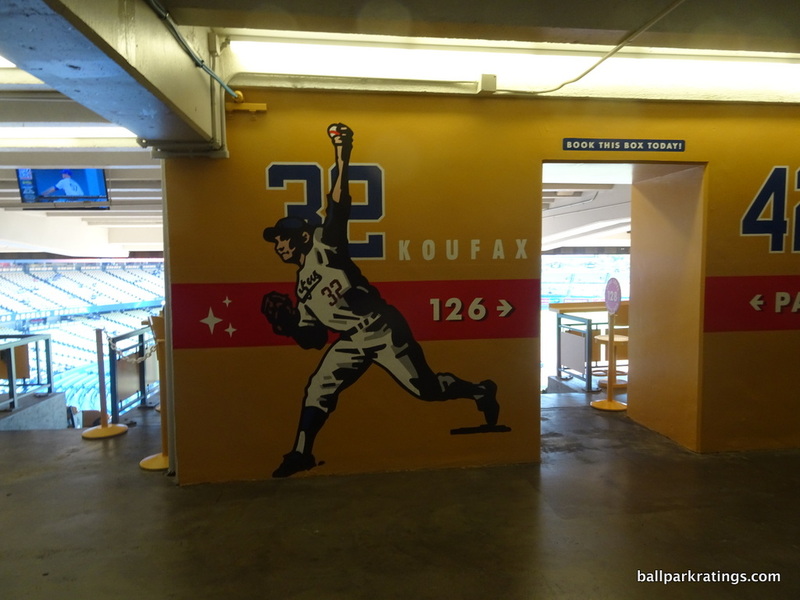 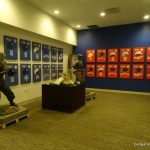 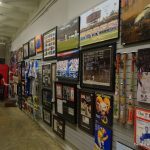 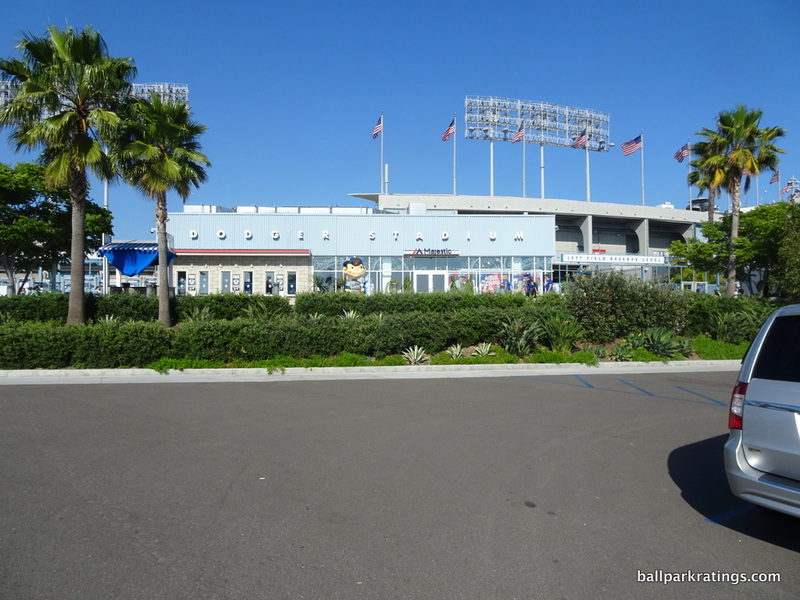 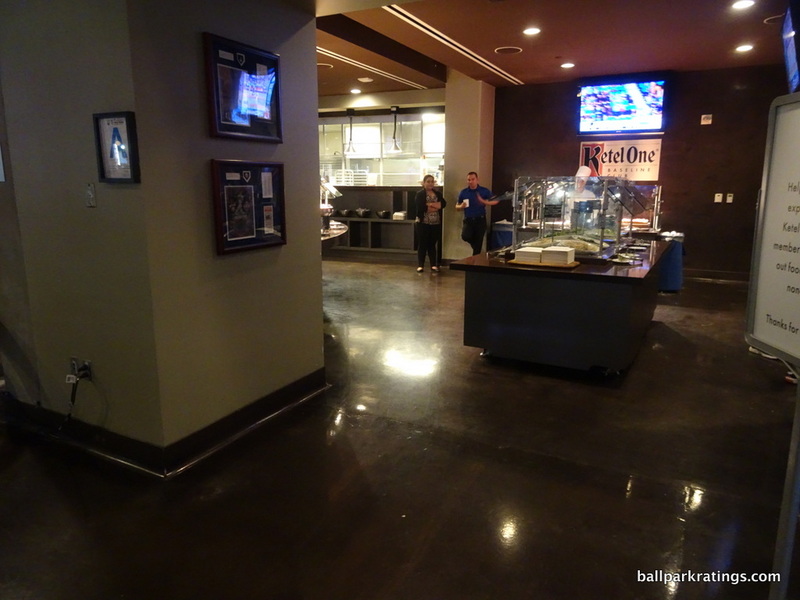 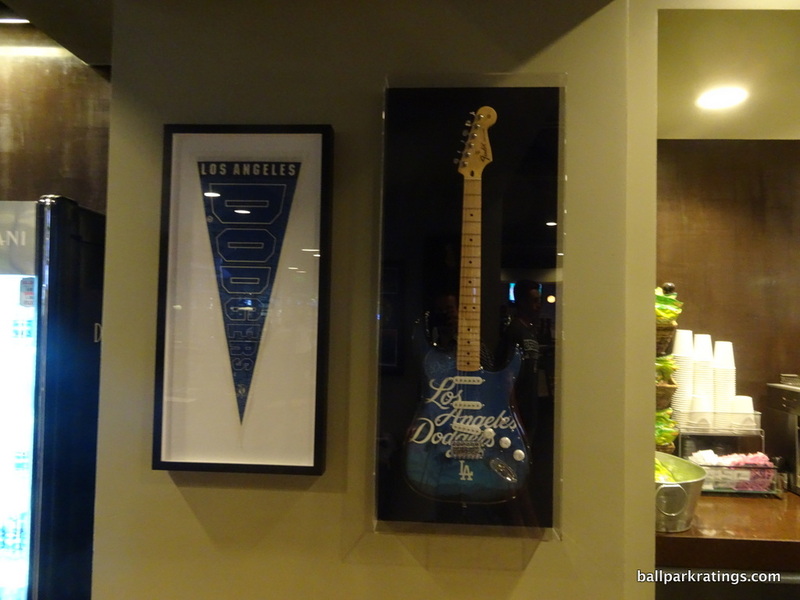 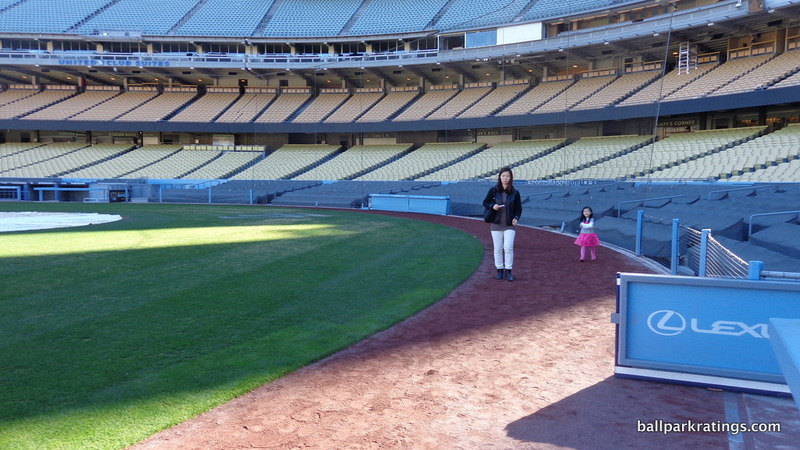 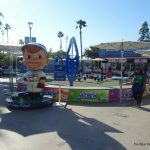 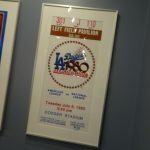 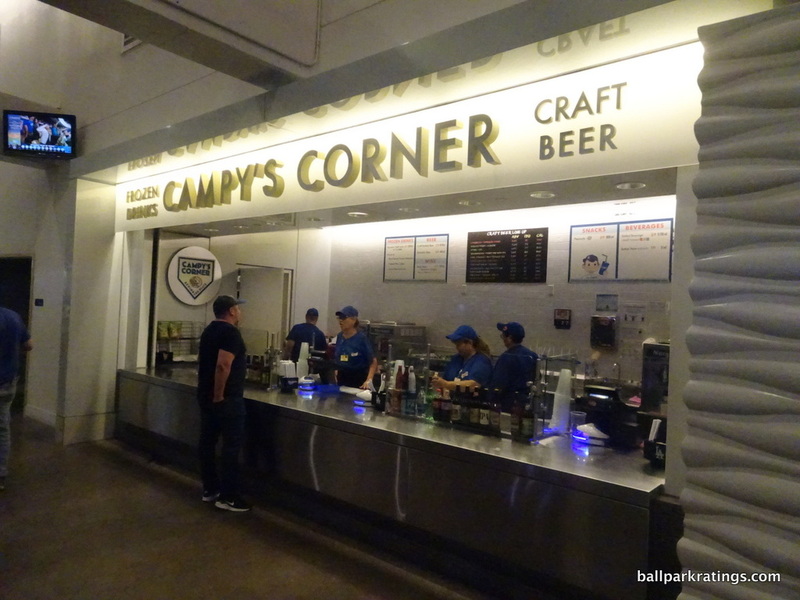 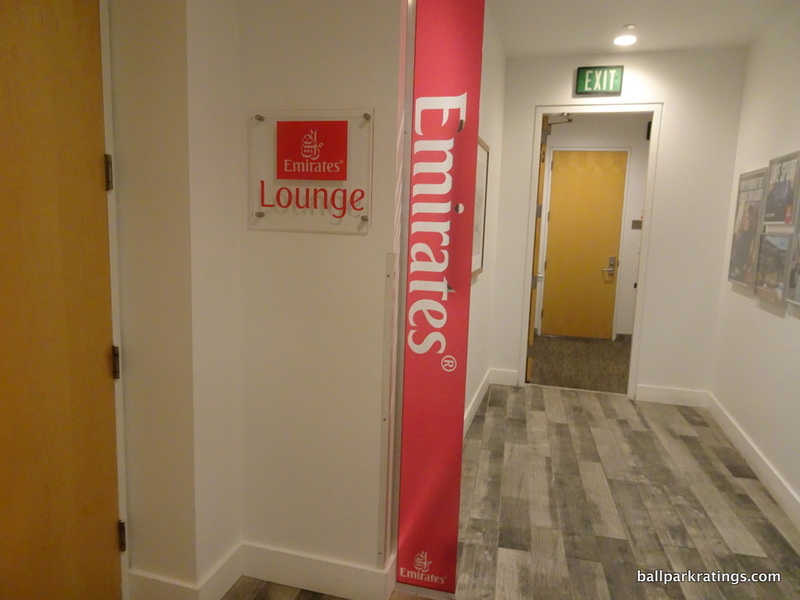 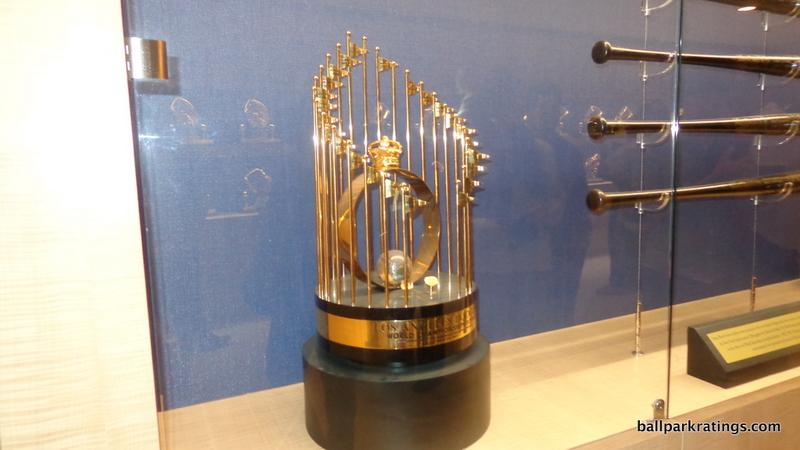 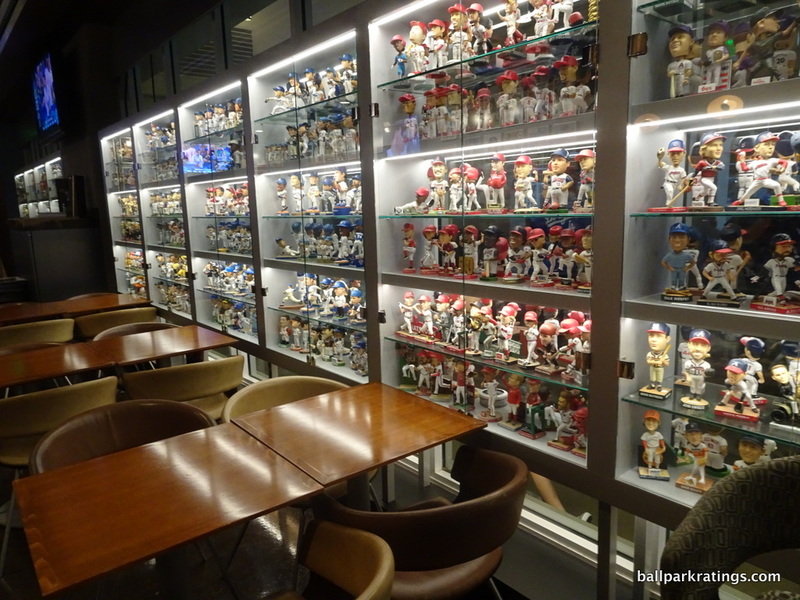 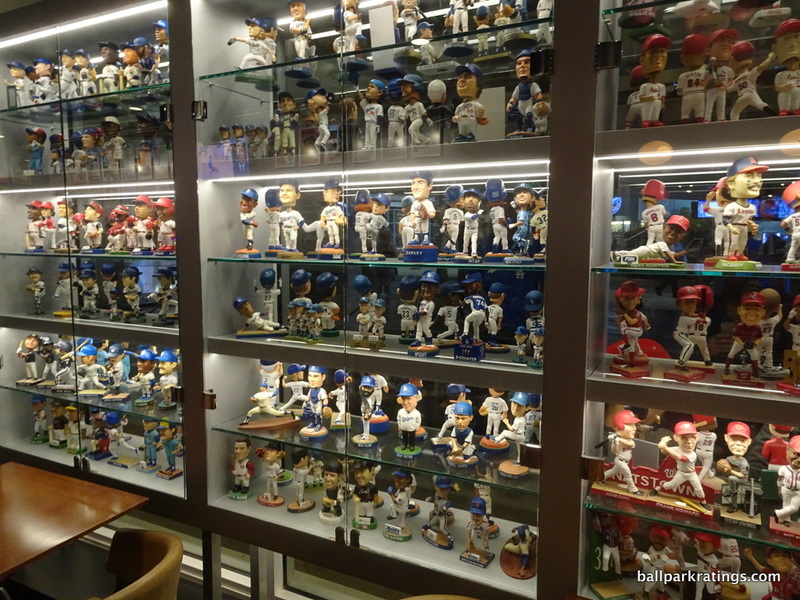 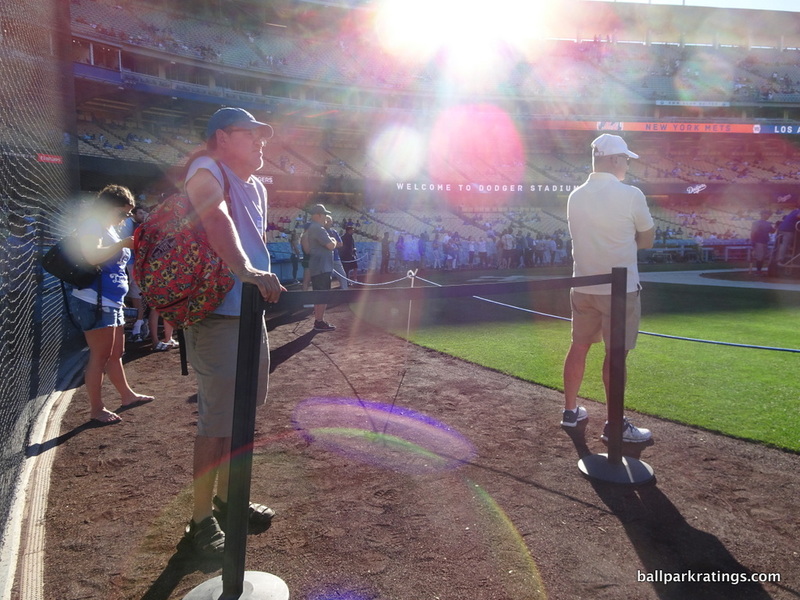 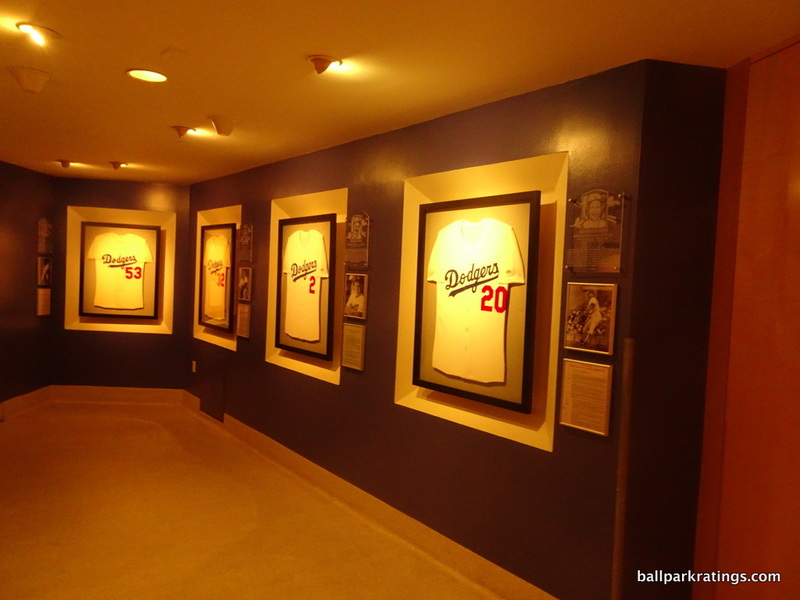 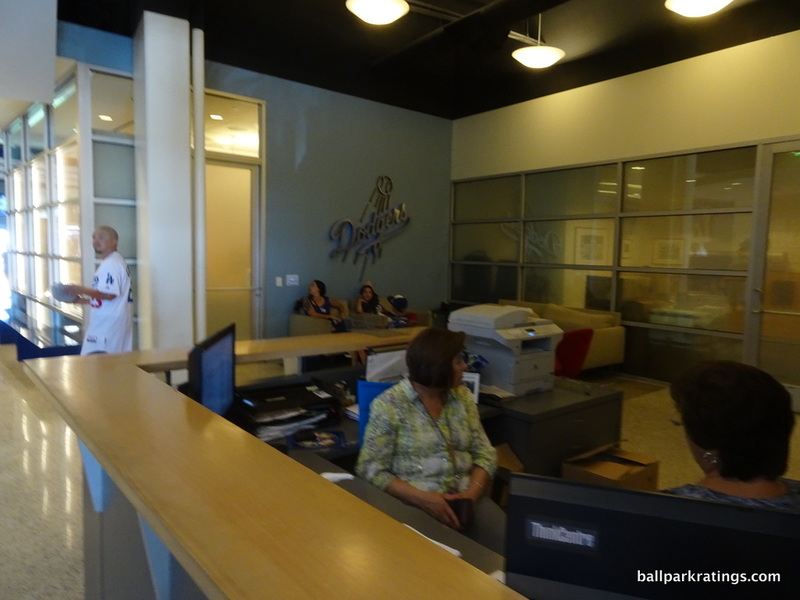 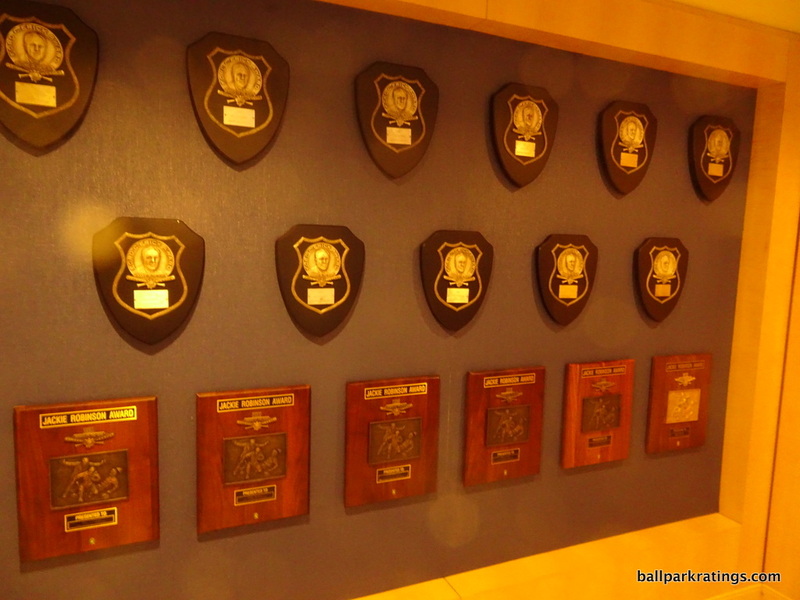 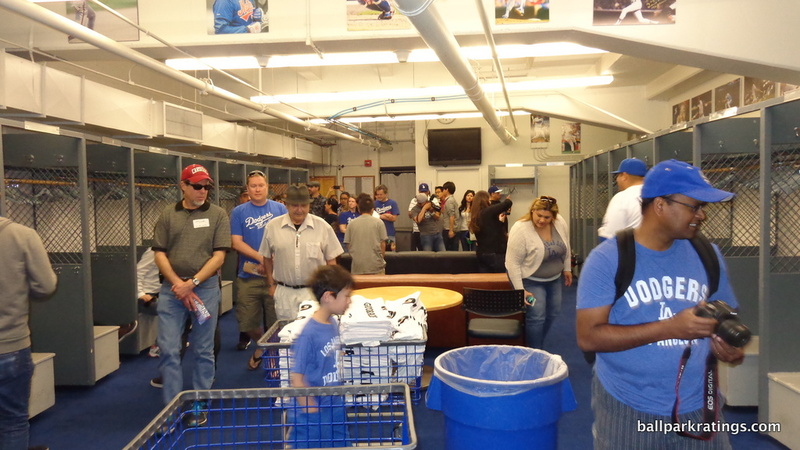 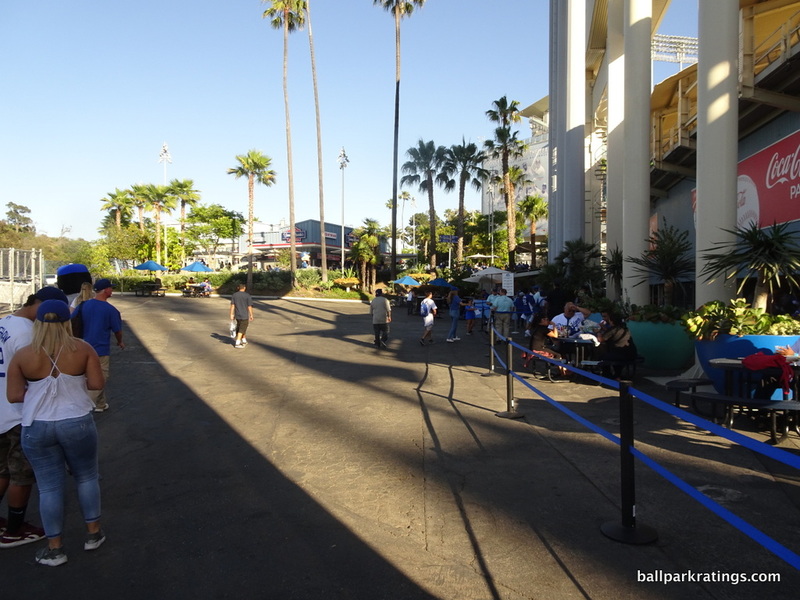 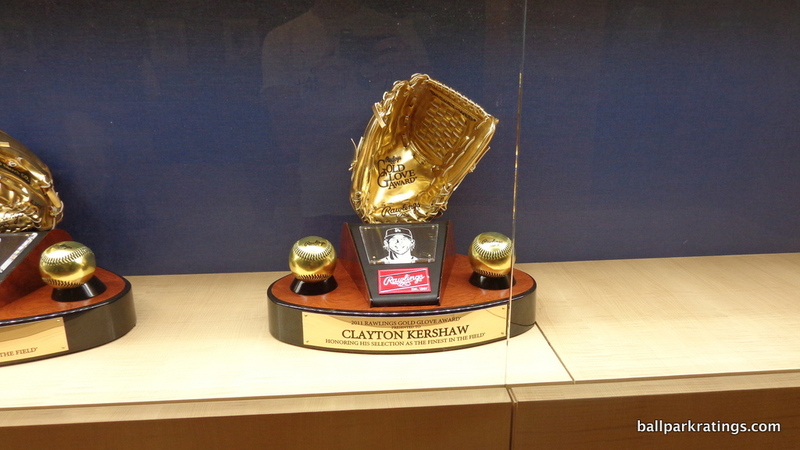 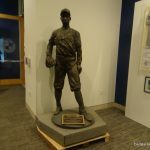 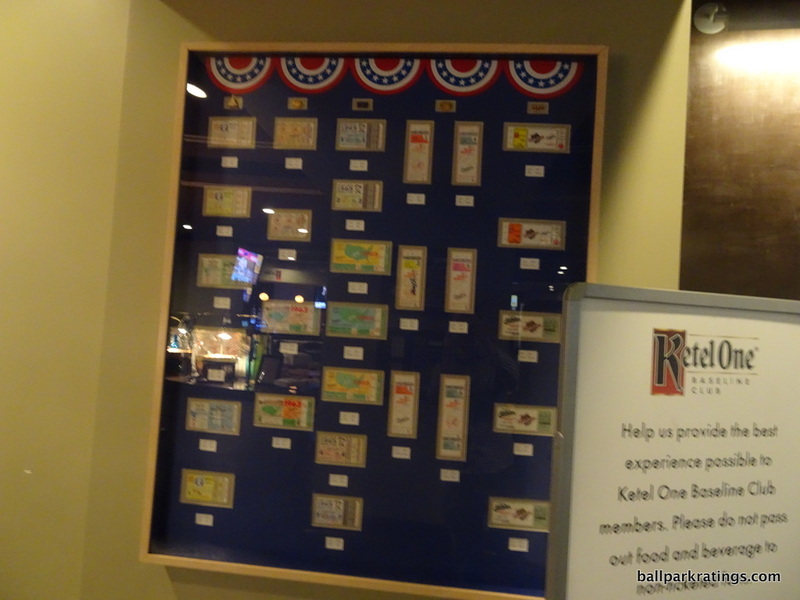 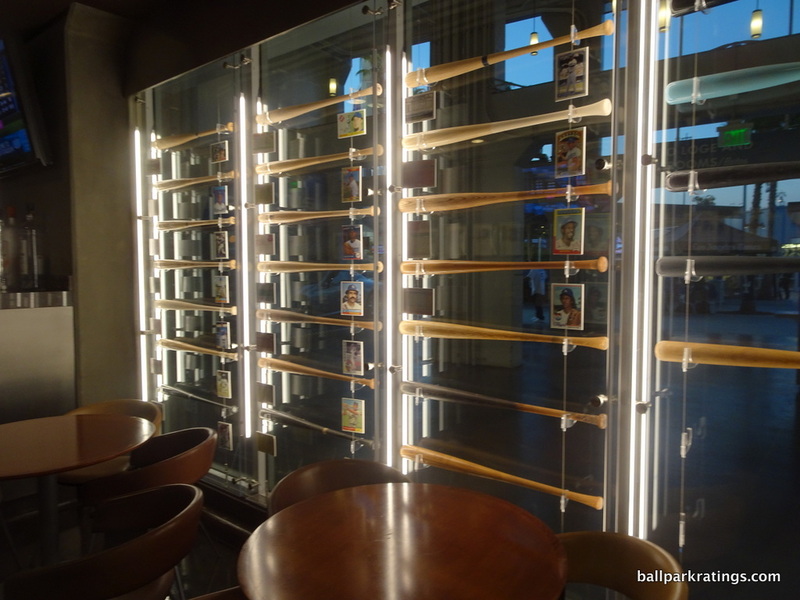 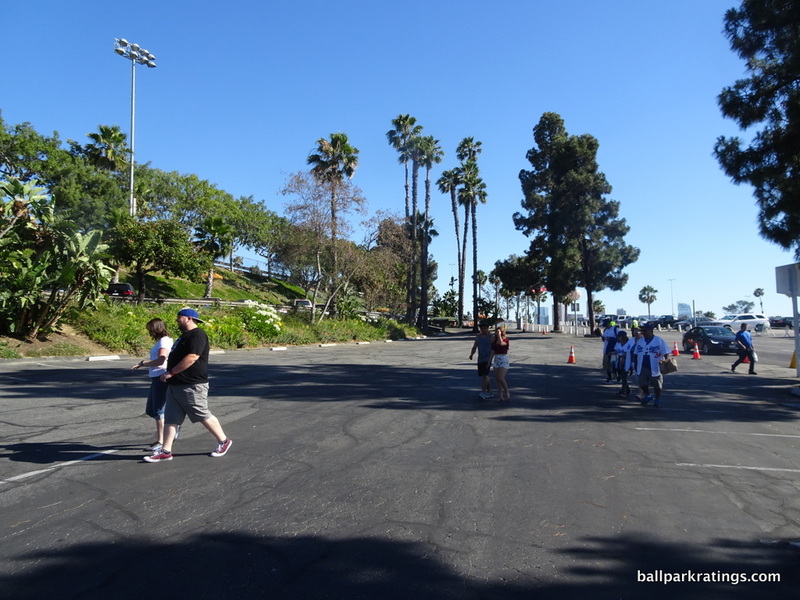 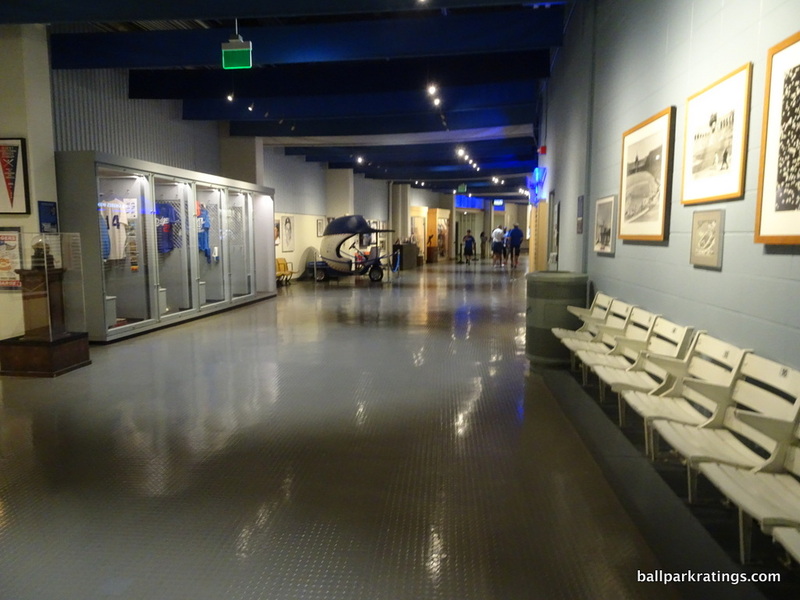 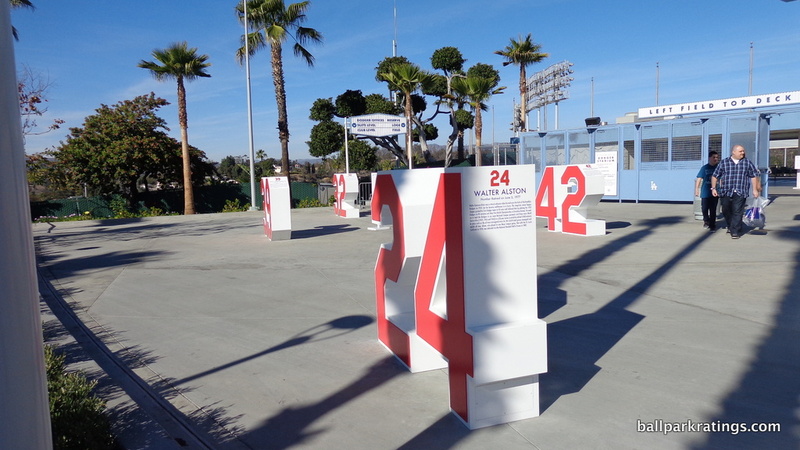 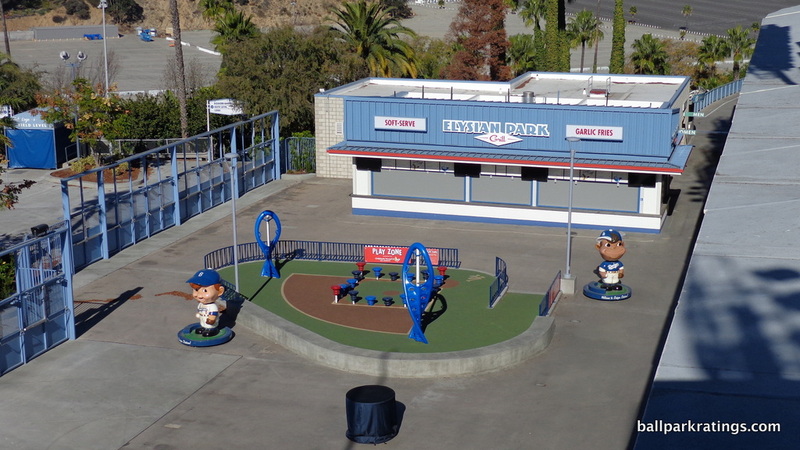 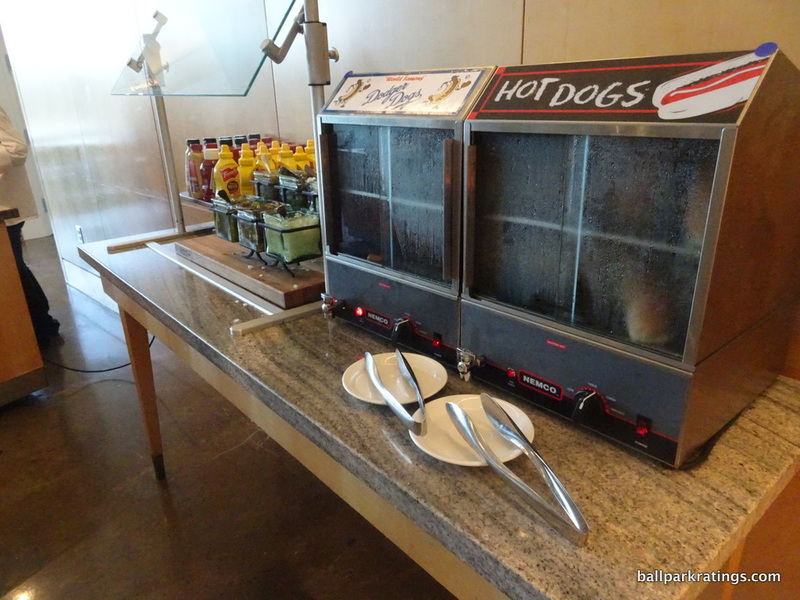 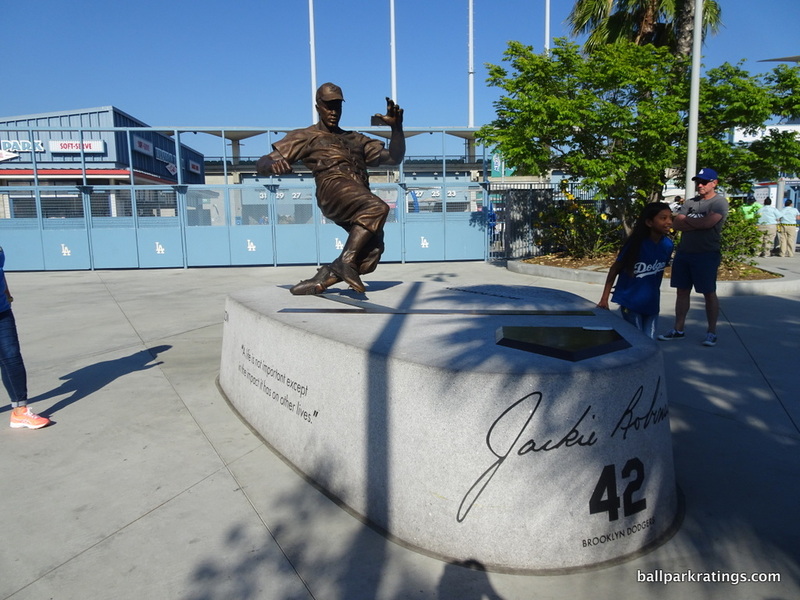 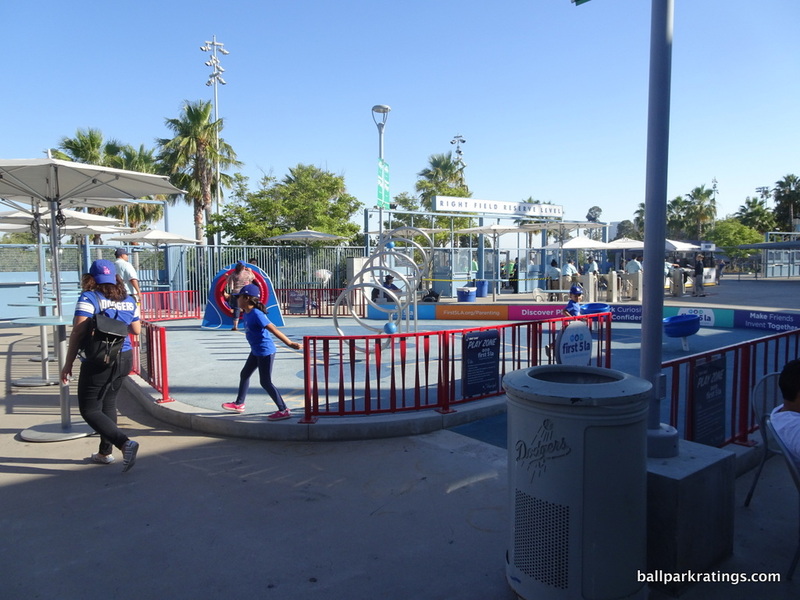 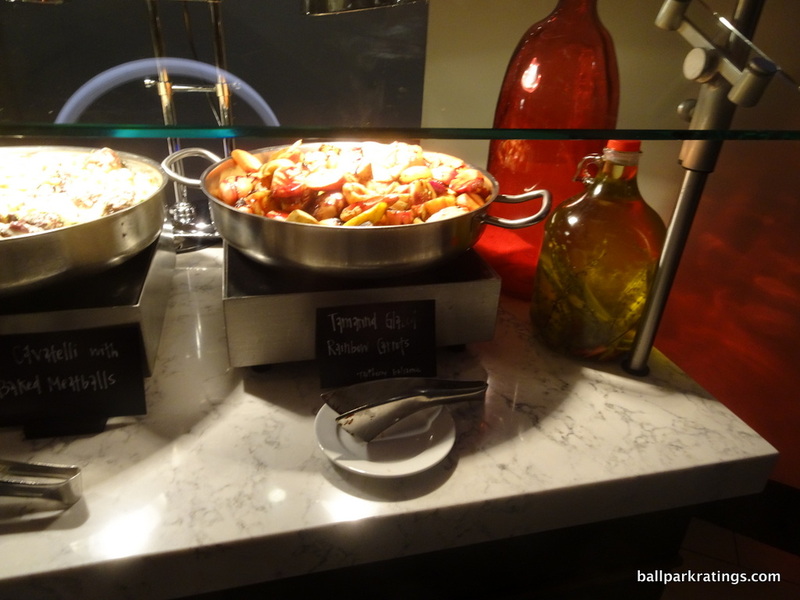 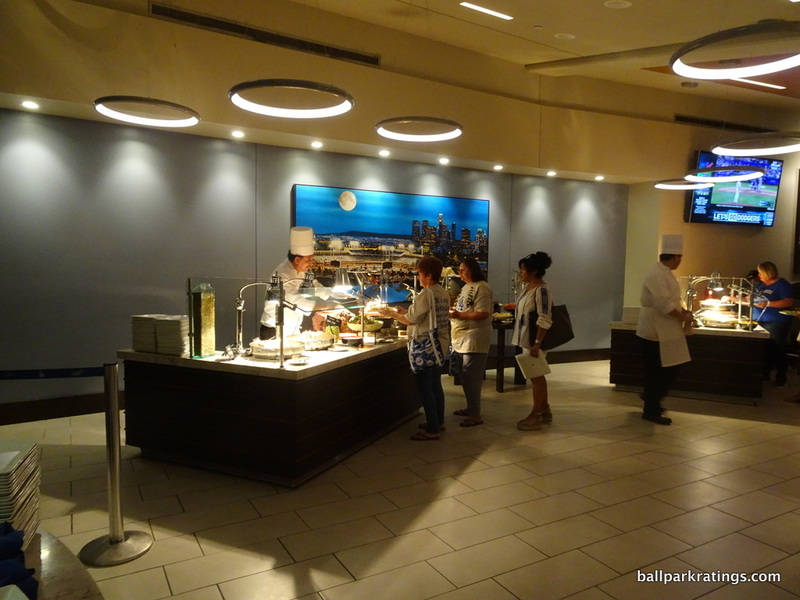 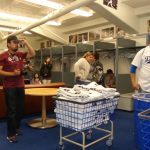 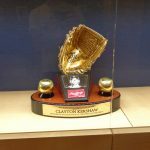 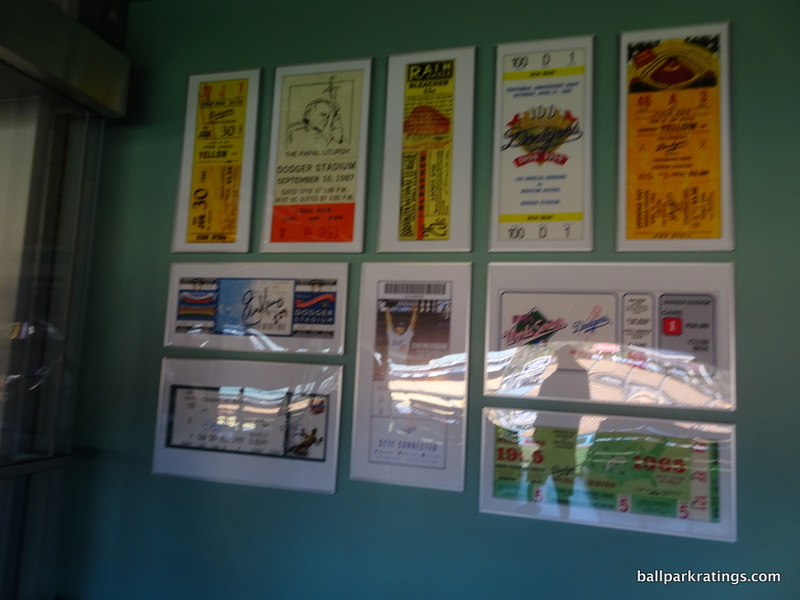 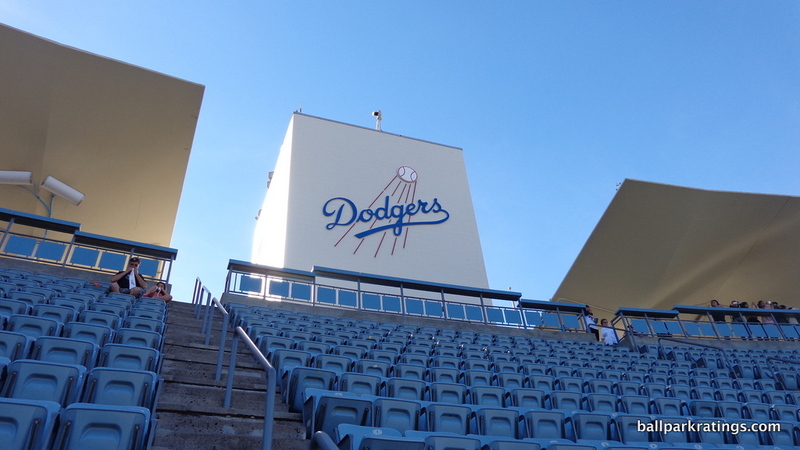 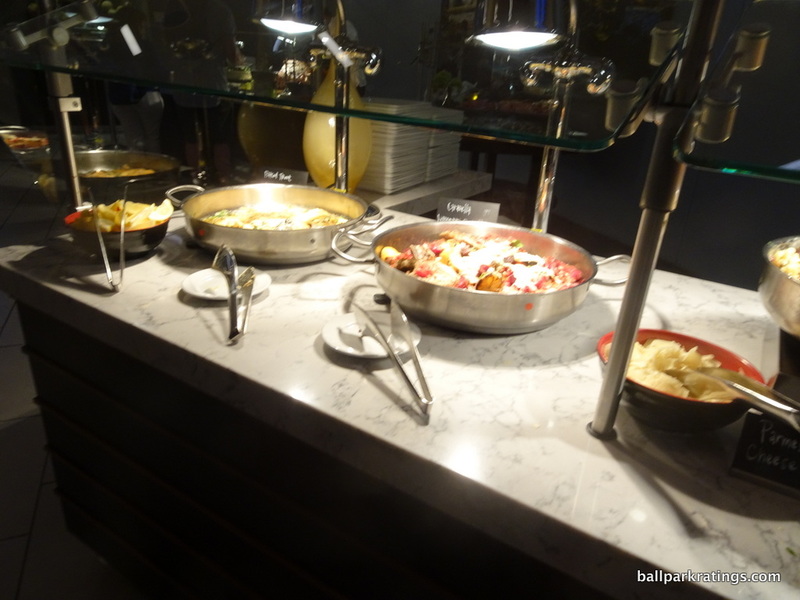 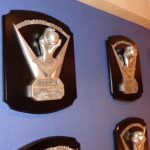 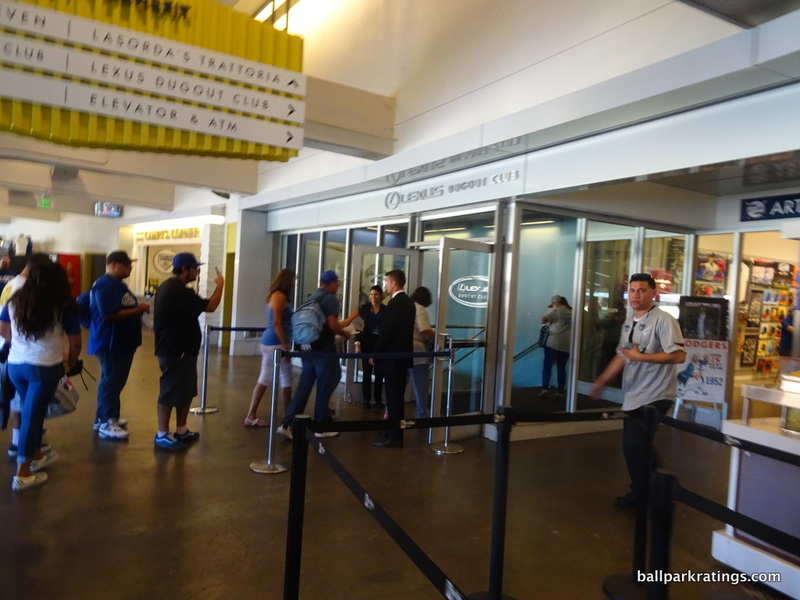 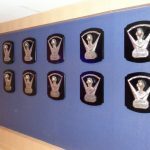 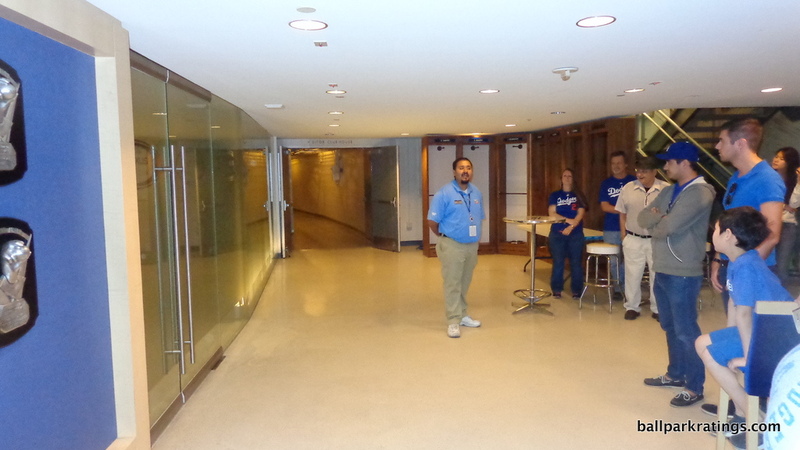 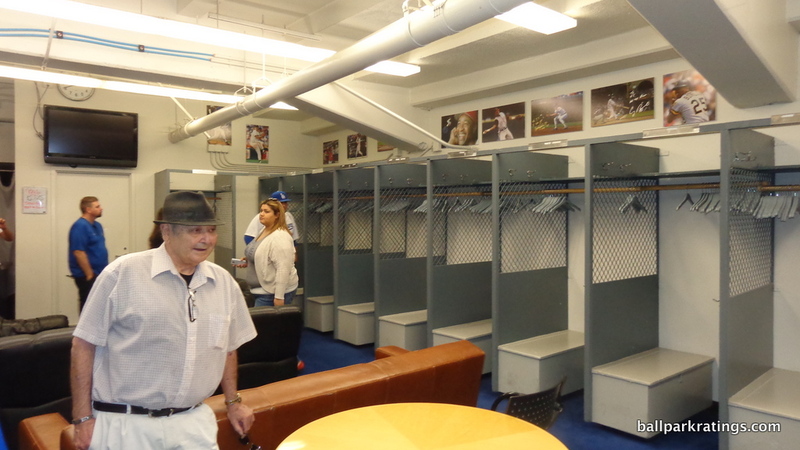 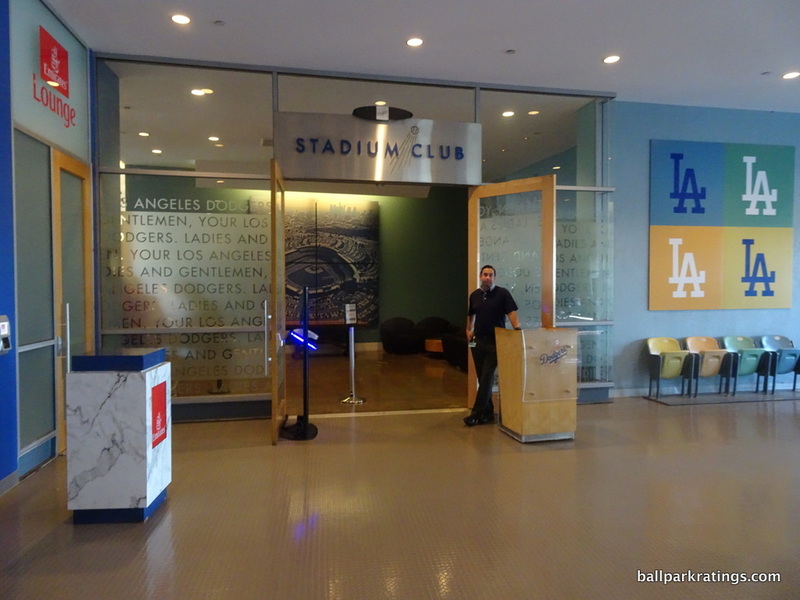 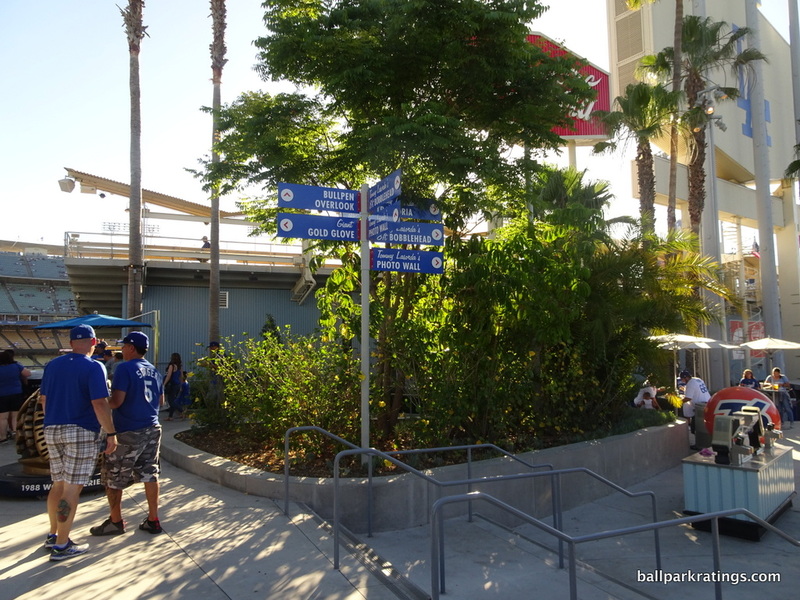 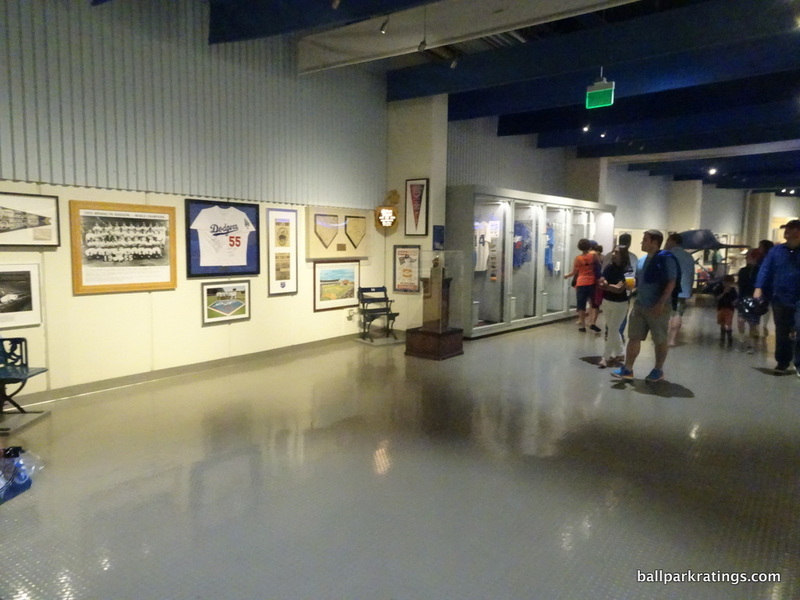 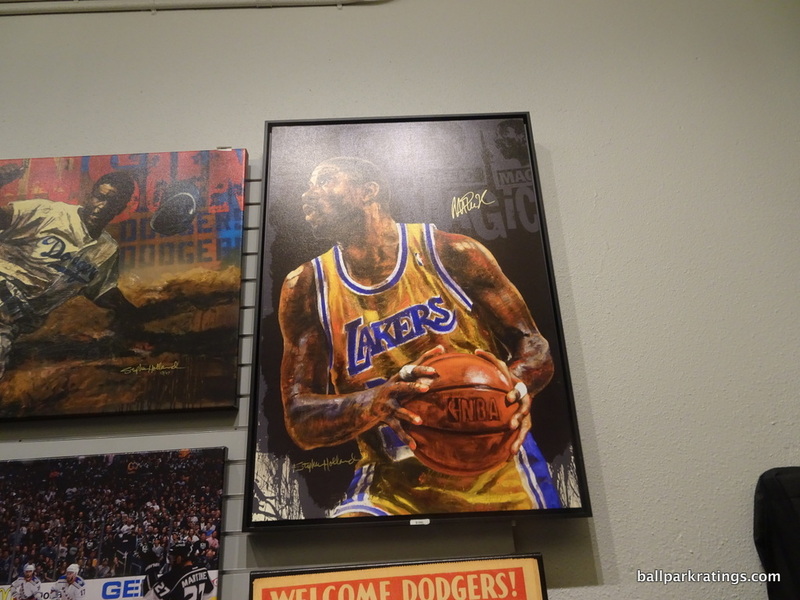 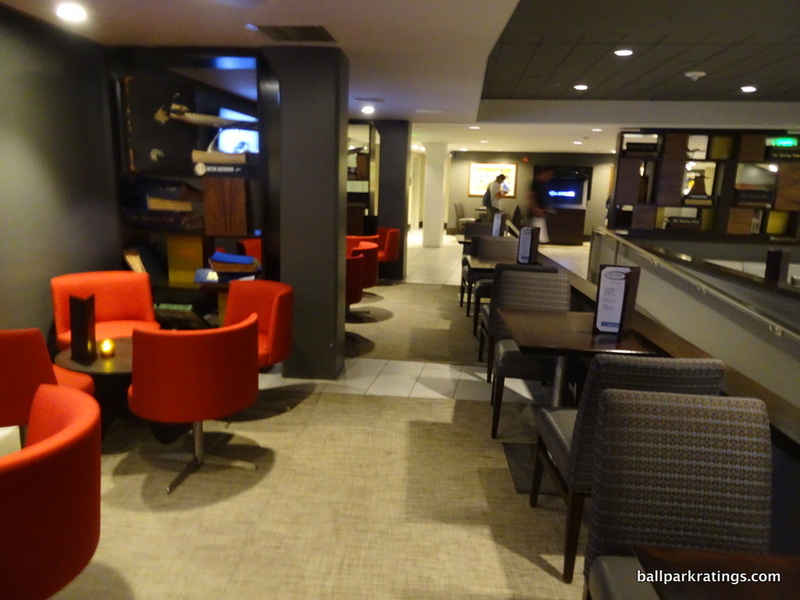 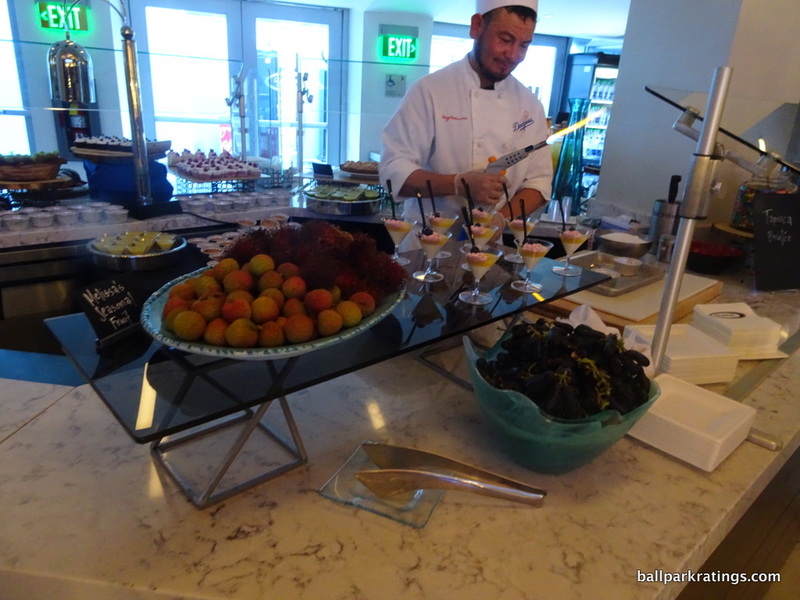 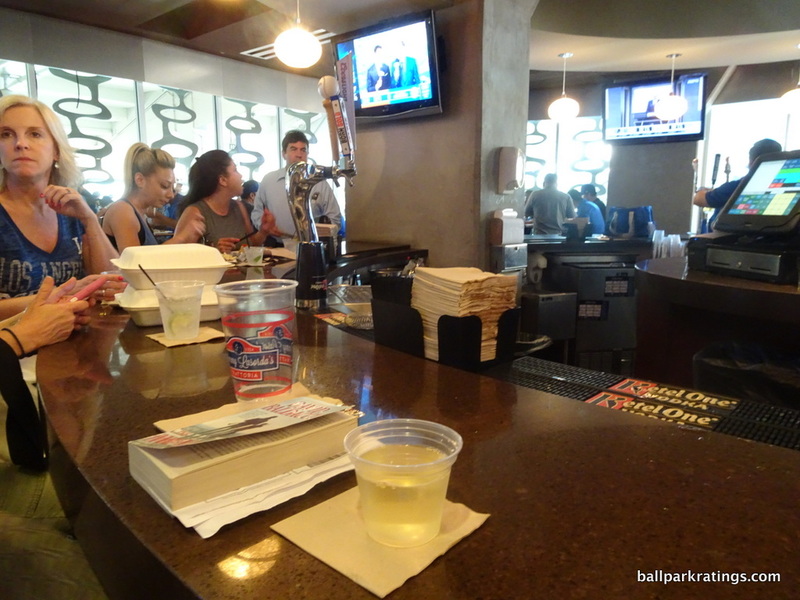 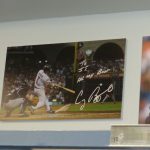 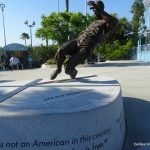 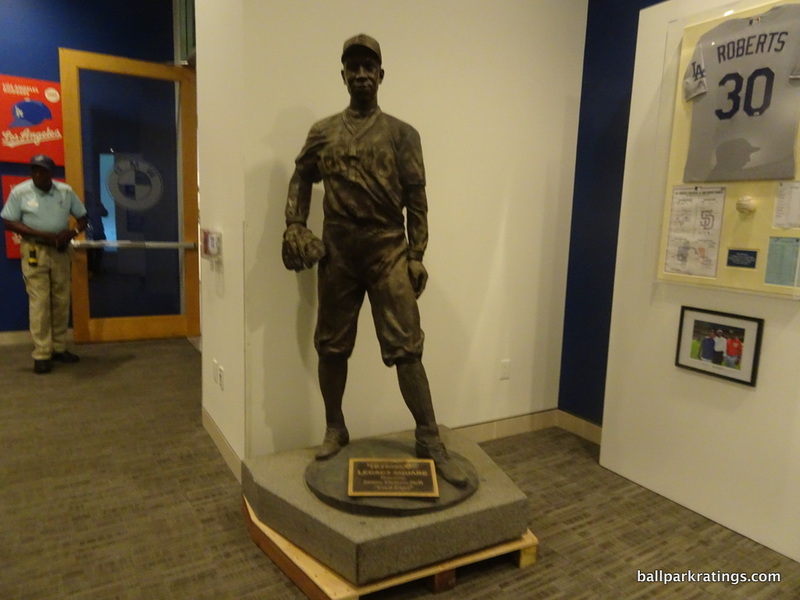 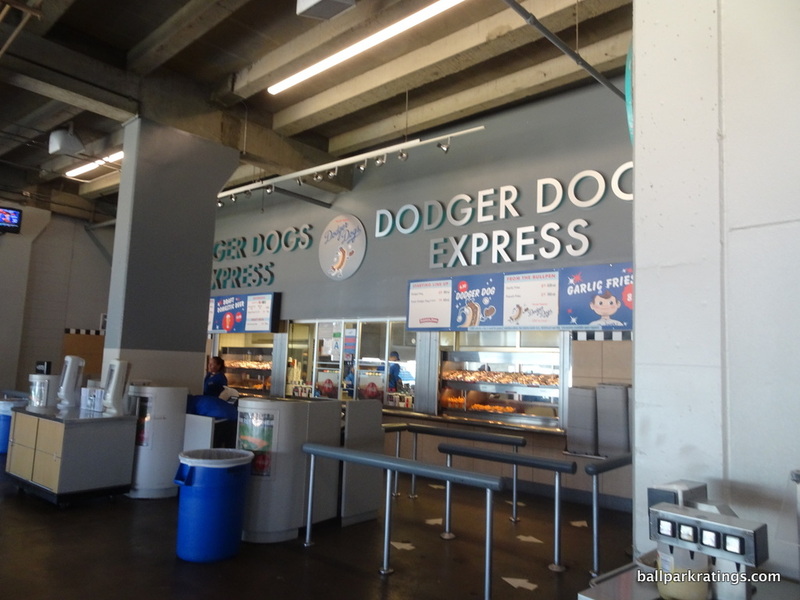 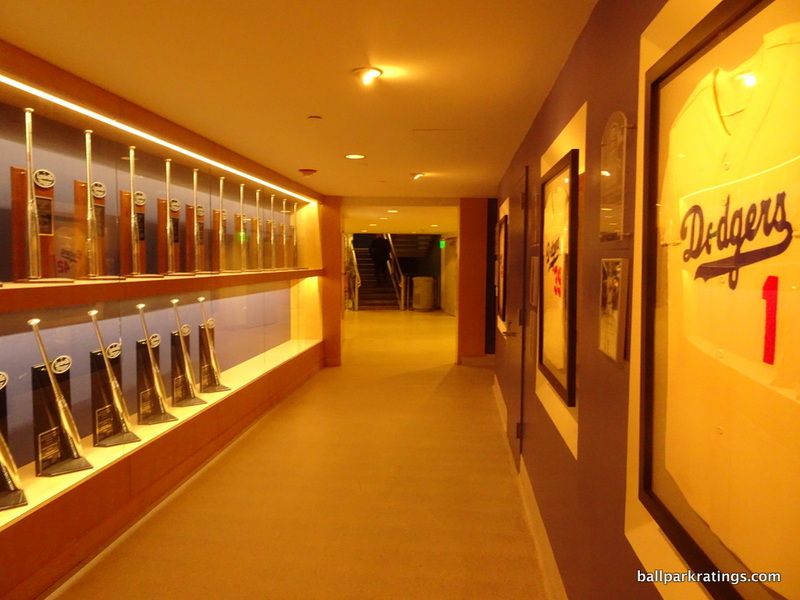 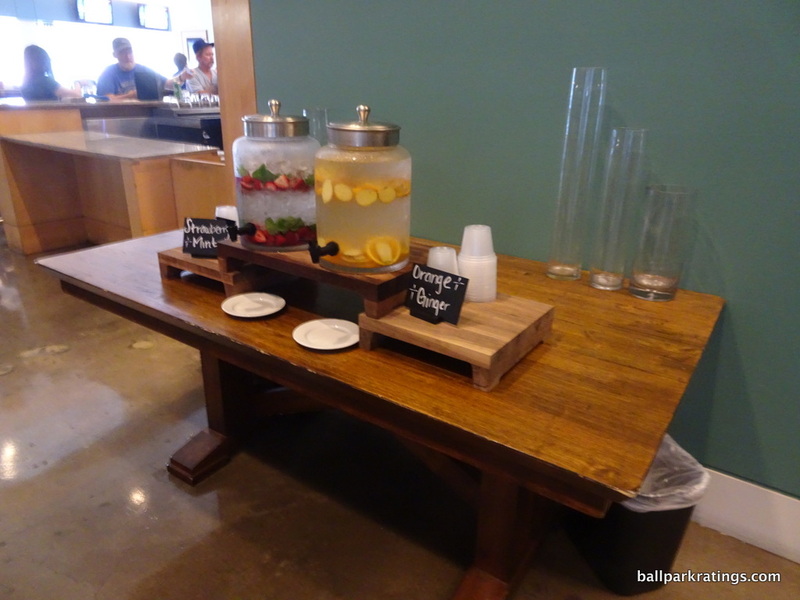 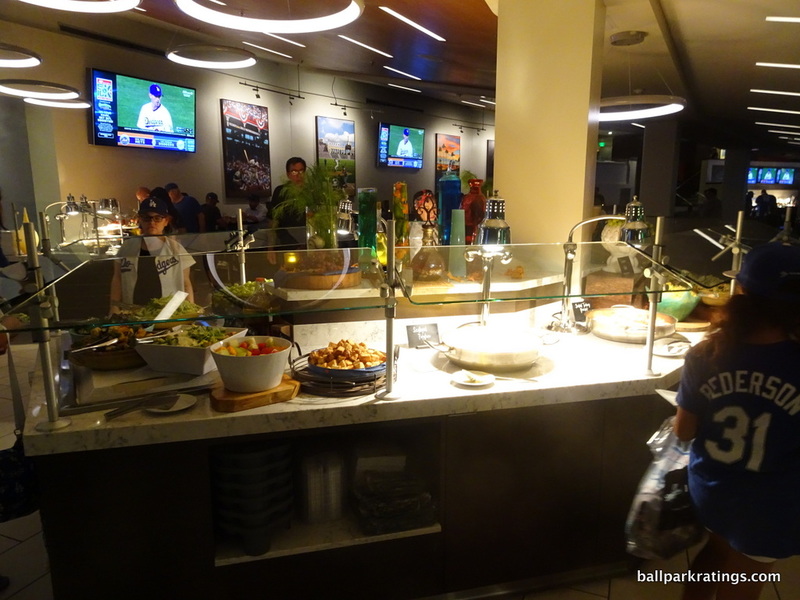 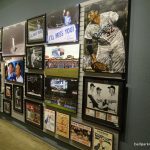 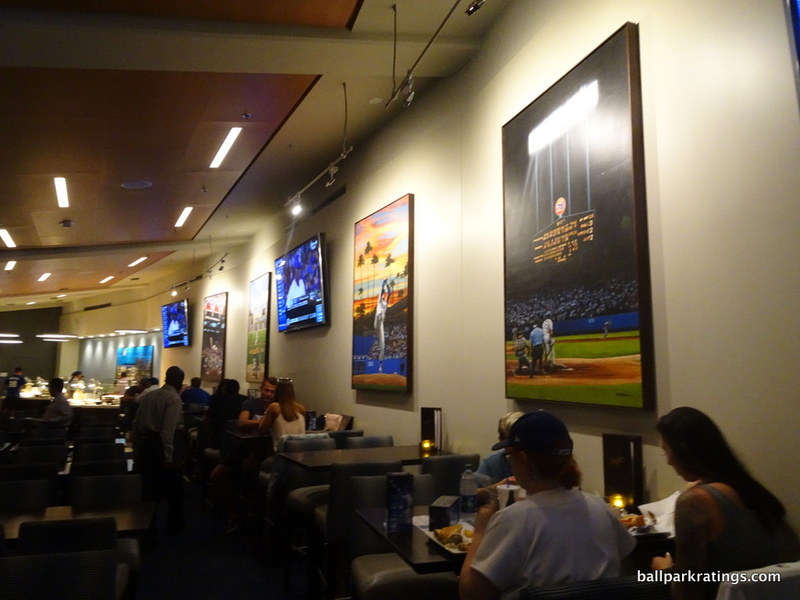 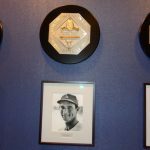 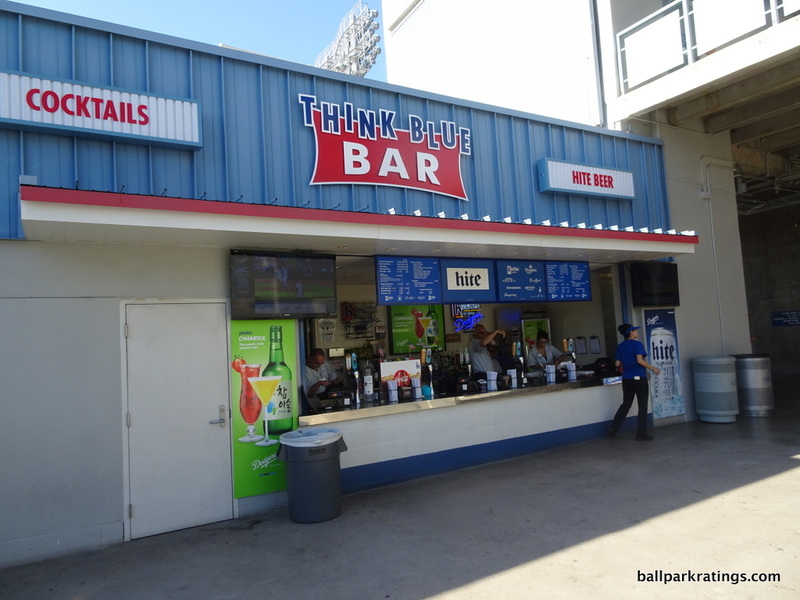 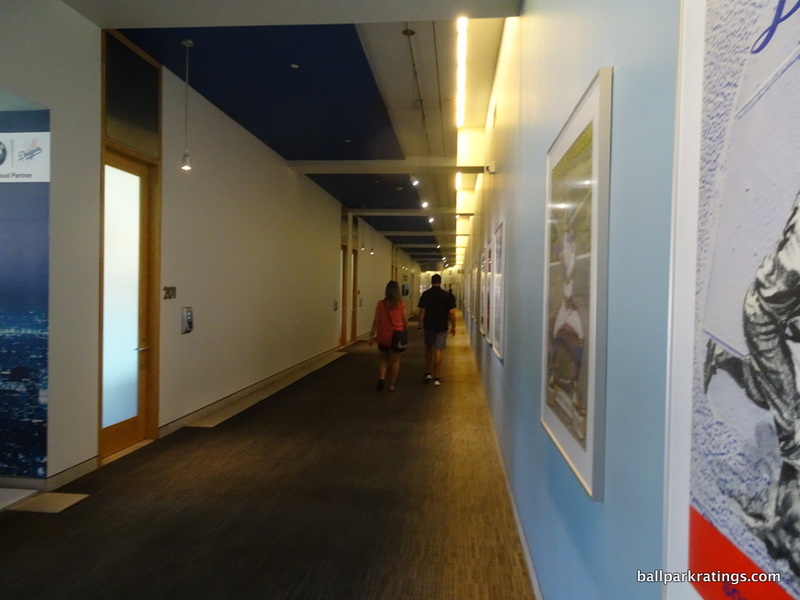 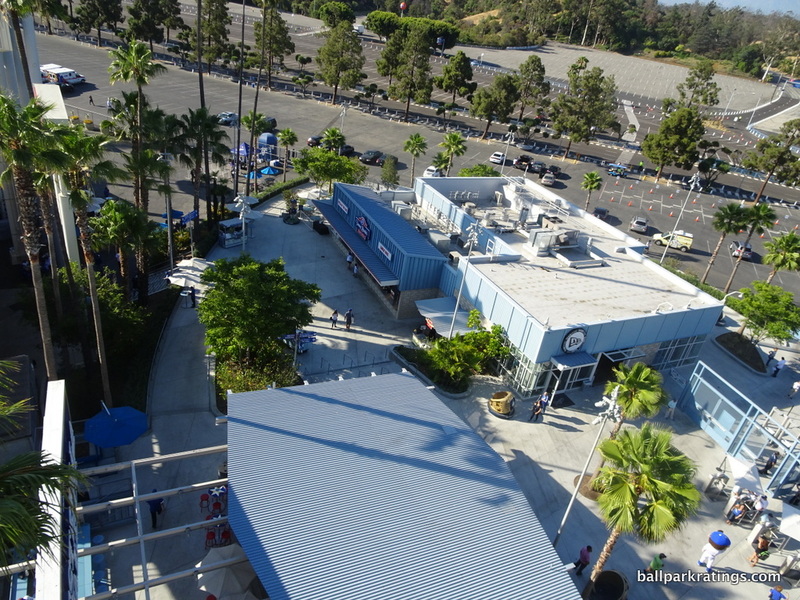 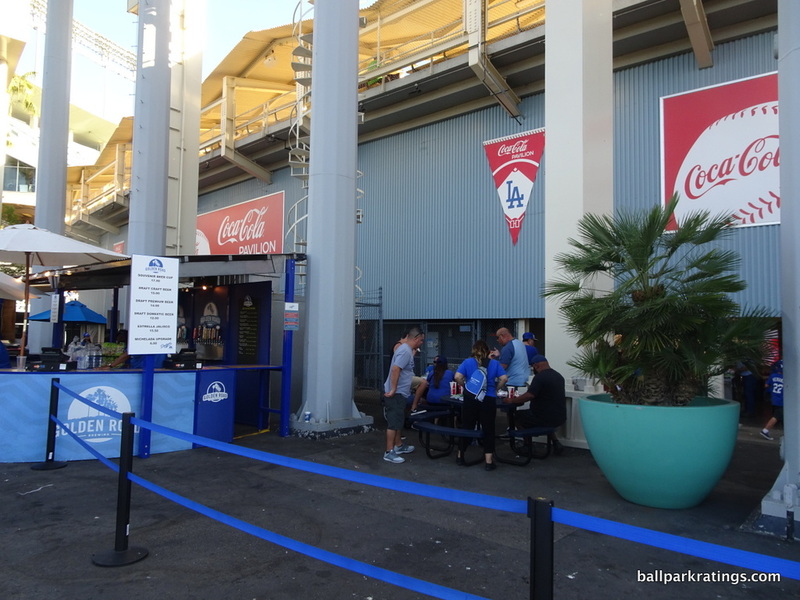 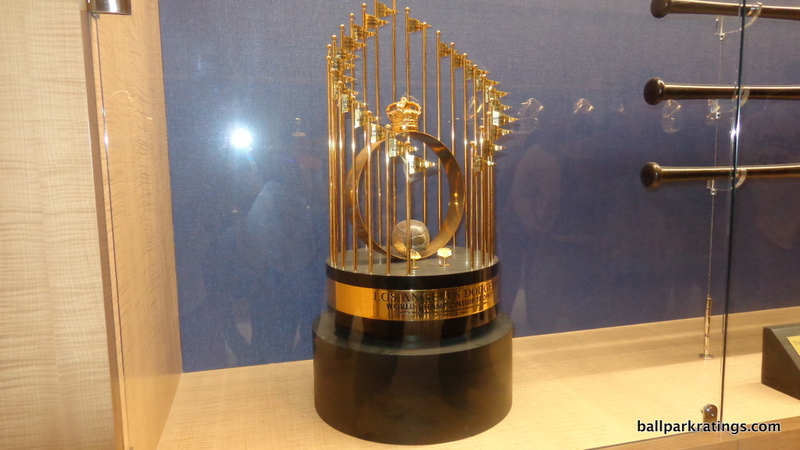 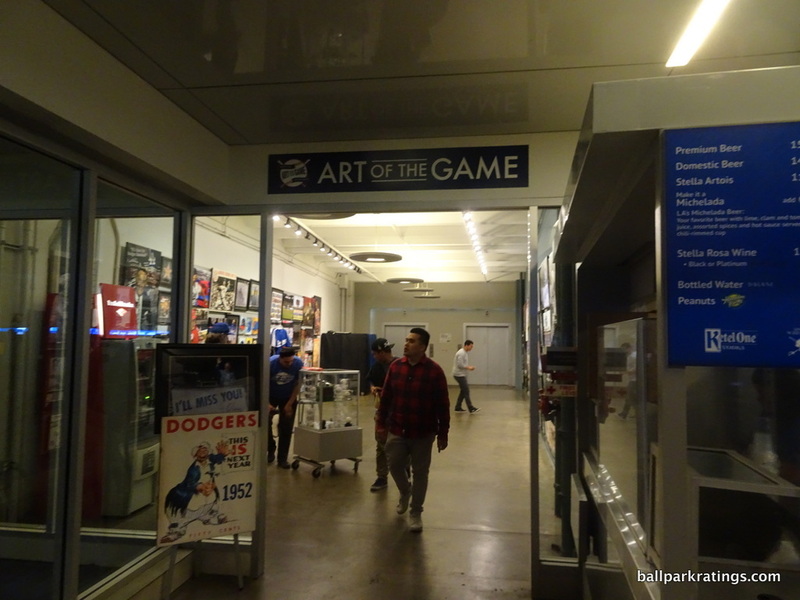 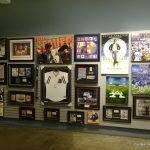 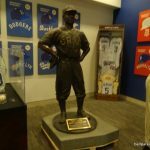 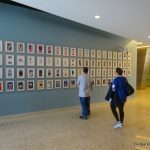 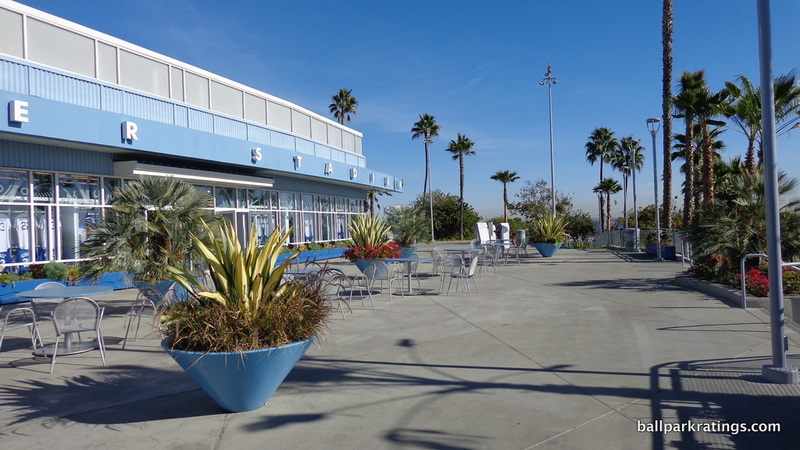 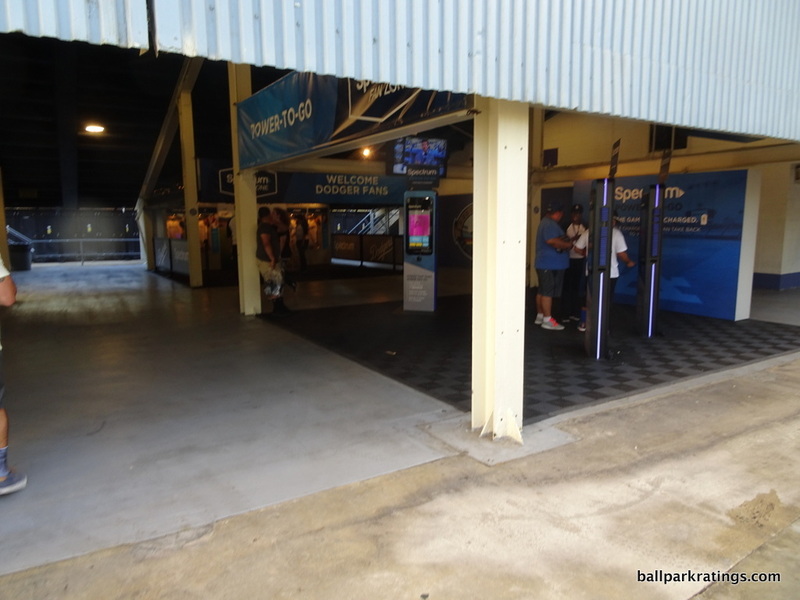 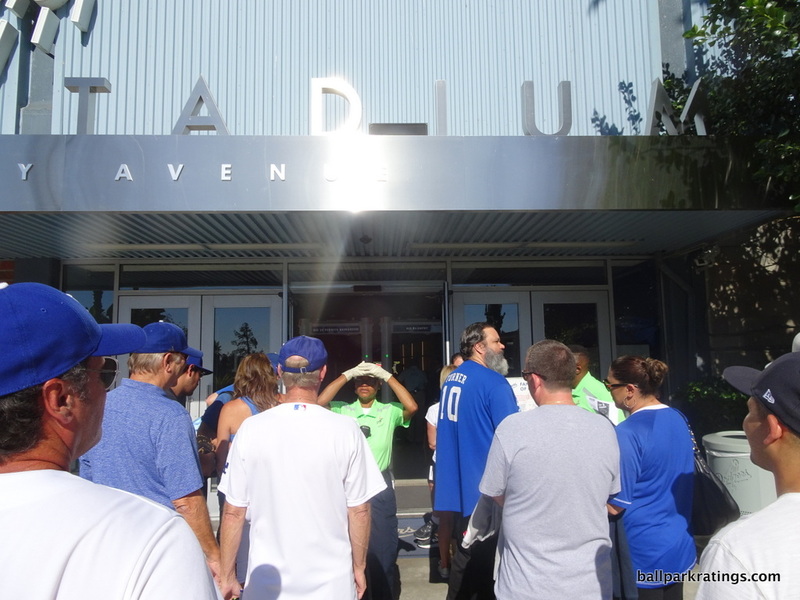 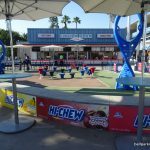 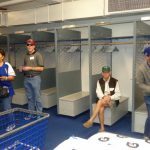 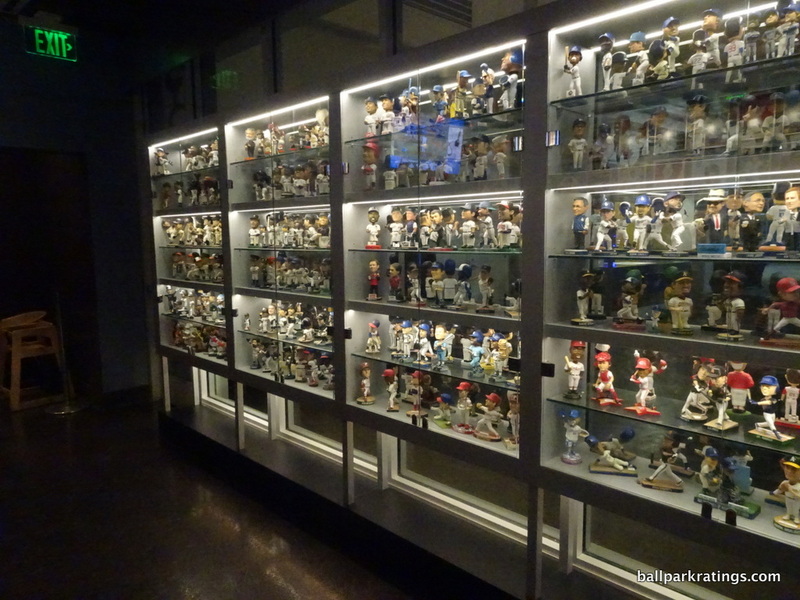 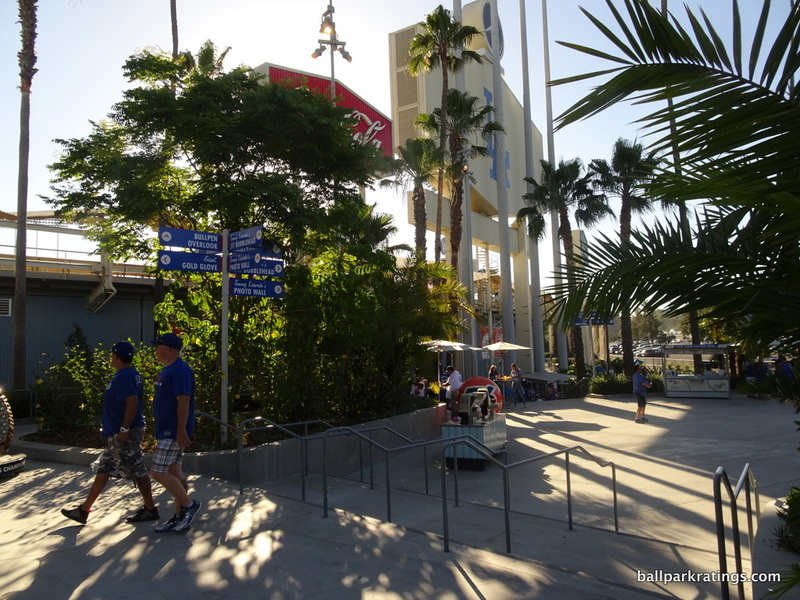 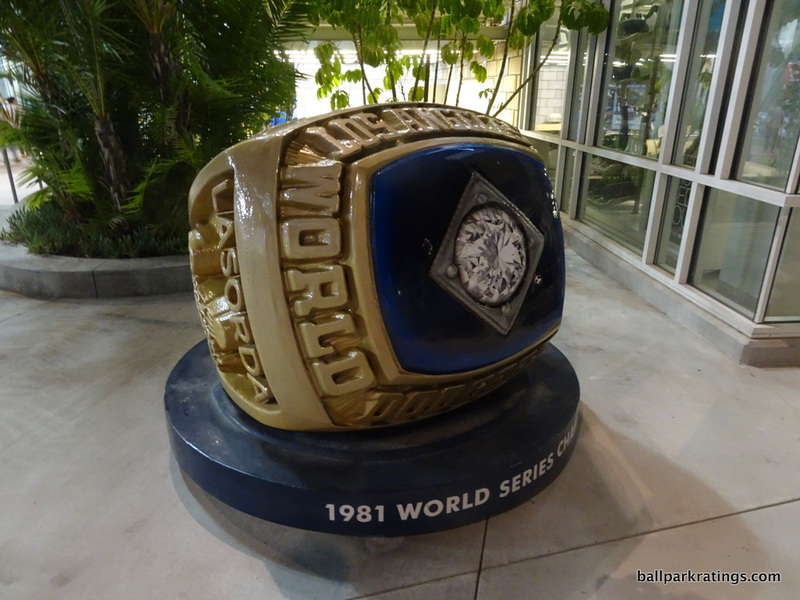 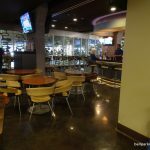 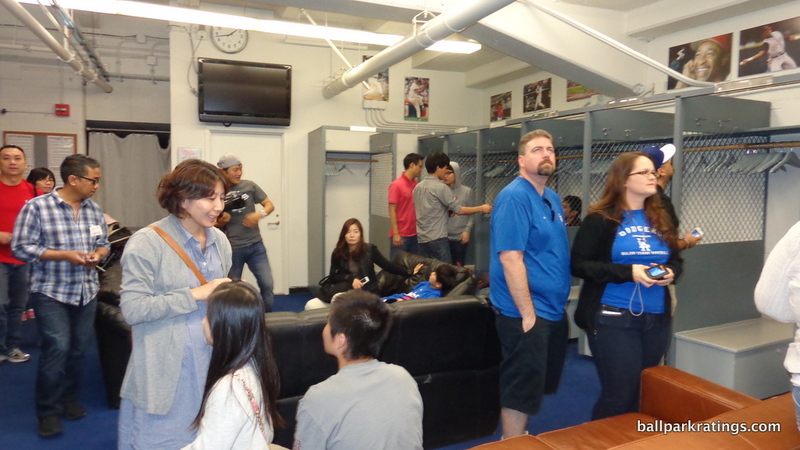 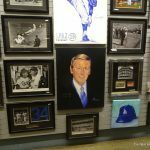 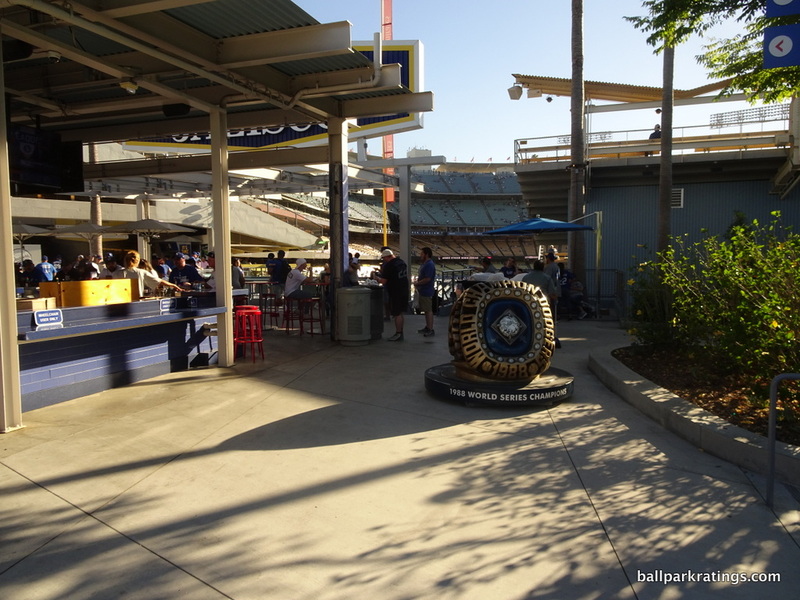 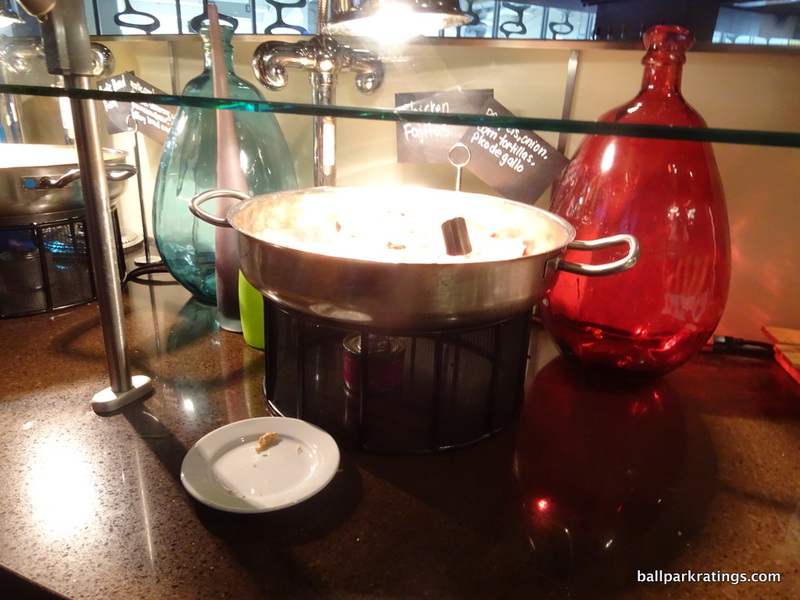 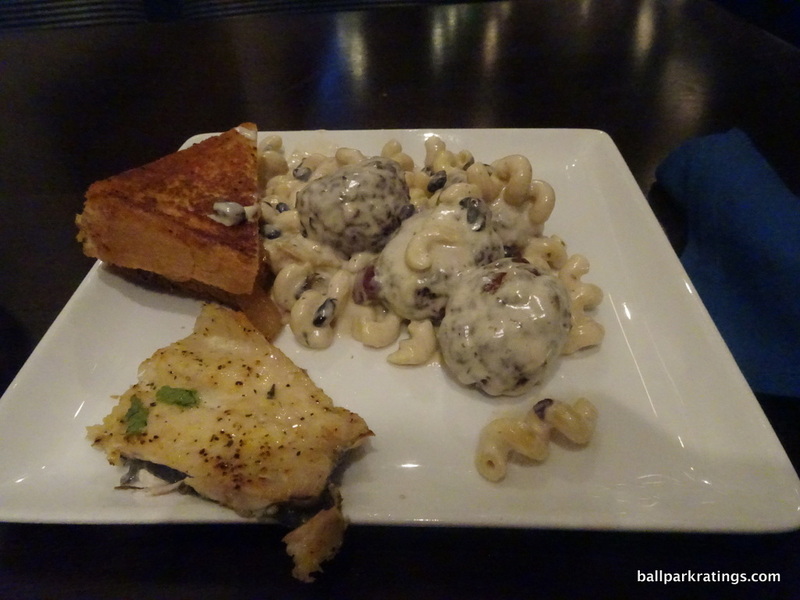 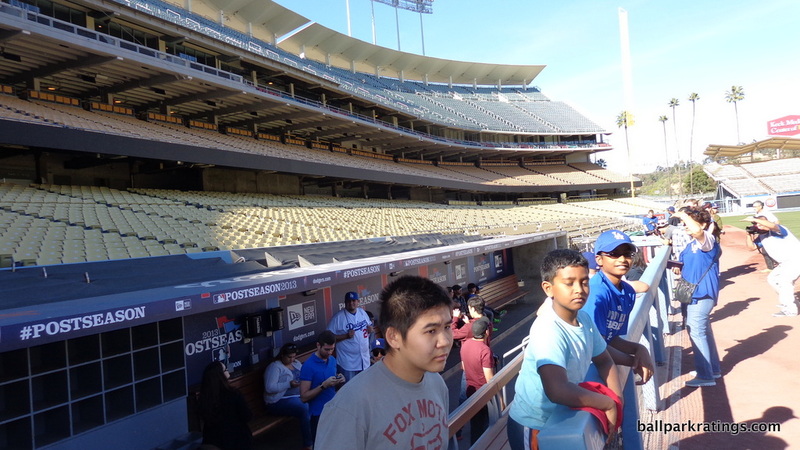 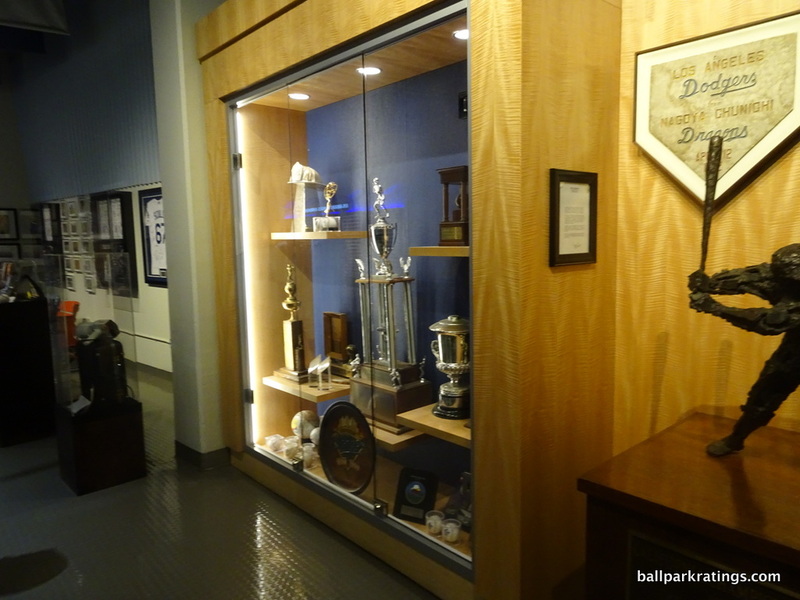 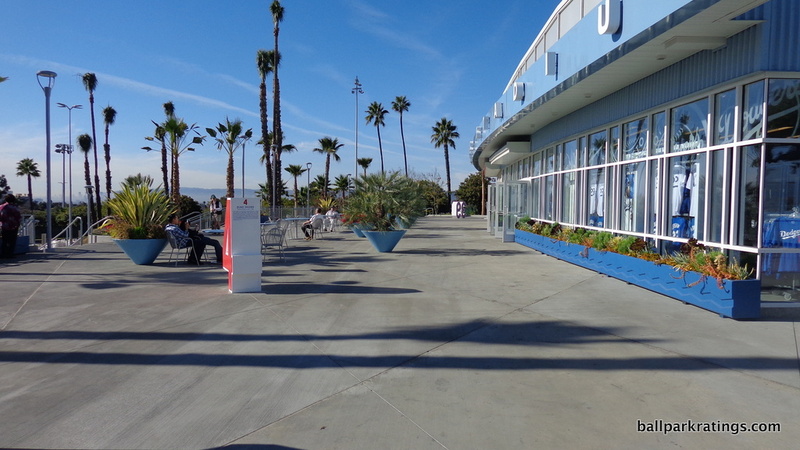 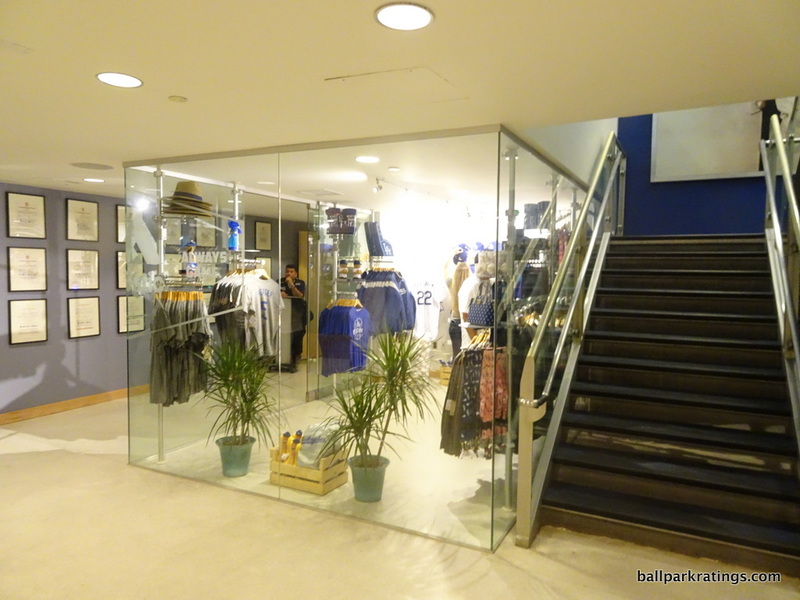 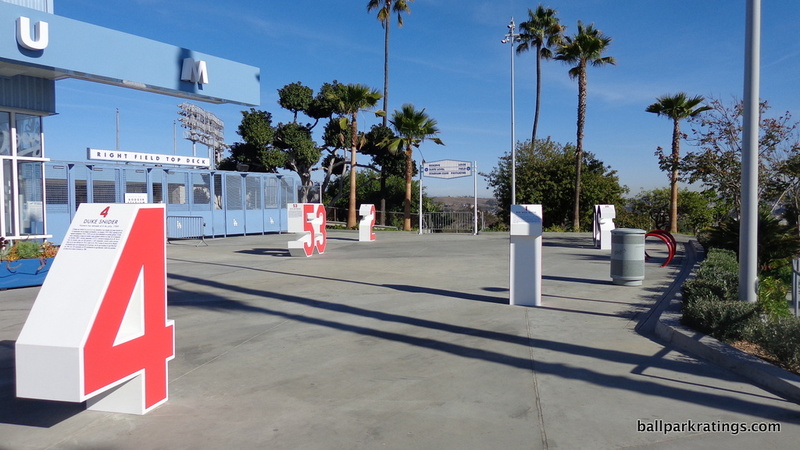 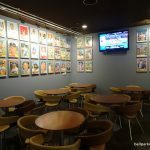 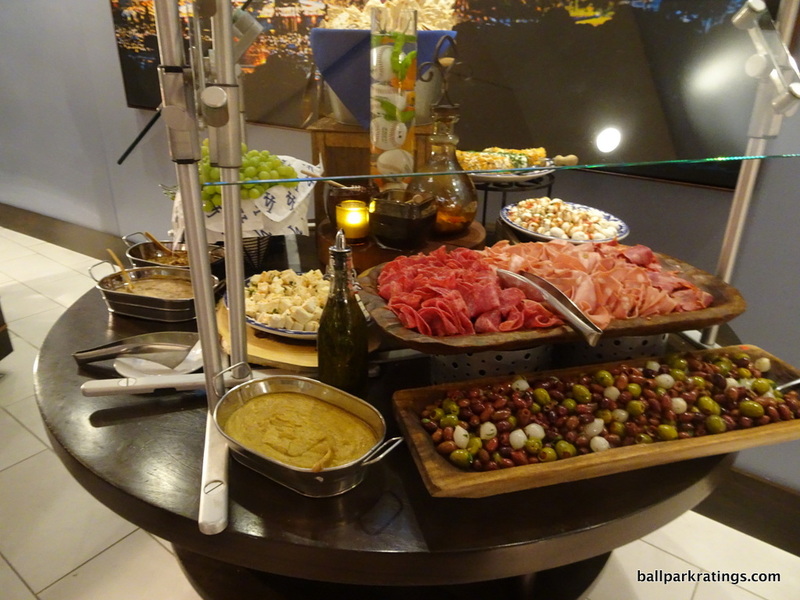 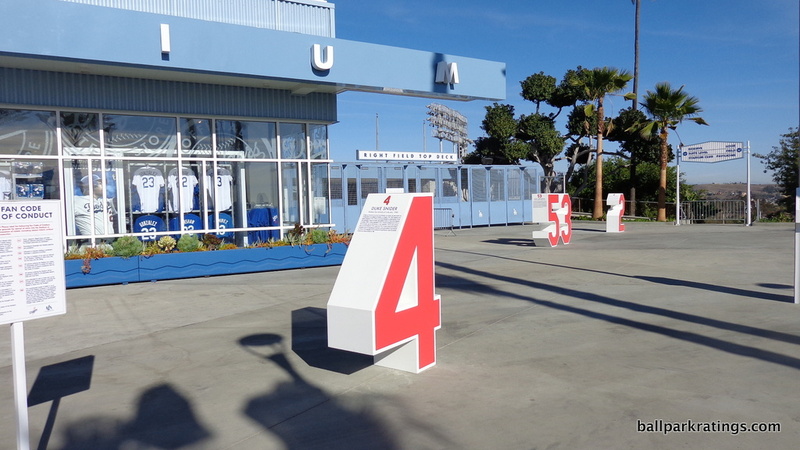 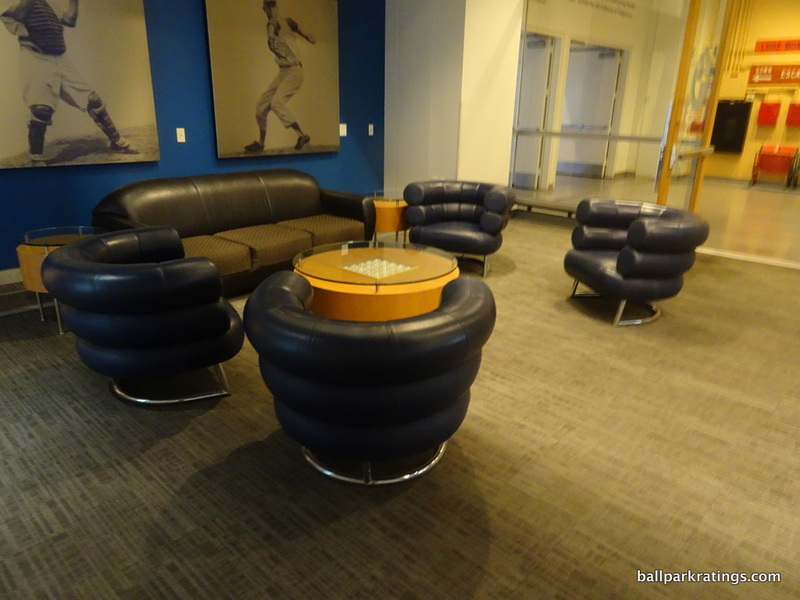 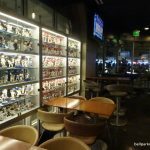 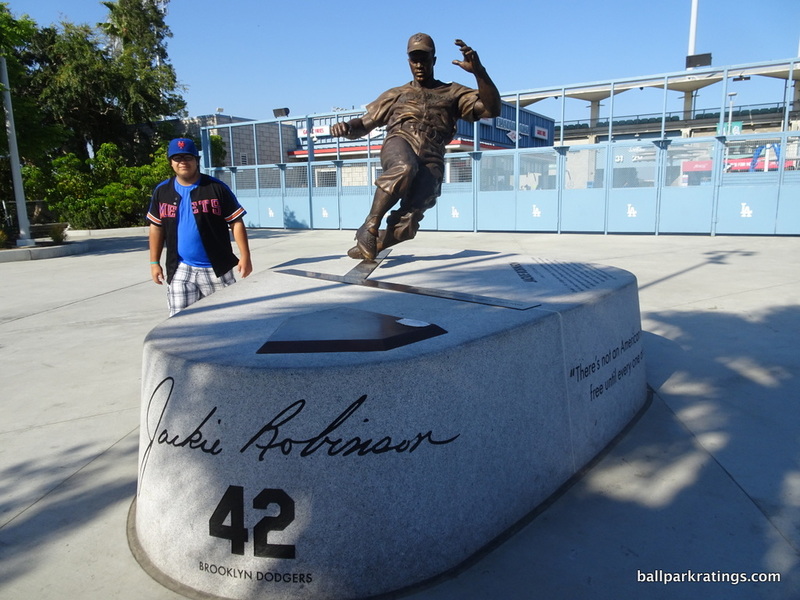 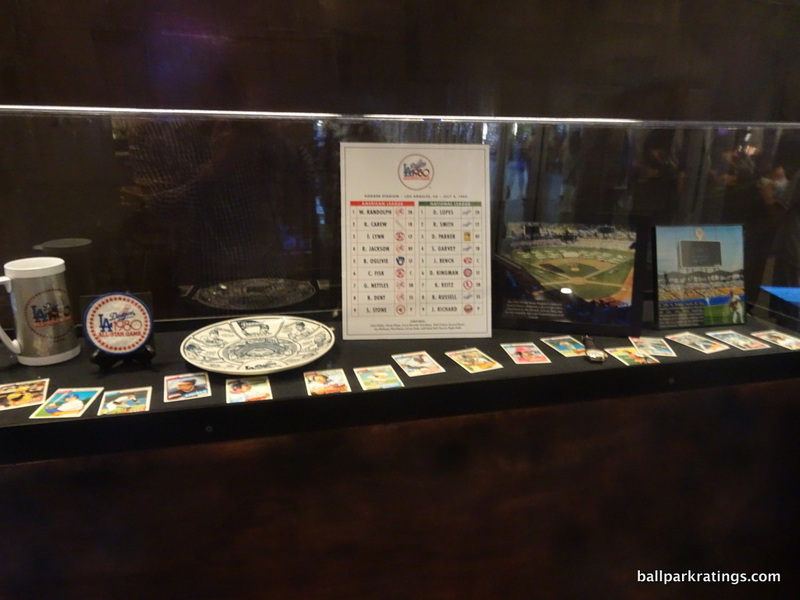 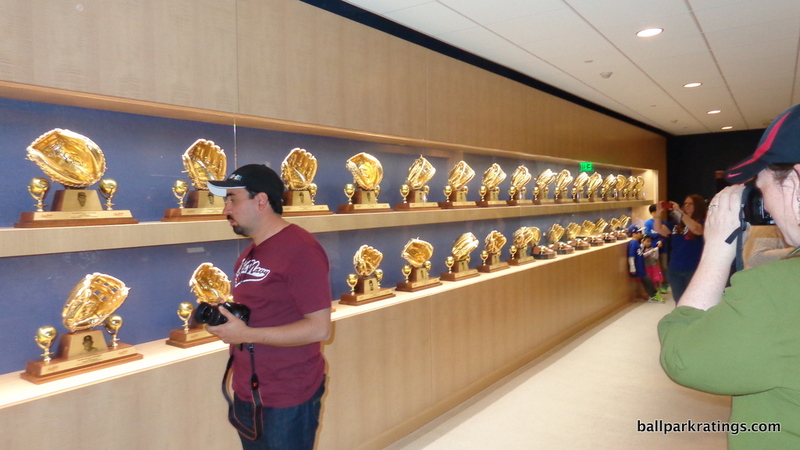 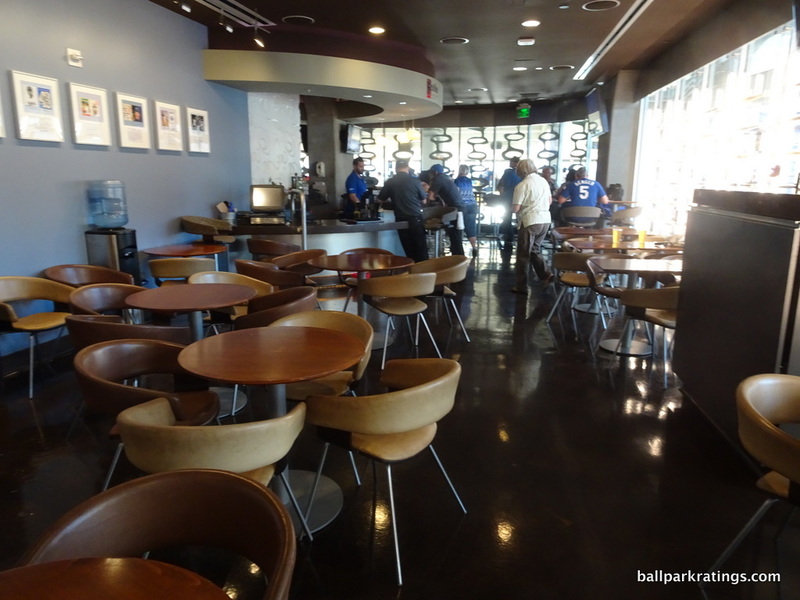 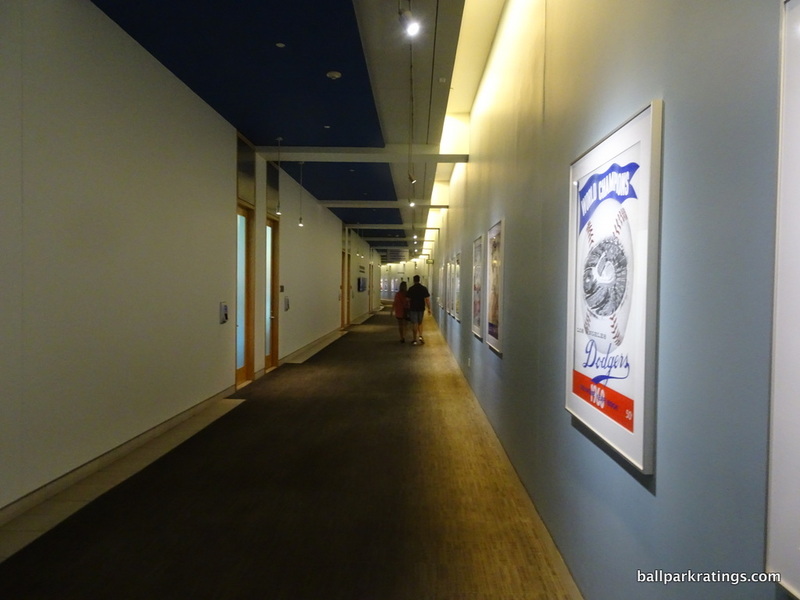 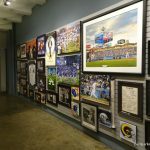 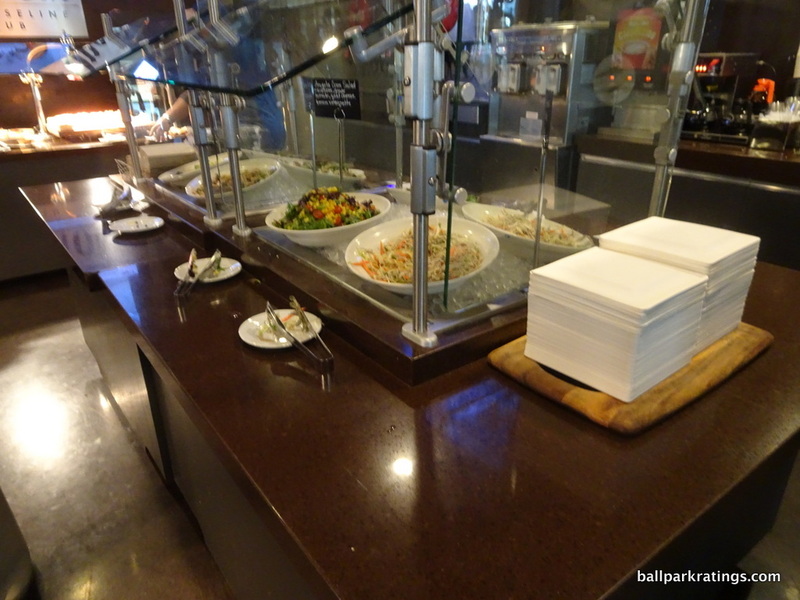 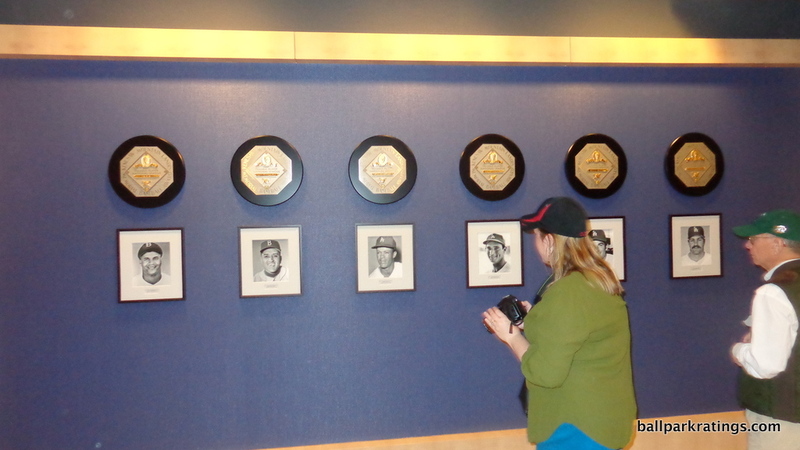 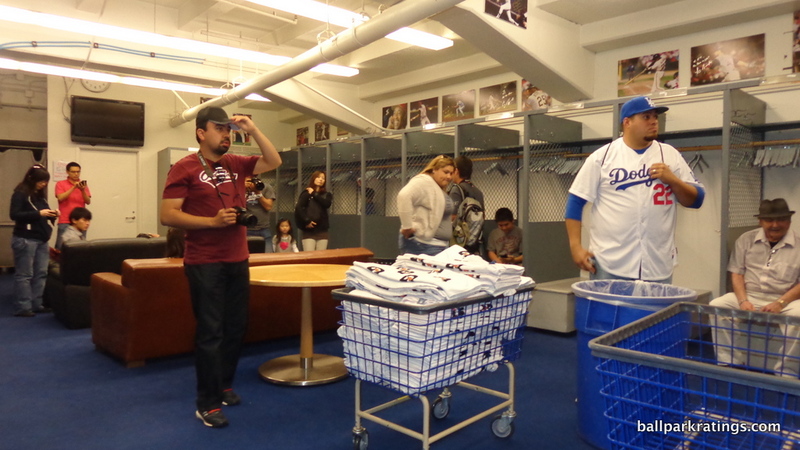 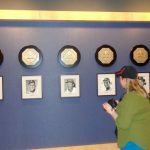 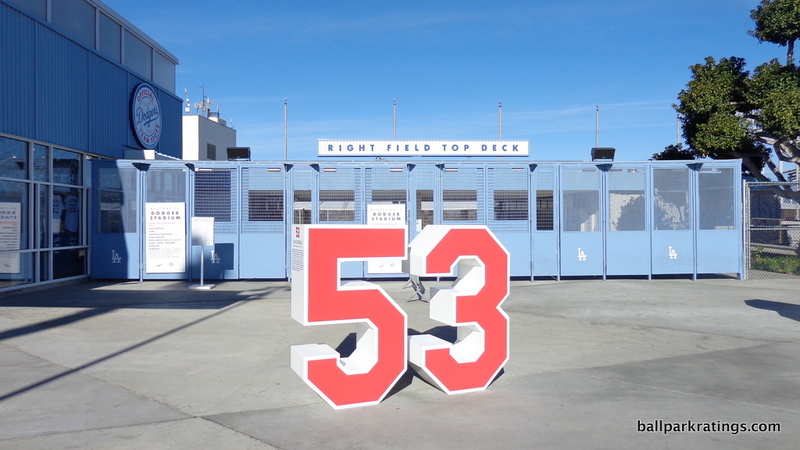 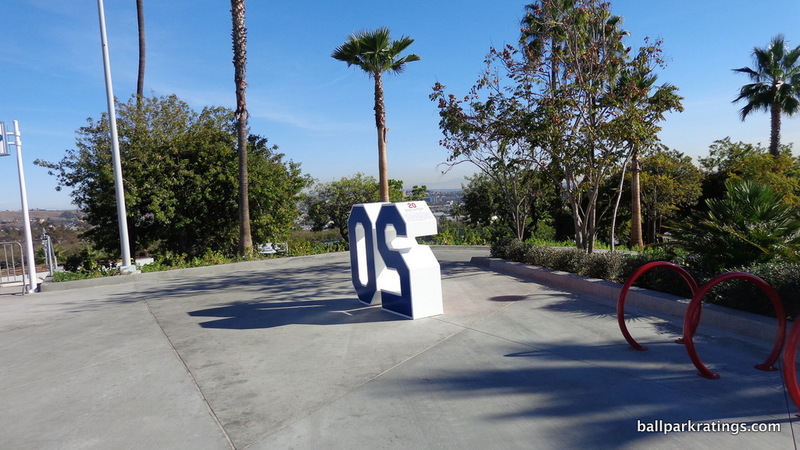 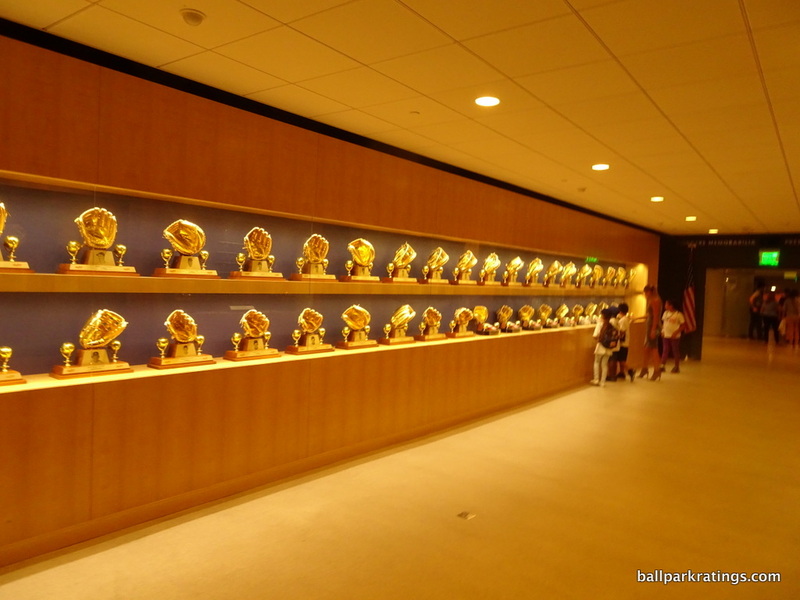 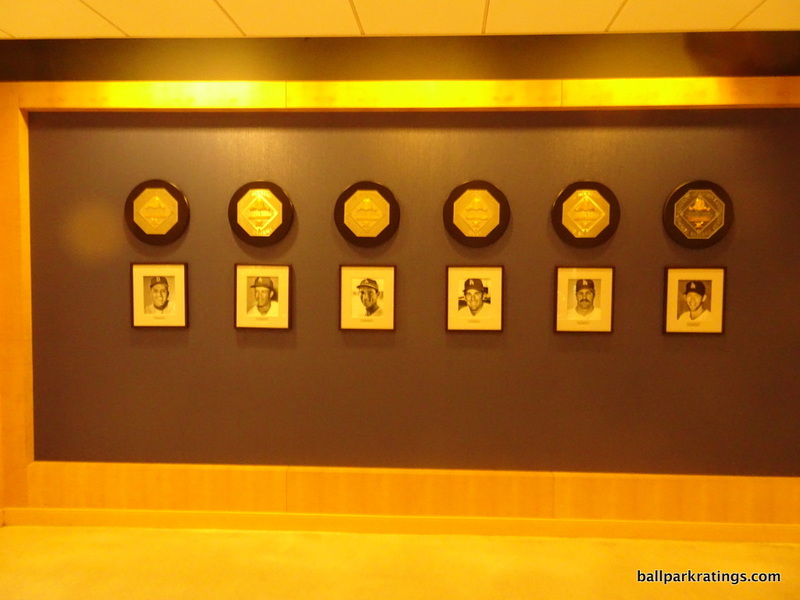 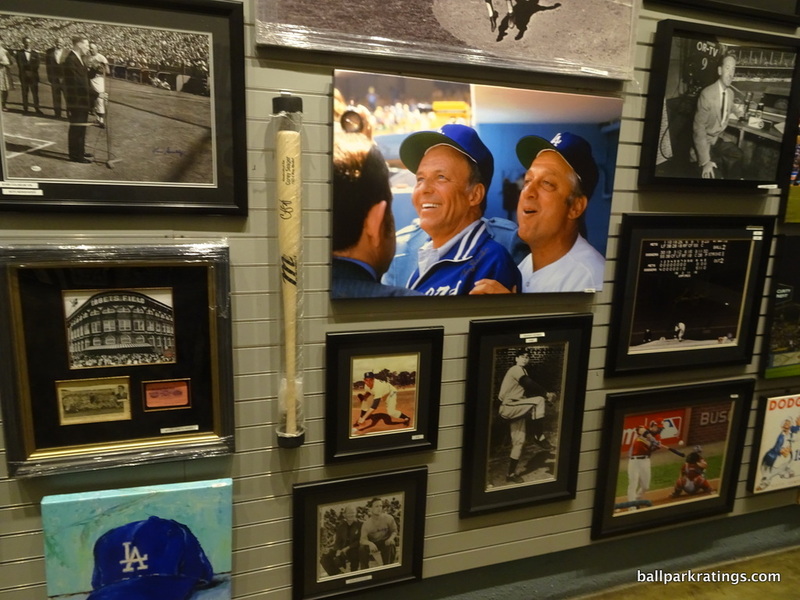 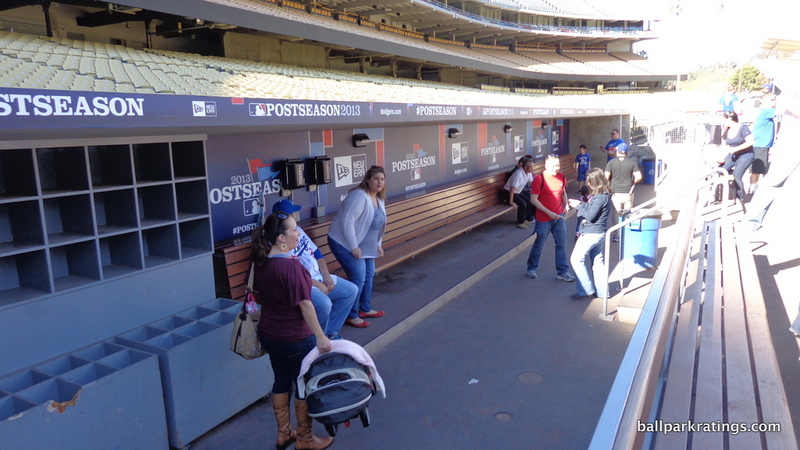 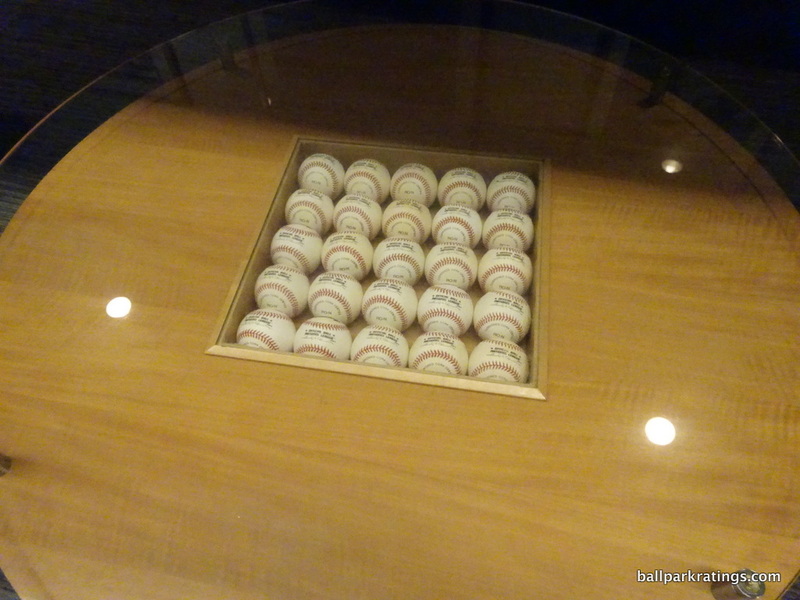 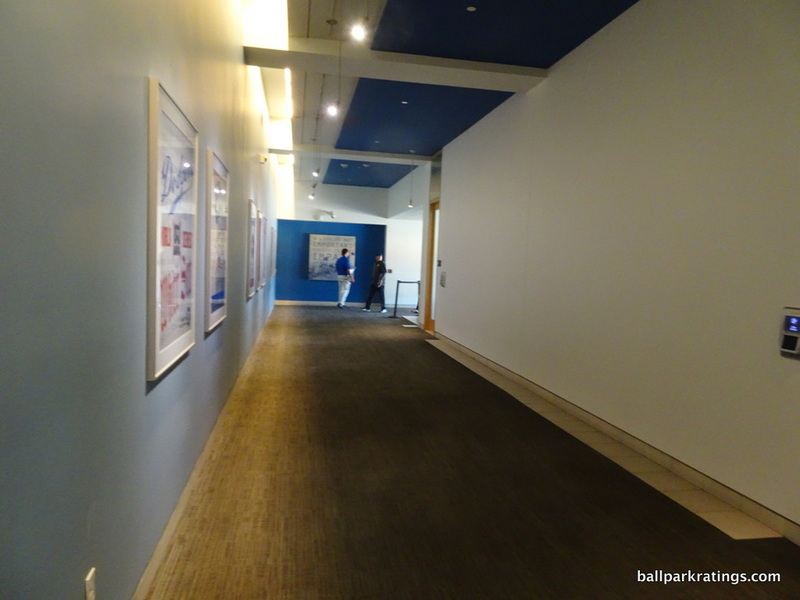 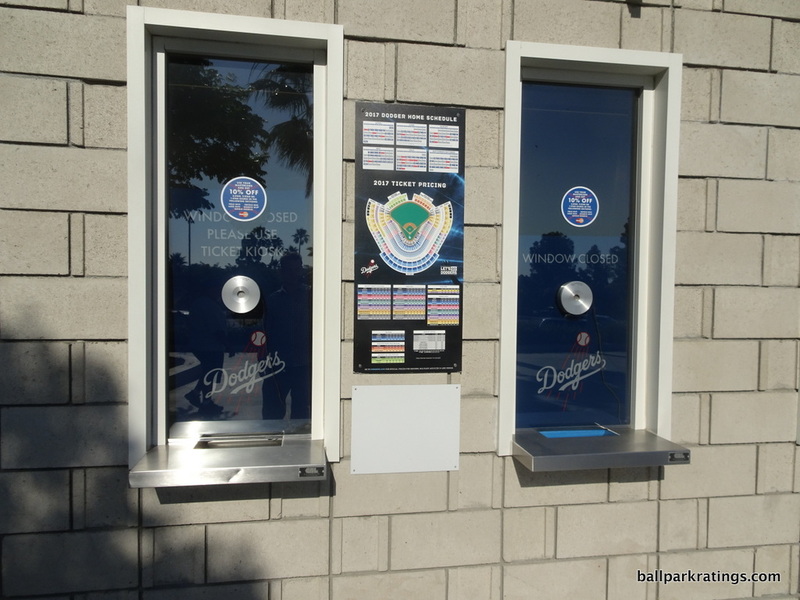 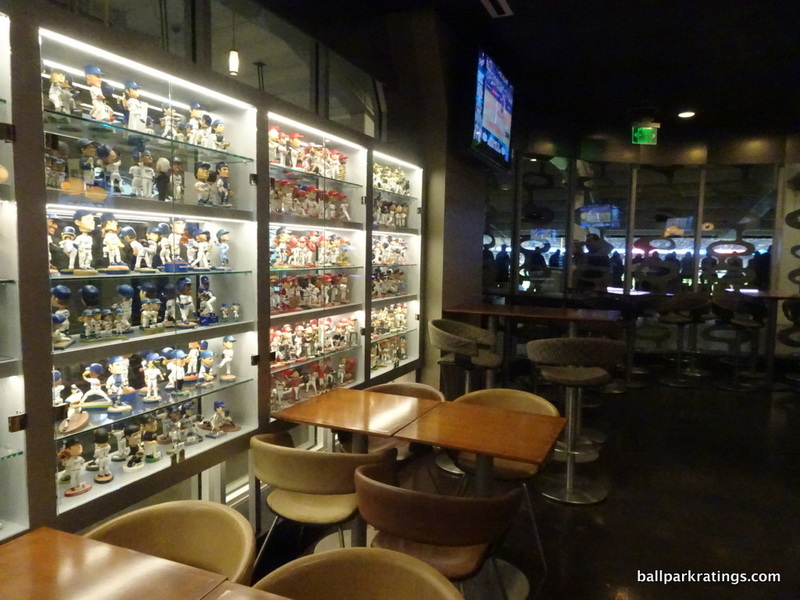 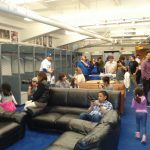 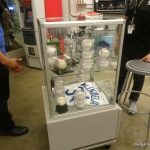 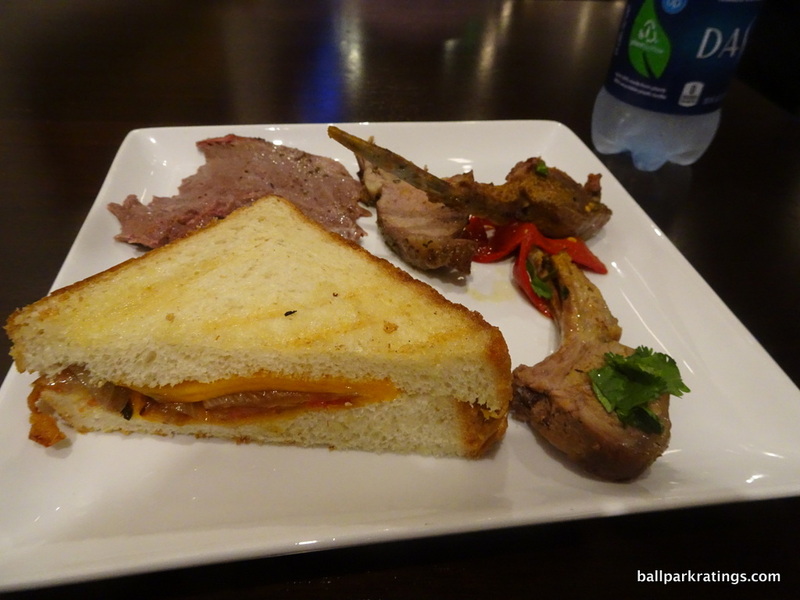 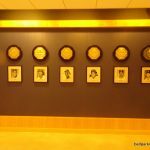 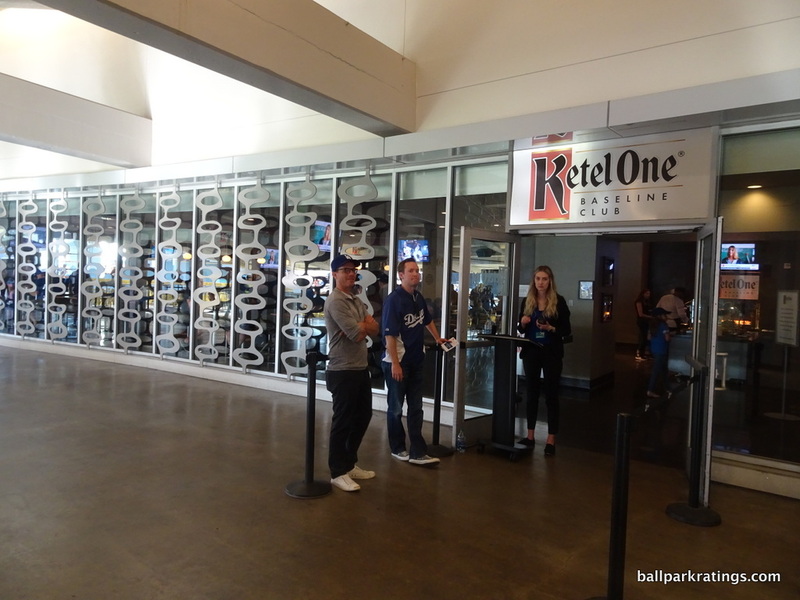 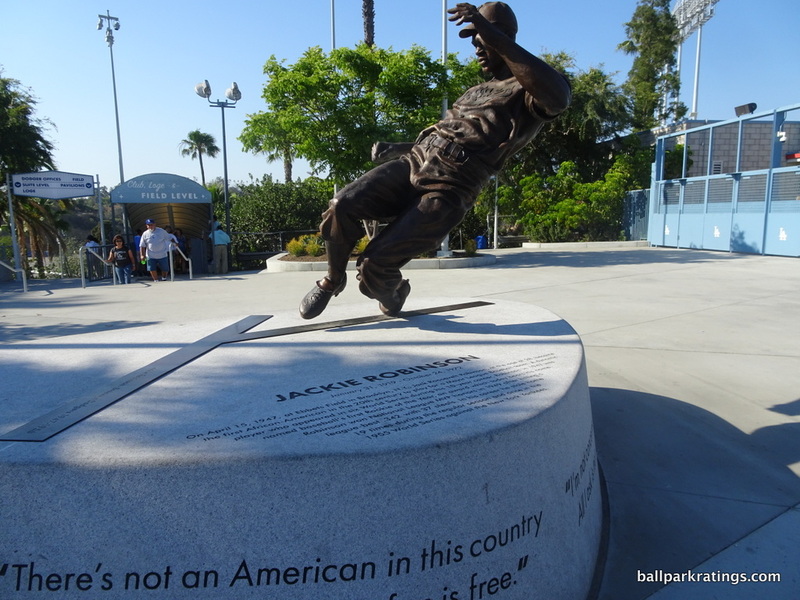 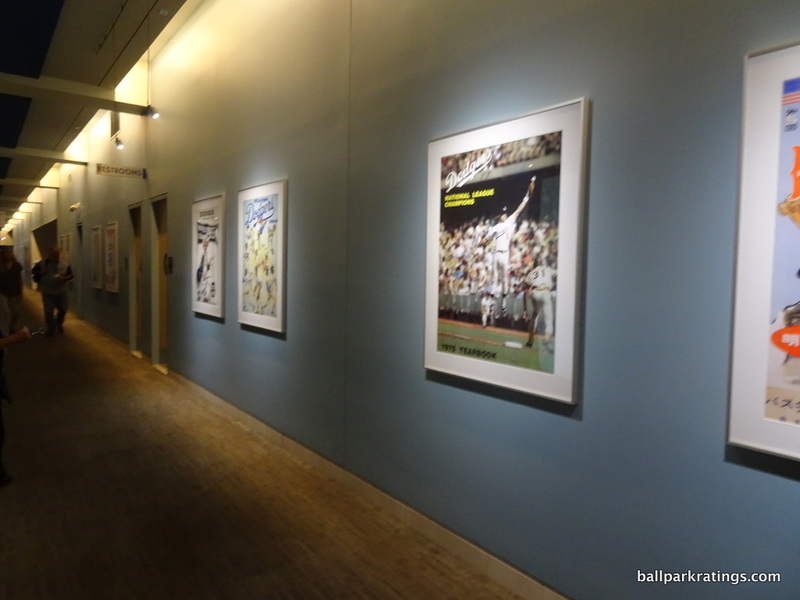 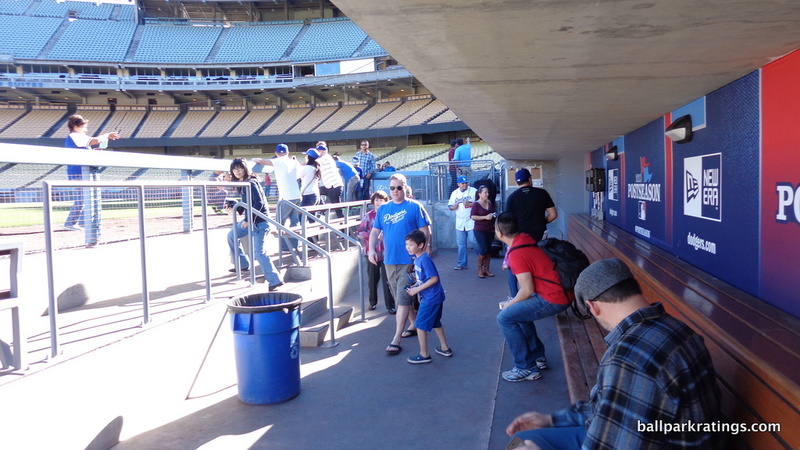 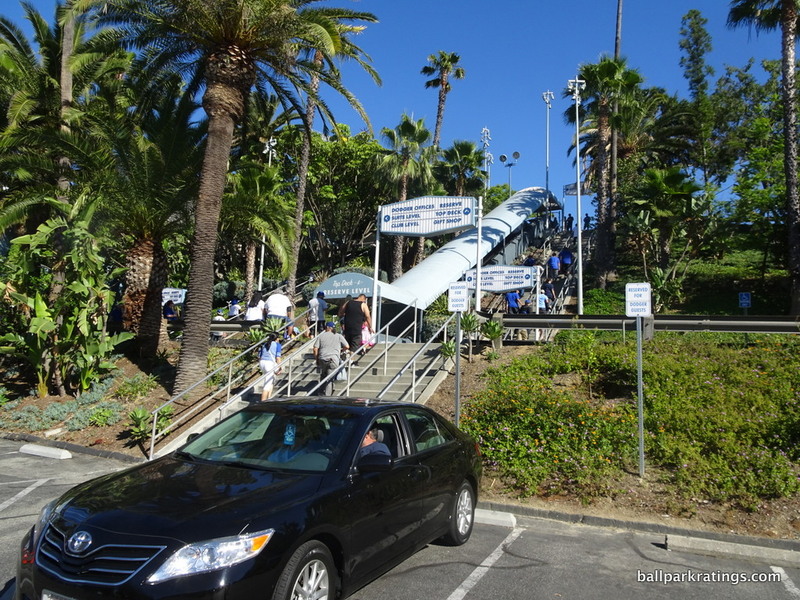 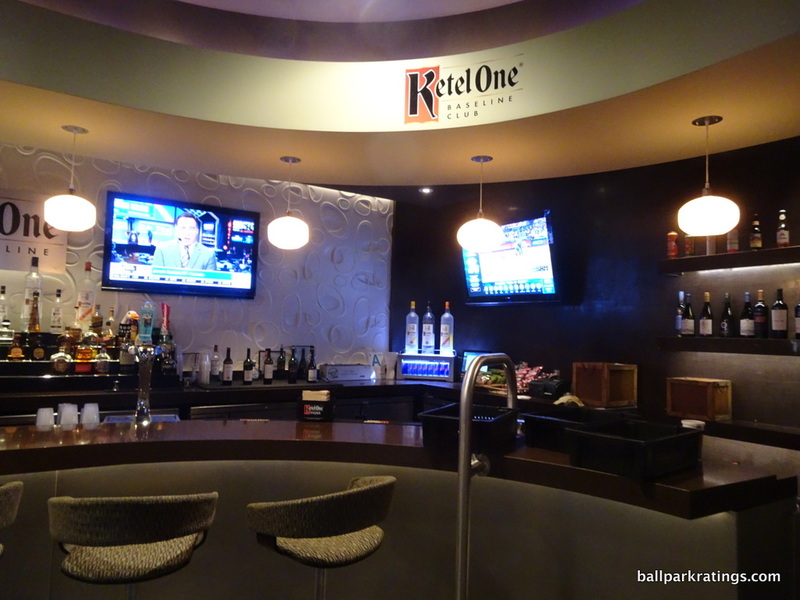 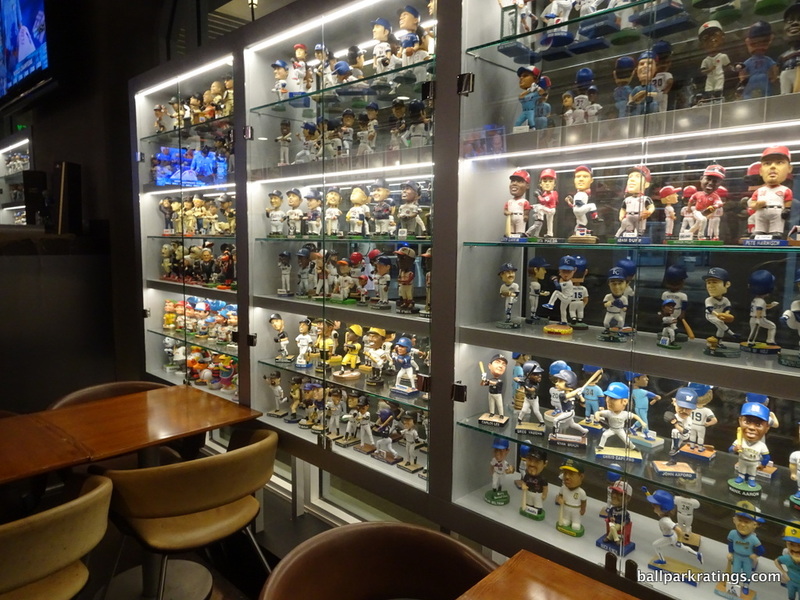 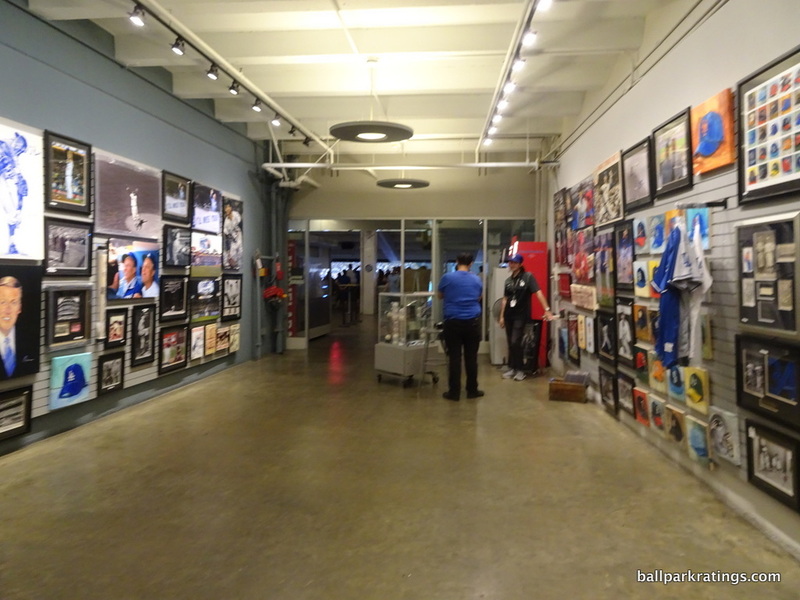 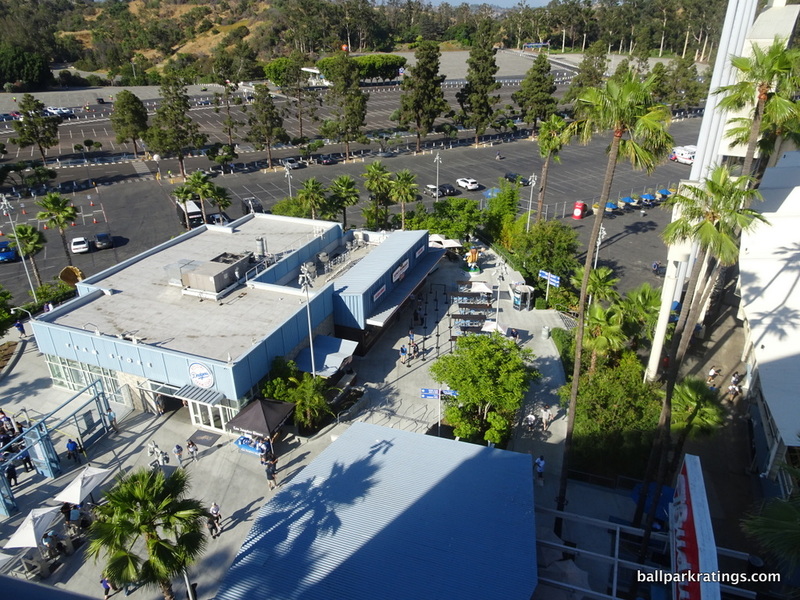 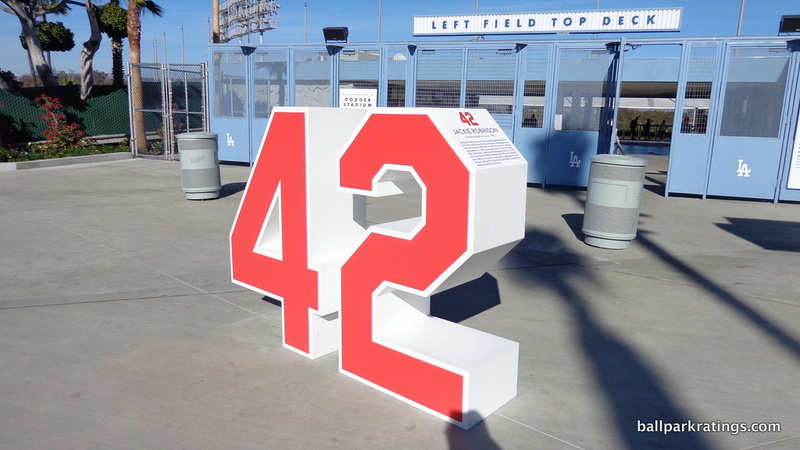 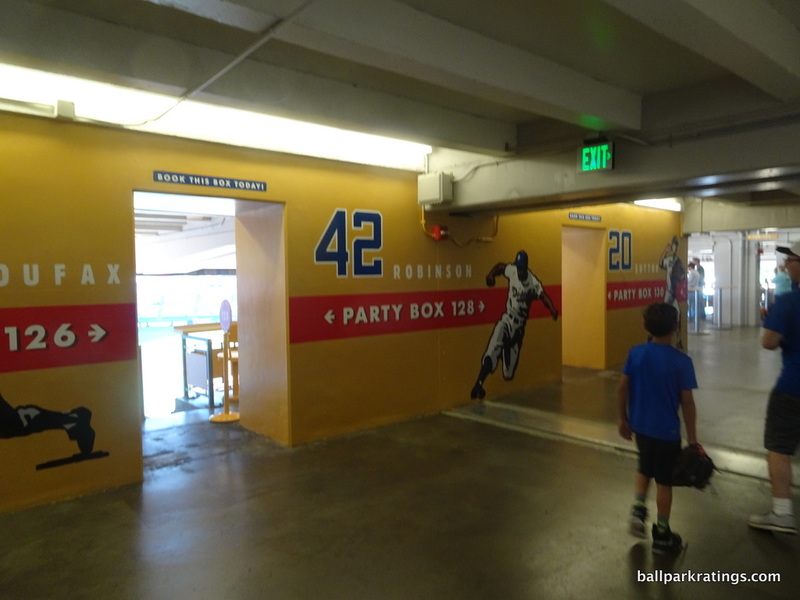 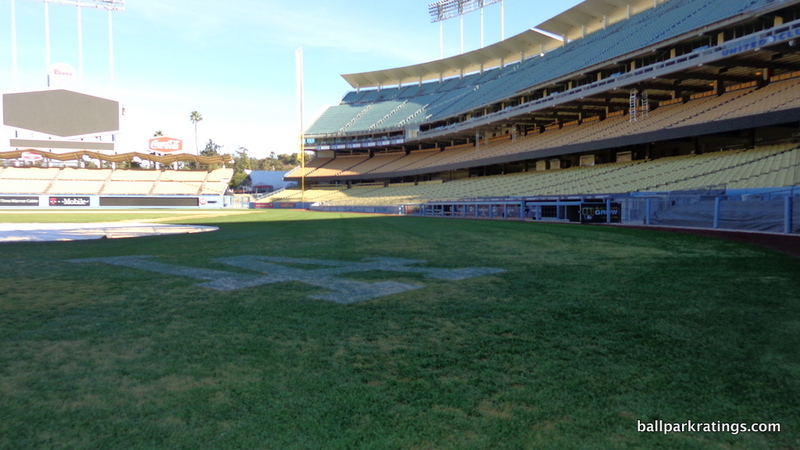 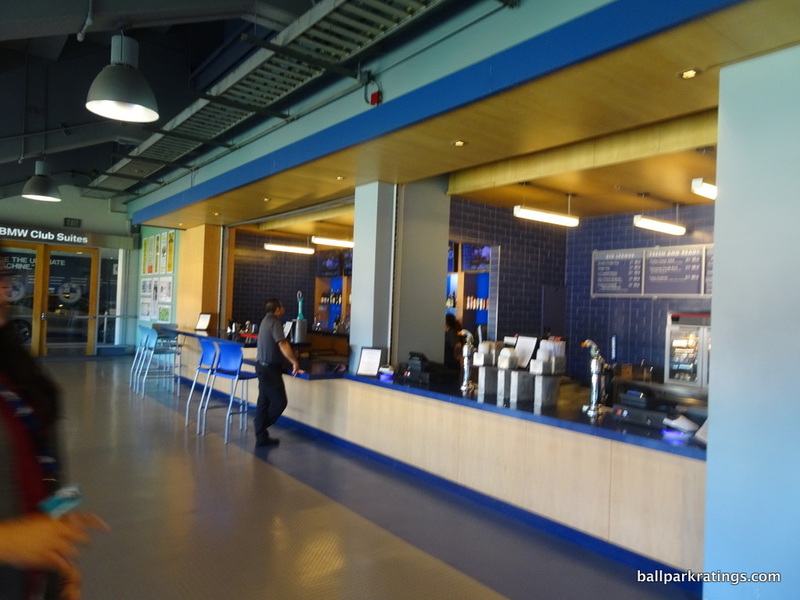 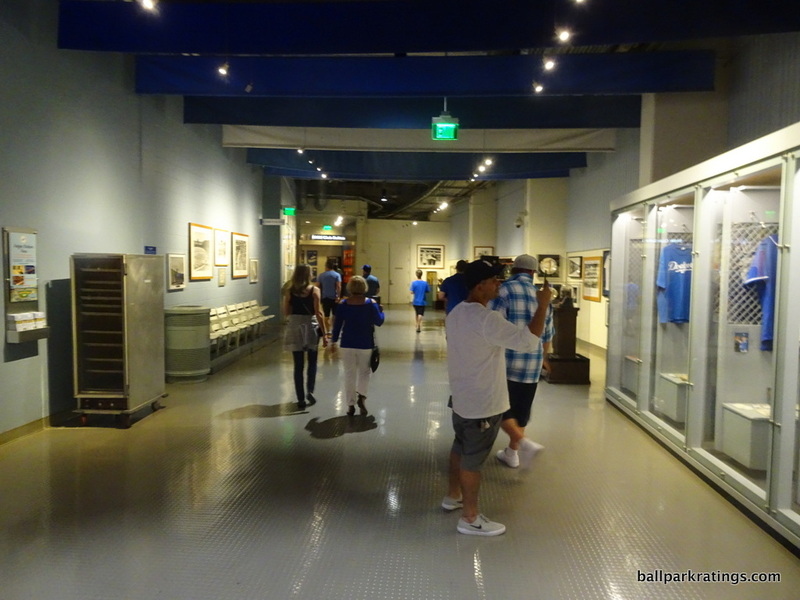 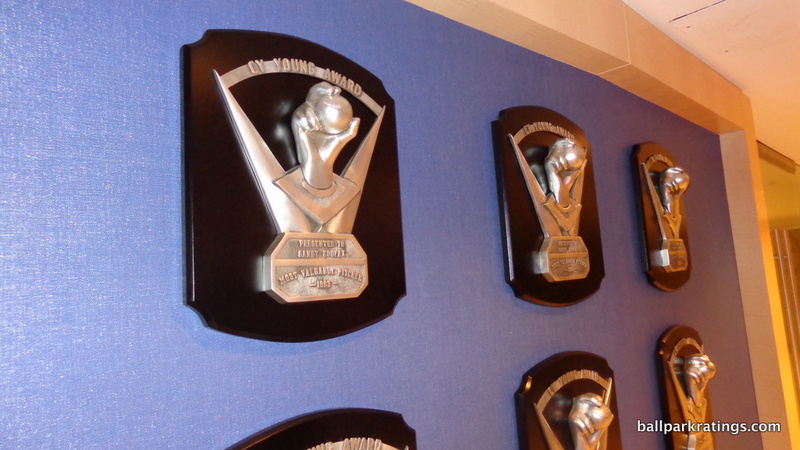 Plenty of tasteful Dodger historical references as well, along with a new kids’ area. 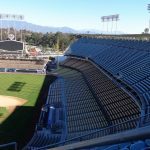 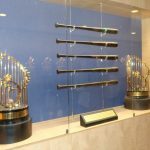 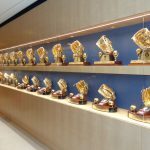 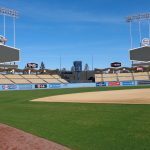 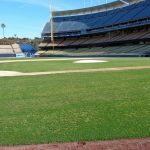 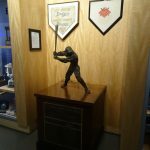 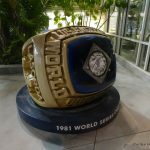 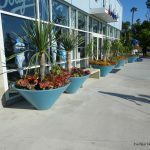 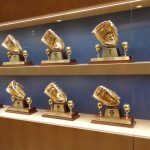 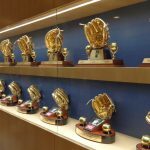 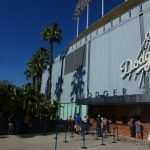 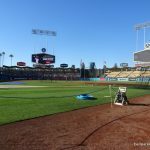 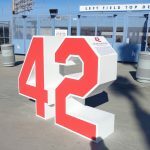 Dodger Stadium has received upgrades in recent years, but like Fenway and Wrigley, nothing has been done to nullify its timeless aesthetic appeal. 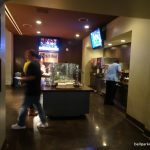 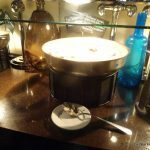 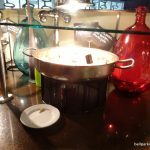 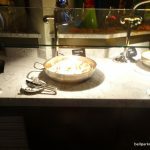 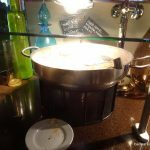 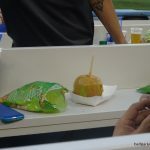 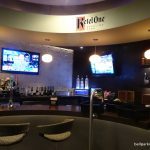 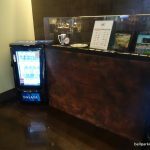 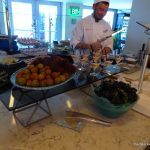 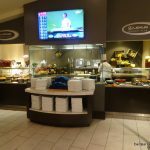 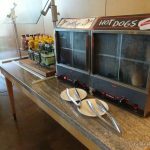 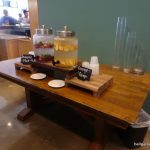 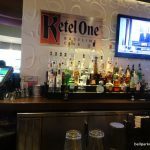 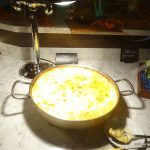 While there will be temptations really beef up its amenities in the future (i.e. 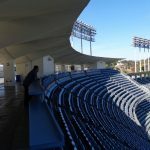 like Kauffman Stadium), let’s hope it stays that way.